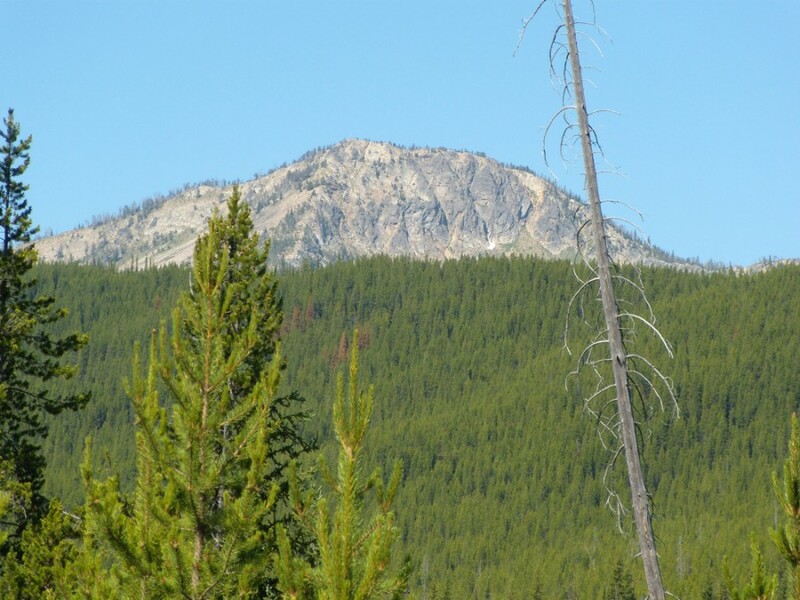 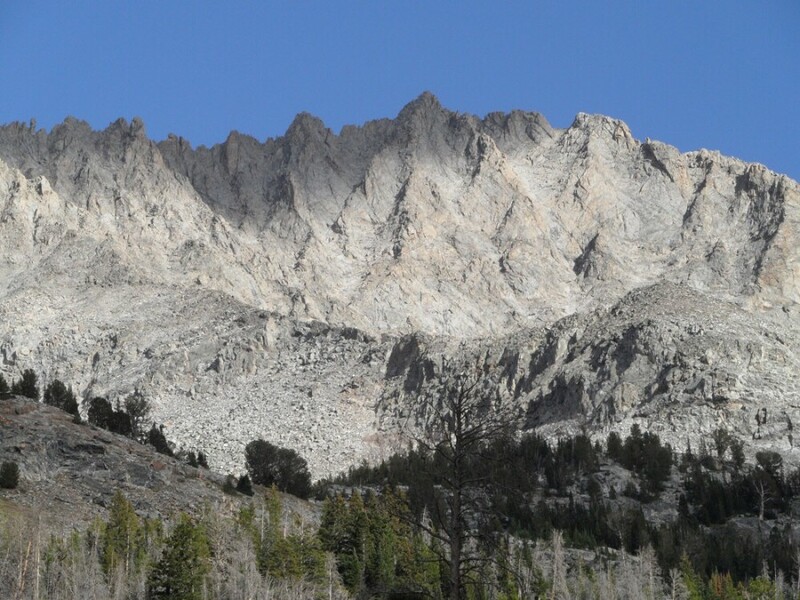 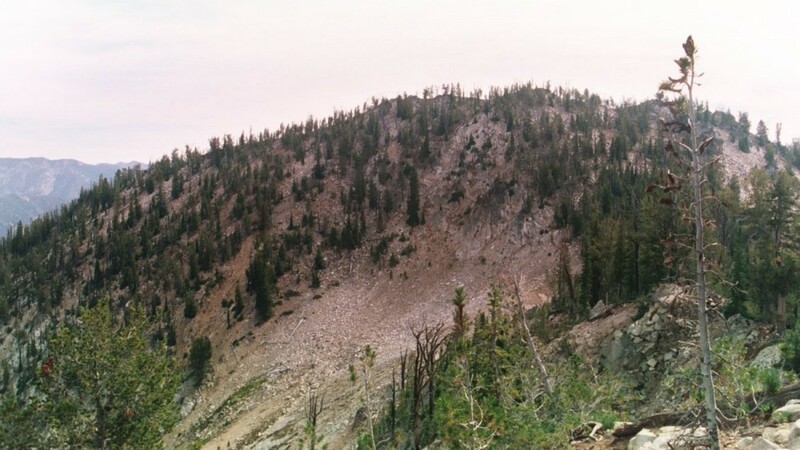 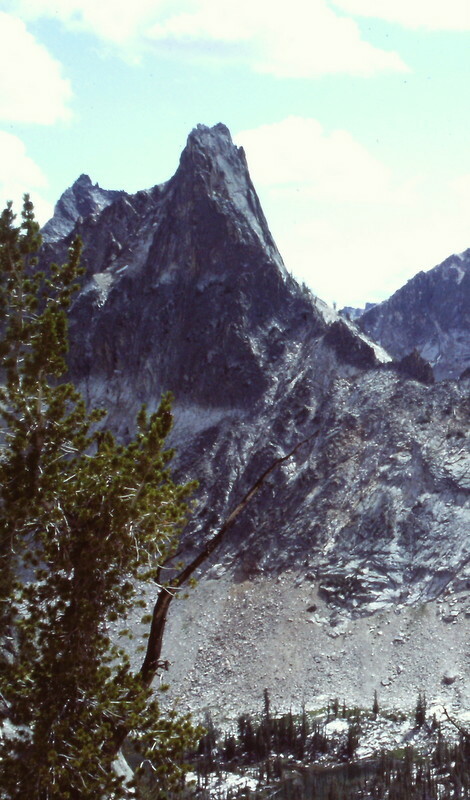 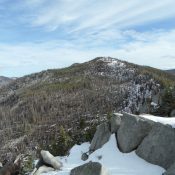 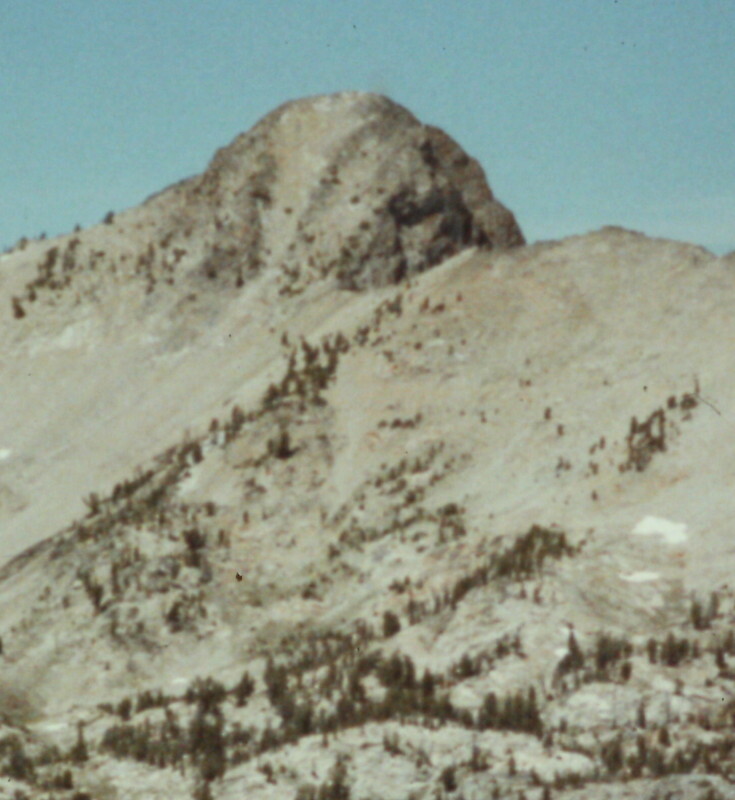 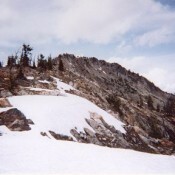 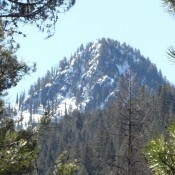 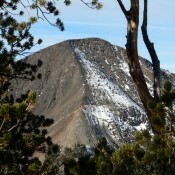 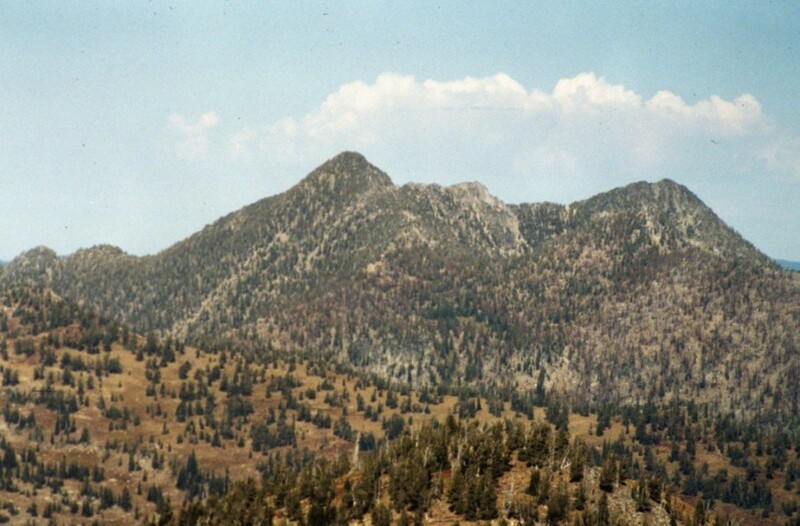 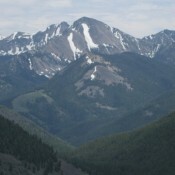 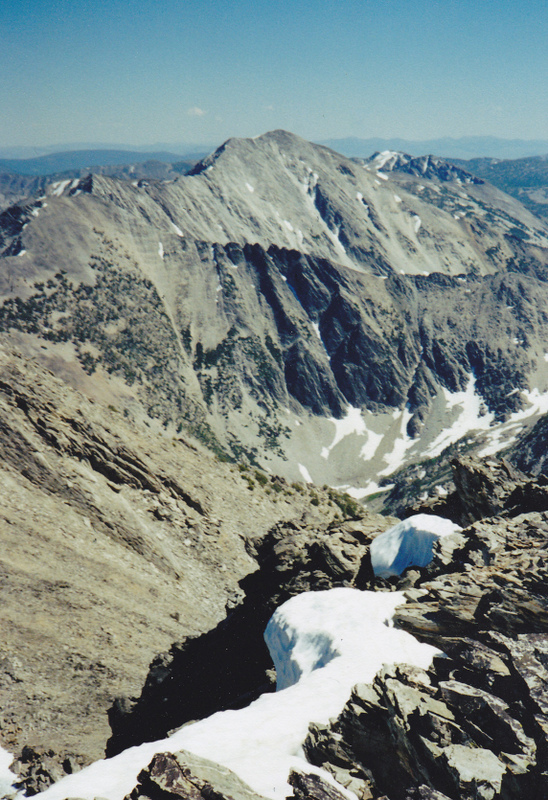 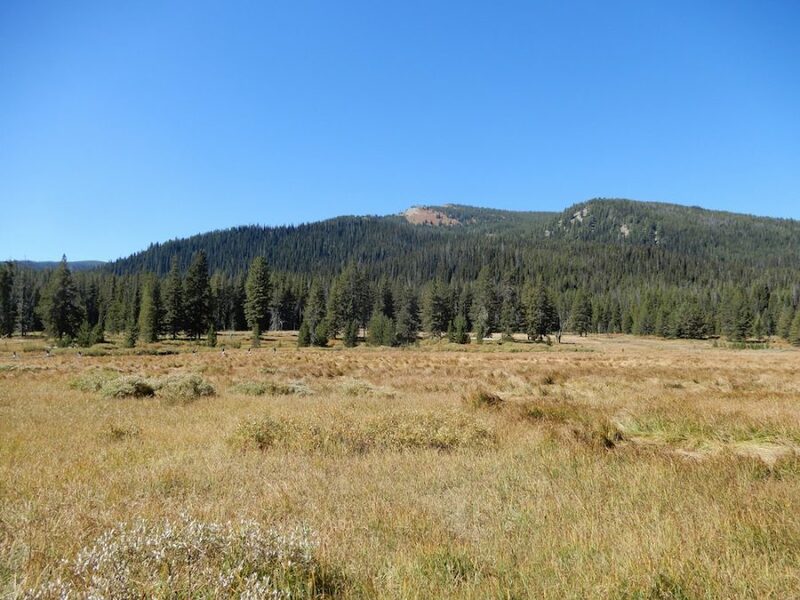 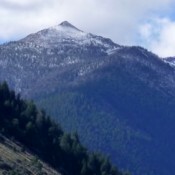 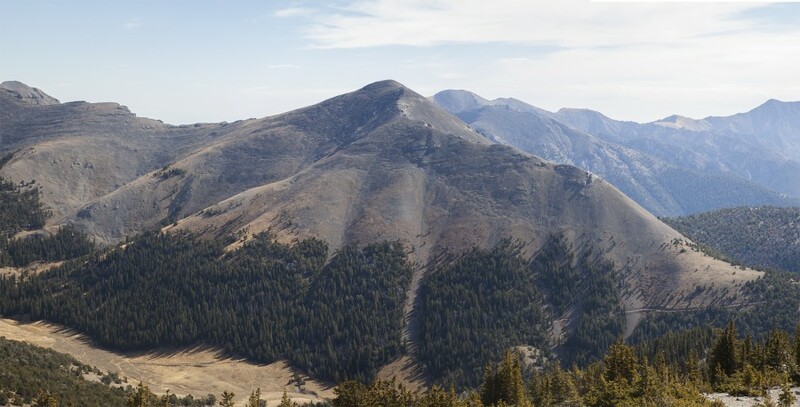 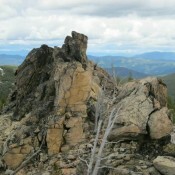 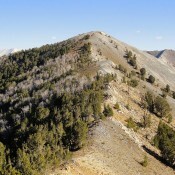 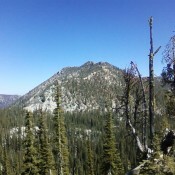 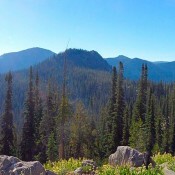 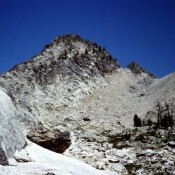 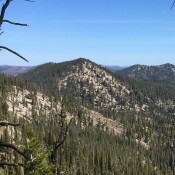 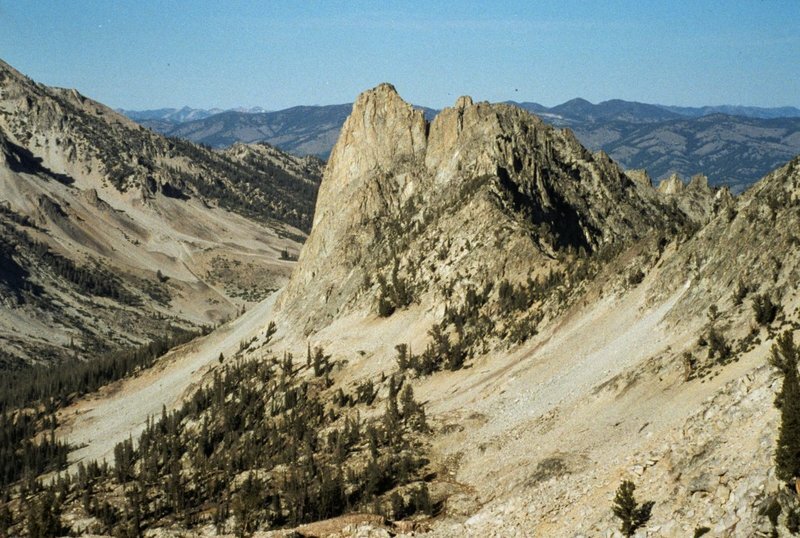 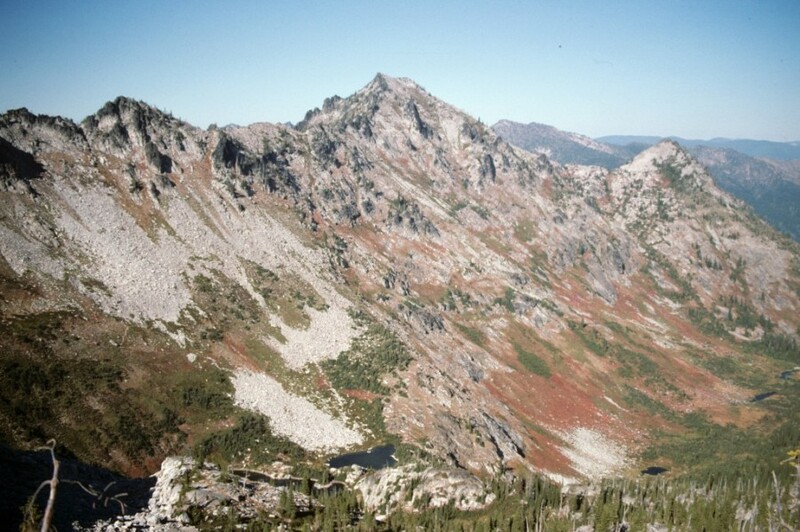 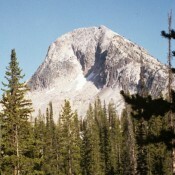 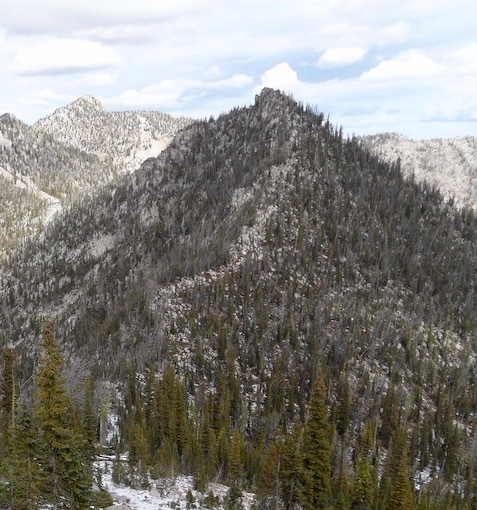 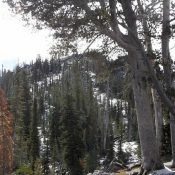 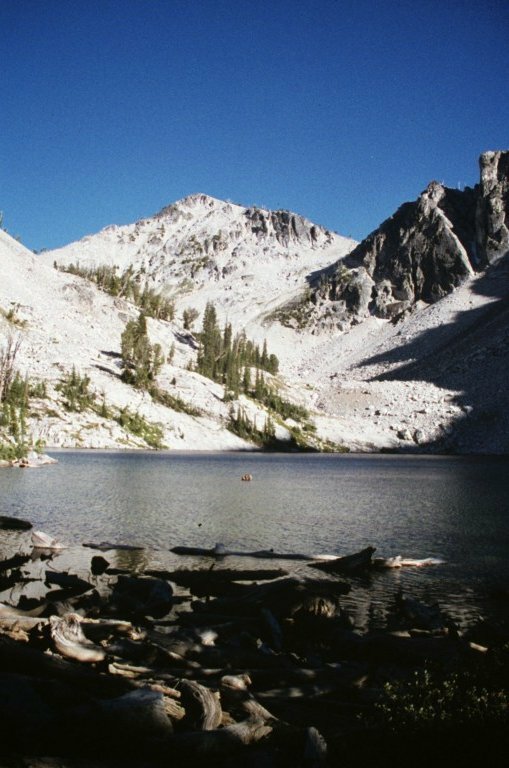 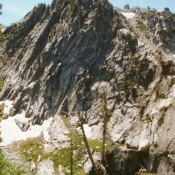 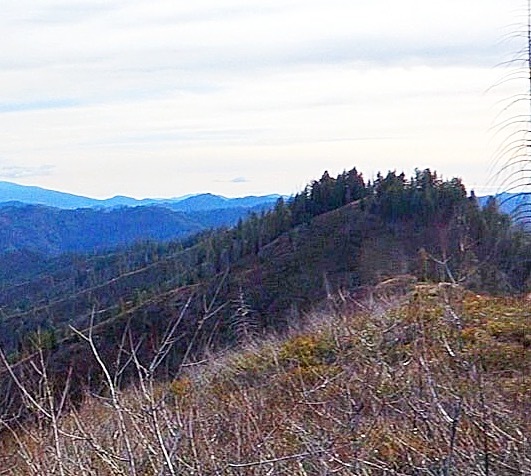 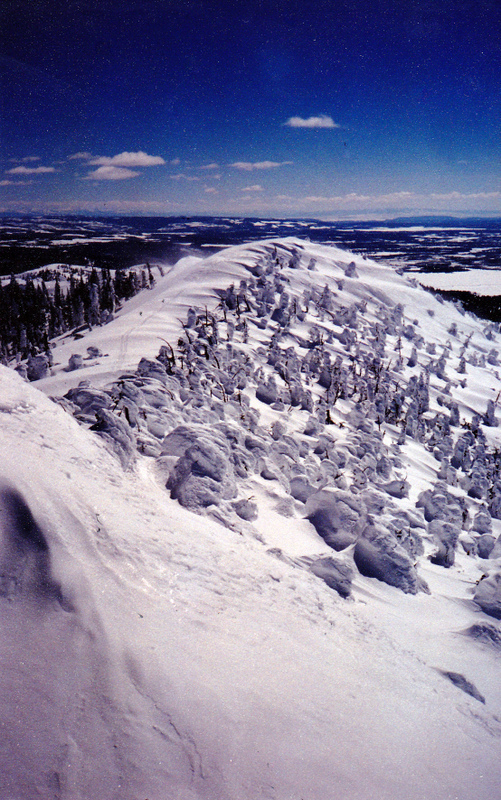 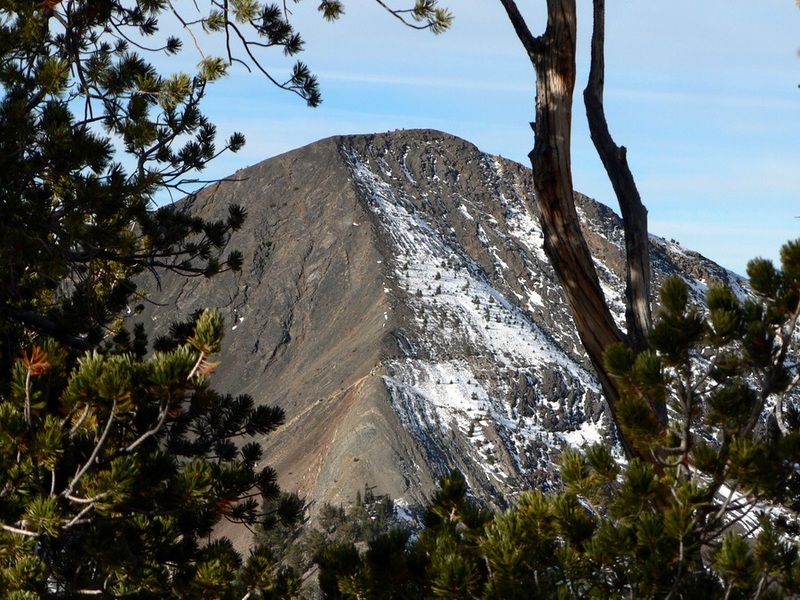 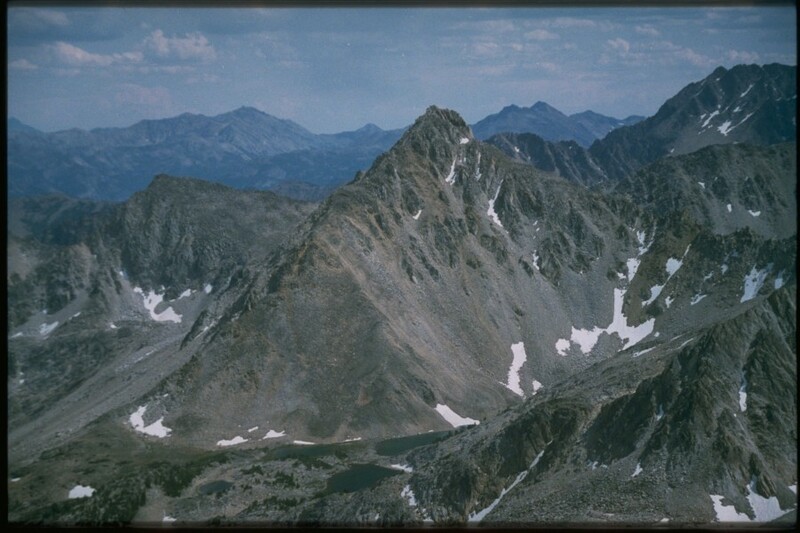 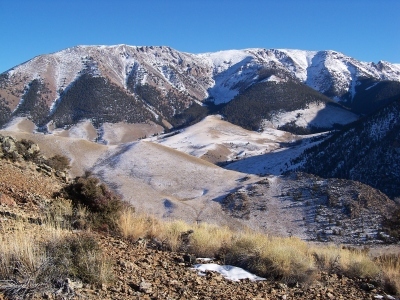 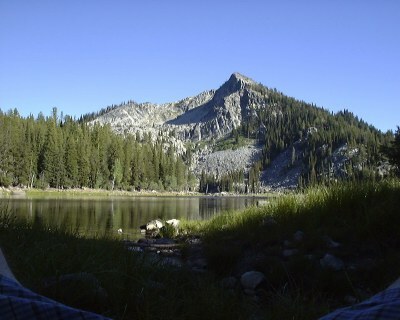 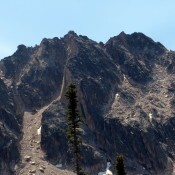 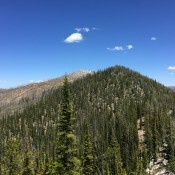 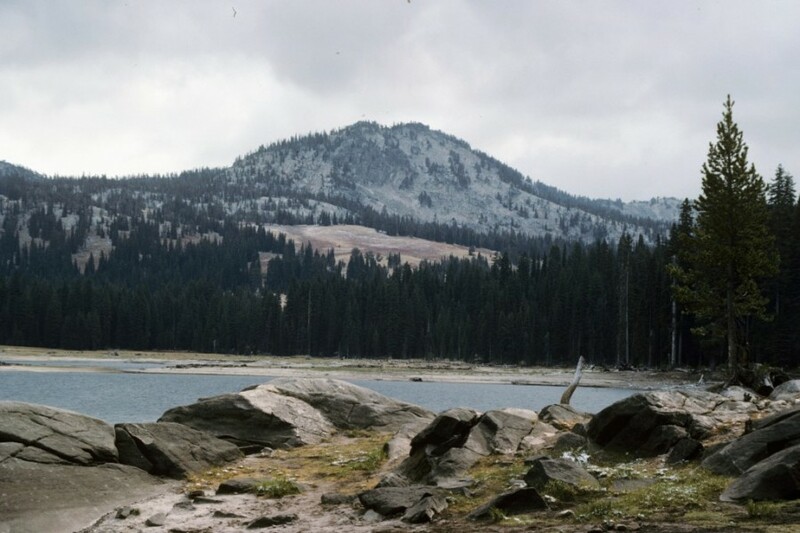 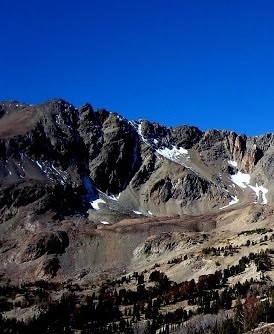 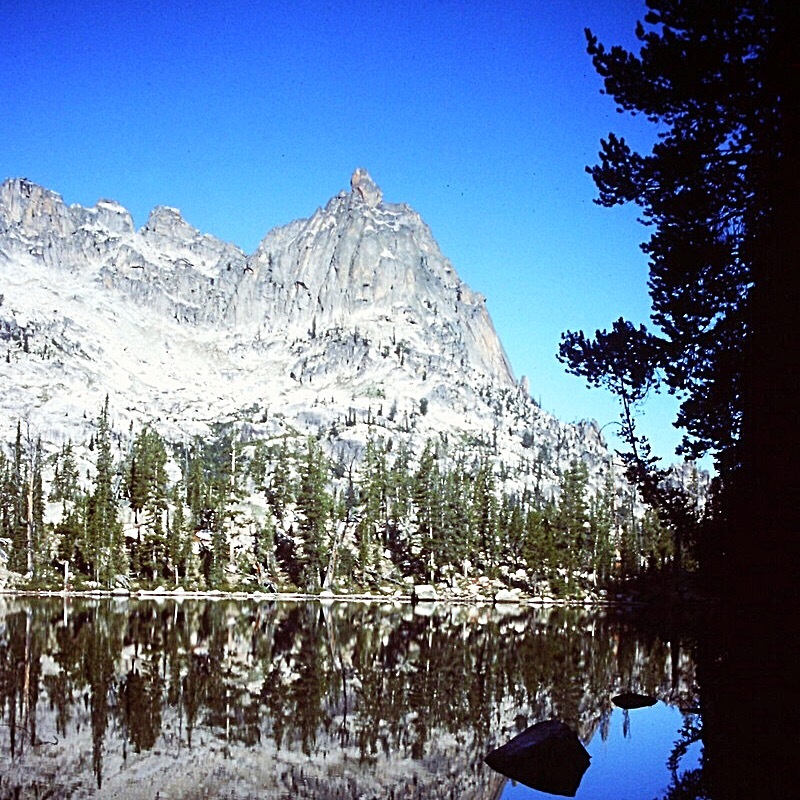 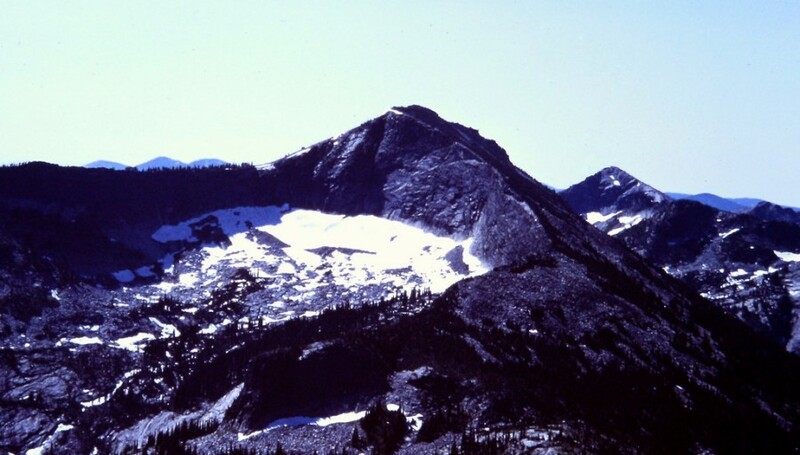 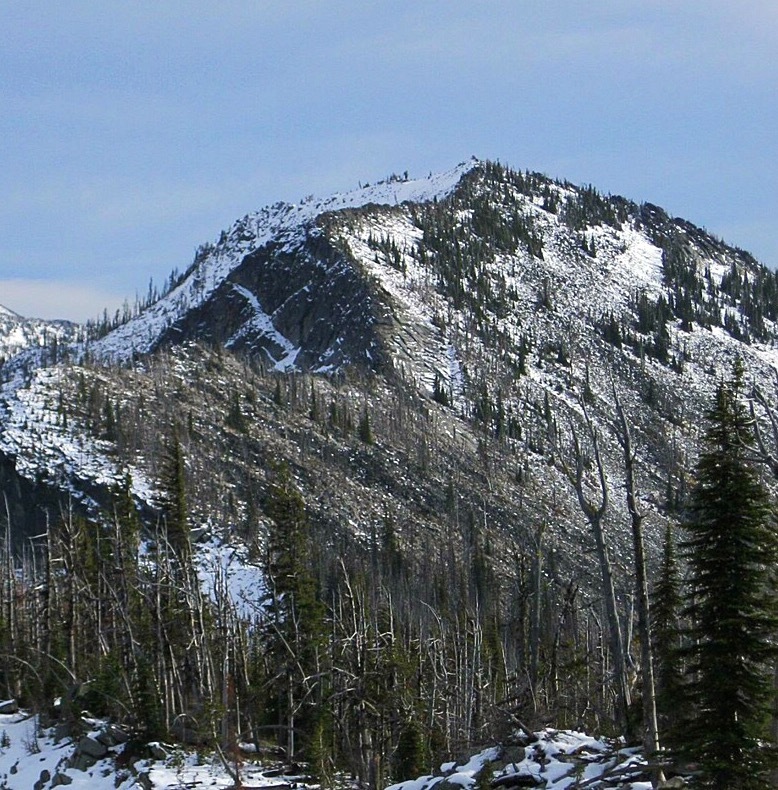 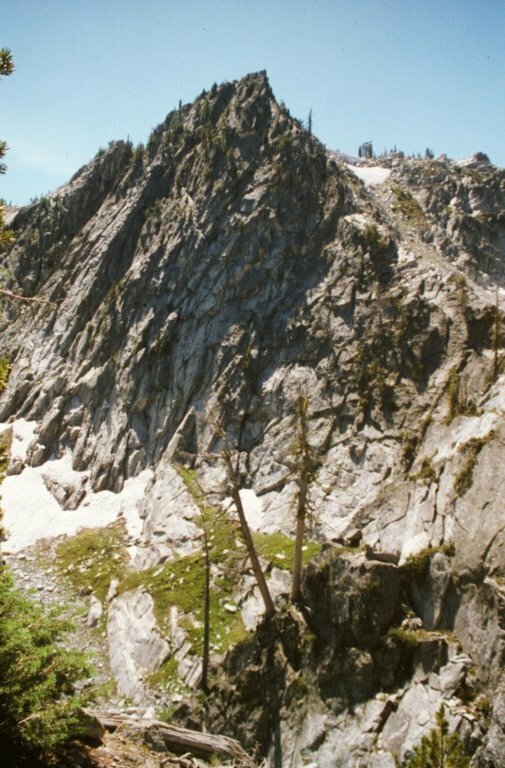 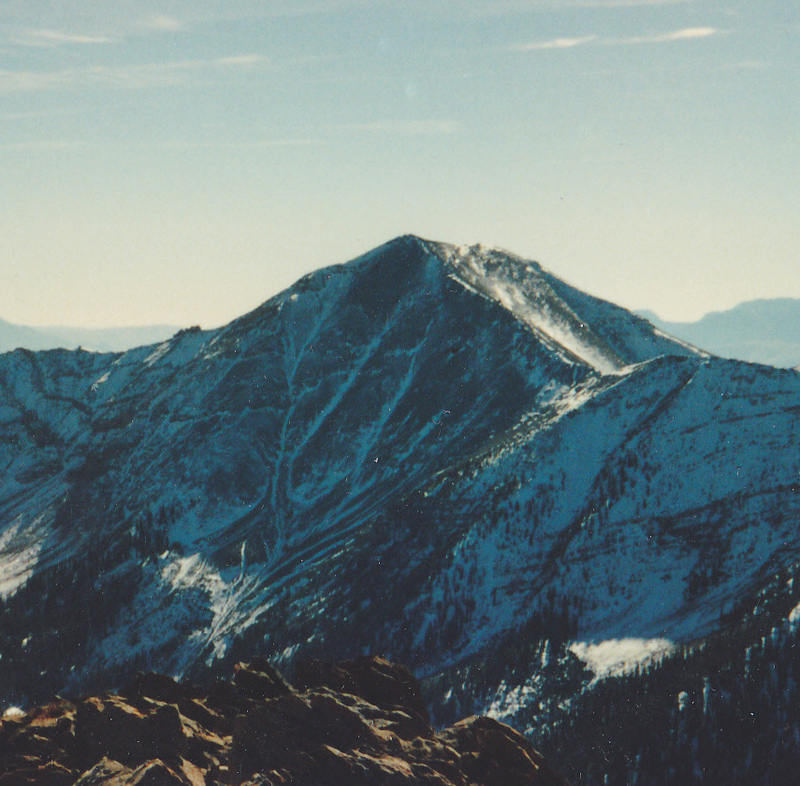 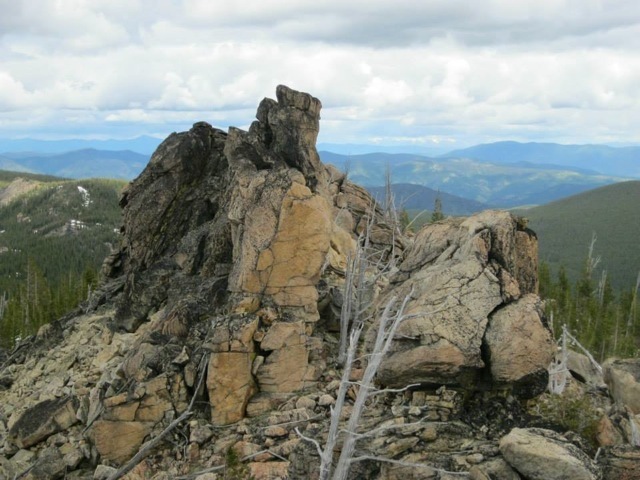 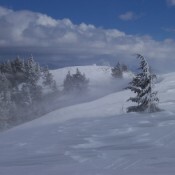 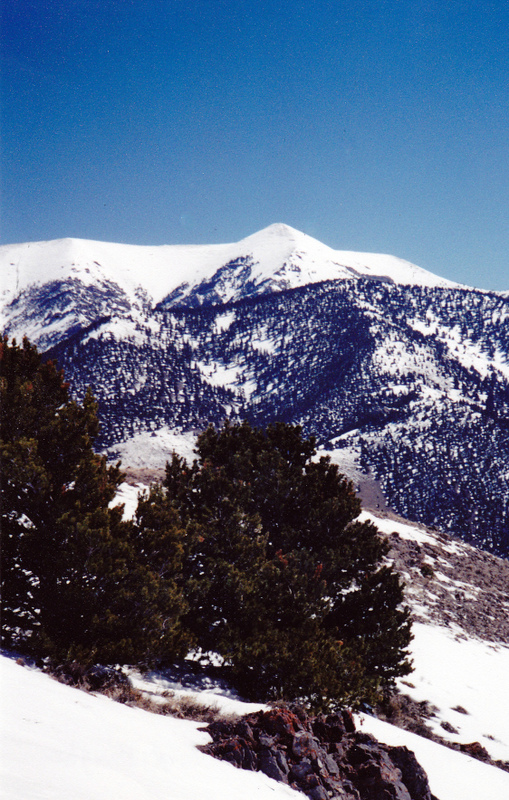 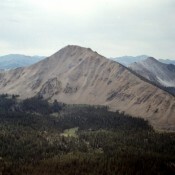 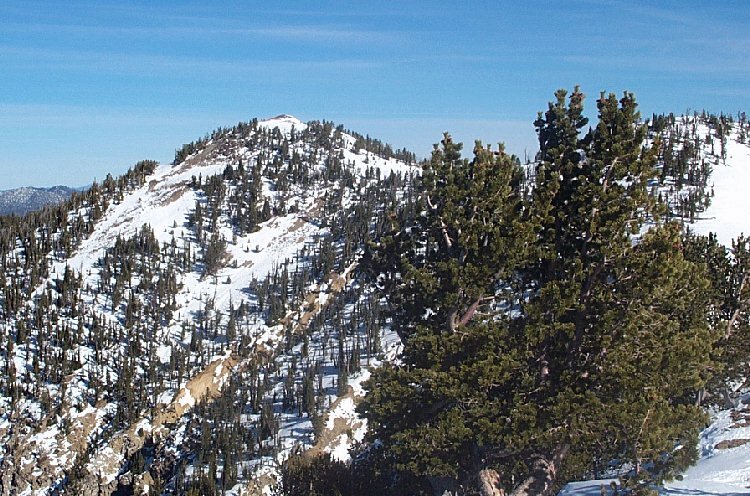 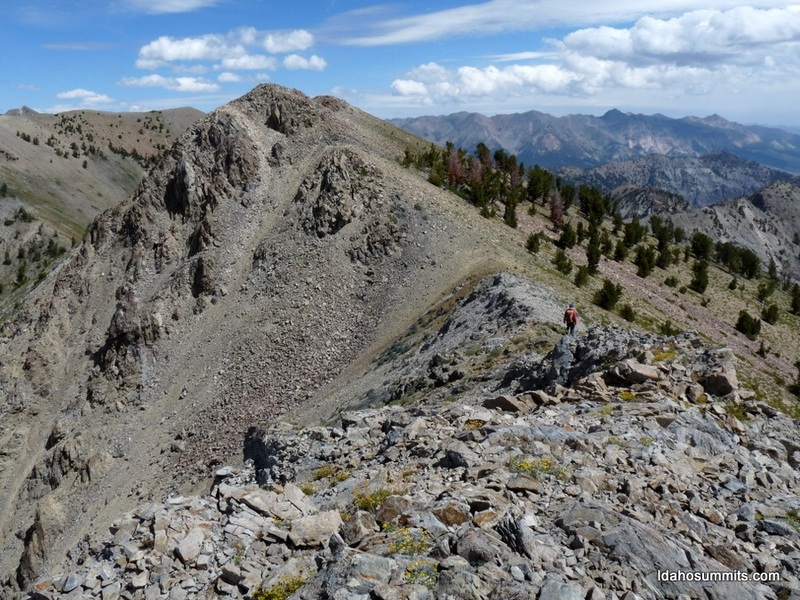 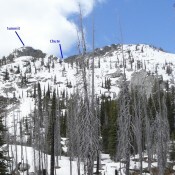 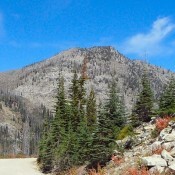 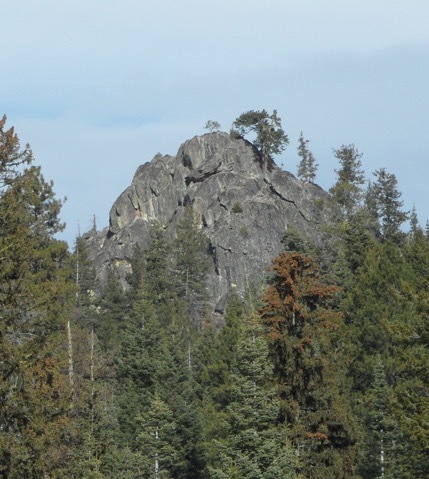 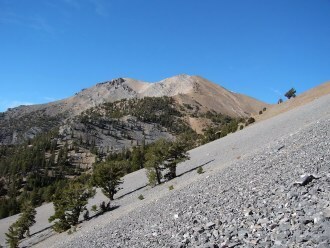 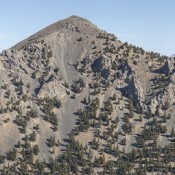 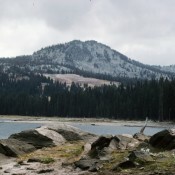 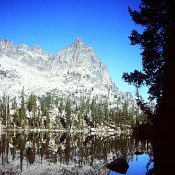 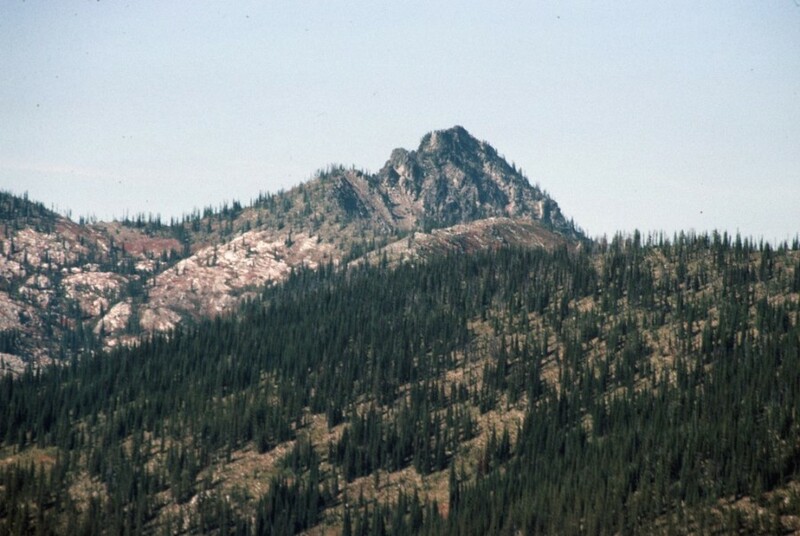 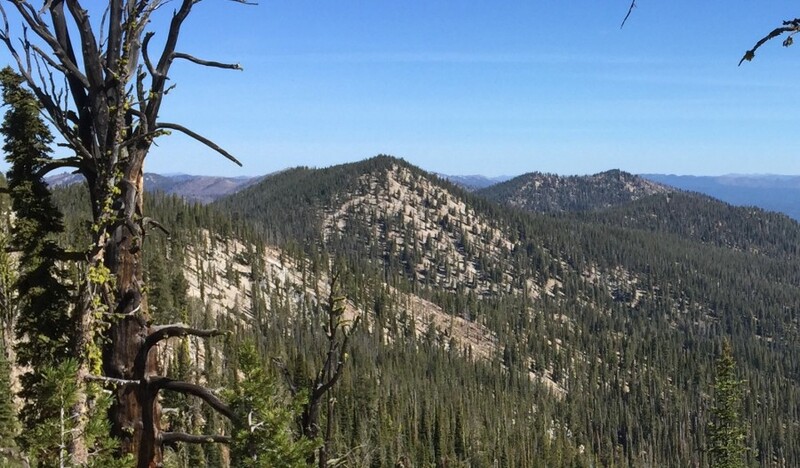 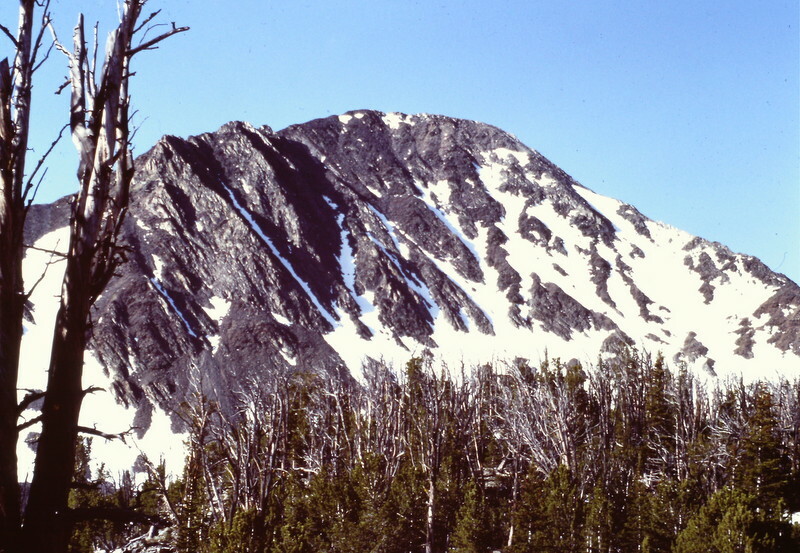 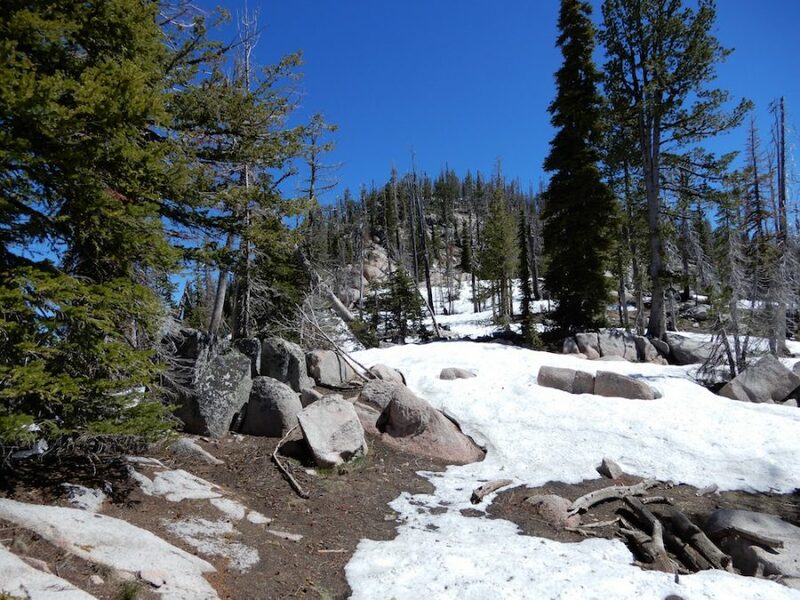 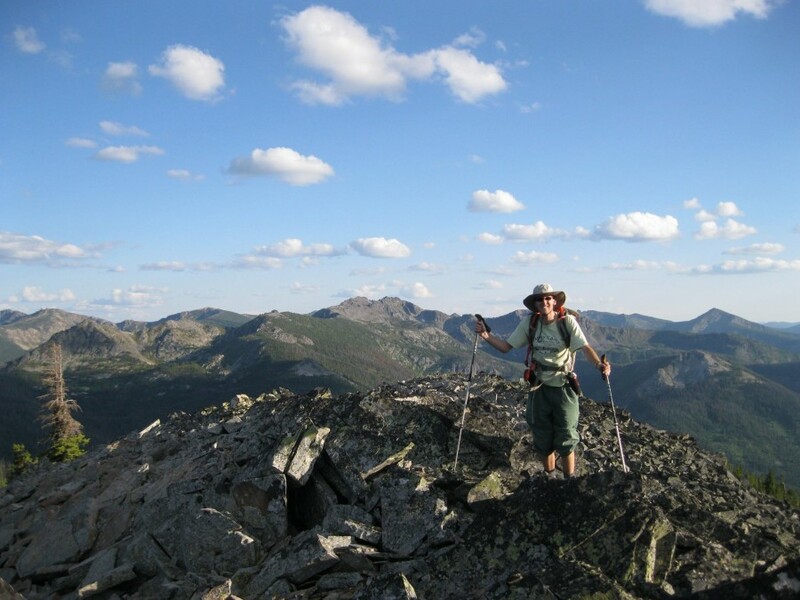 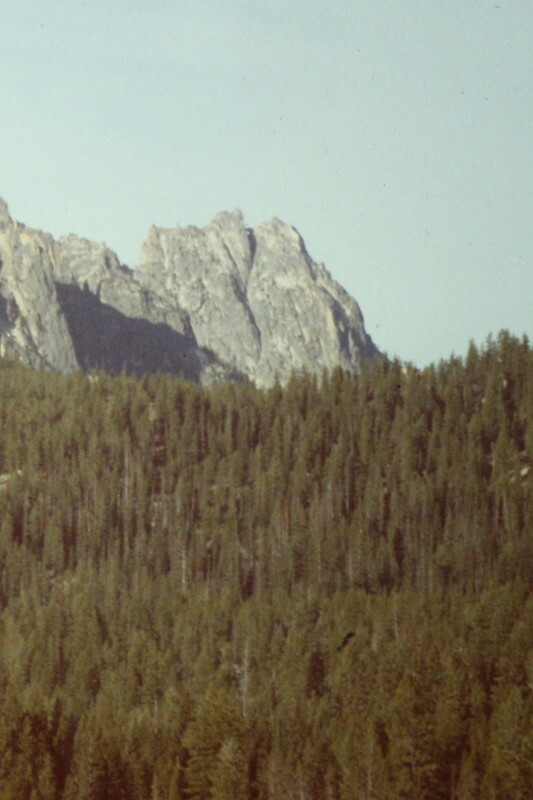 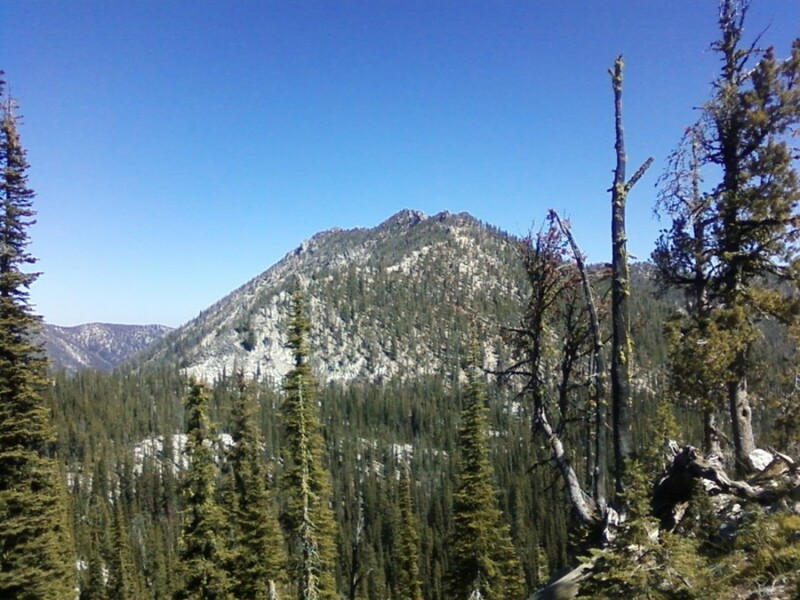 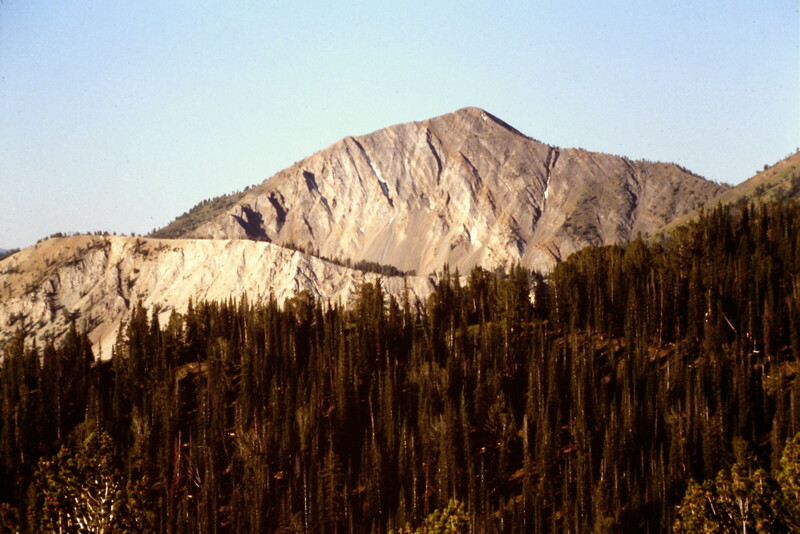 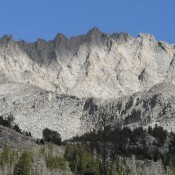 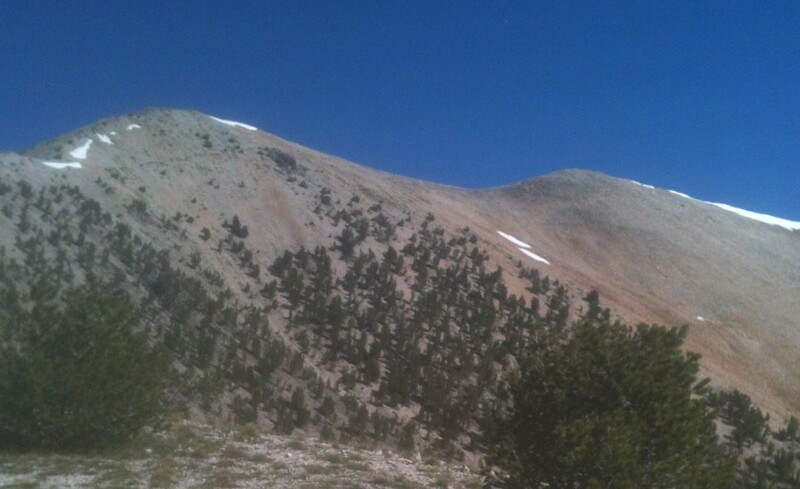 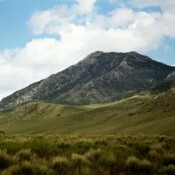 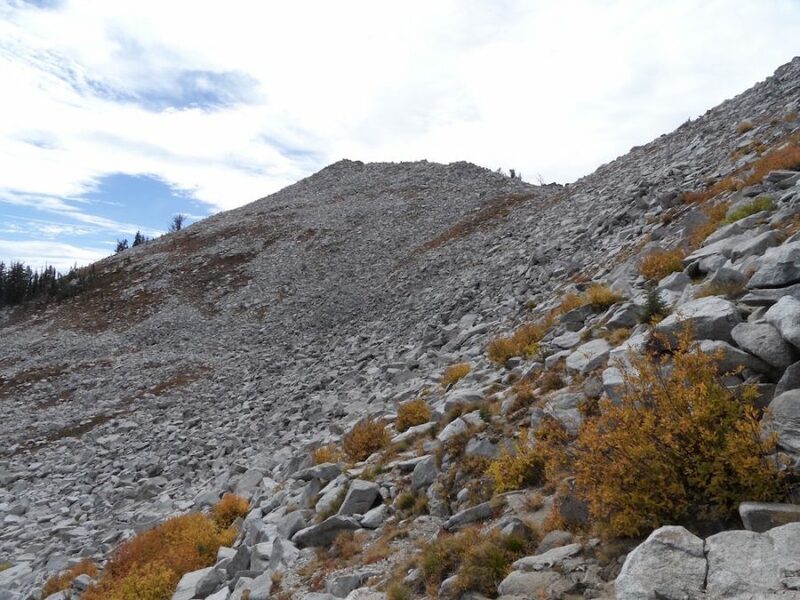 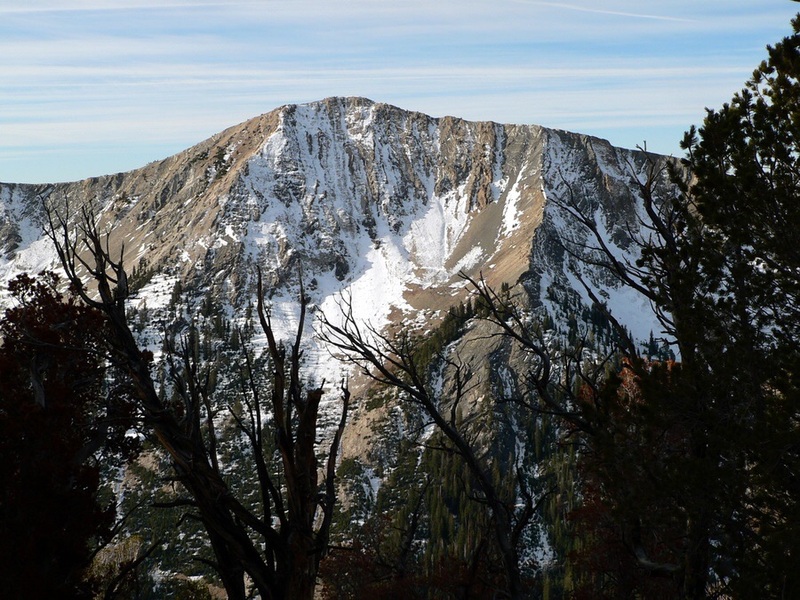 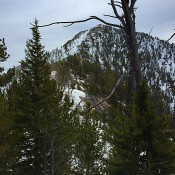 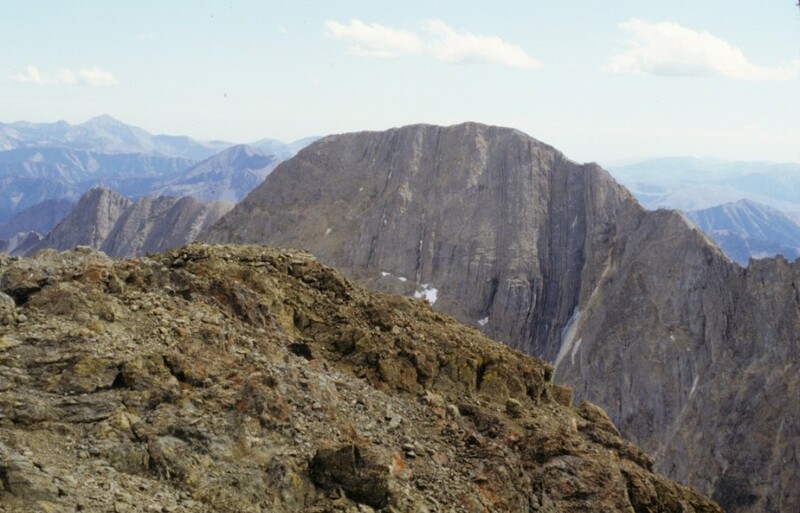 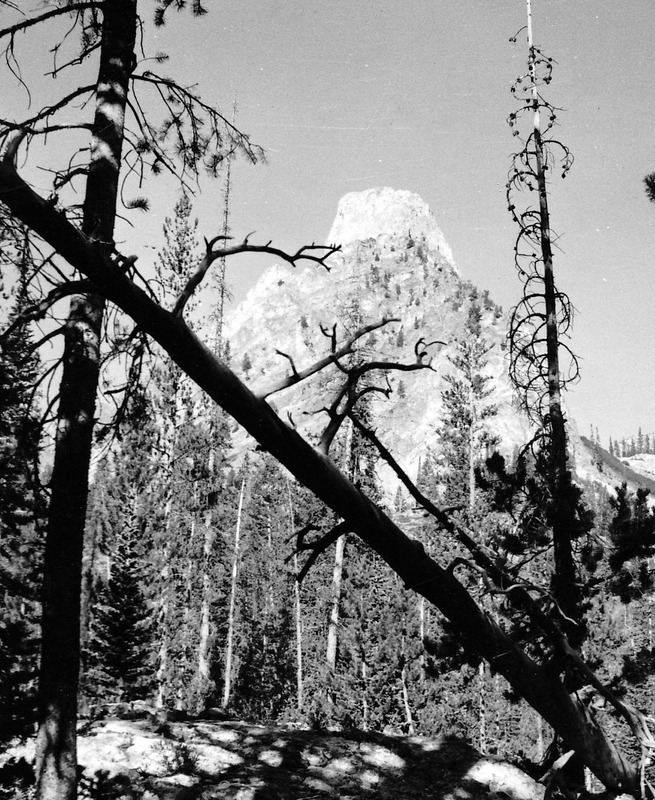 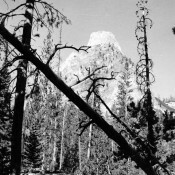 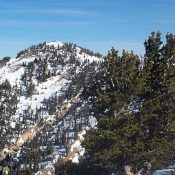 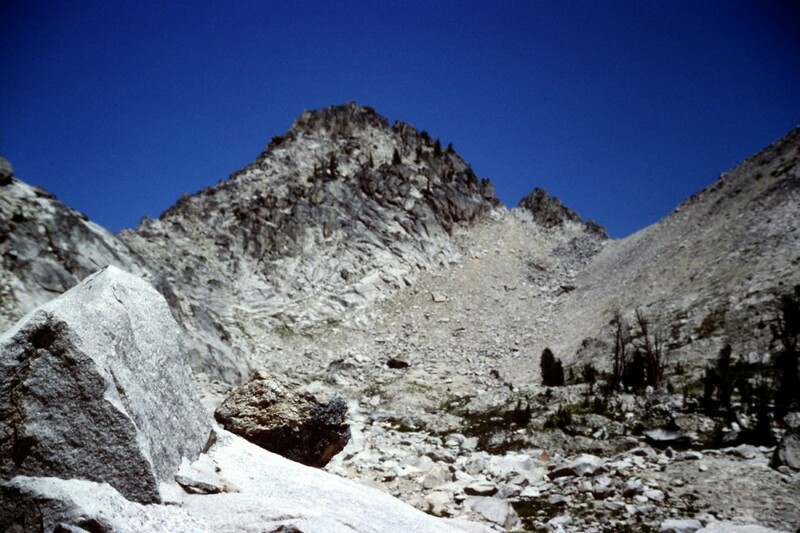 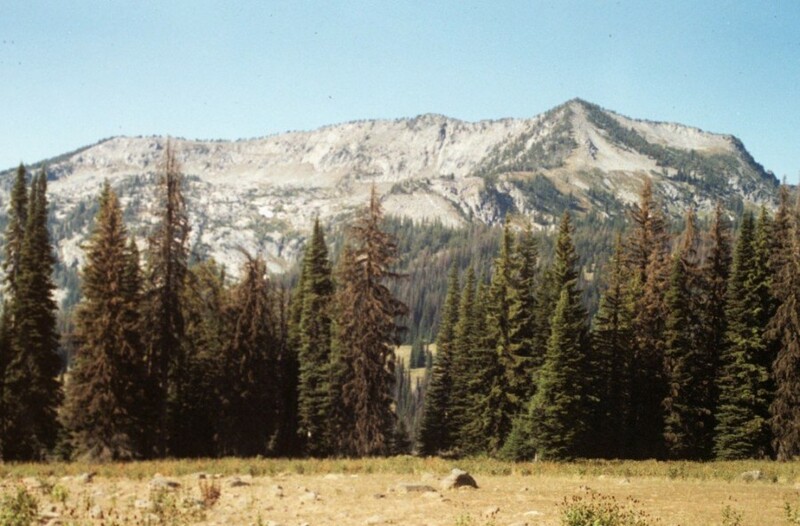 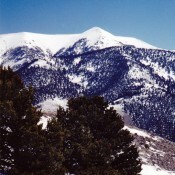 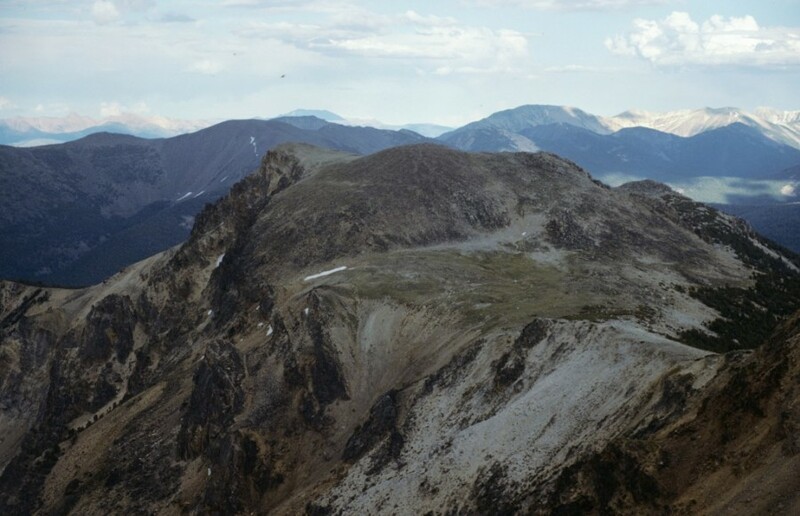 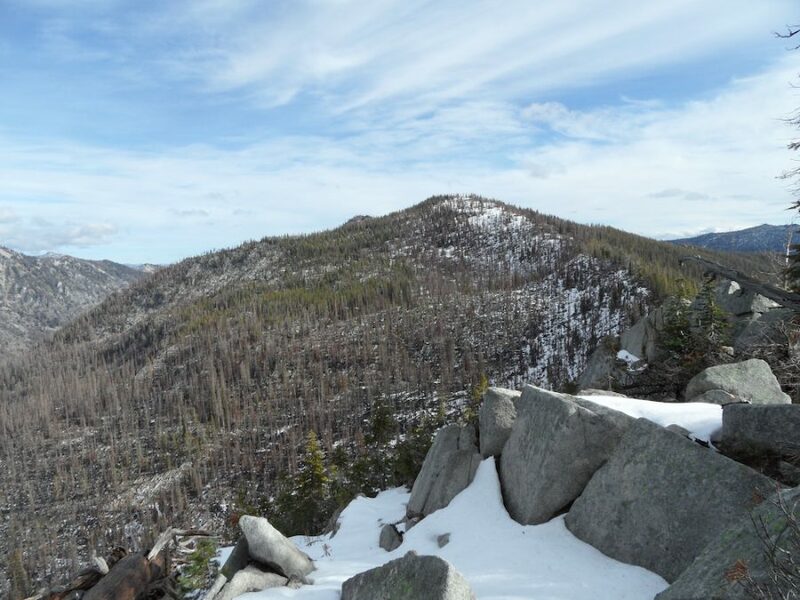 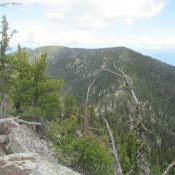 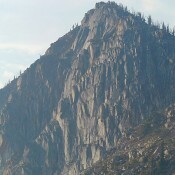 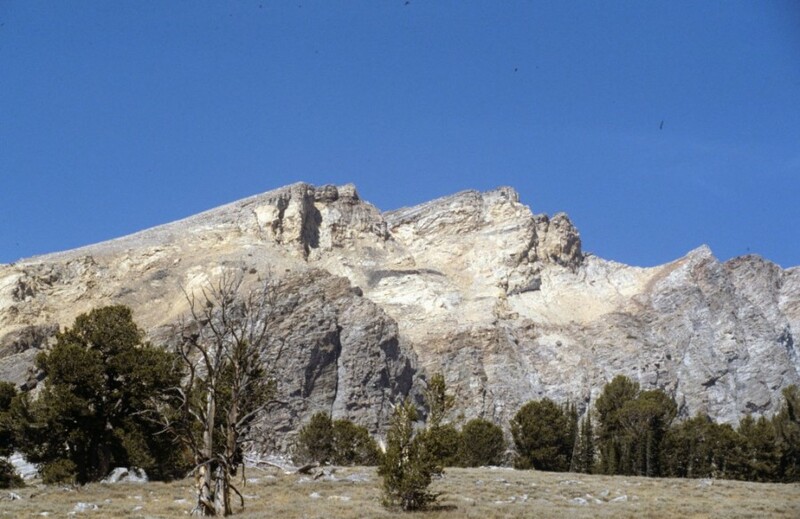 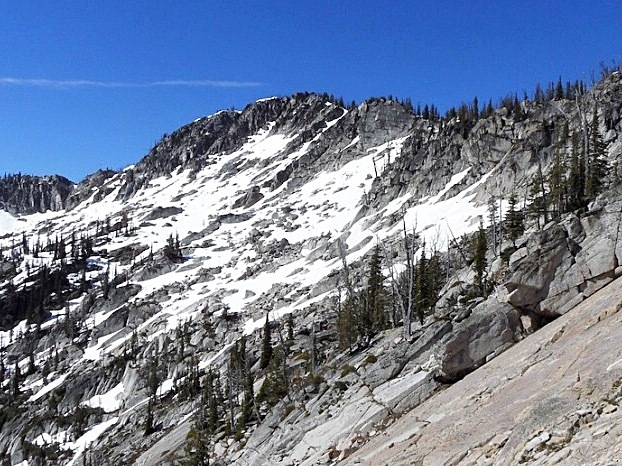 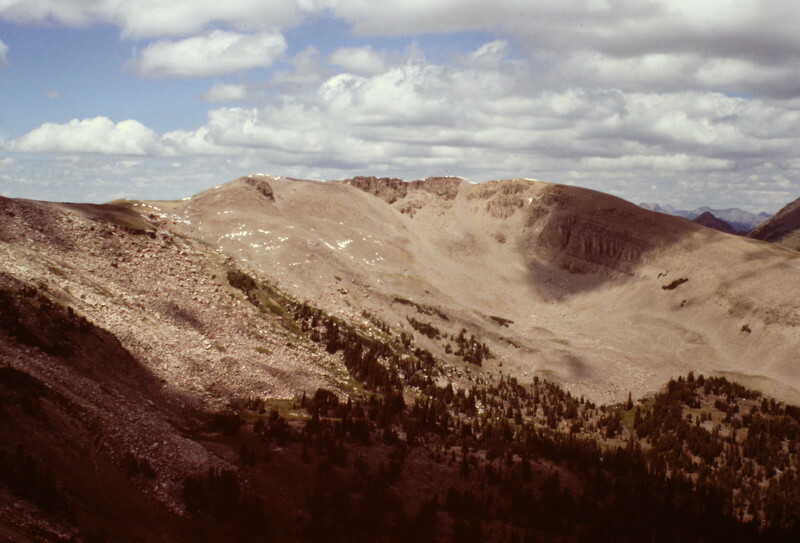 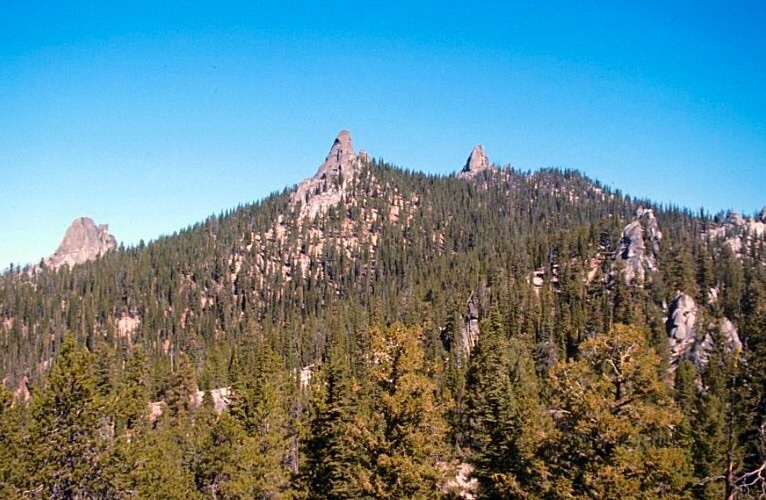 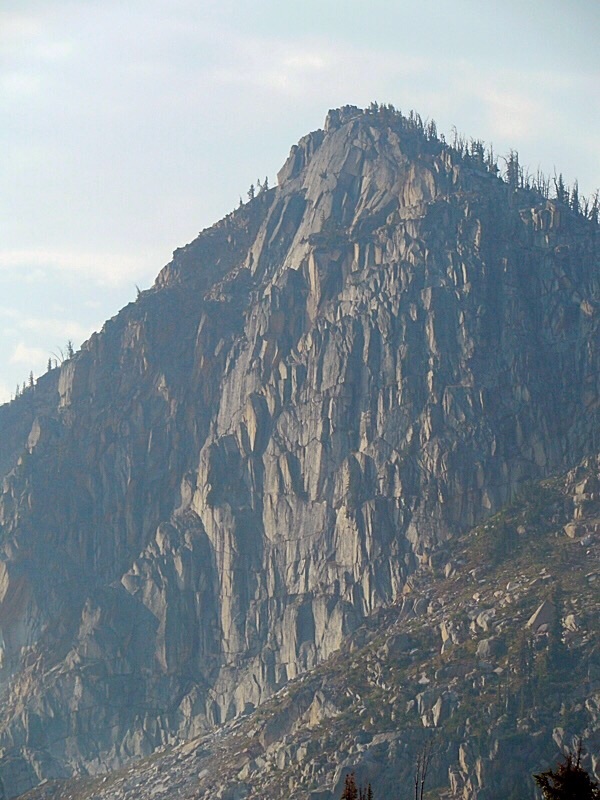 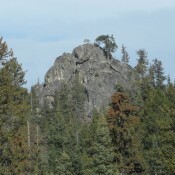 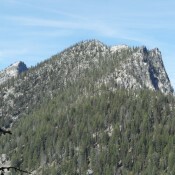 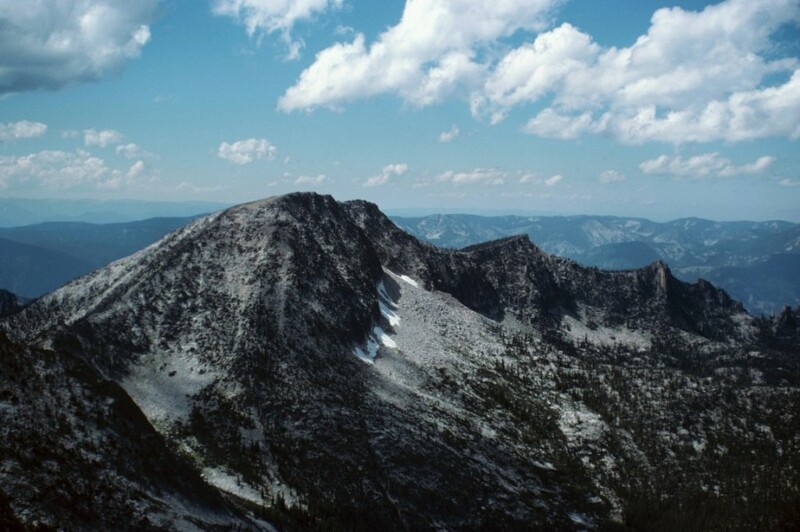 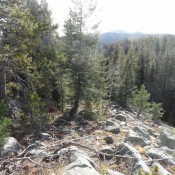 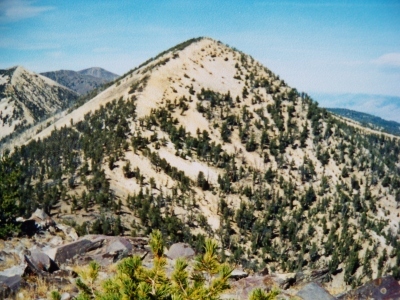 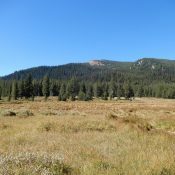 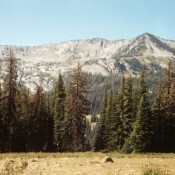 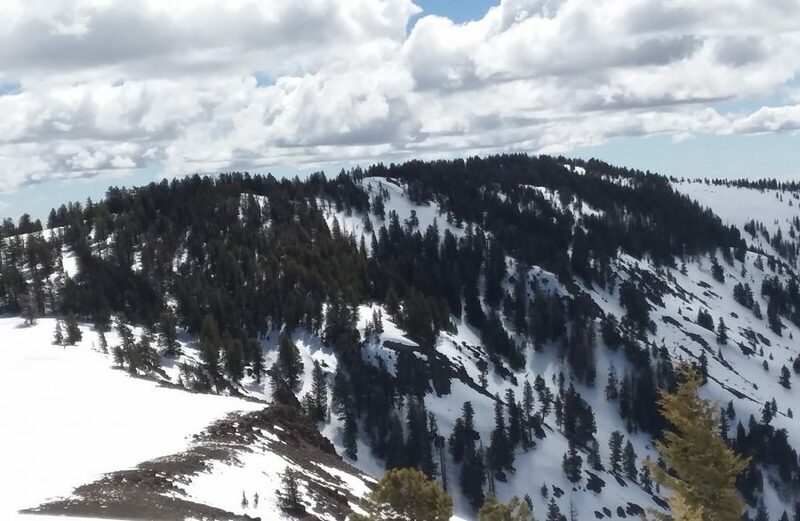 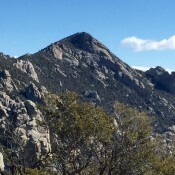 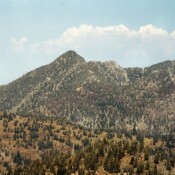 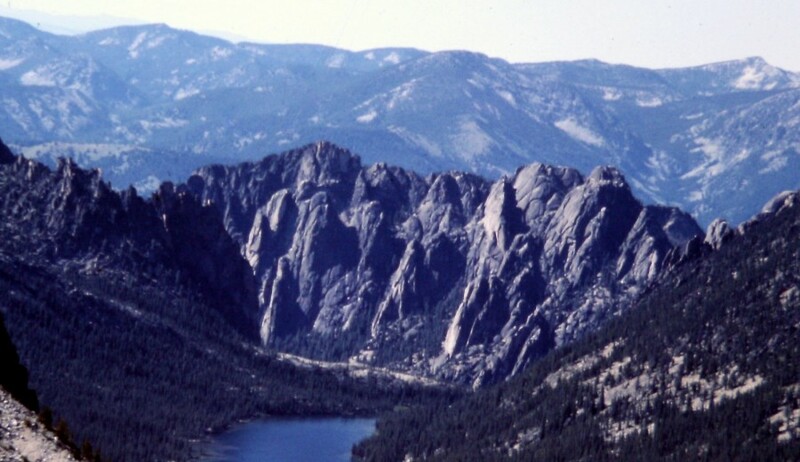 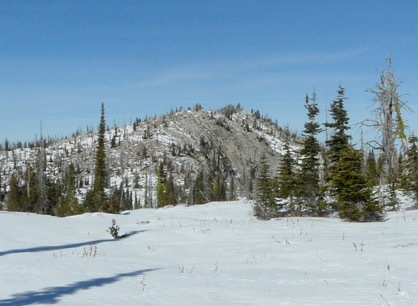 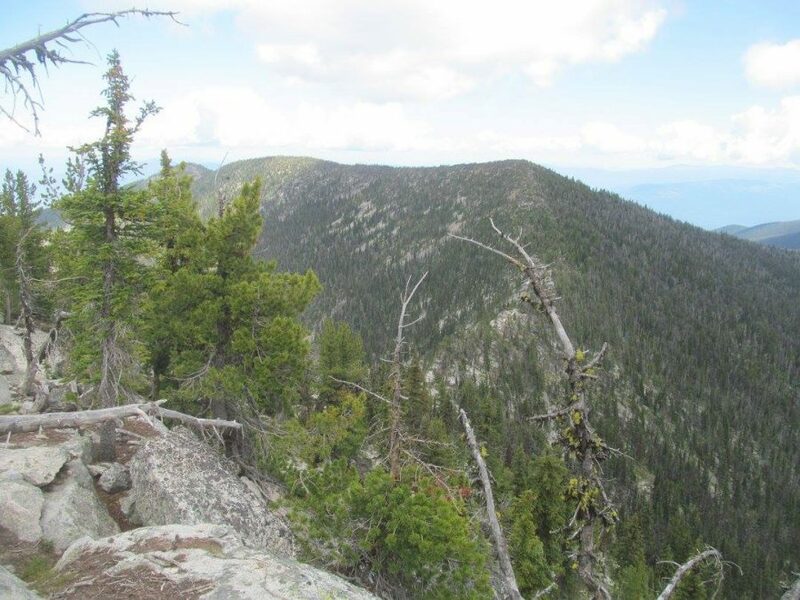 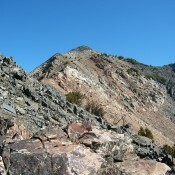 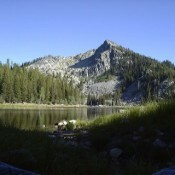 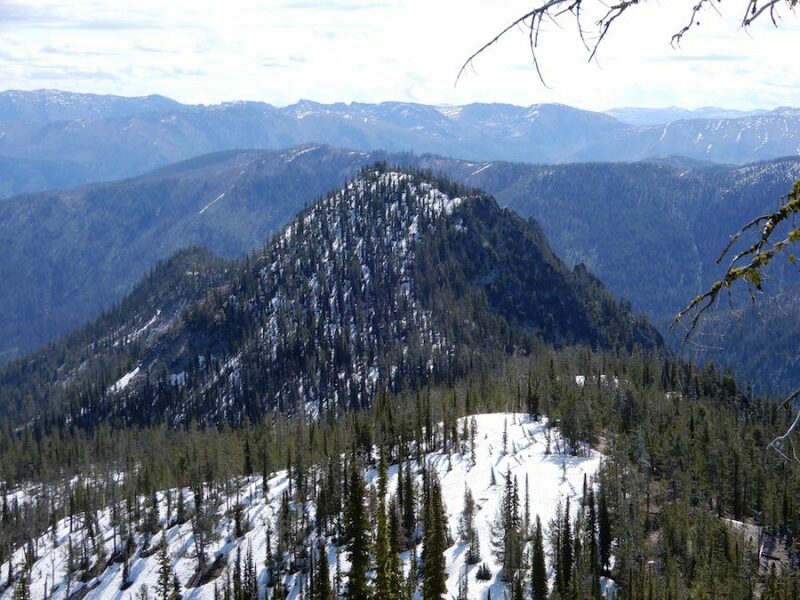 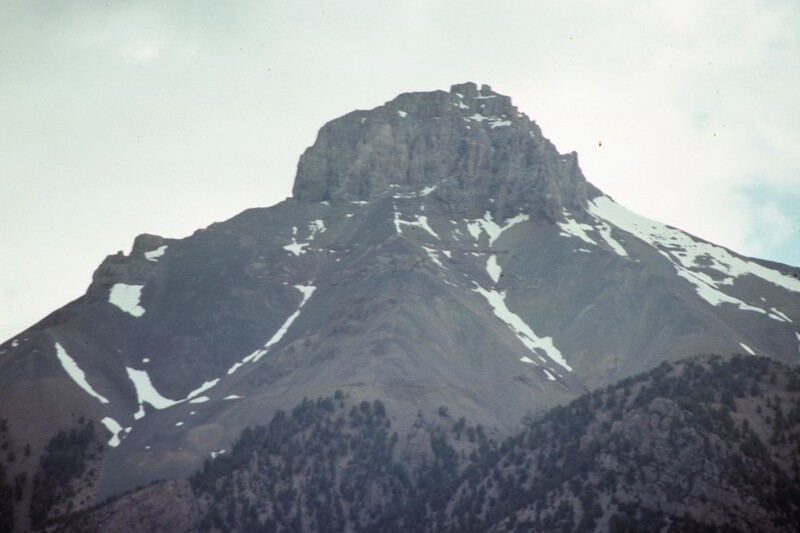 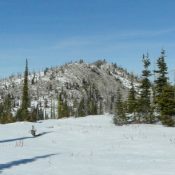 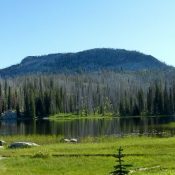 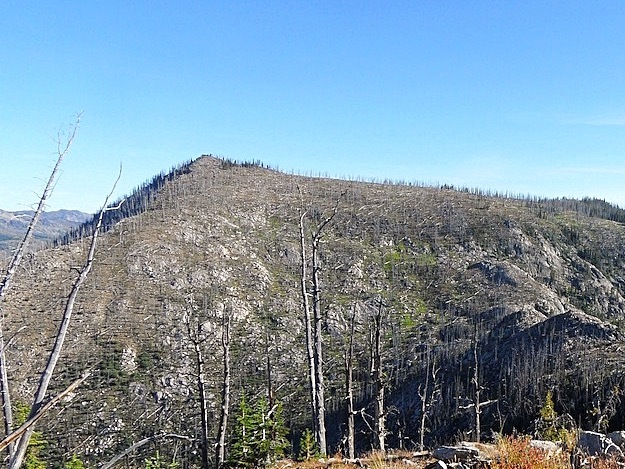 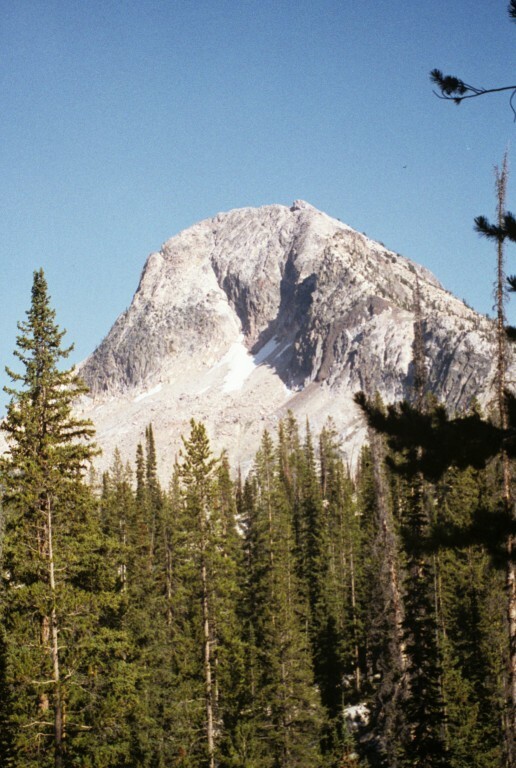 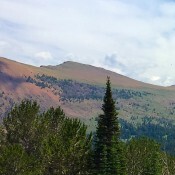 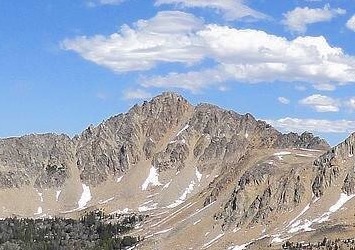 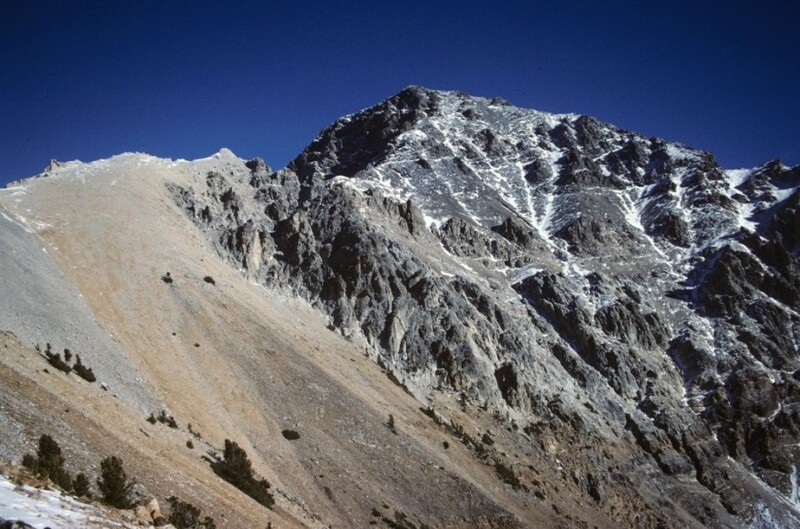 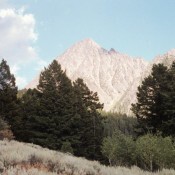 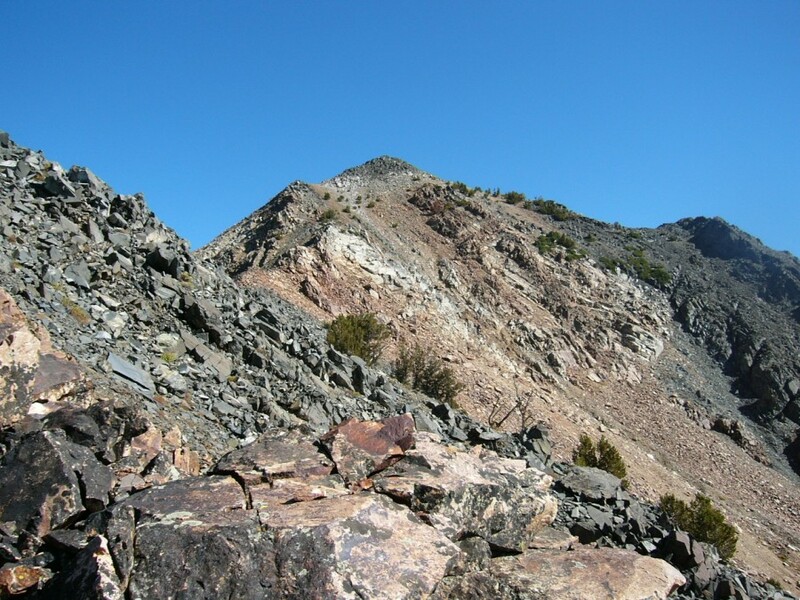 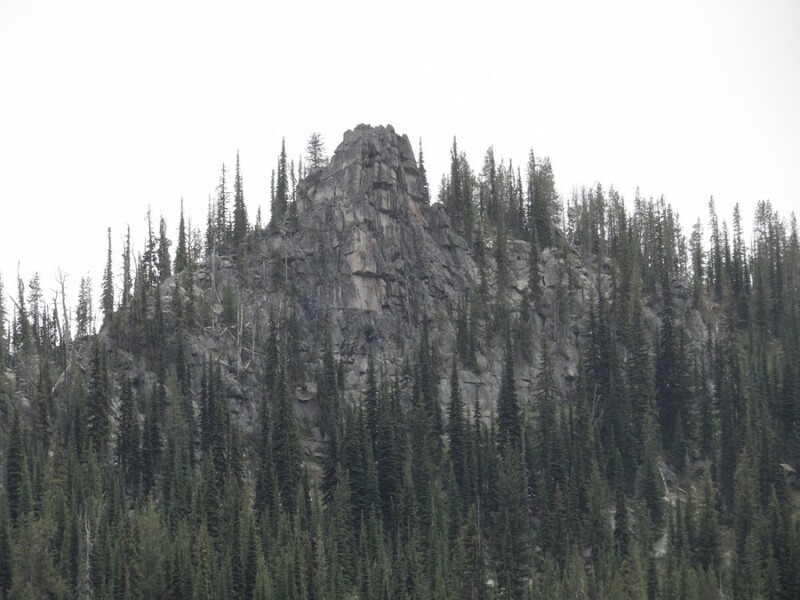 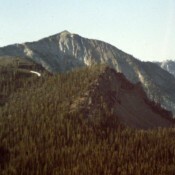 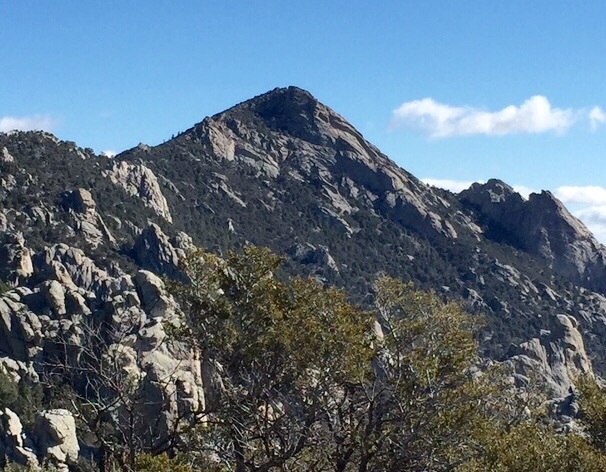 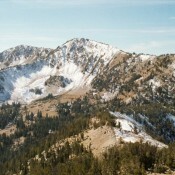 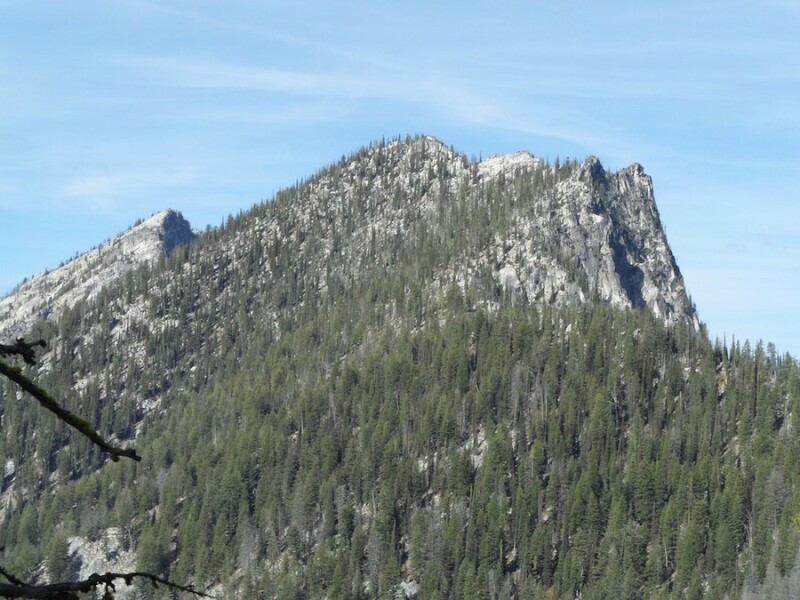 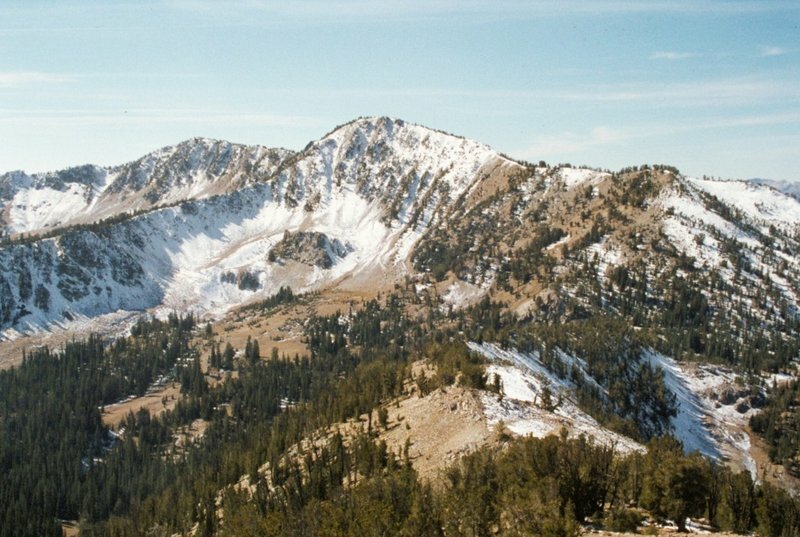 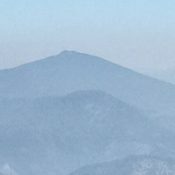 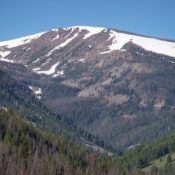 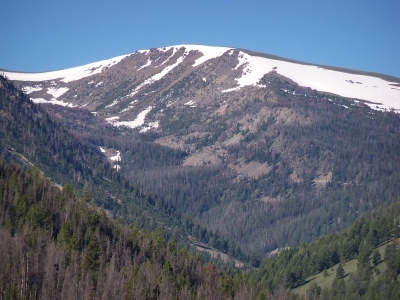 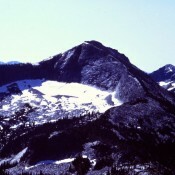 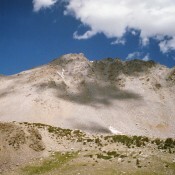 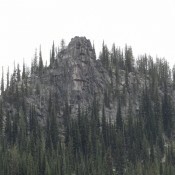 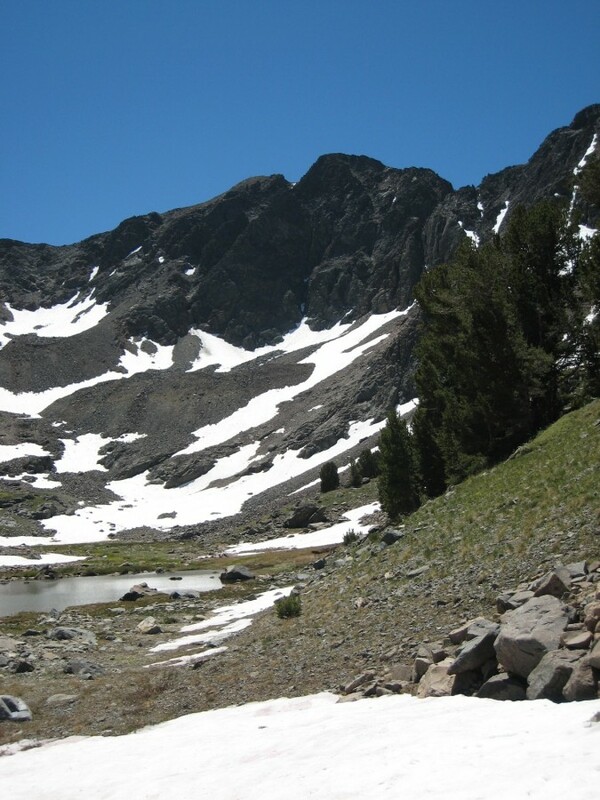 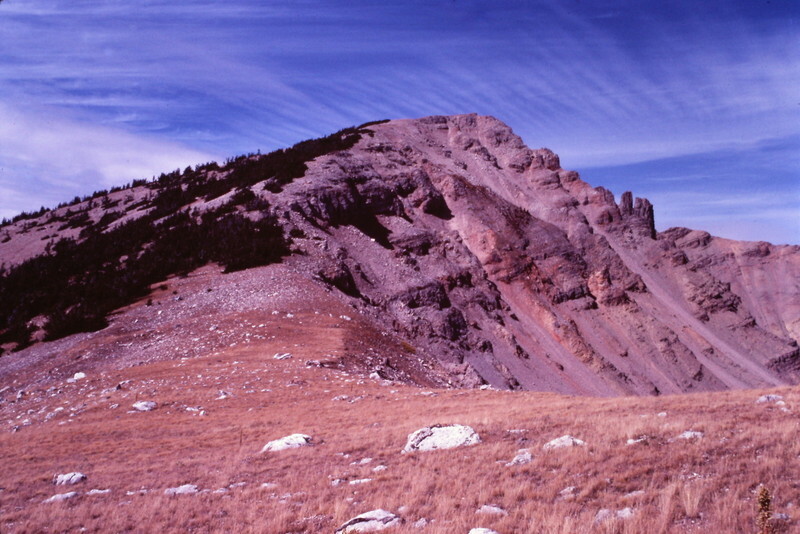 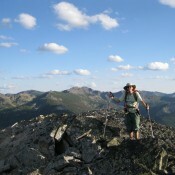 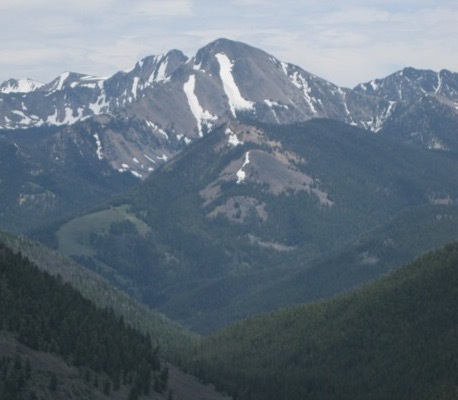 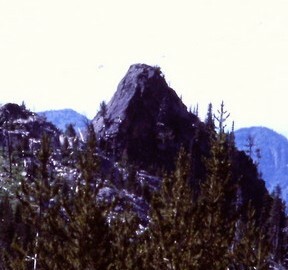 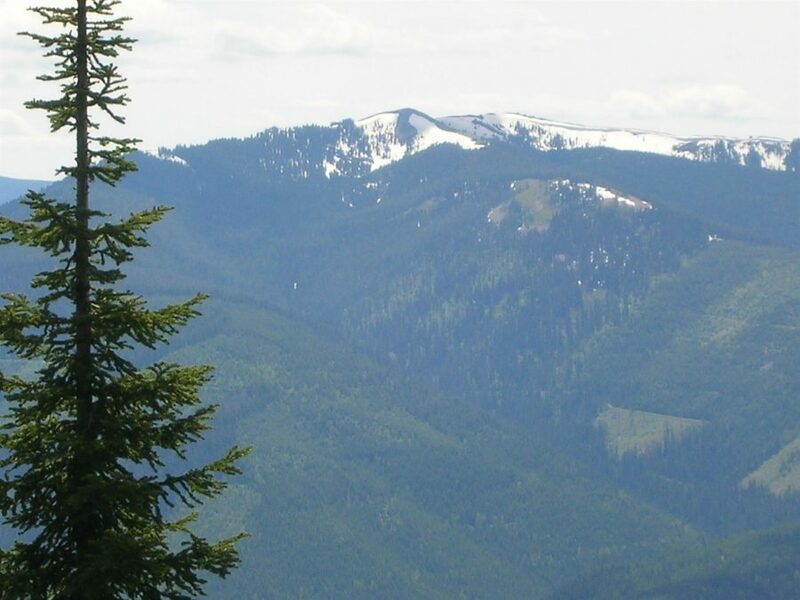 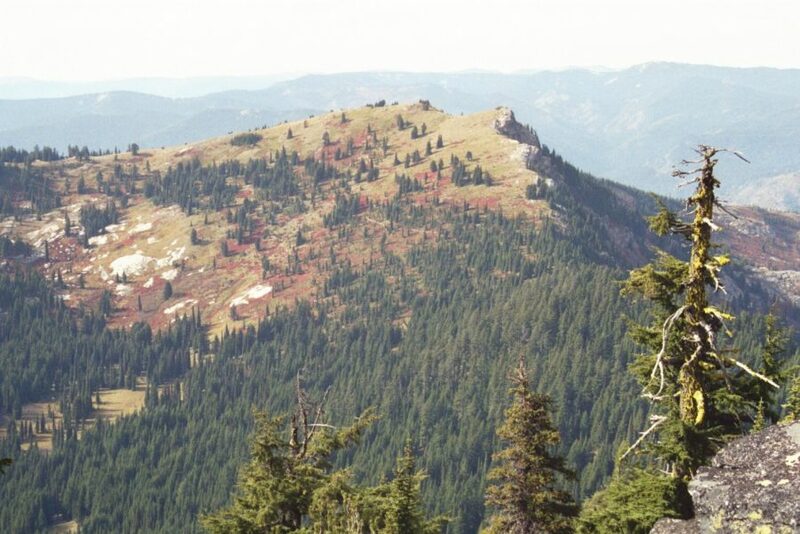 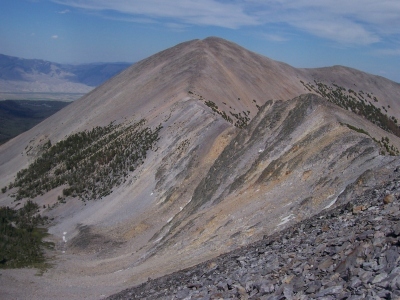 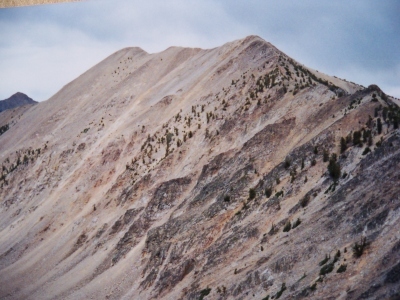 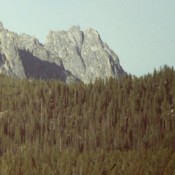 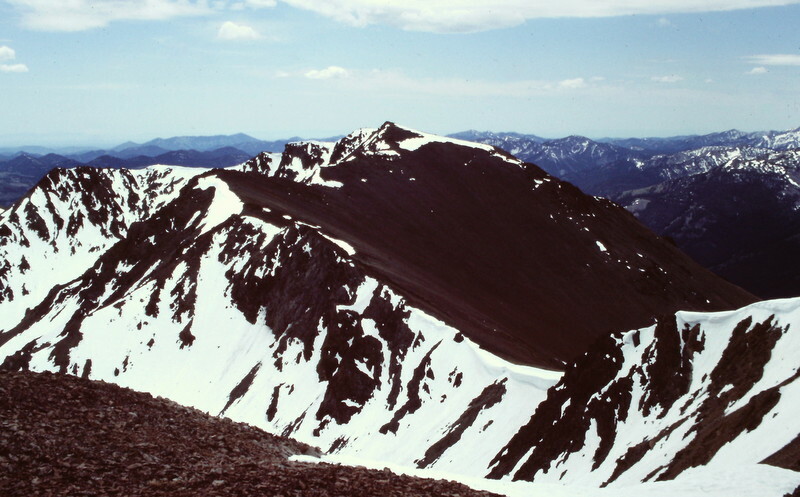 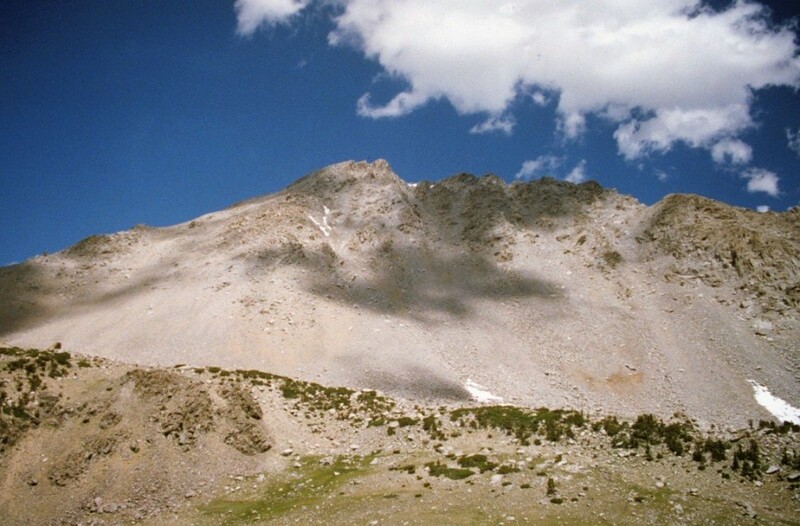 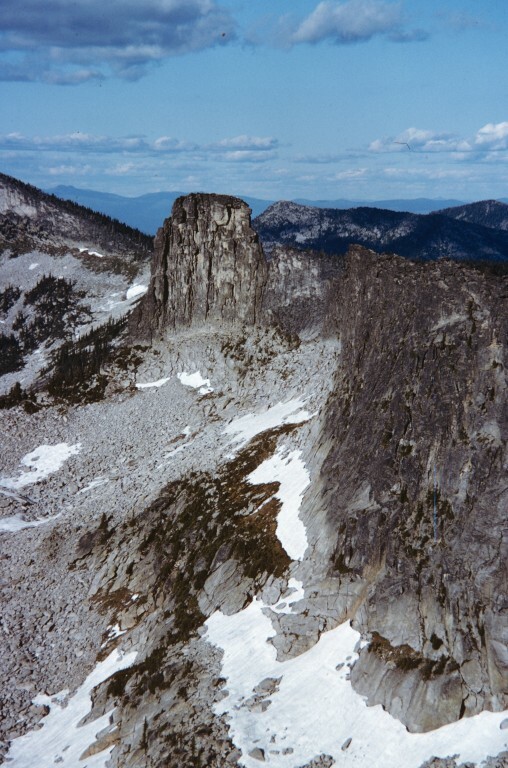 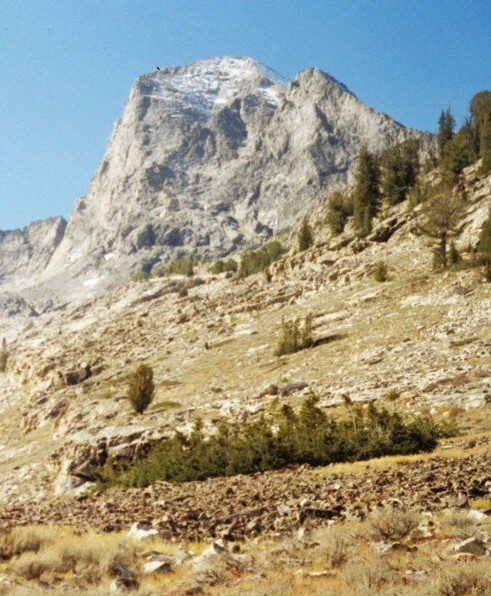 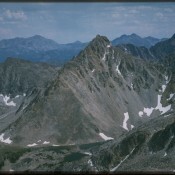 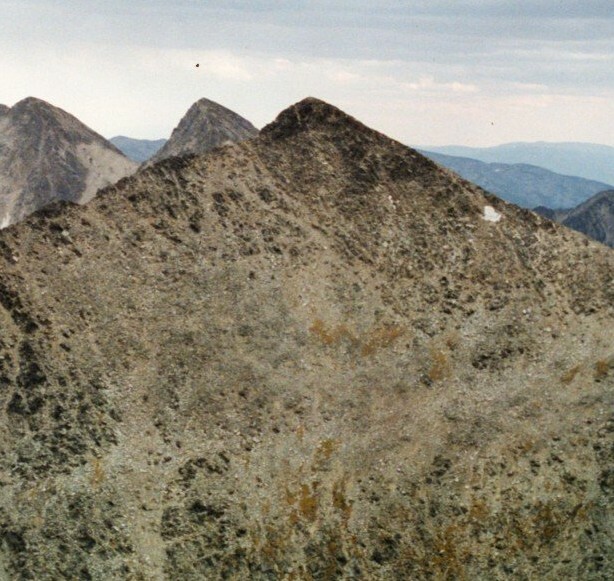 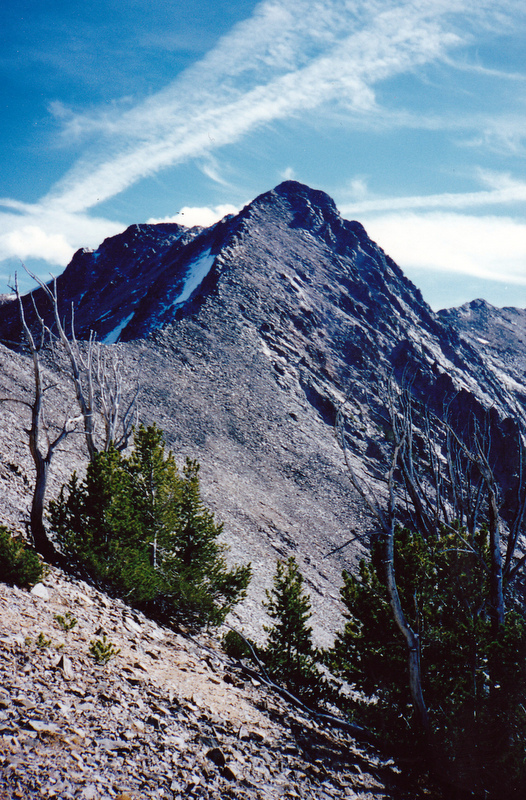 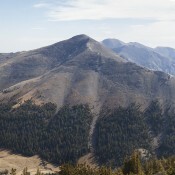 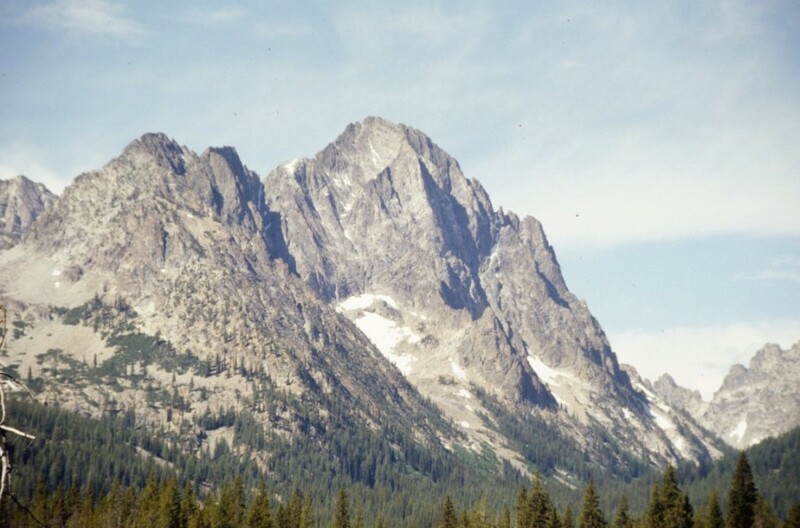 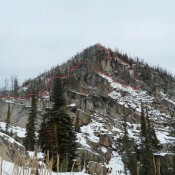 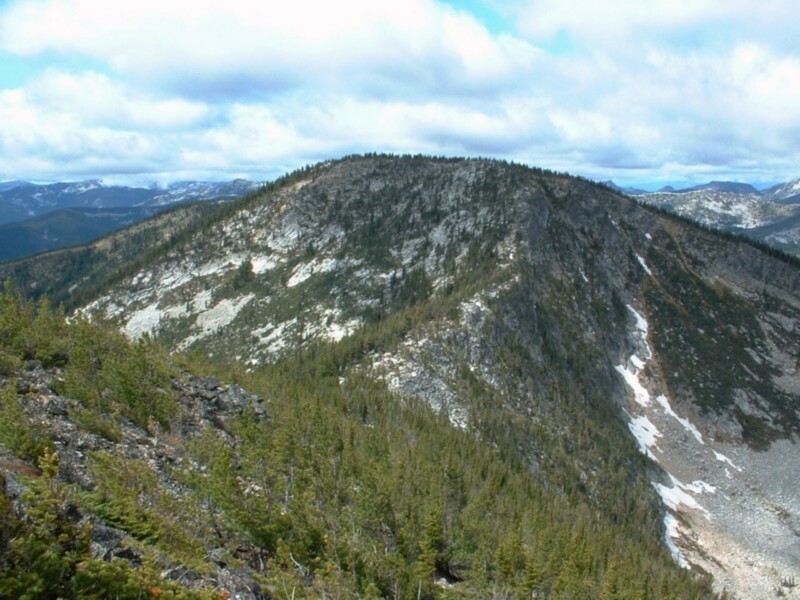 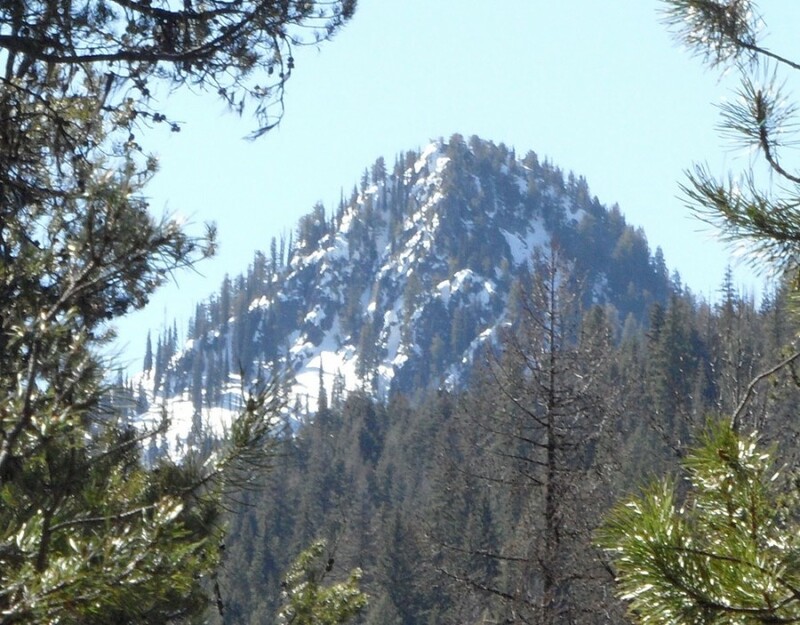 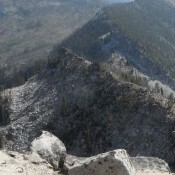 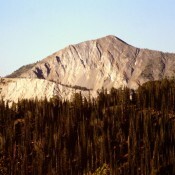 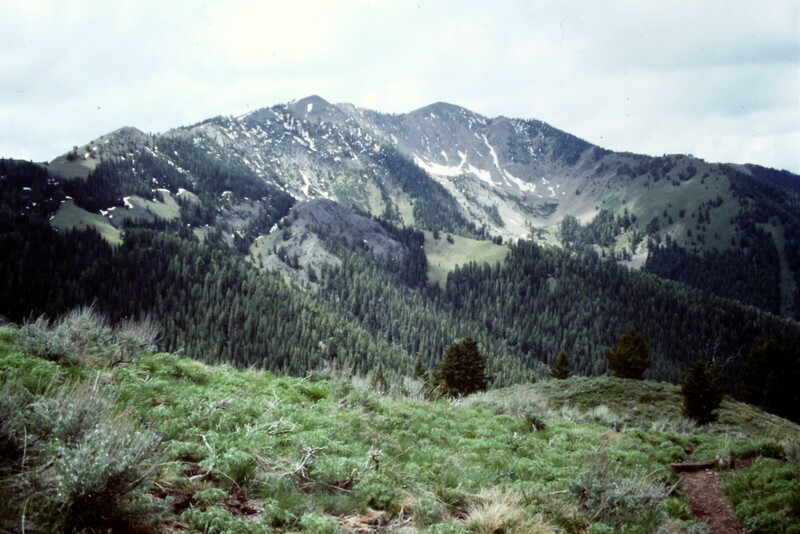 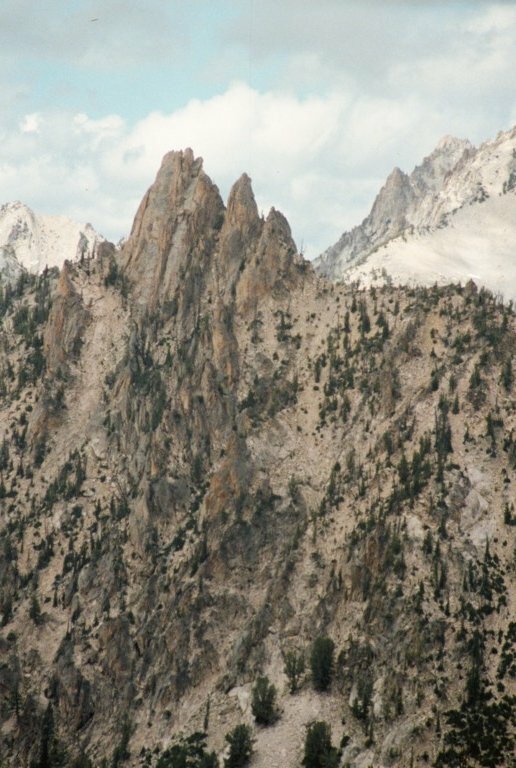 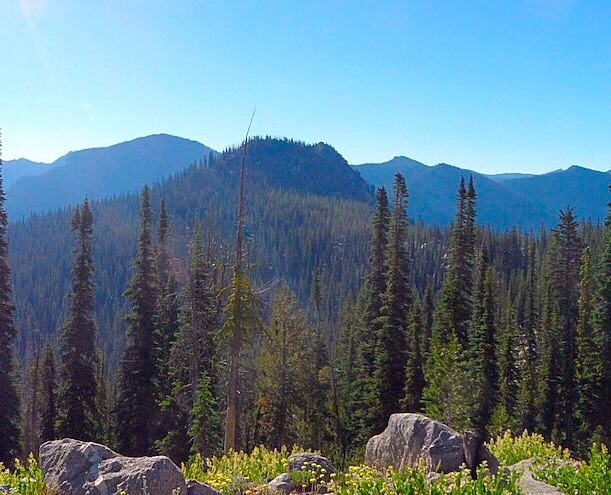 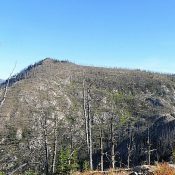 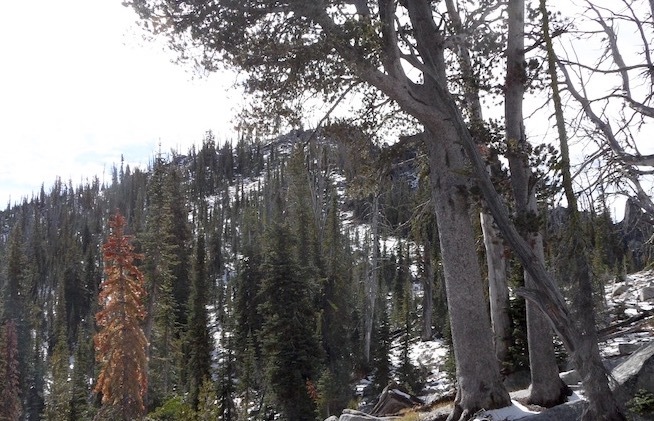 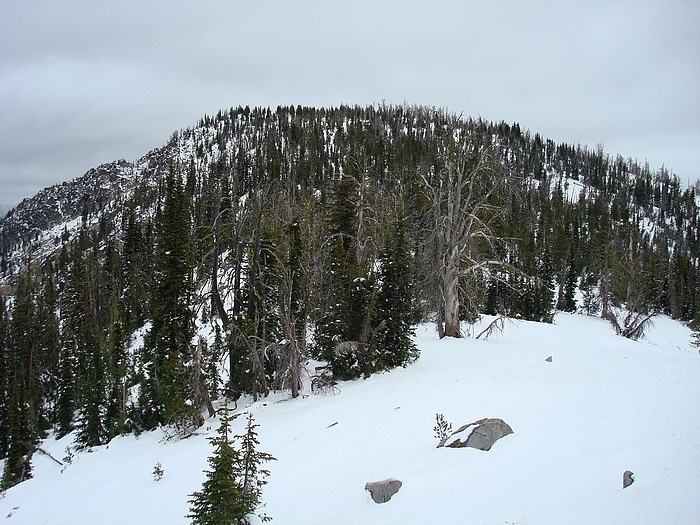 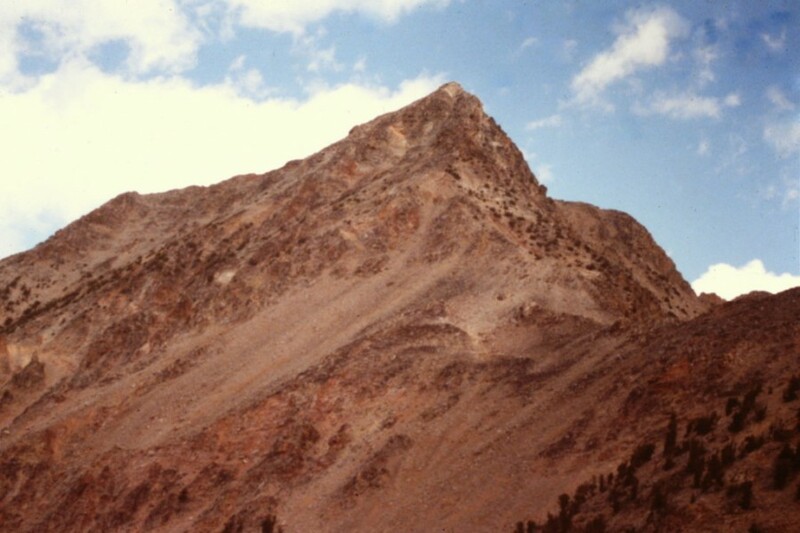 Gunnell Peak Black Pine Mountains 8,316 ft This peak is found on pages 351 and 352. 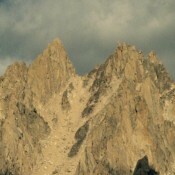 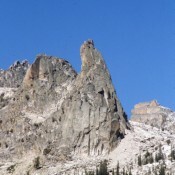 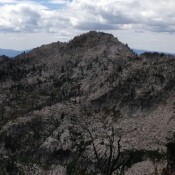 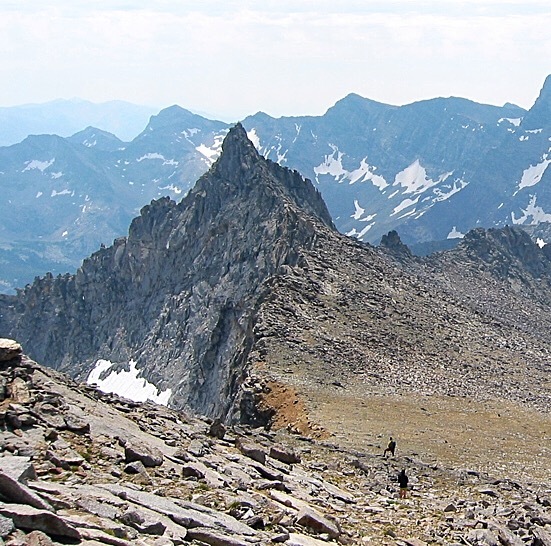 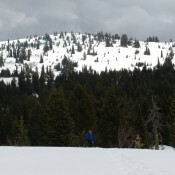 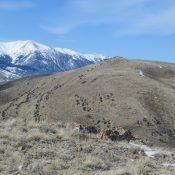 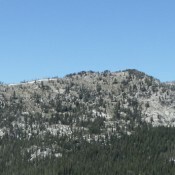 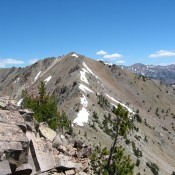 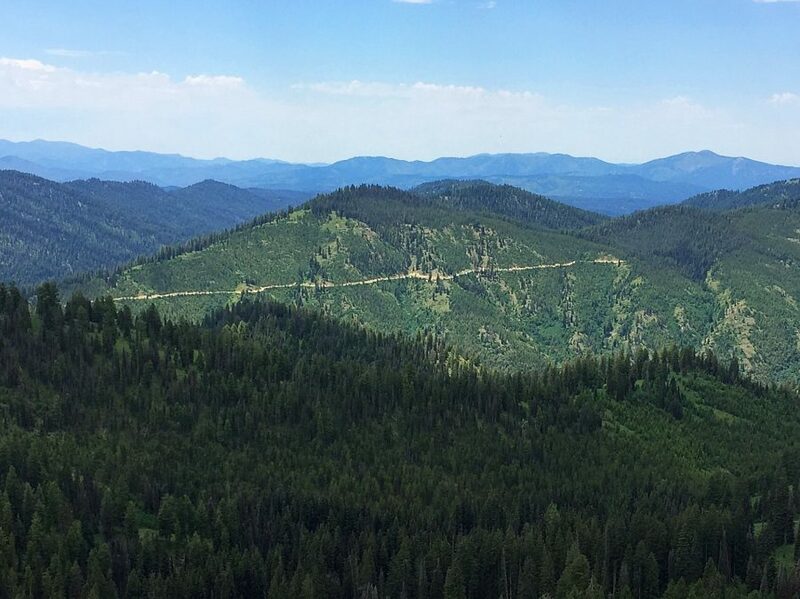 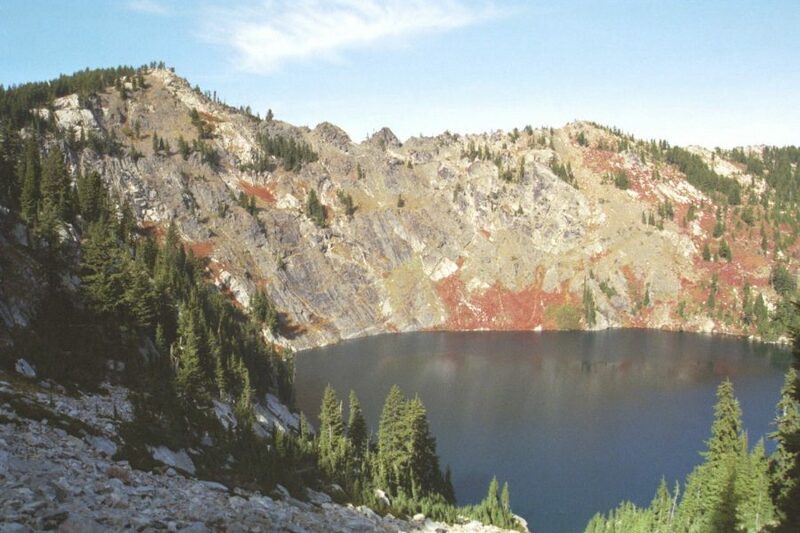 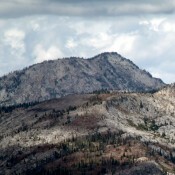 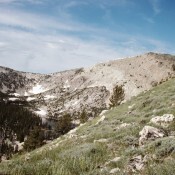 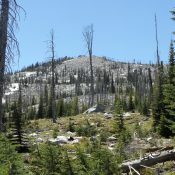 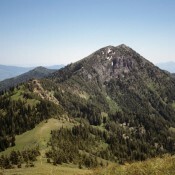 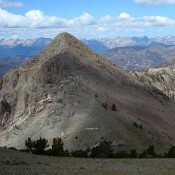 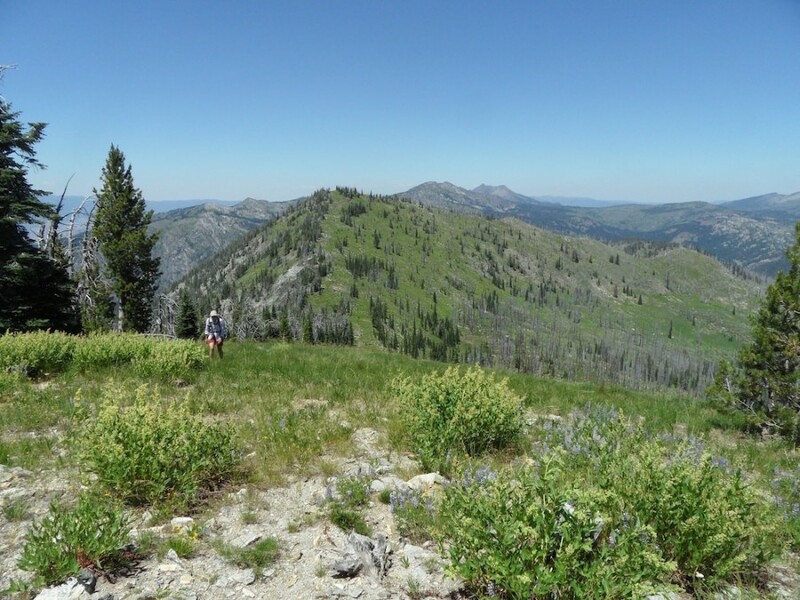 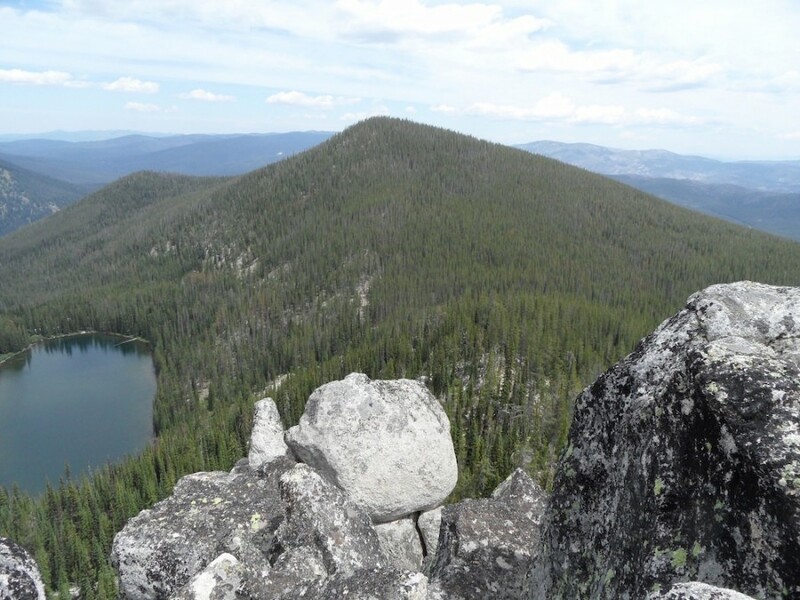 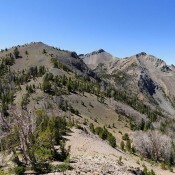 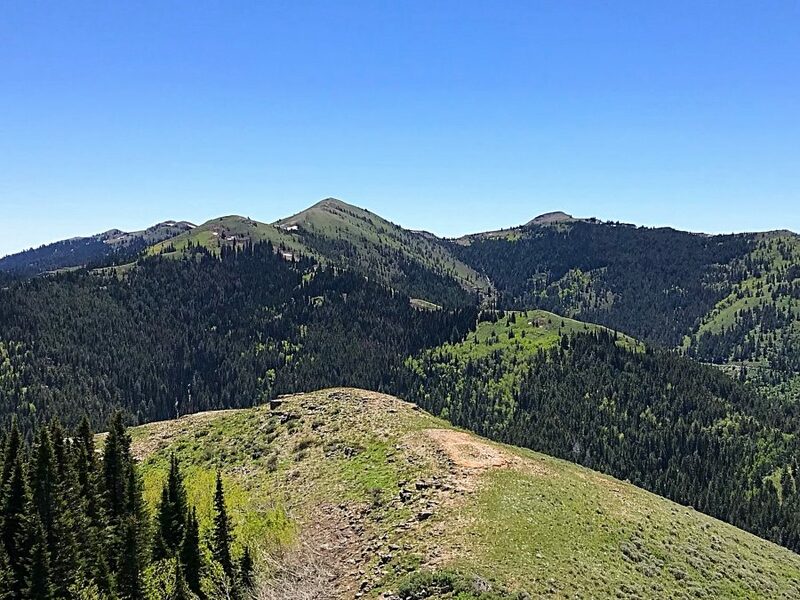 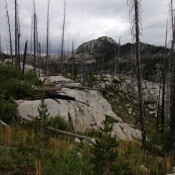 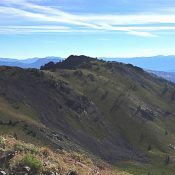 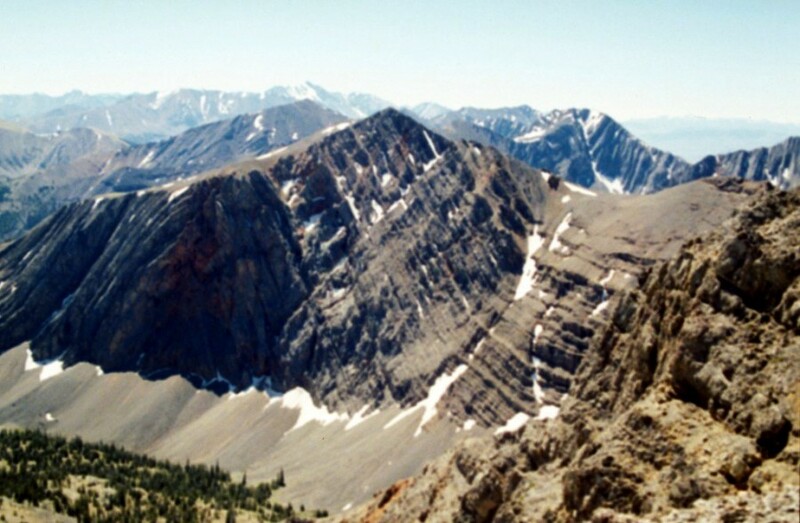 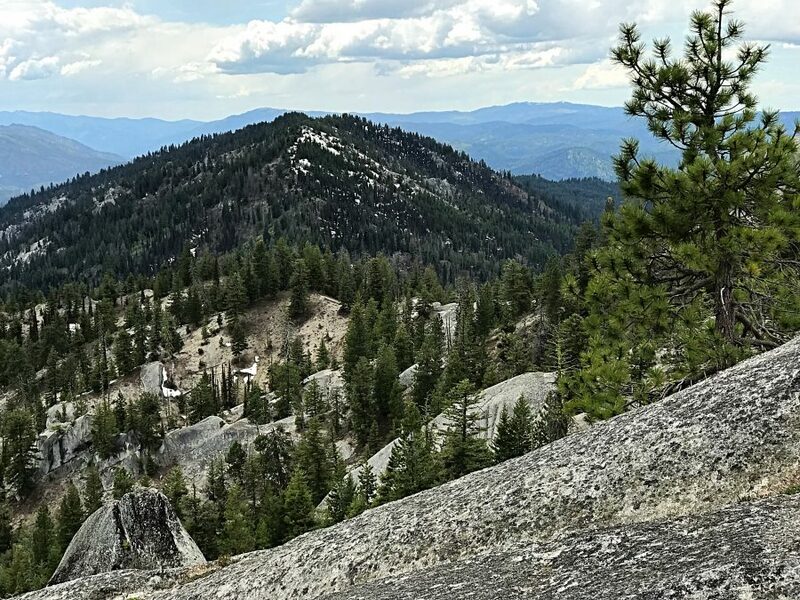 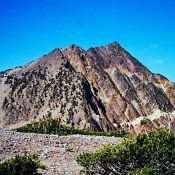 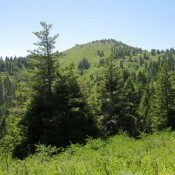 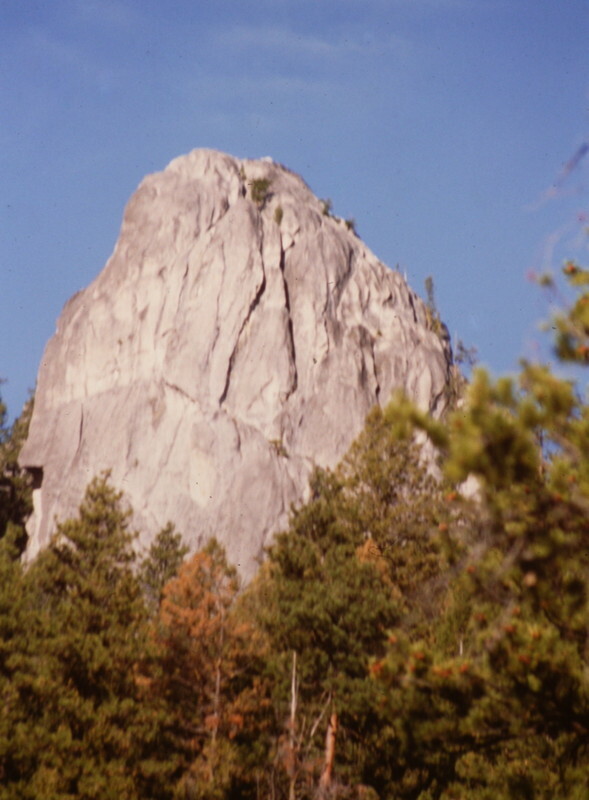 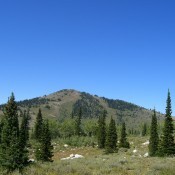 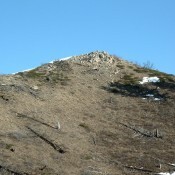 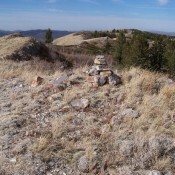 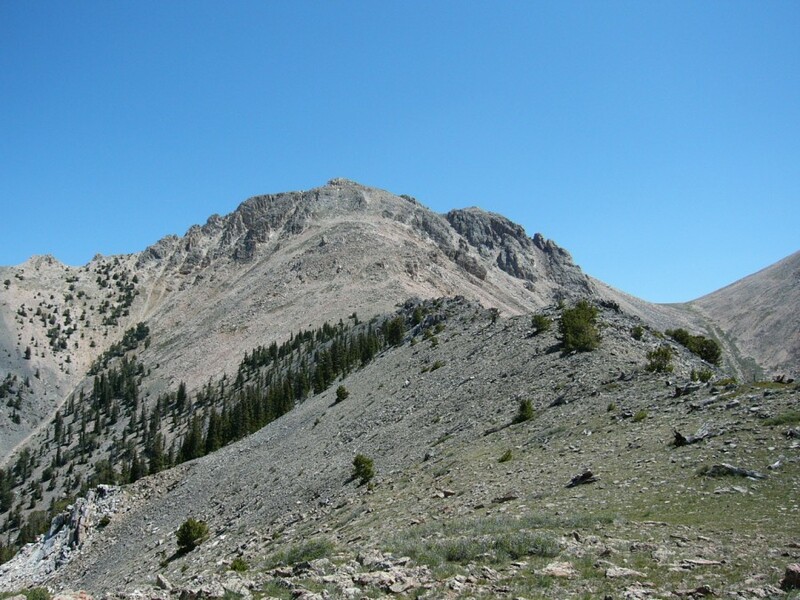 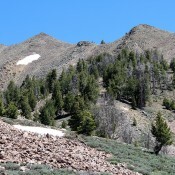 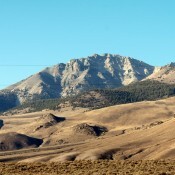 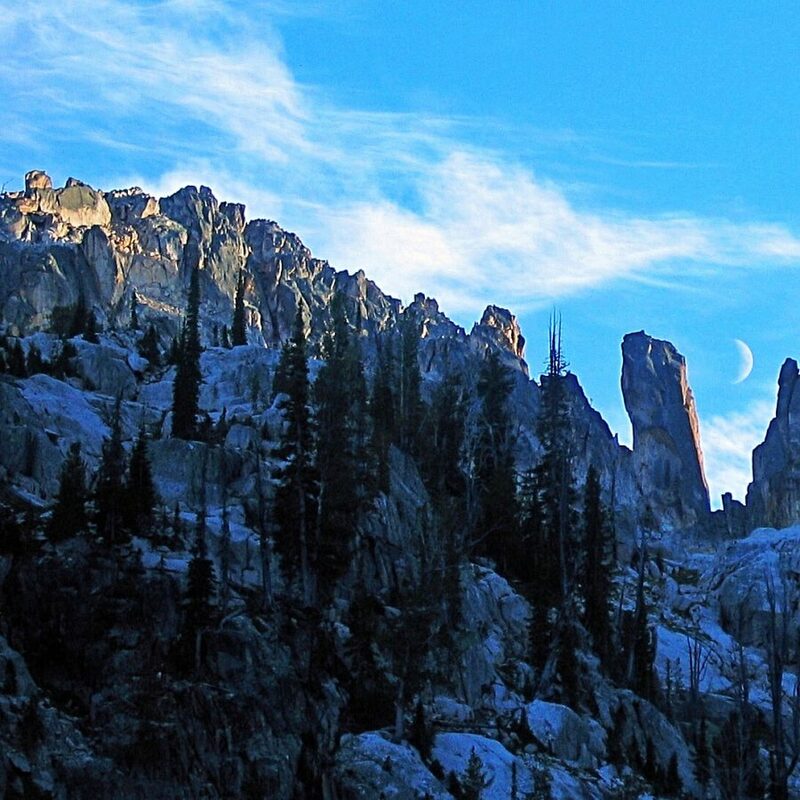 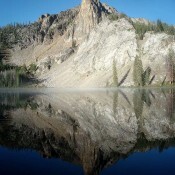 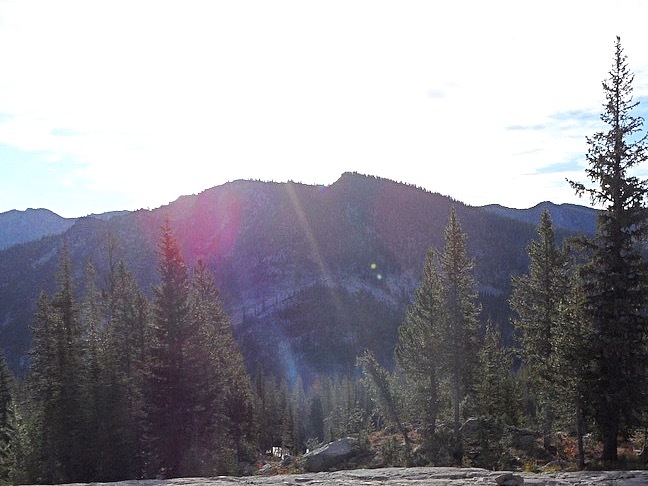 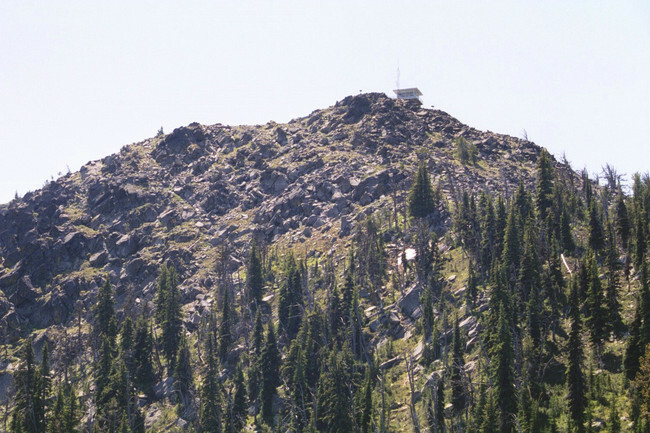 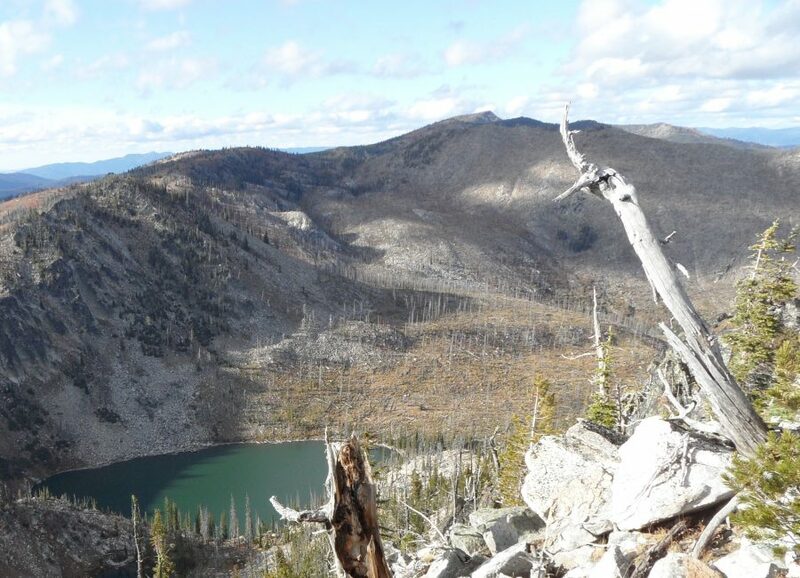 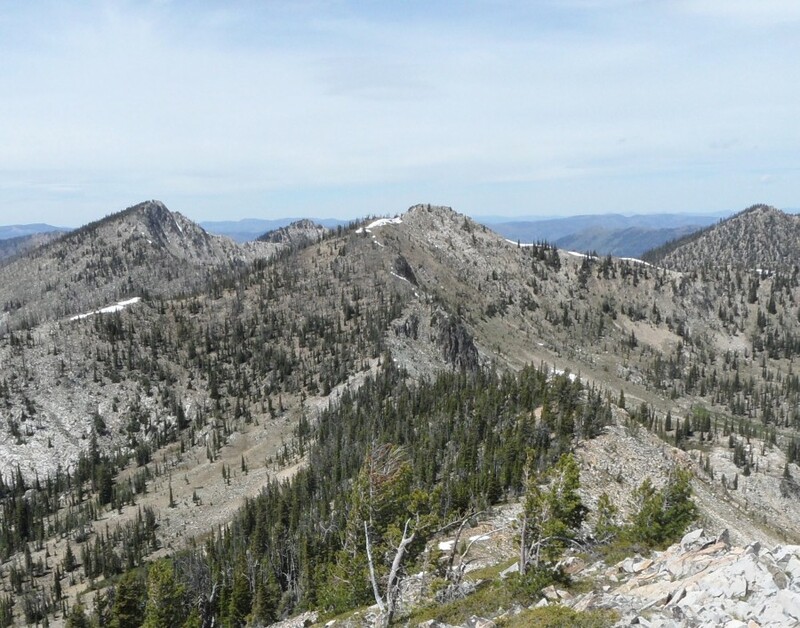 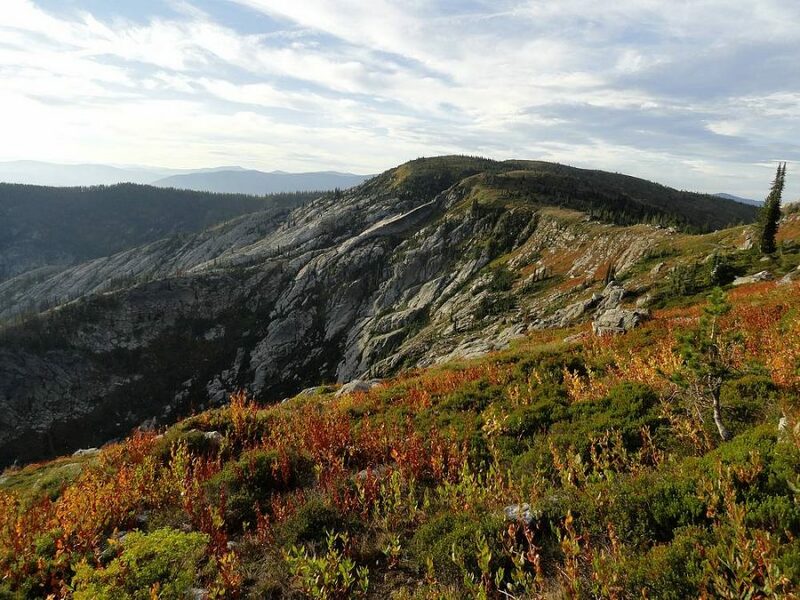 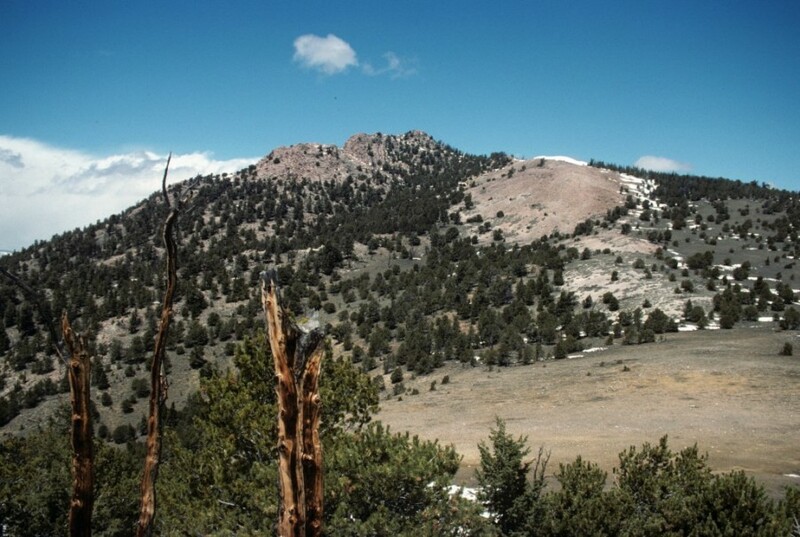 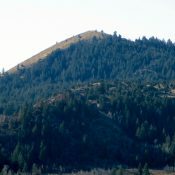 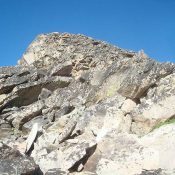 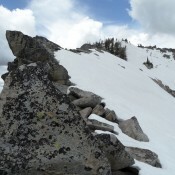 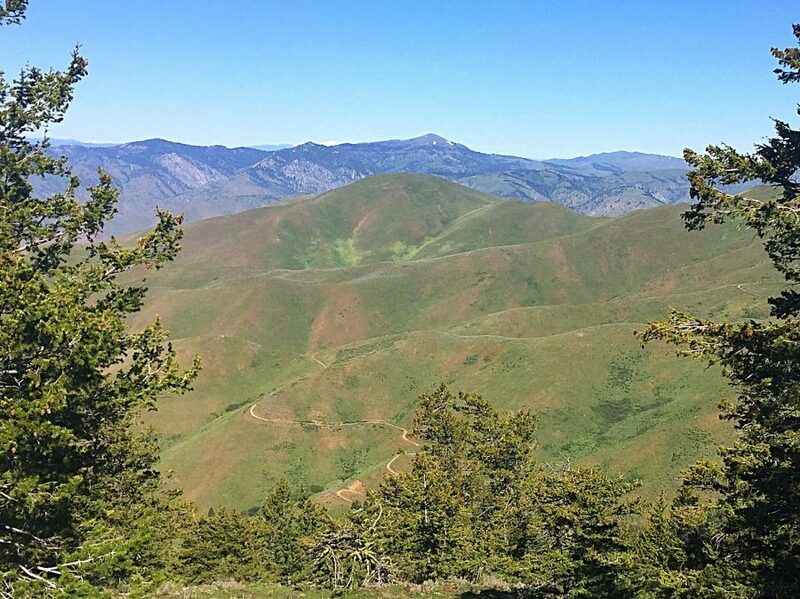 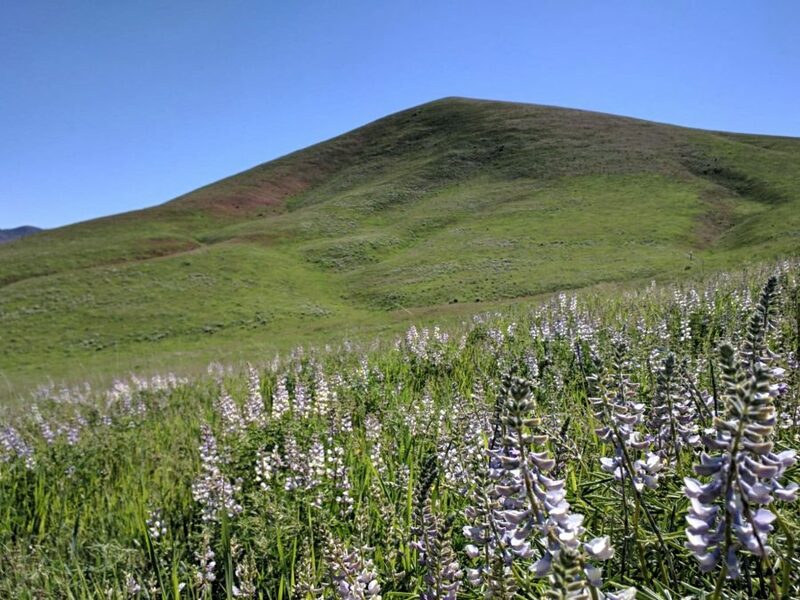 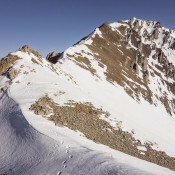 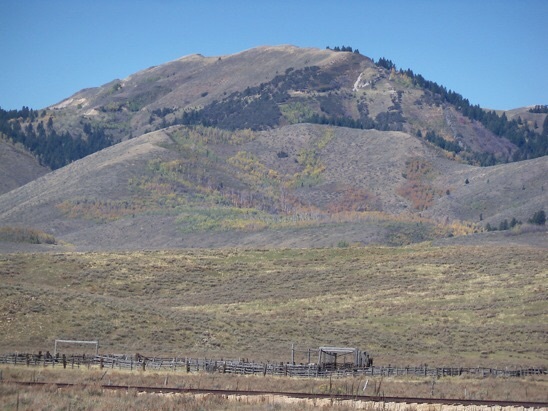 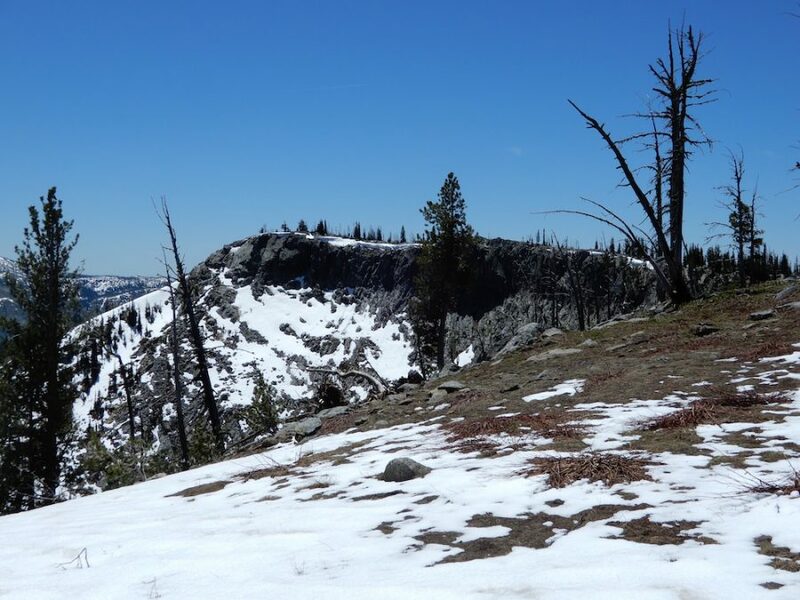 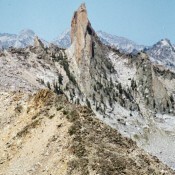 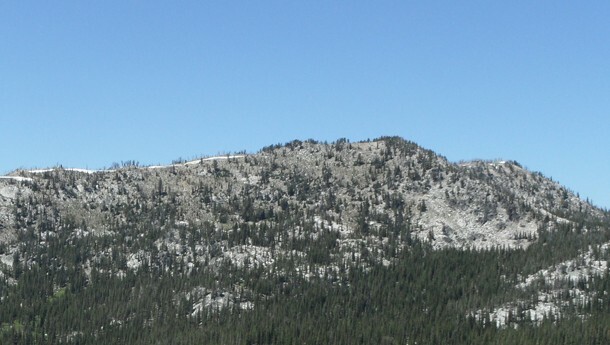 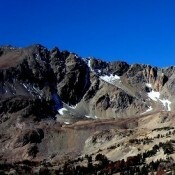 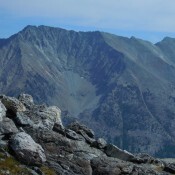 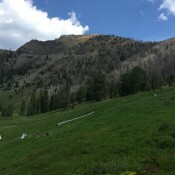 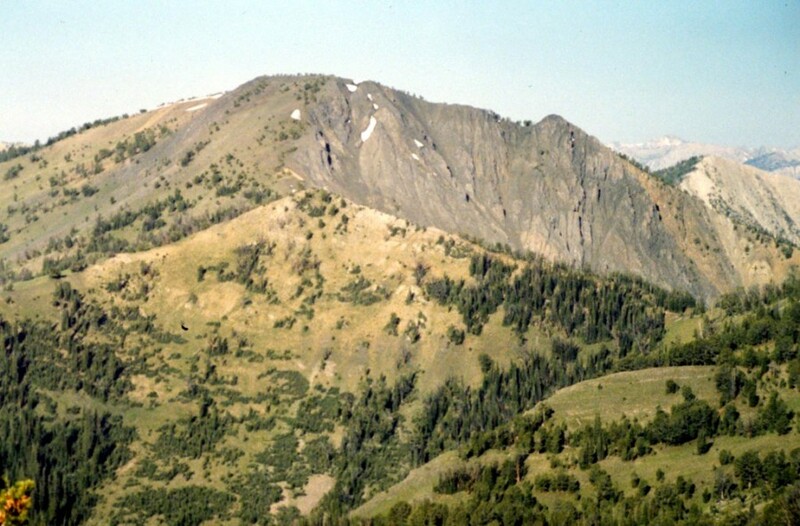 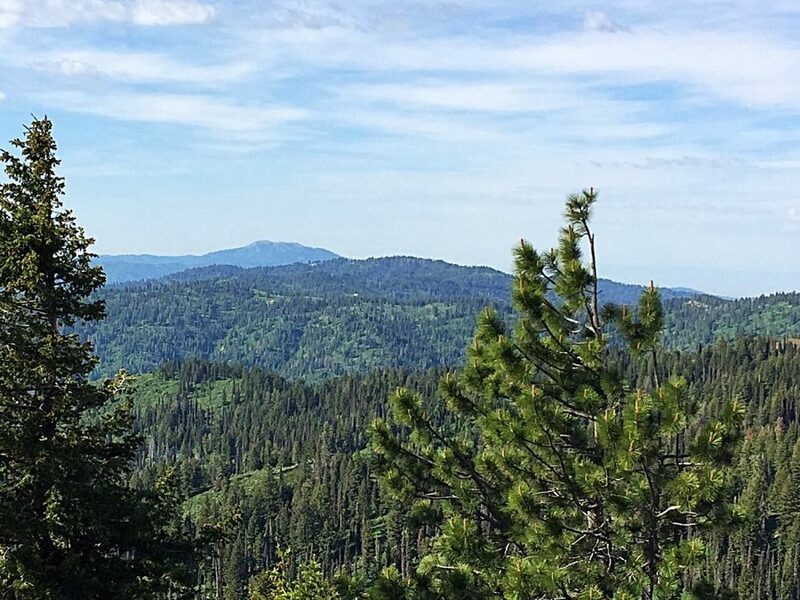 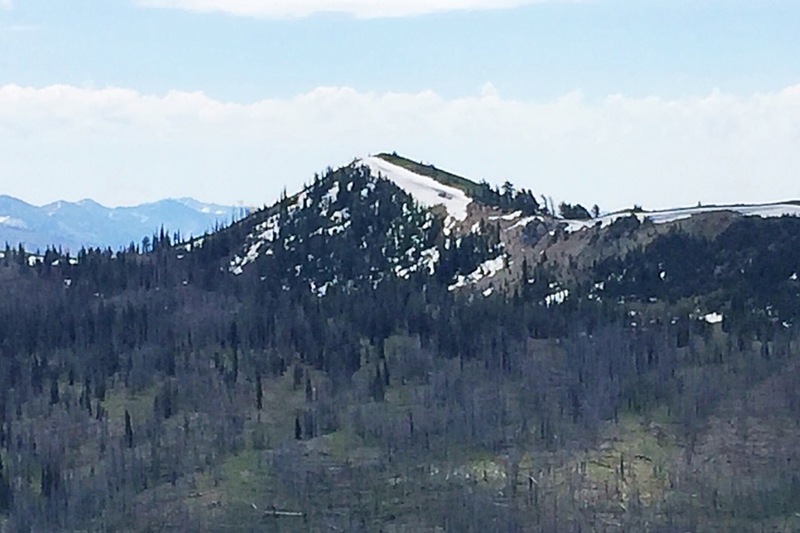 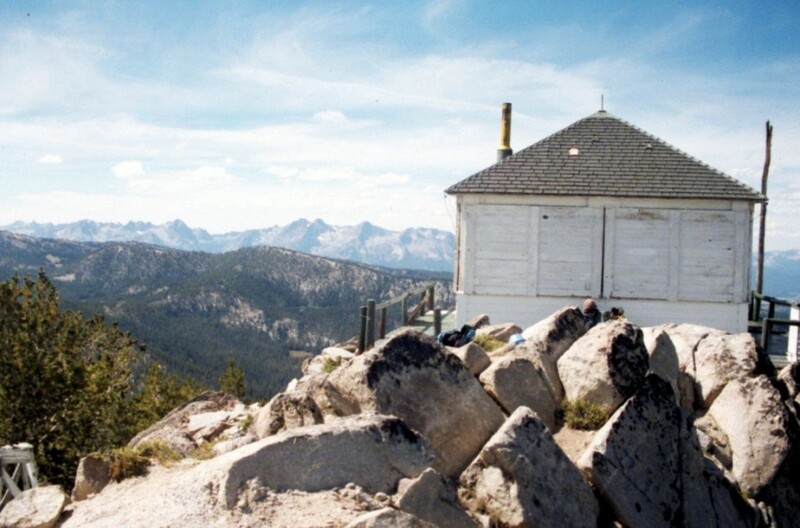 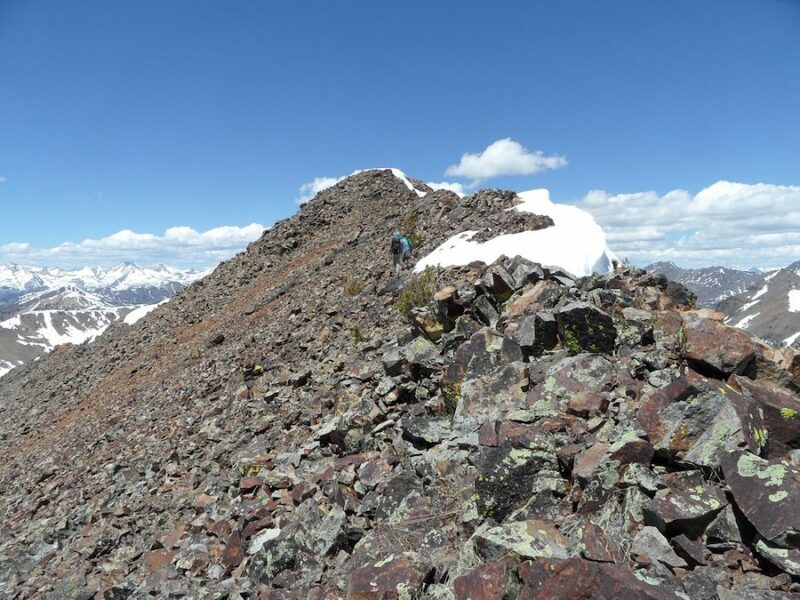 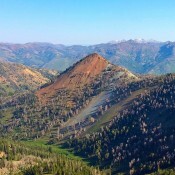 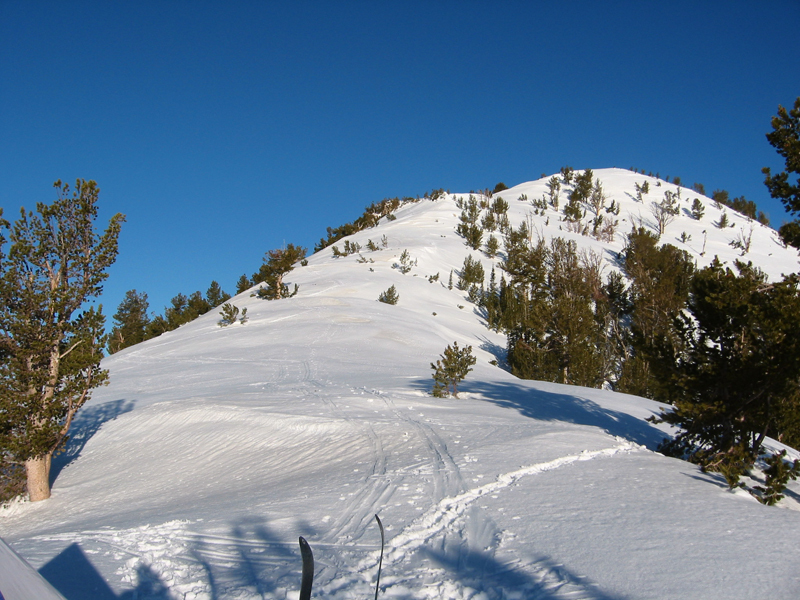 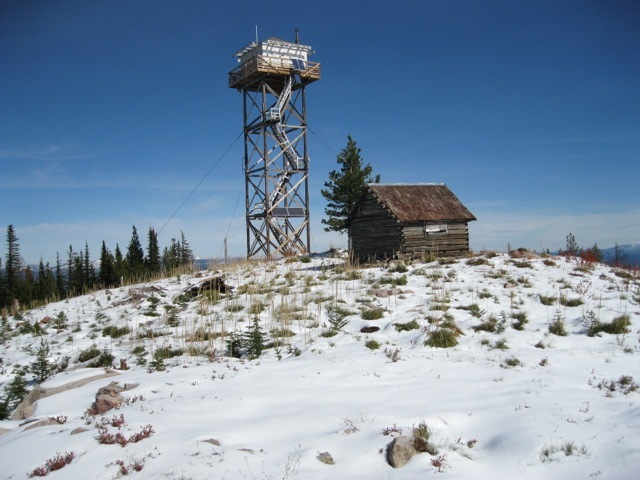 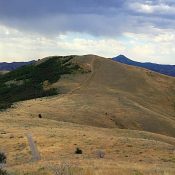 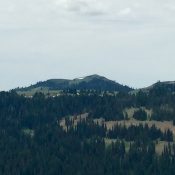 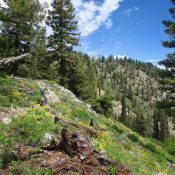 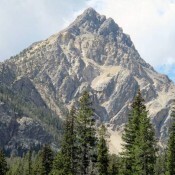 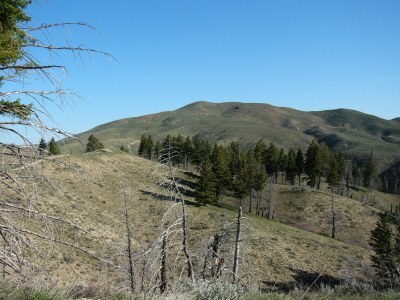 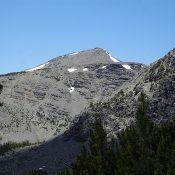 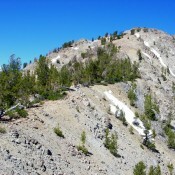 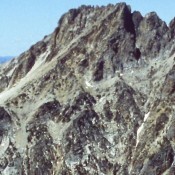 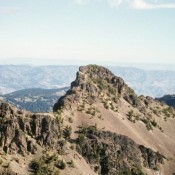 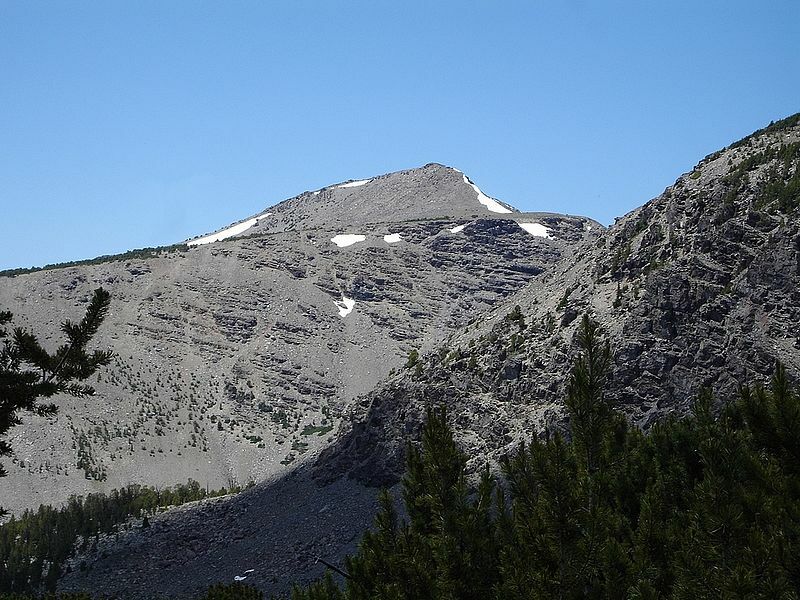 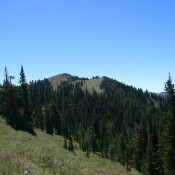 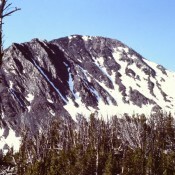 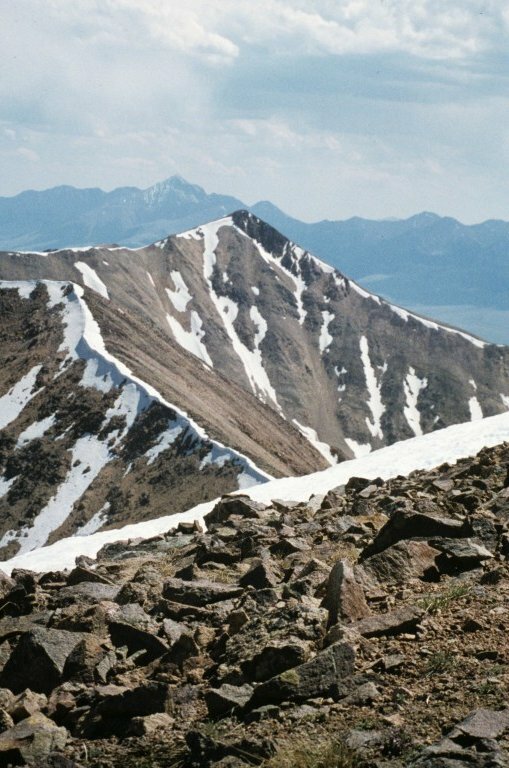 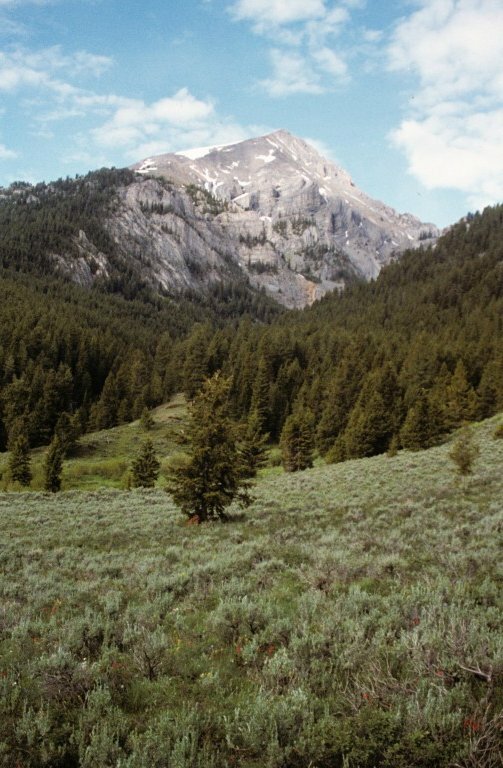 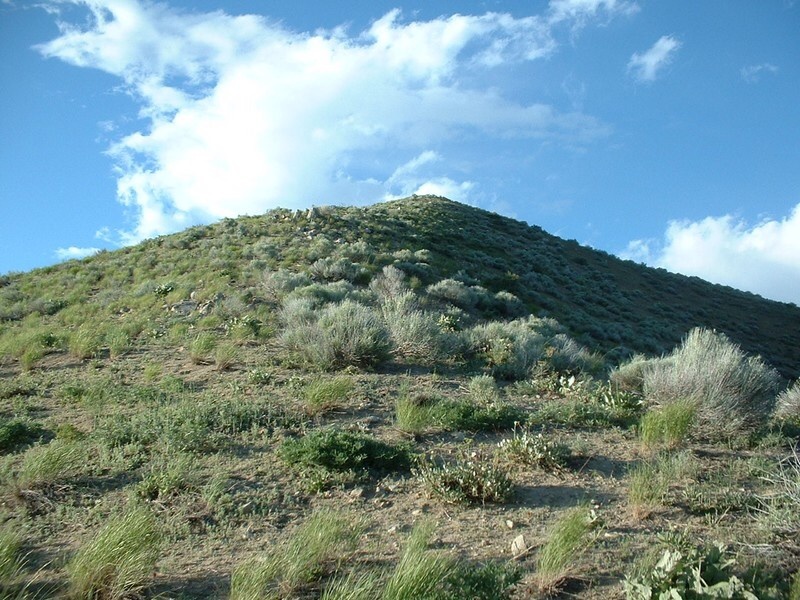 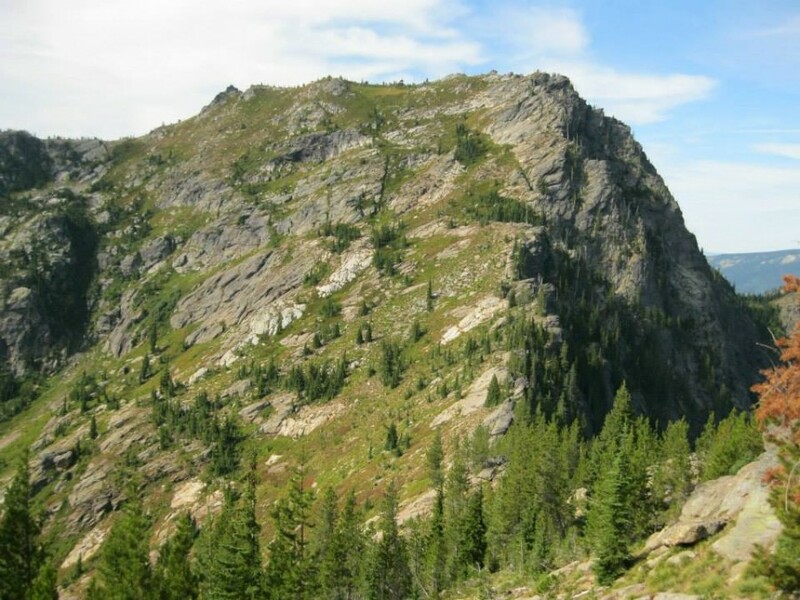 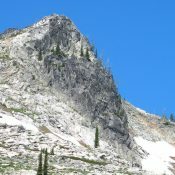 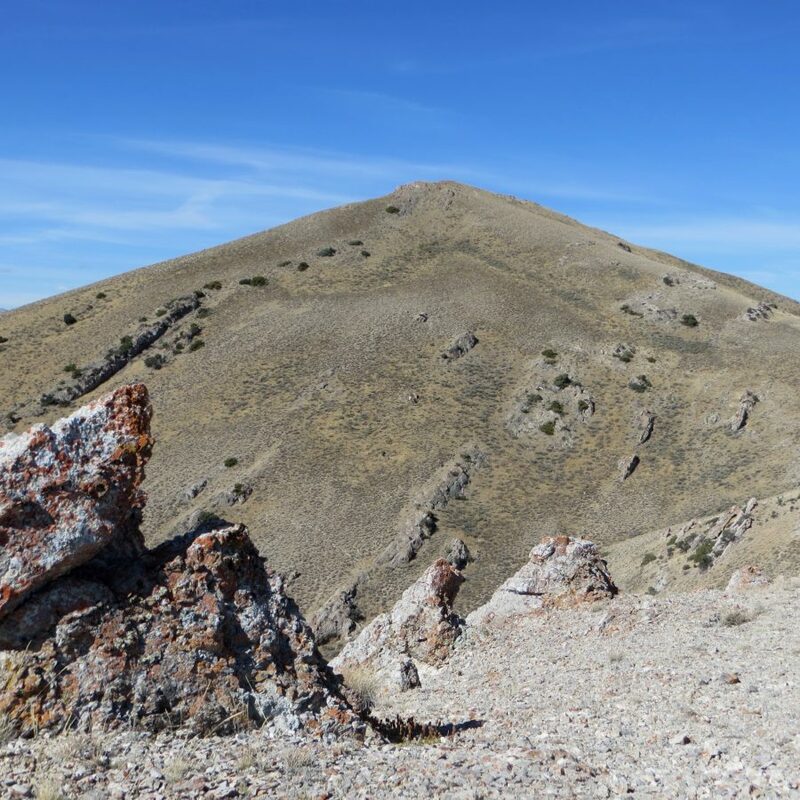 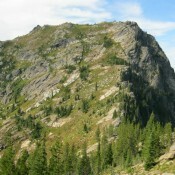 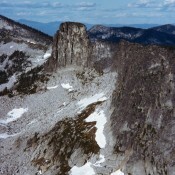 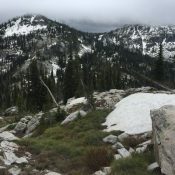 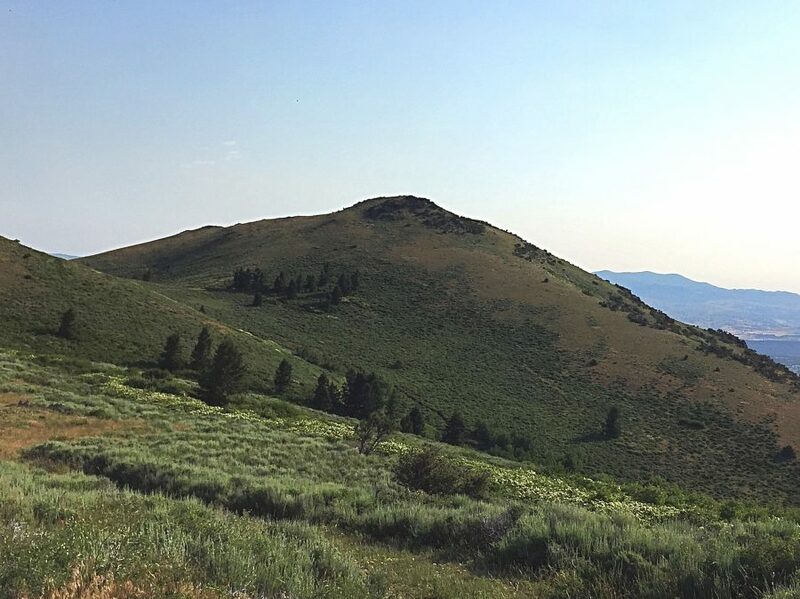 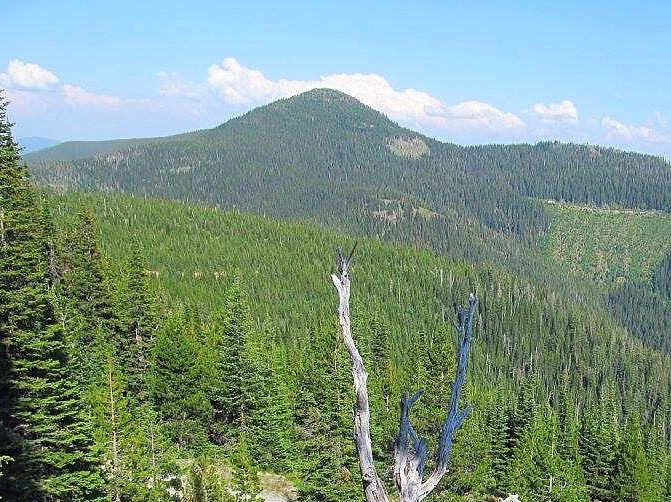 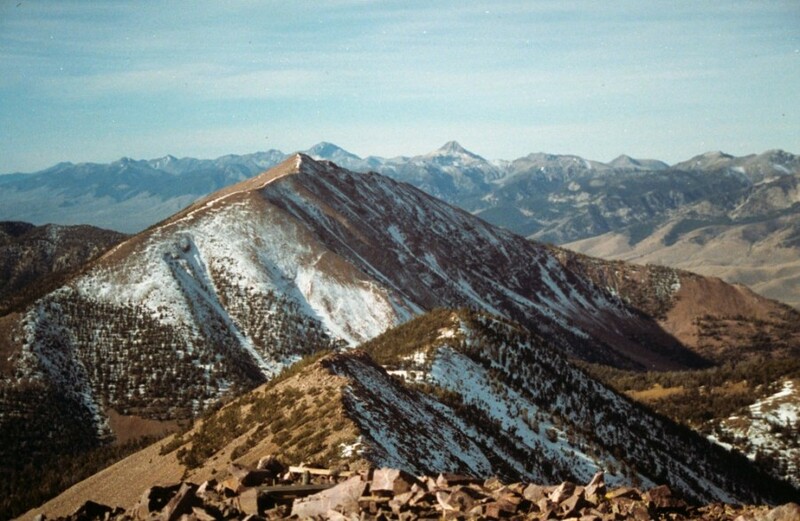 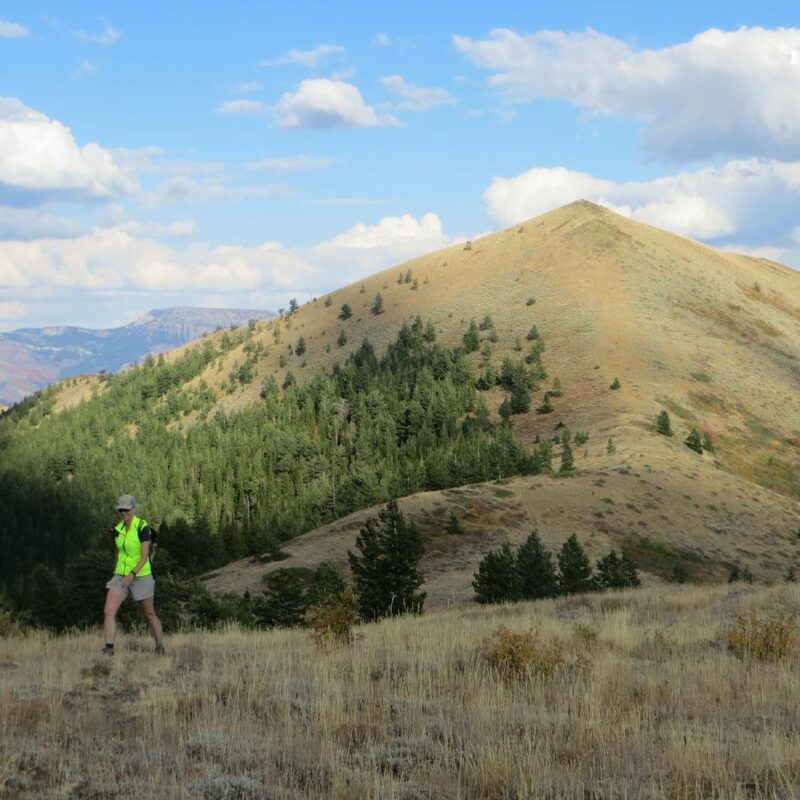 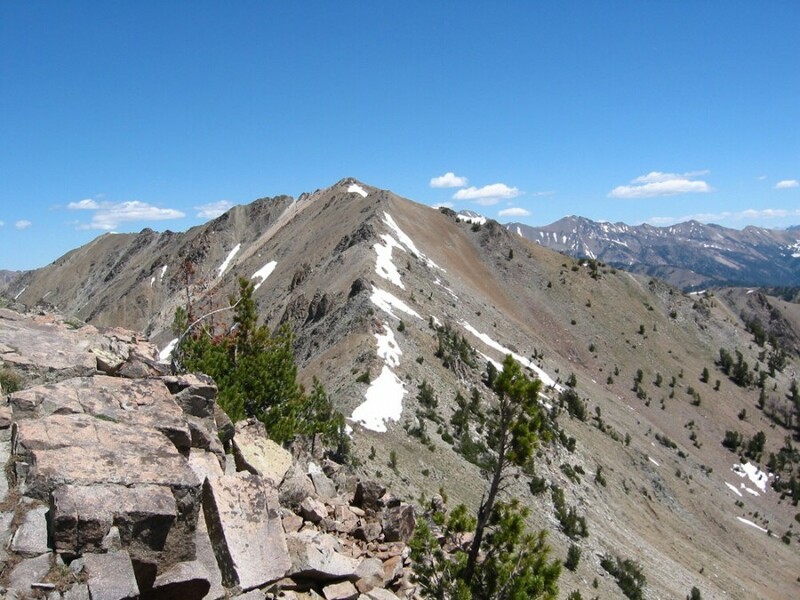 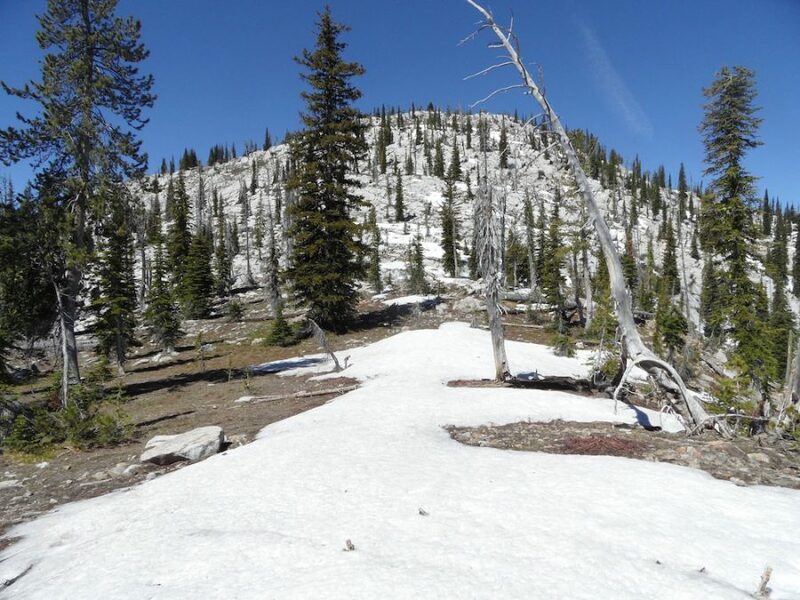 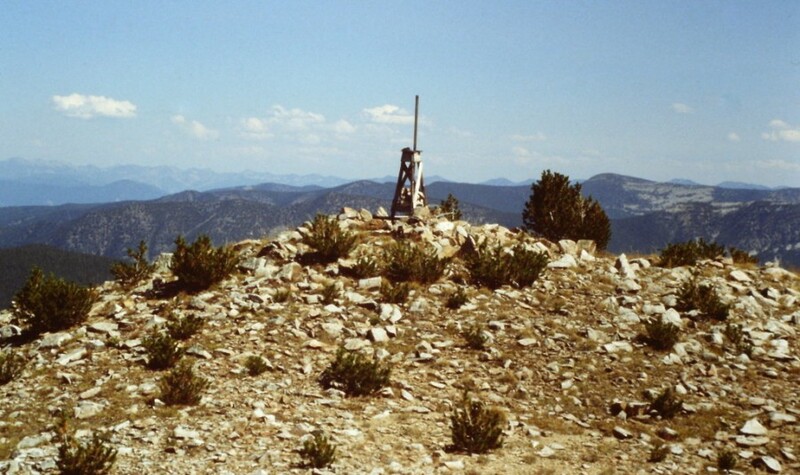 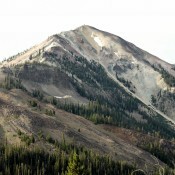 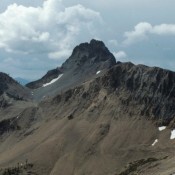 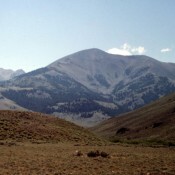 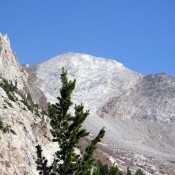 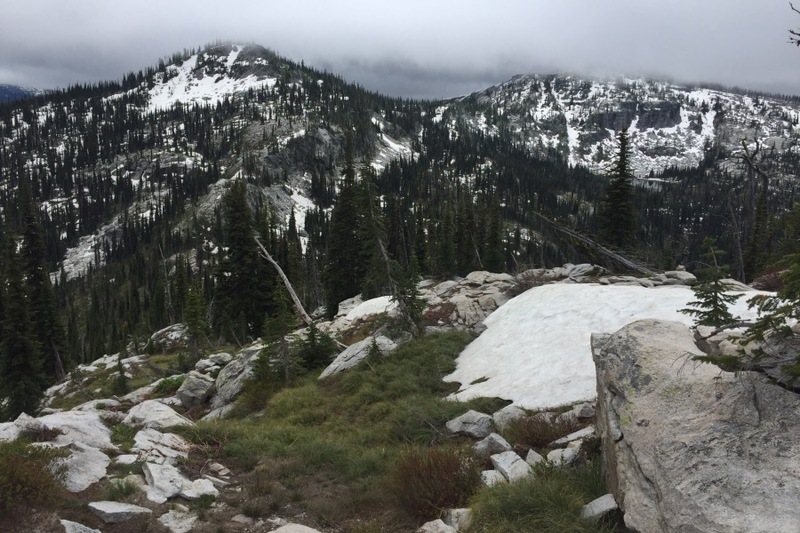 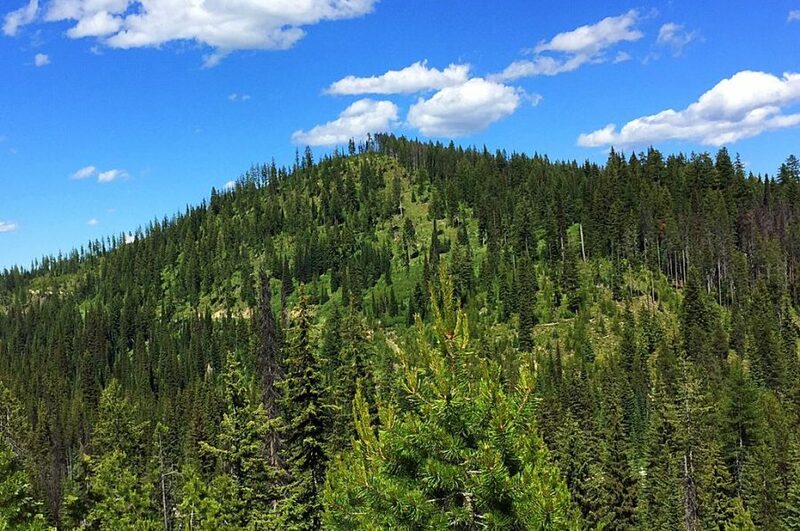 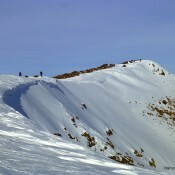 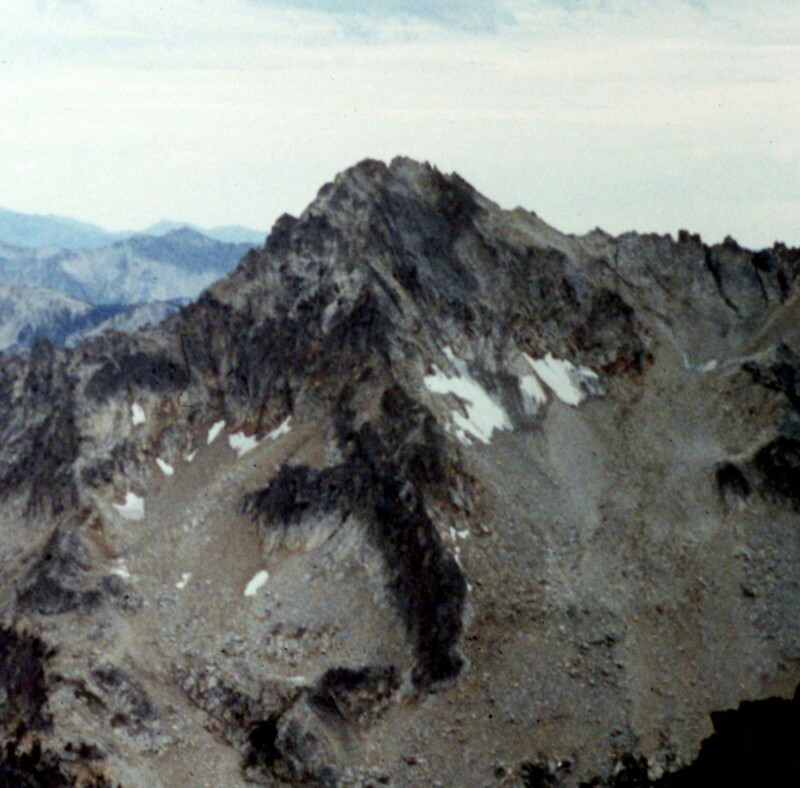 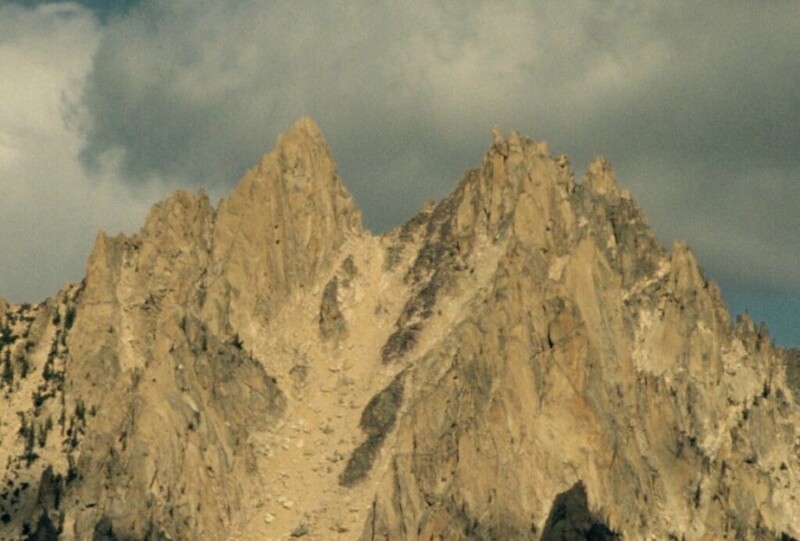 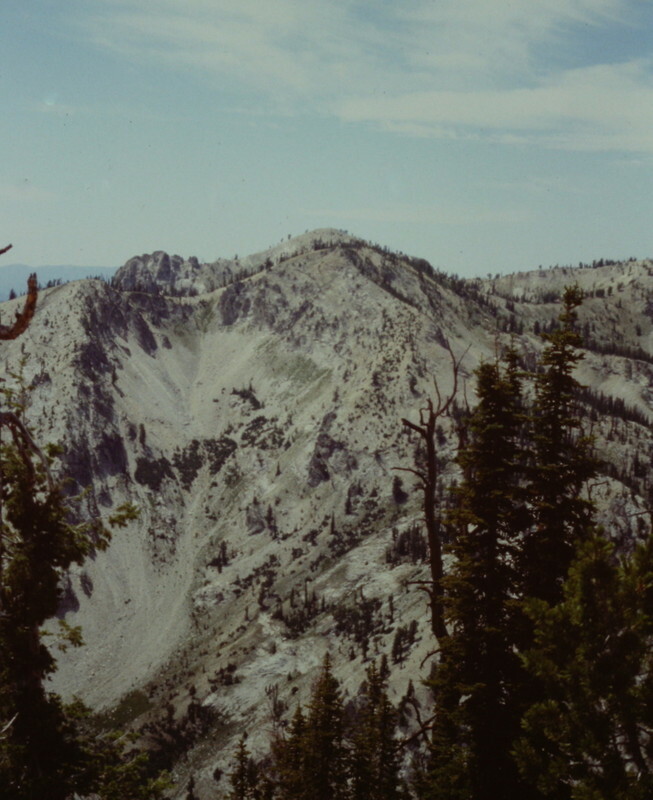 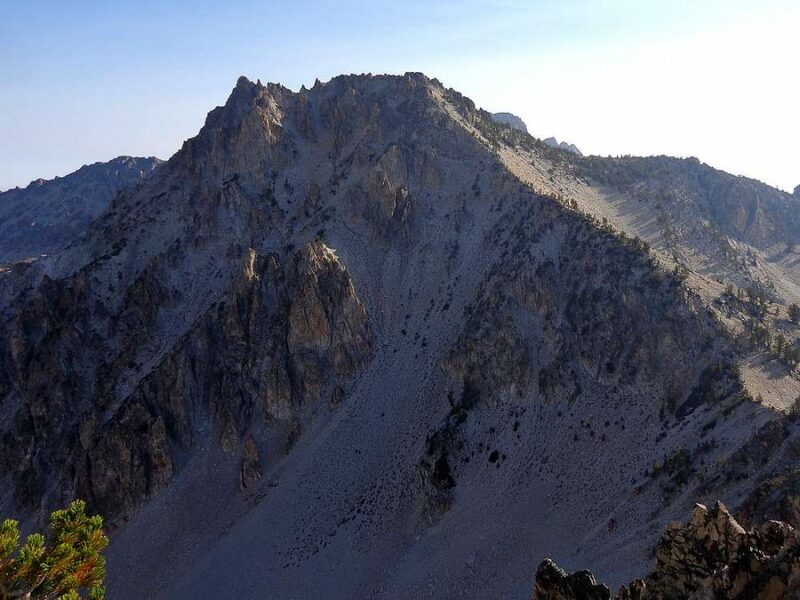 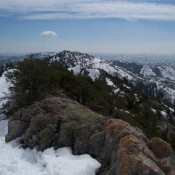 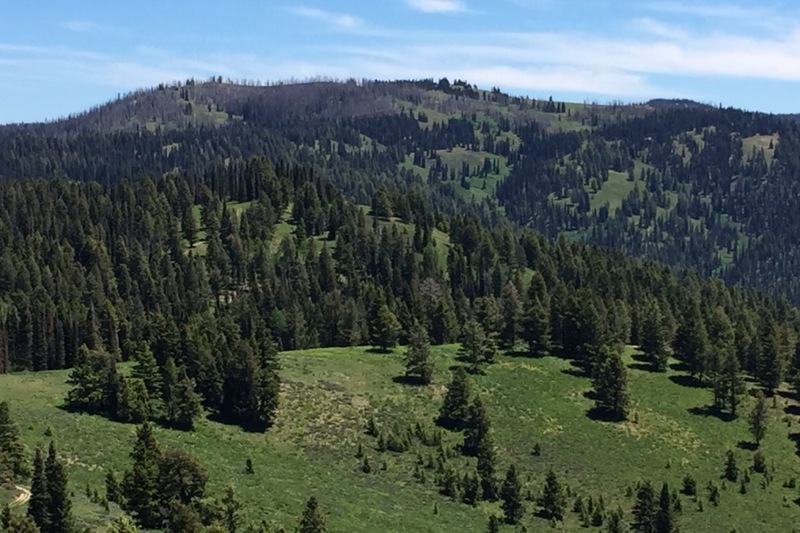 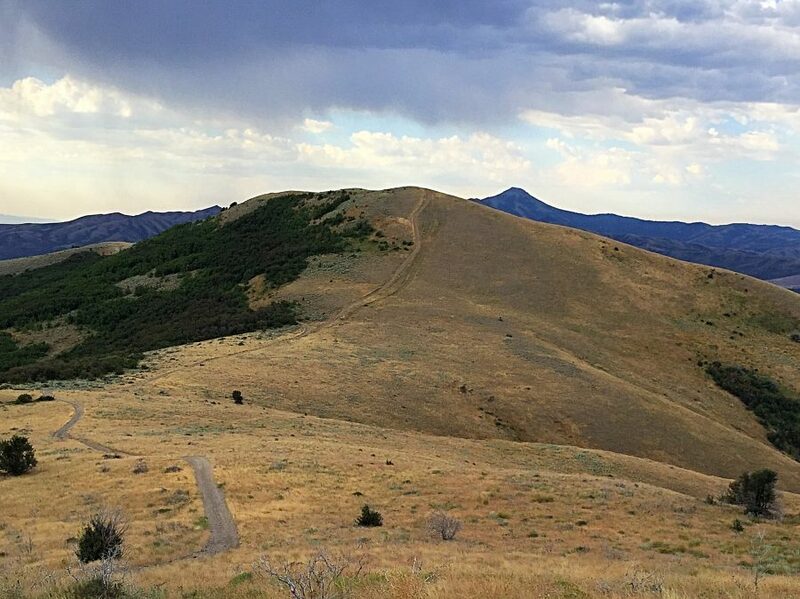 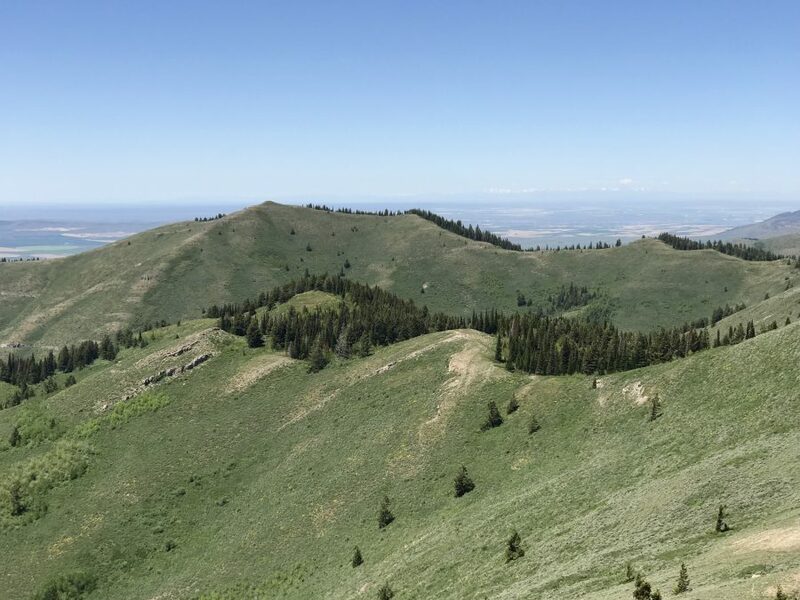 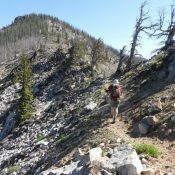 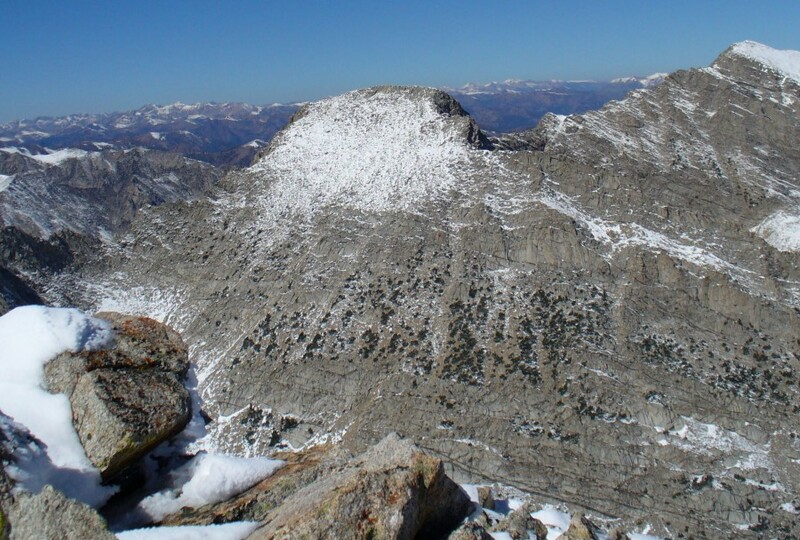 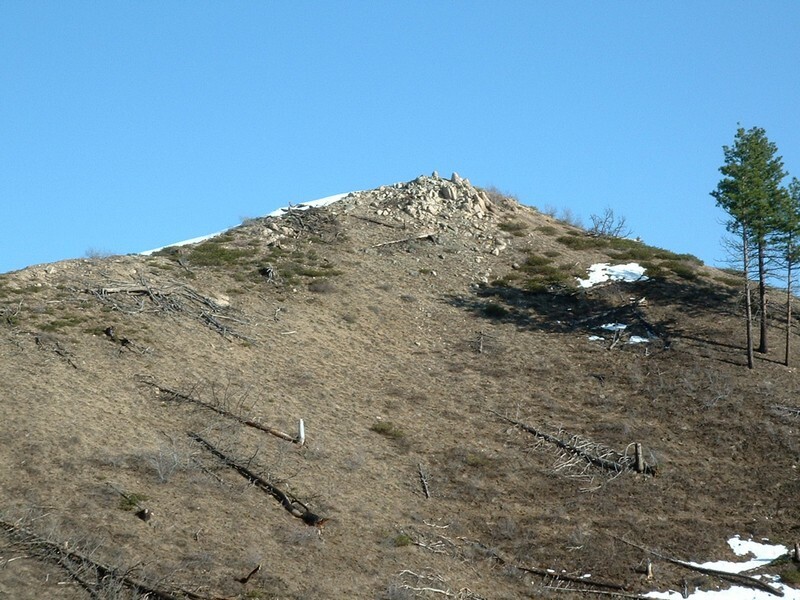 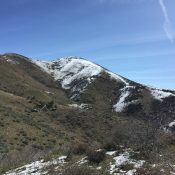 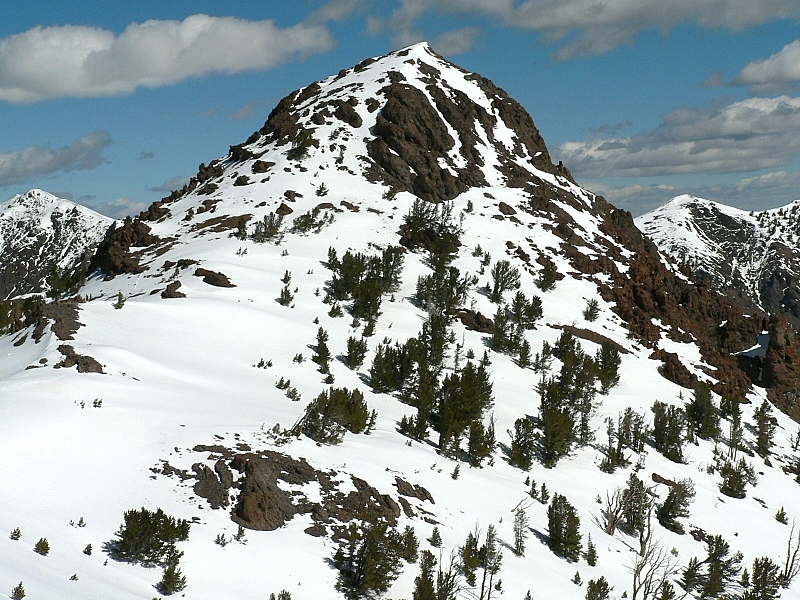 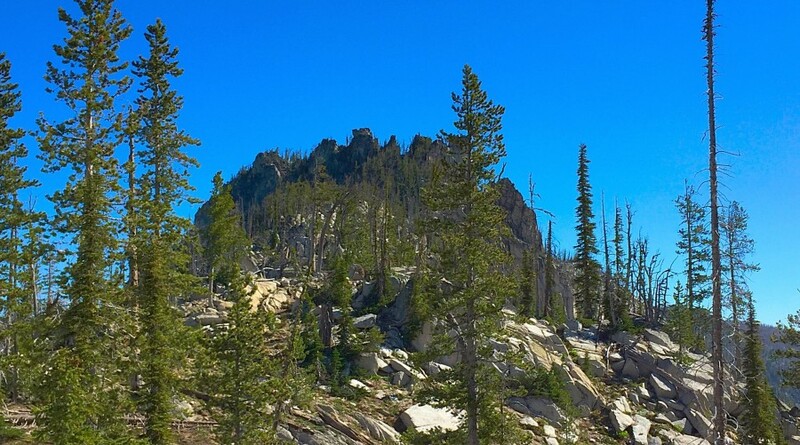 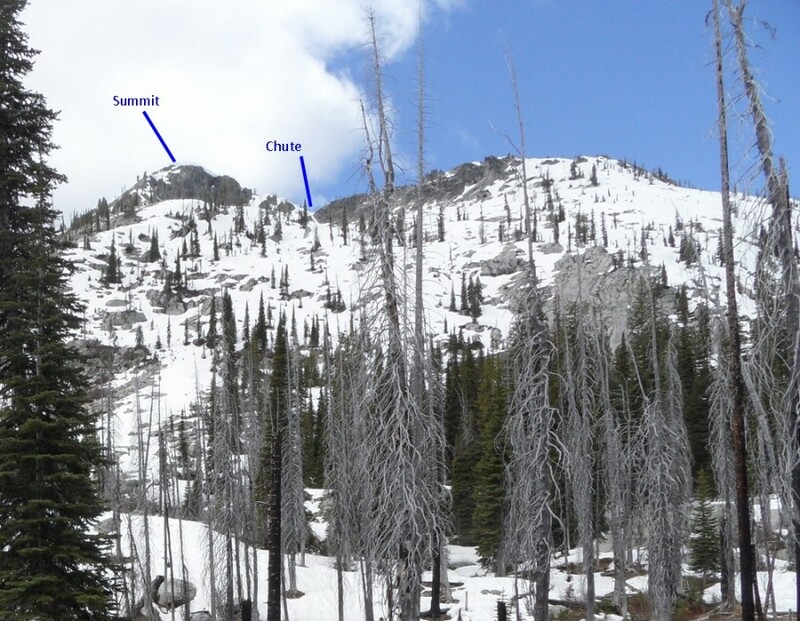 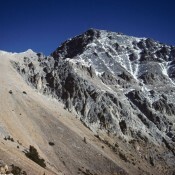 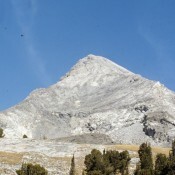 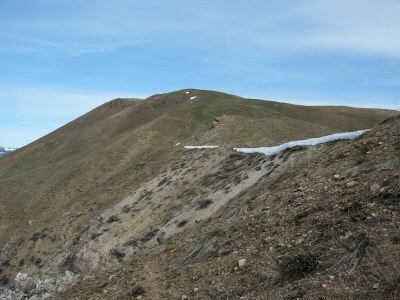 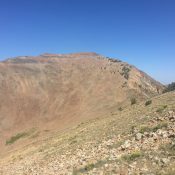 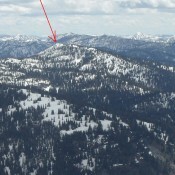 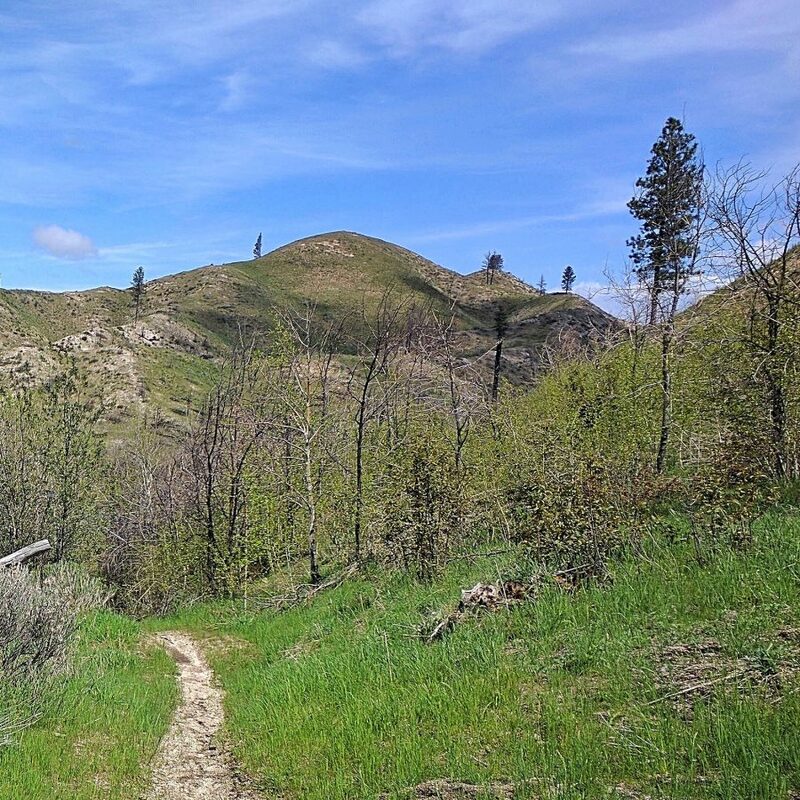 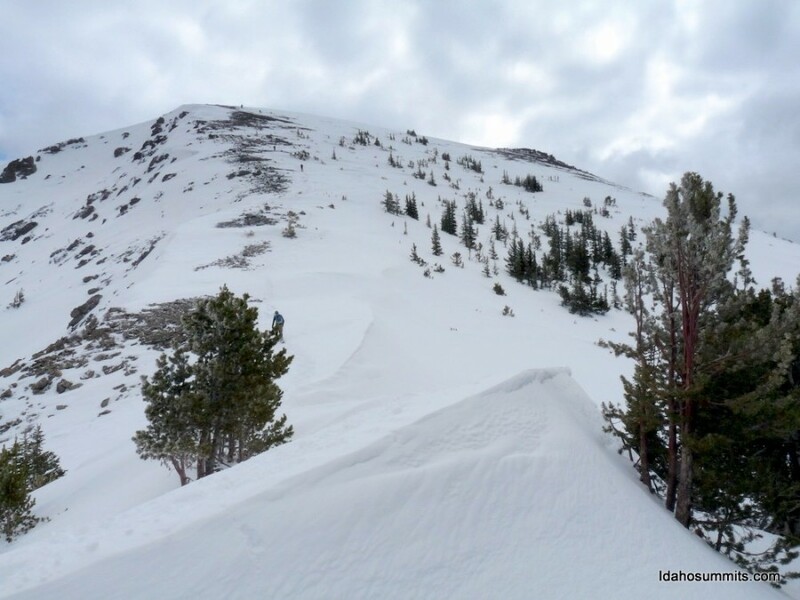 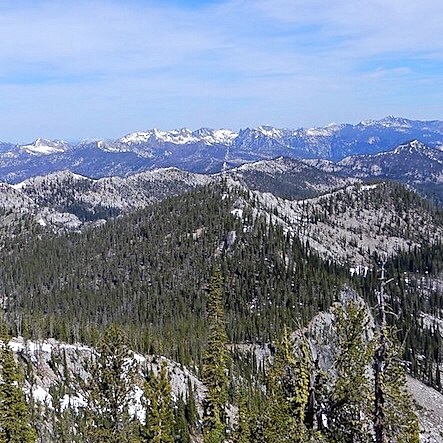 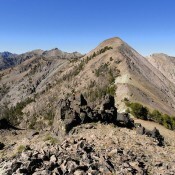 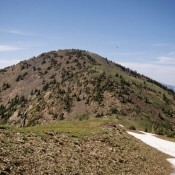 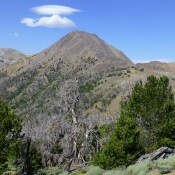 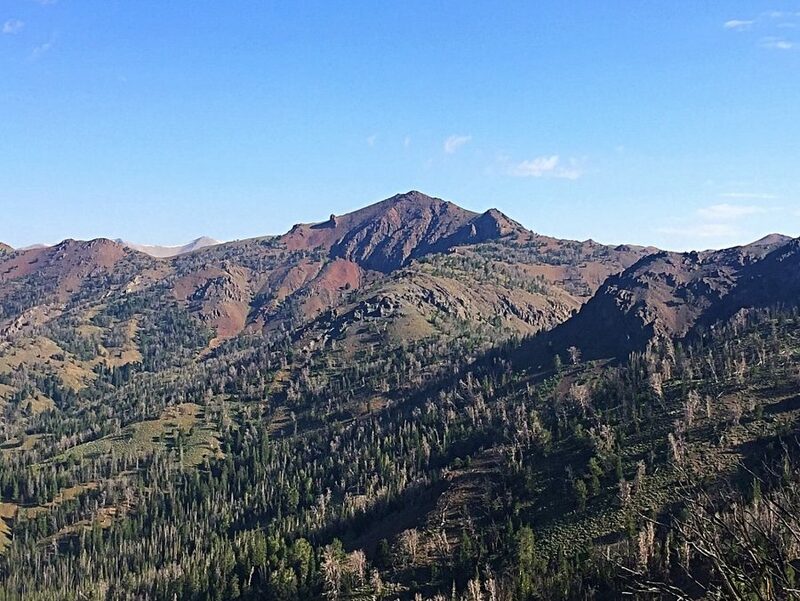 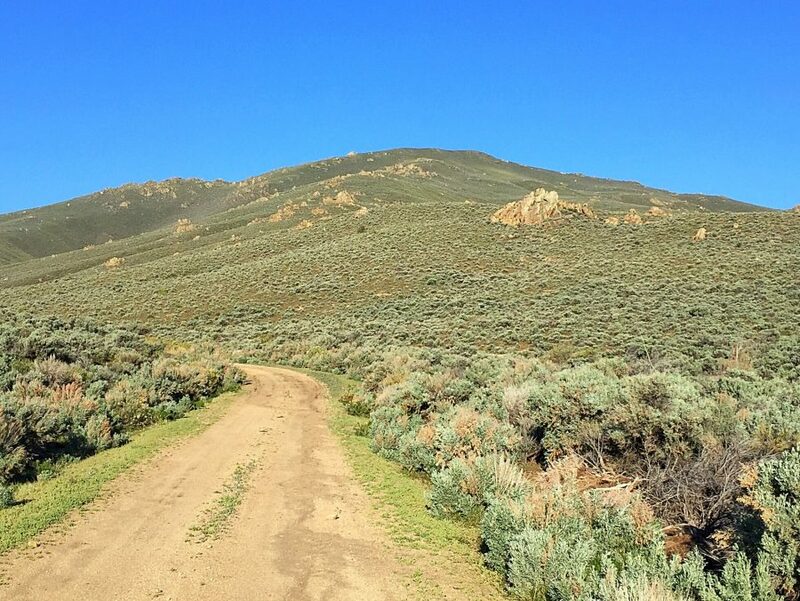 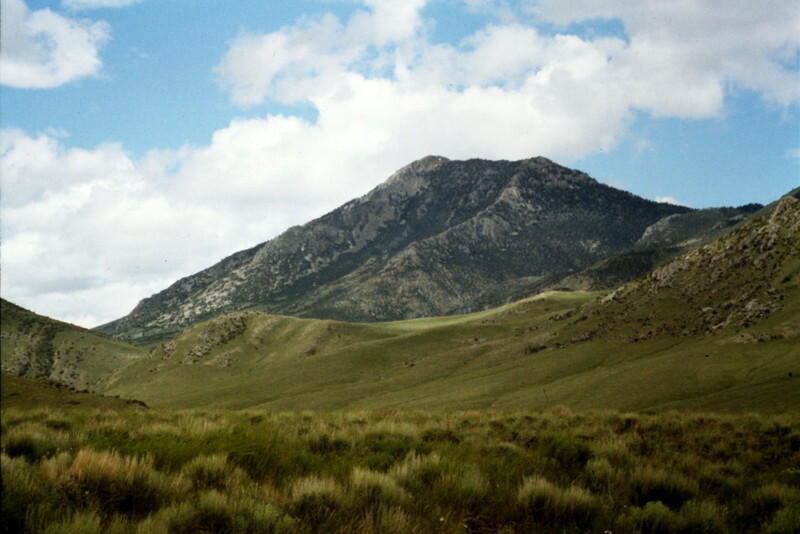 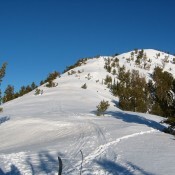 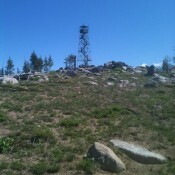 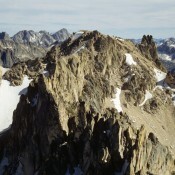 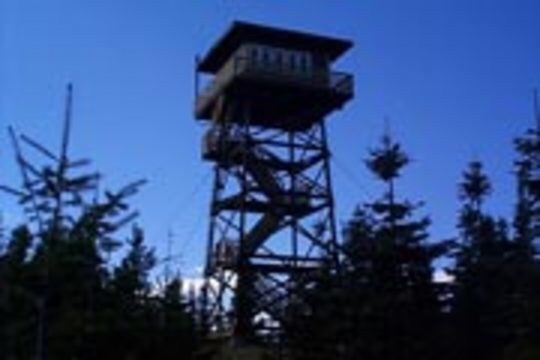 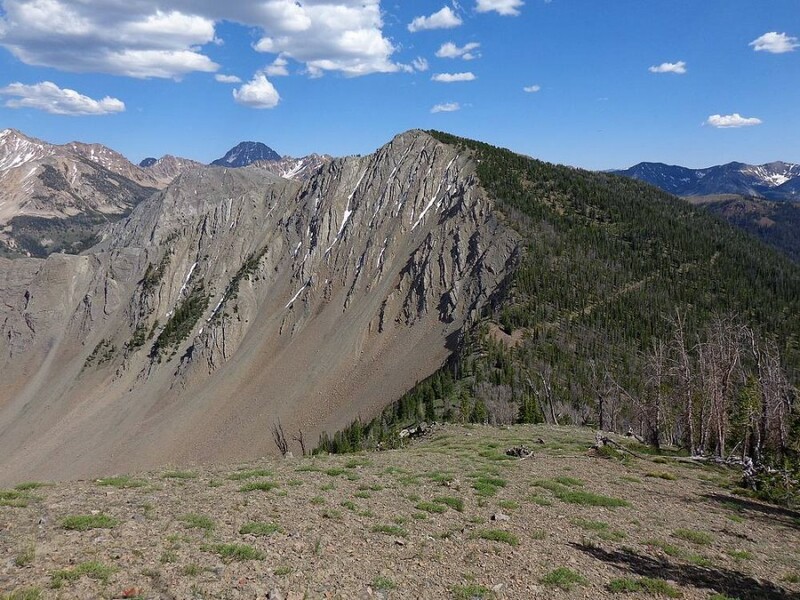 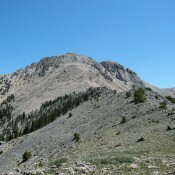 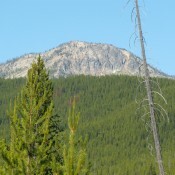 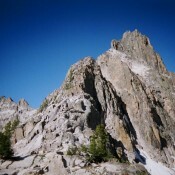 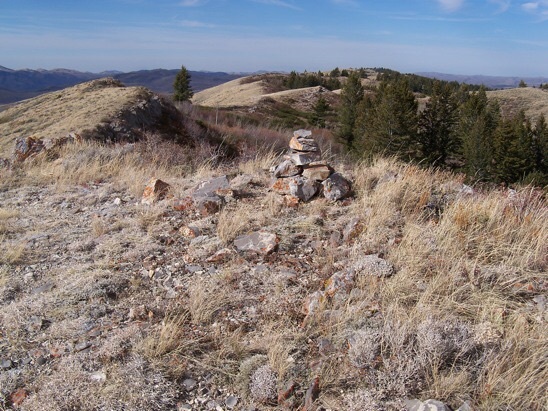 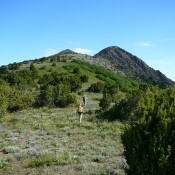 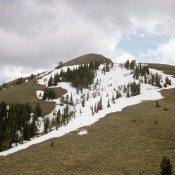 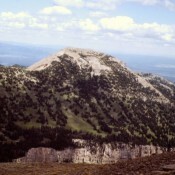 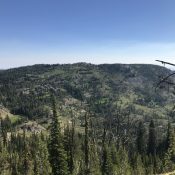 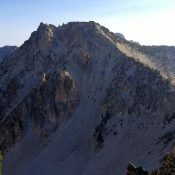 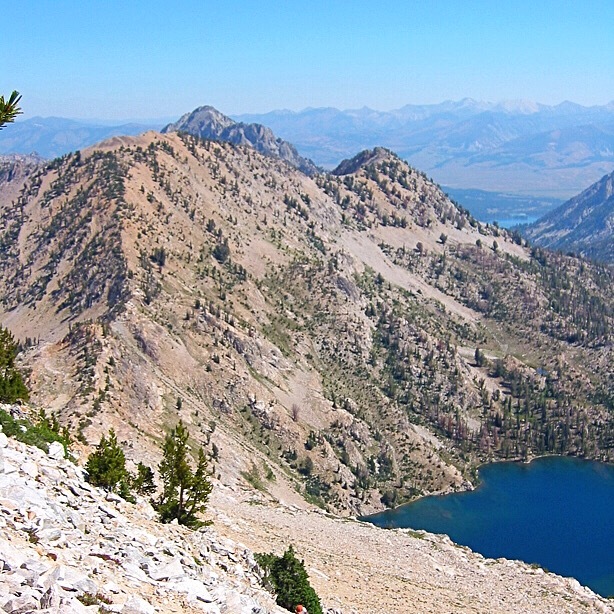 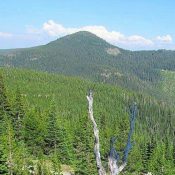 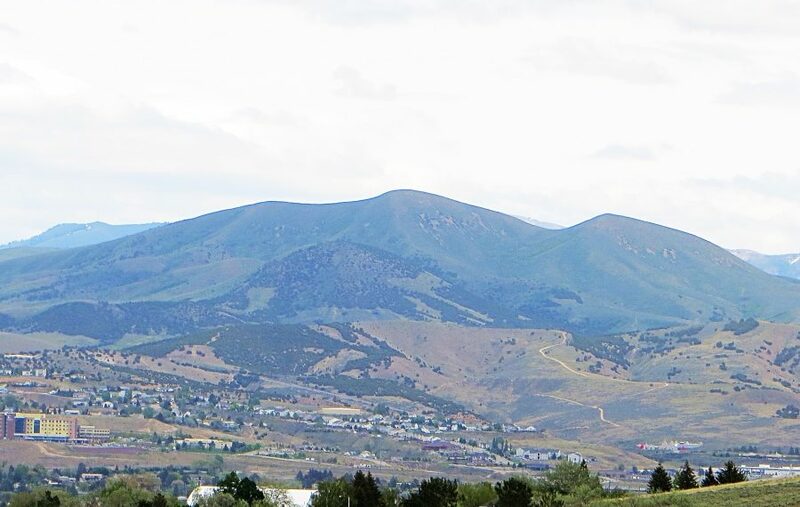 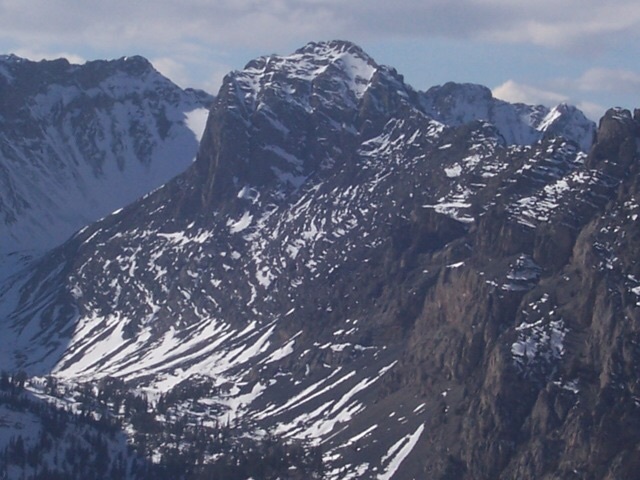 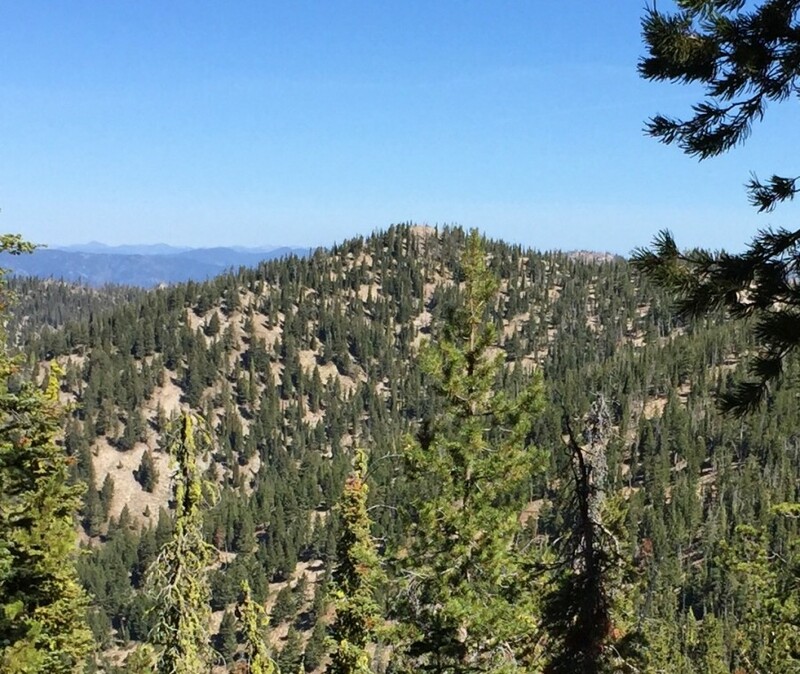 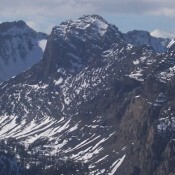 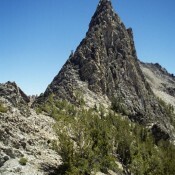 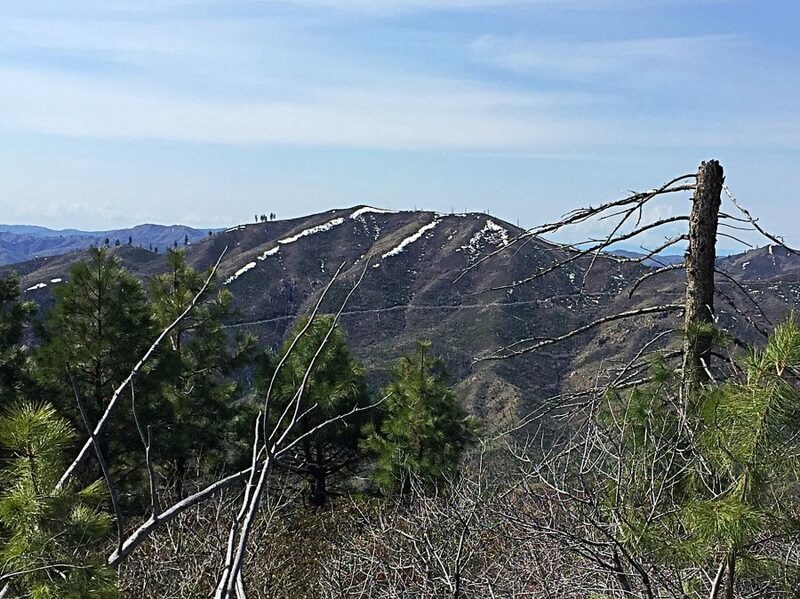 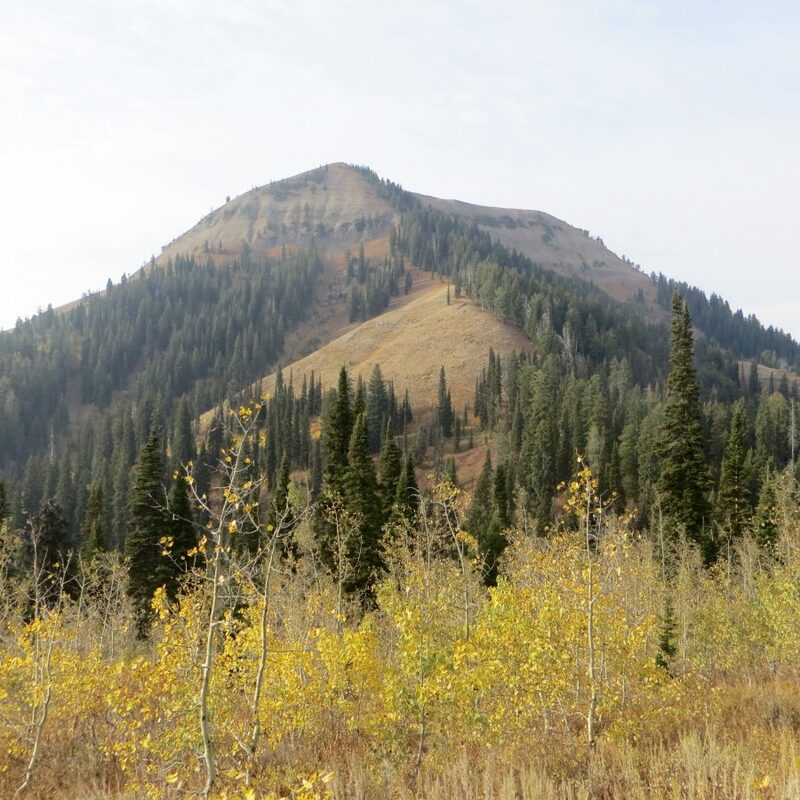 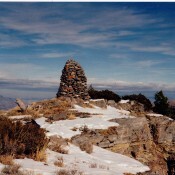 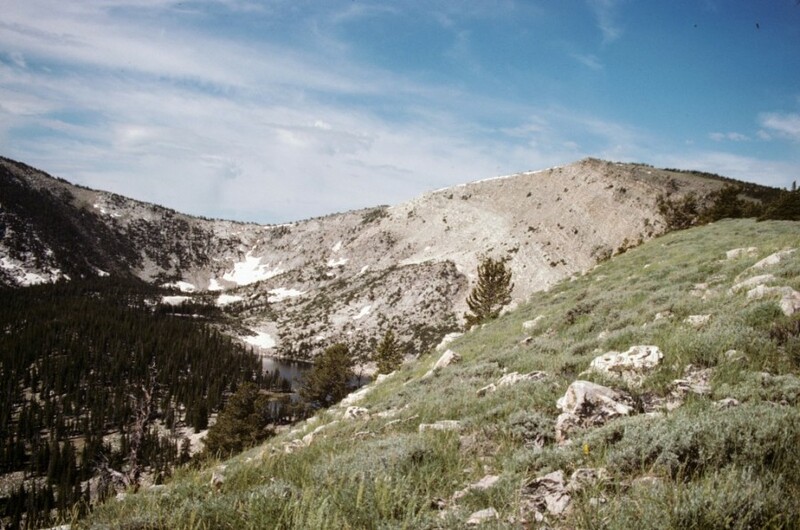 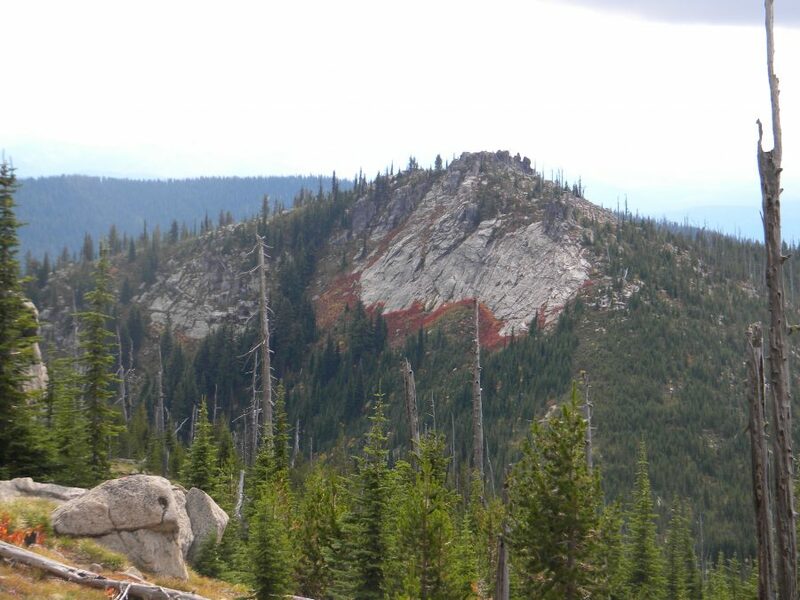 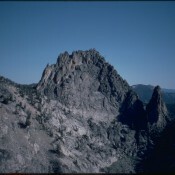 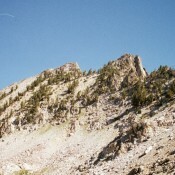 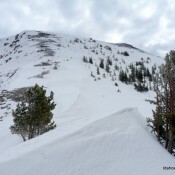 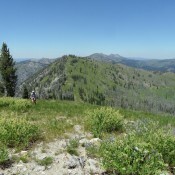 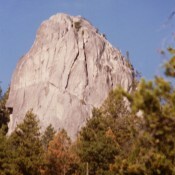 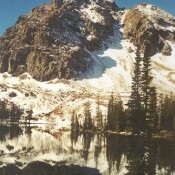 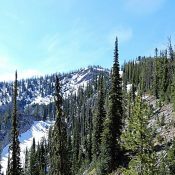 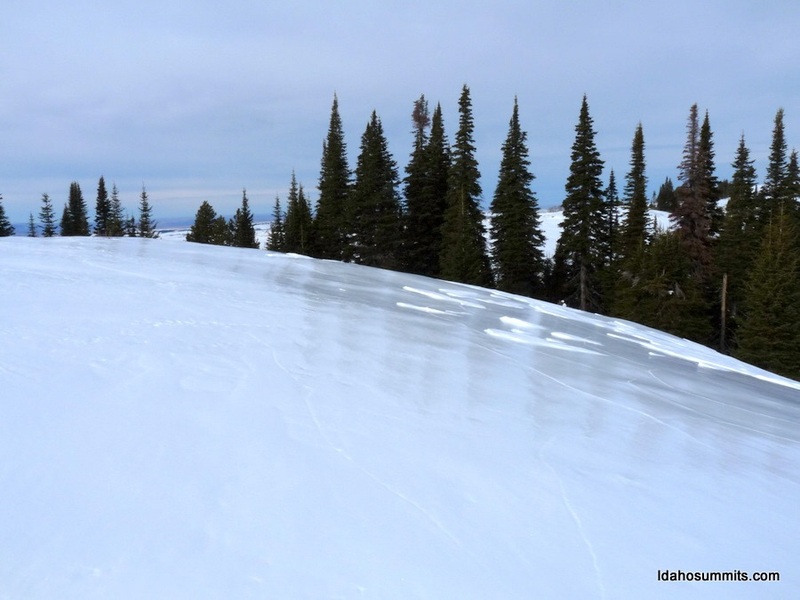 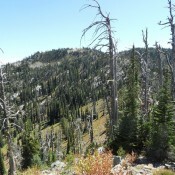 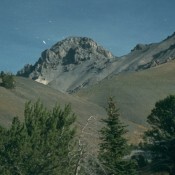 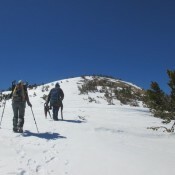 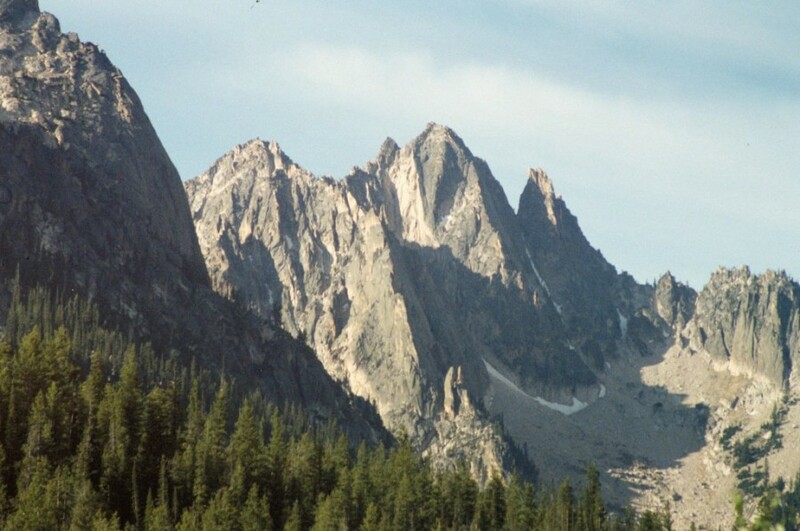 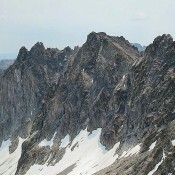 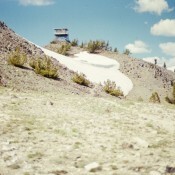 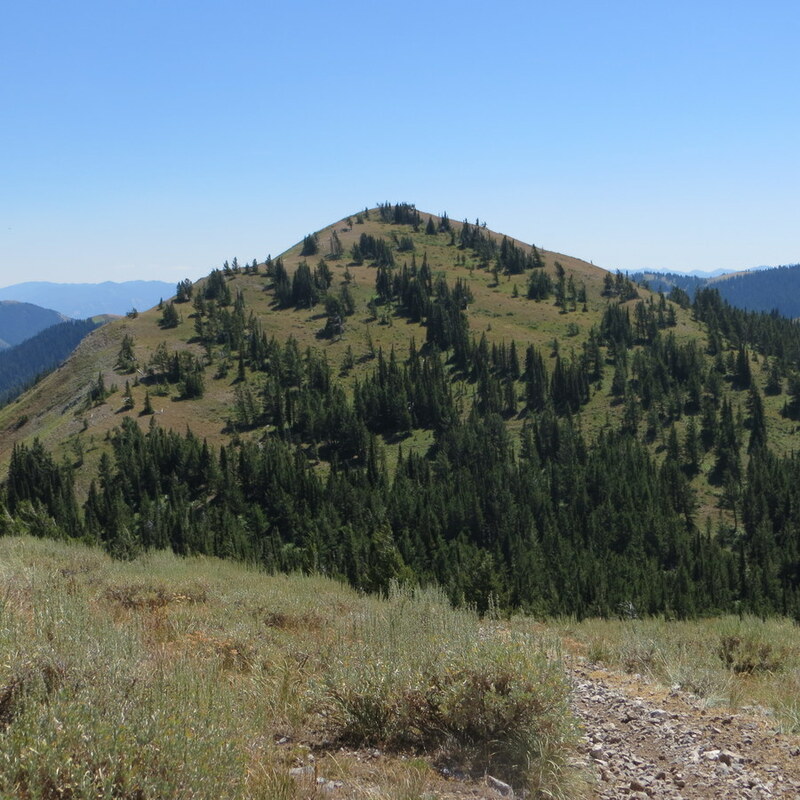 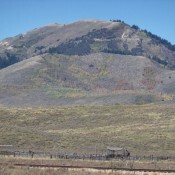 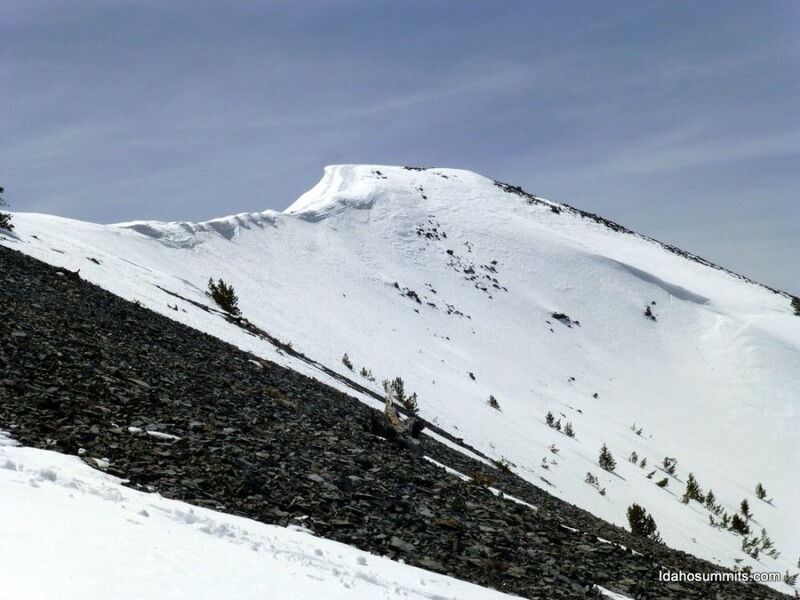 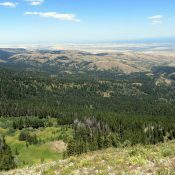 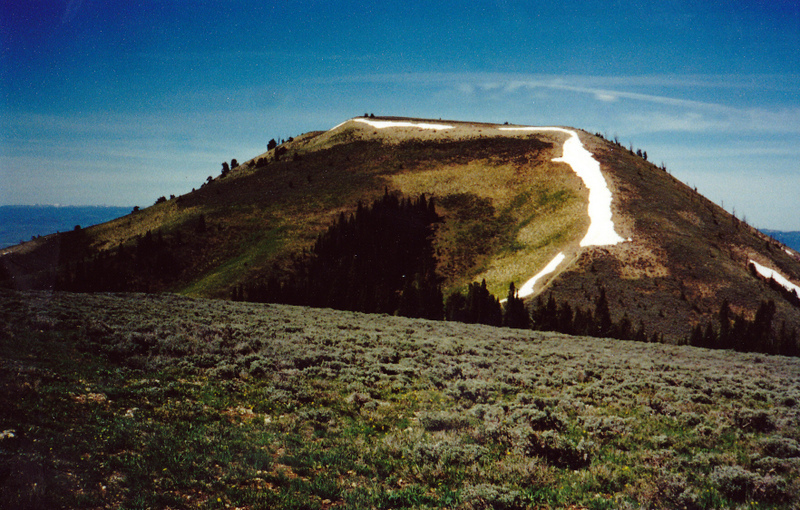 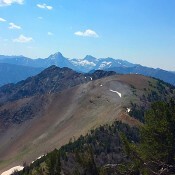 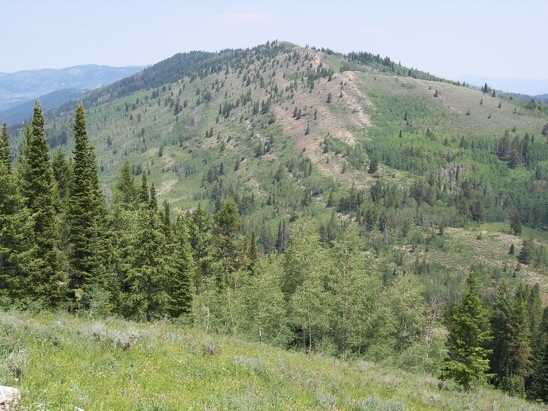 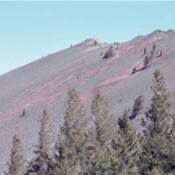 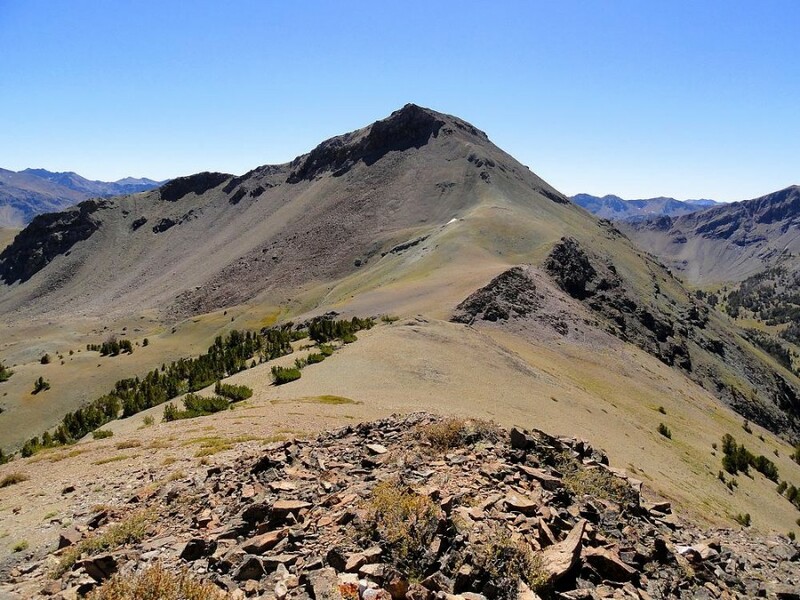 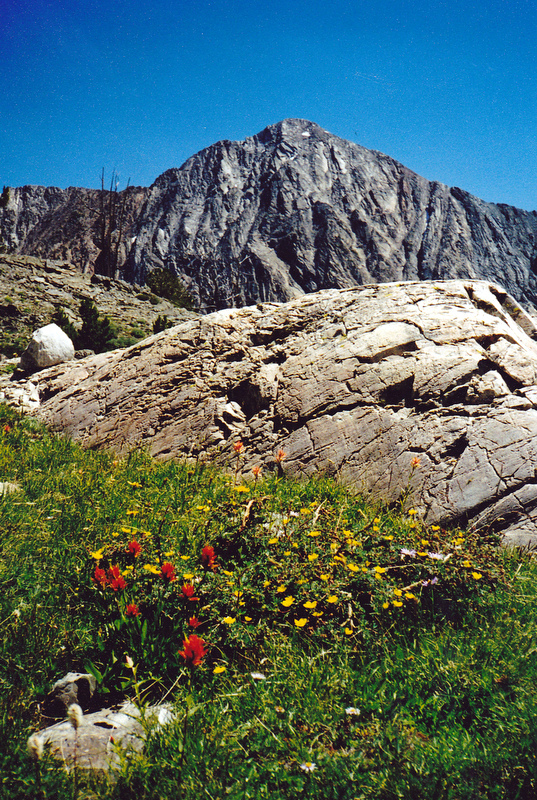 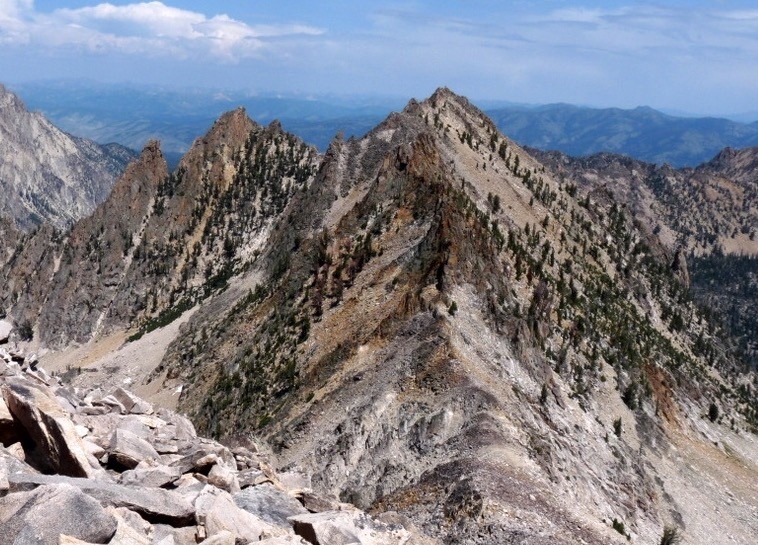 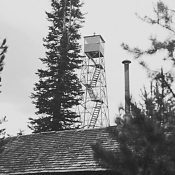 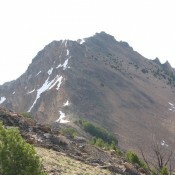 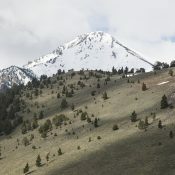 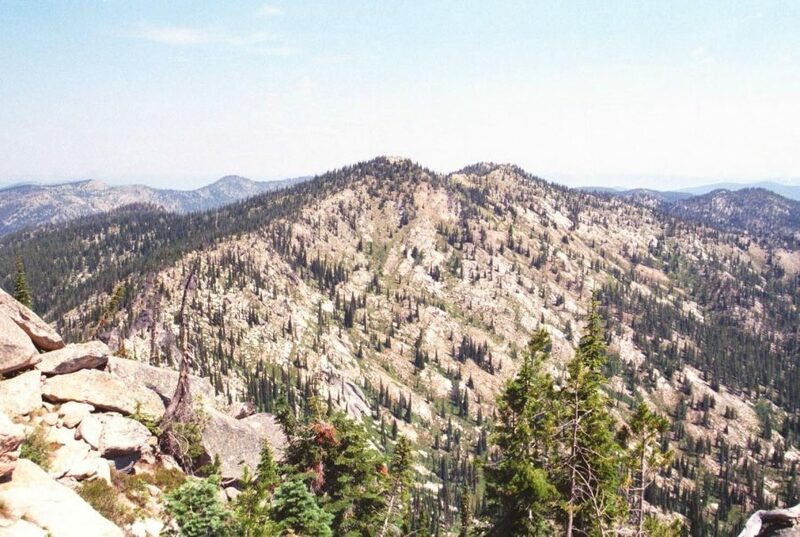 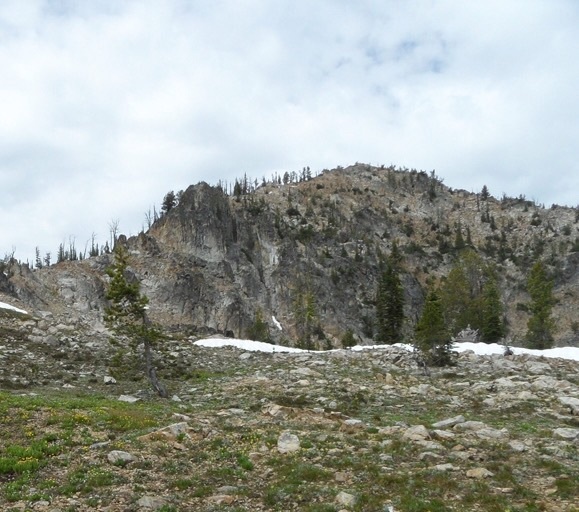 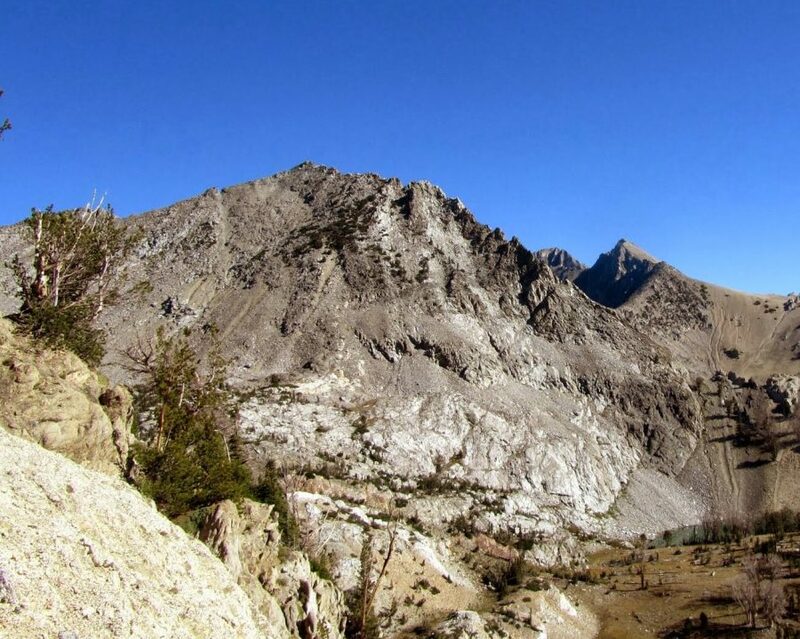 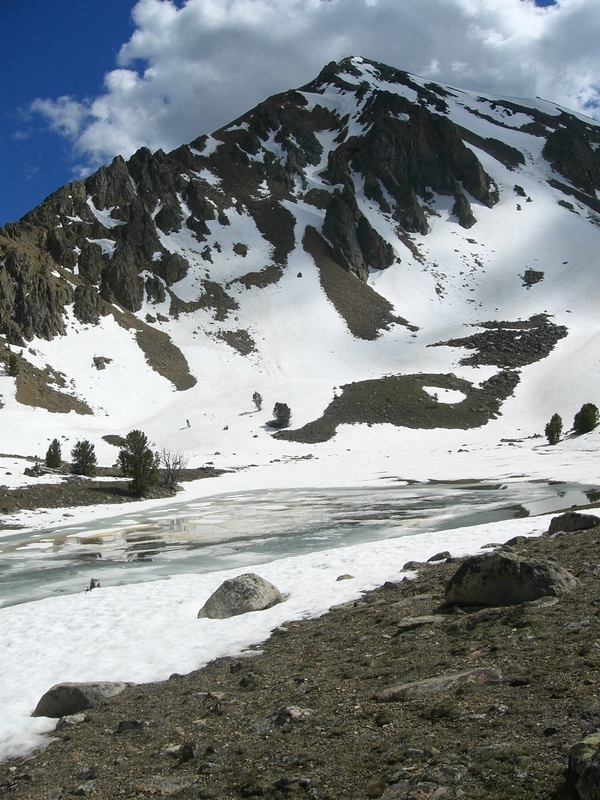 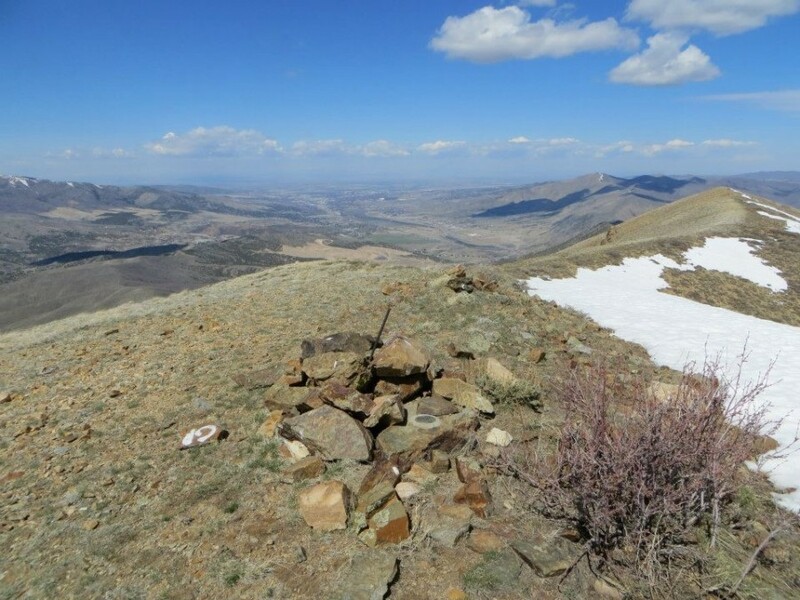 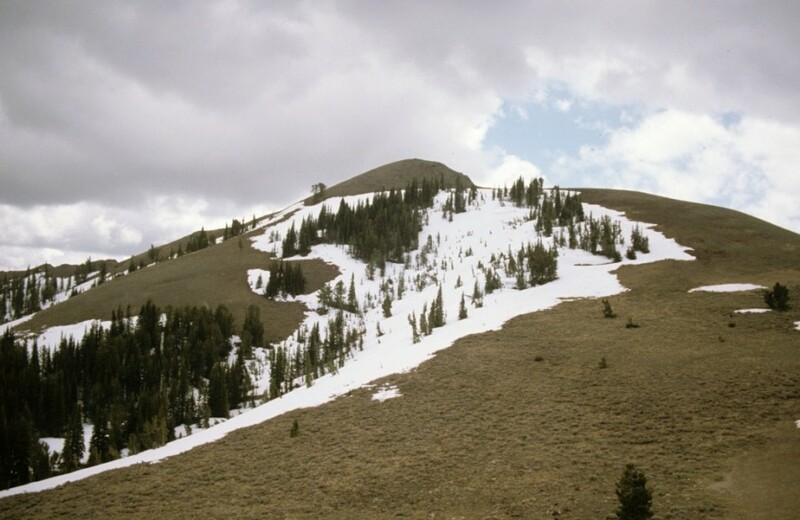 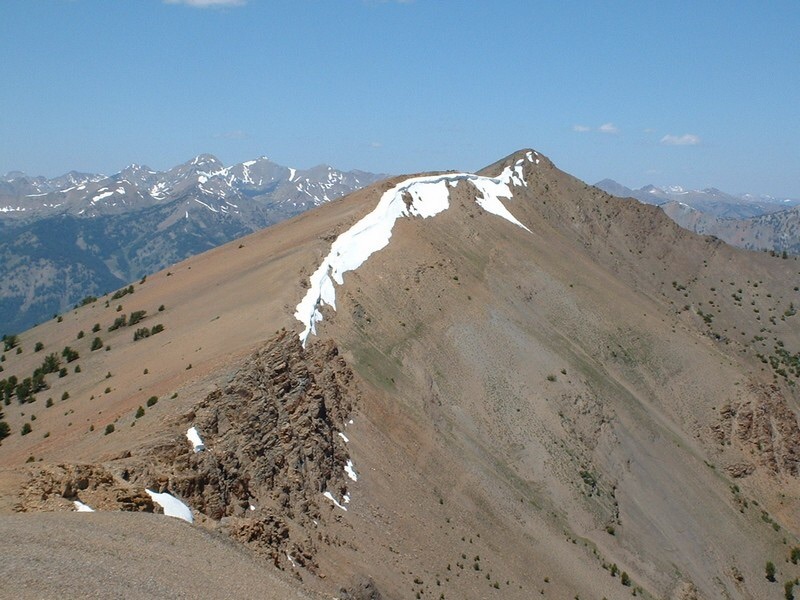 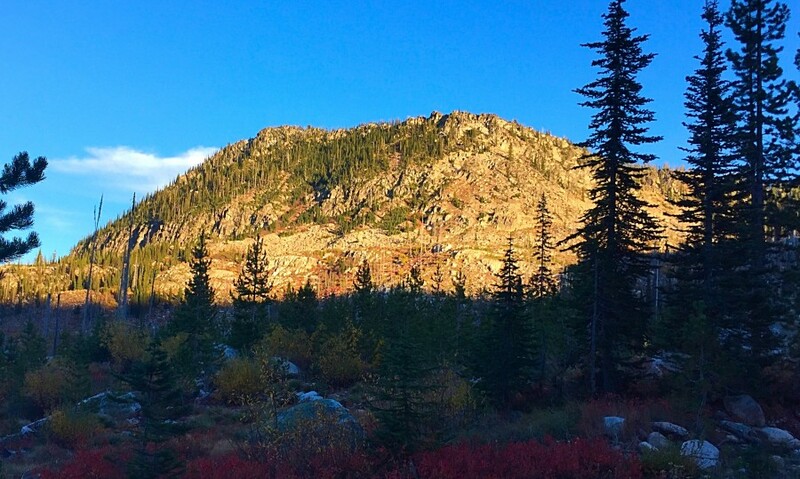 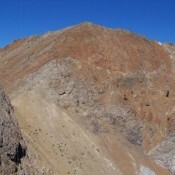 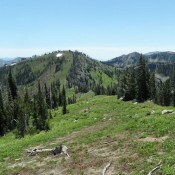 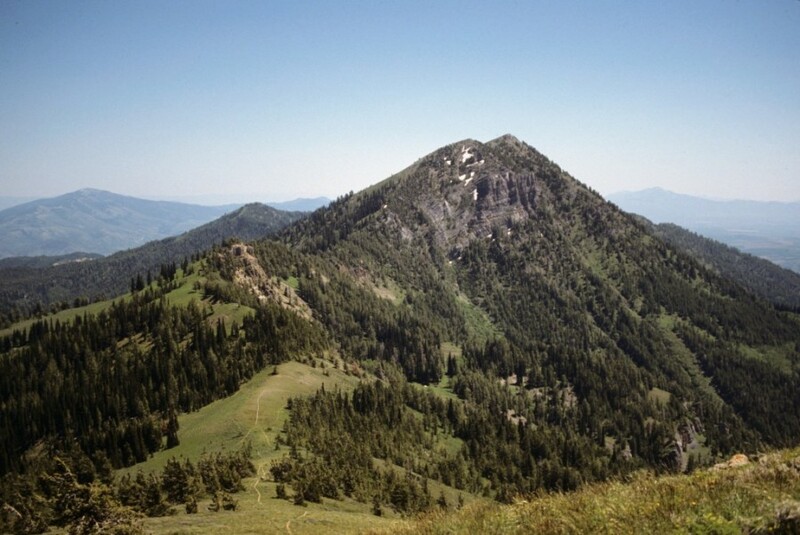 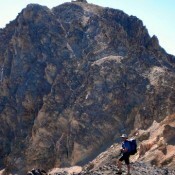 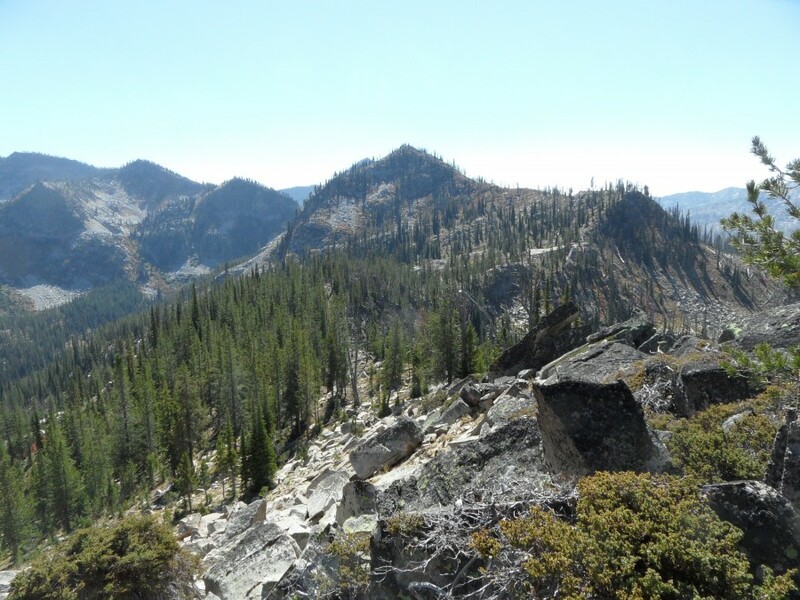 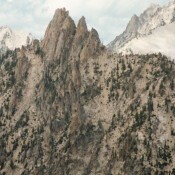 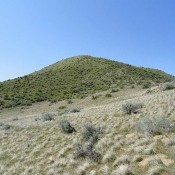 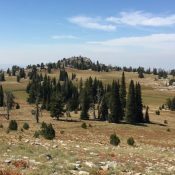 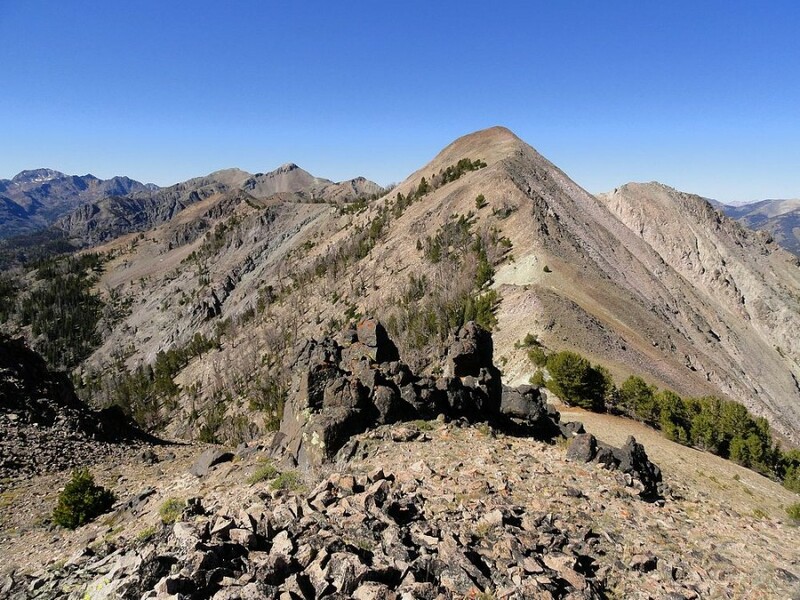 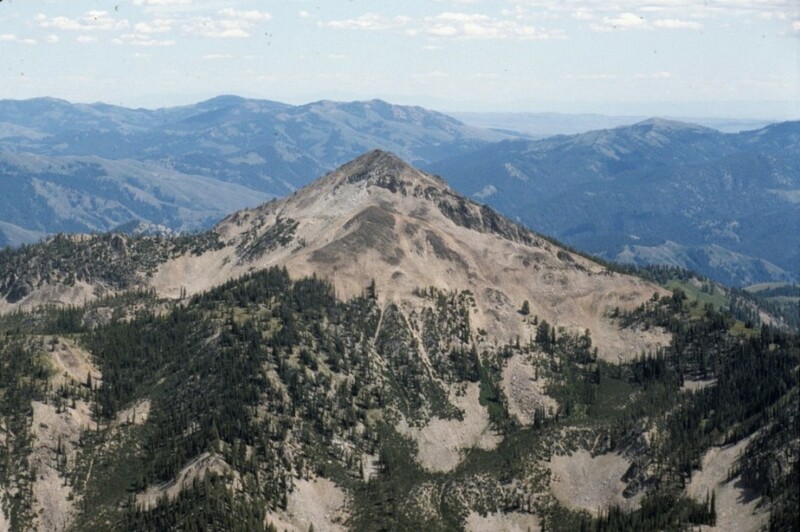 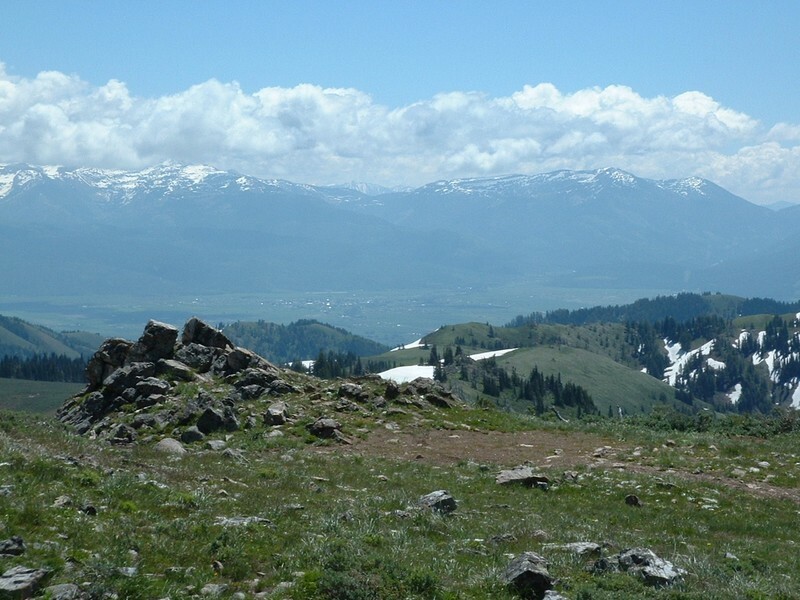 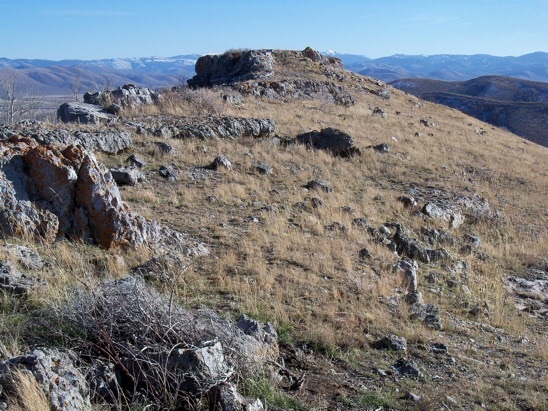 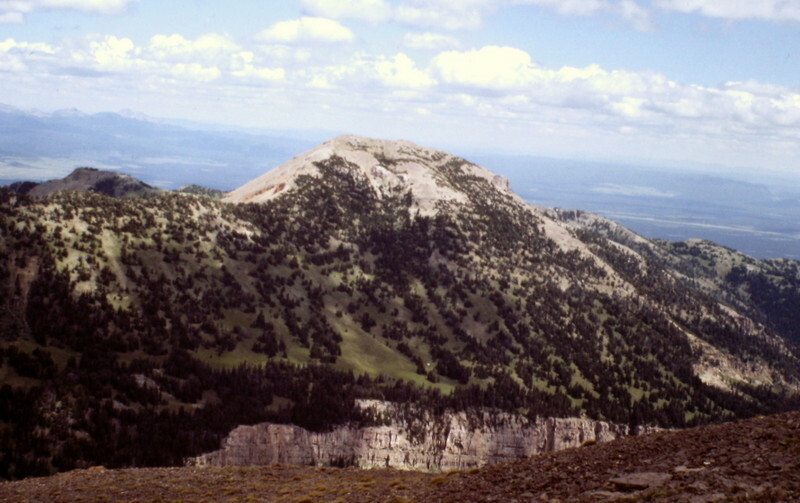 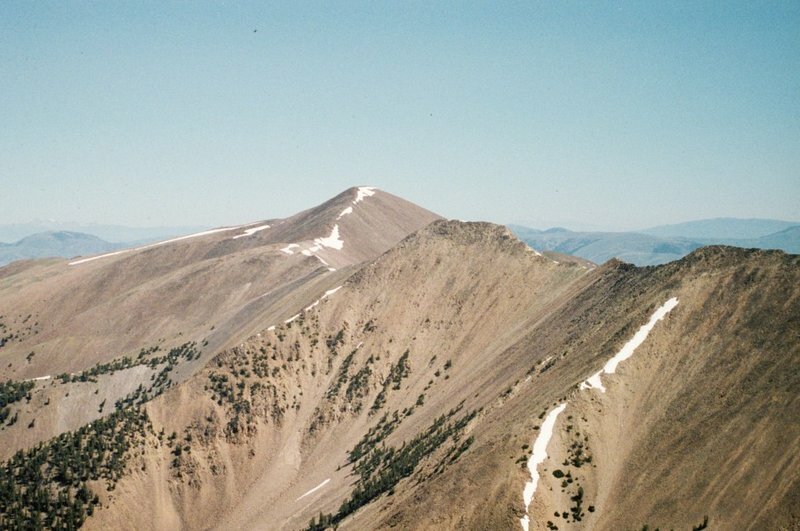 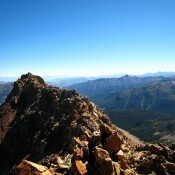 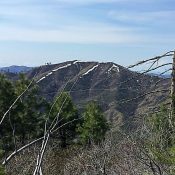 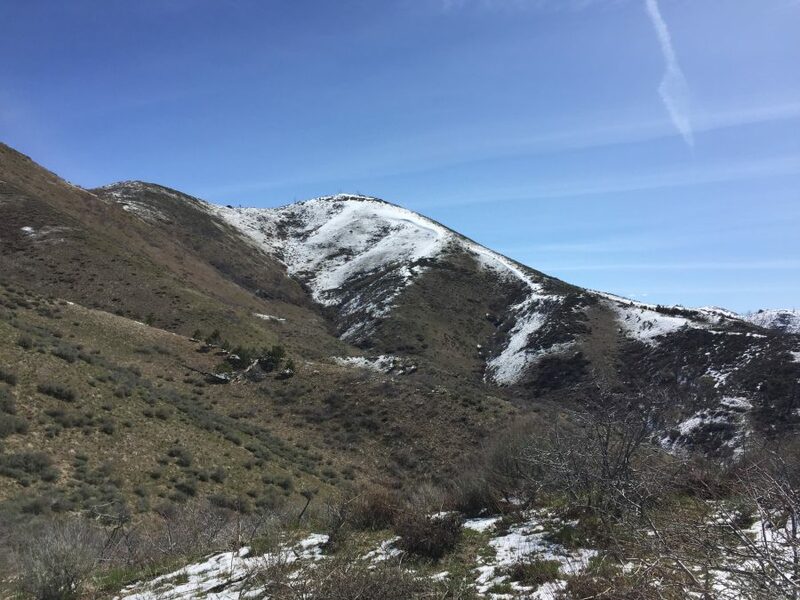 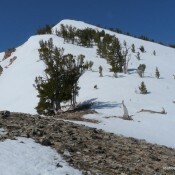 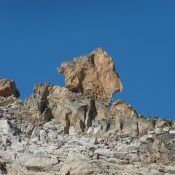 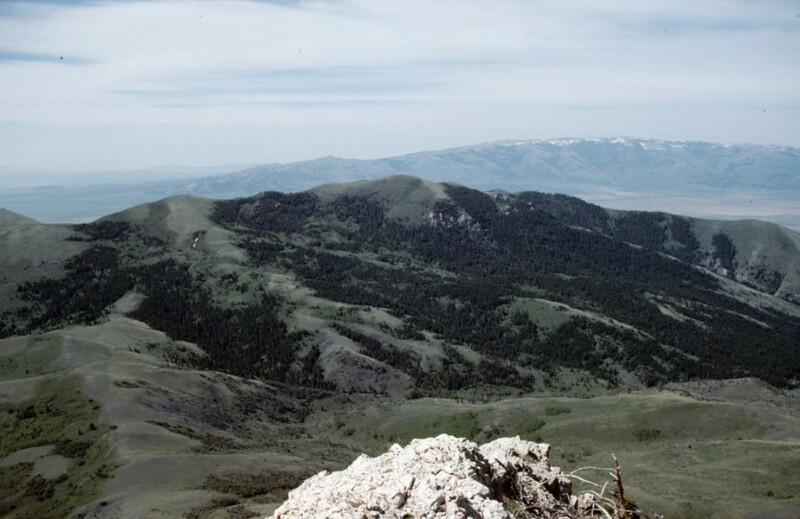 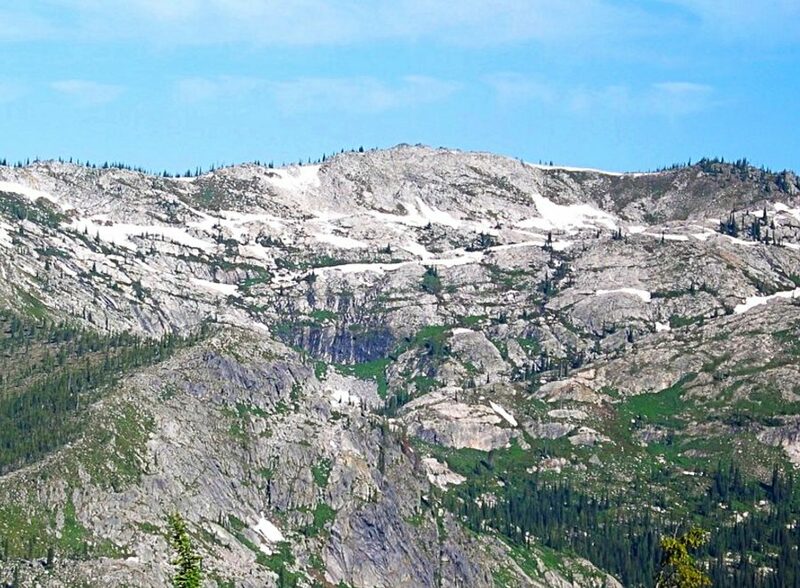 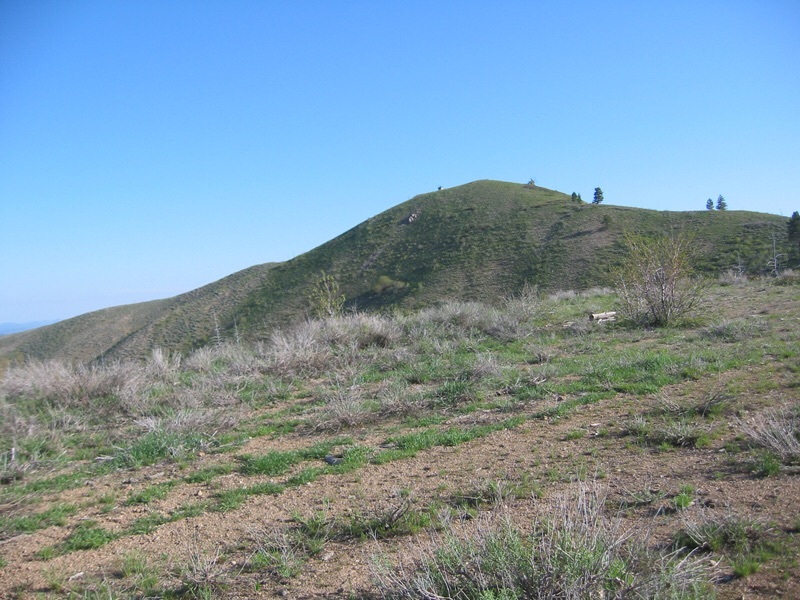 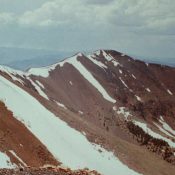 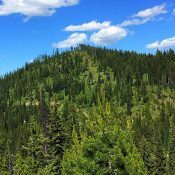 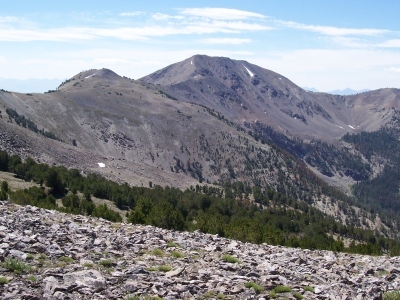 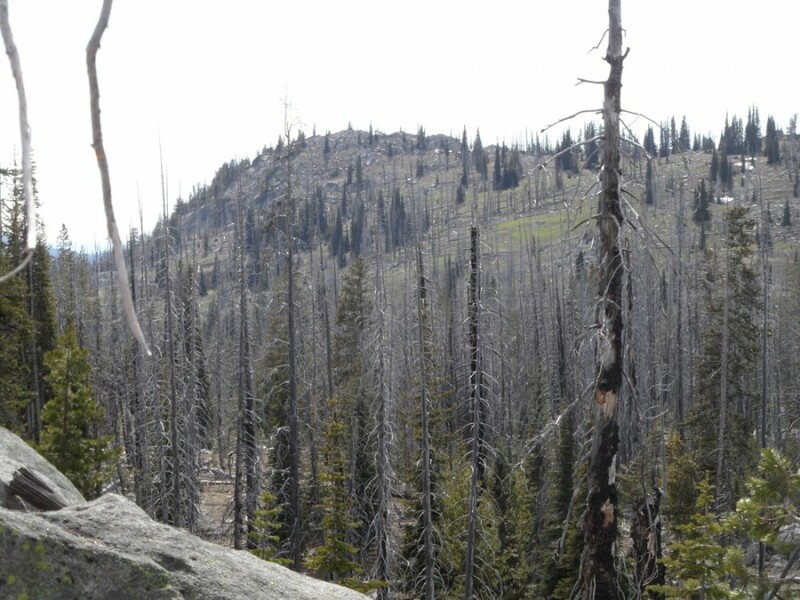 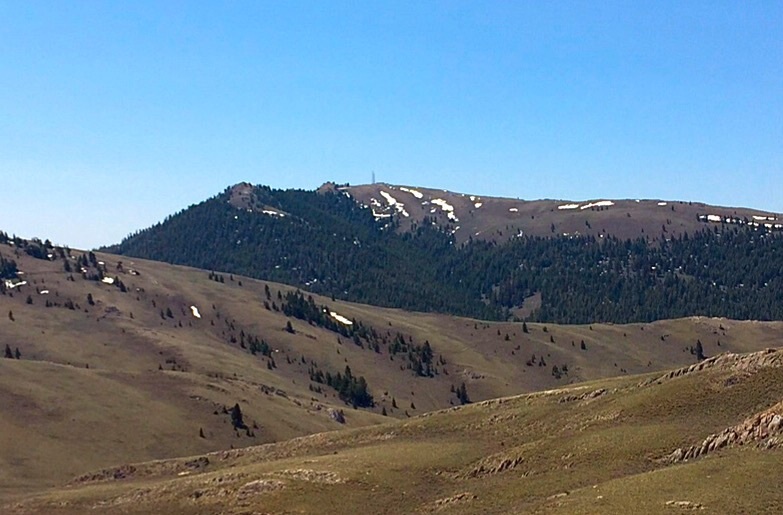 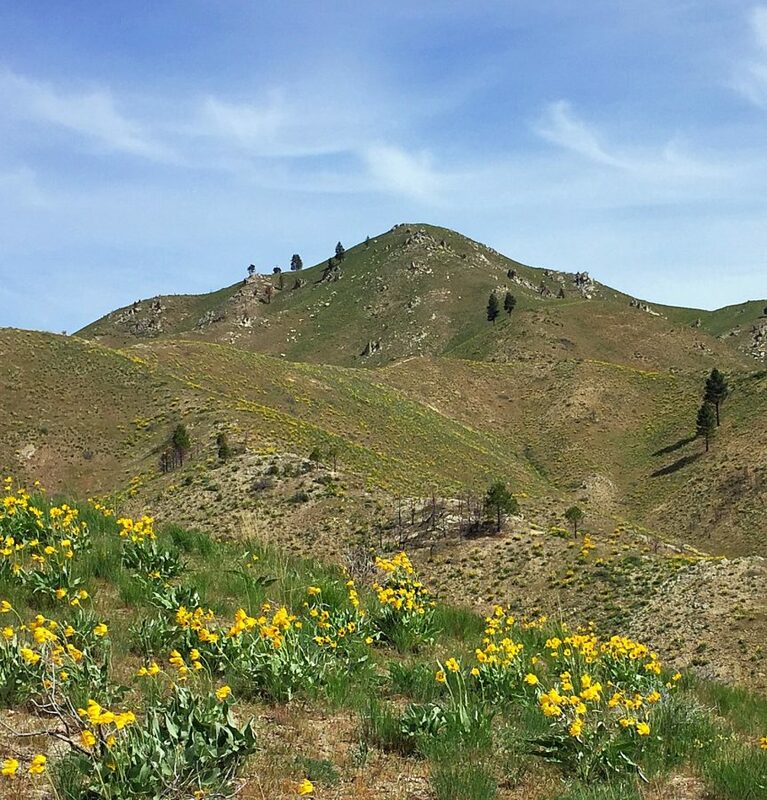 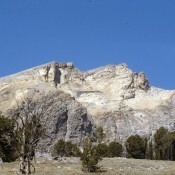 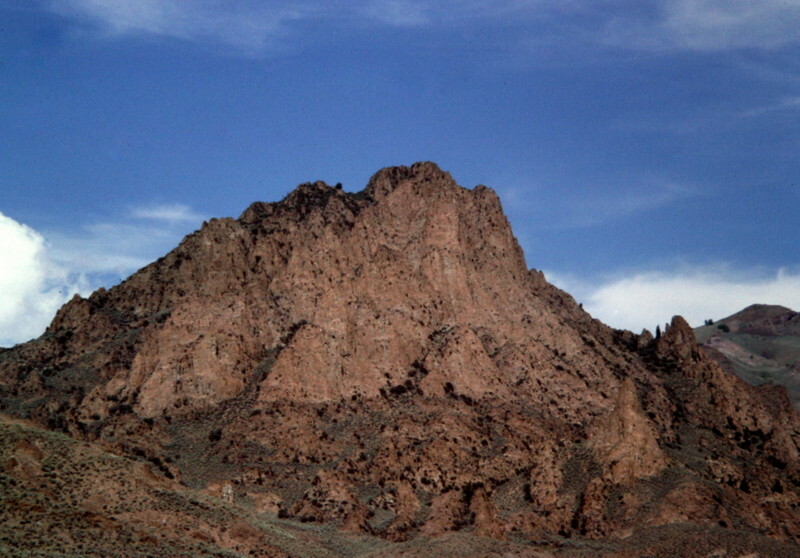 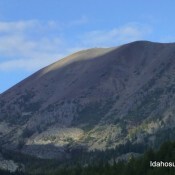 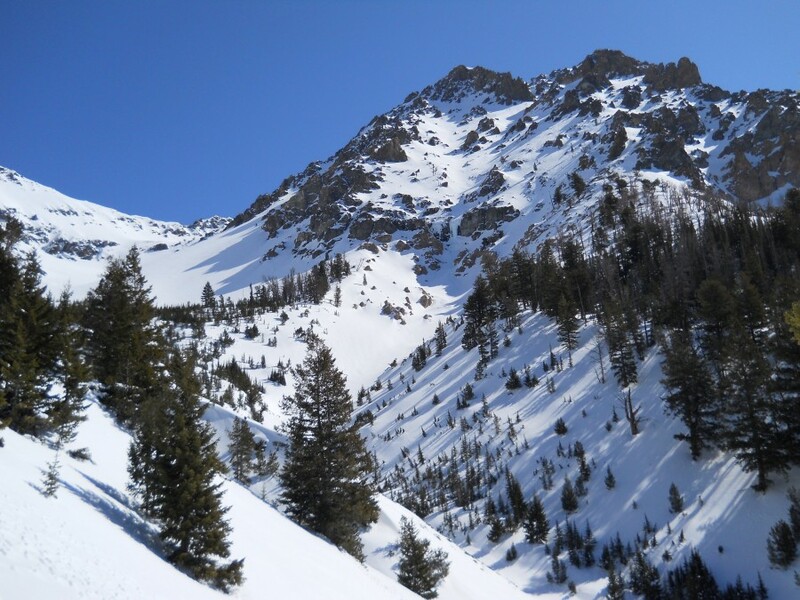 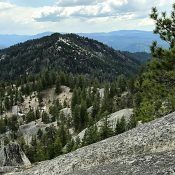 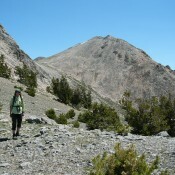 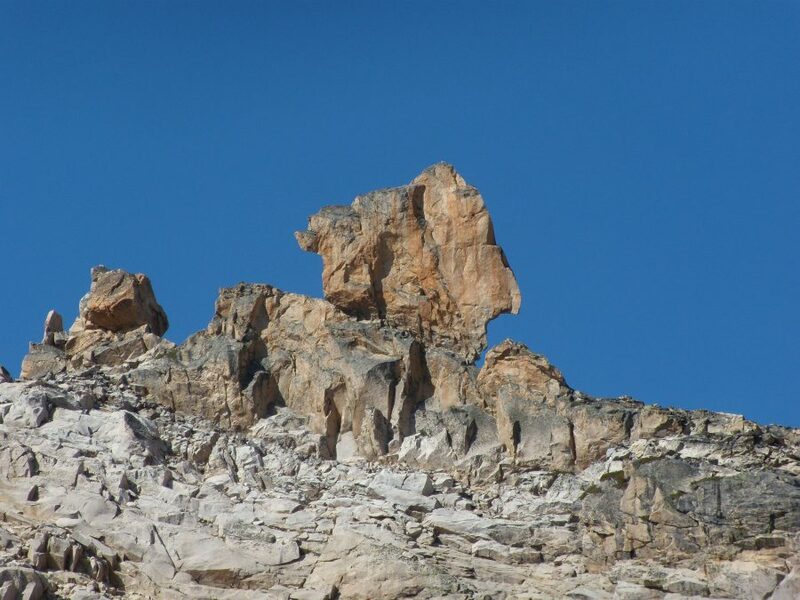 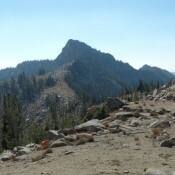 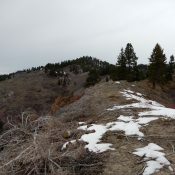 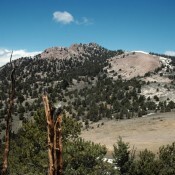 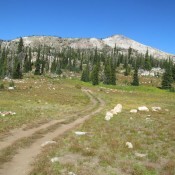 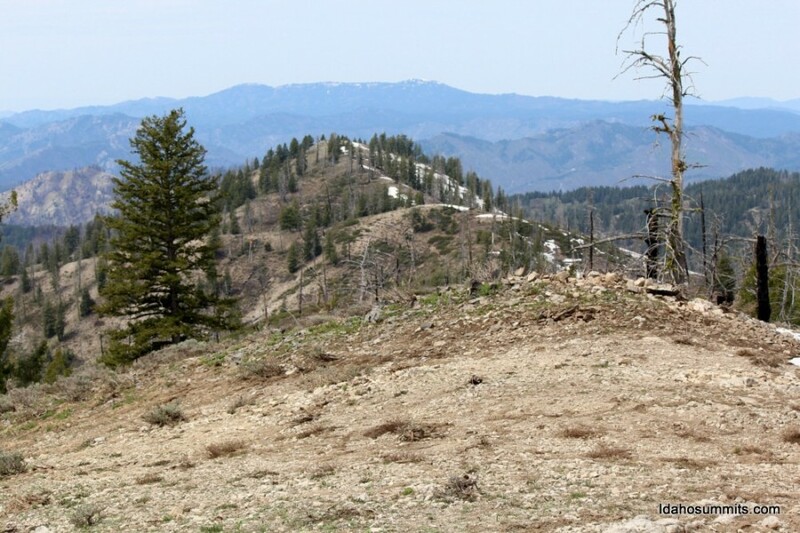 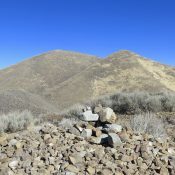 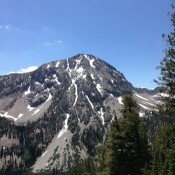 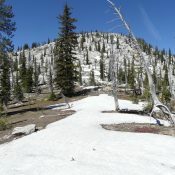 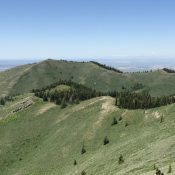 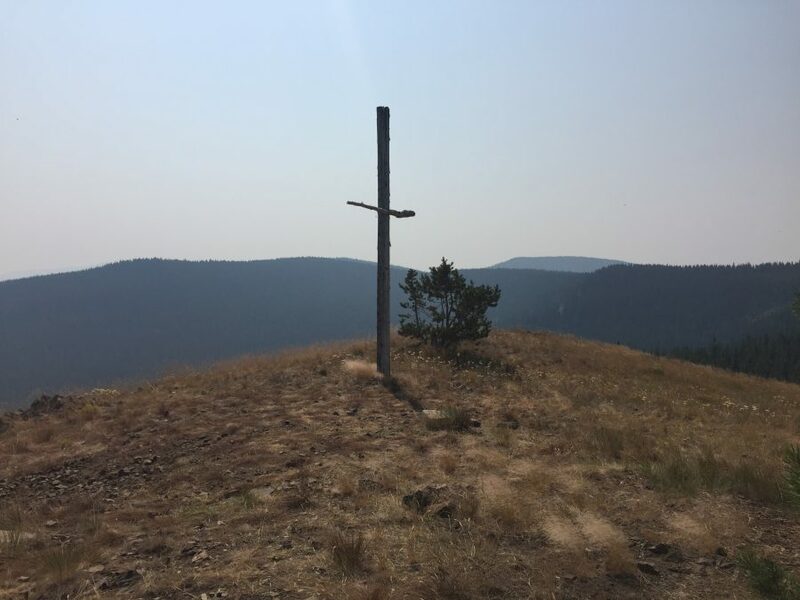 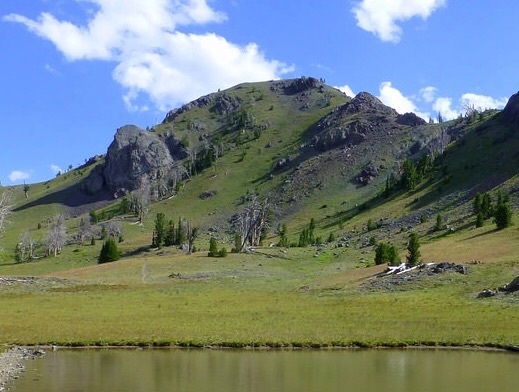 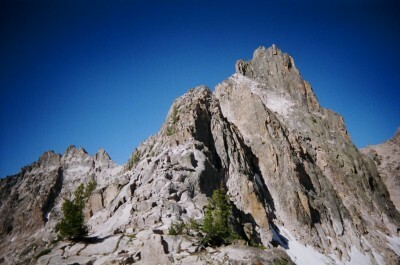 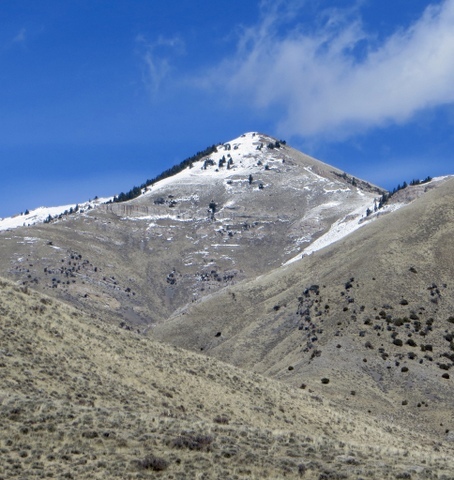 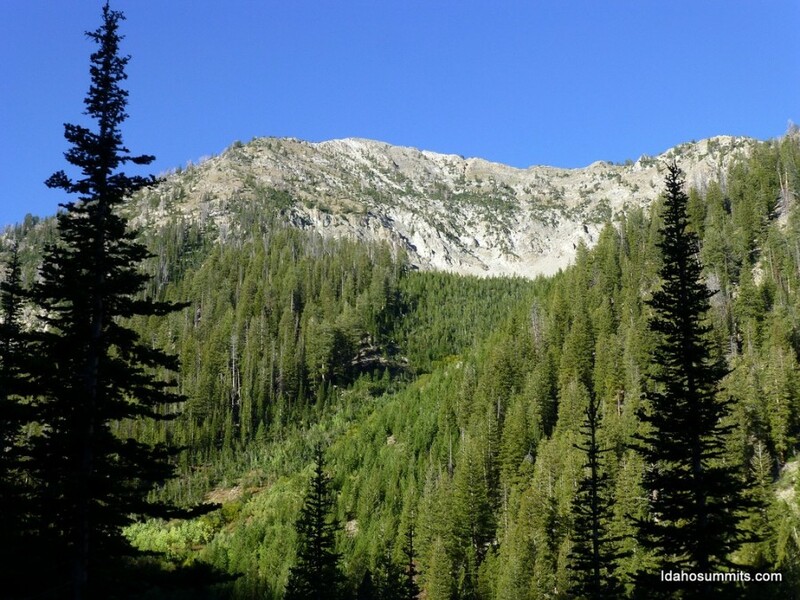 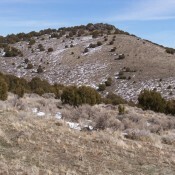 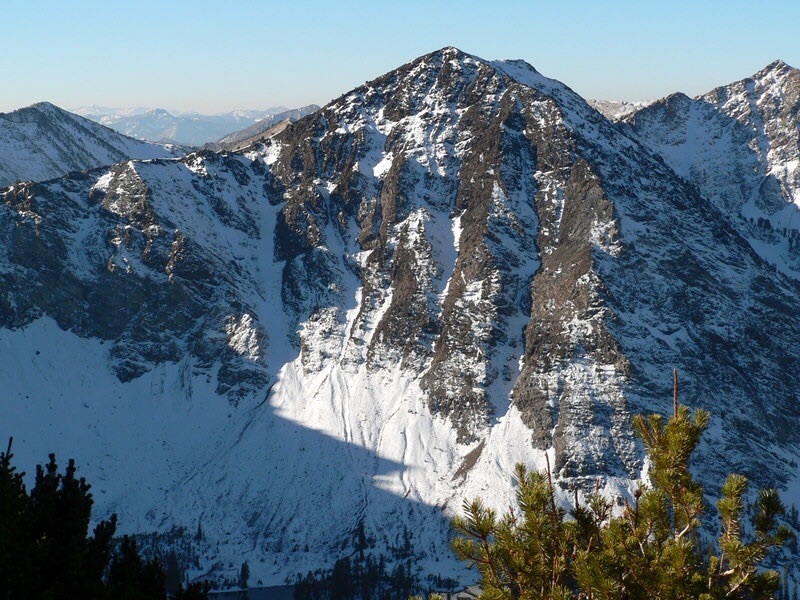 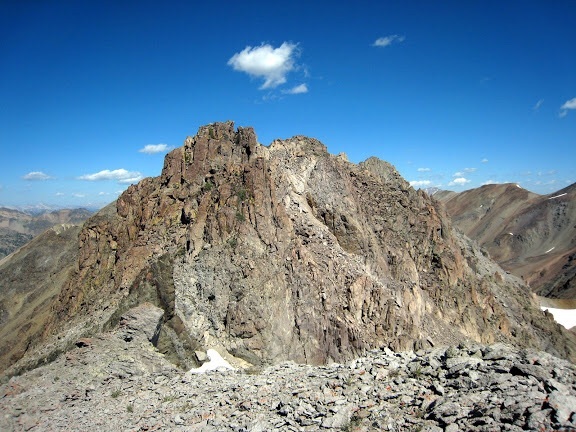 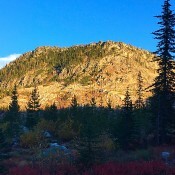 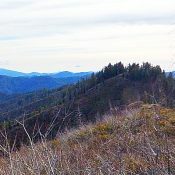 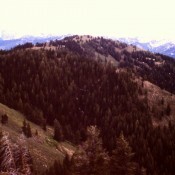 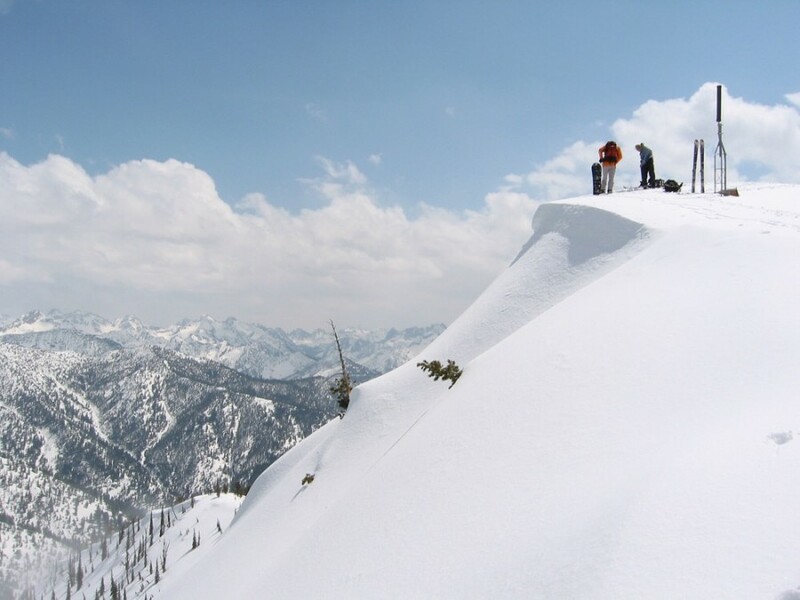 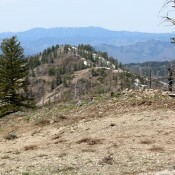 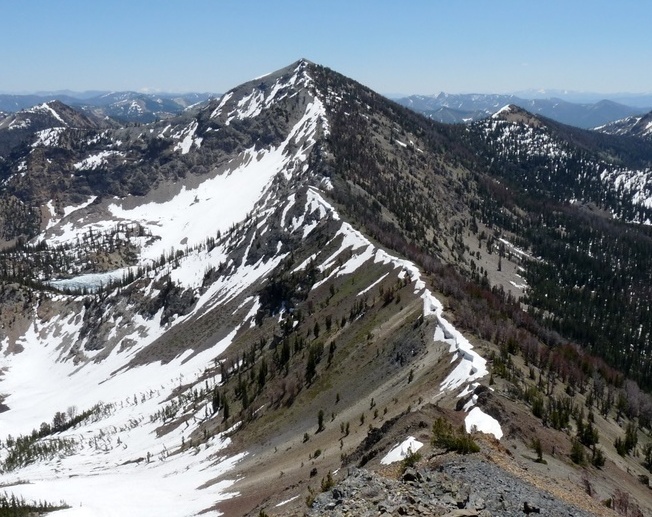 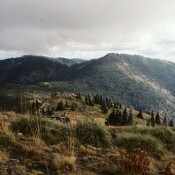 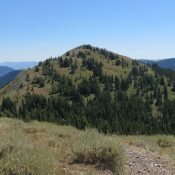 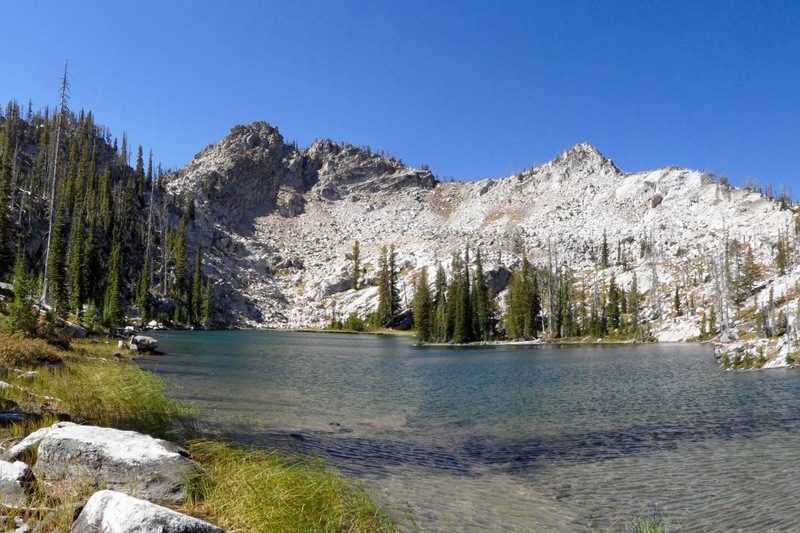 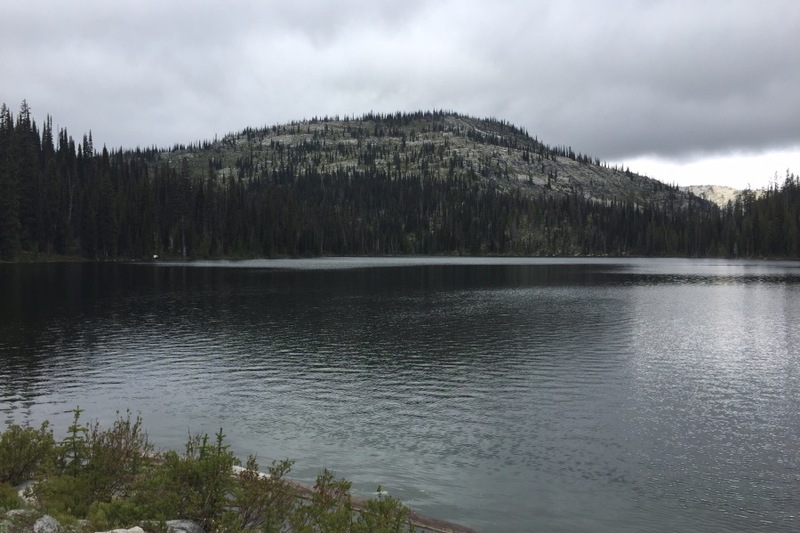 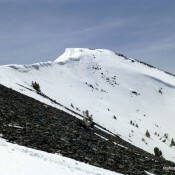 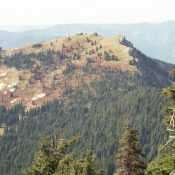 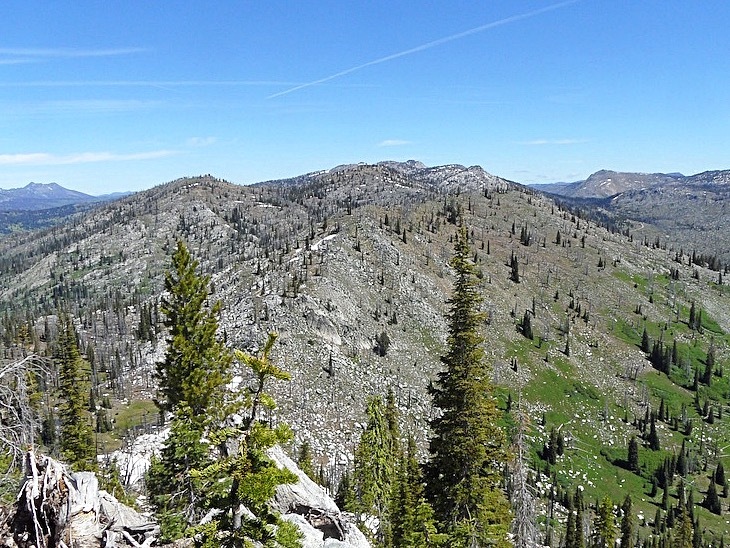 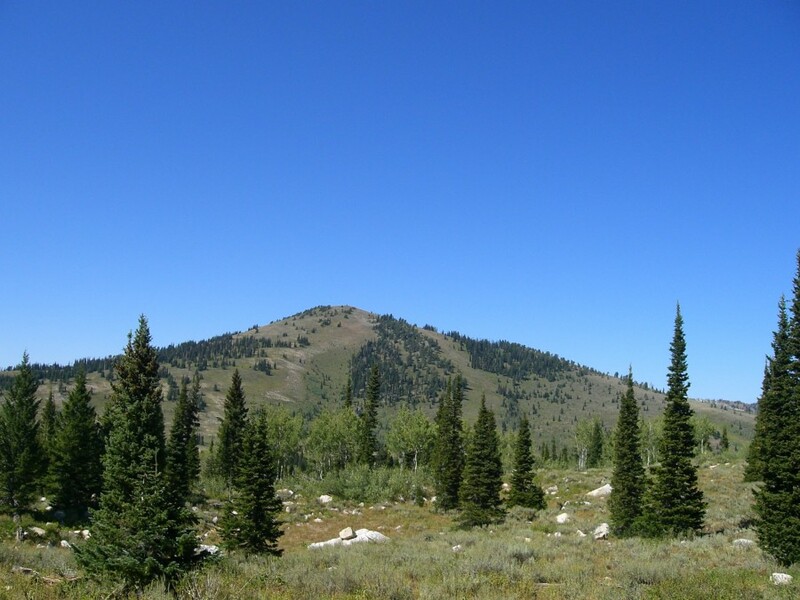 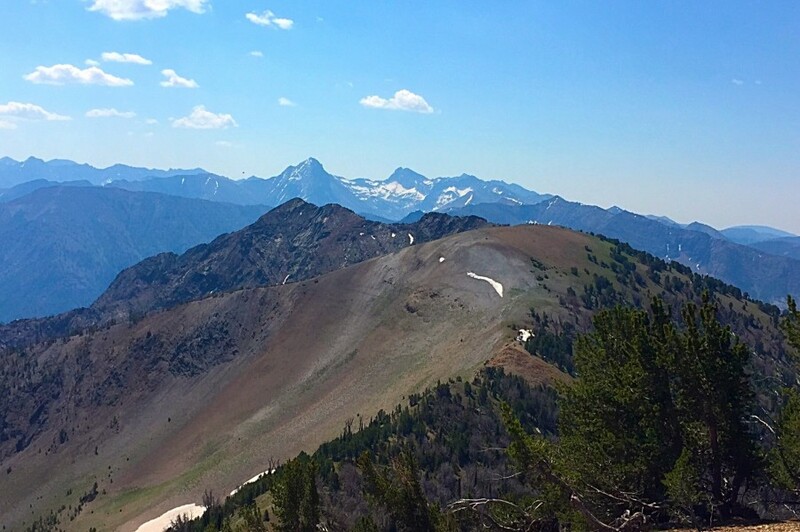 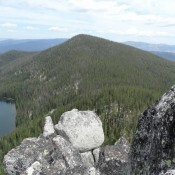 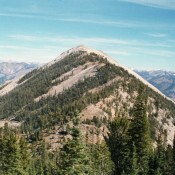 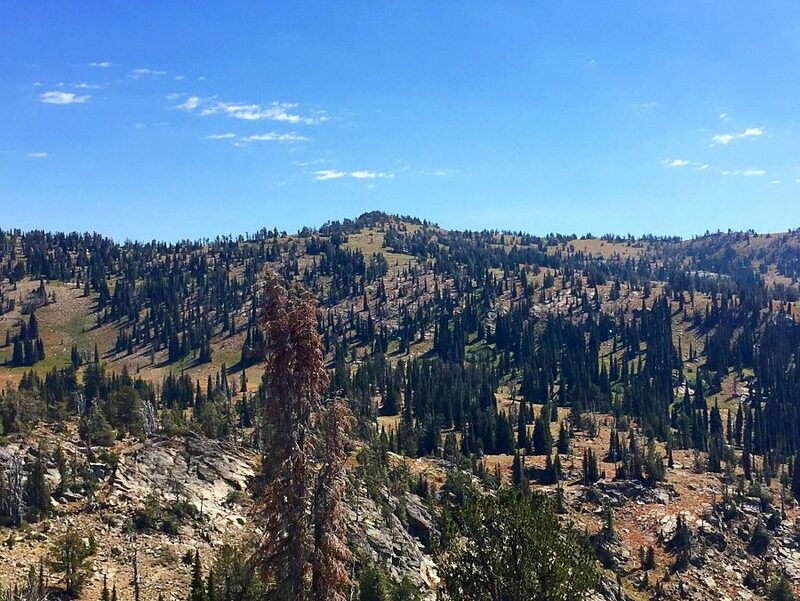 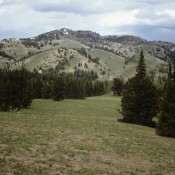 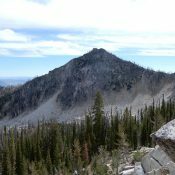 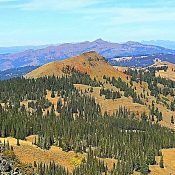 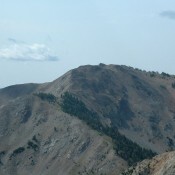 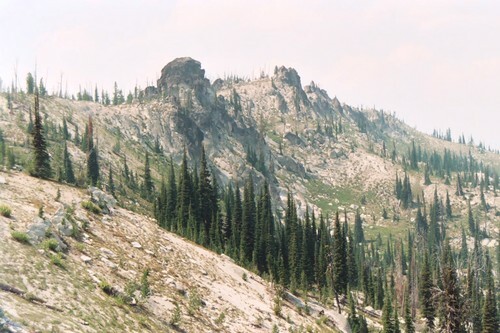 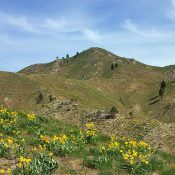 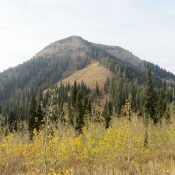 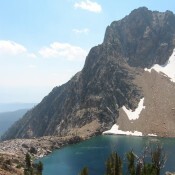 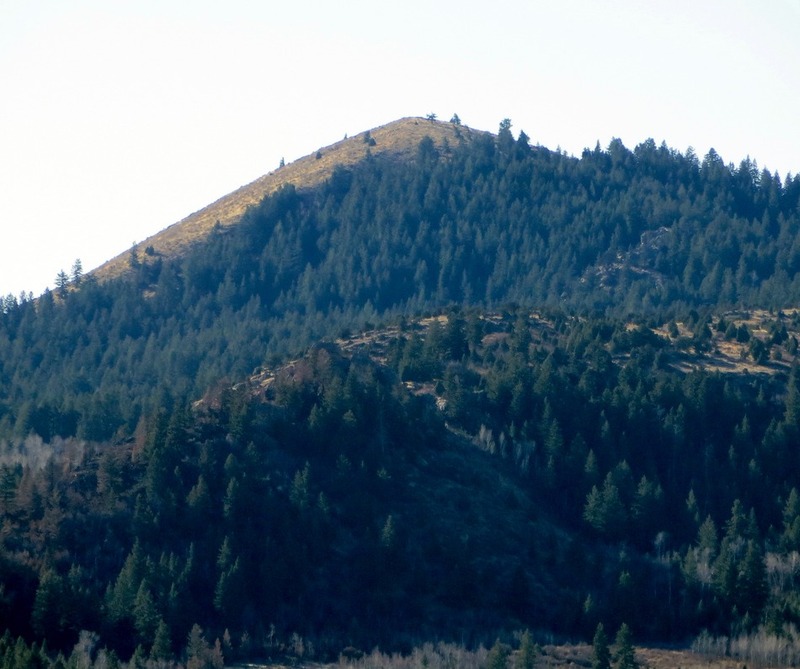 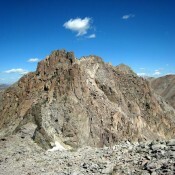 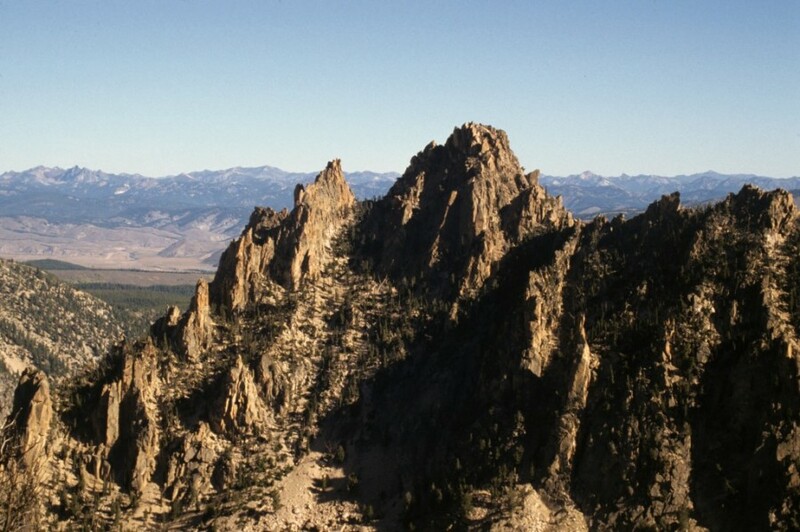 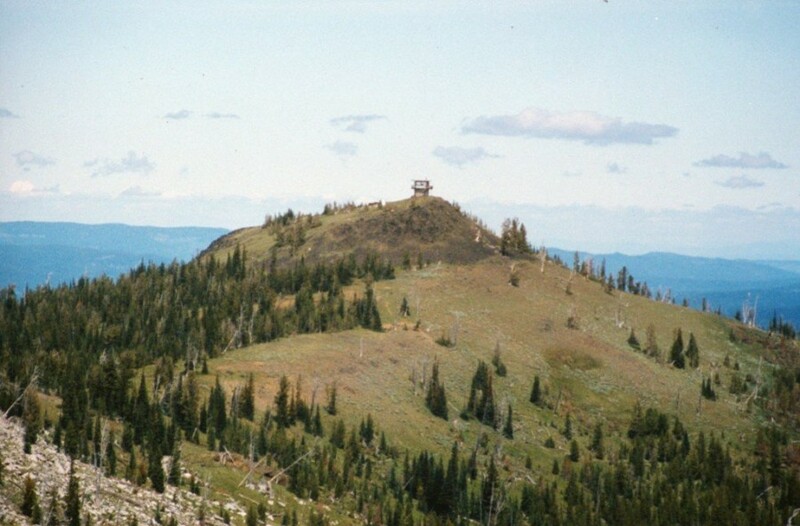 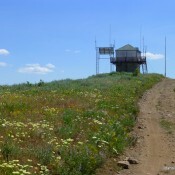 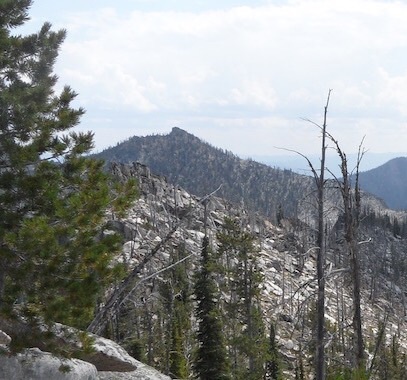 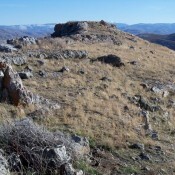 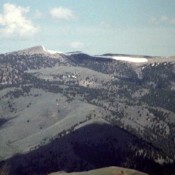 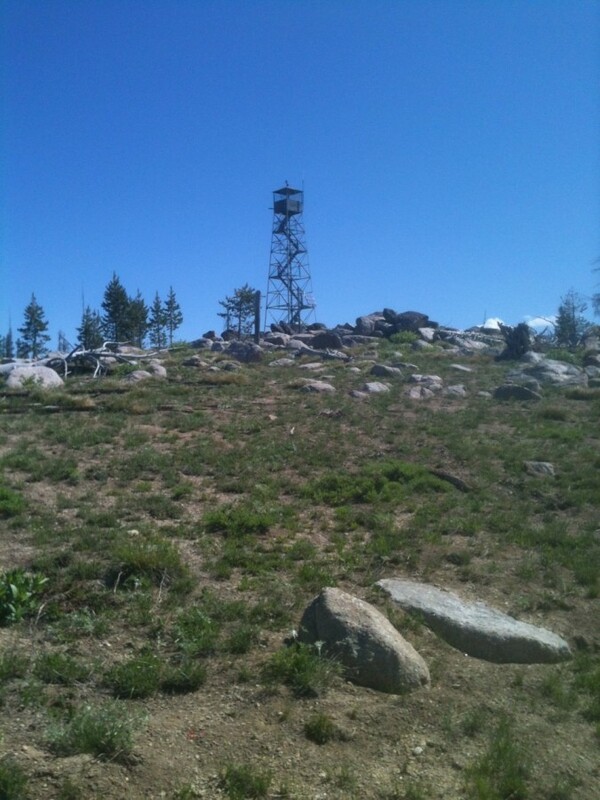 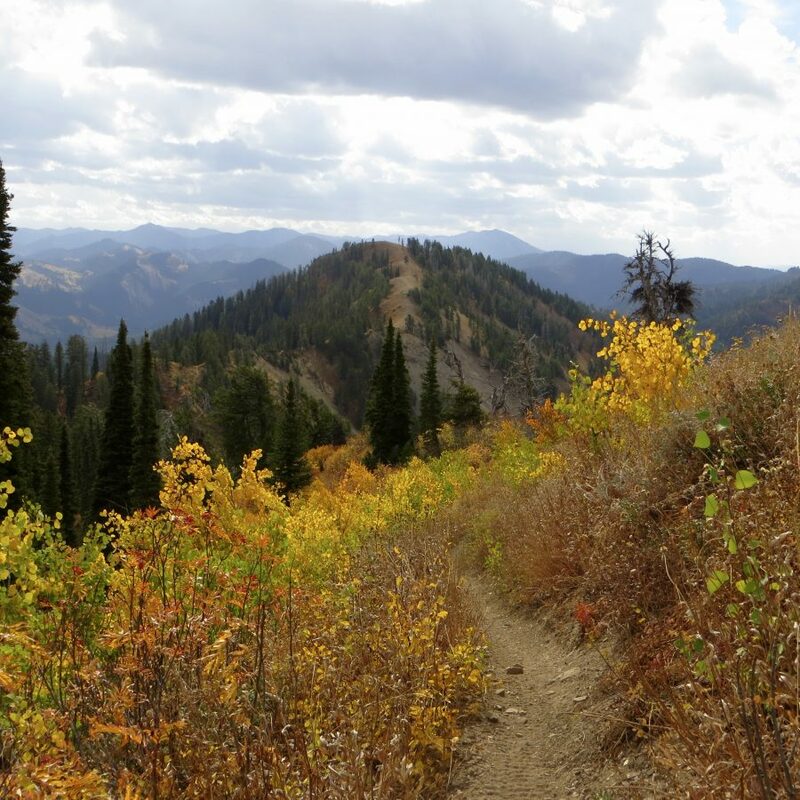 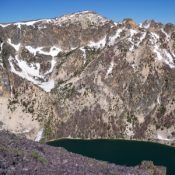 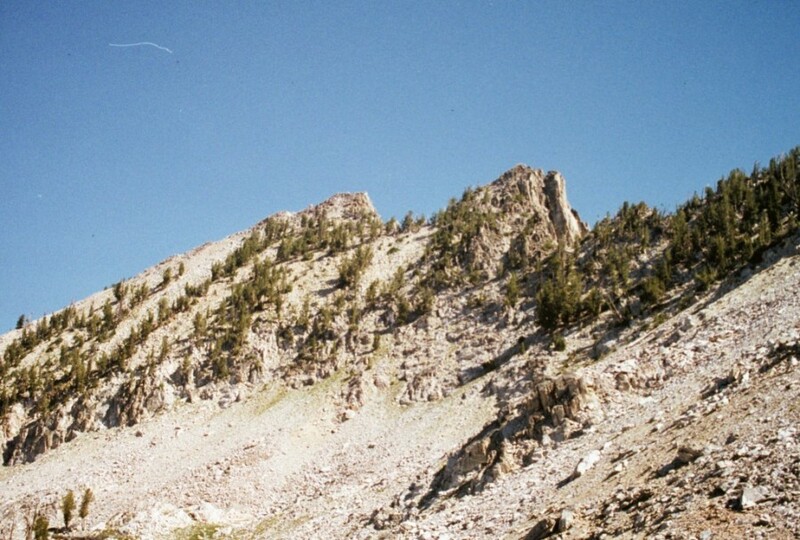 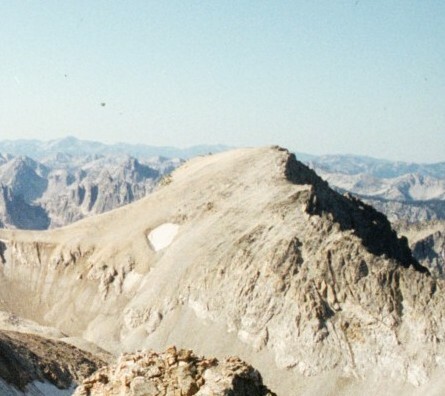 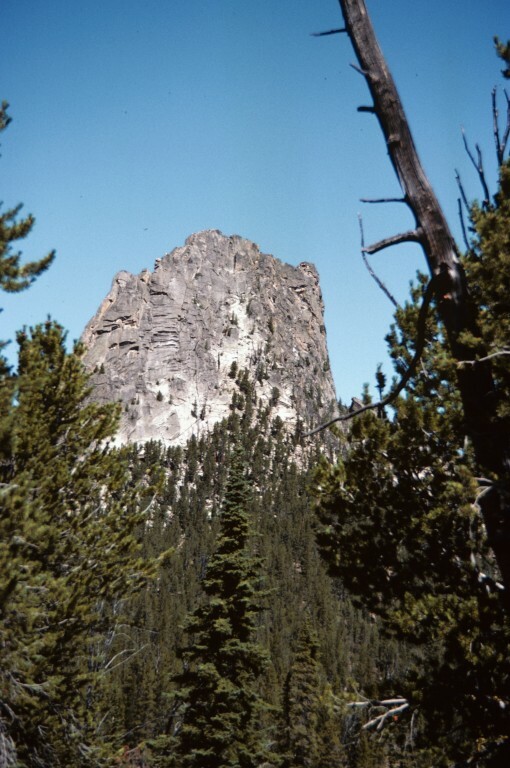 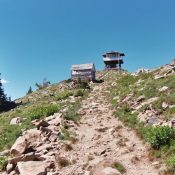 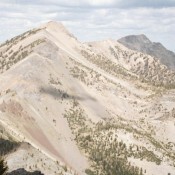 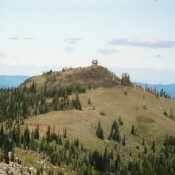 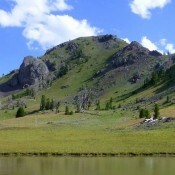 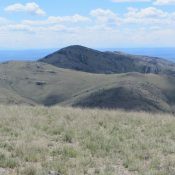 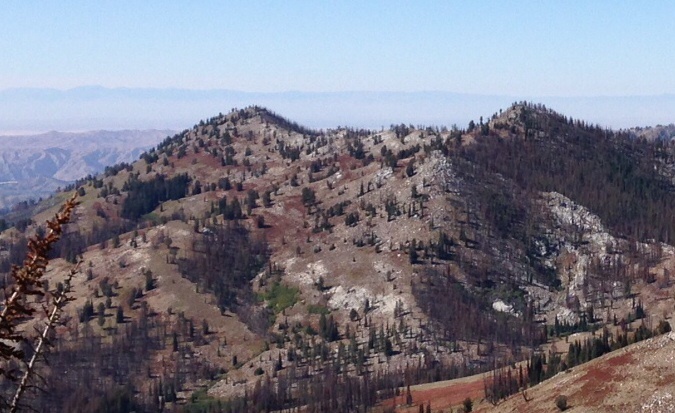 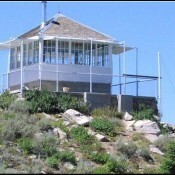 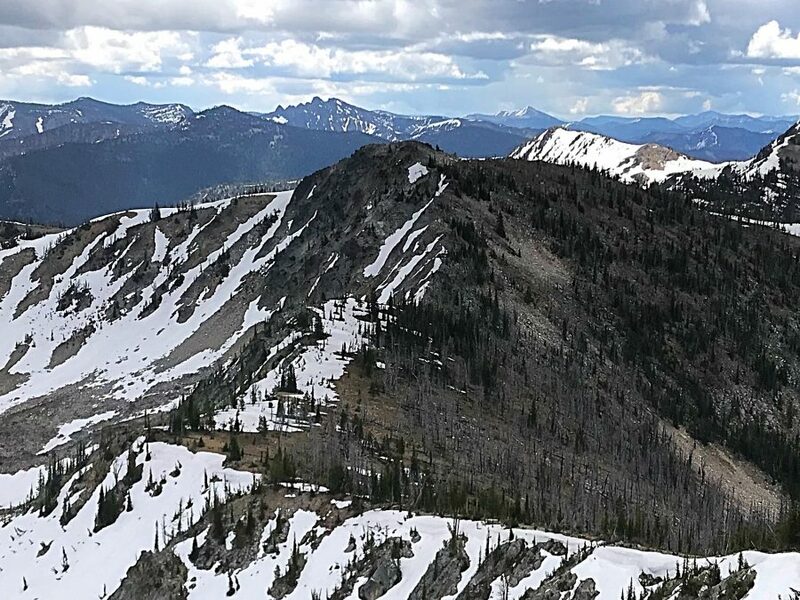 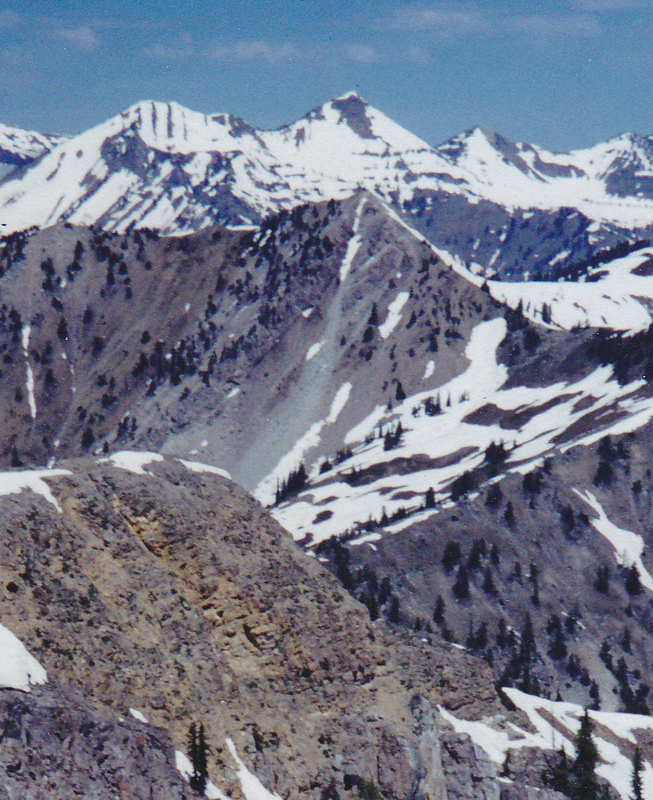 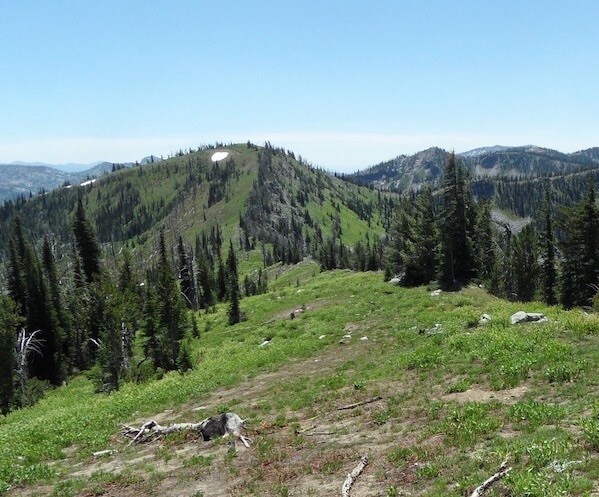 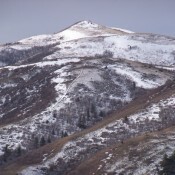 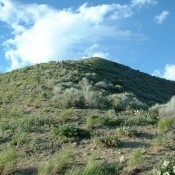 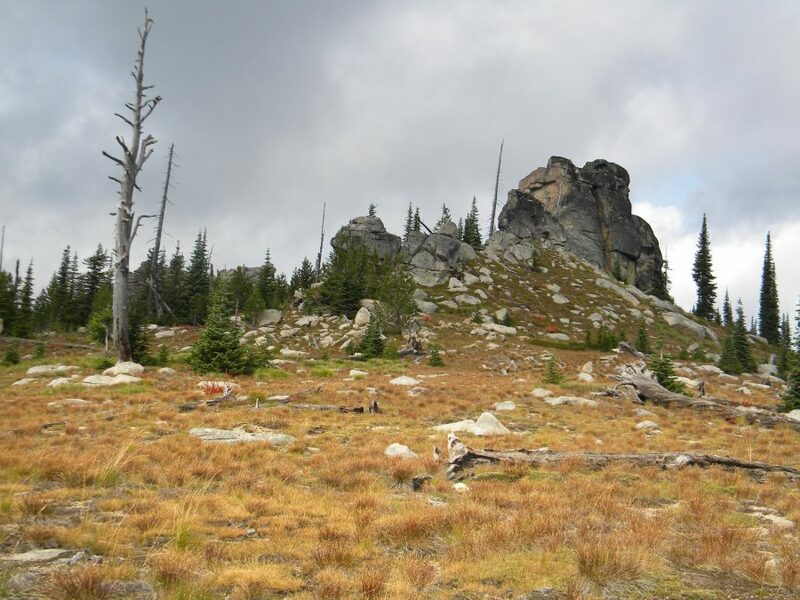 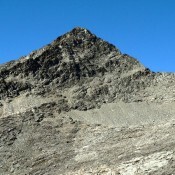 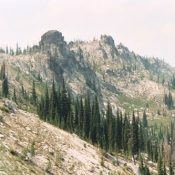 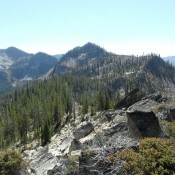 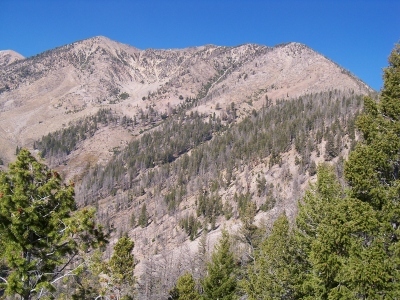 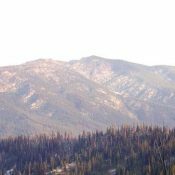 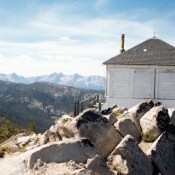 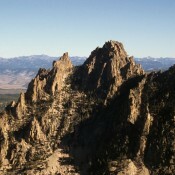 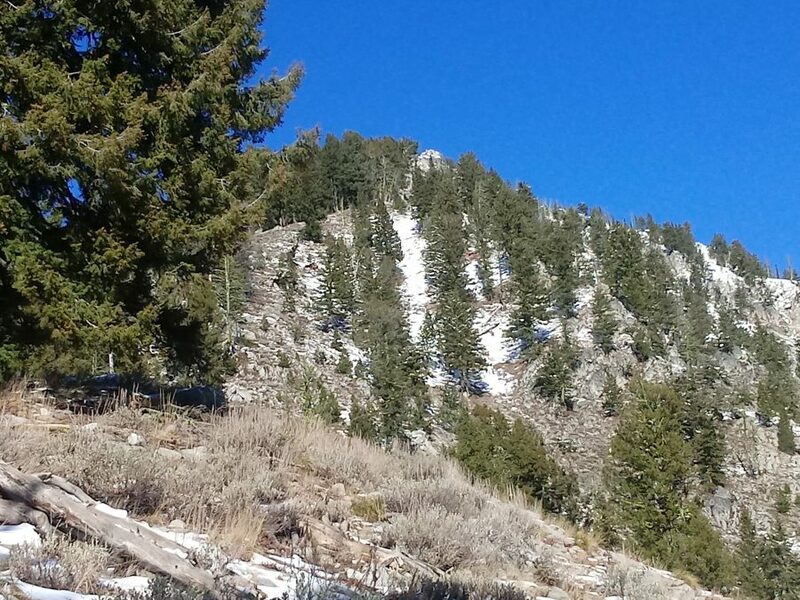 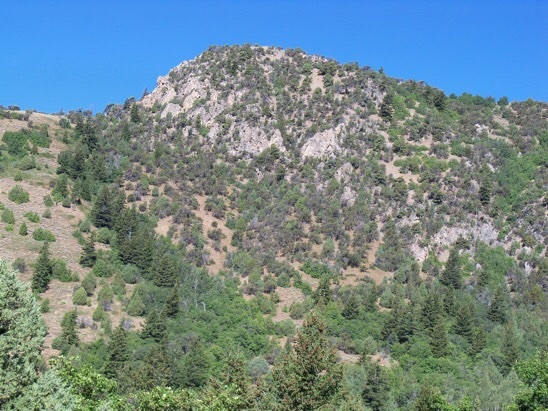 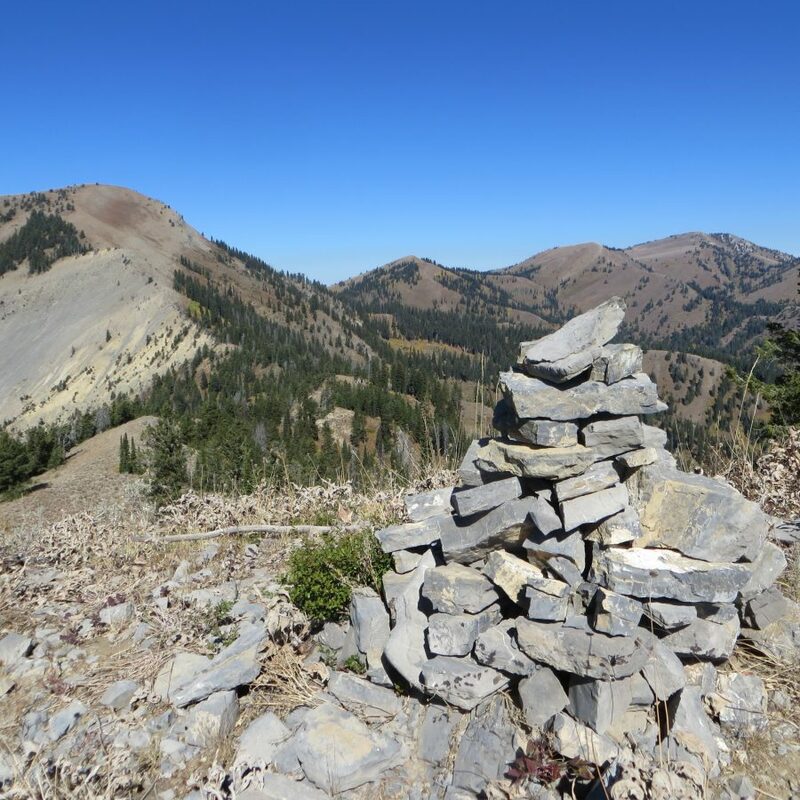 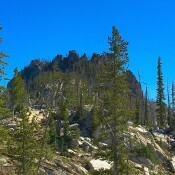 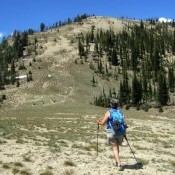 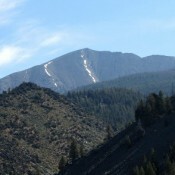 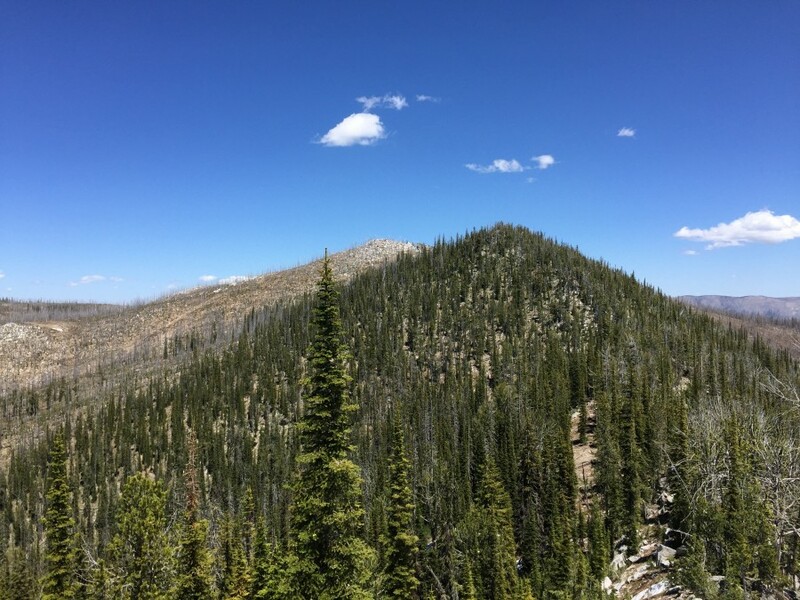 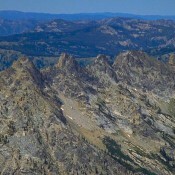 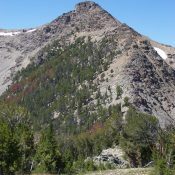 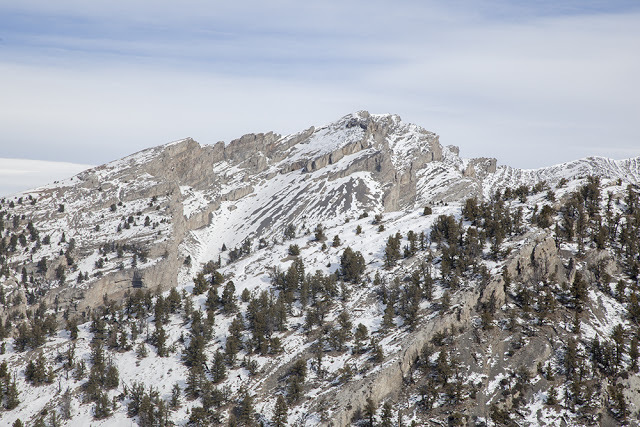 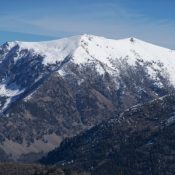 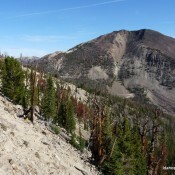 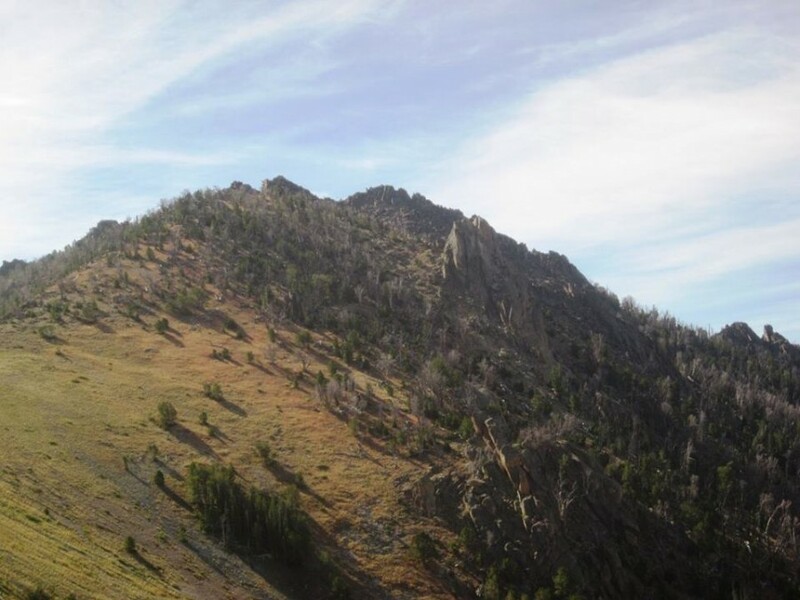 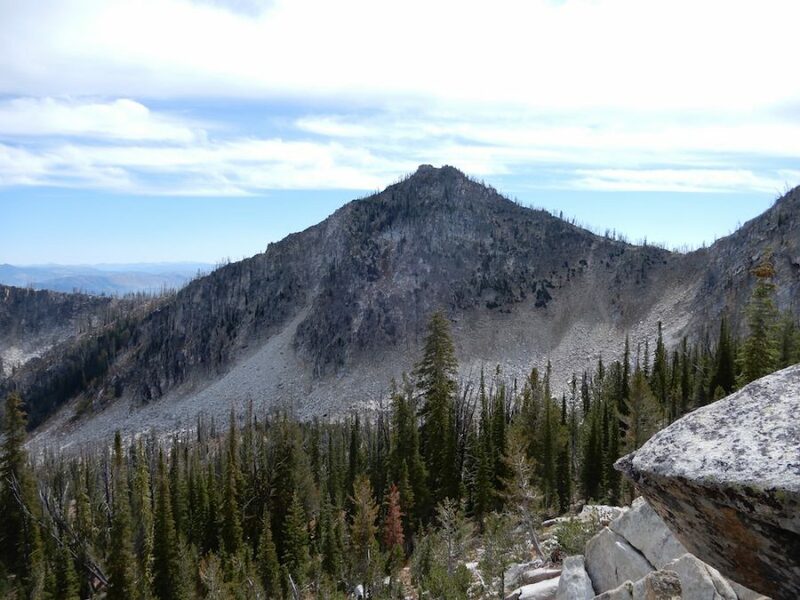 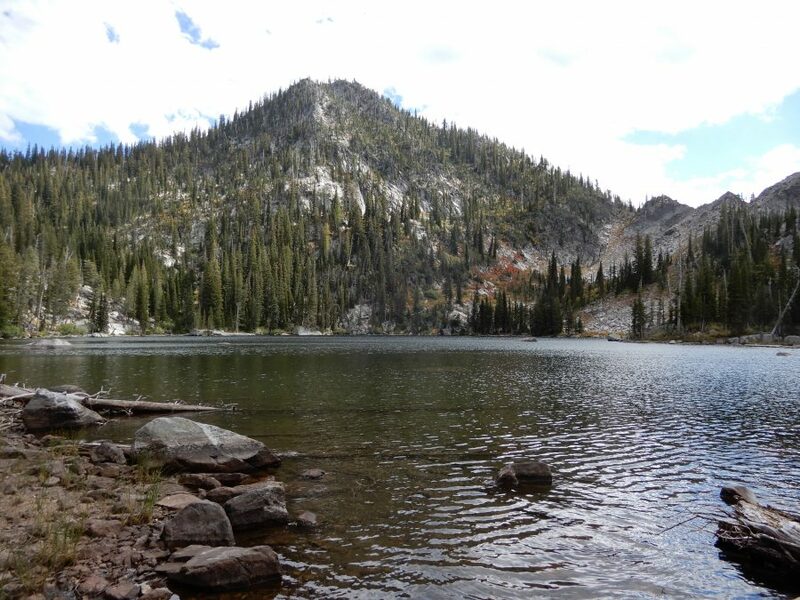 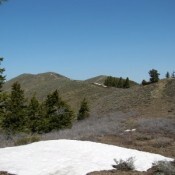 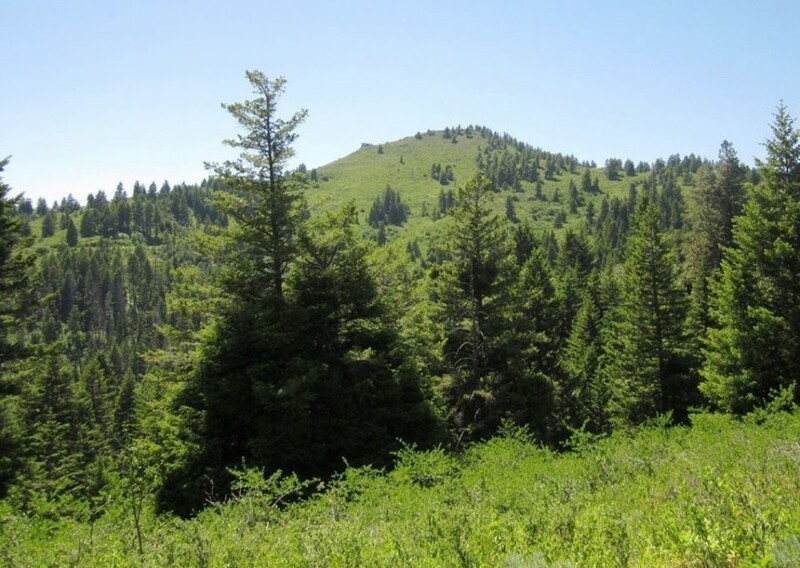 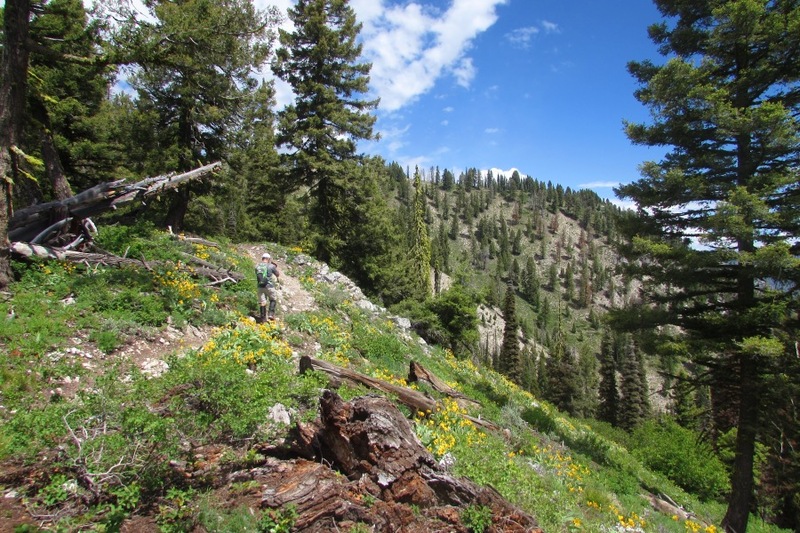 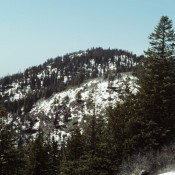 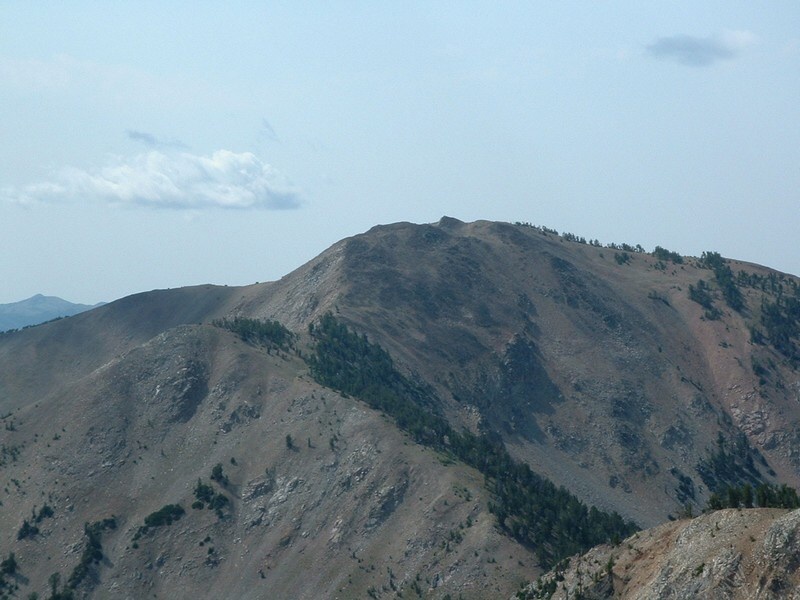 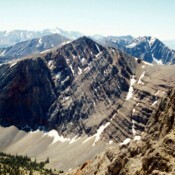 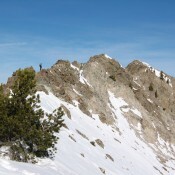 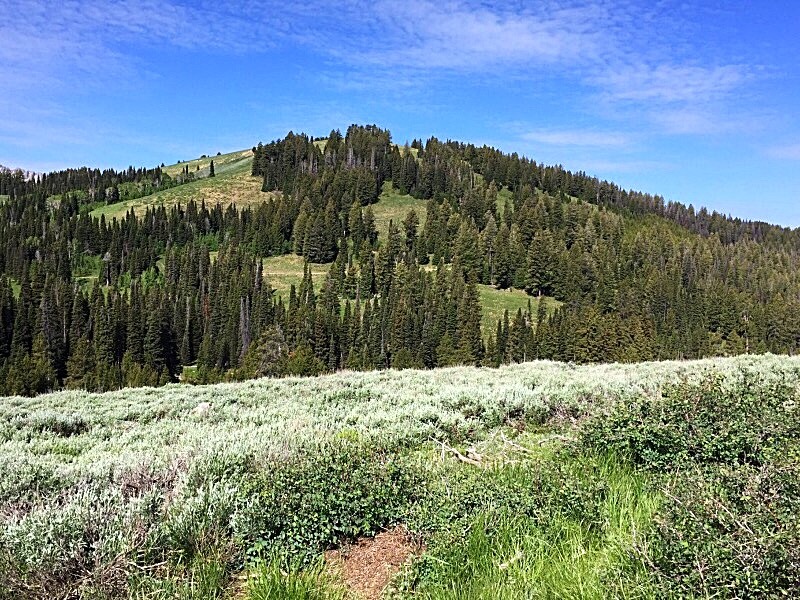 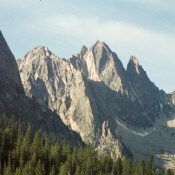 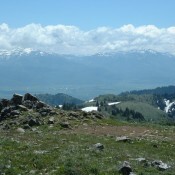 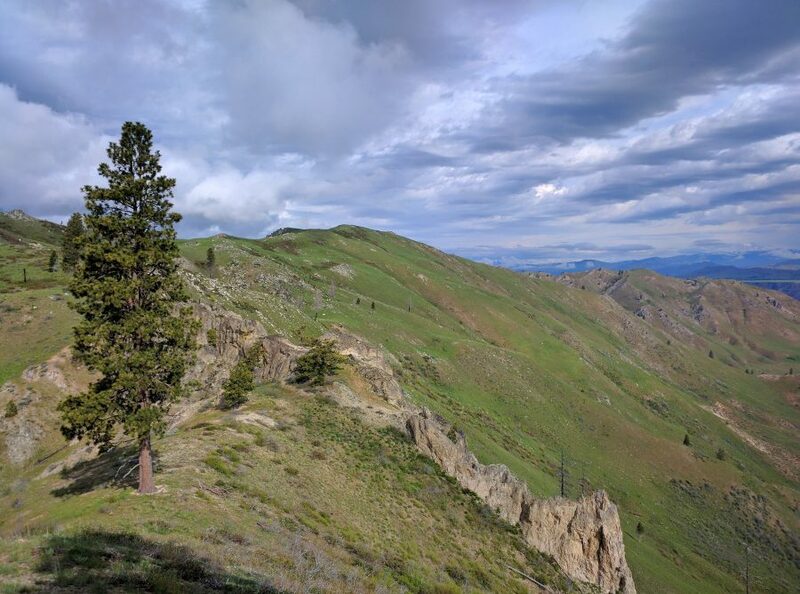 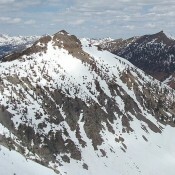 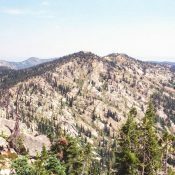 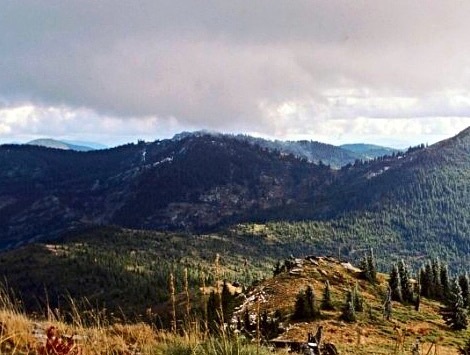 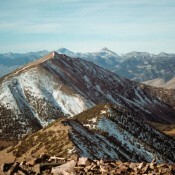 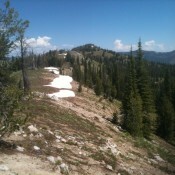 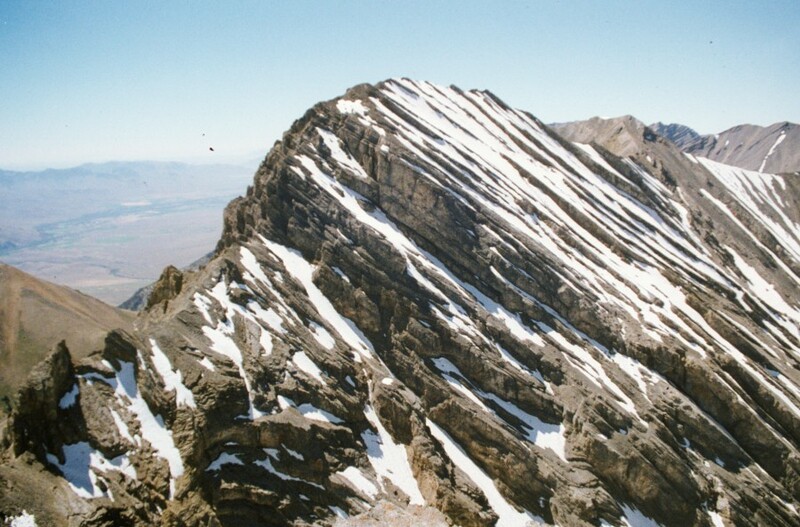 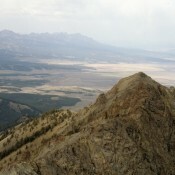 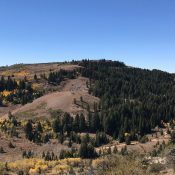 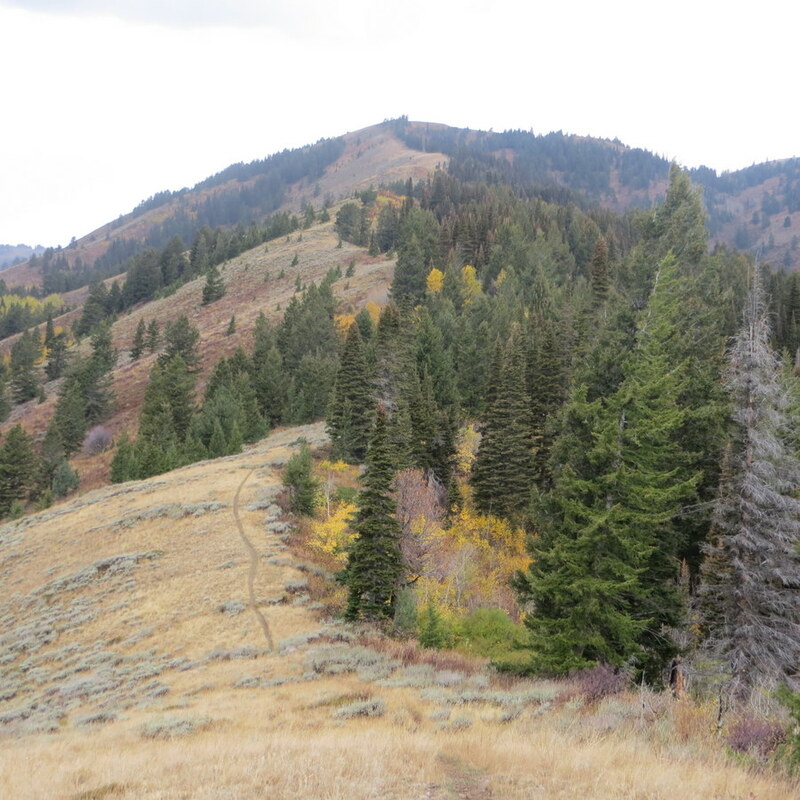 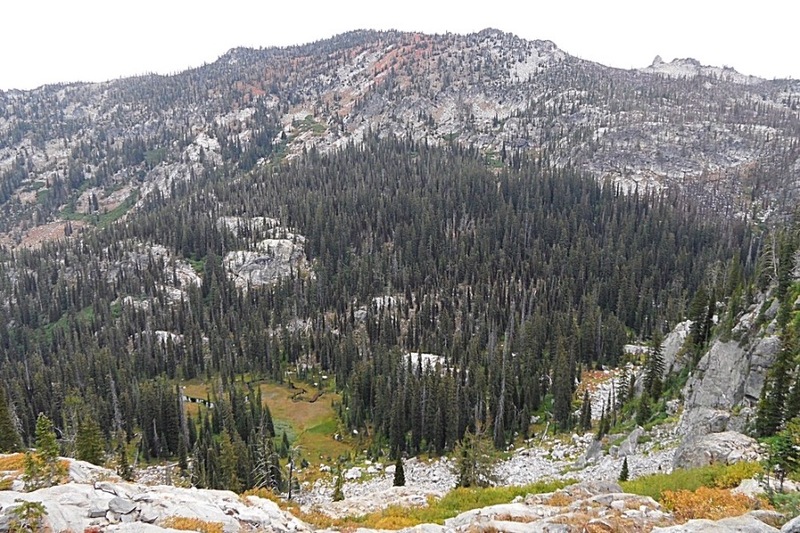 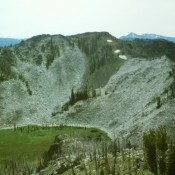 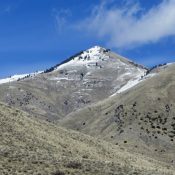 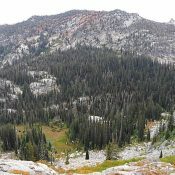 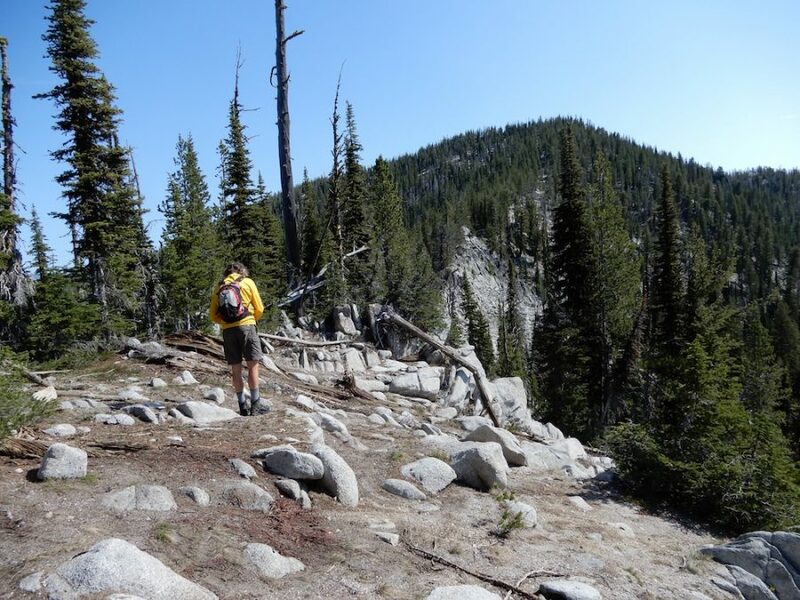 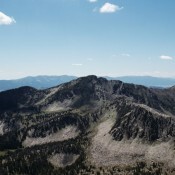 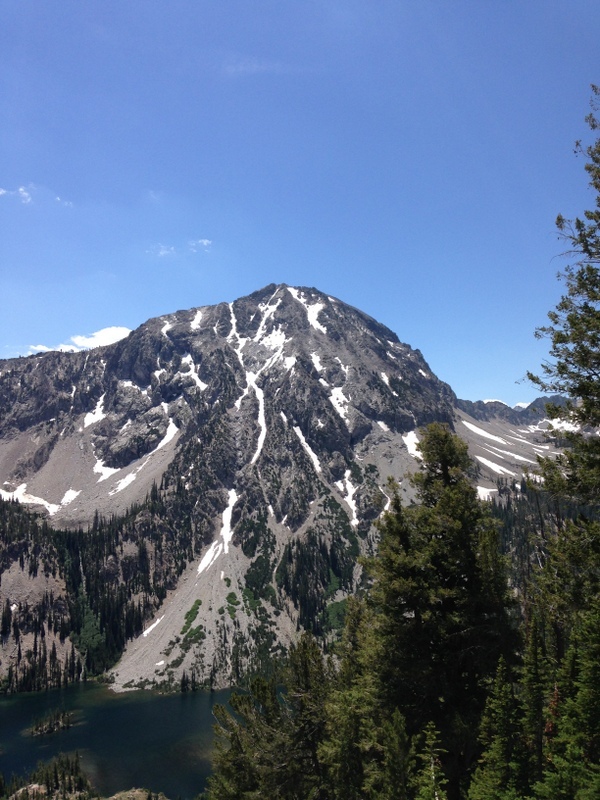 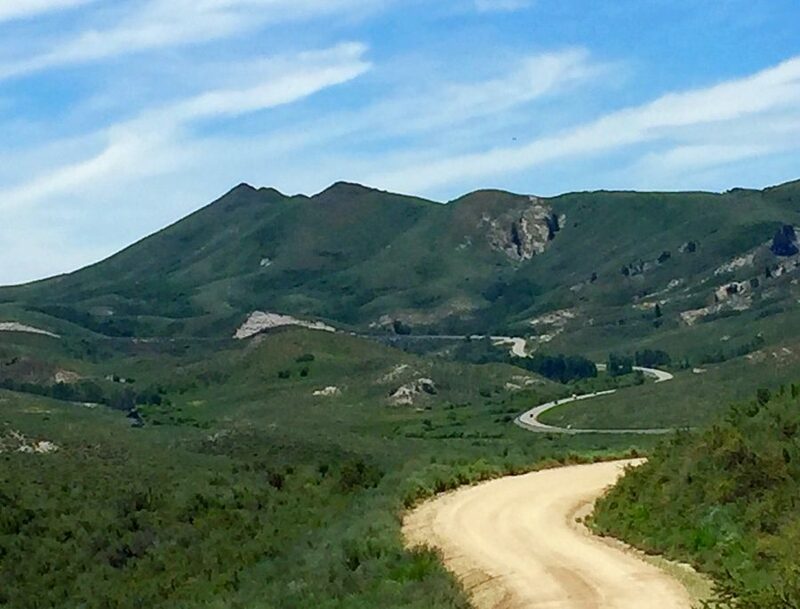 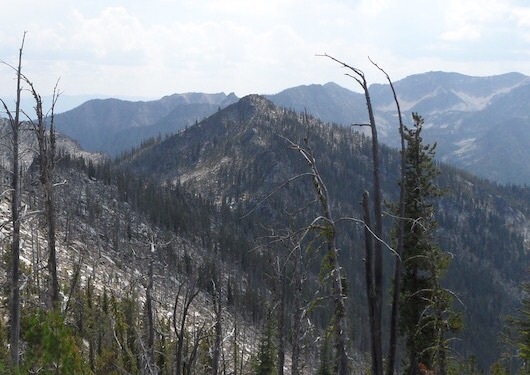 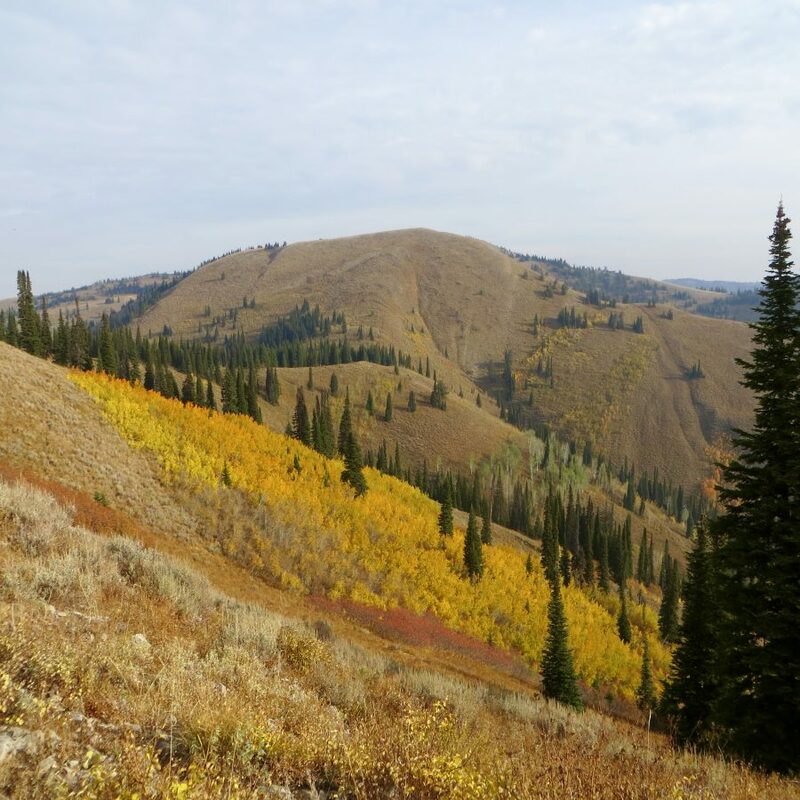 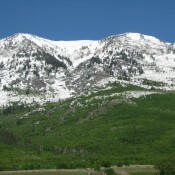 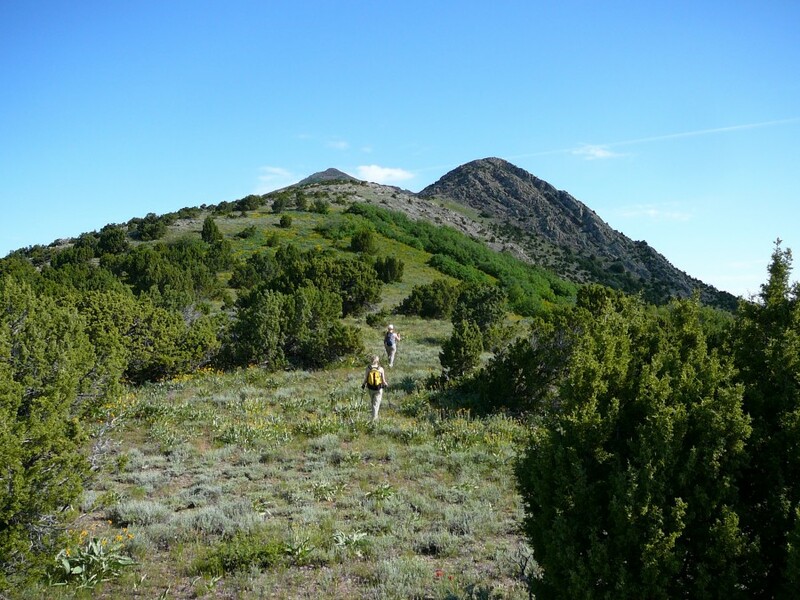 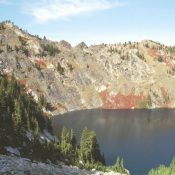 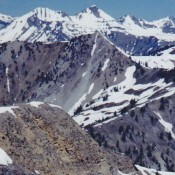 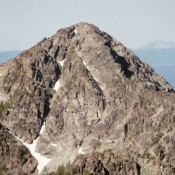 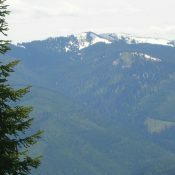 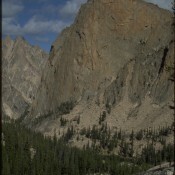 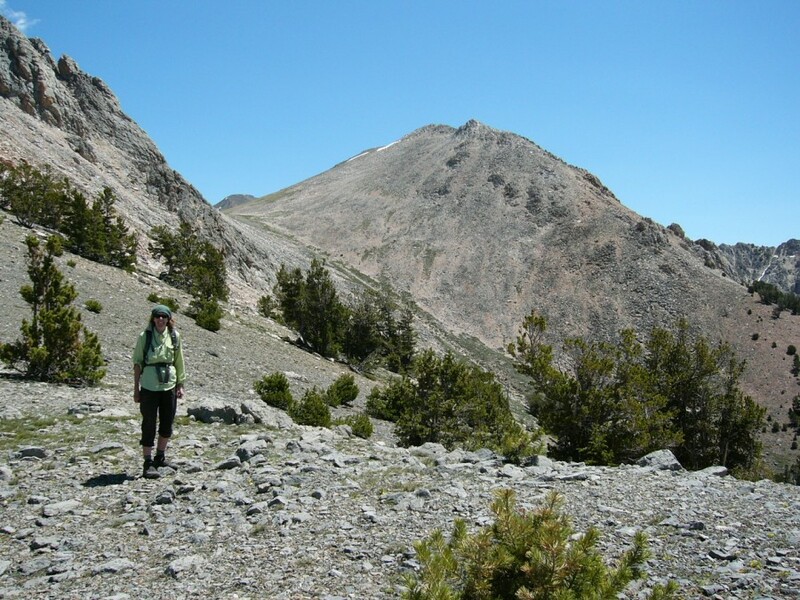 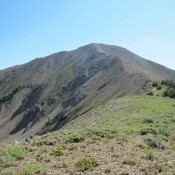 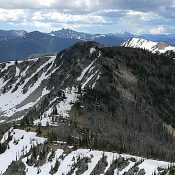 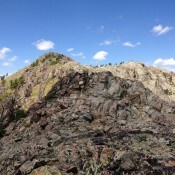 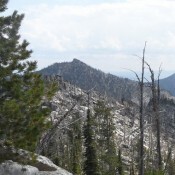 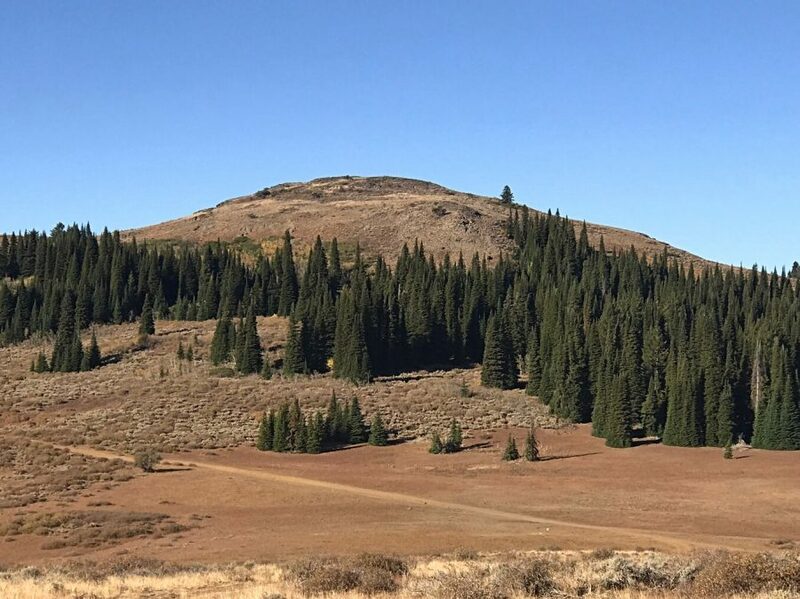 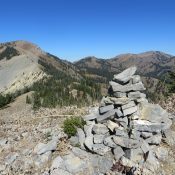 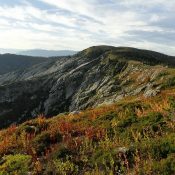 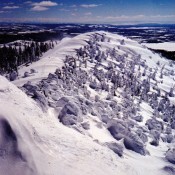 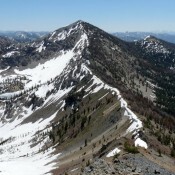 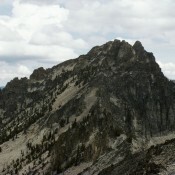 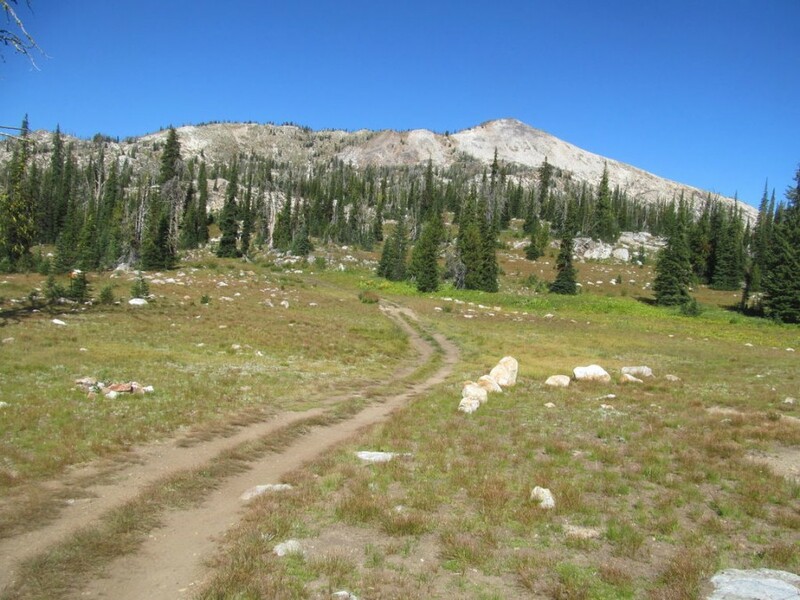 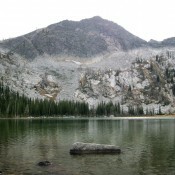 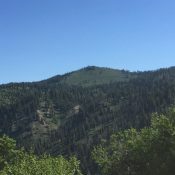 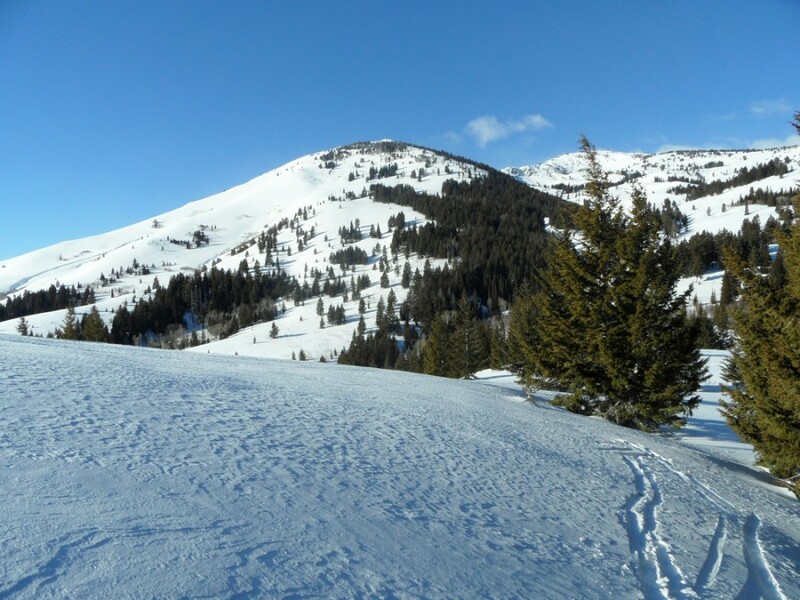 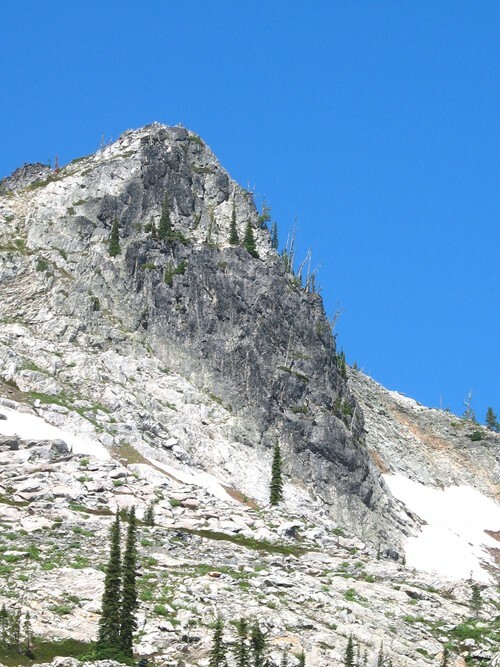 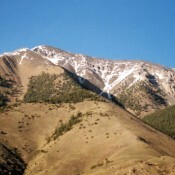 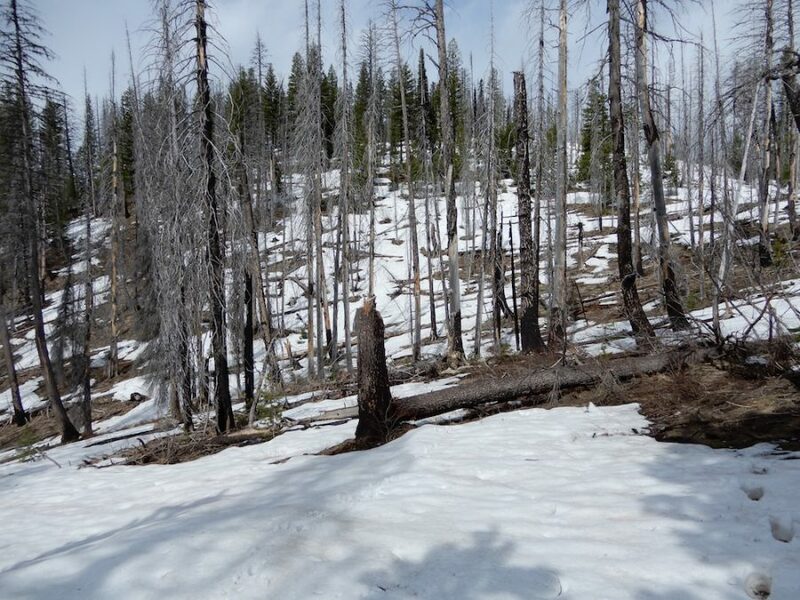 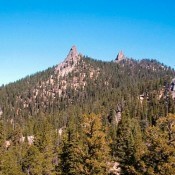 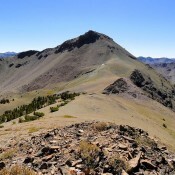 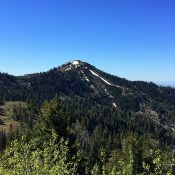 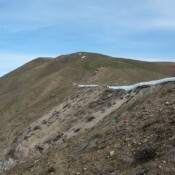 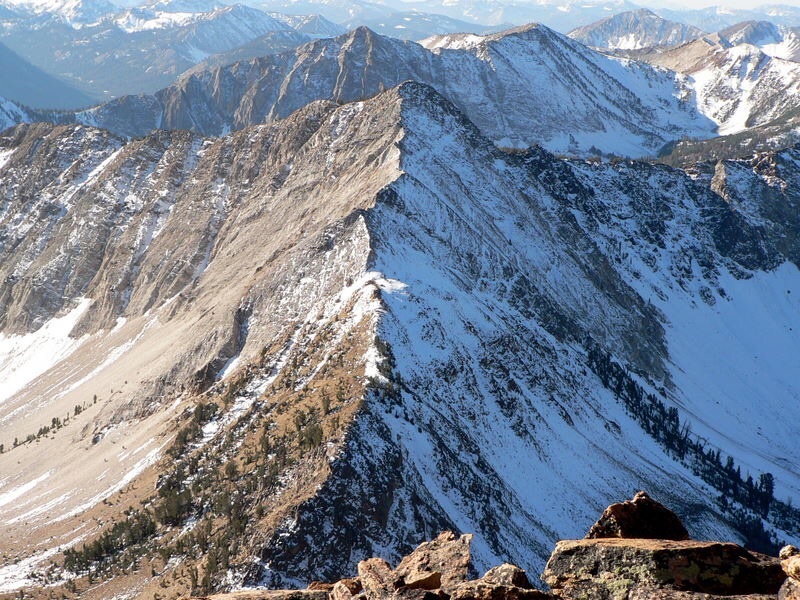 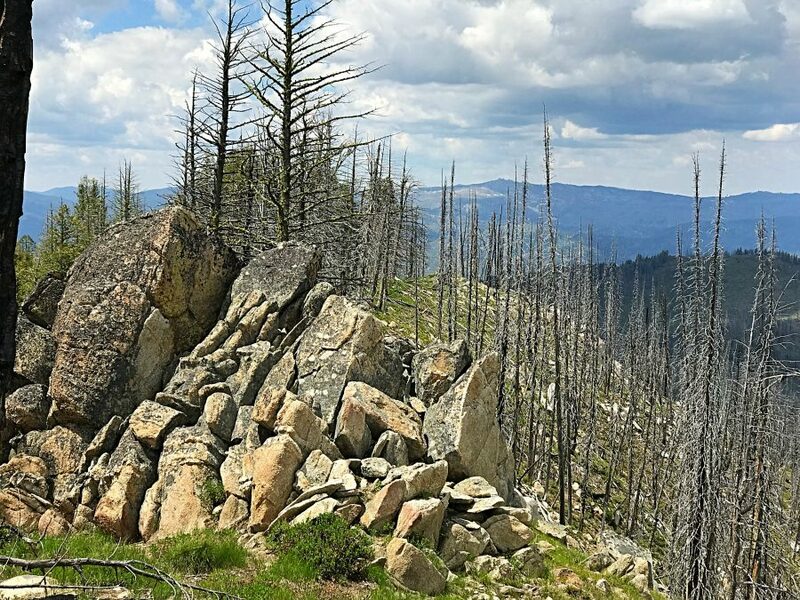 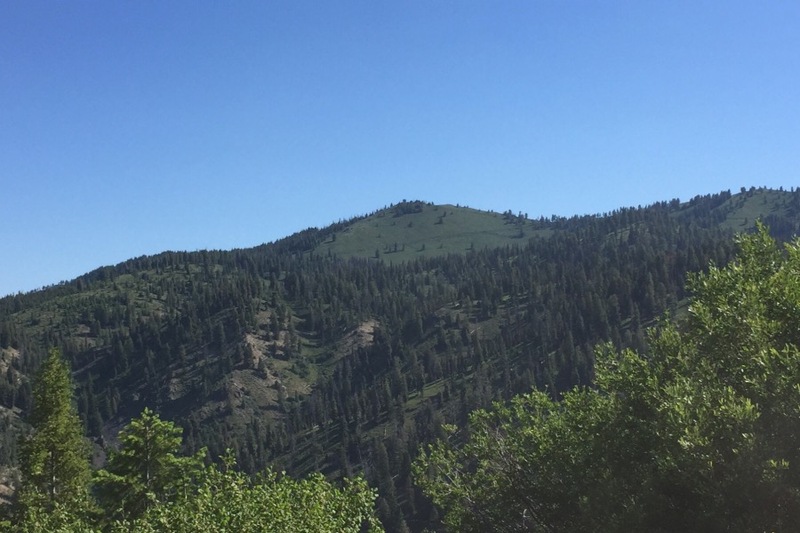 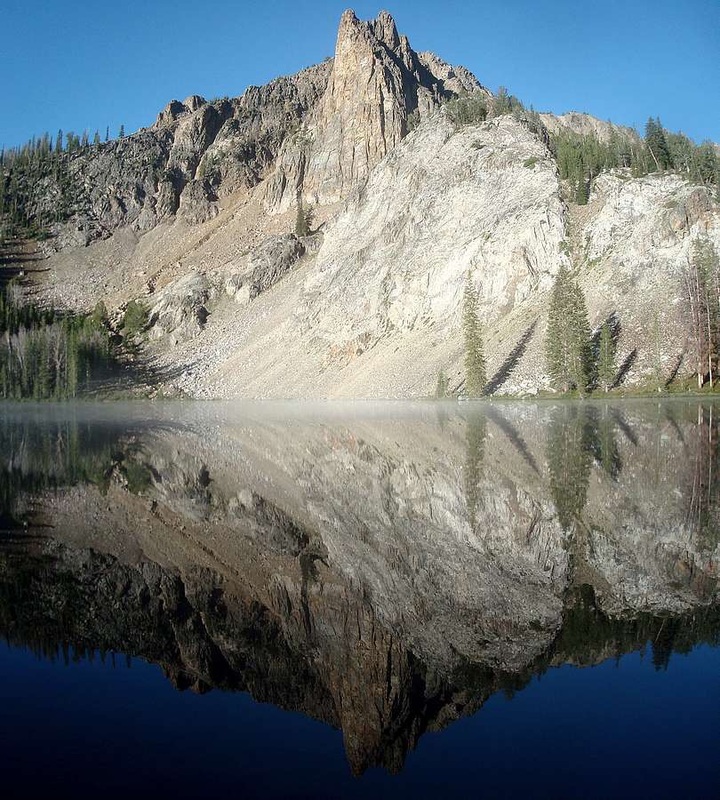 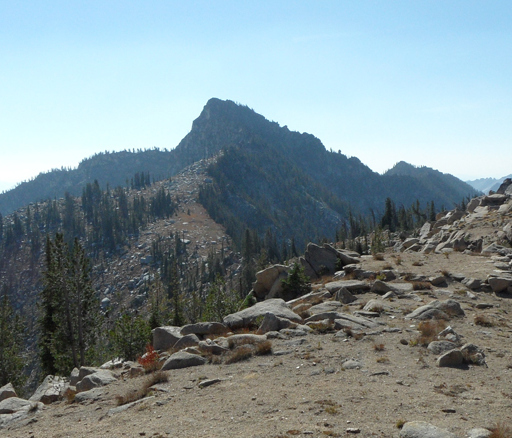 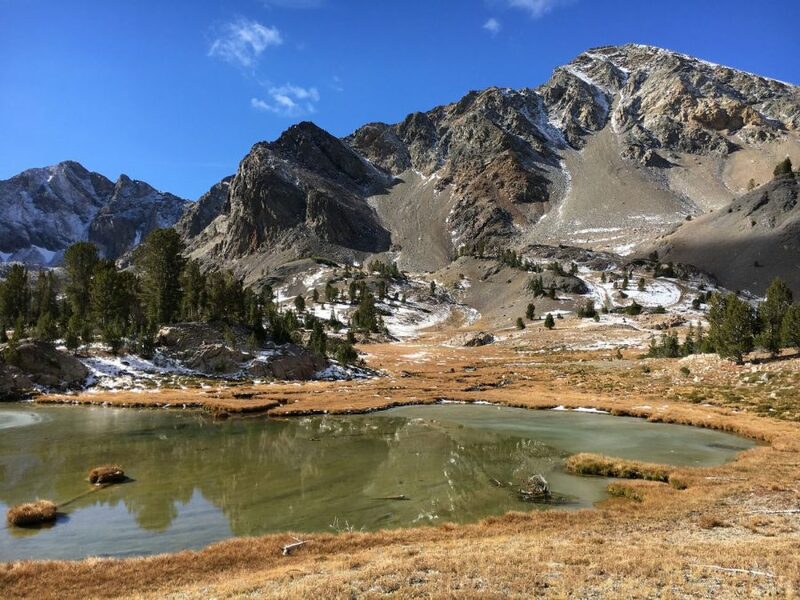 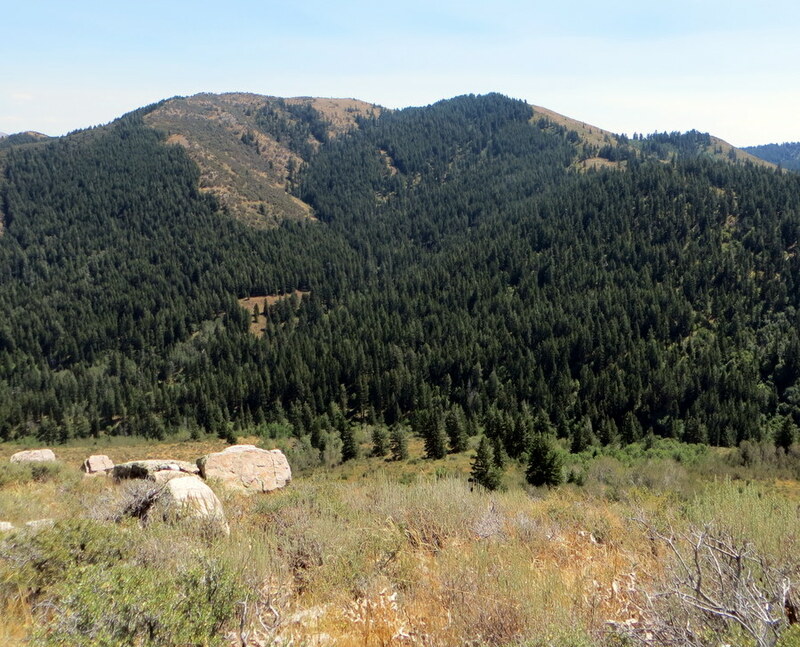 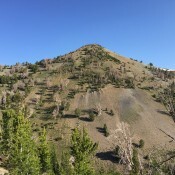 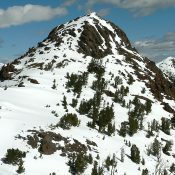 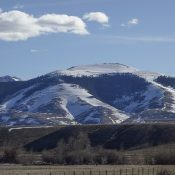 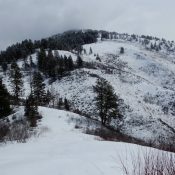 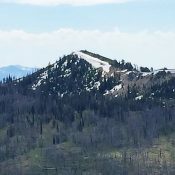 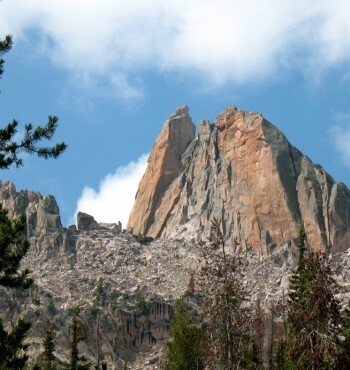 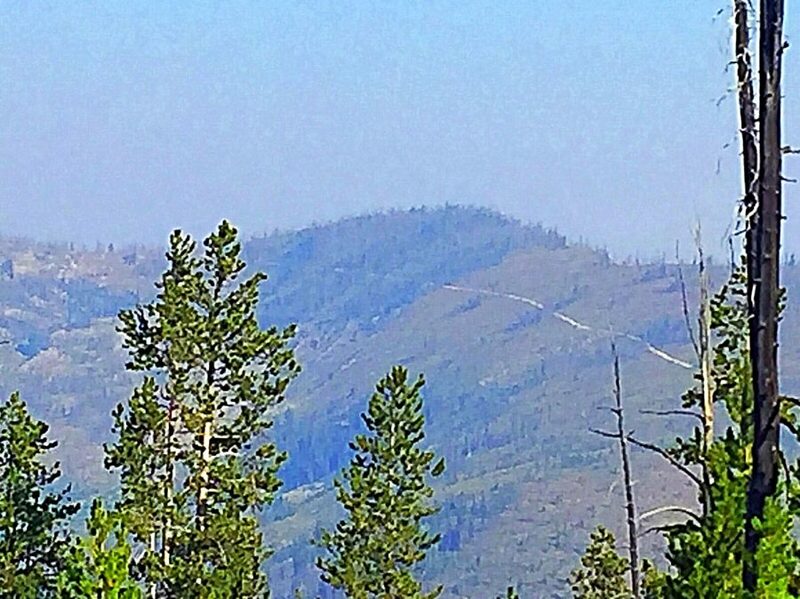 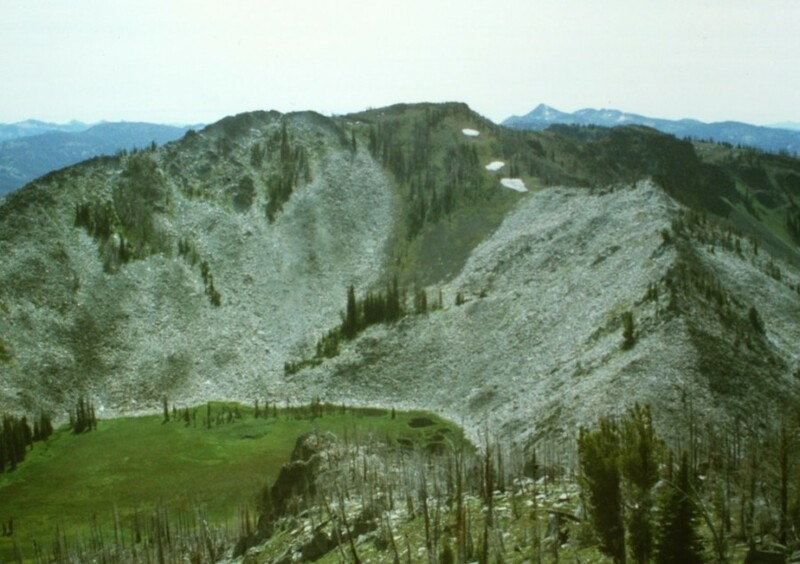 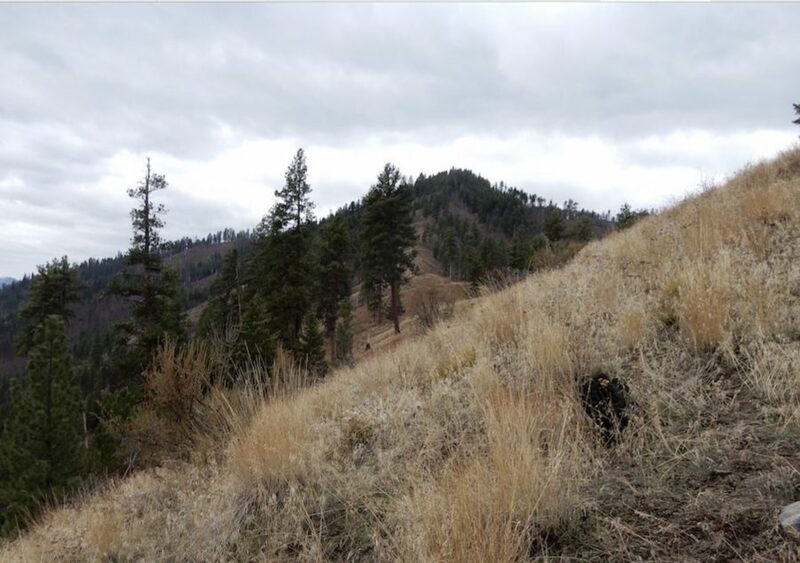 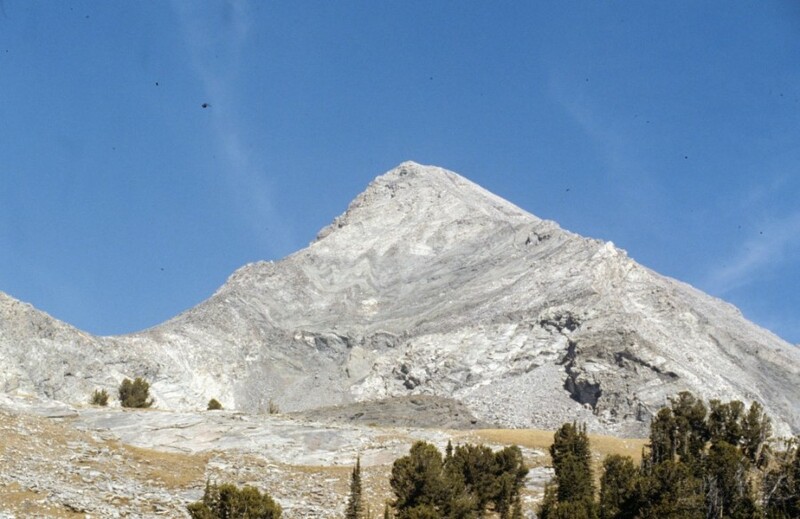 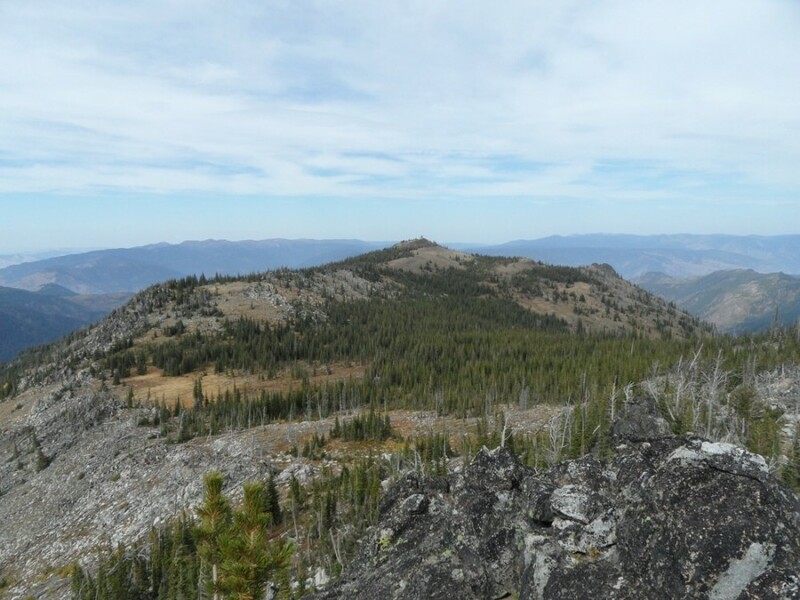 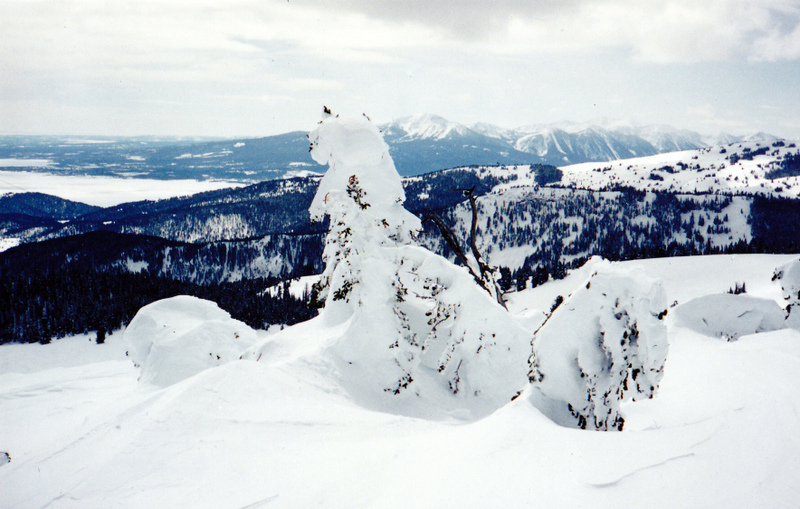 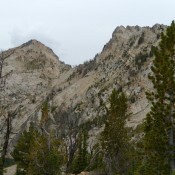 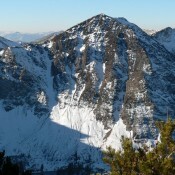 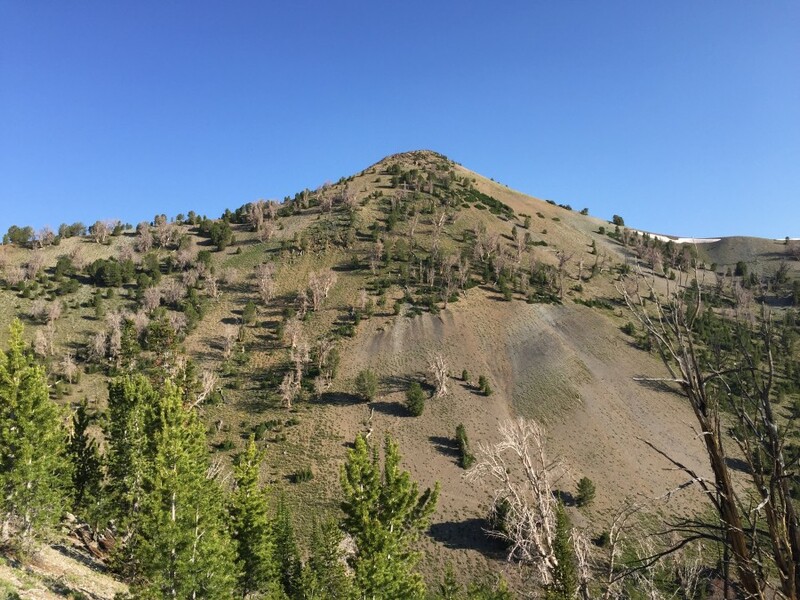 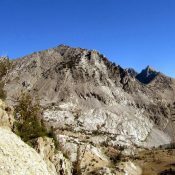 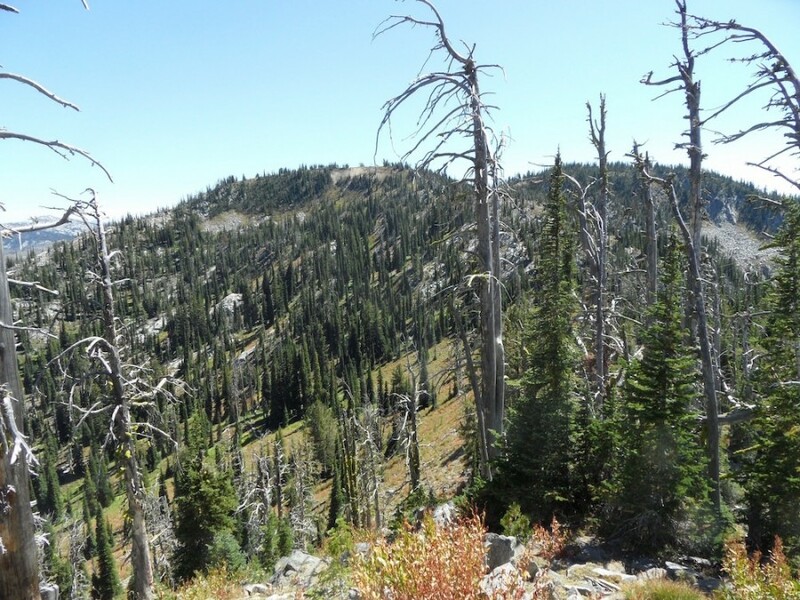 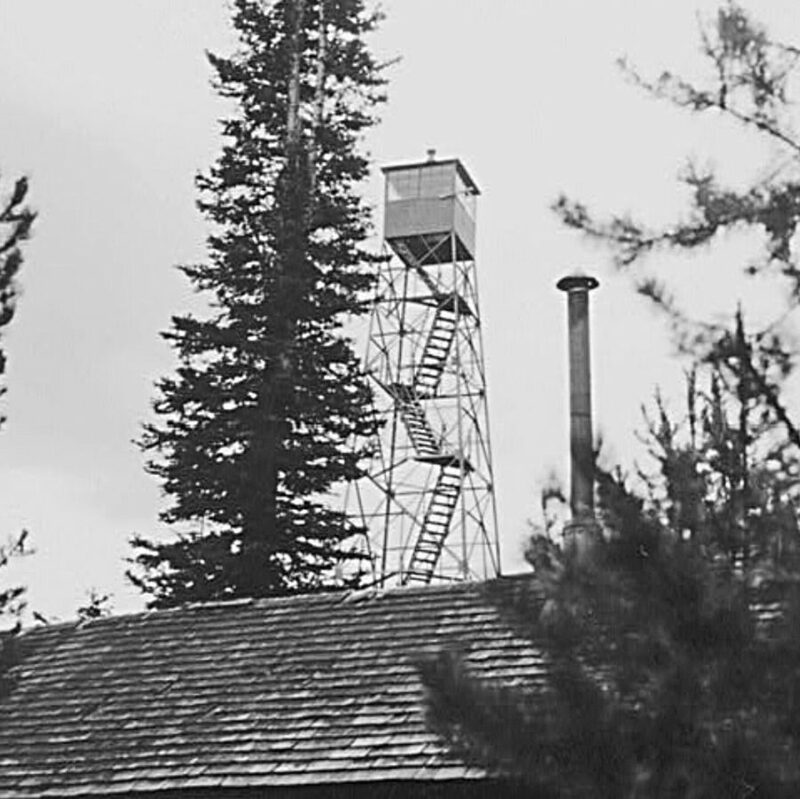 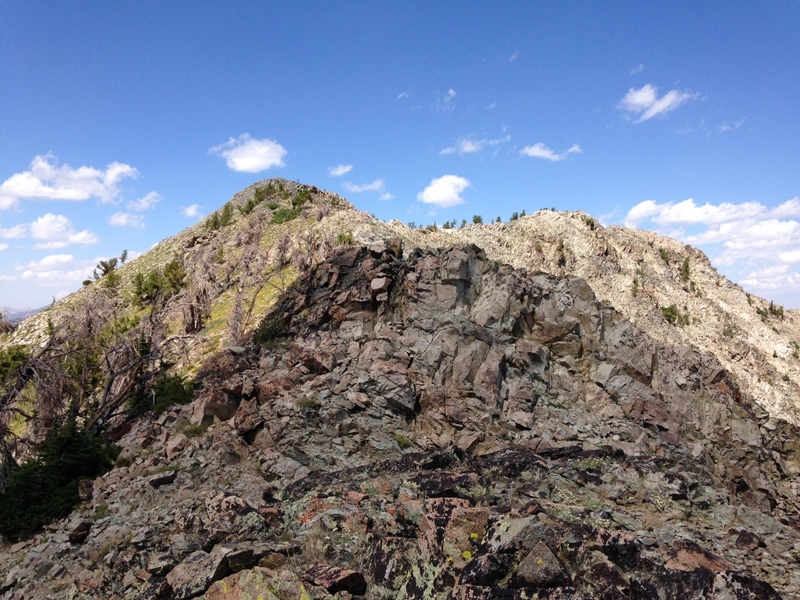 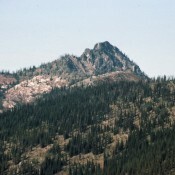 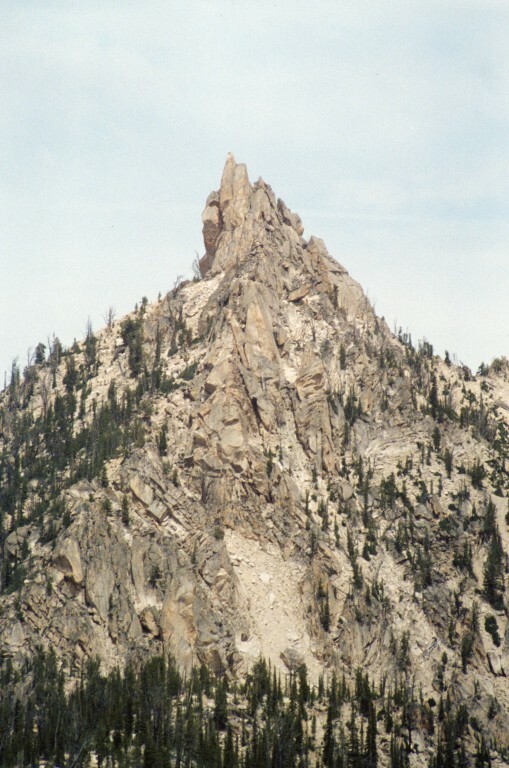 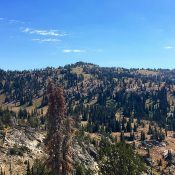 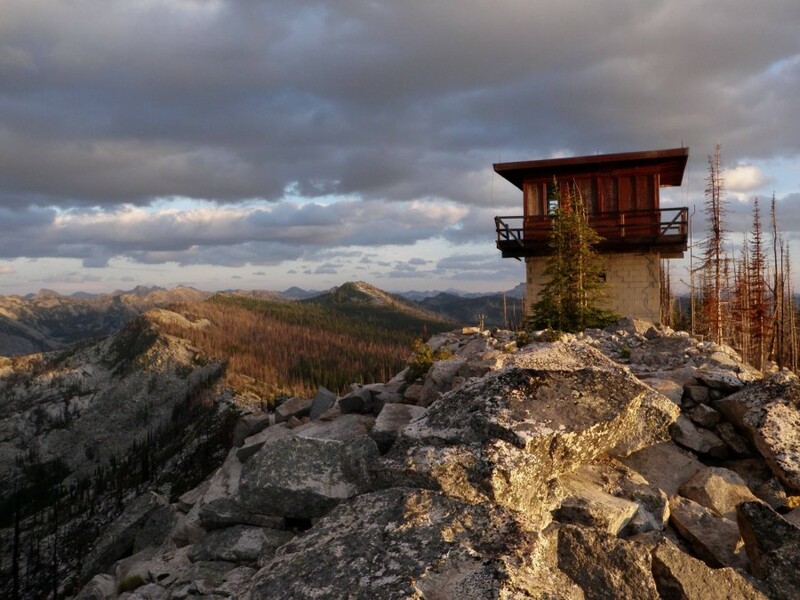 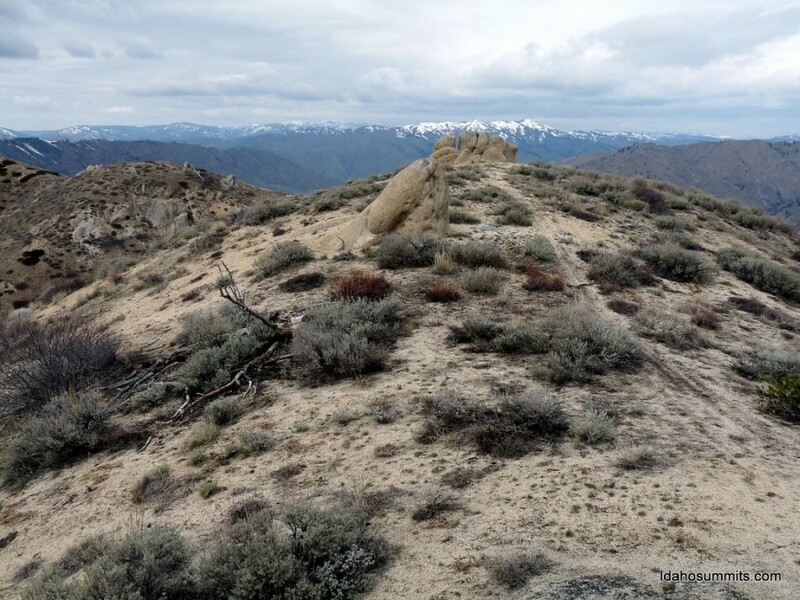 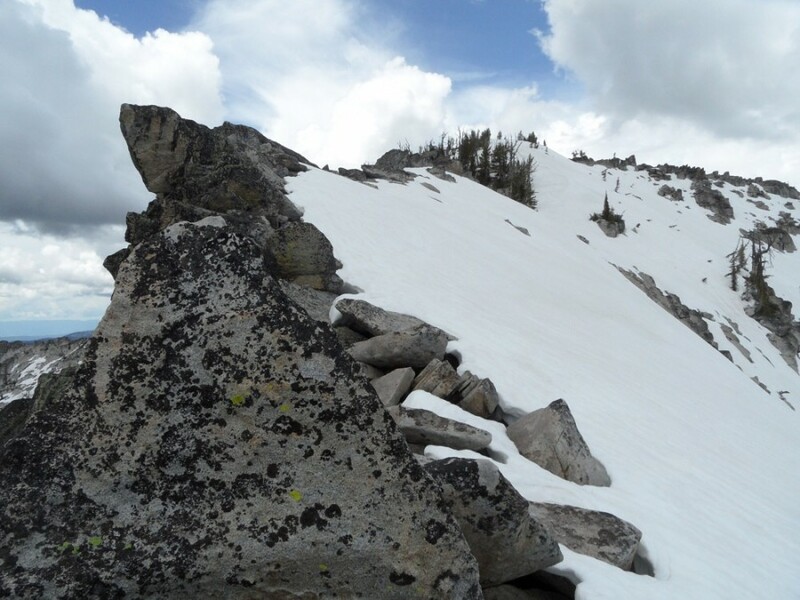 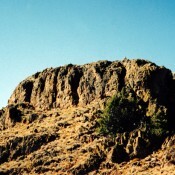 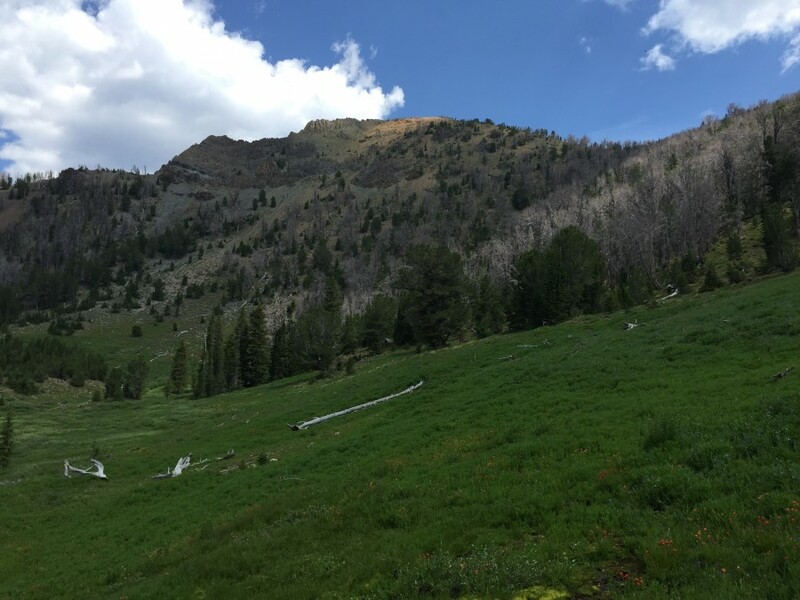 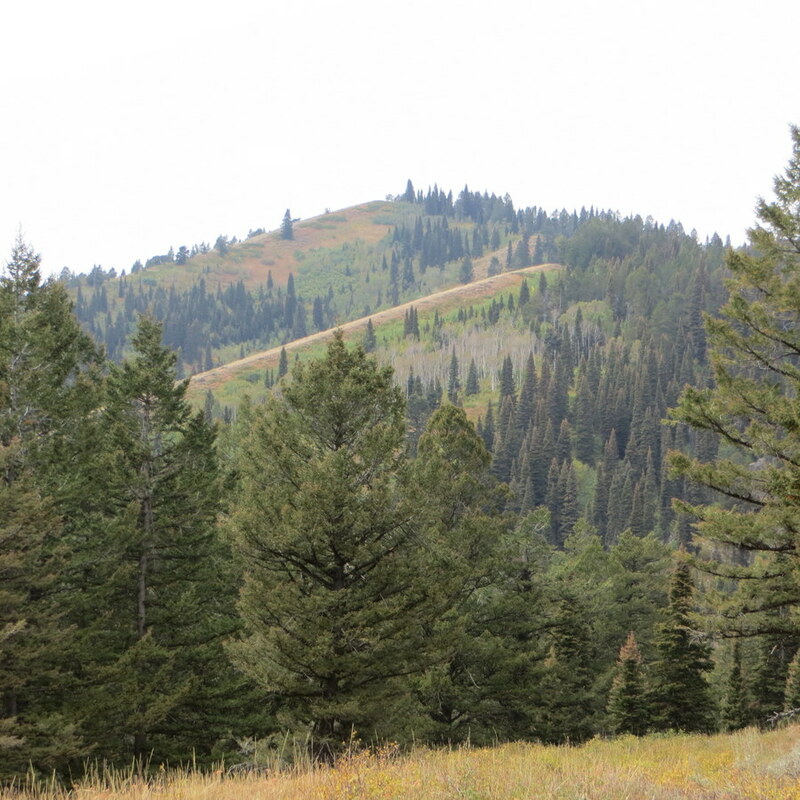 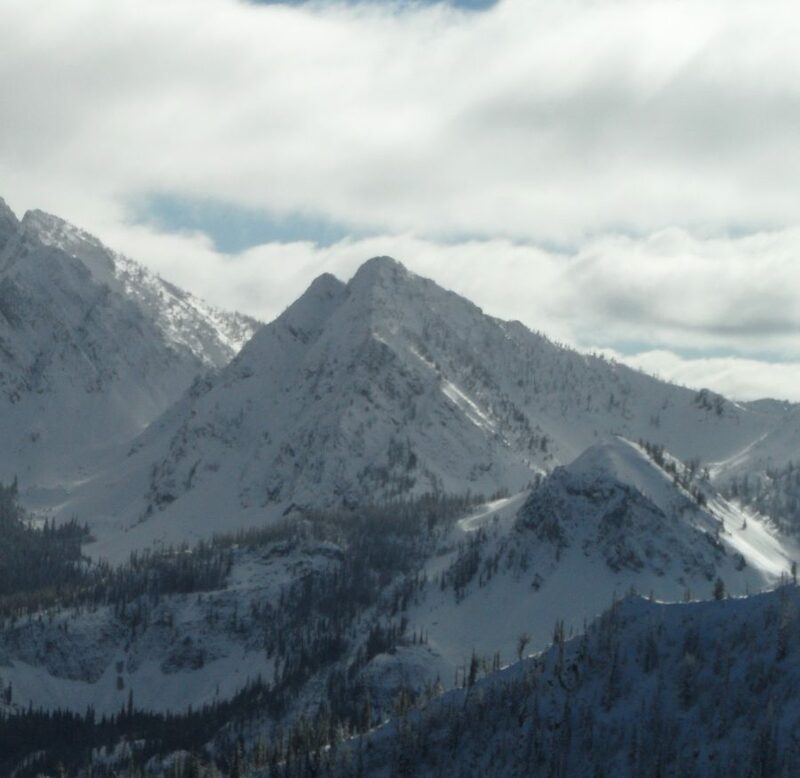 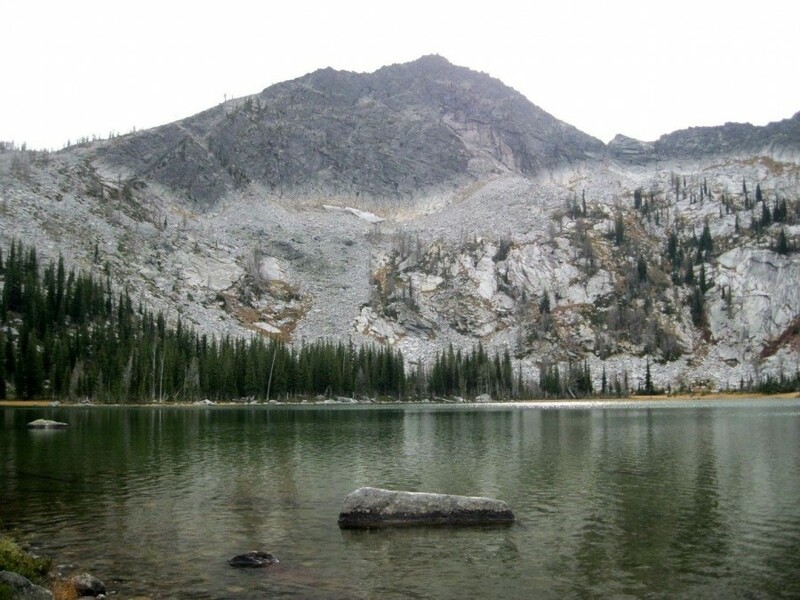 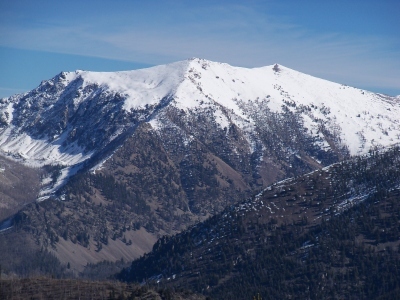 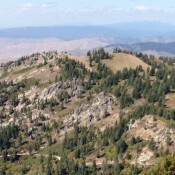 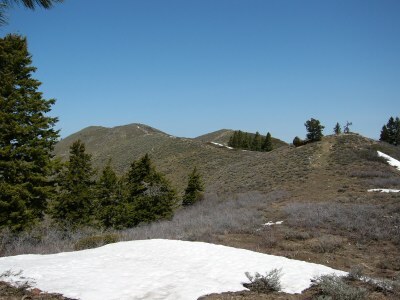 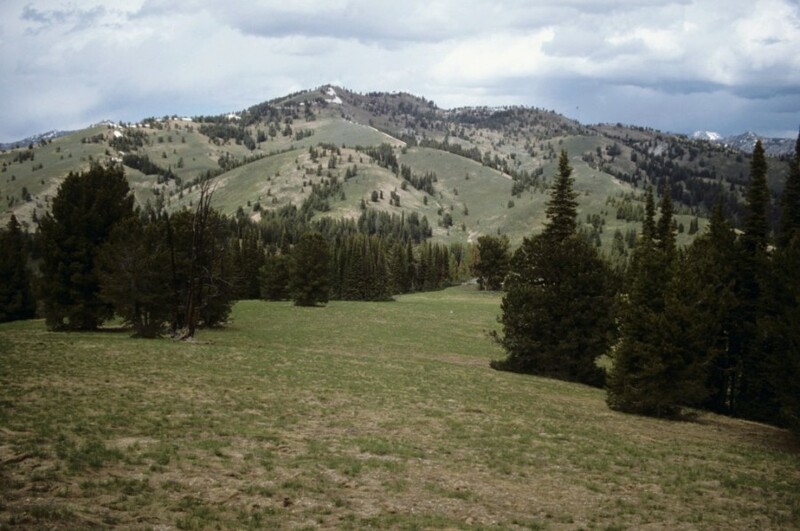 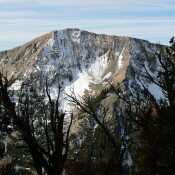 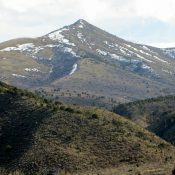 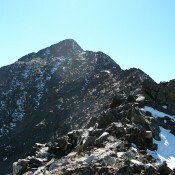 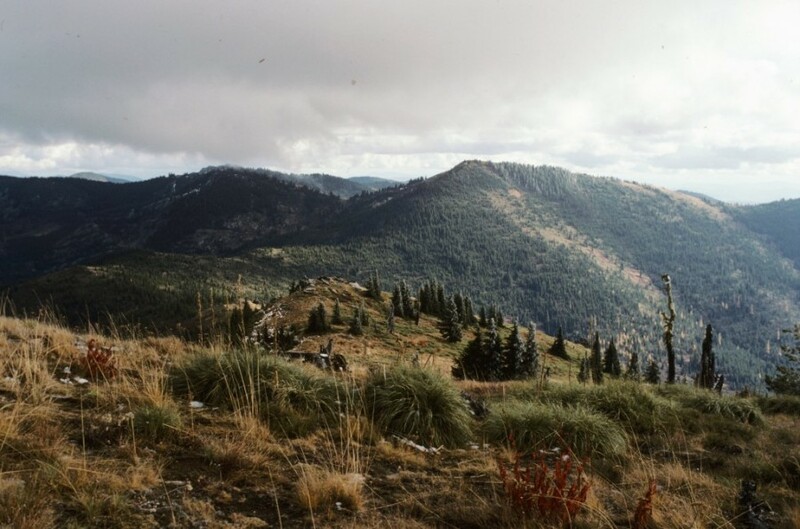 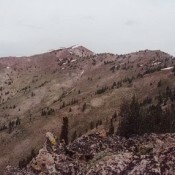 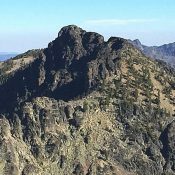 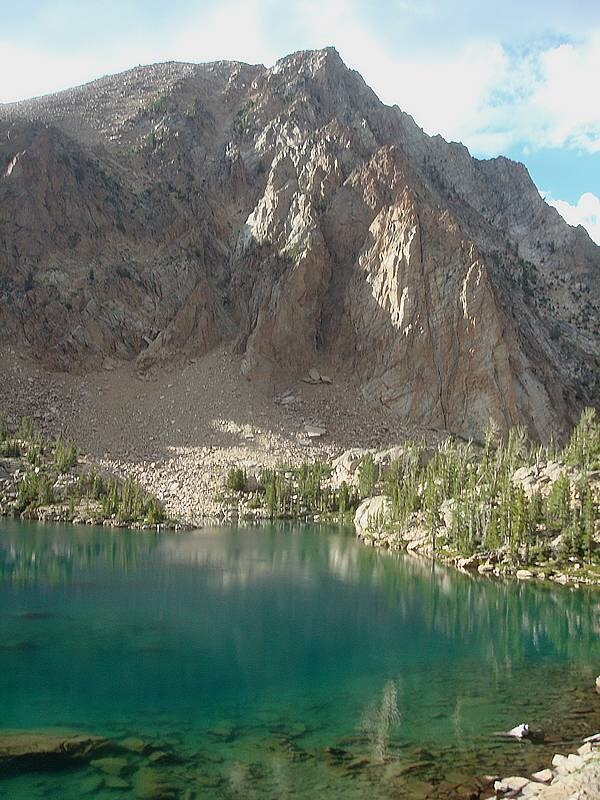 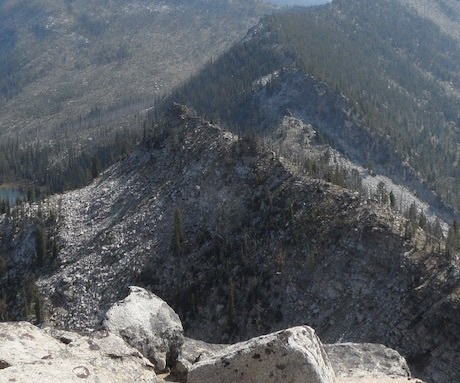 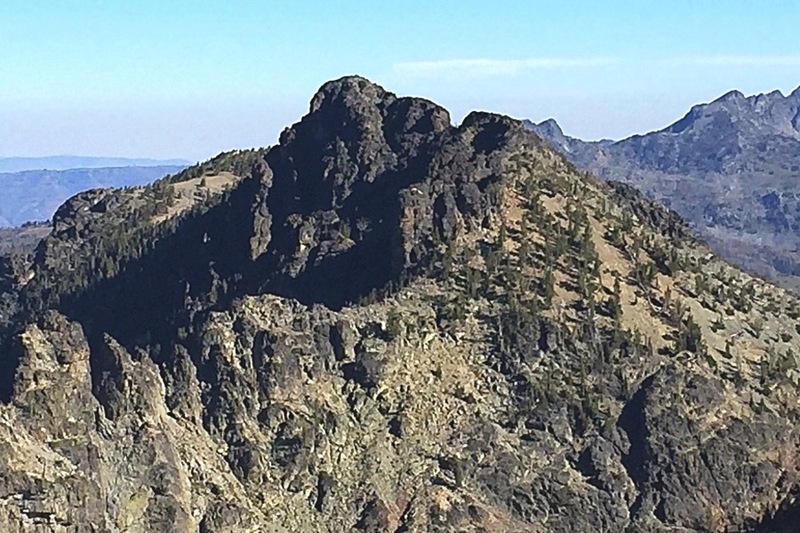 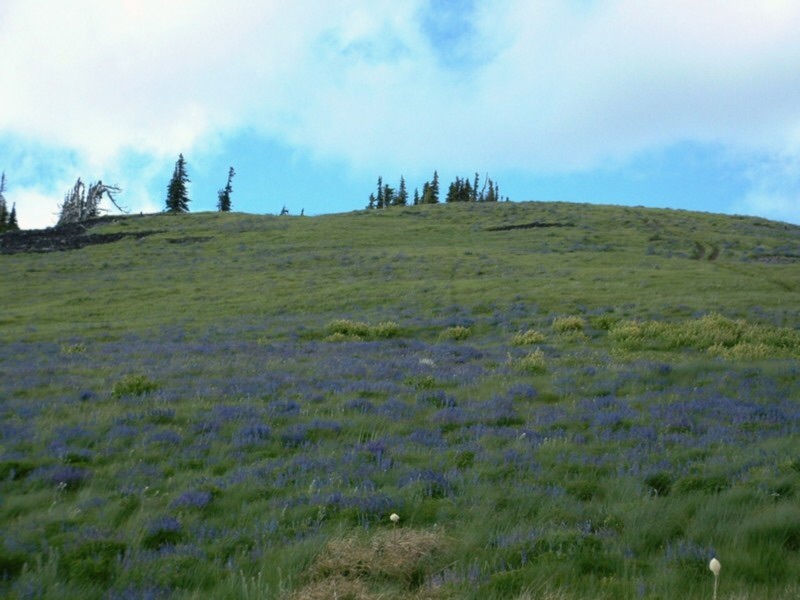 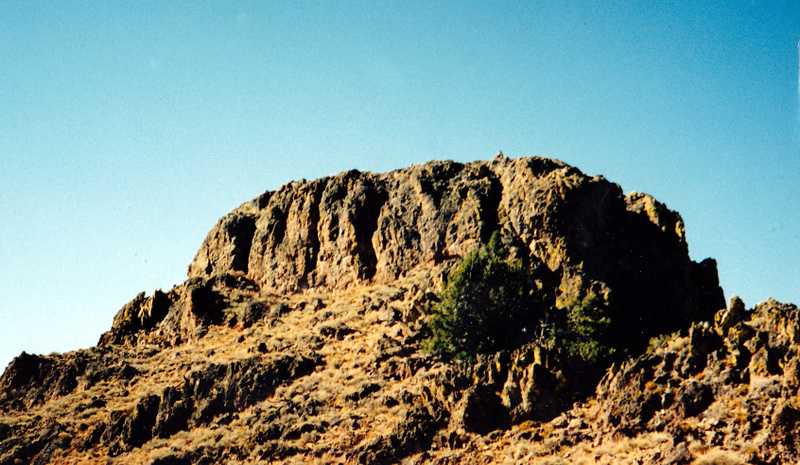 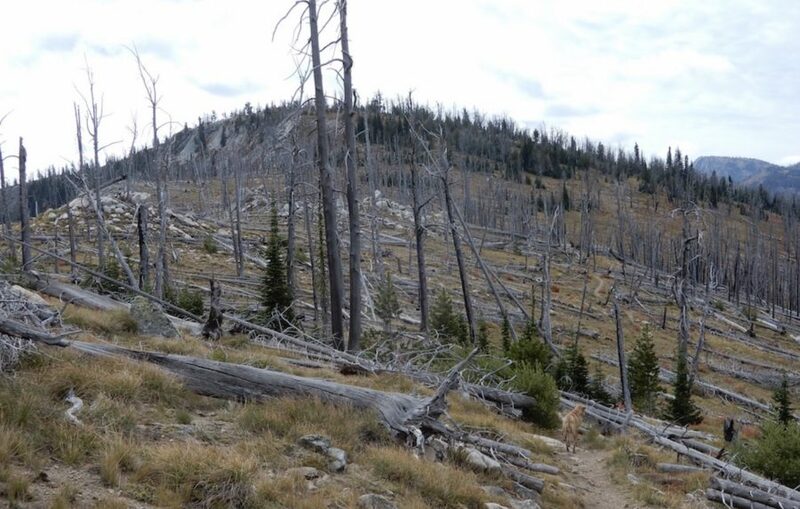 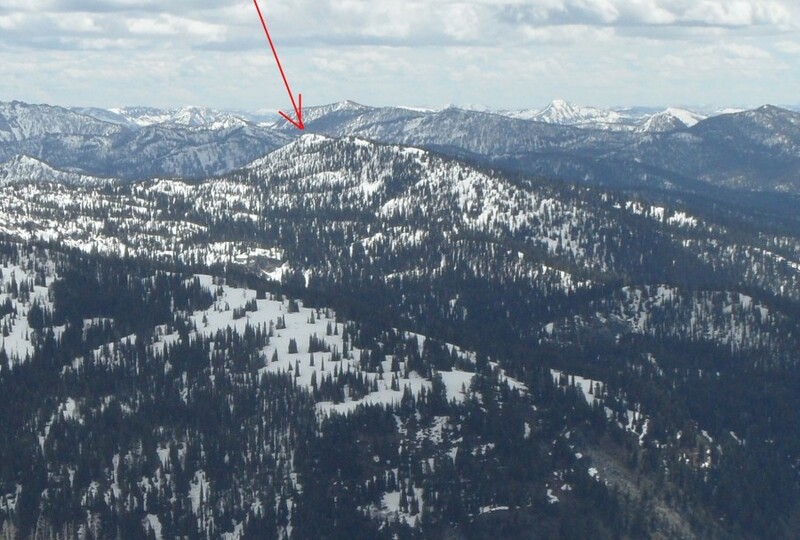 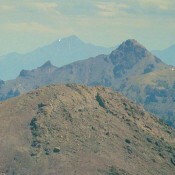 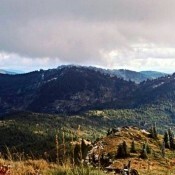 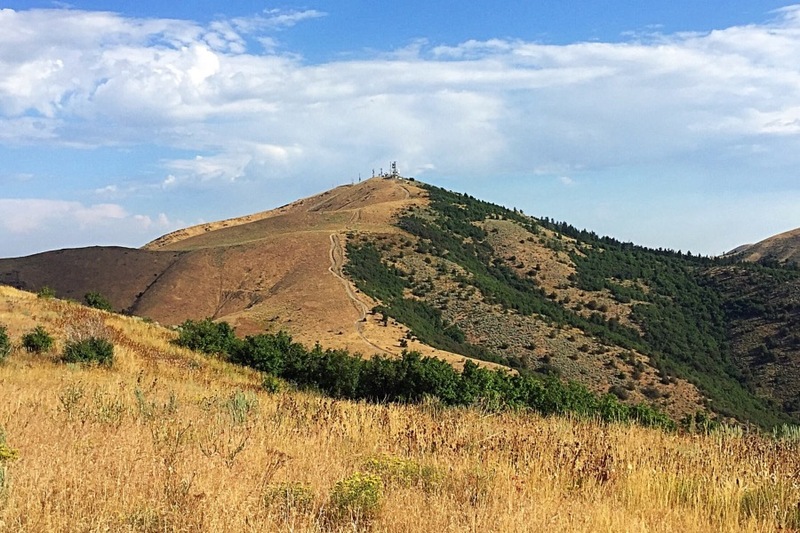 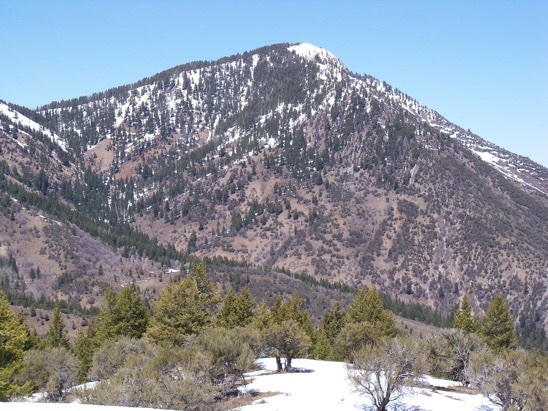 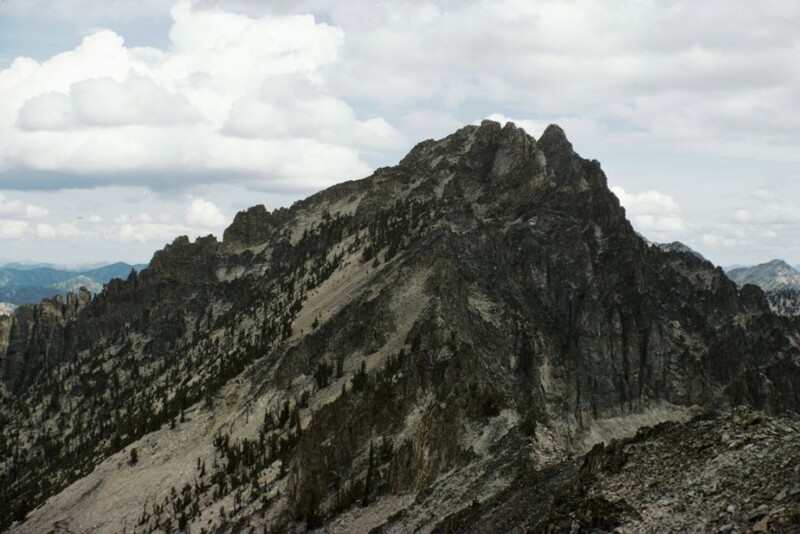 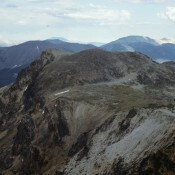 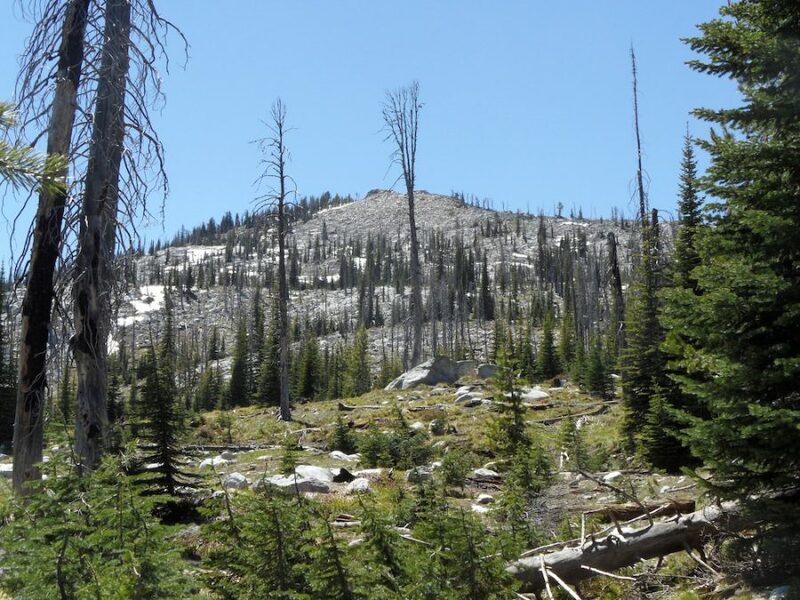 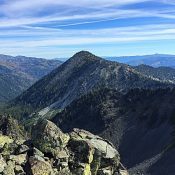 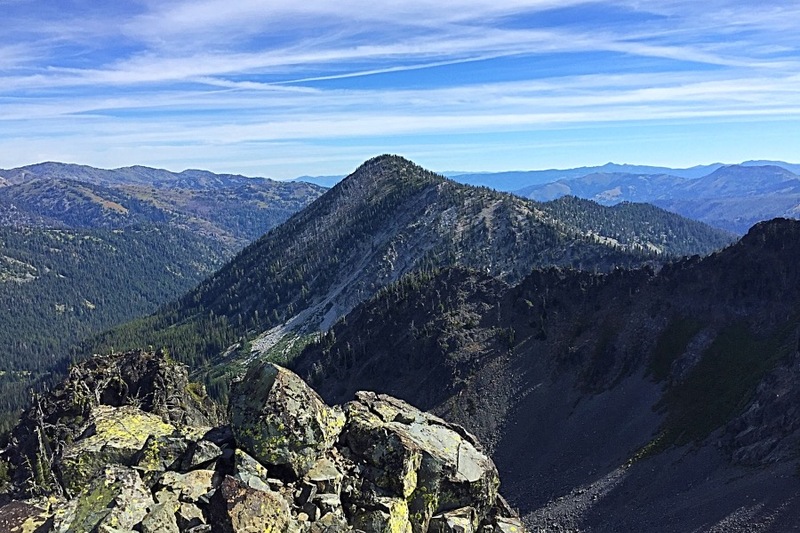 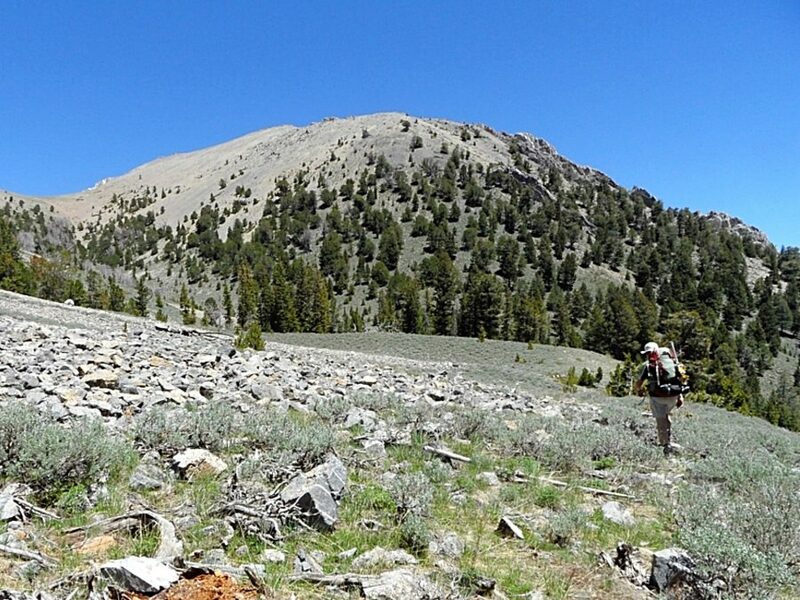 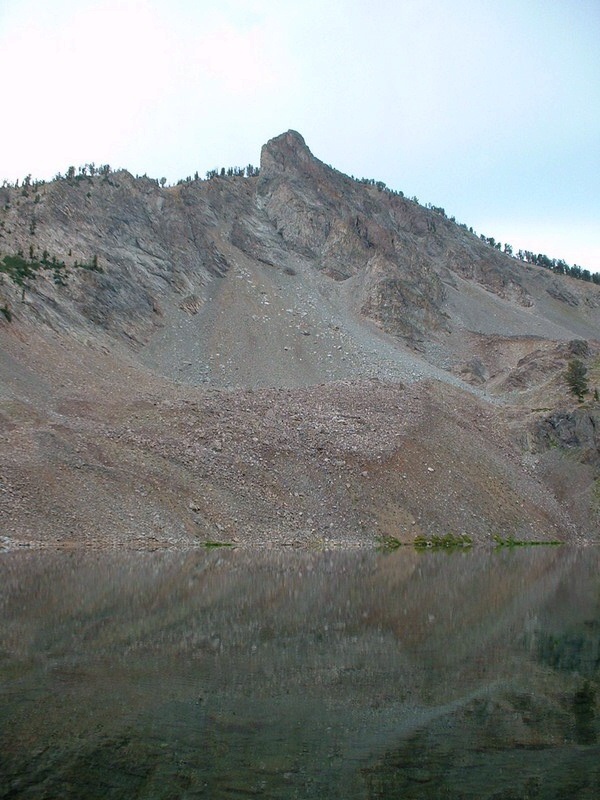 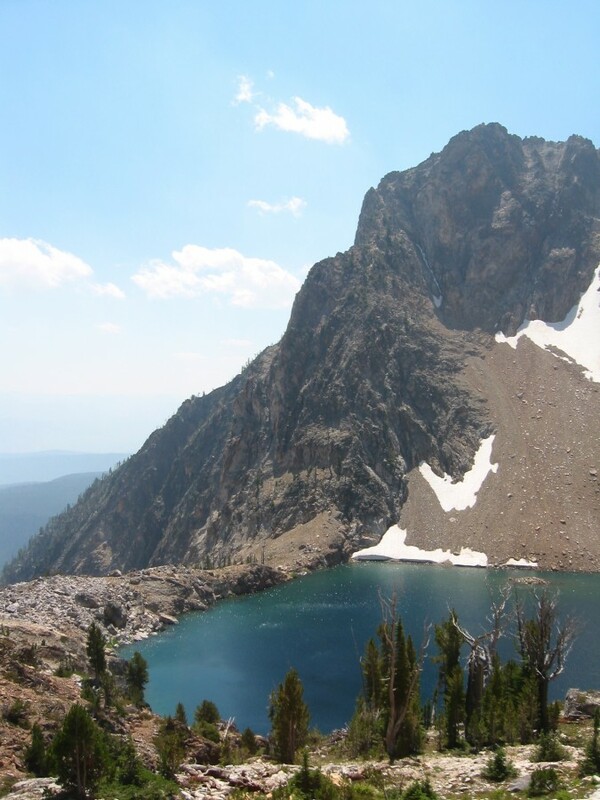 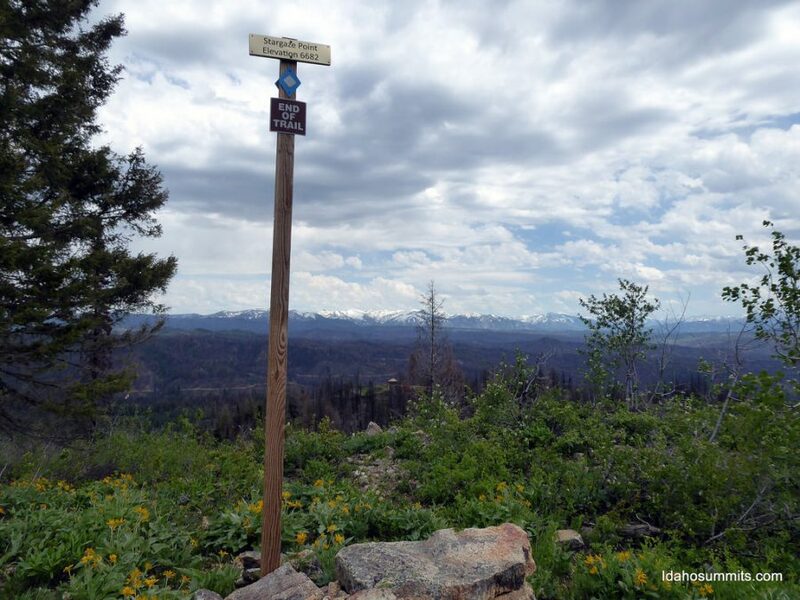 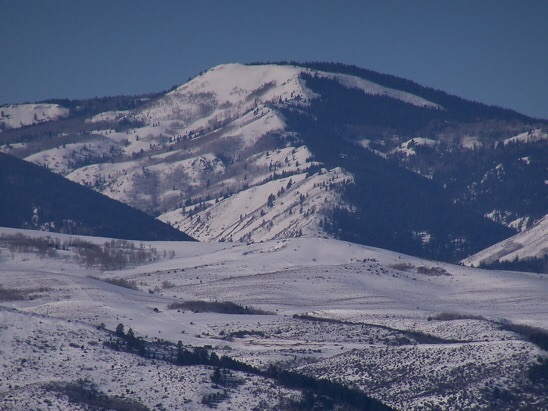 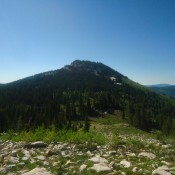 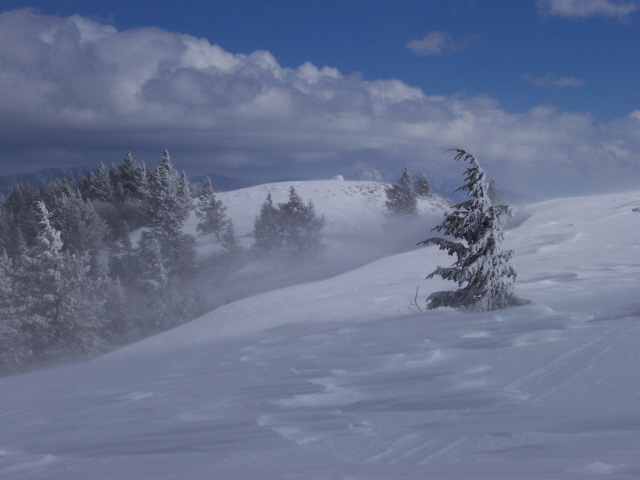 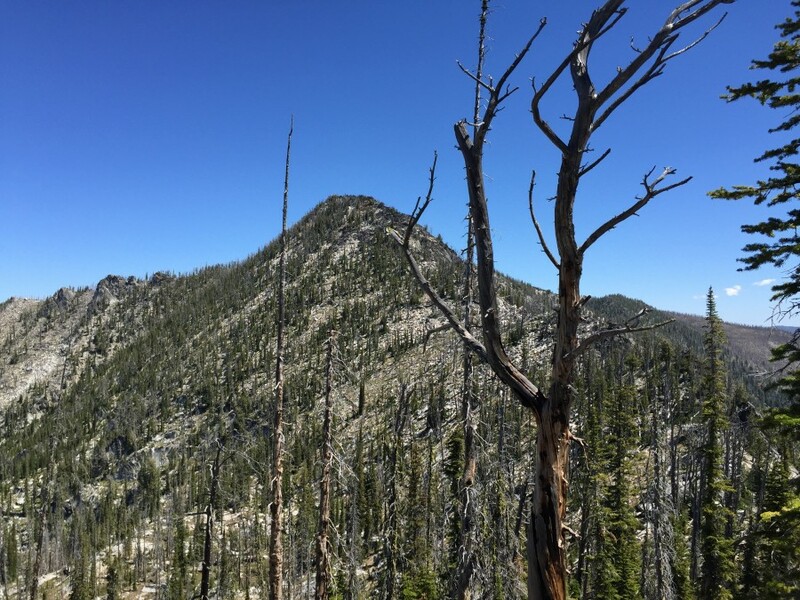 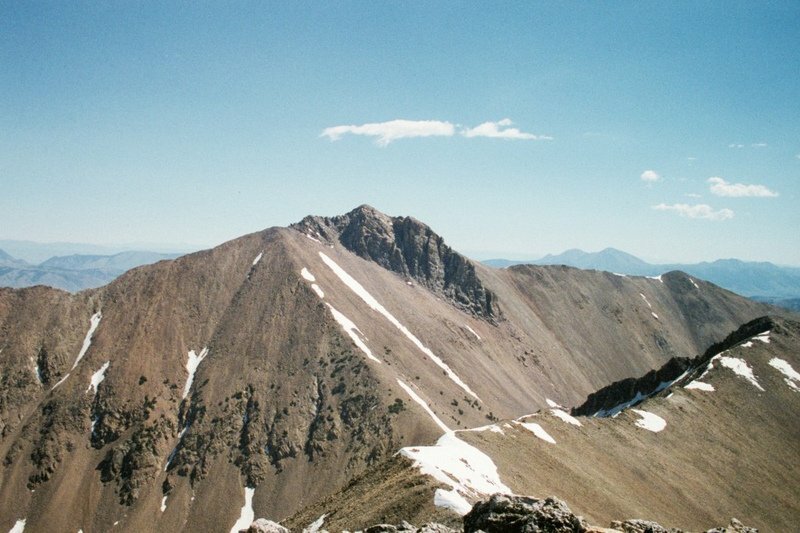 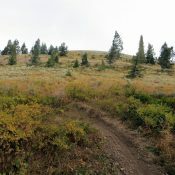 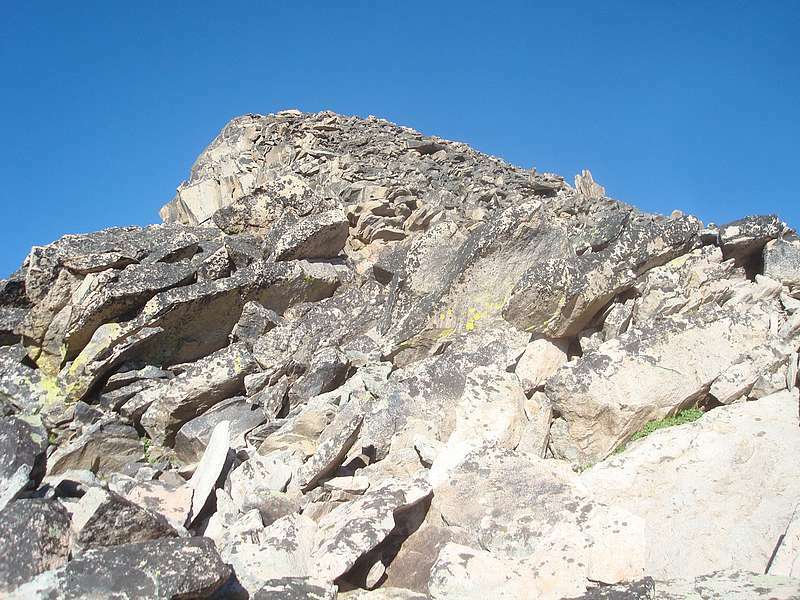 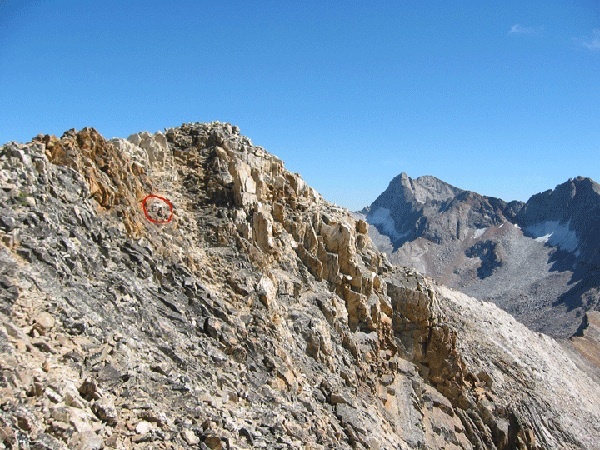 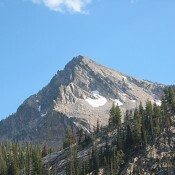 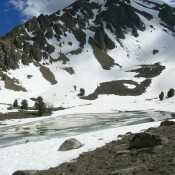 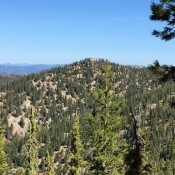 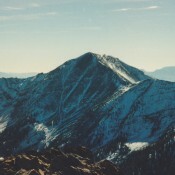 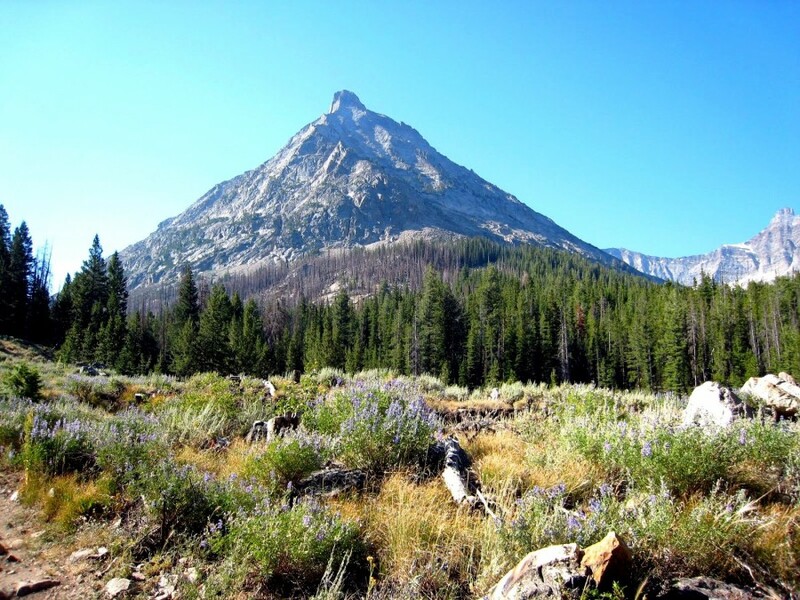 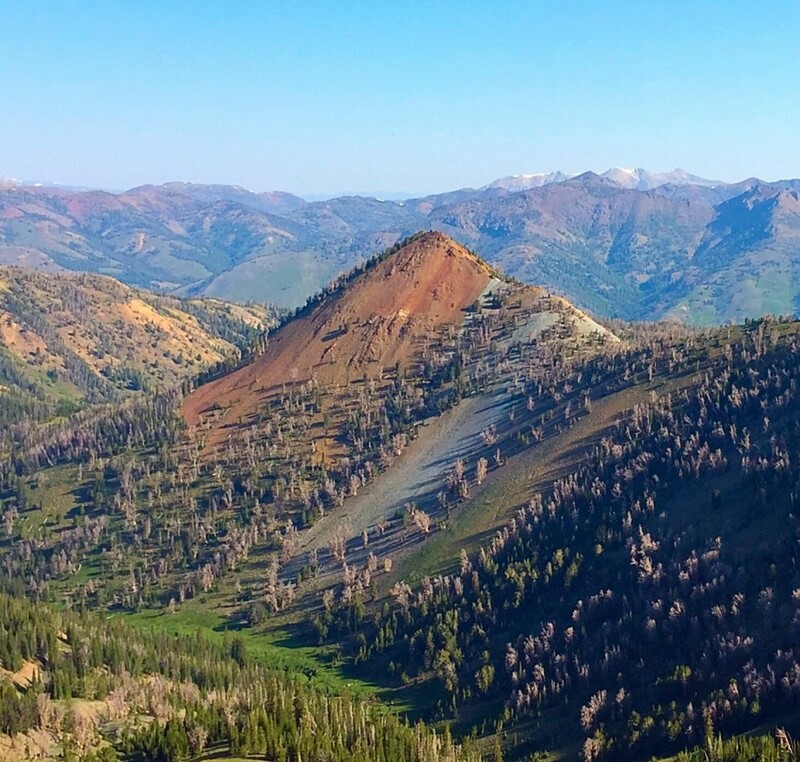 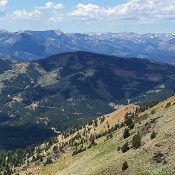 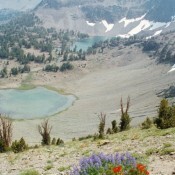 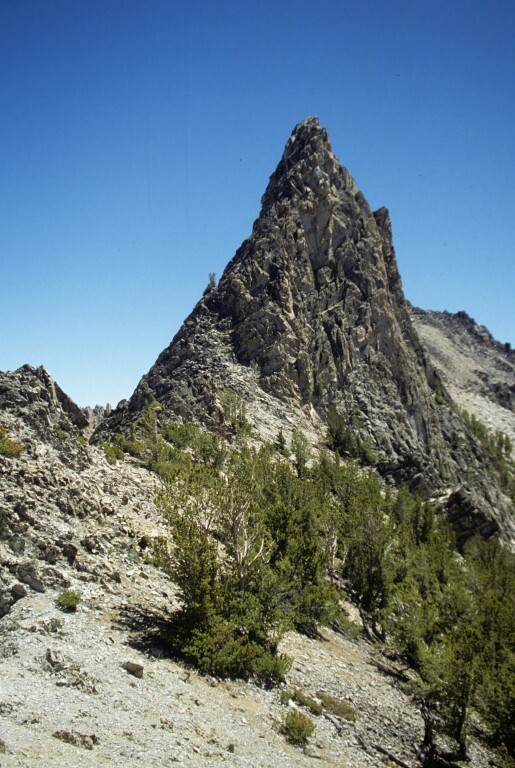 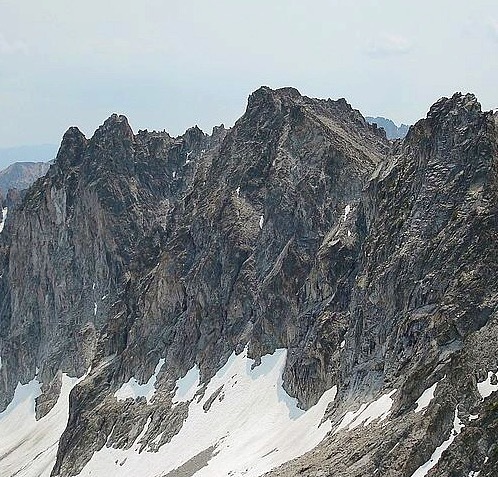 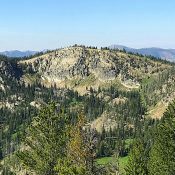 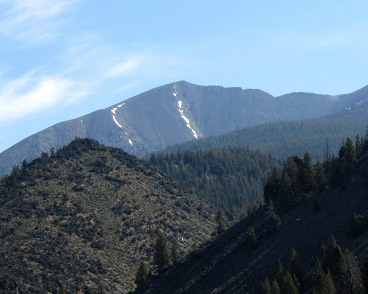 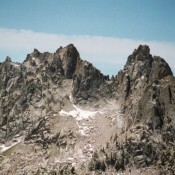 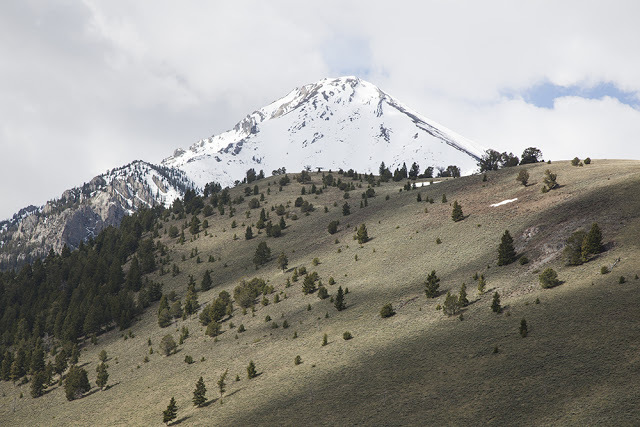 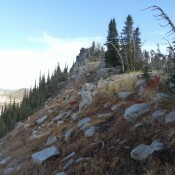 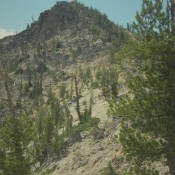 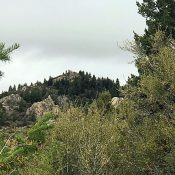 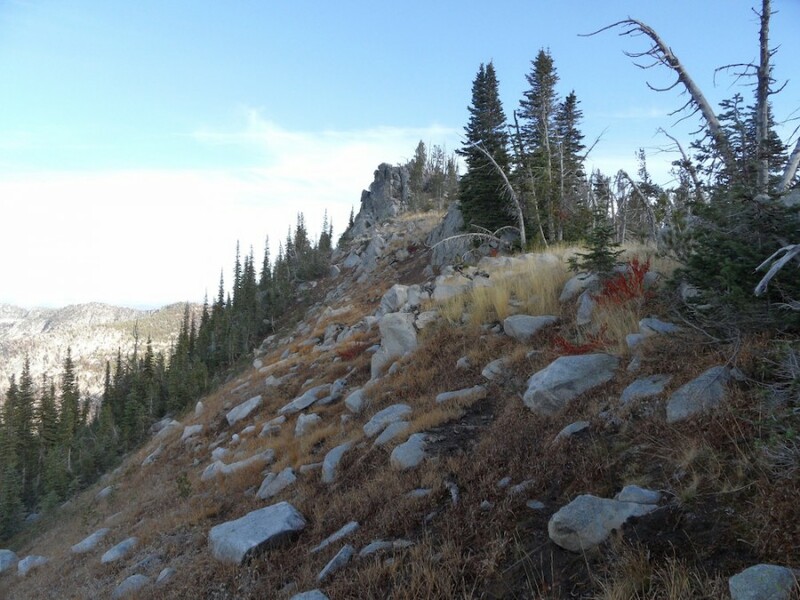 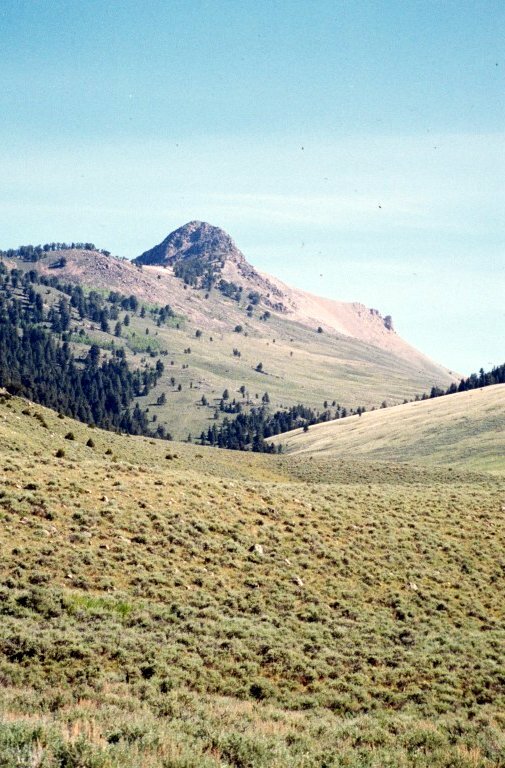 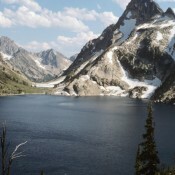 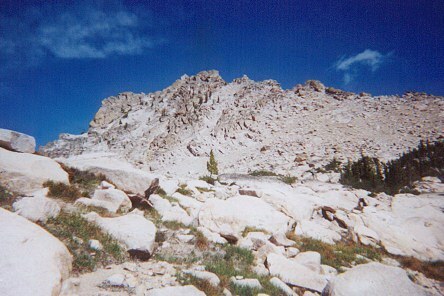 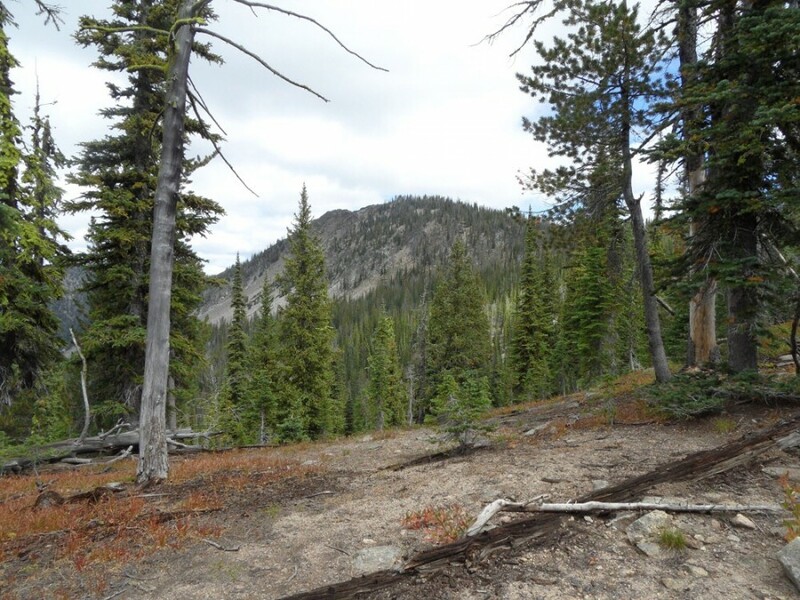 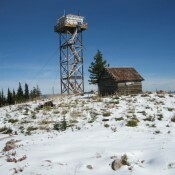 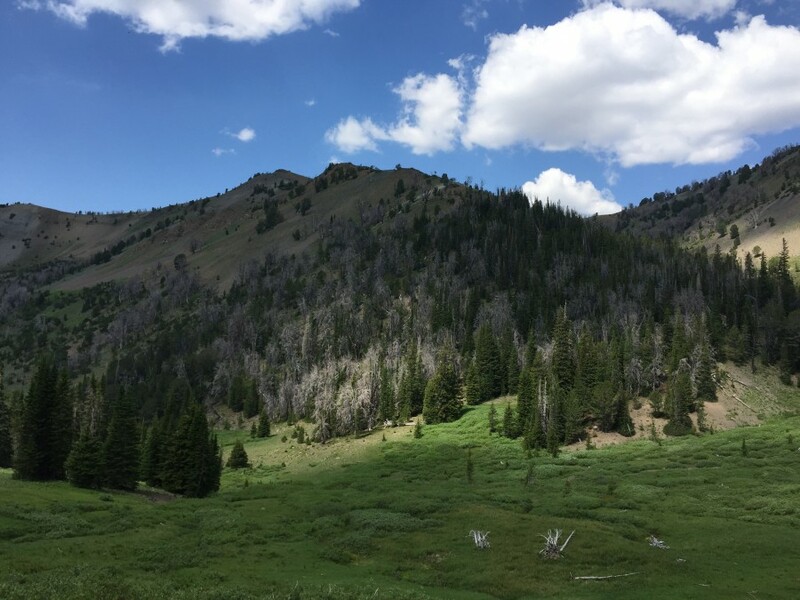 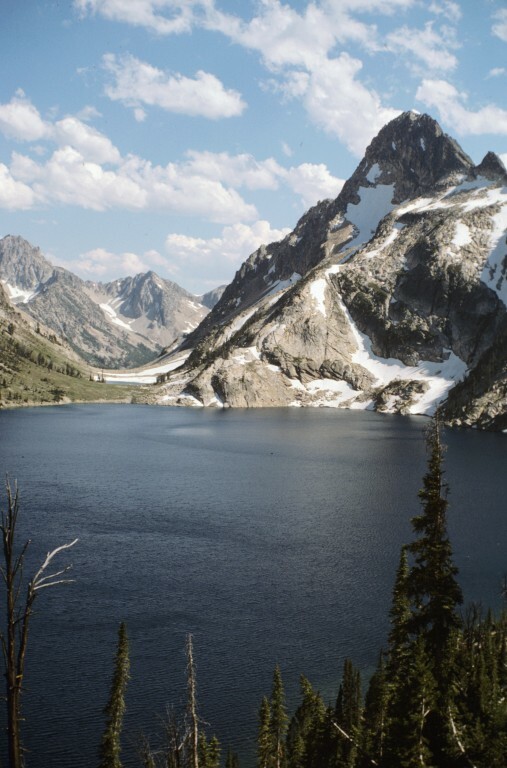 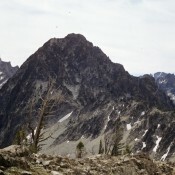 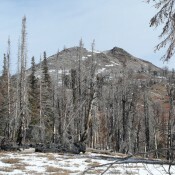 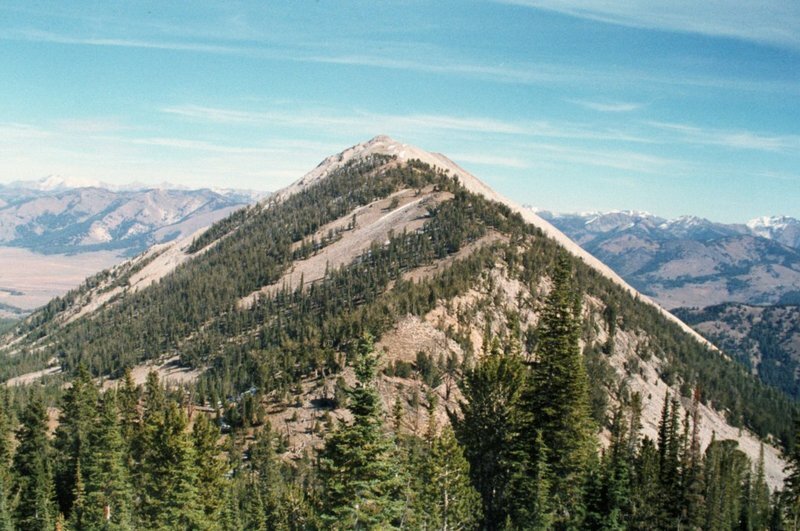 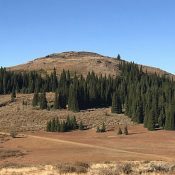 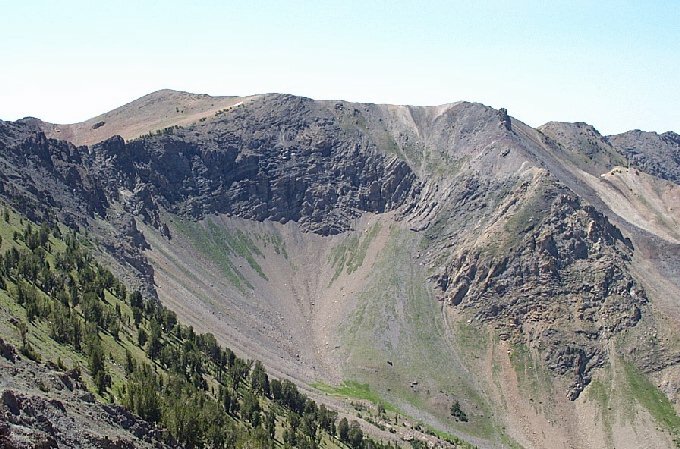 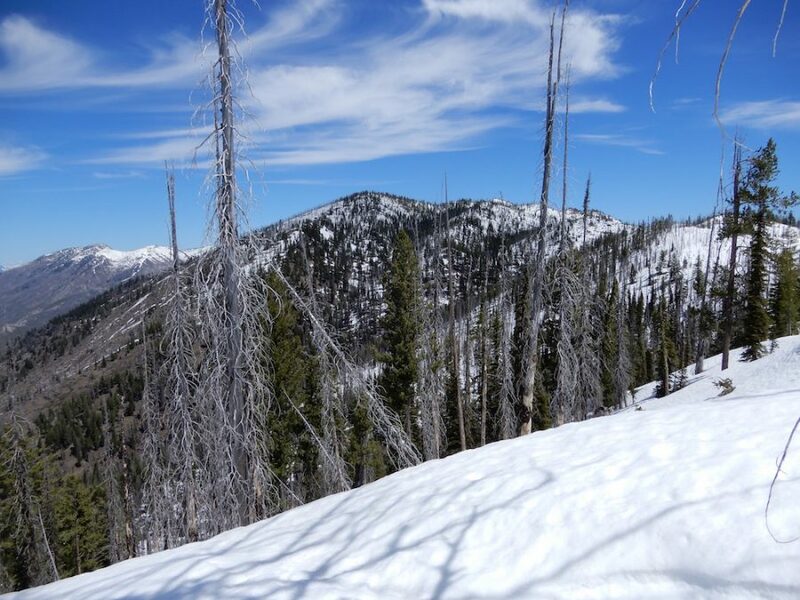 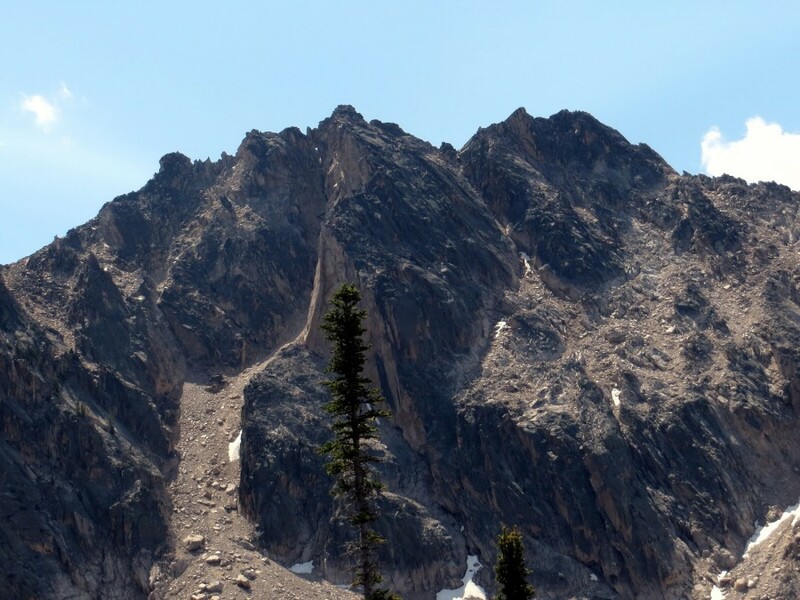 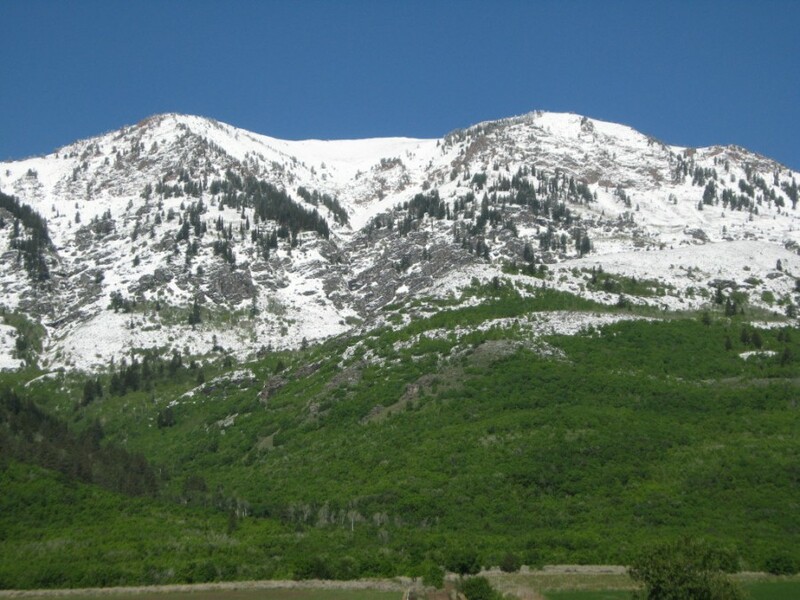 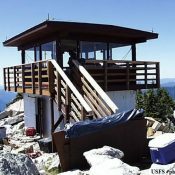 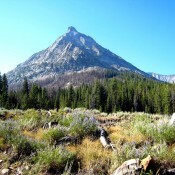 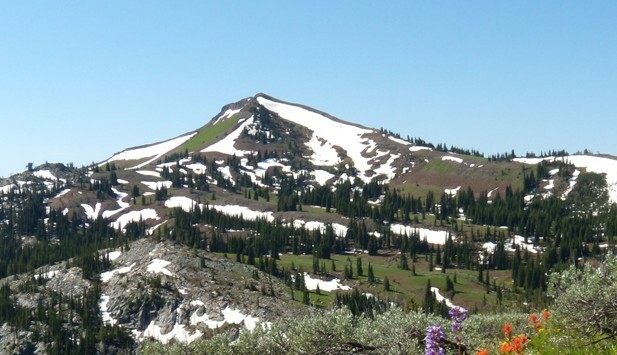 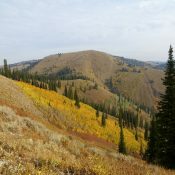 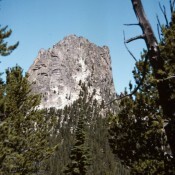 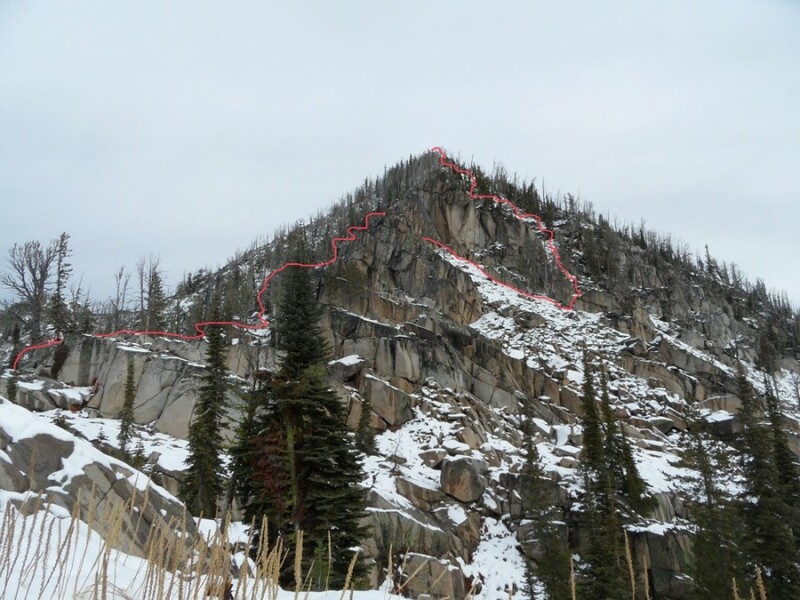 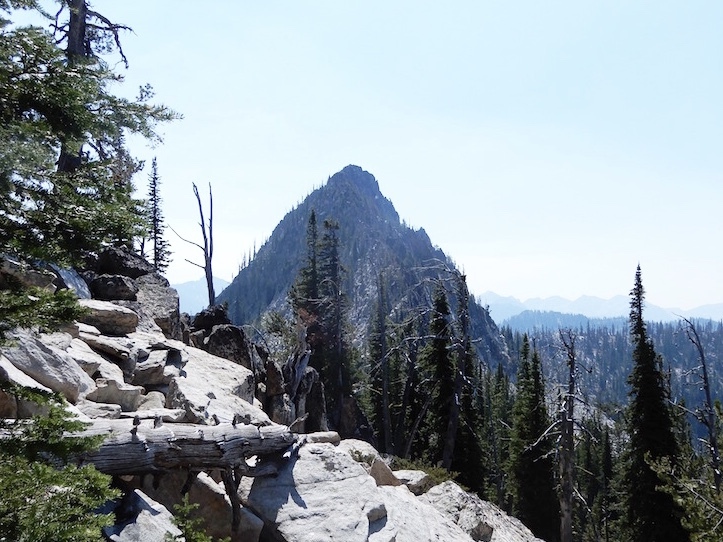 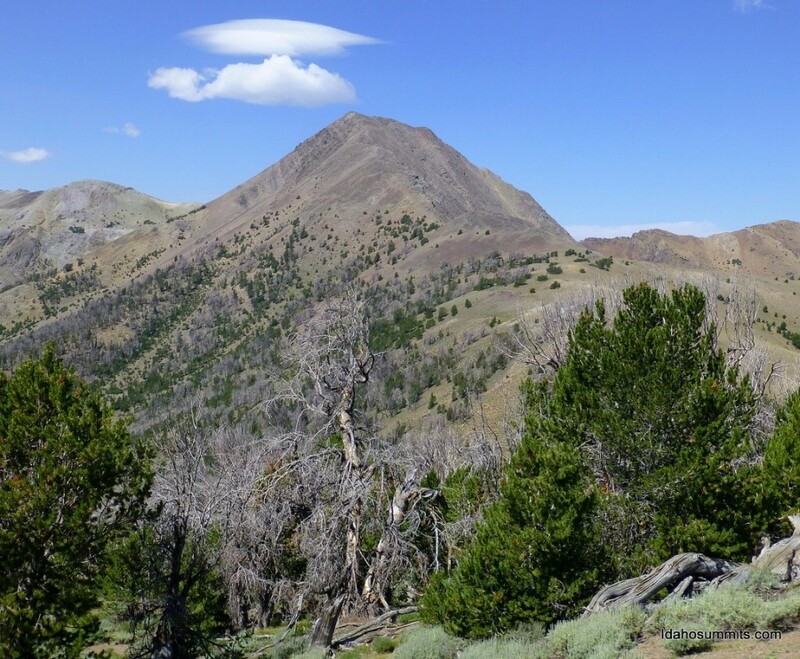 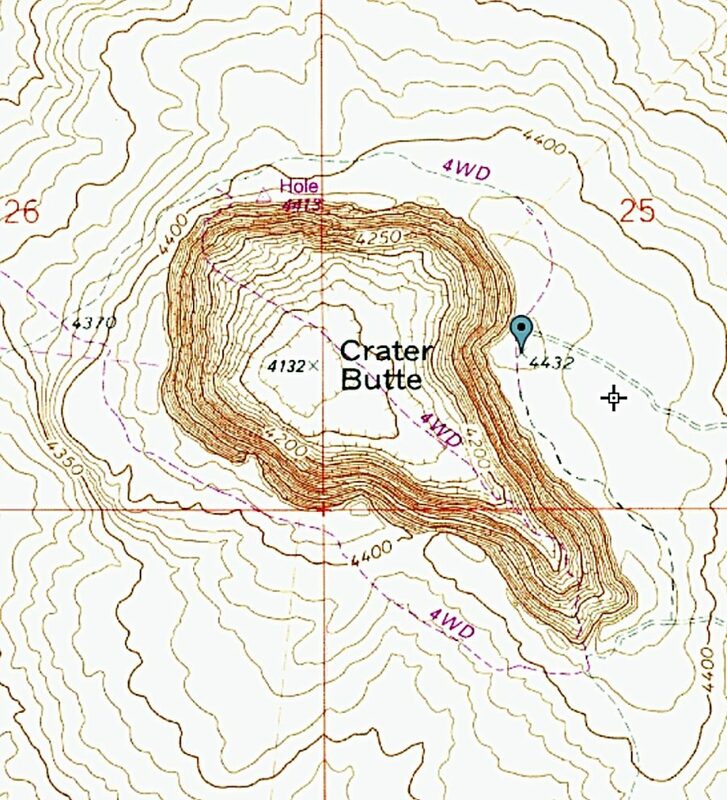 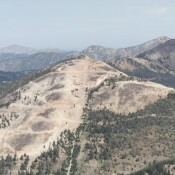 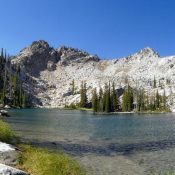 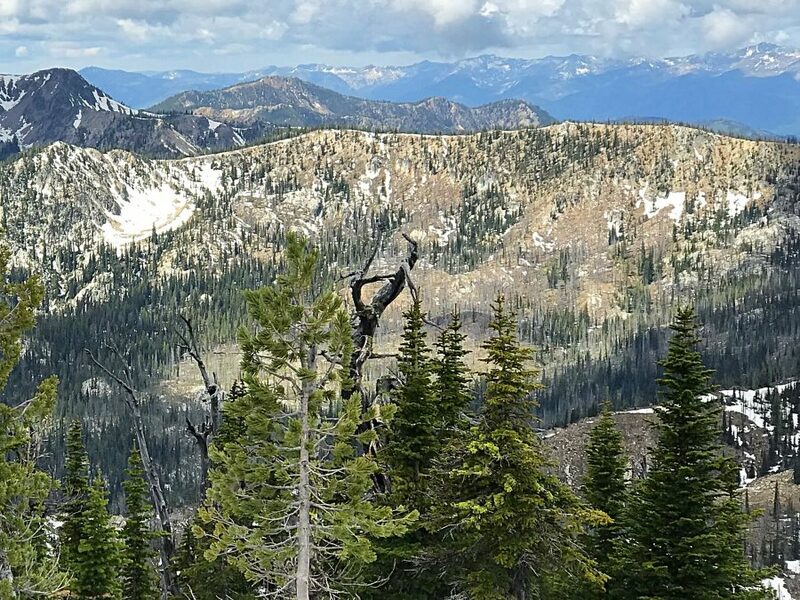 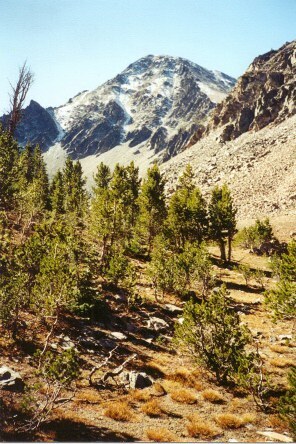 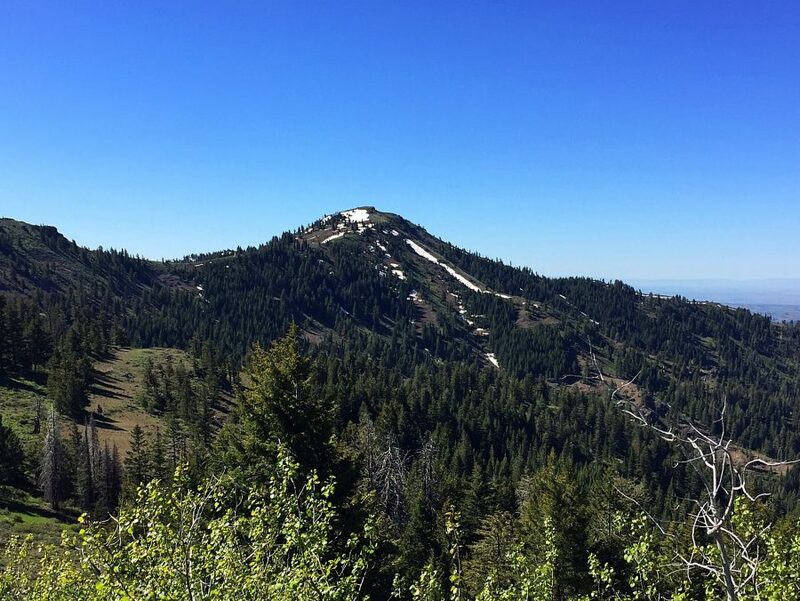 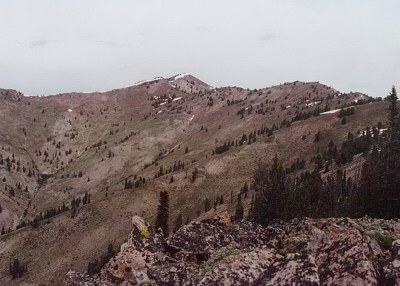 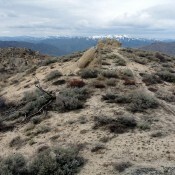 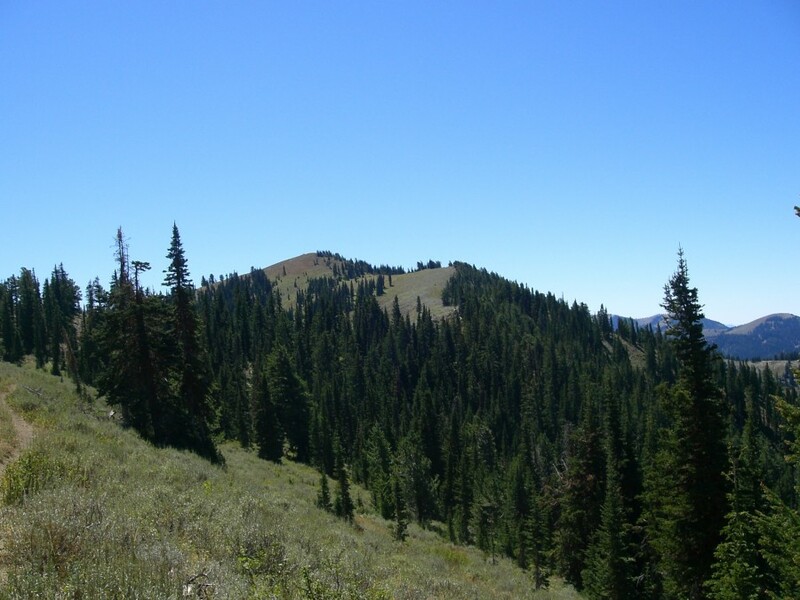 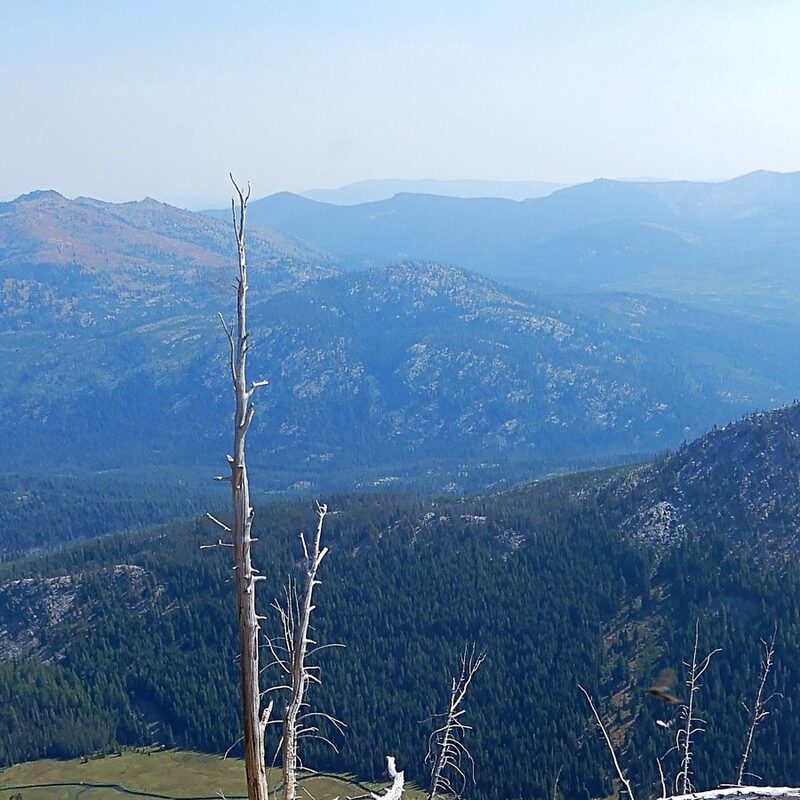 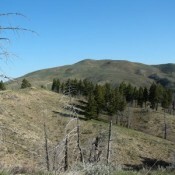 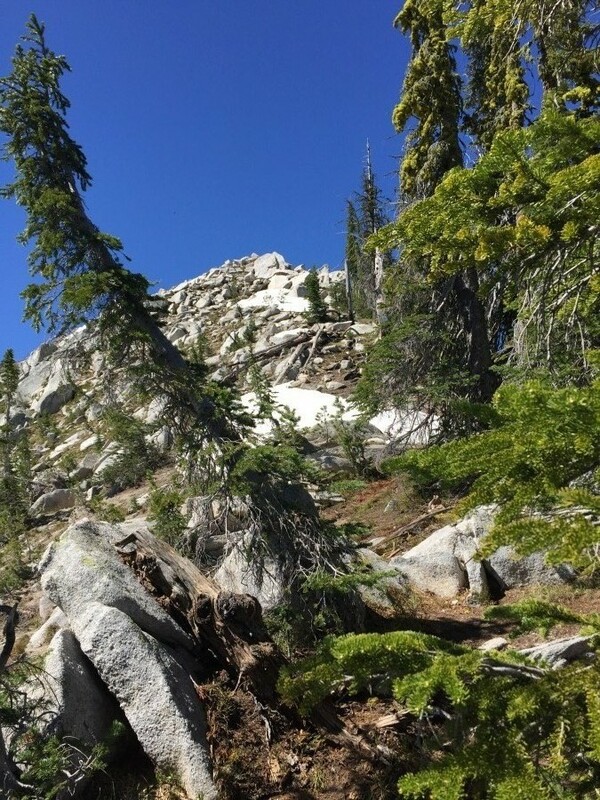 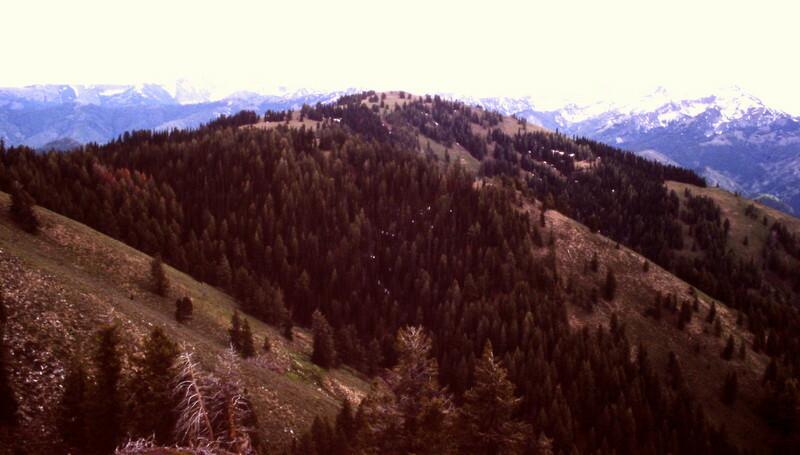 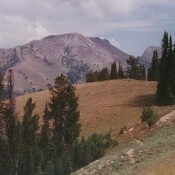 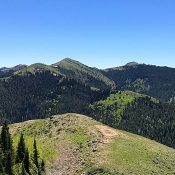 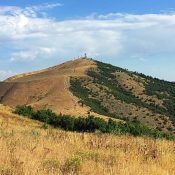 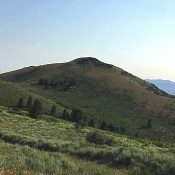 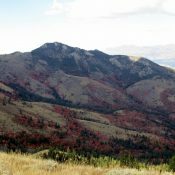 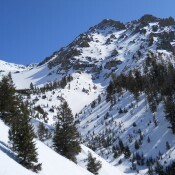 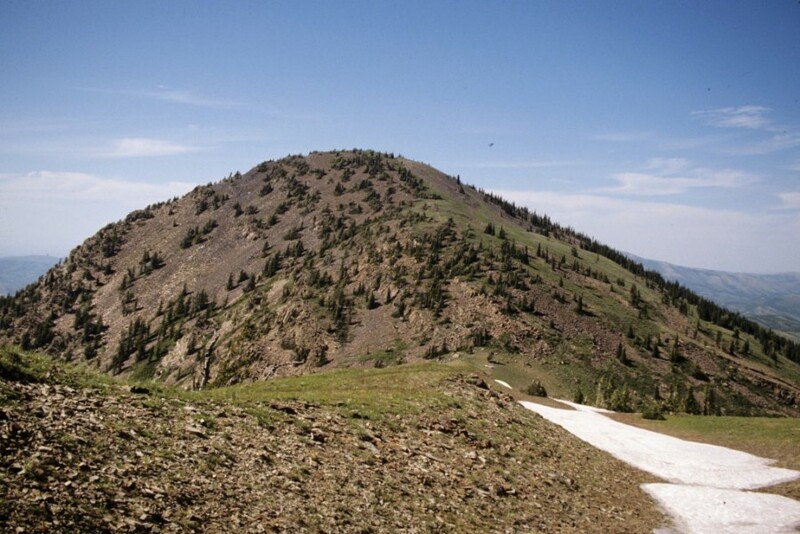 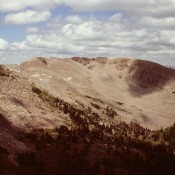 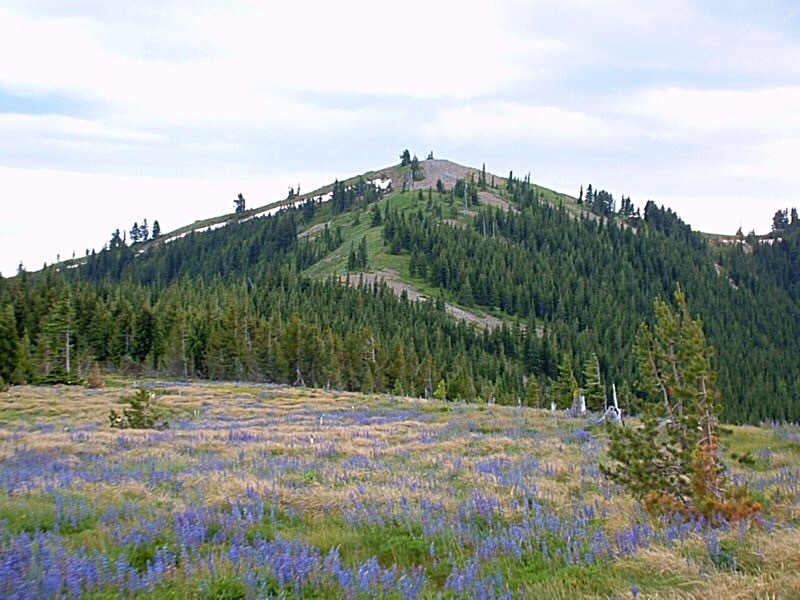 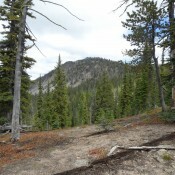 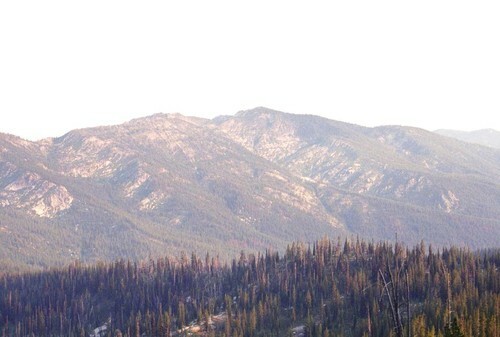 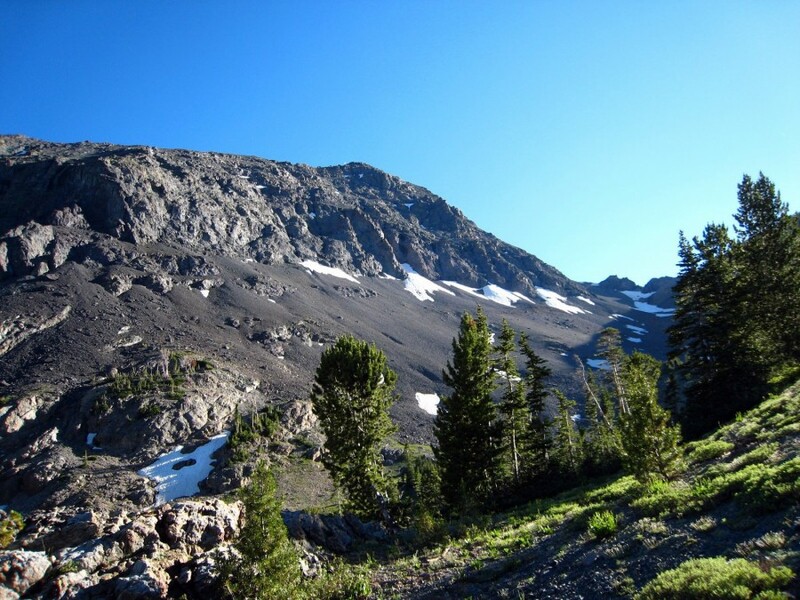 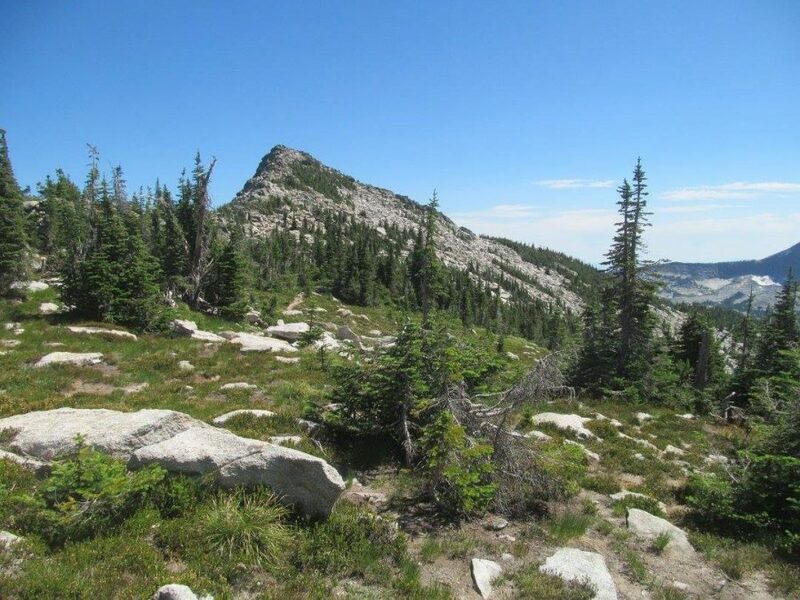 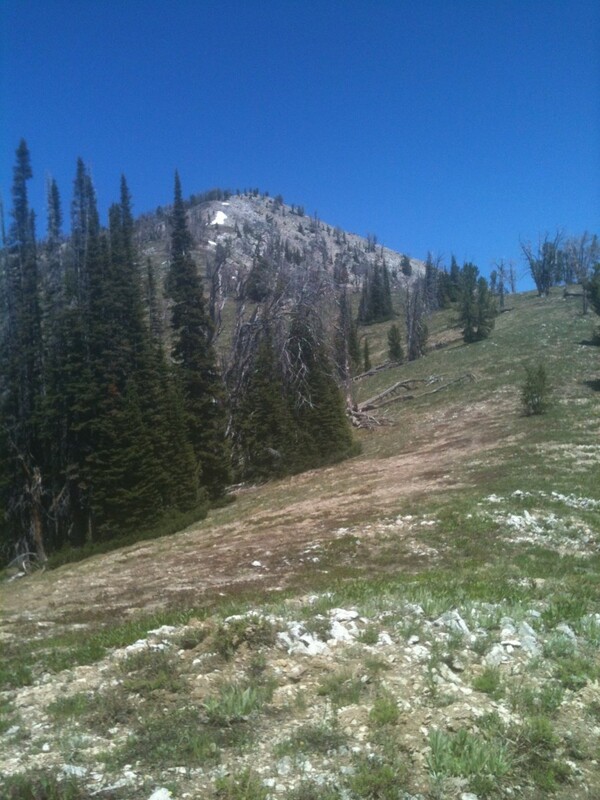 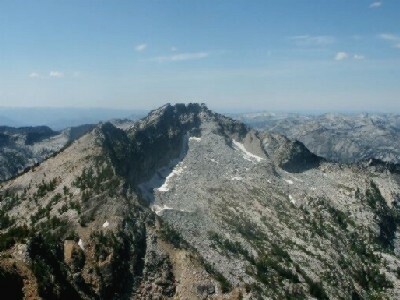 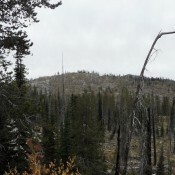 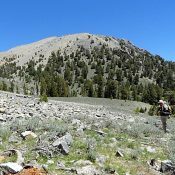 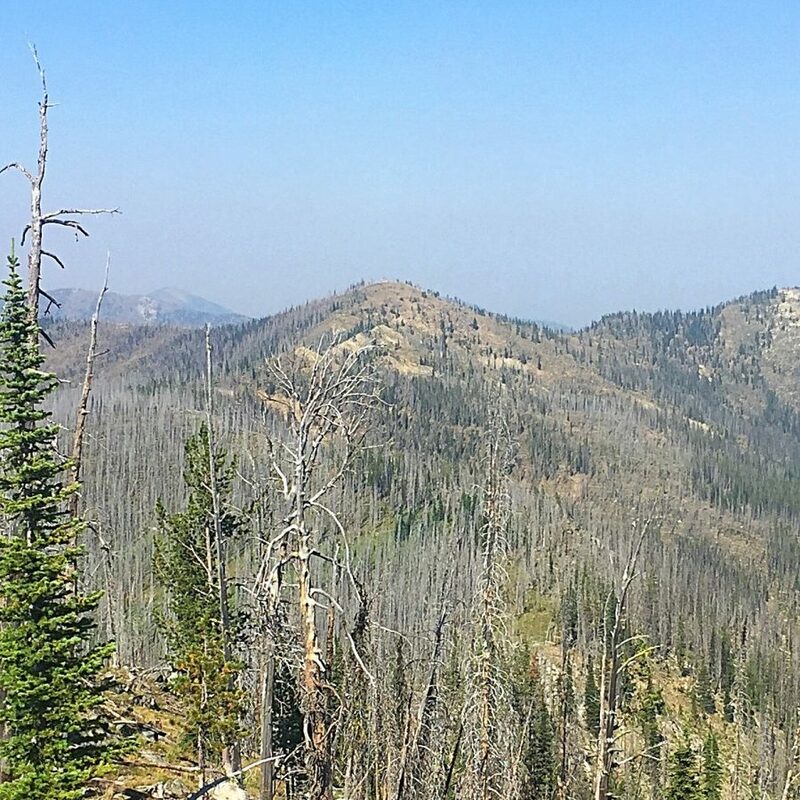 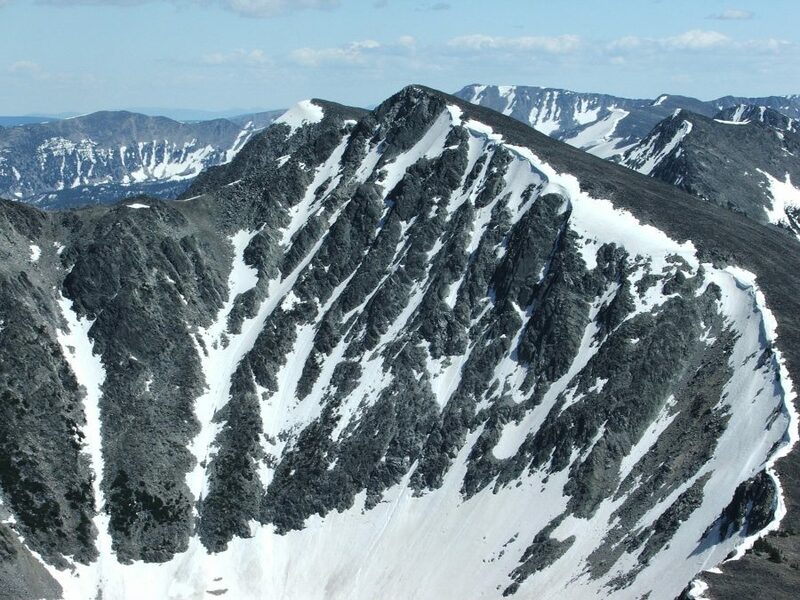 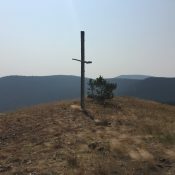 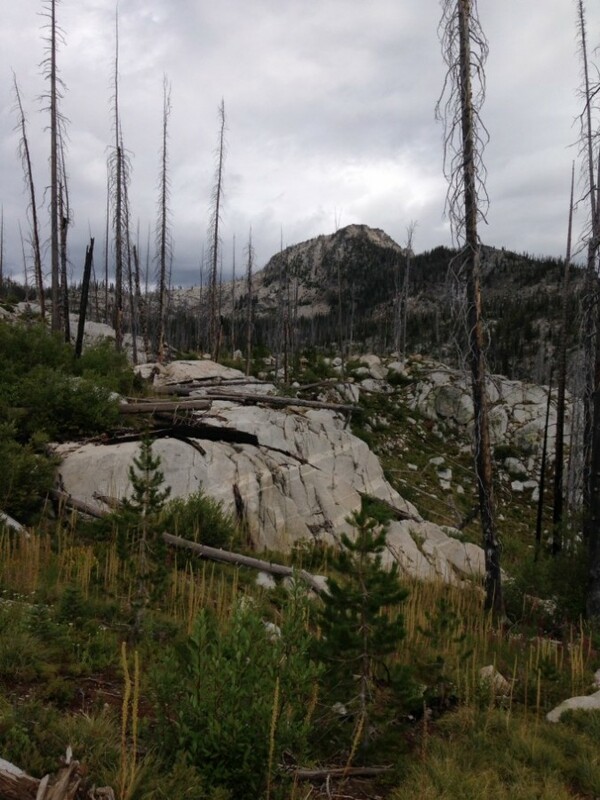 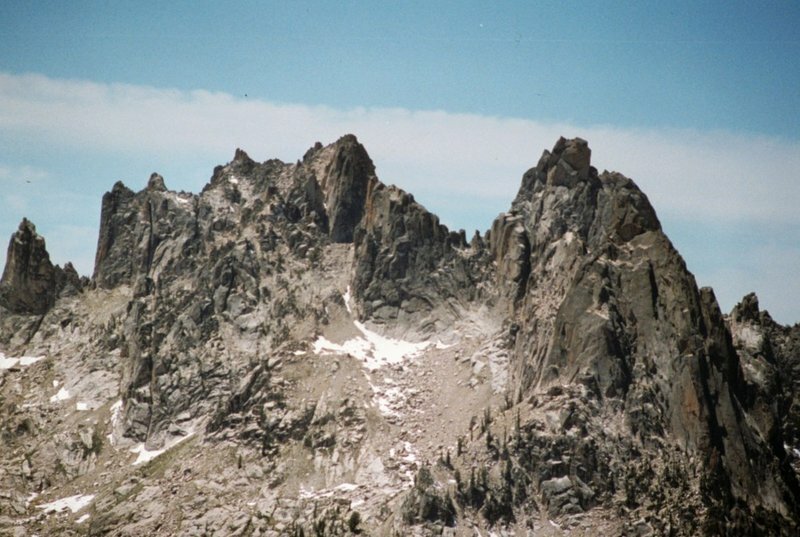 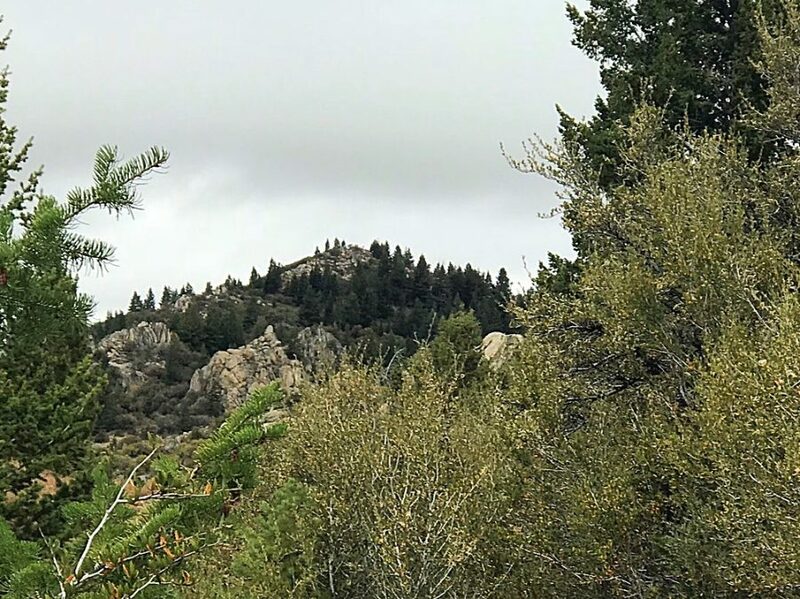 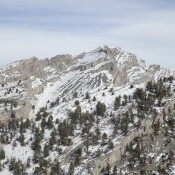 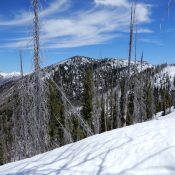 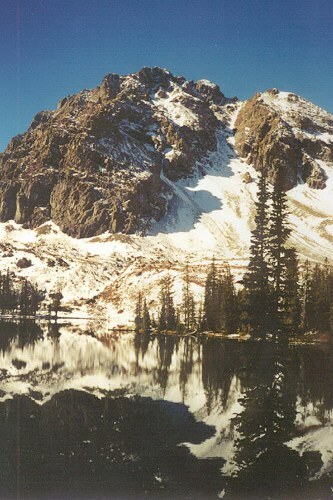 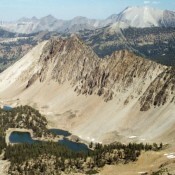 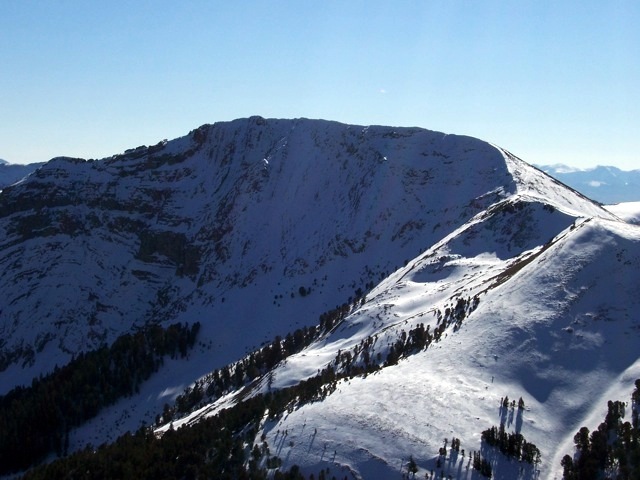 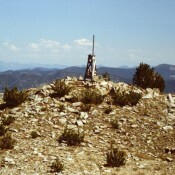 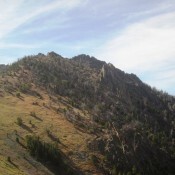 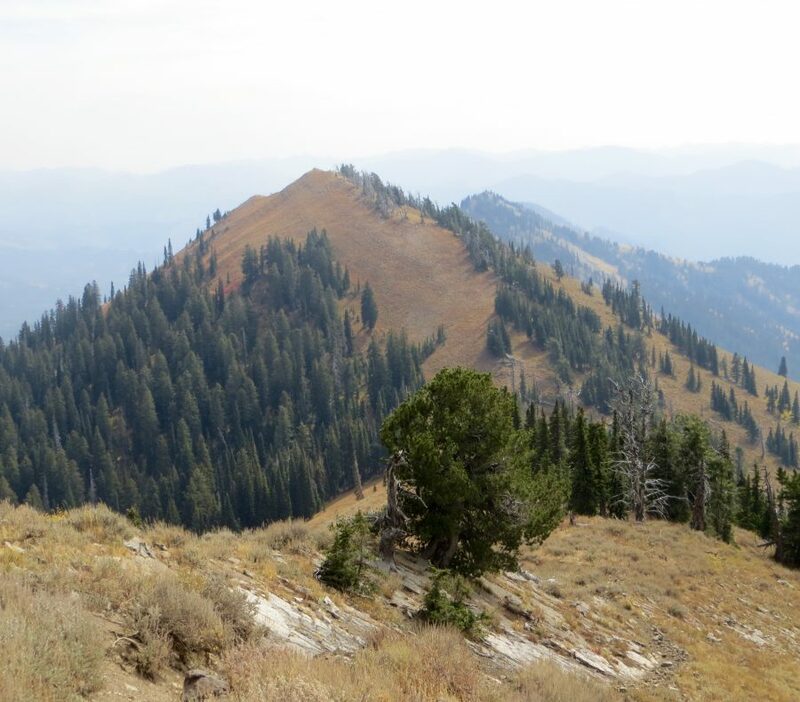 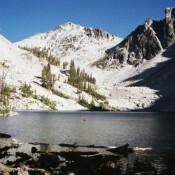 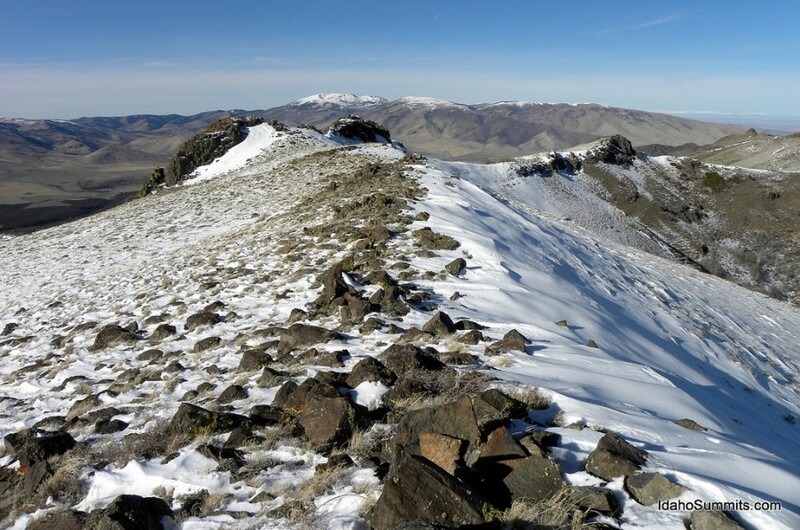 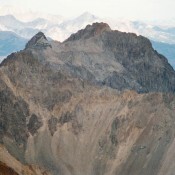 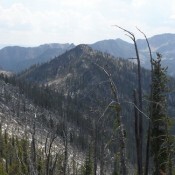 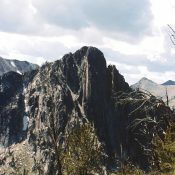 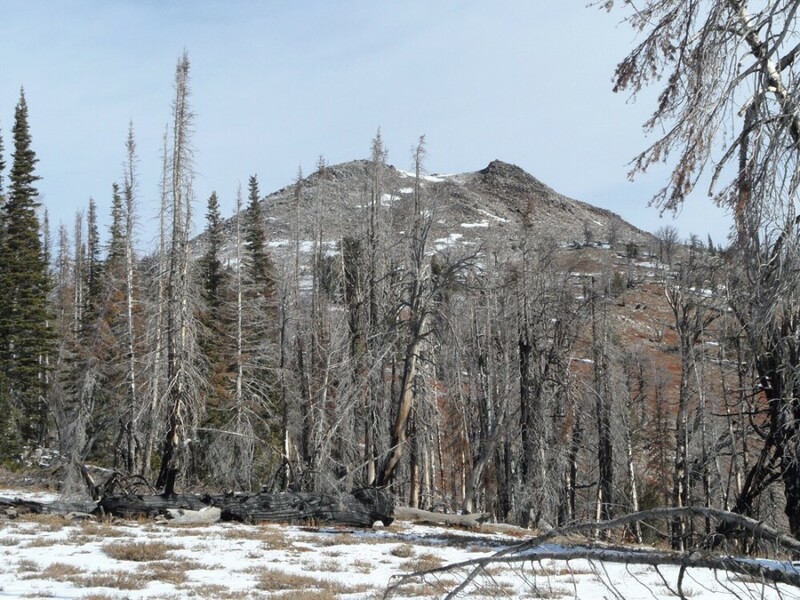 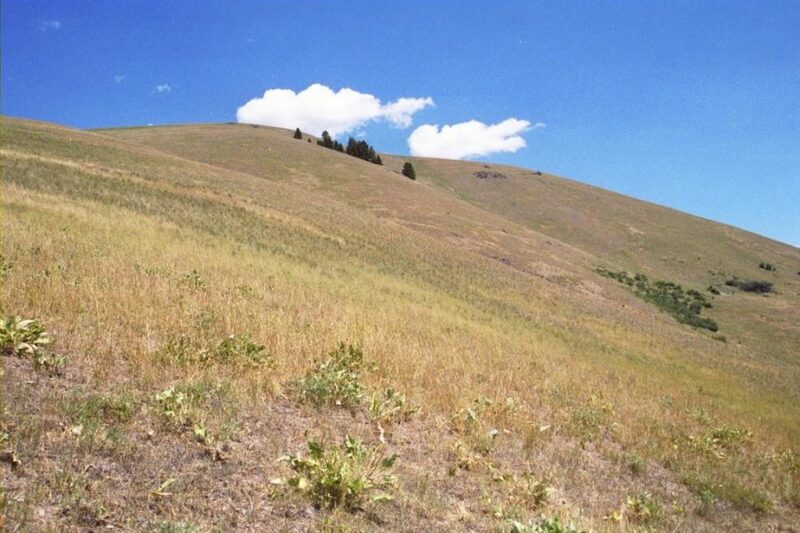 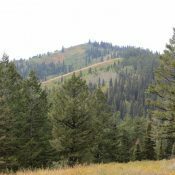 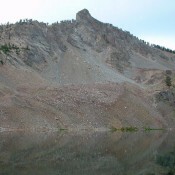 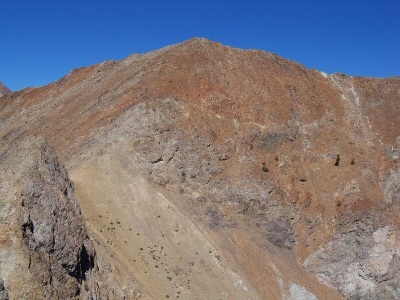 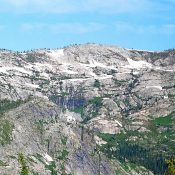 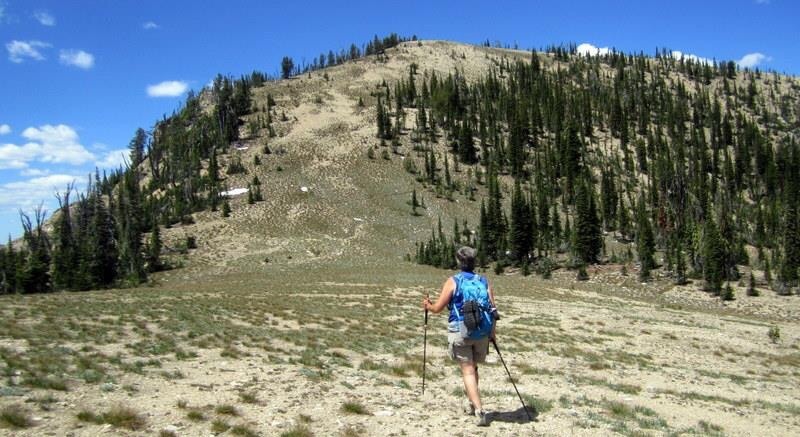 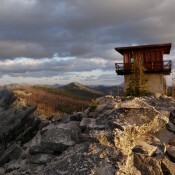 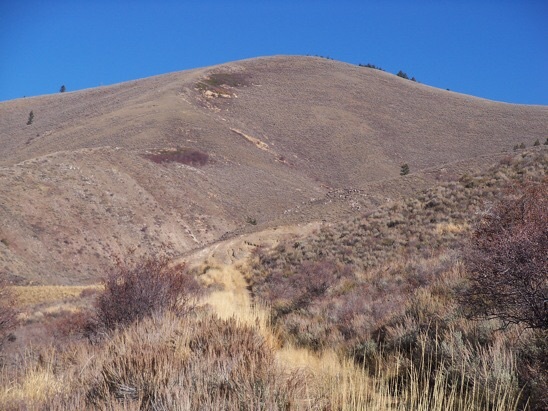 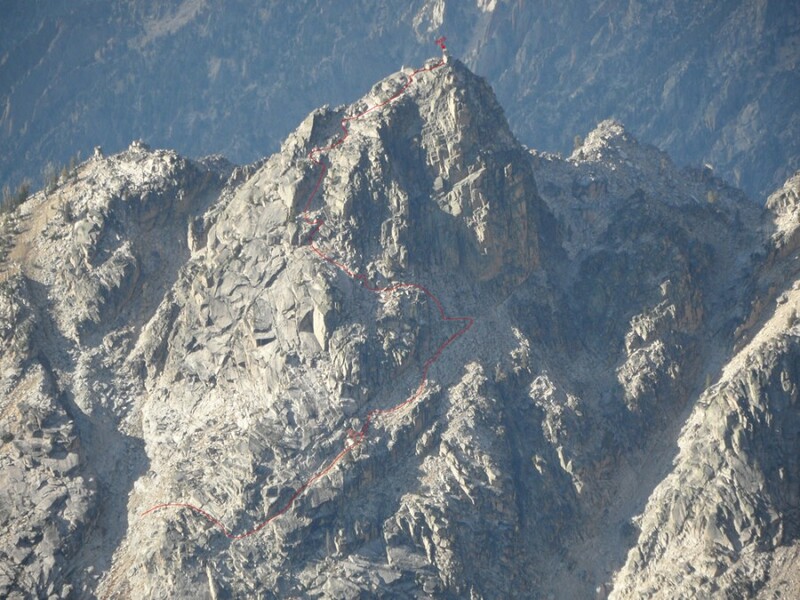 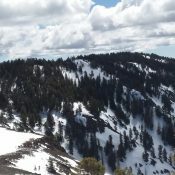 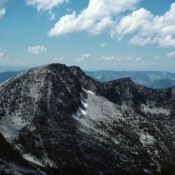 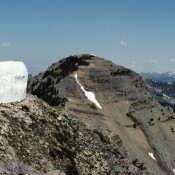 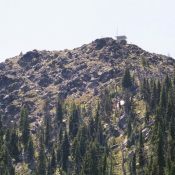 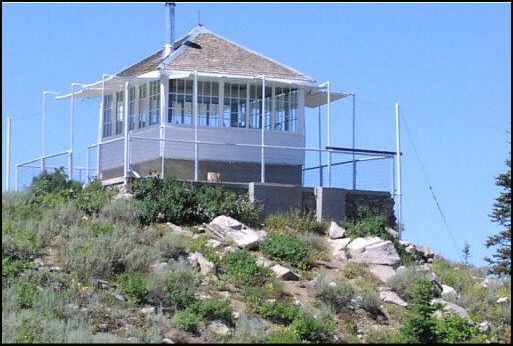 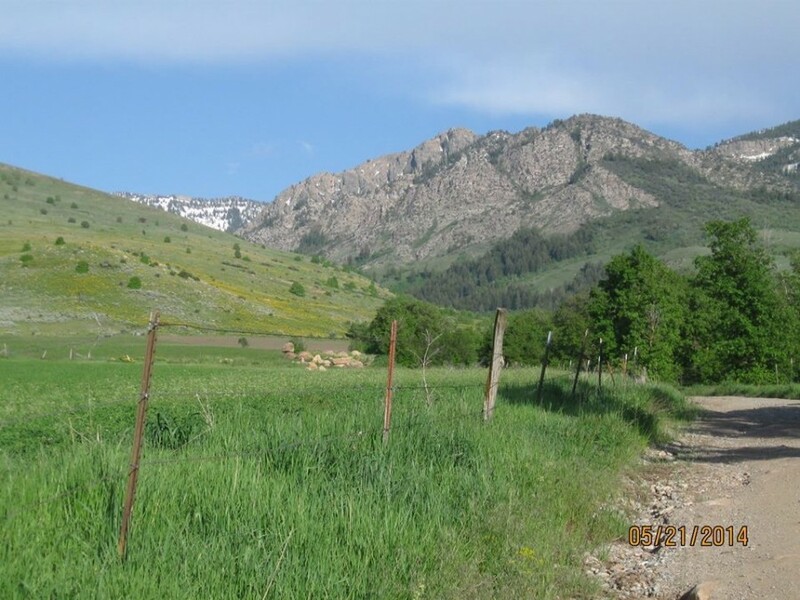 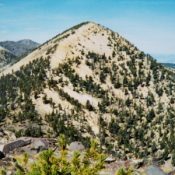 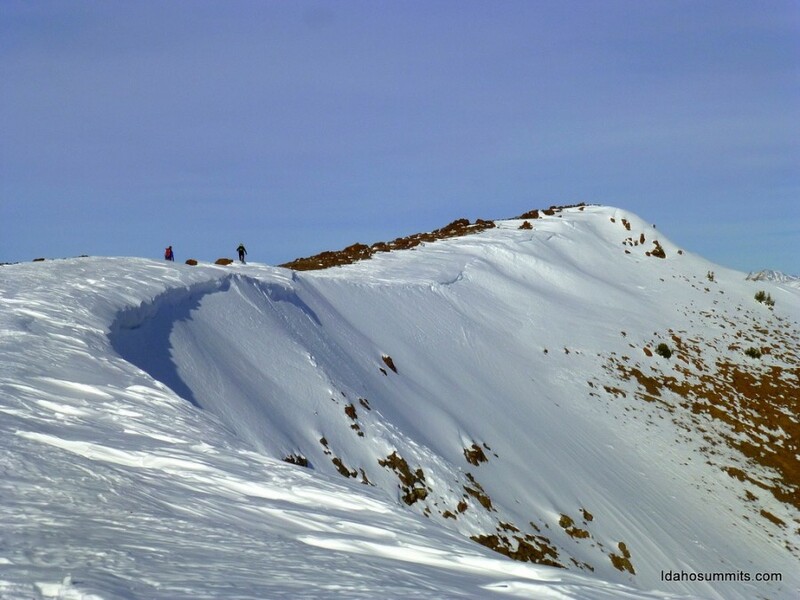 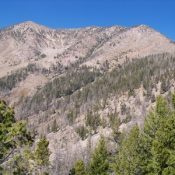 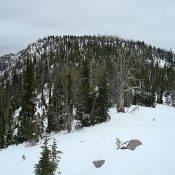 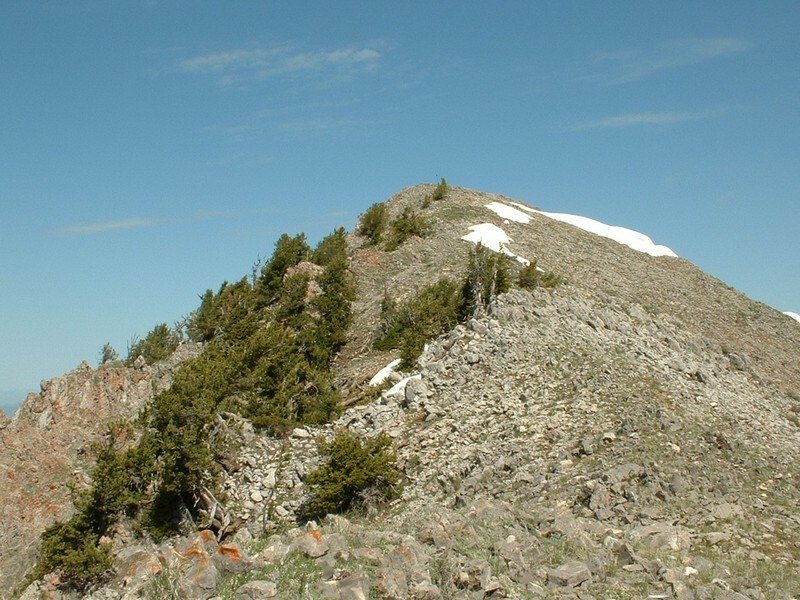 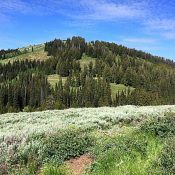 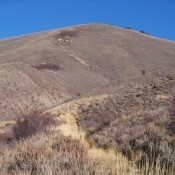 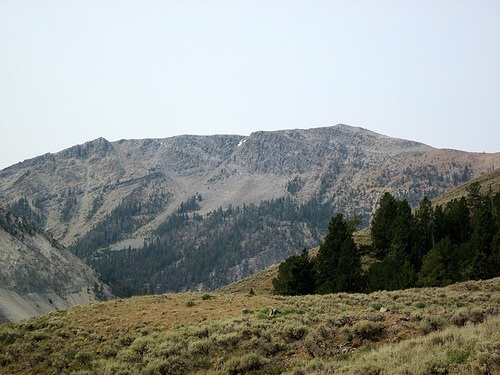 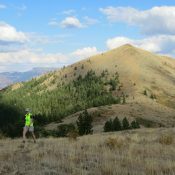 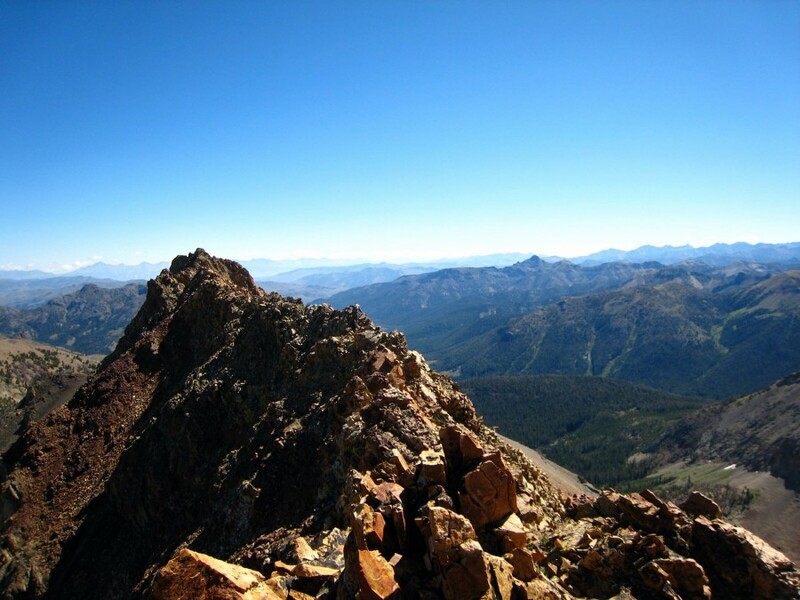 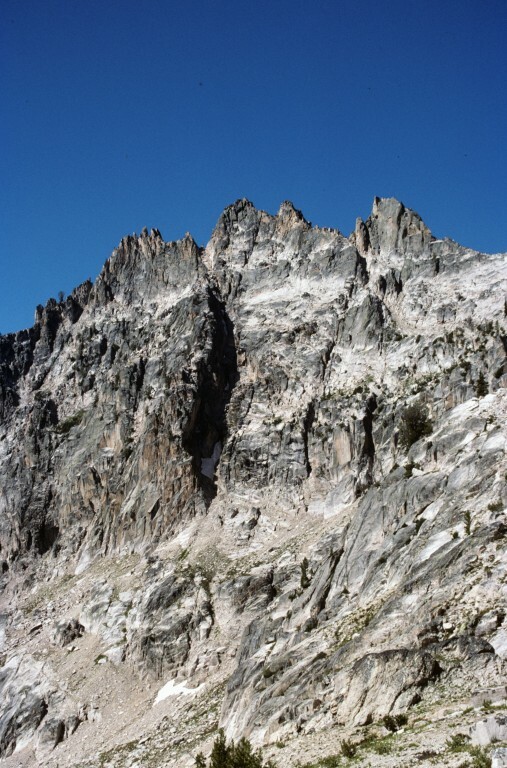 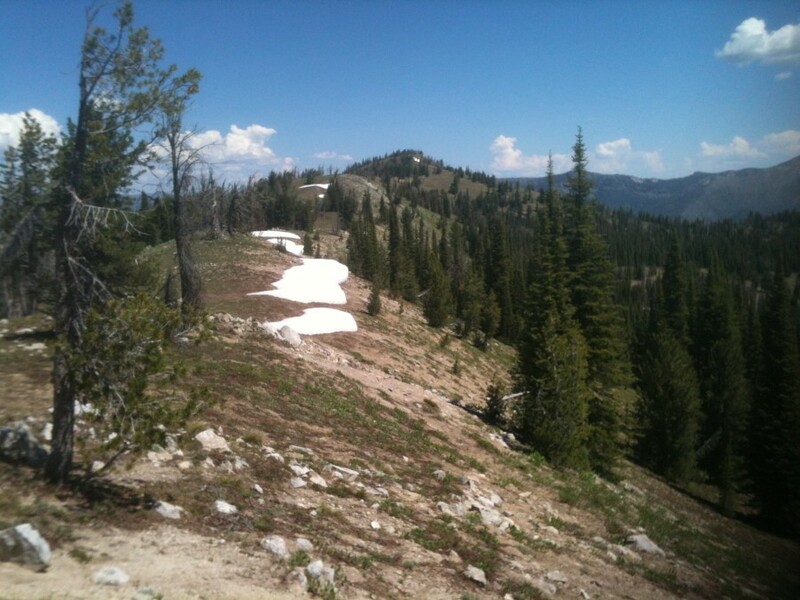 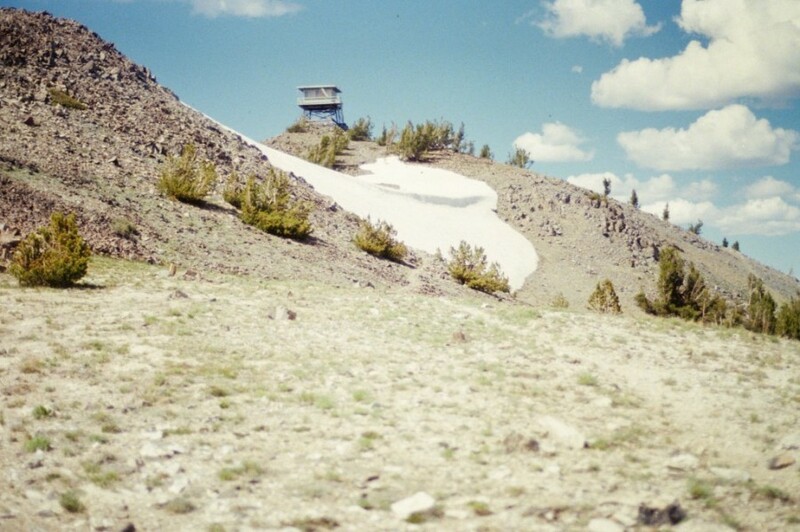 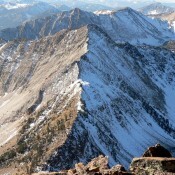 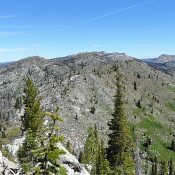 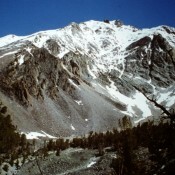 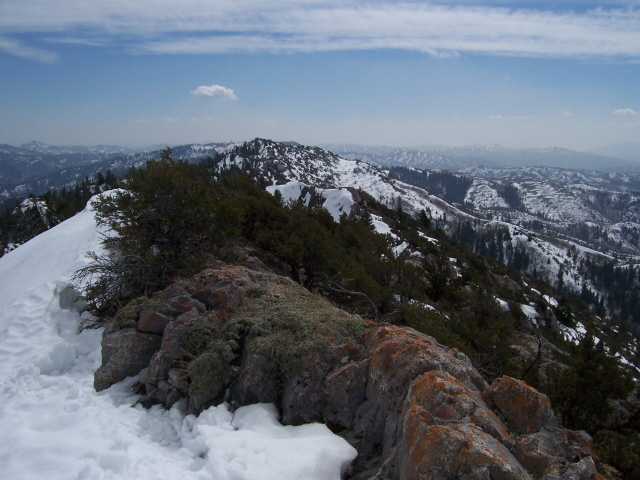 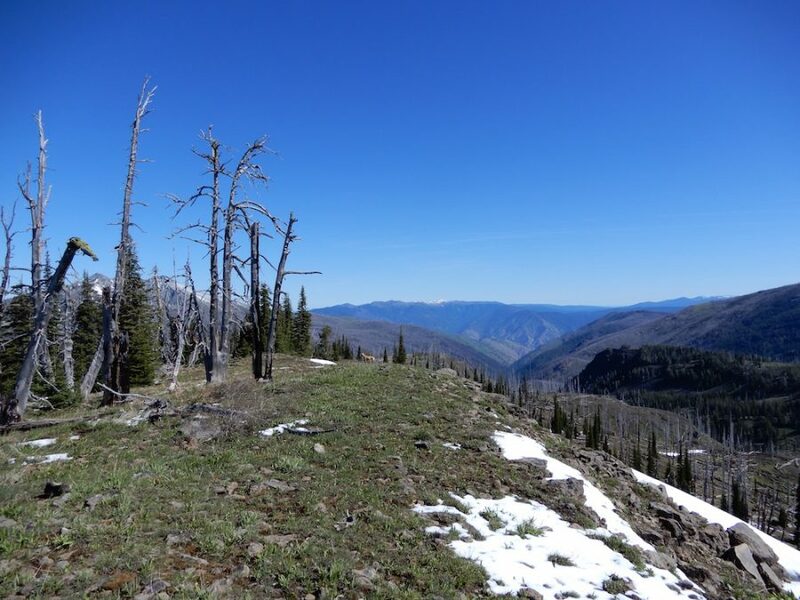 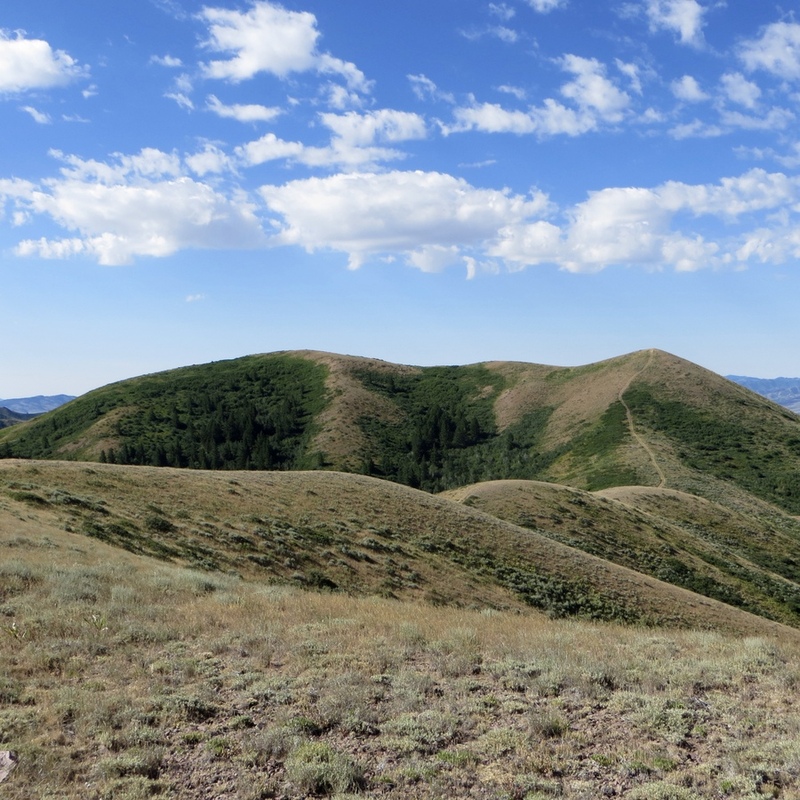 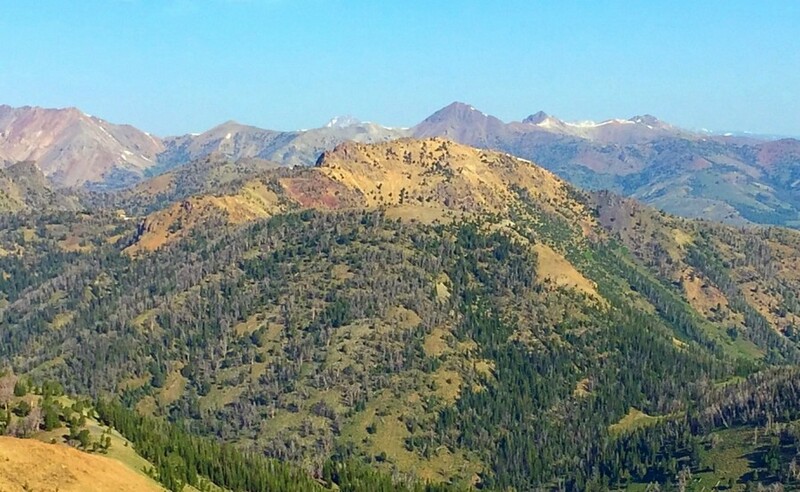 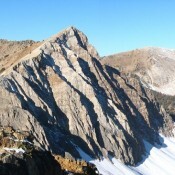 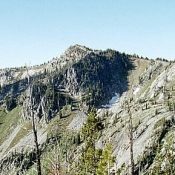 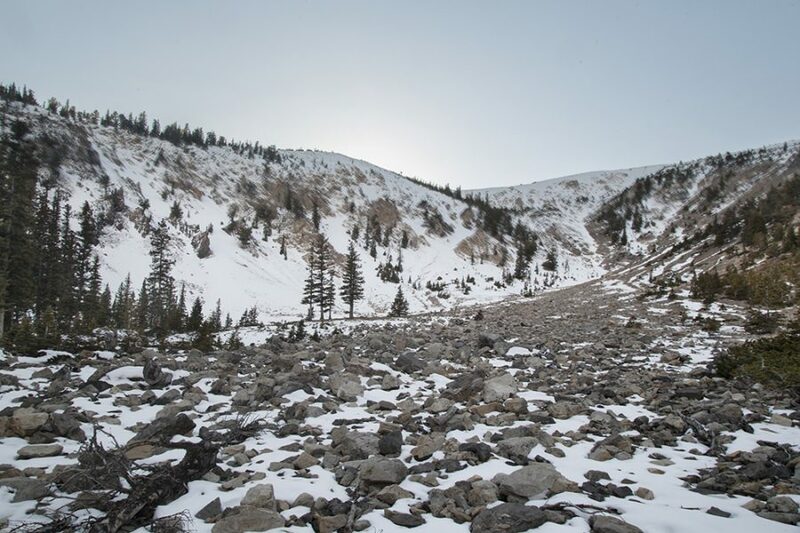 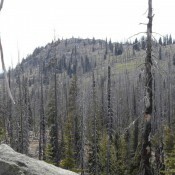 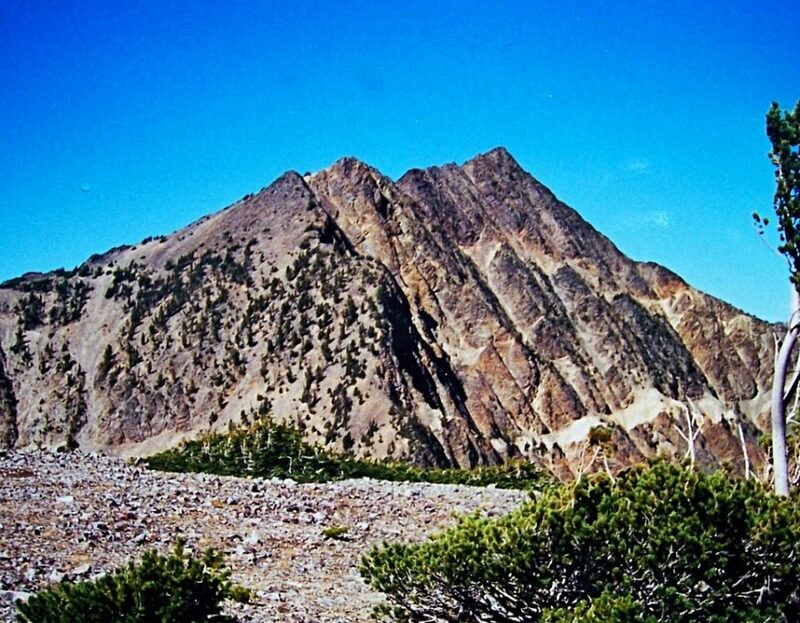 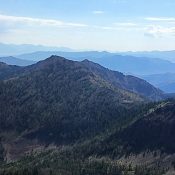 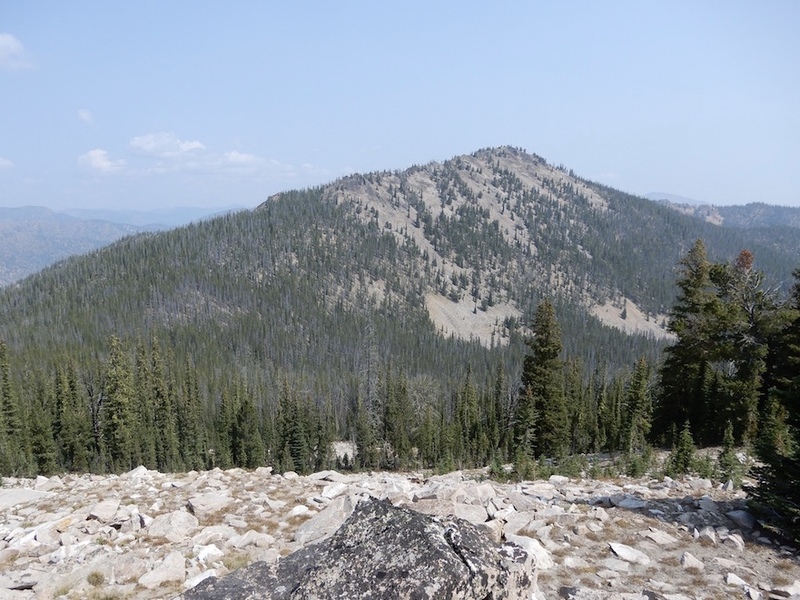 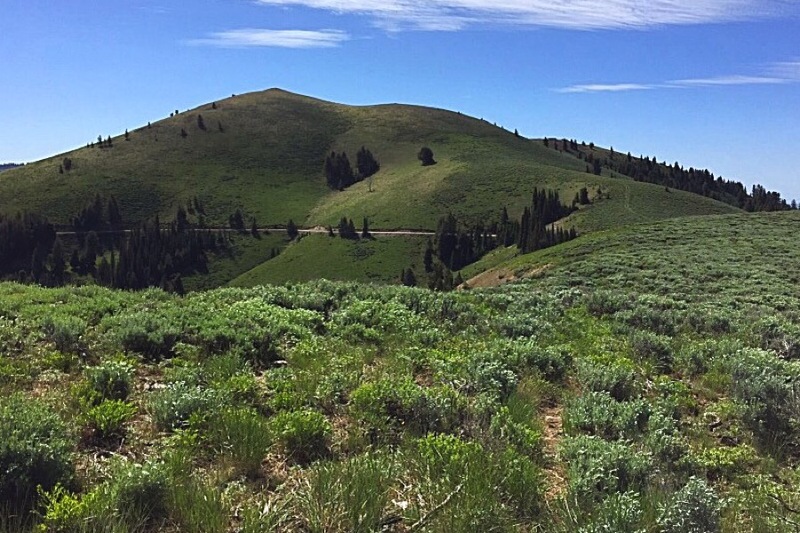 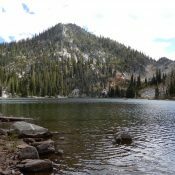 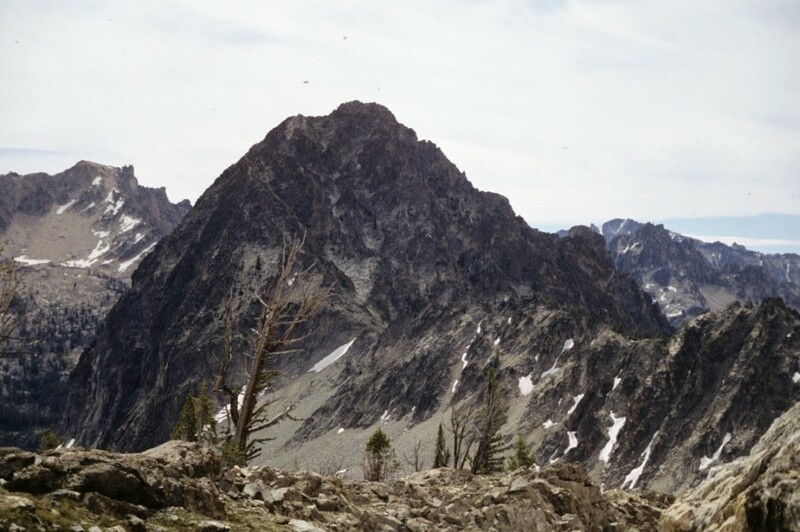 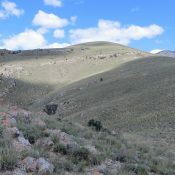 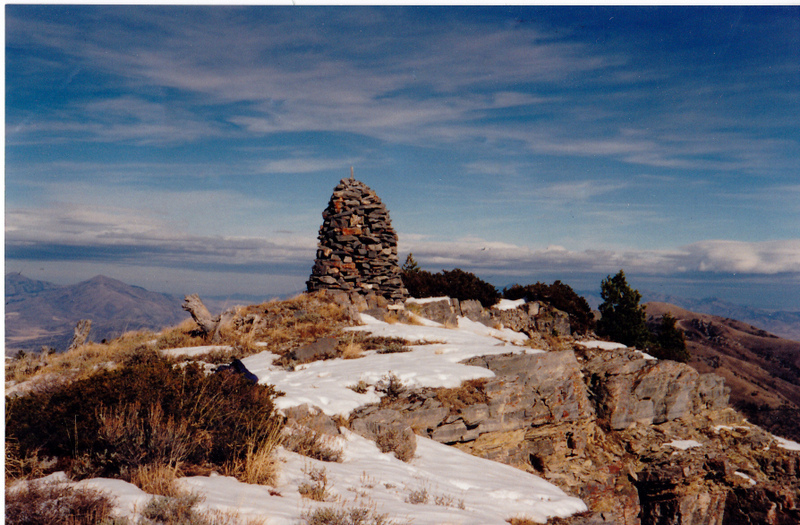 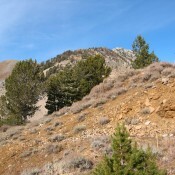 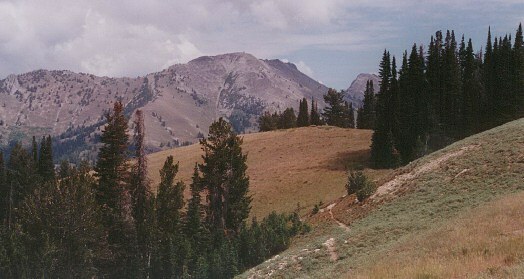 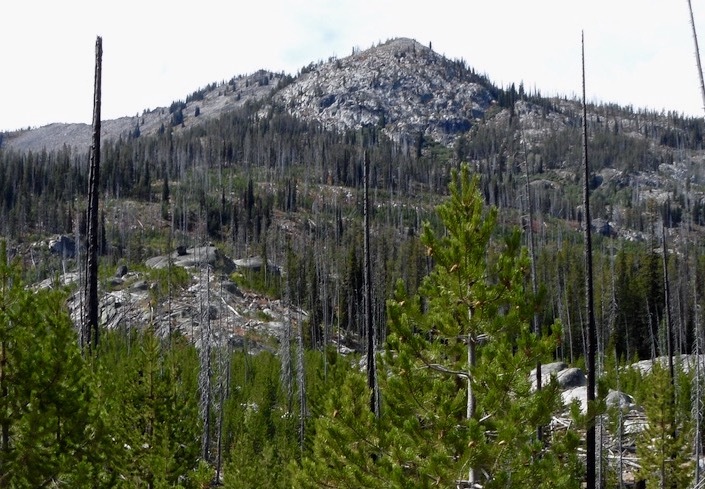 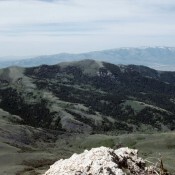 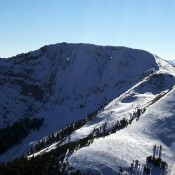 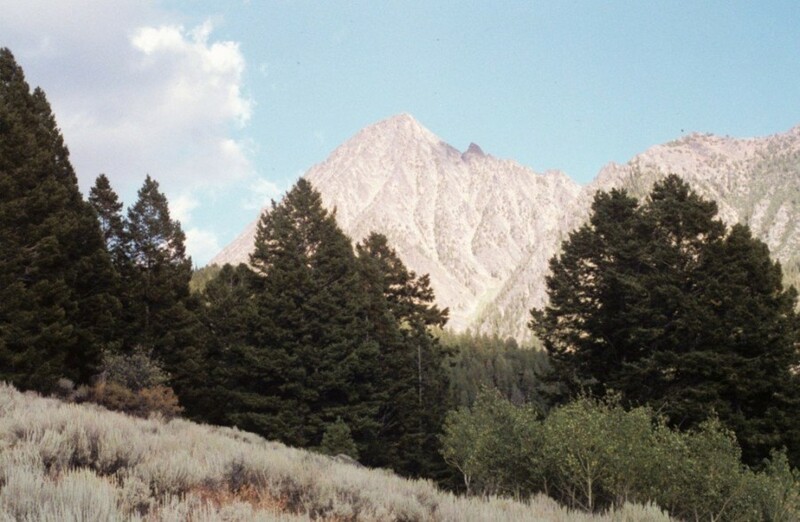 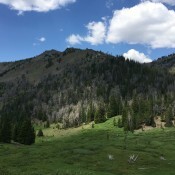 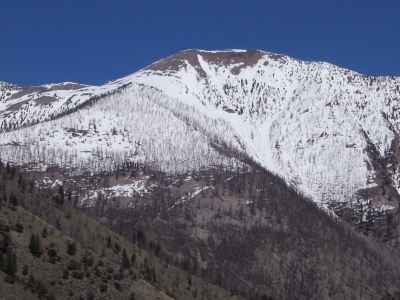 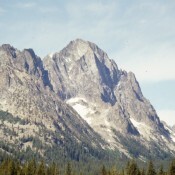 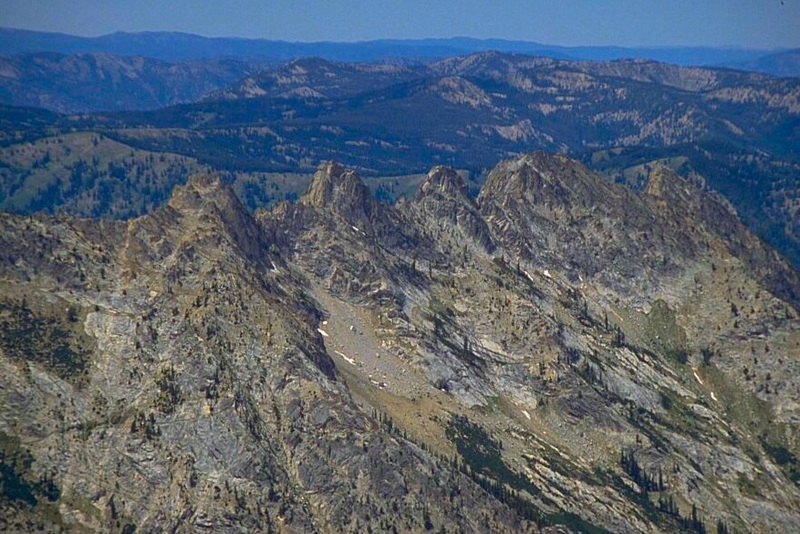 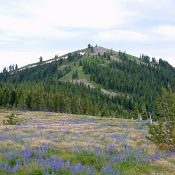 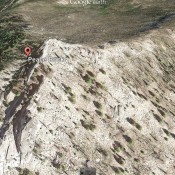 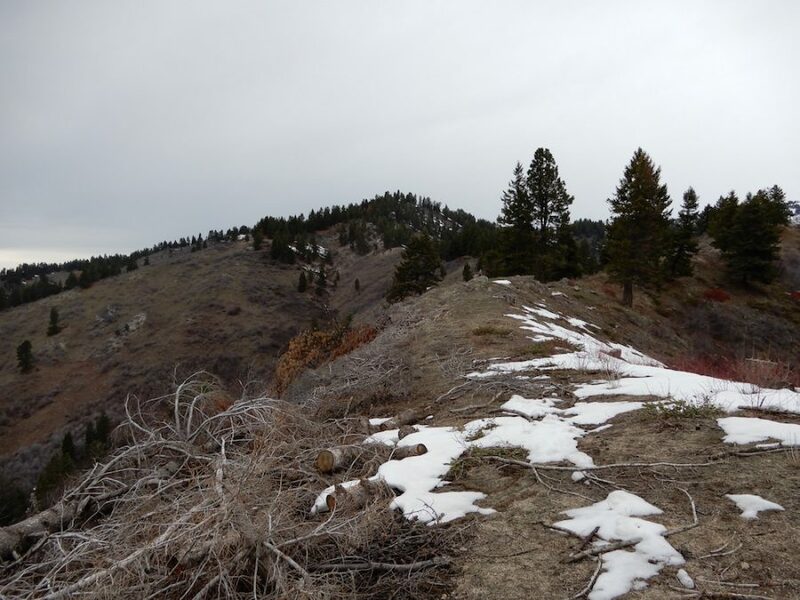 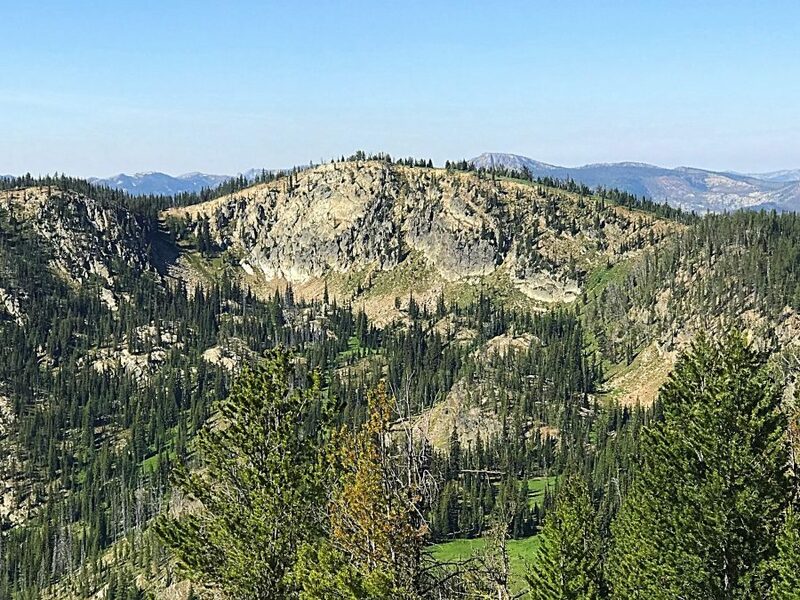 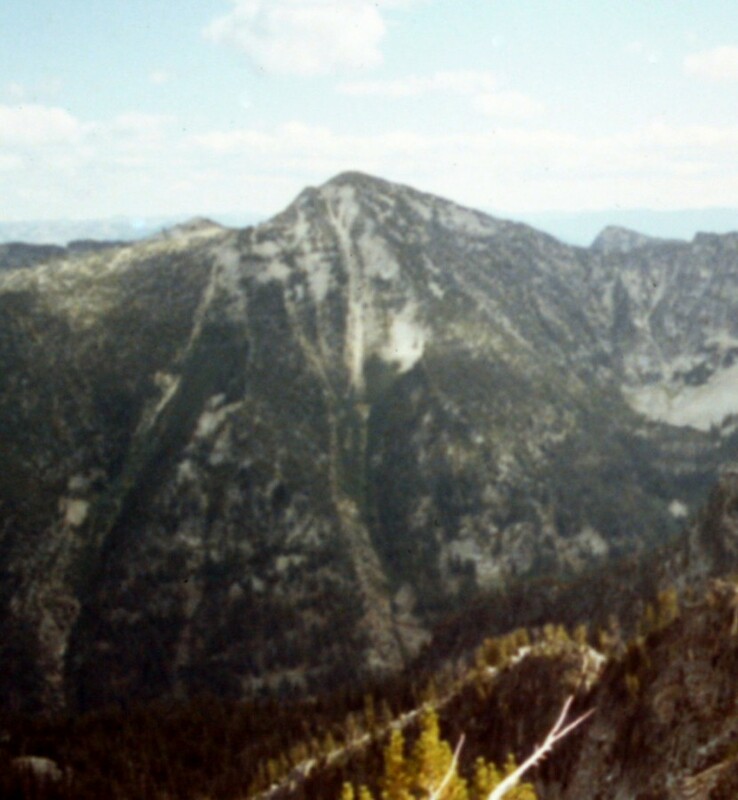 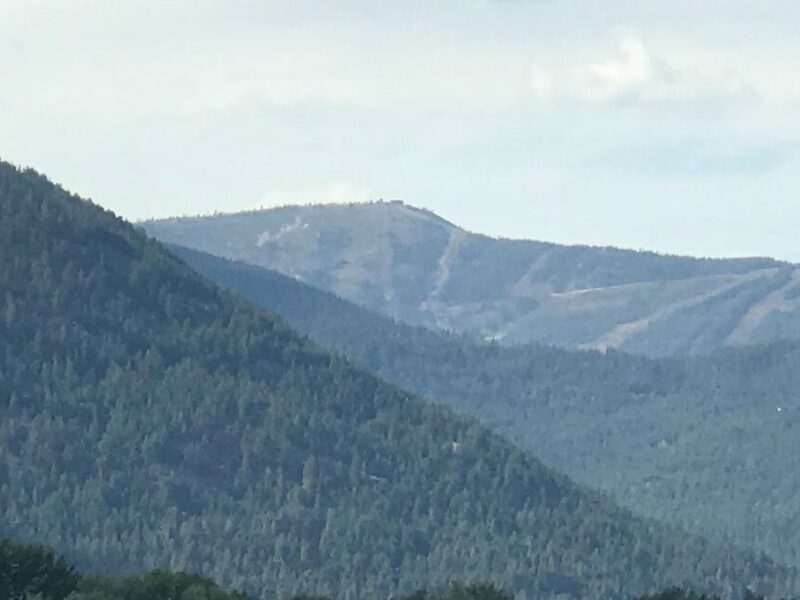 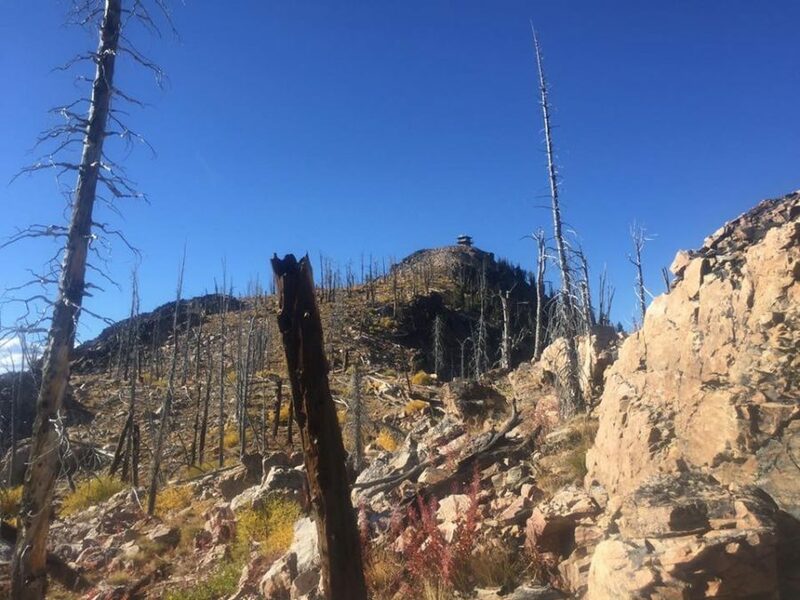 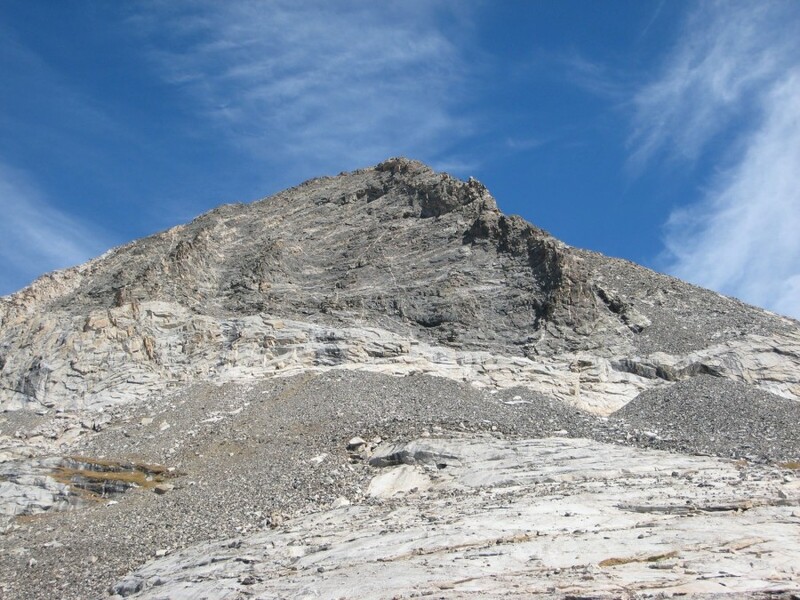 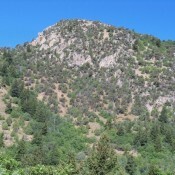 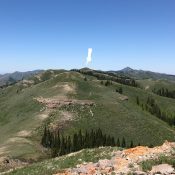 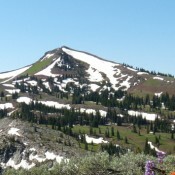 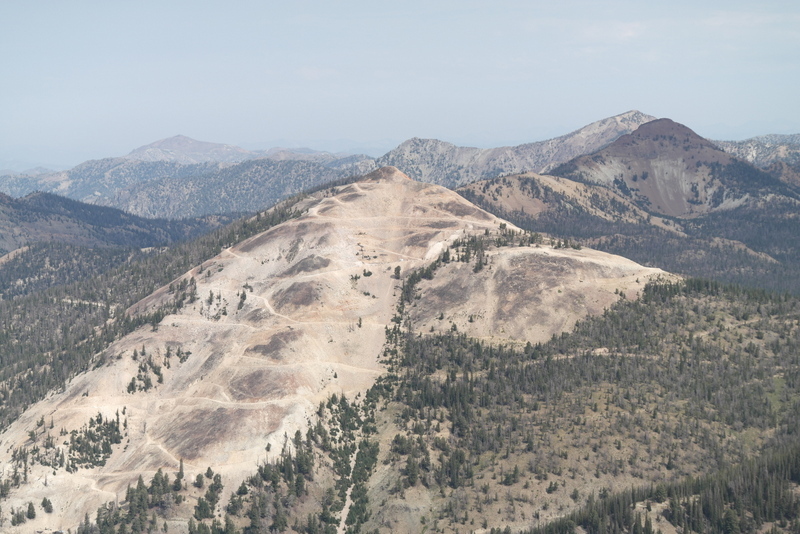 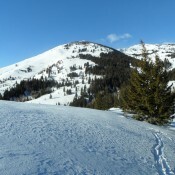 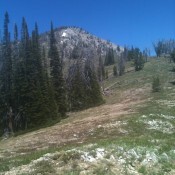 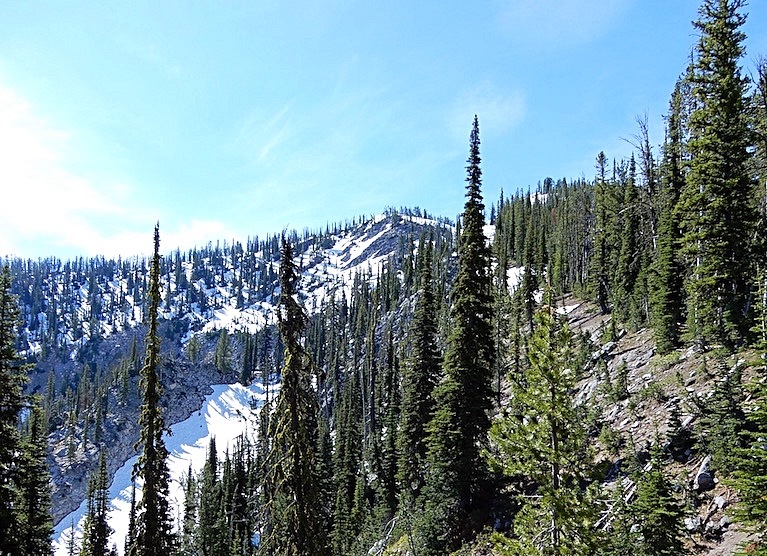 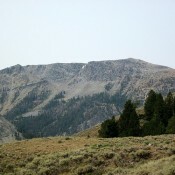 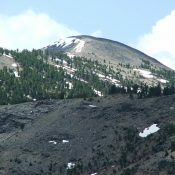 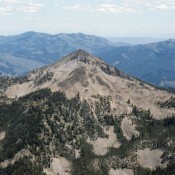 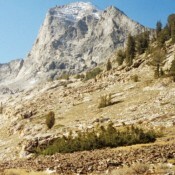 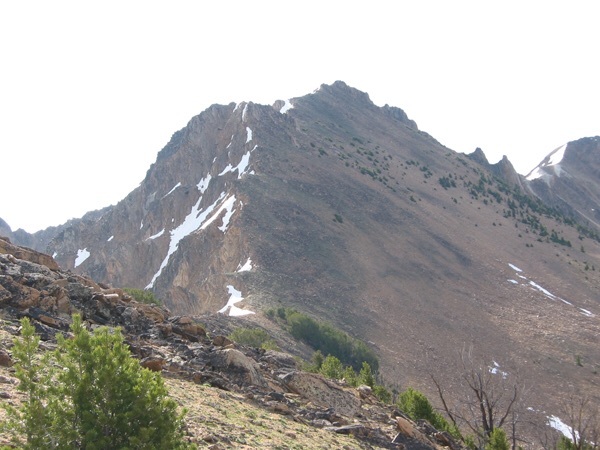 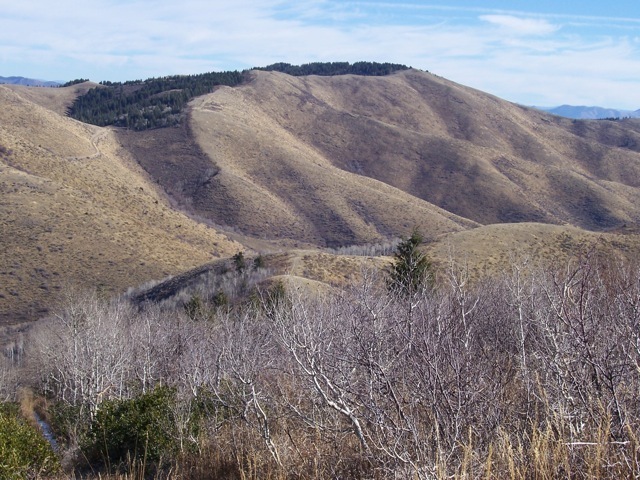 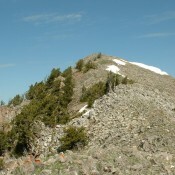 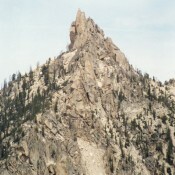 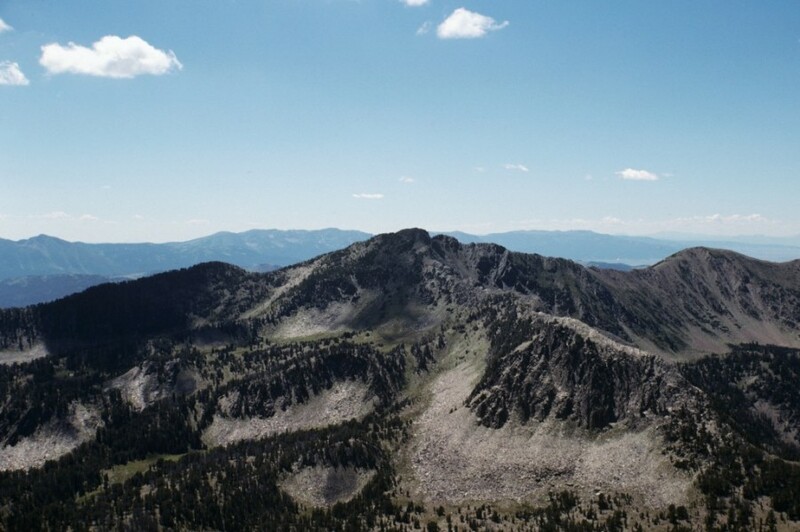 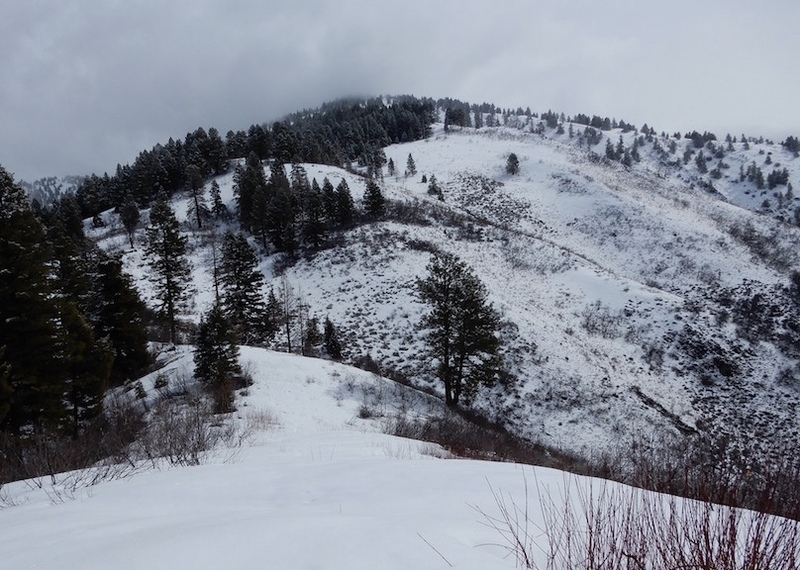 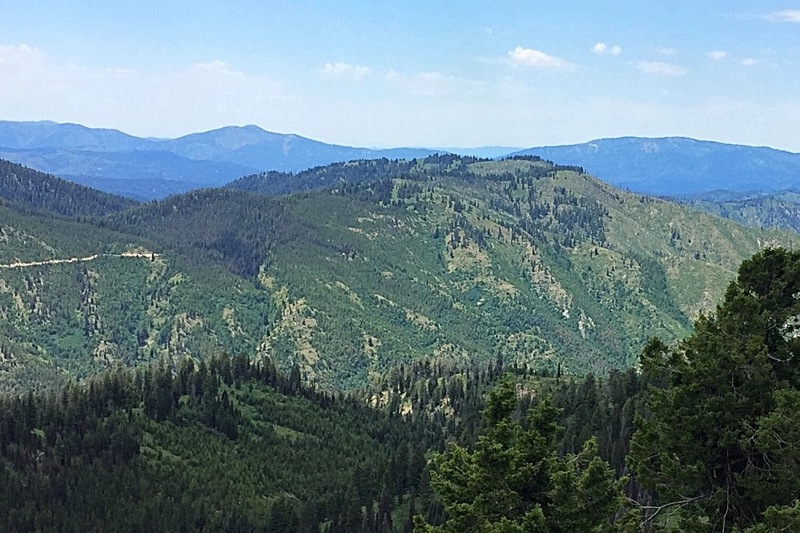 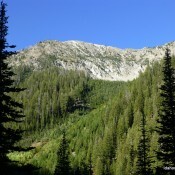 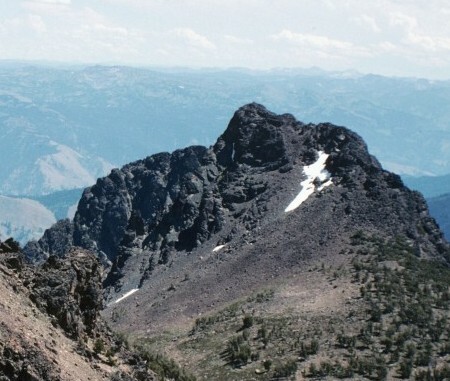 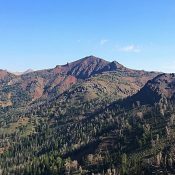 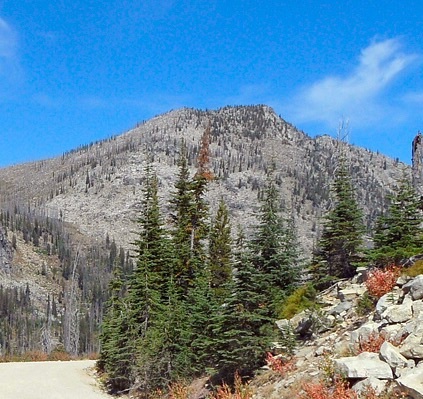 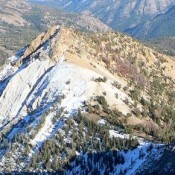 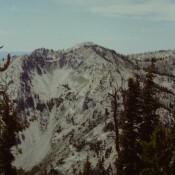 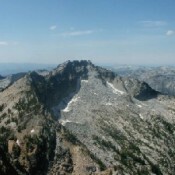 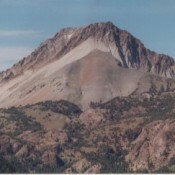 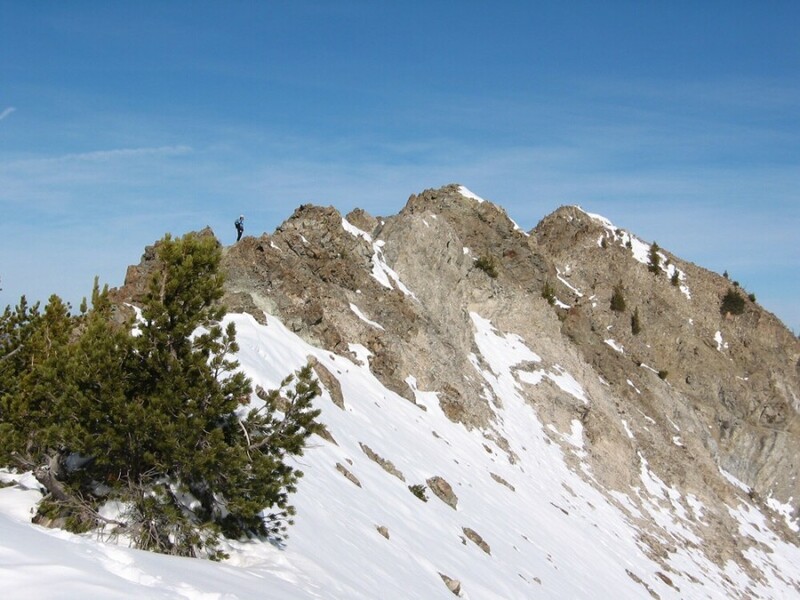 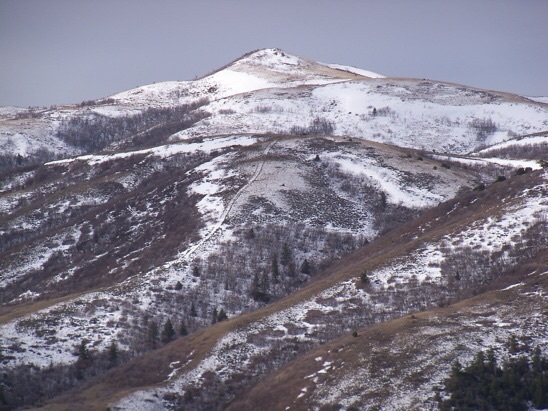 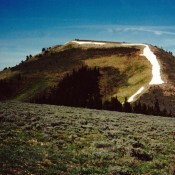 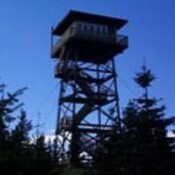 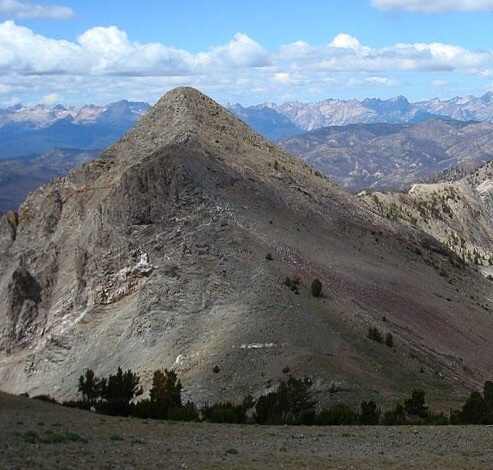 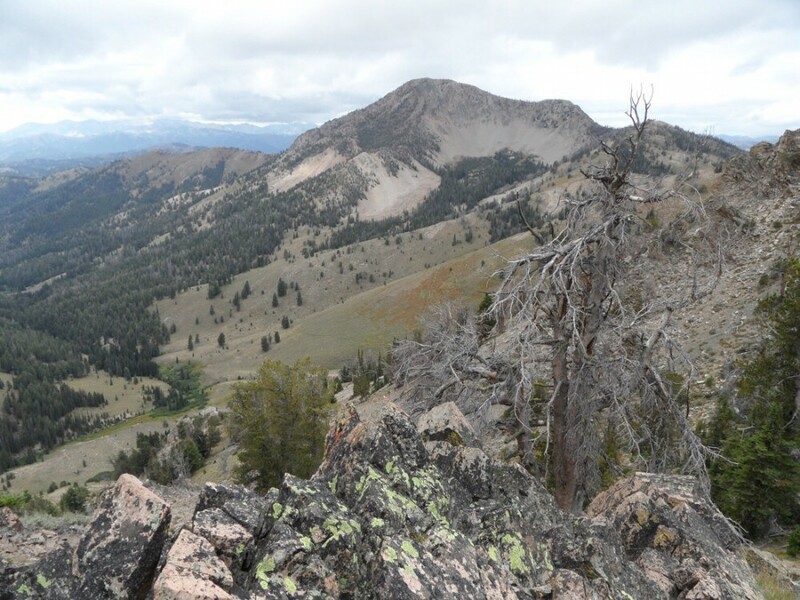 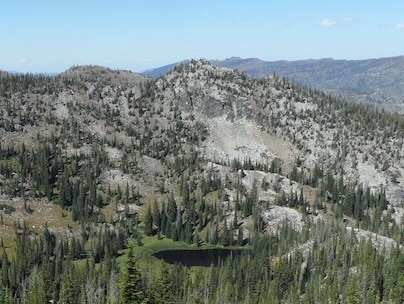 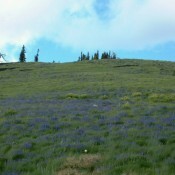 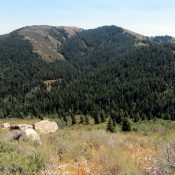 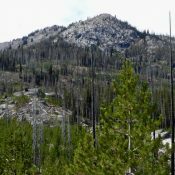 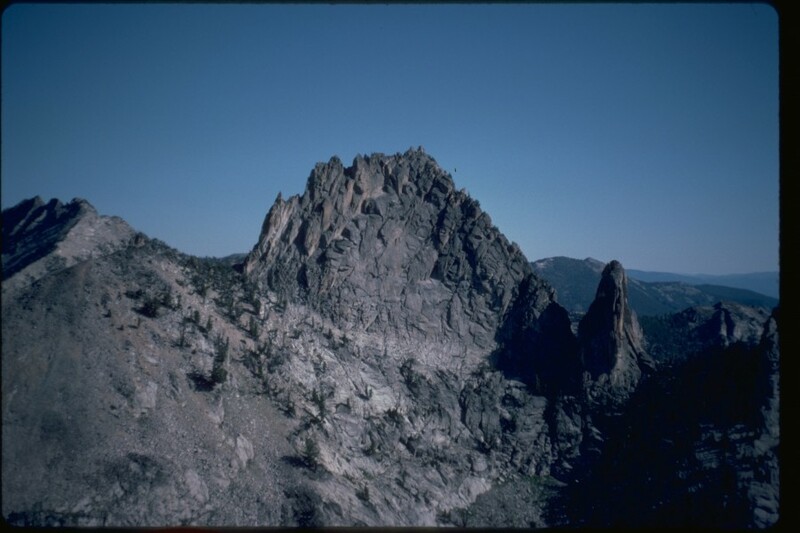 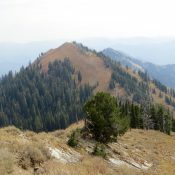 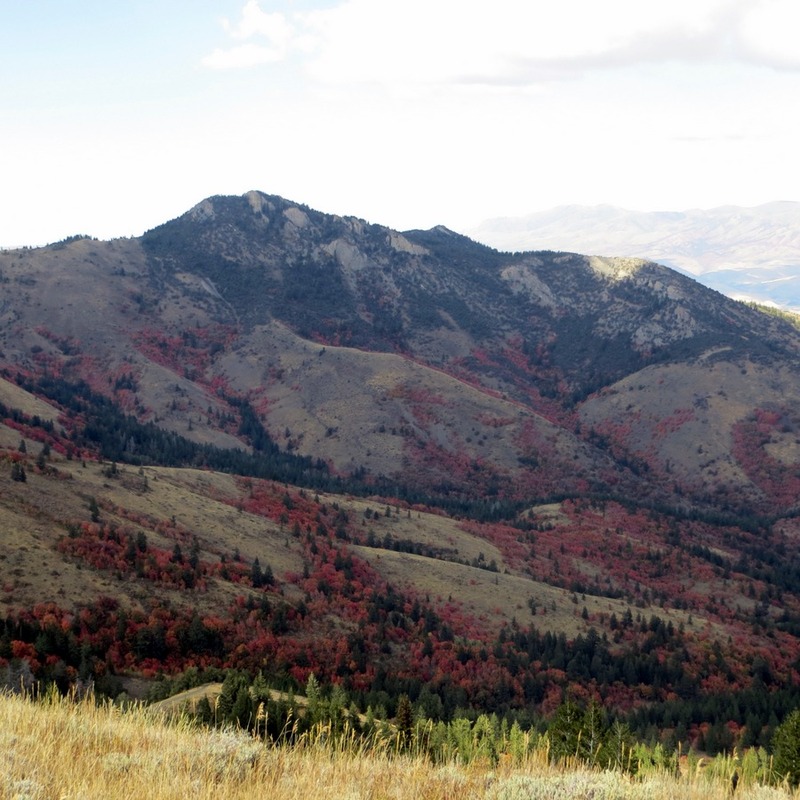 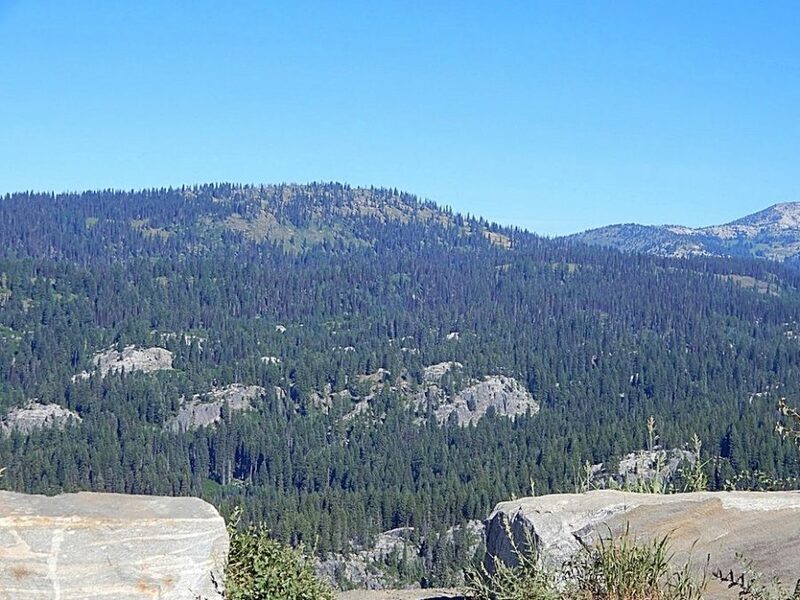 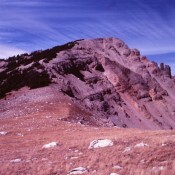 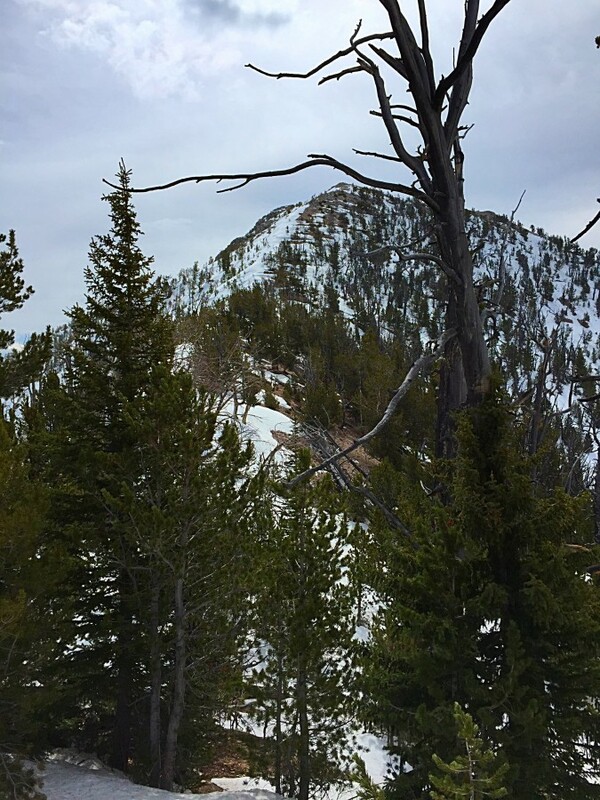 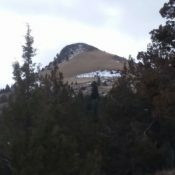 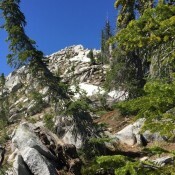 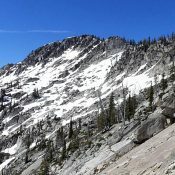 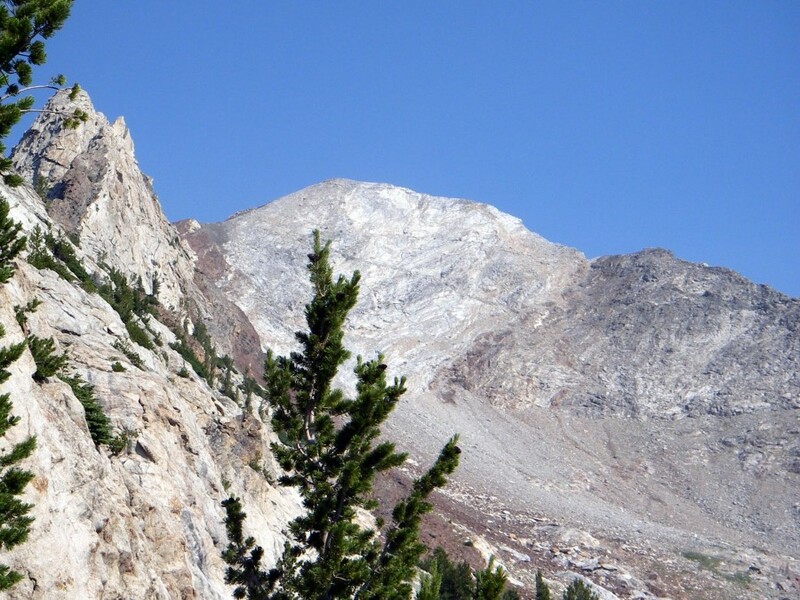 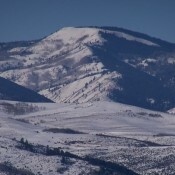 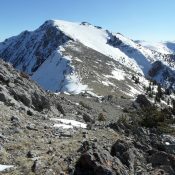 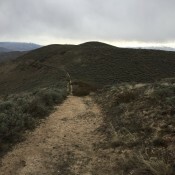 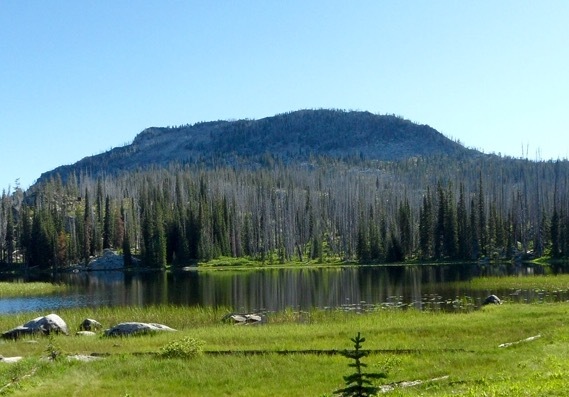 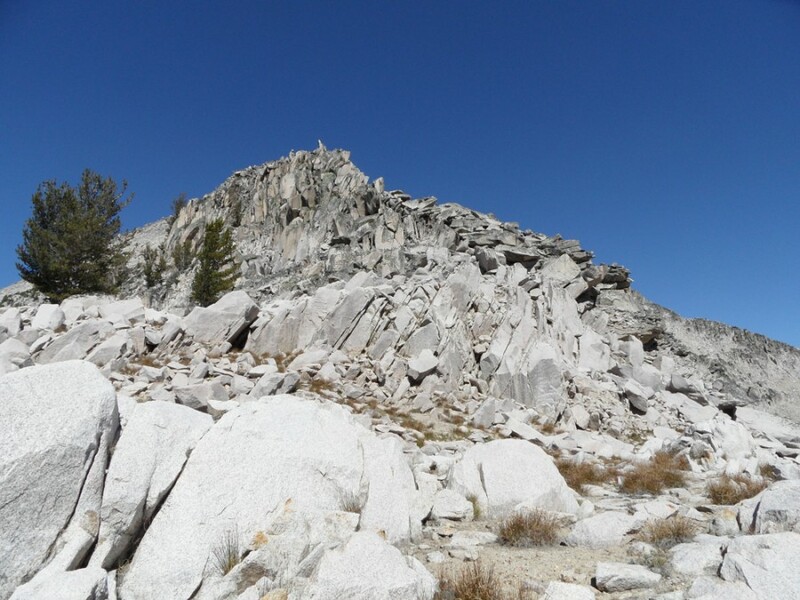 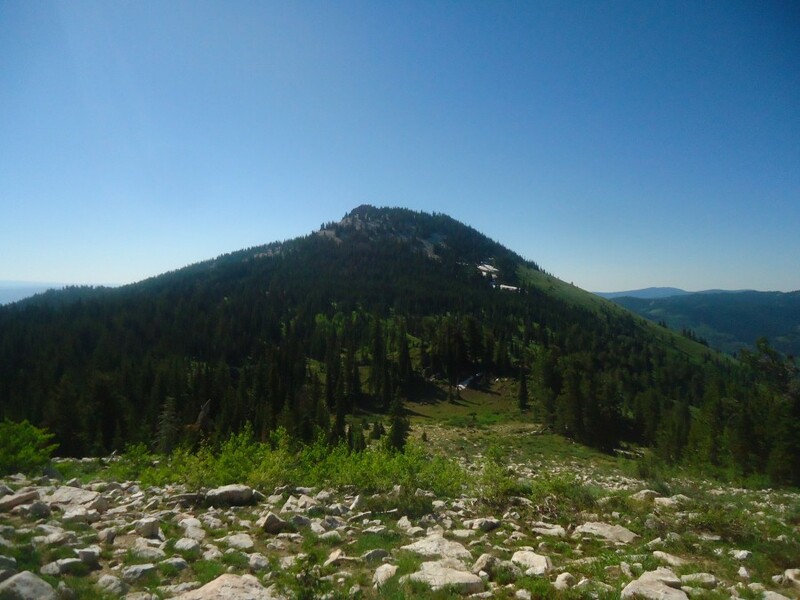 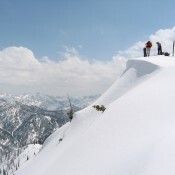 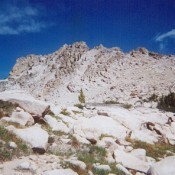 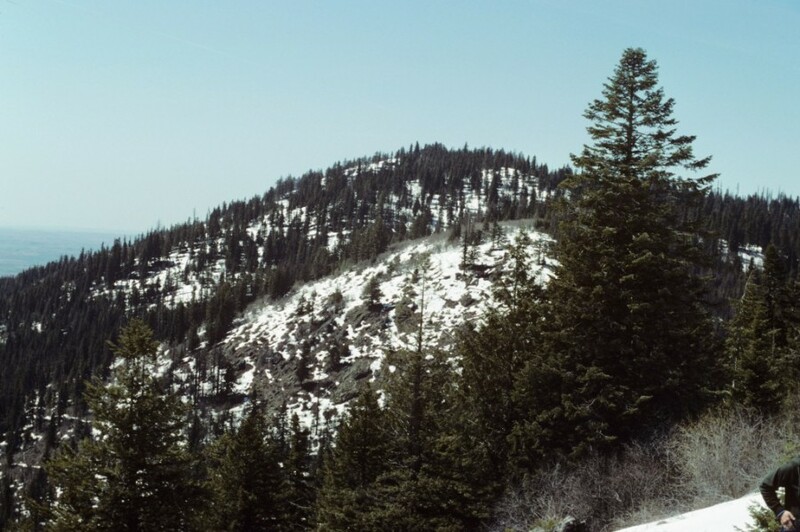 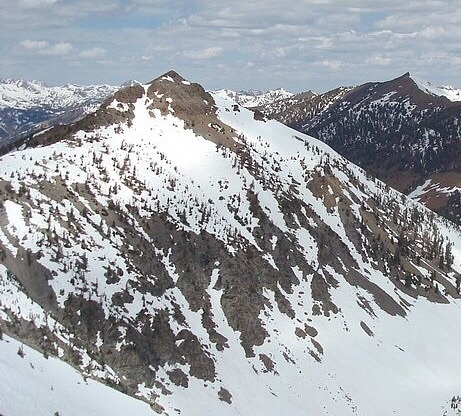 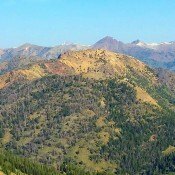 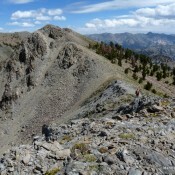 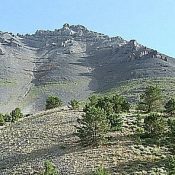 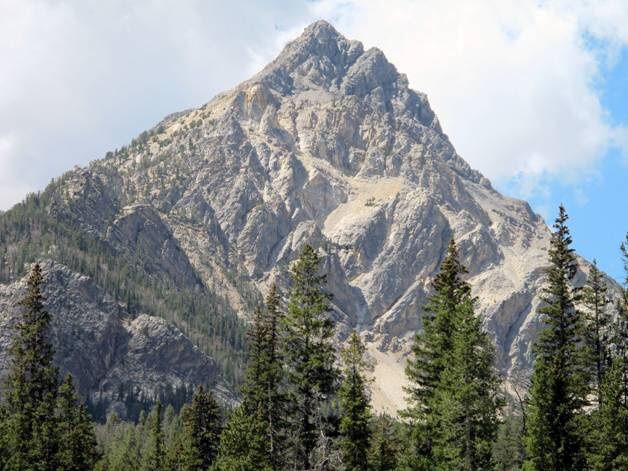 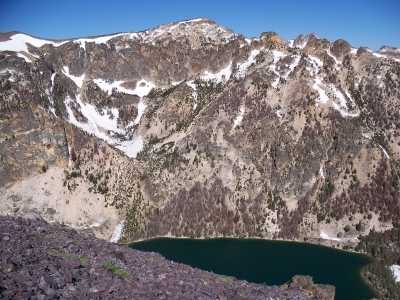 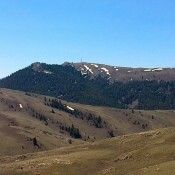 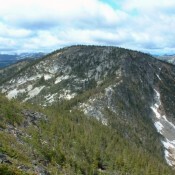 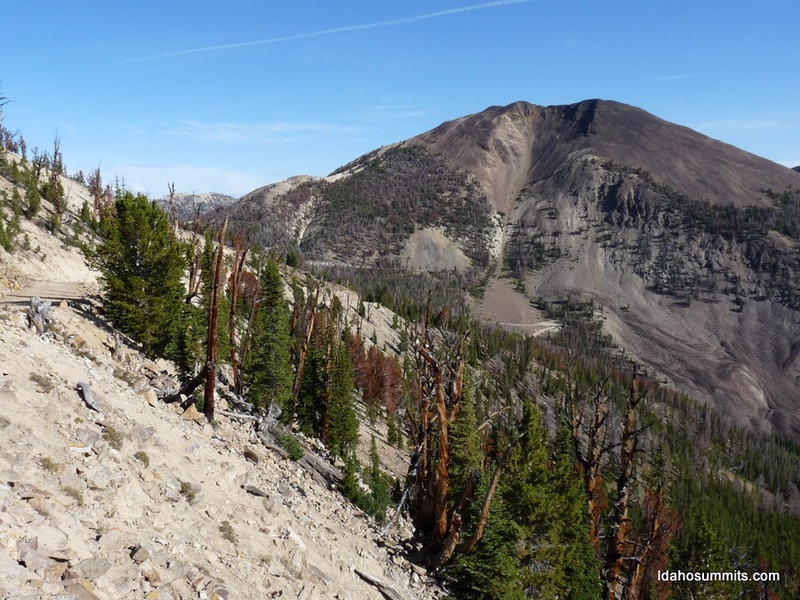 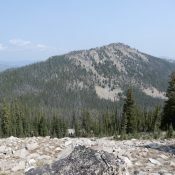 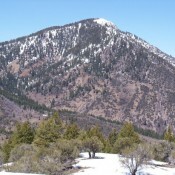 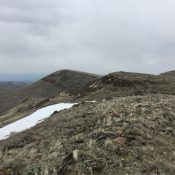 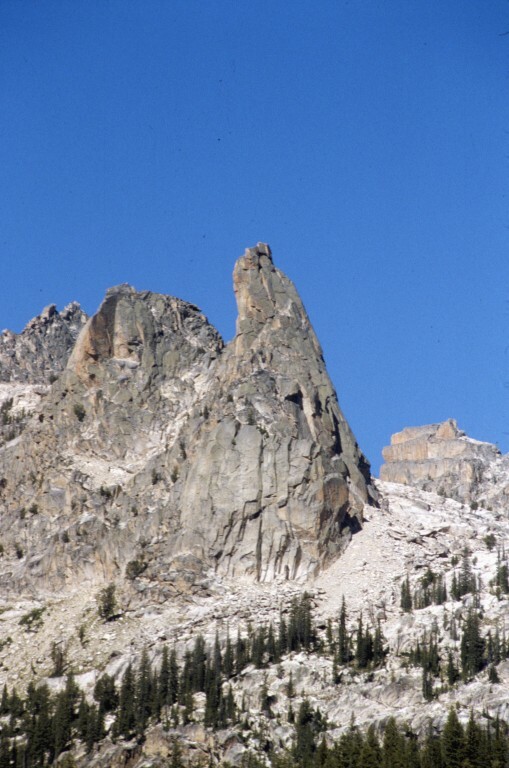 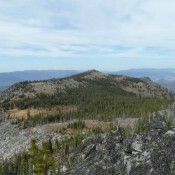 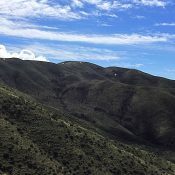 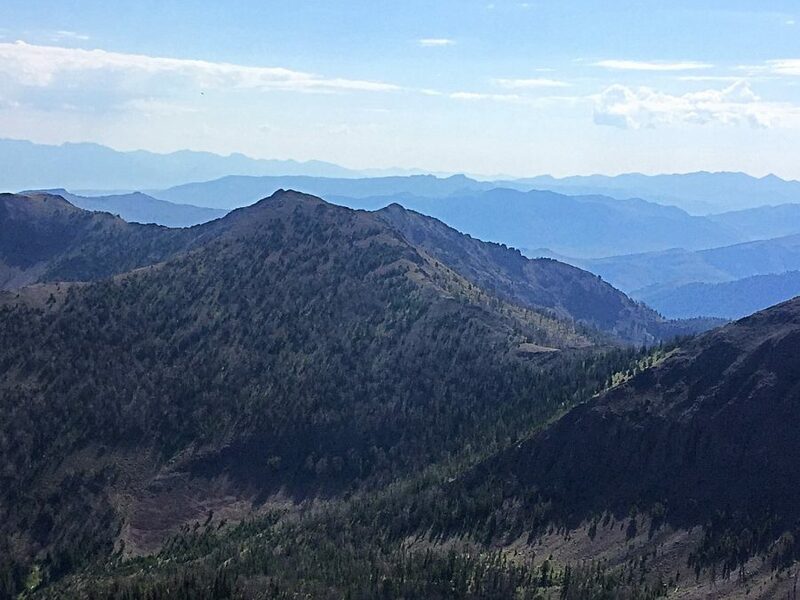 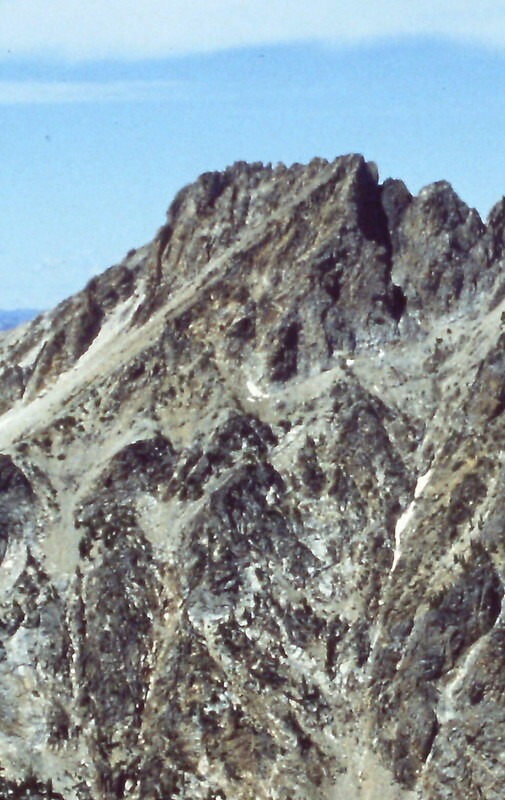 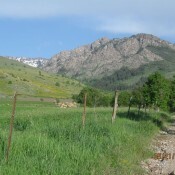 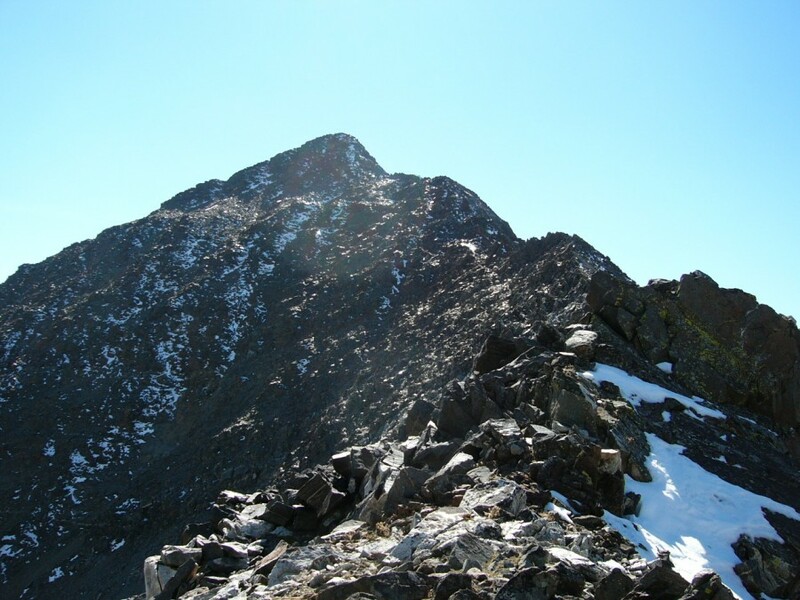 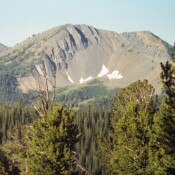 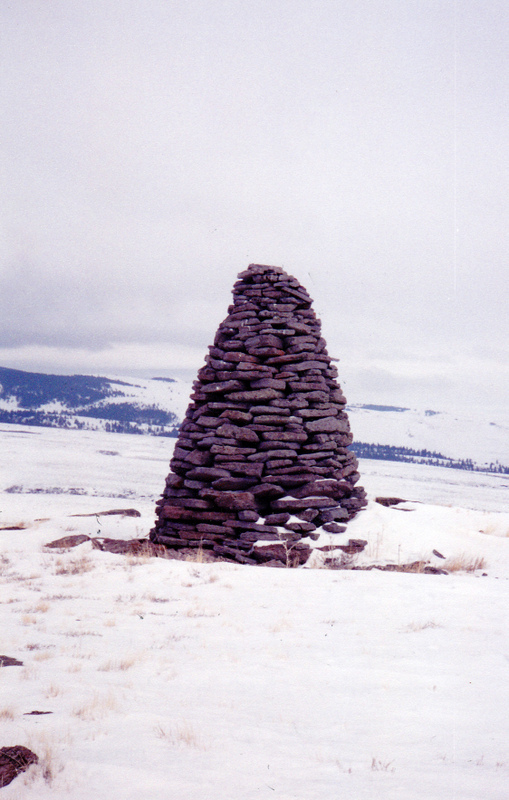 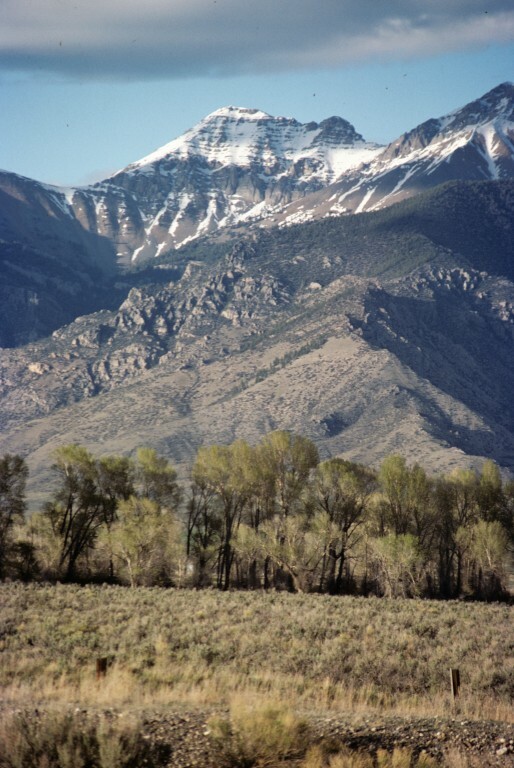 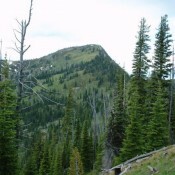 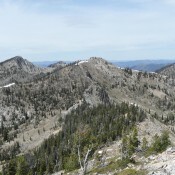 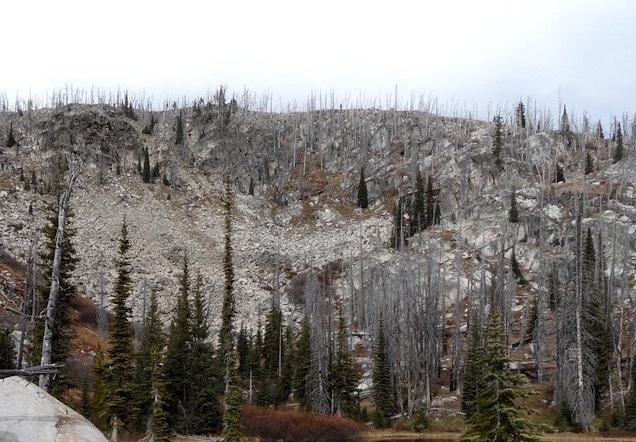 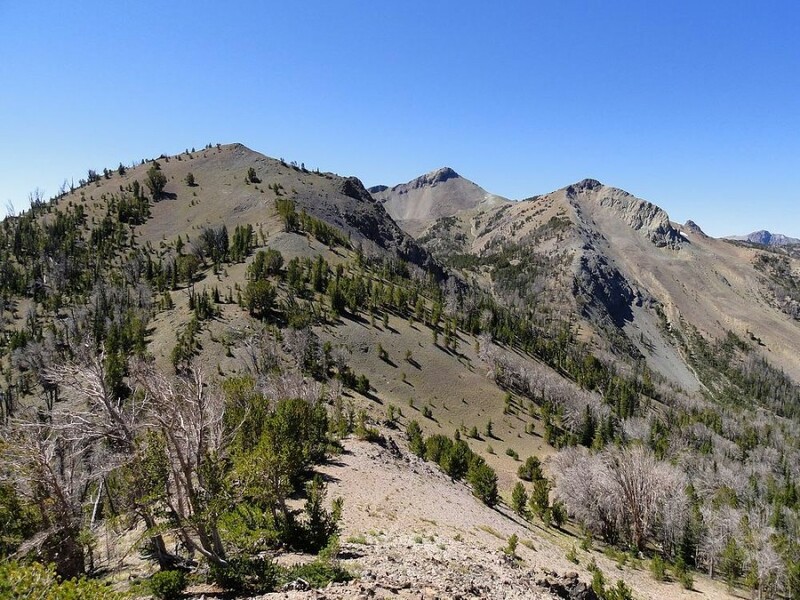 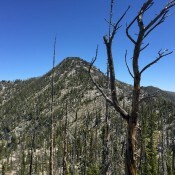 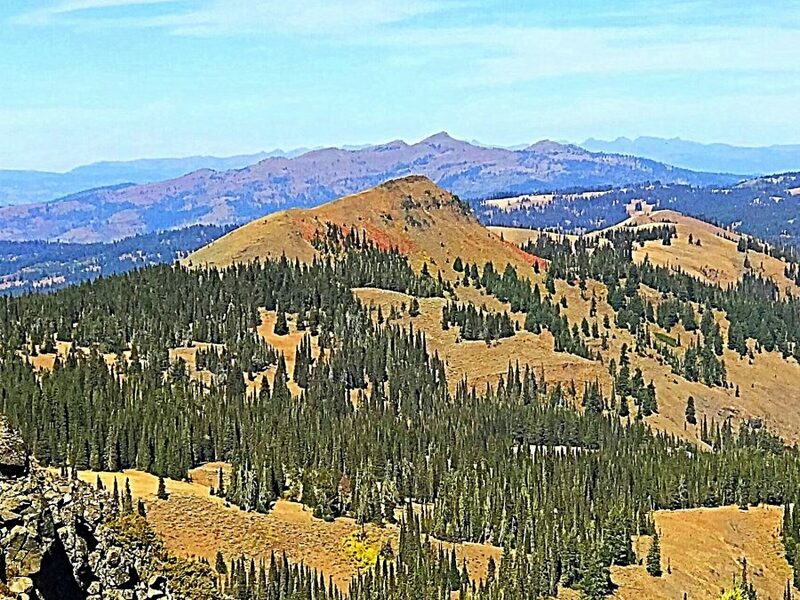 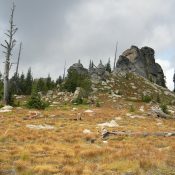 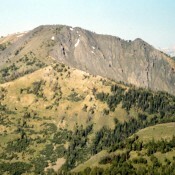 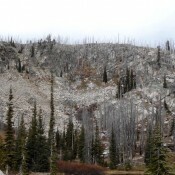 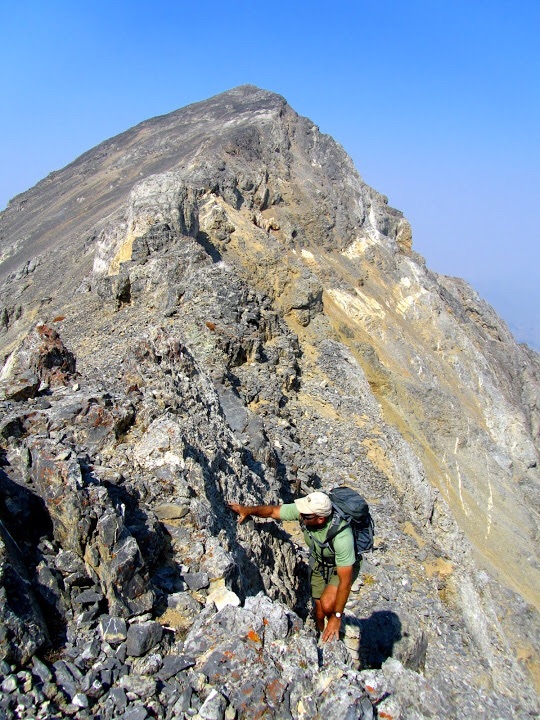 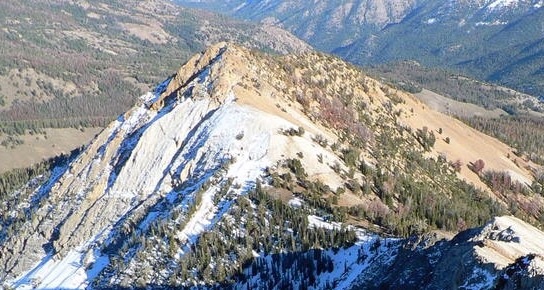 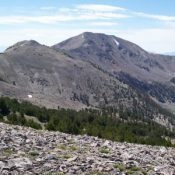 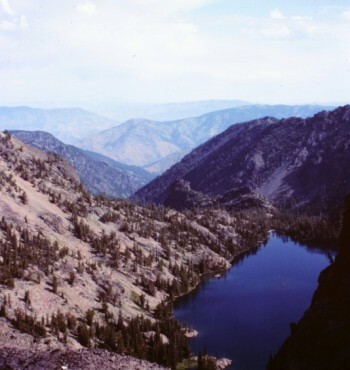 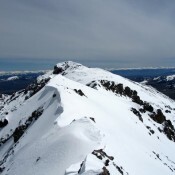 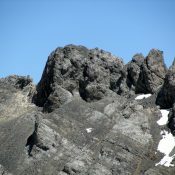 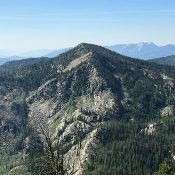 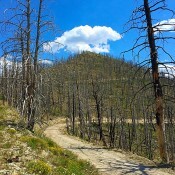 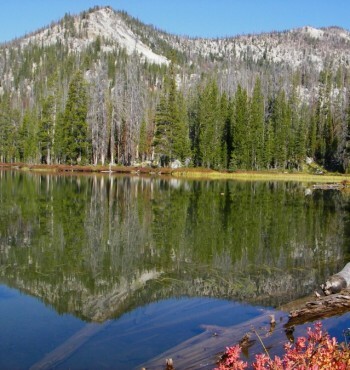 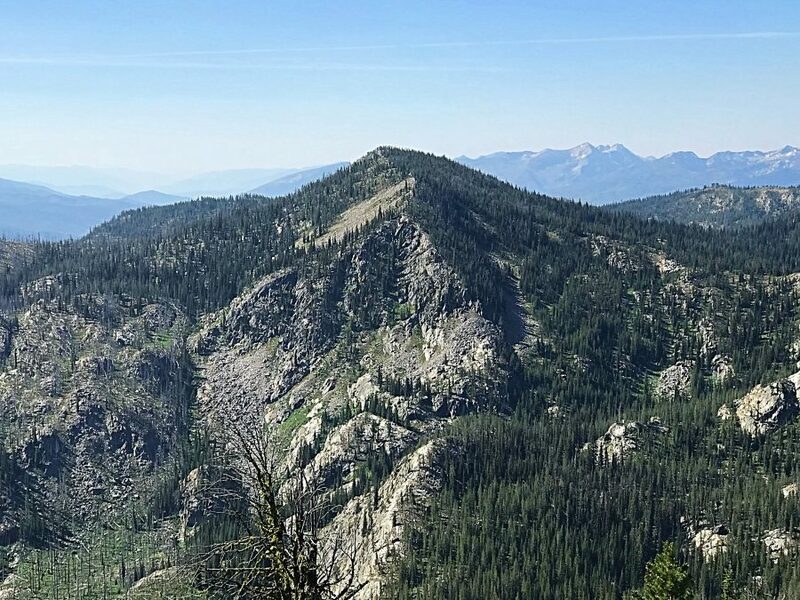 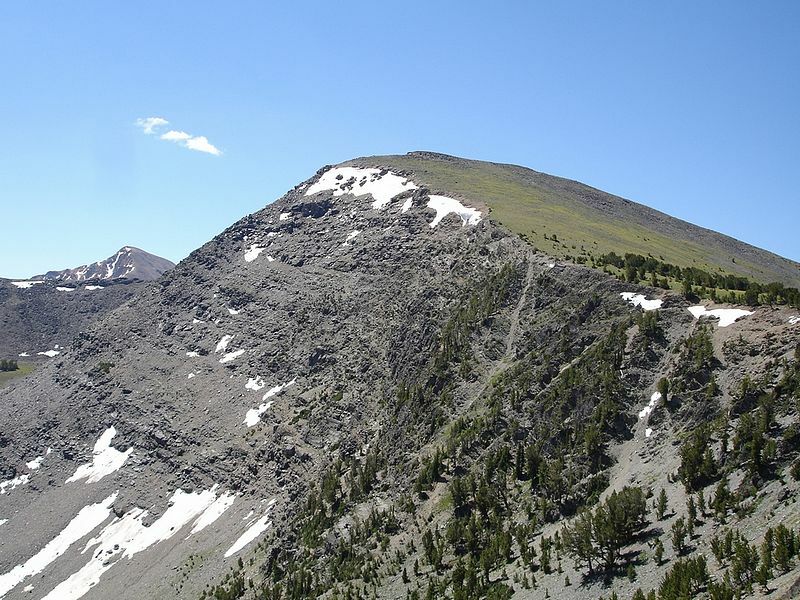 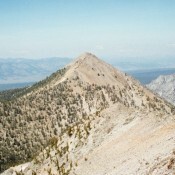 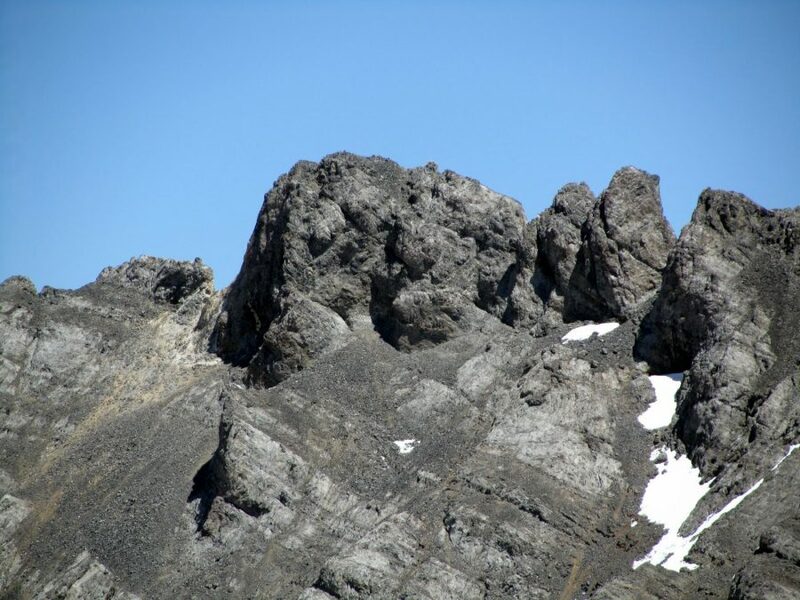 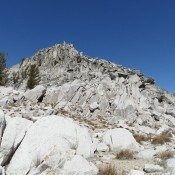 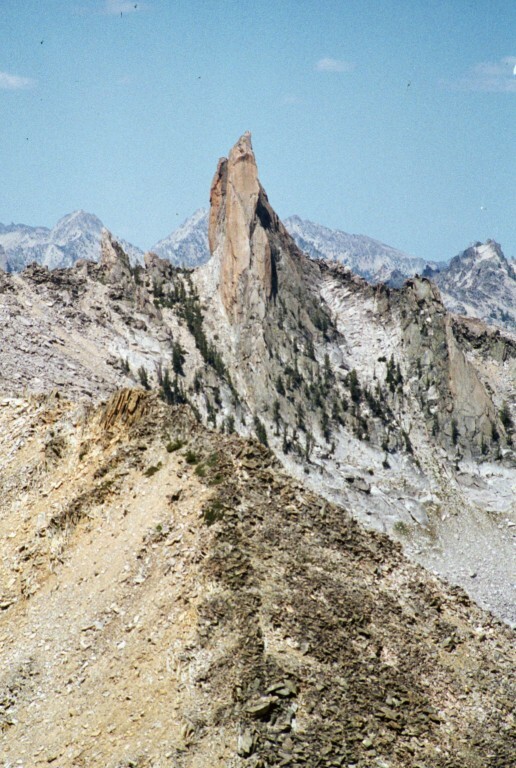 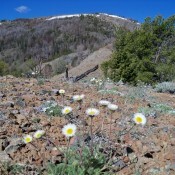 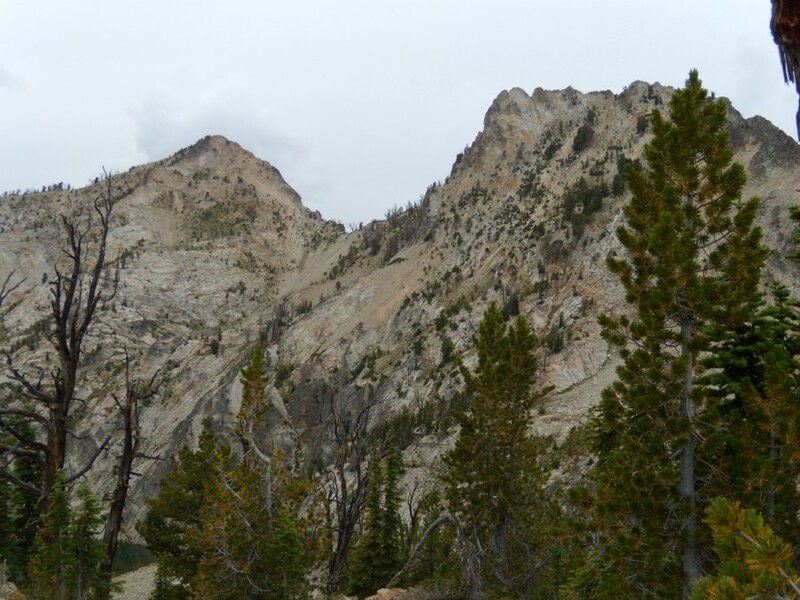 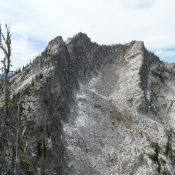 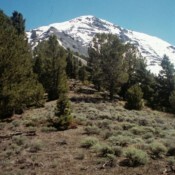 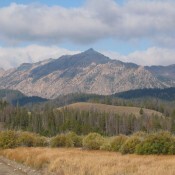 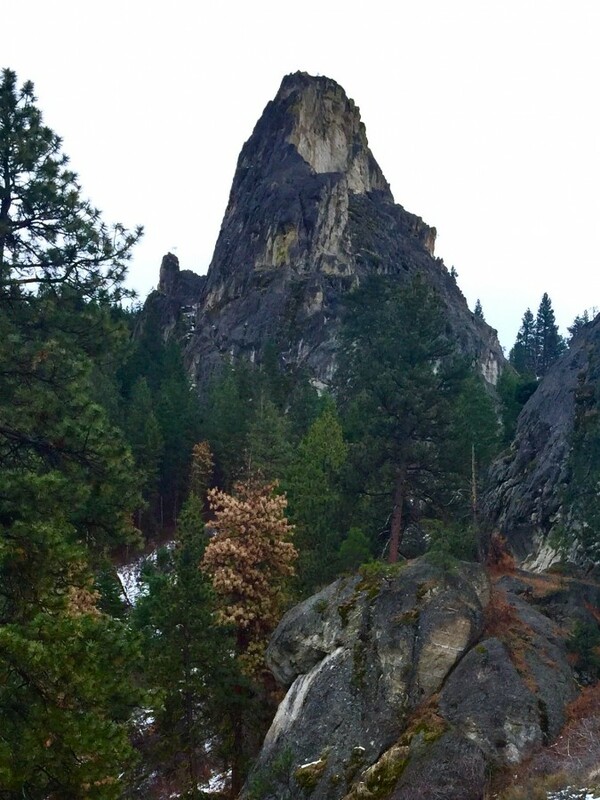 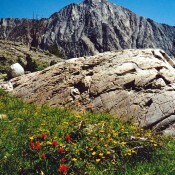 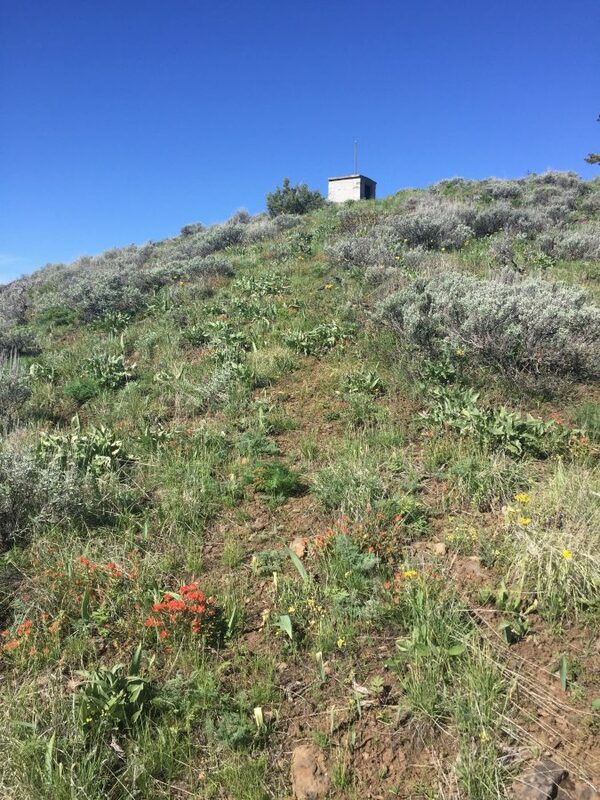 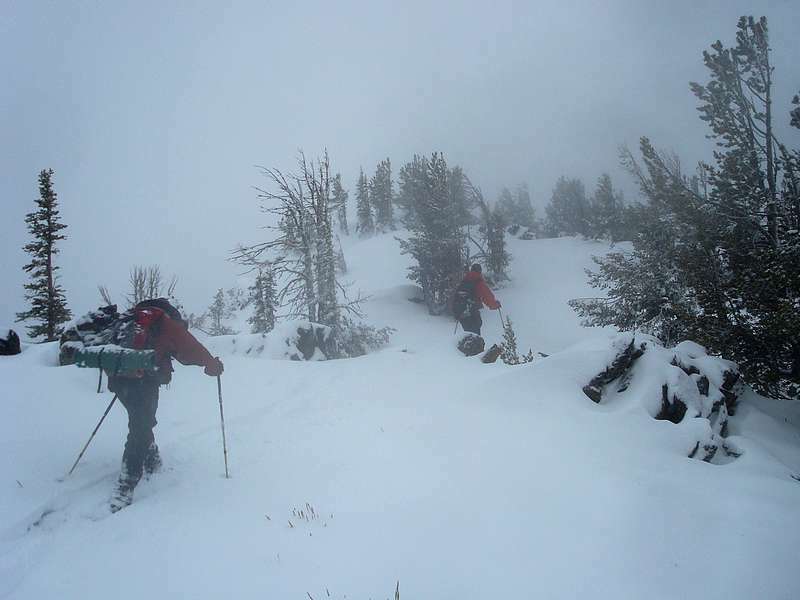 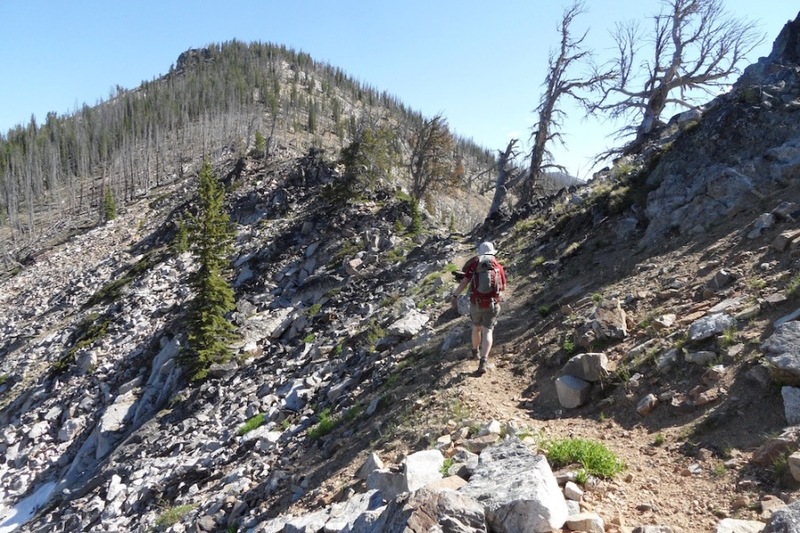 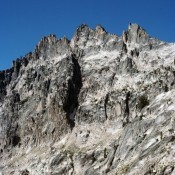 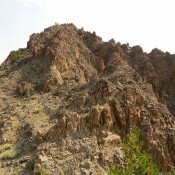 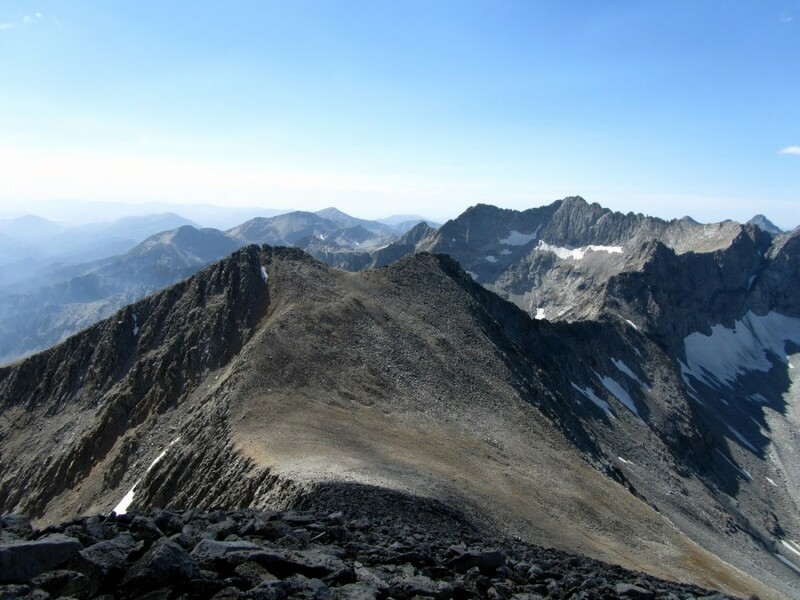 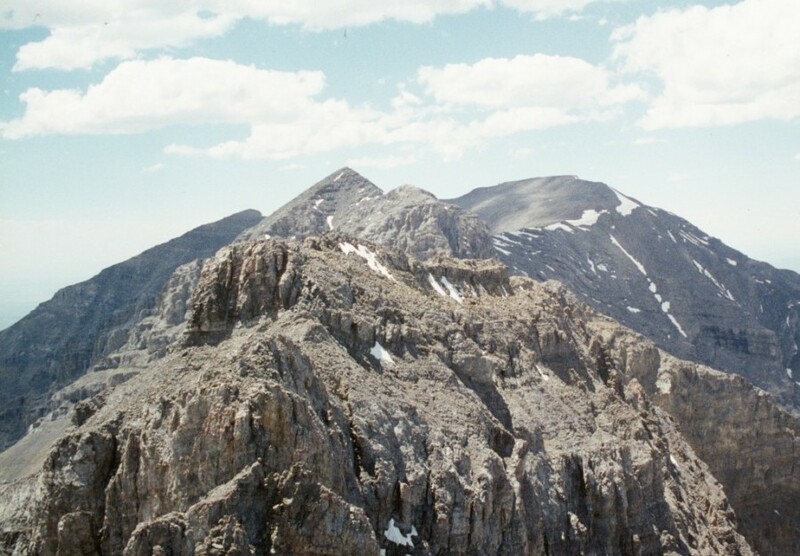 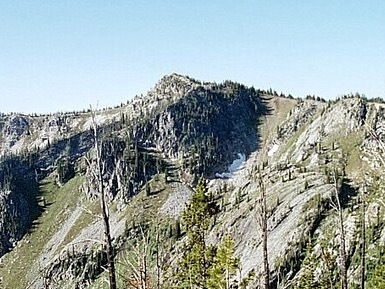 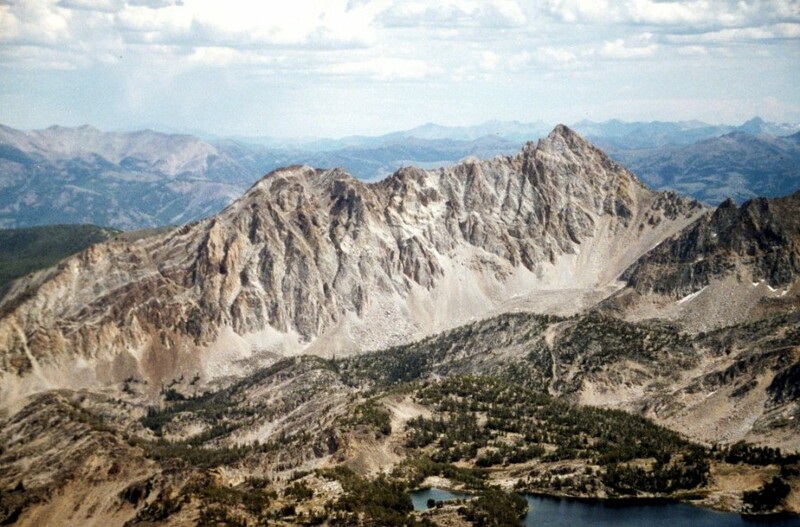 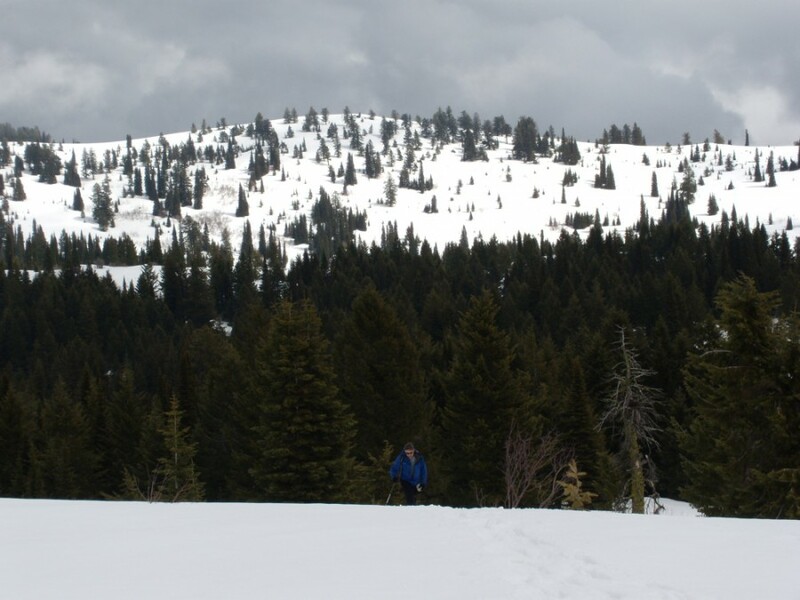 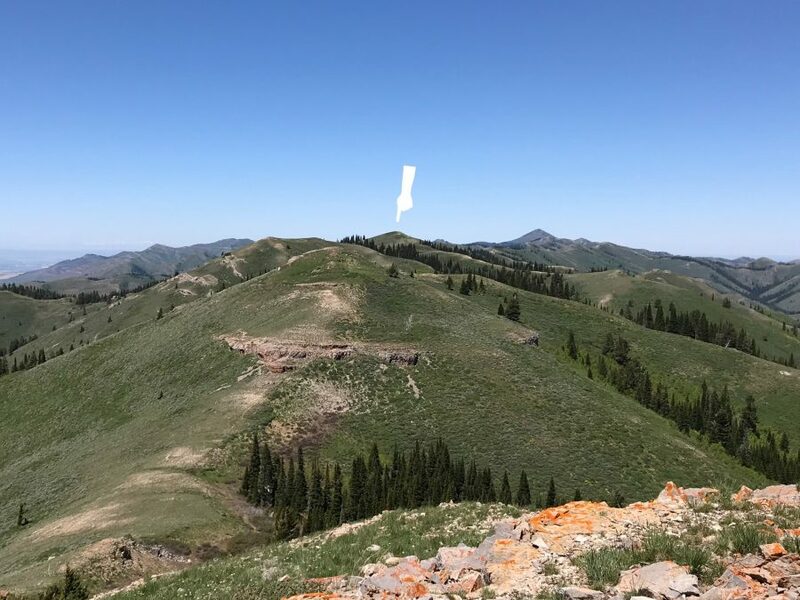 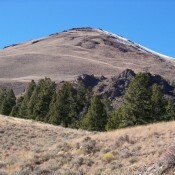 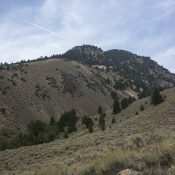 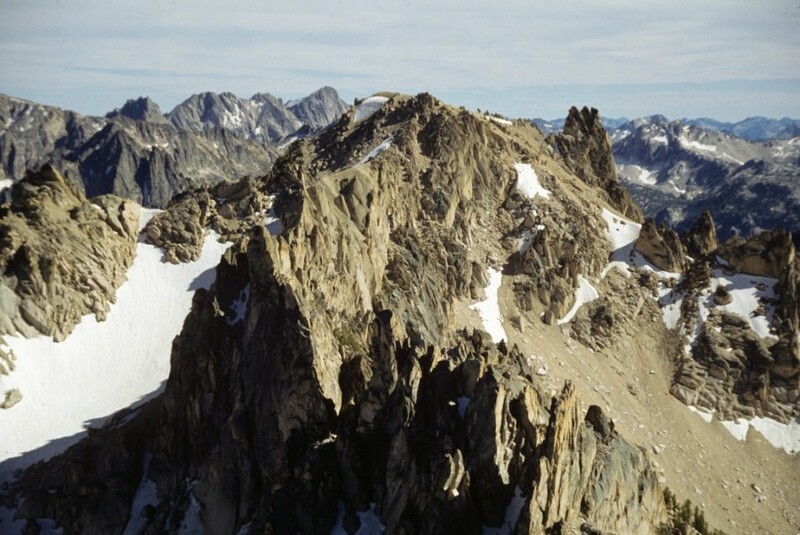 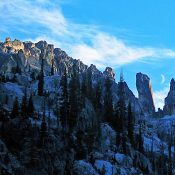 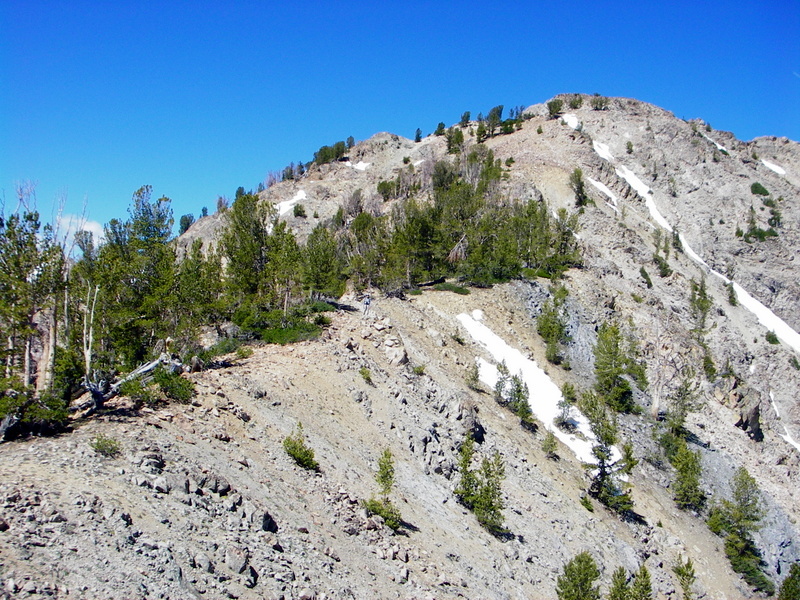 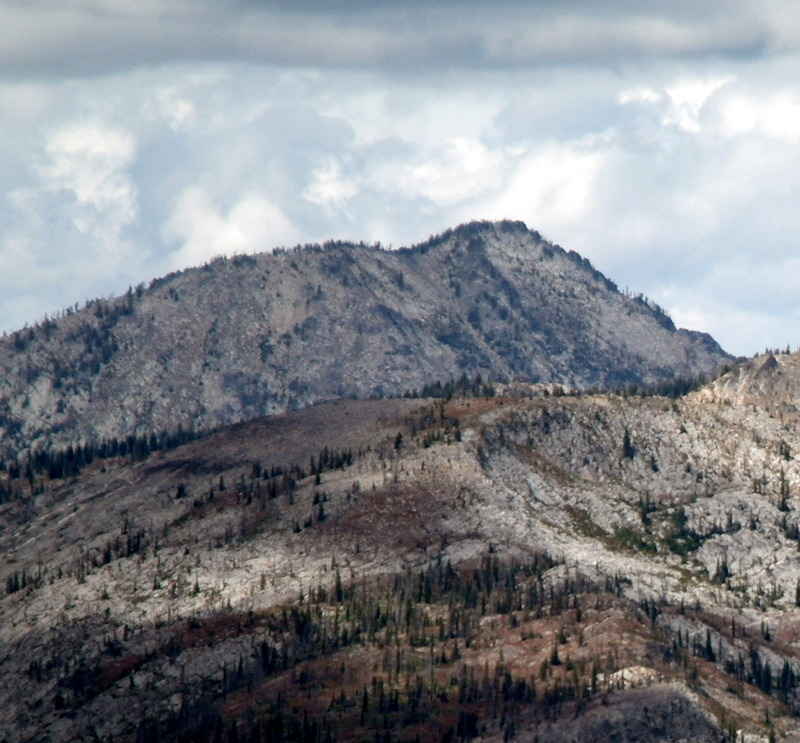 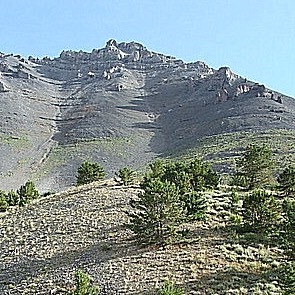 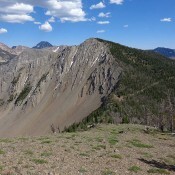 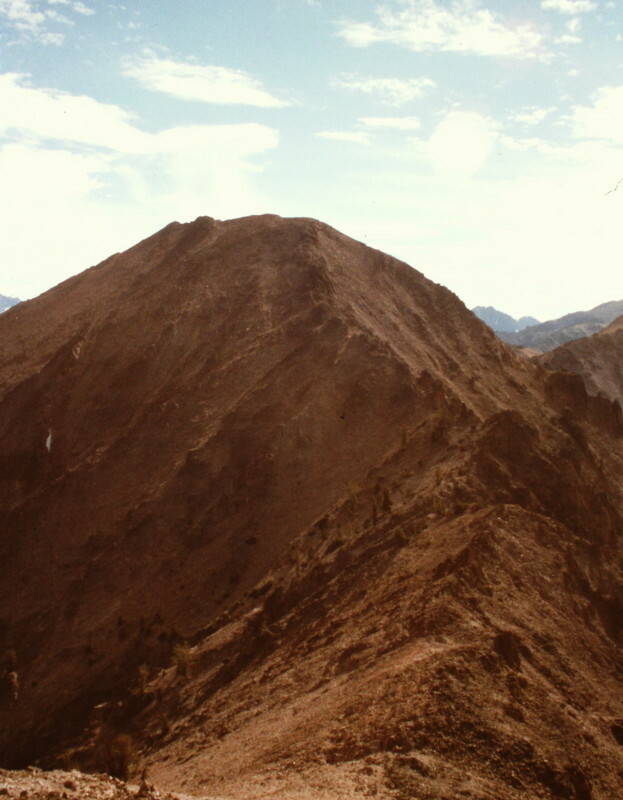 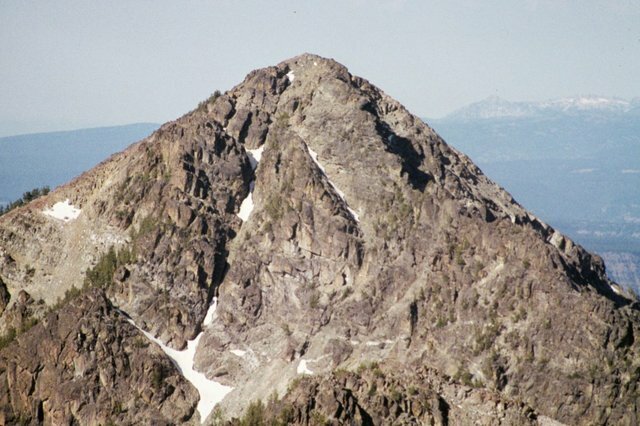 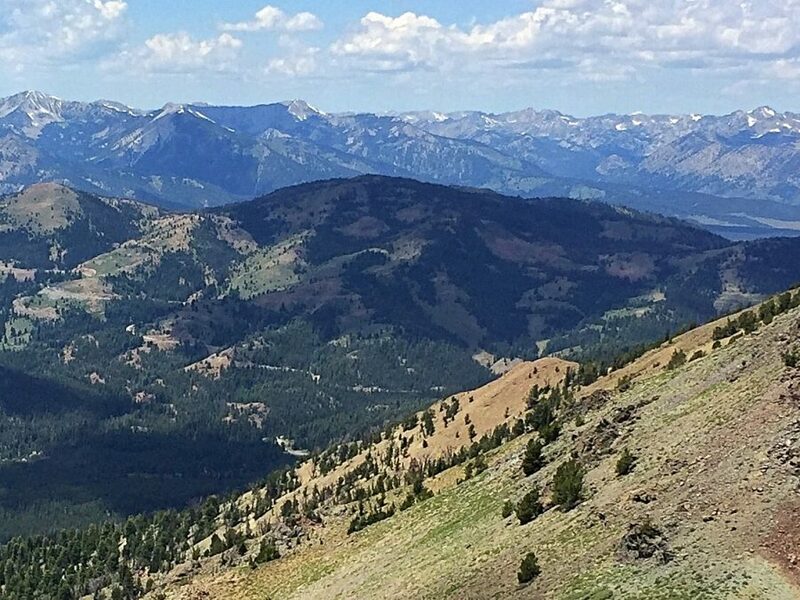 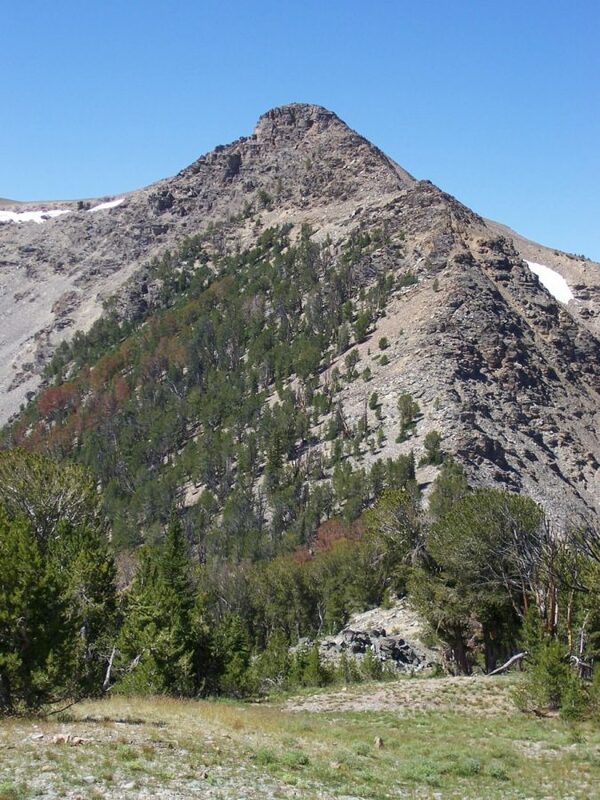 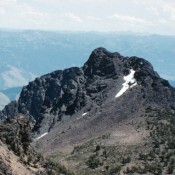 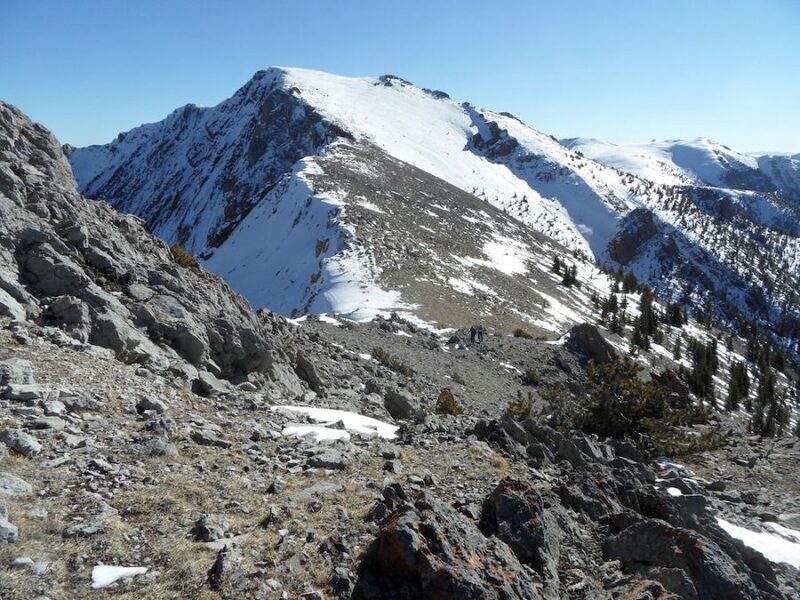 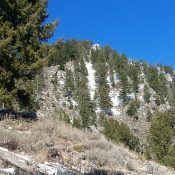 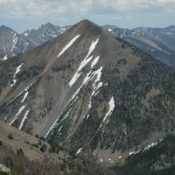 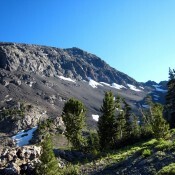 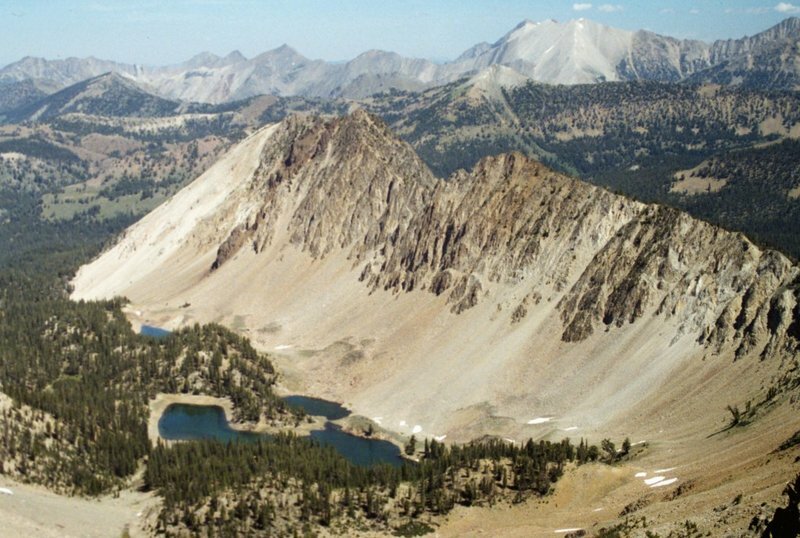 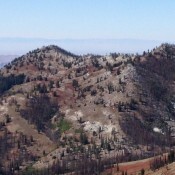 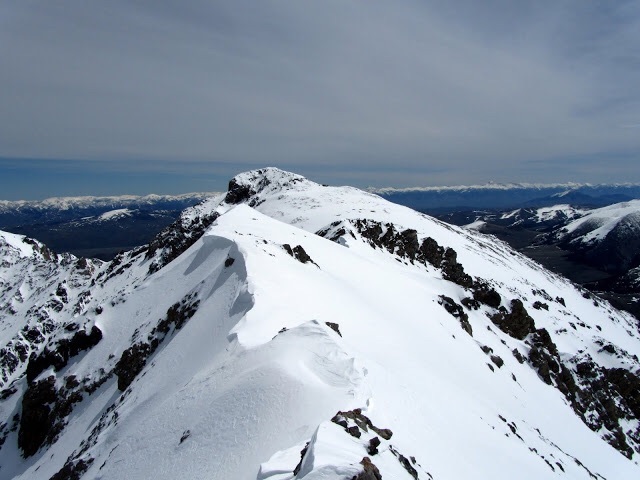 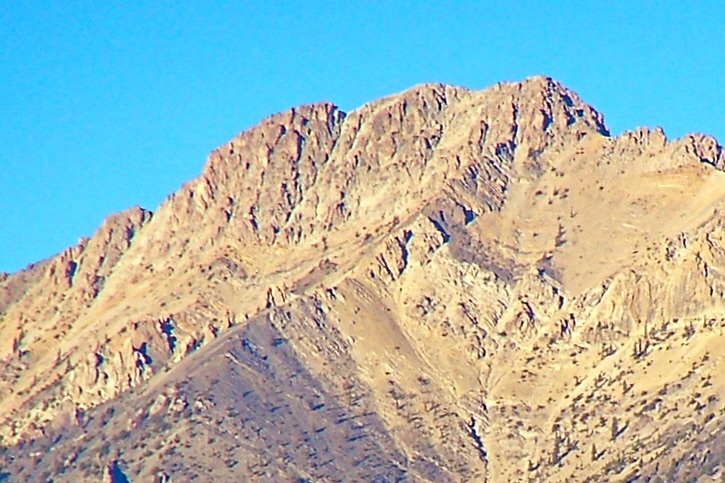 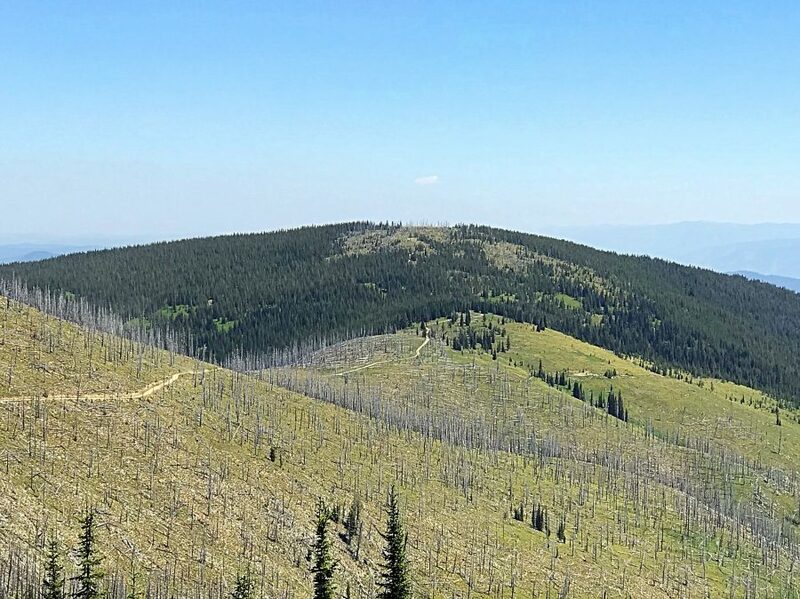 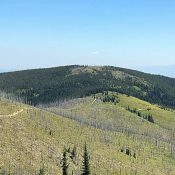 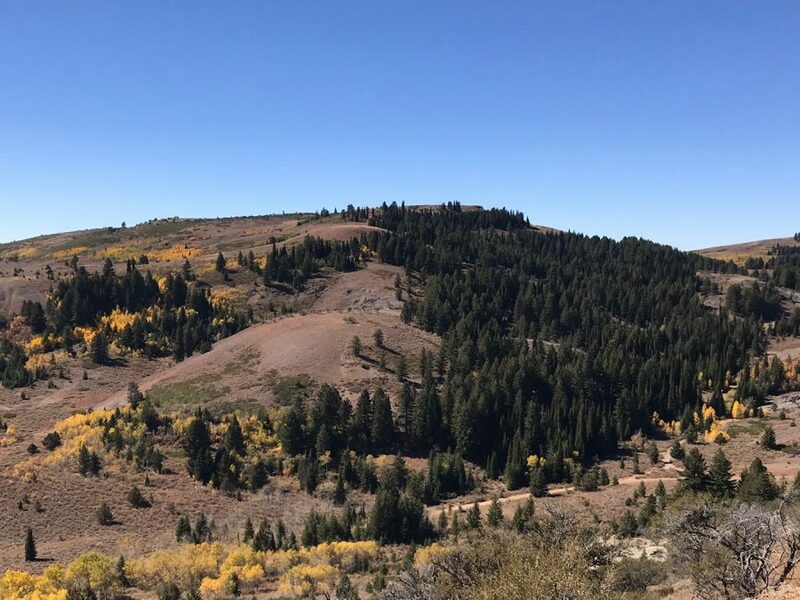 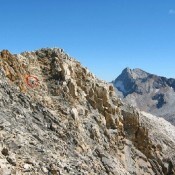 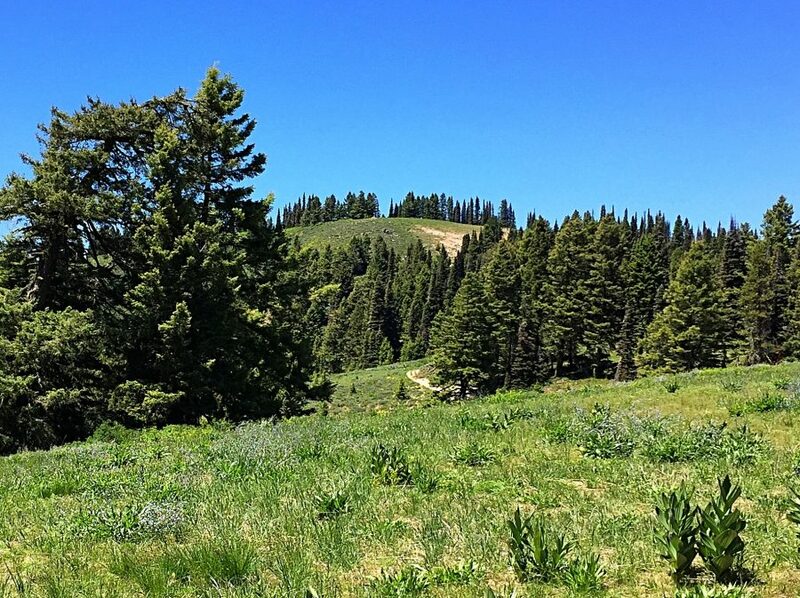 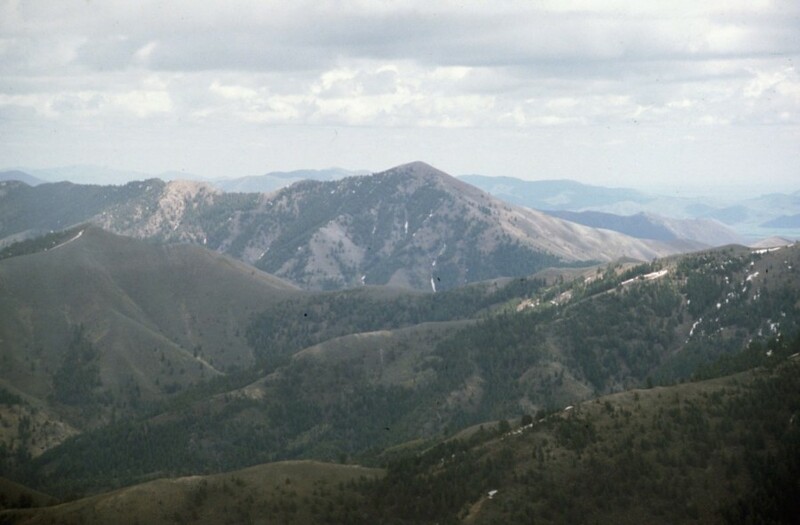 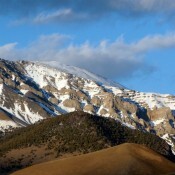 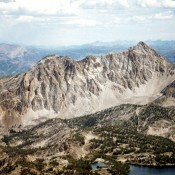 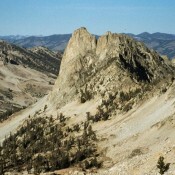 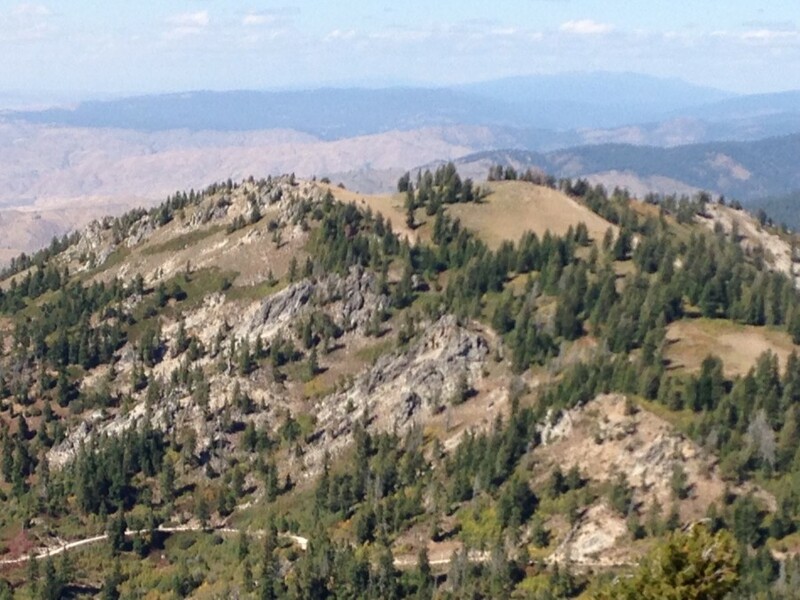 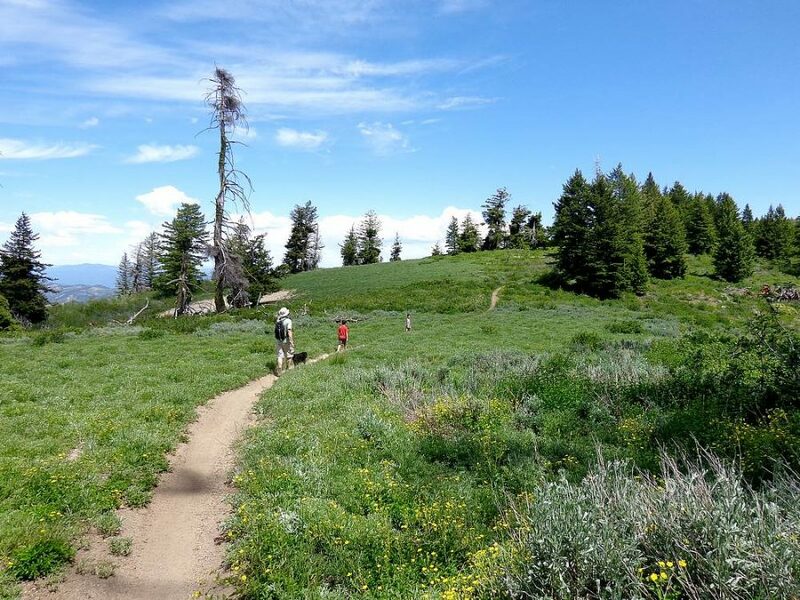 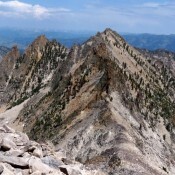 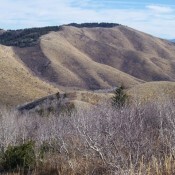 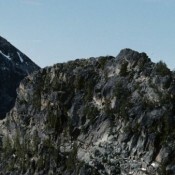 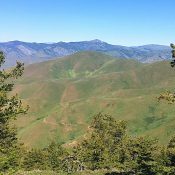 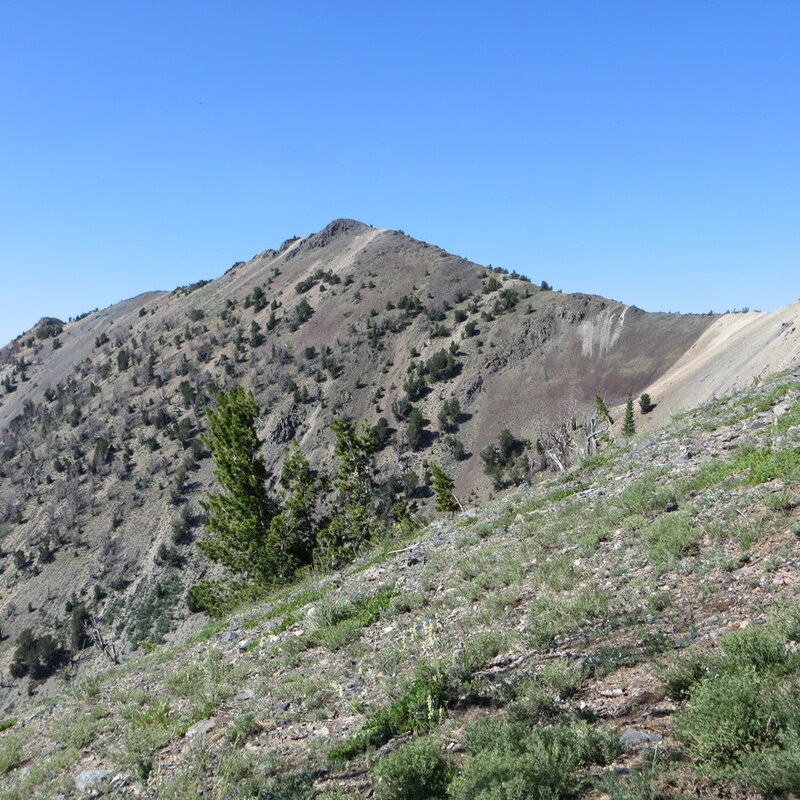 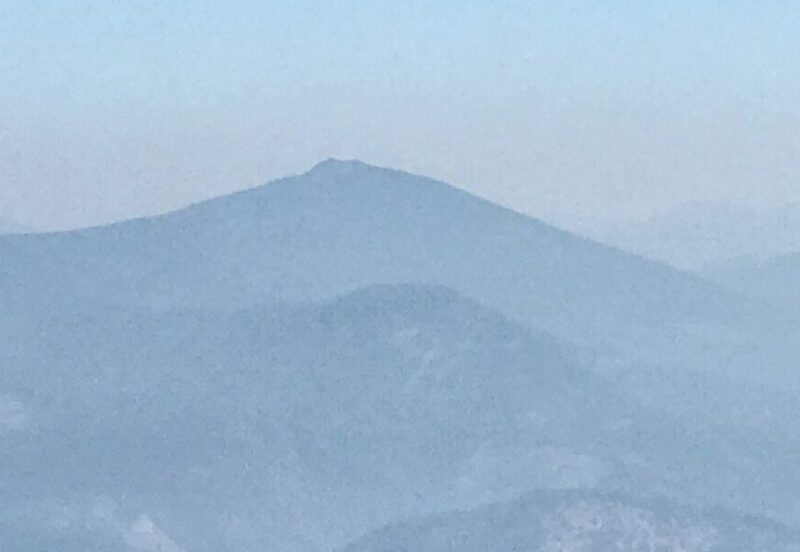 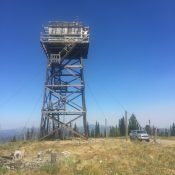 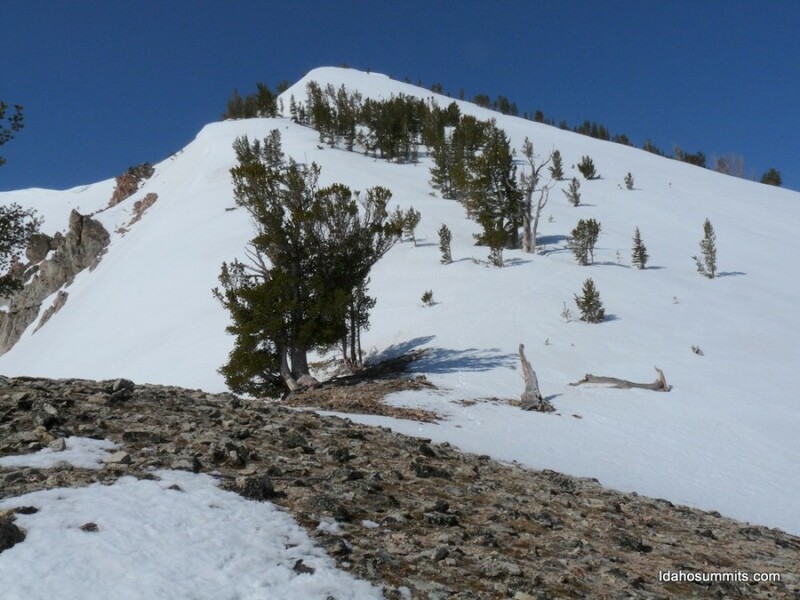 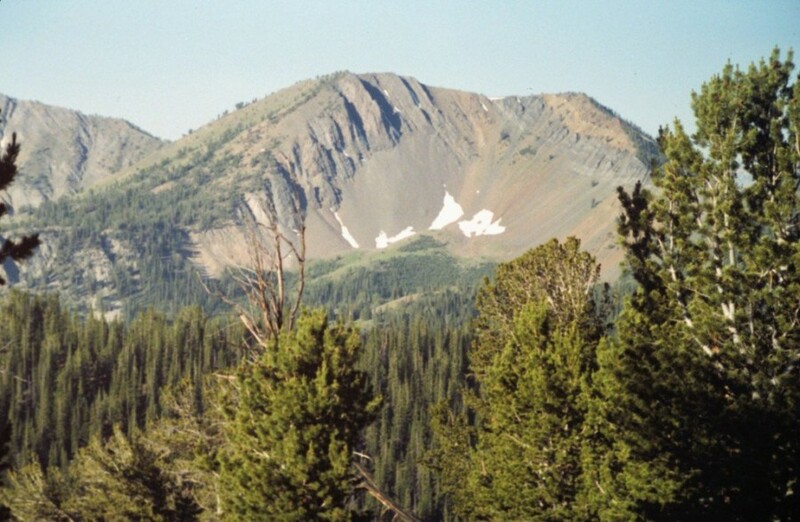 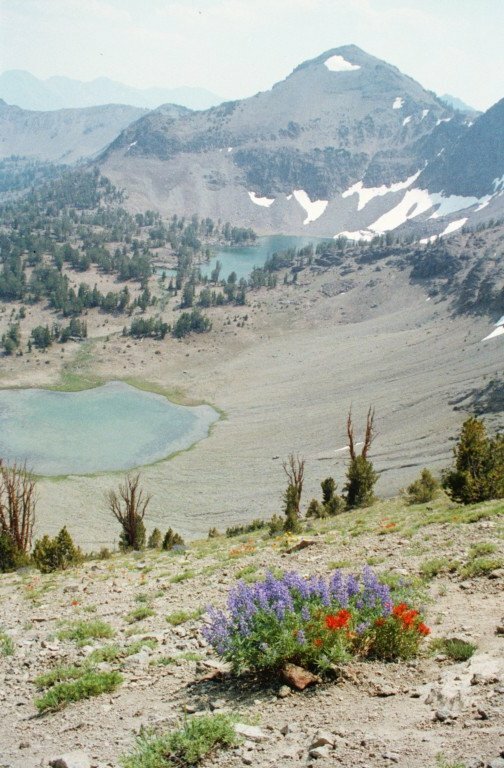 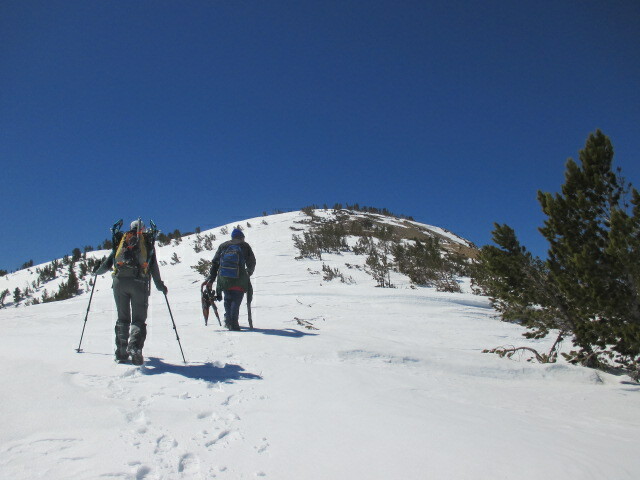 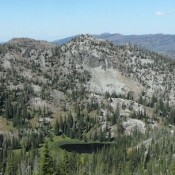 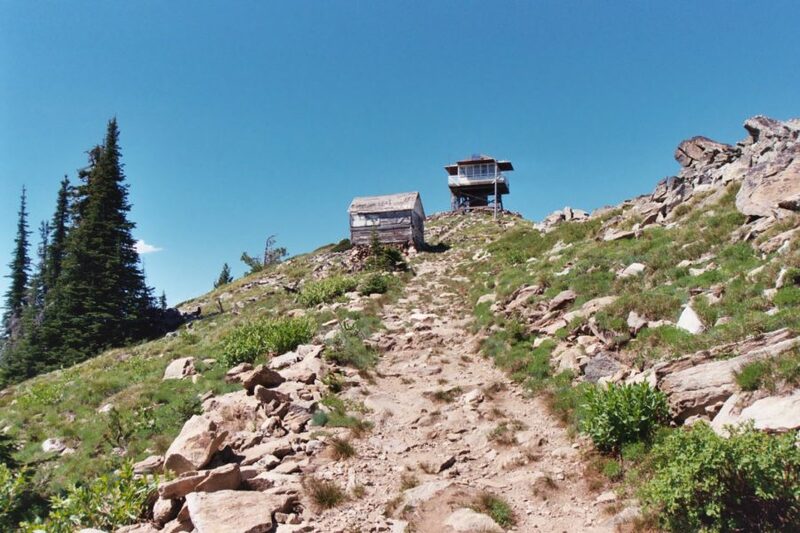 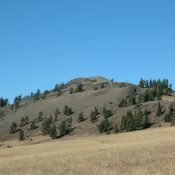 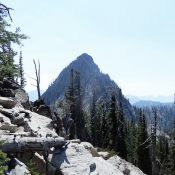 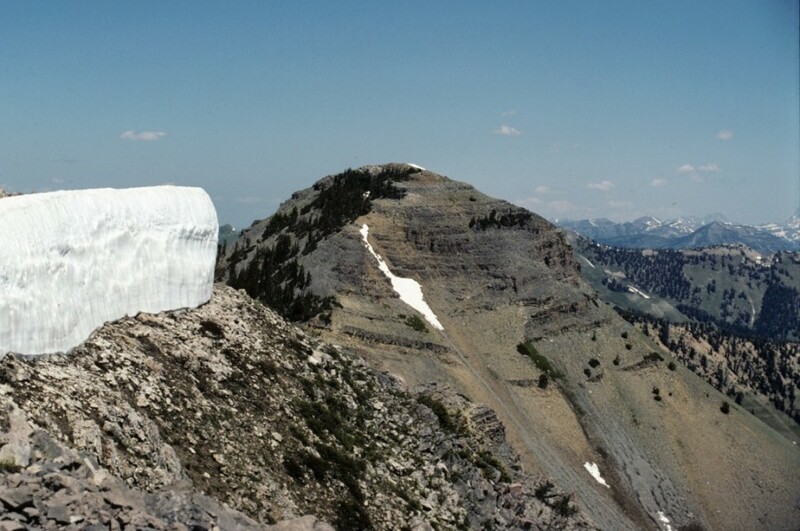 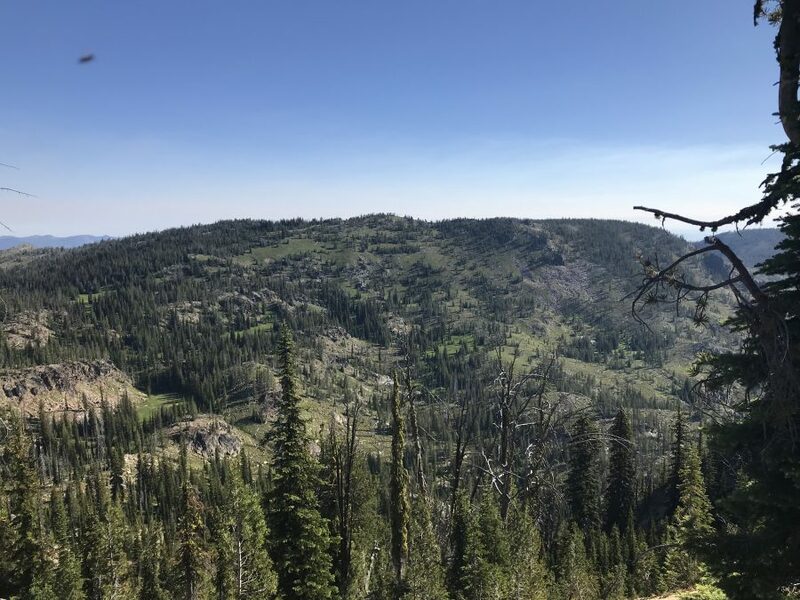 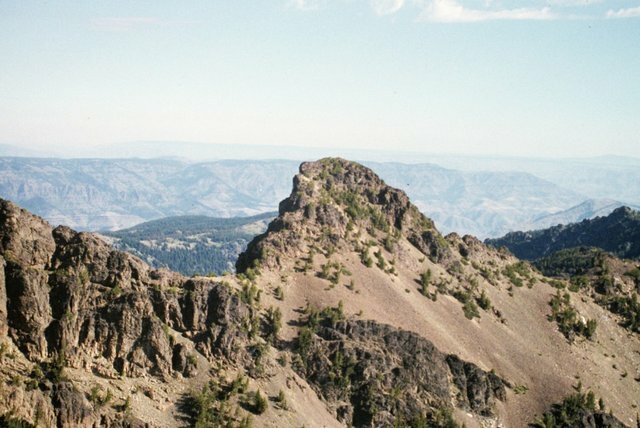 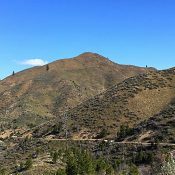 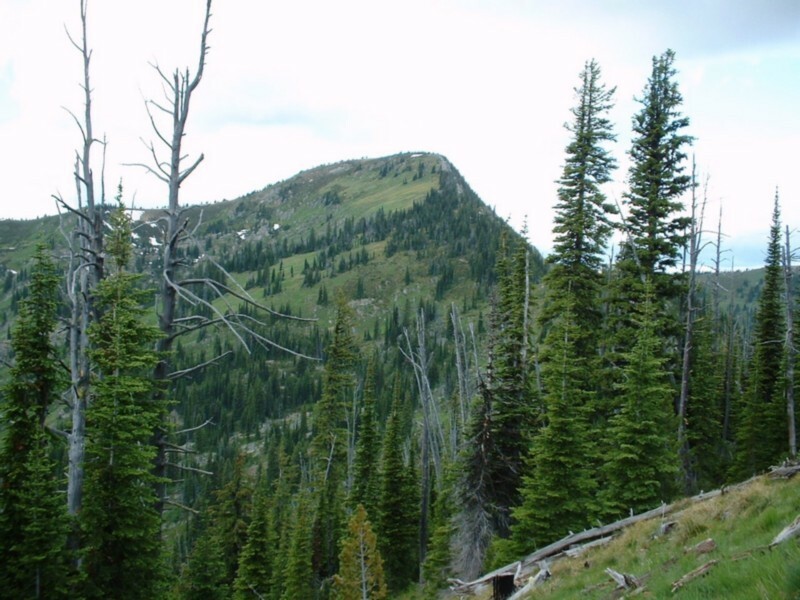 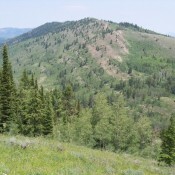 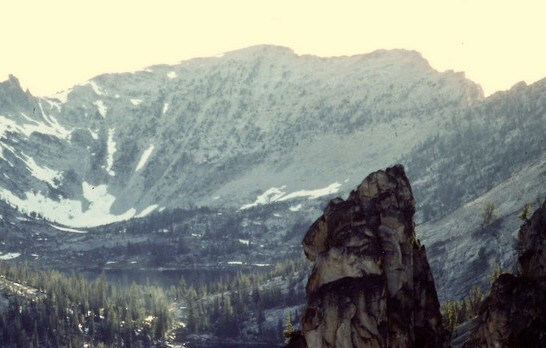 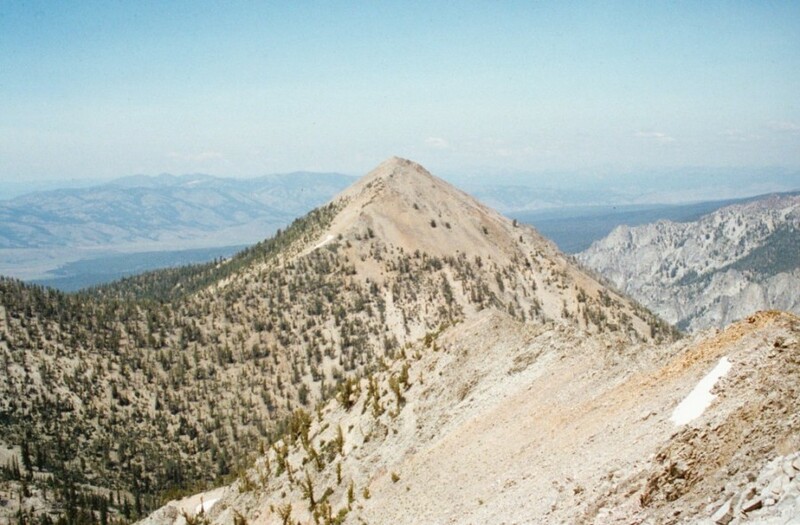 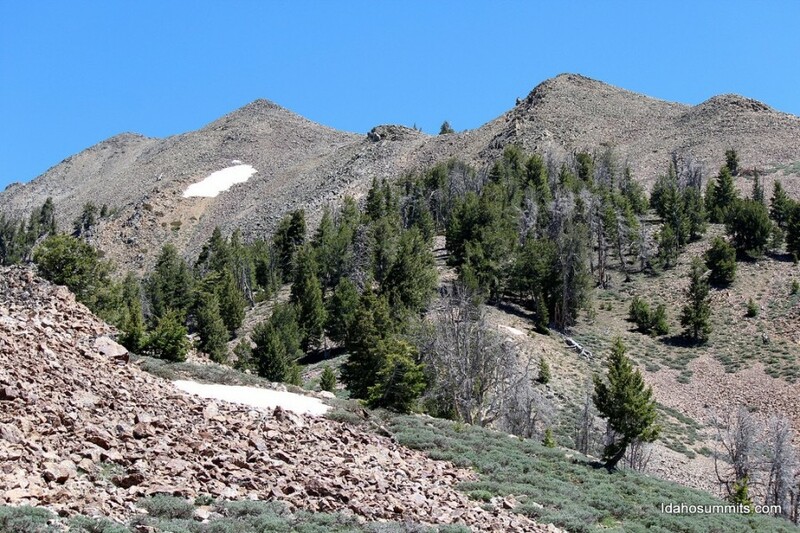 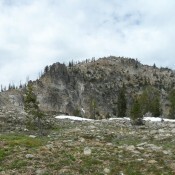 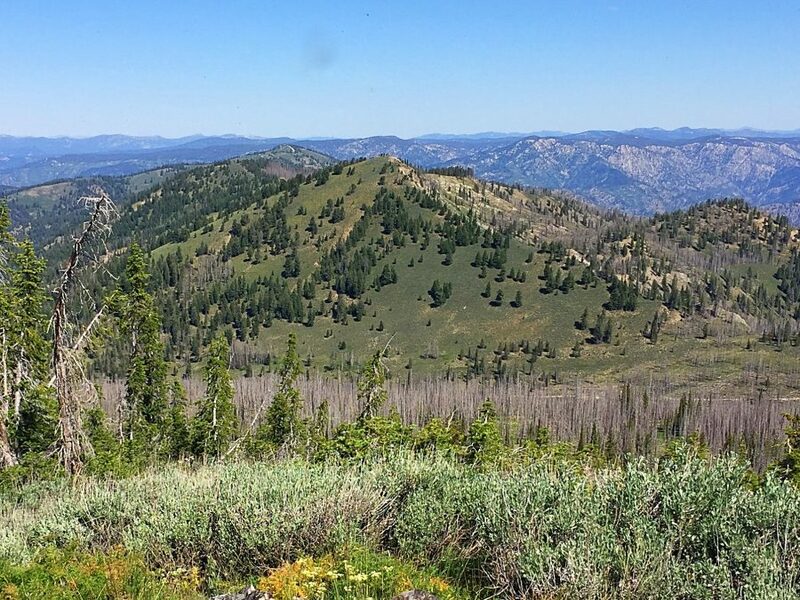 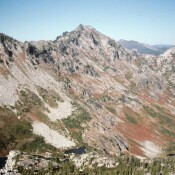 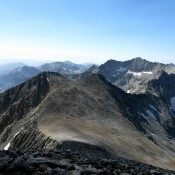 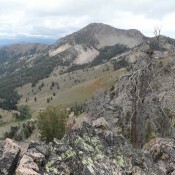 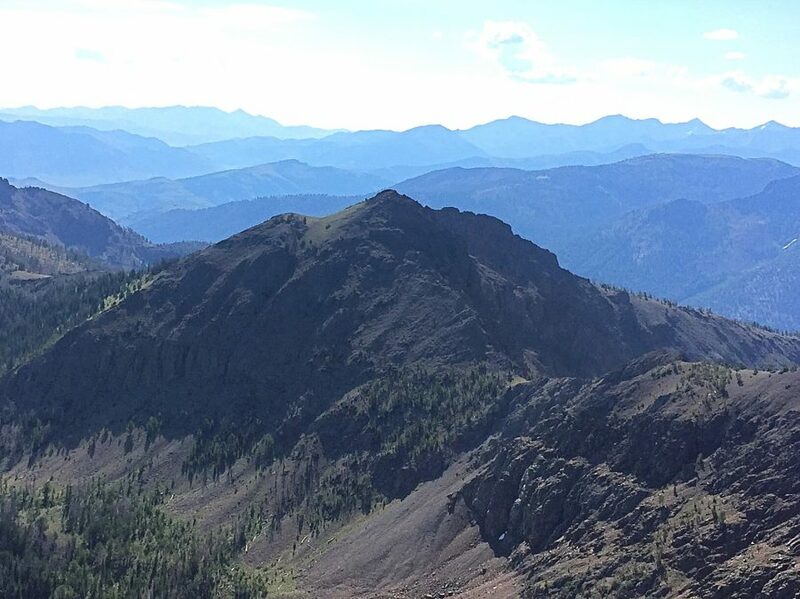 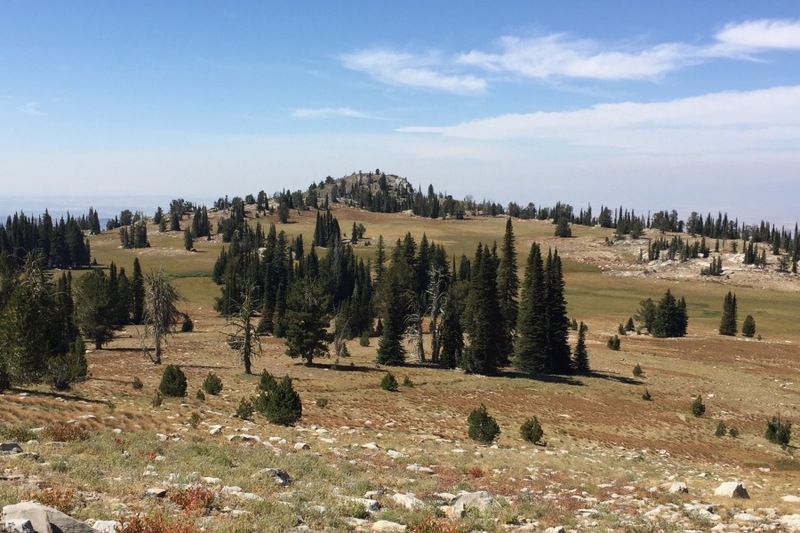 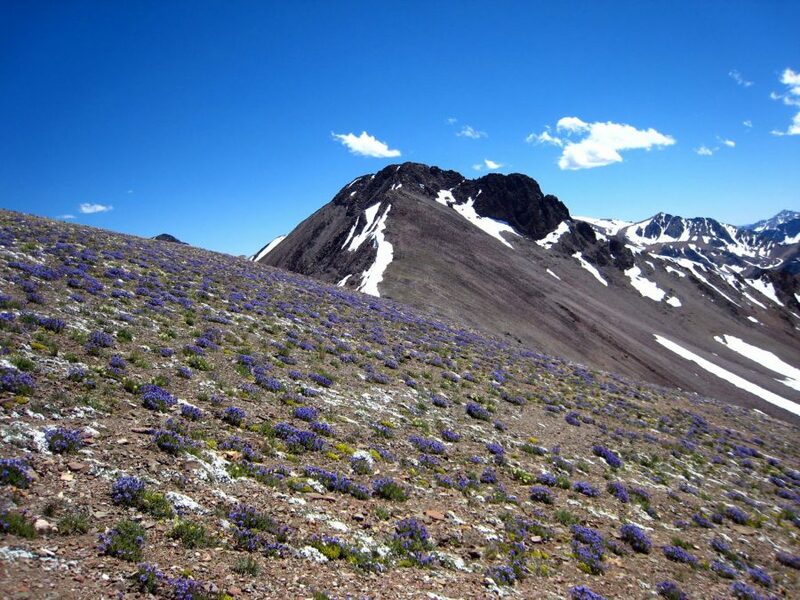 Gunsight Peak Boise Mountains 9,527 ft 627 Climbing and access information for this peak is found on page 151. 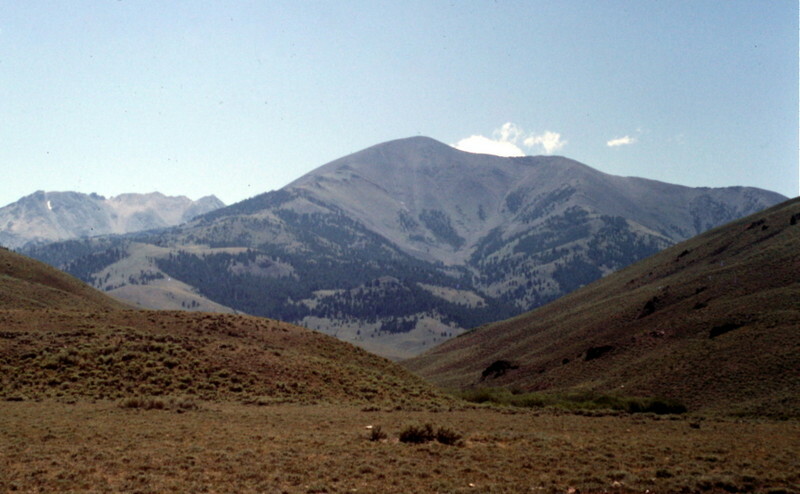 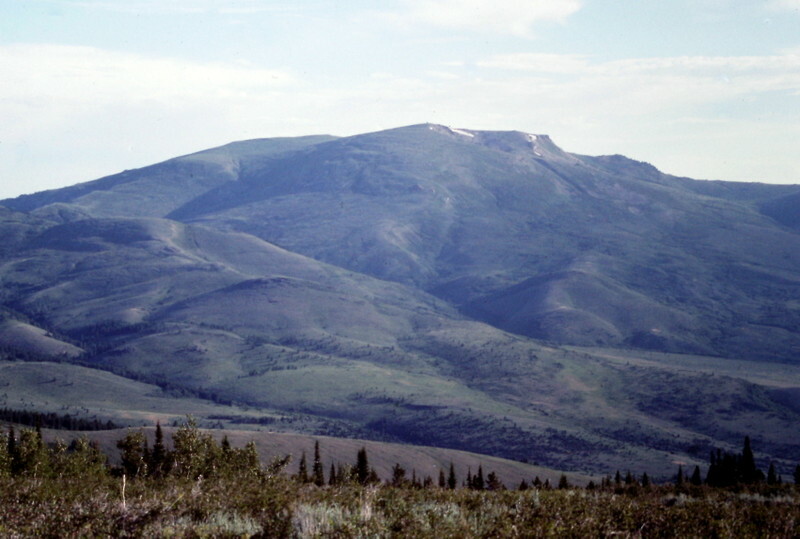 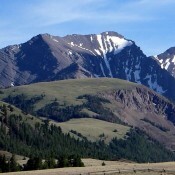 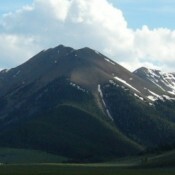 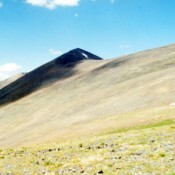 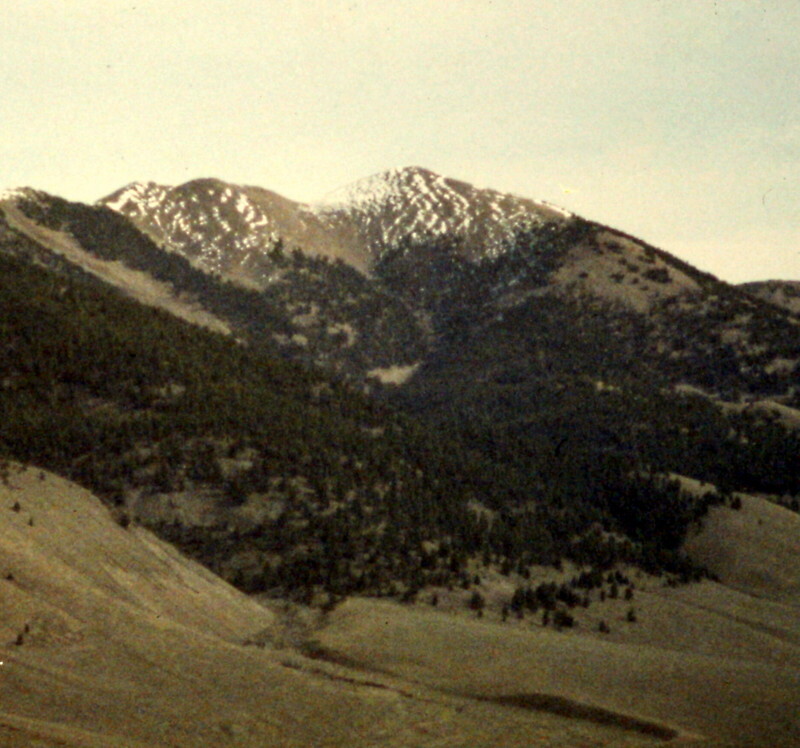 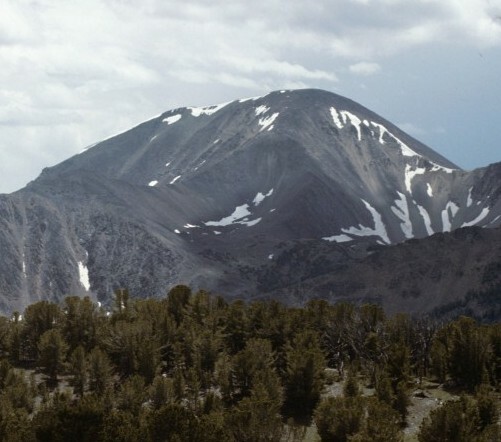 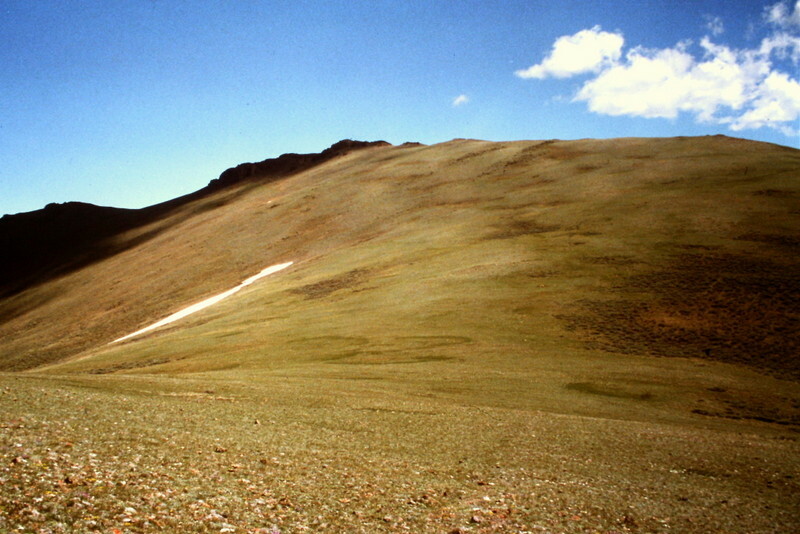 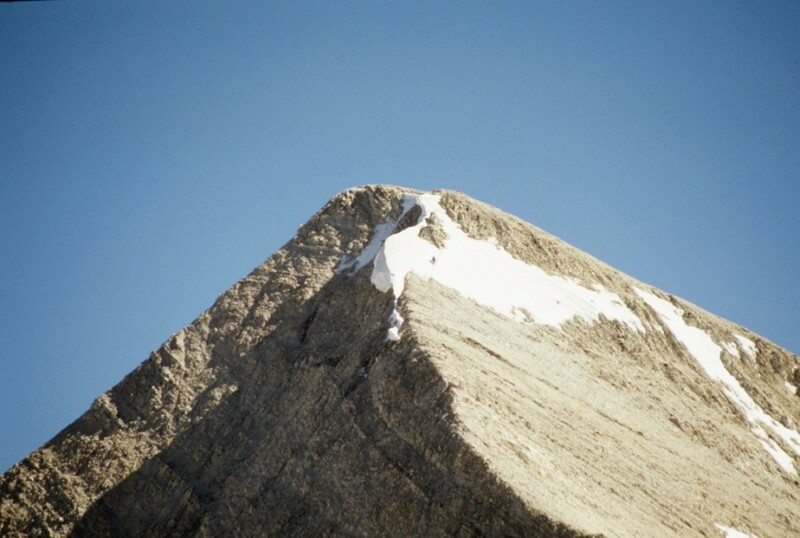 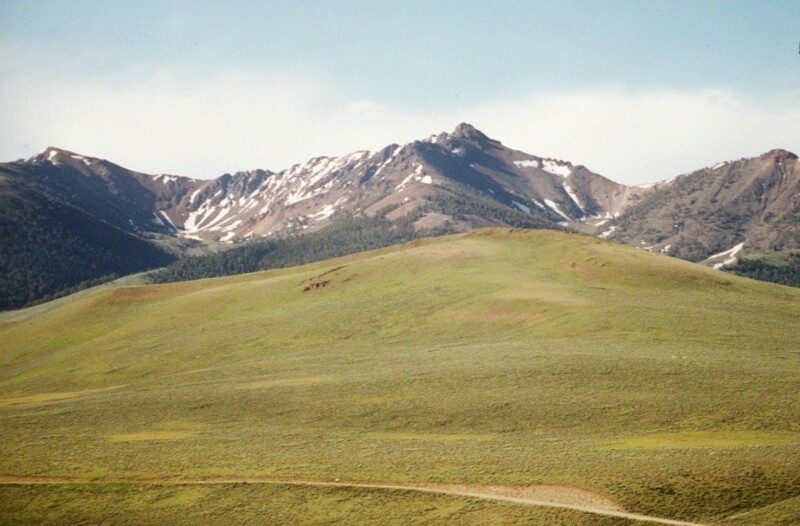 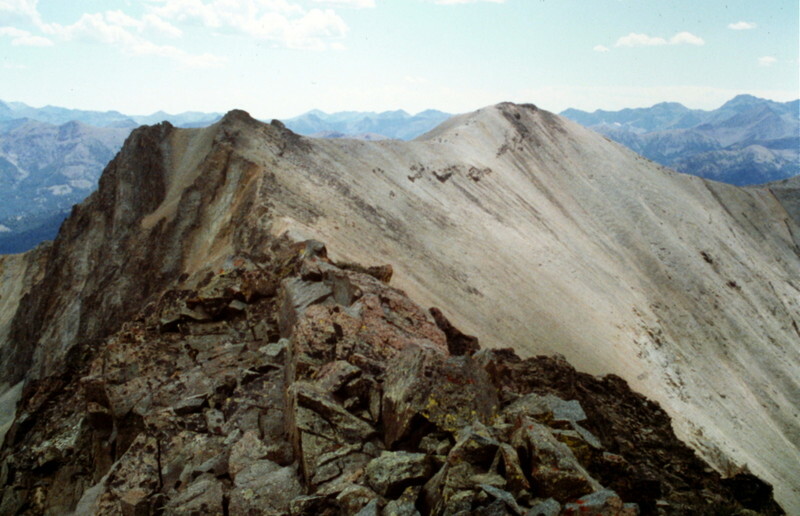 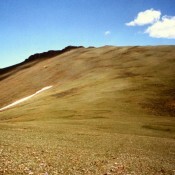 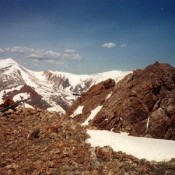 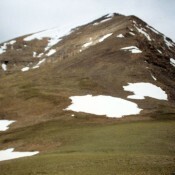 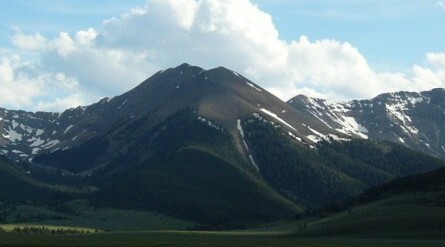 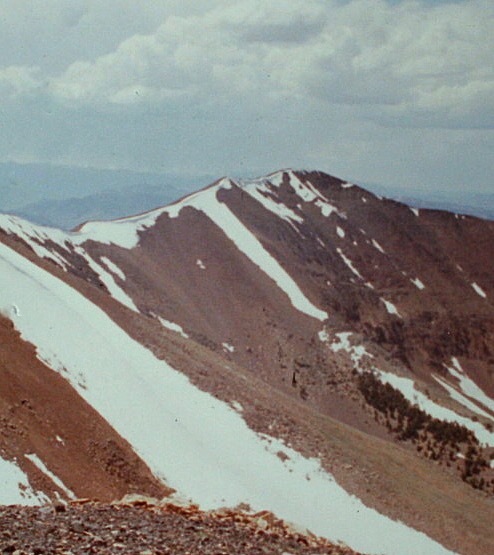 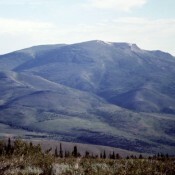 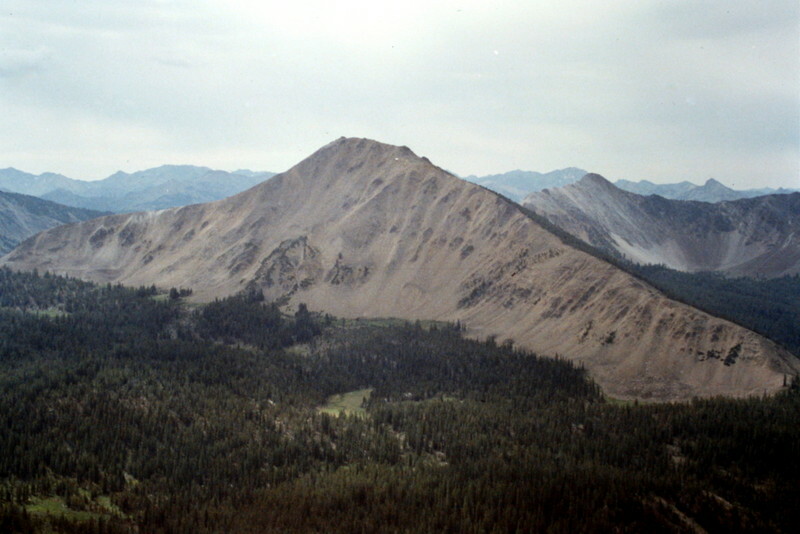 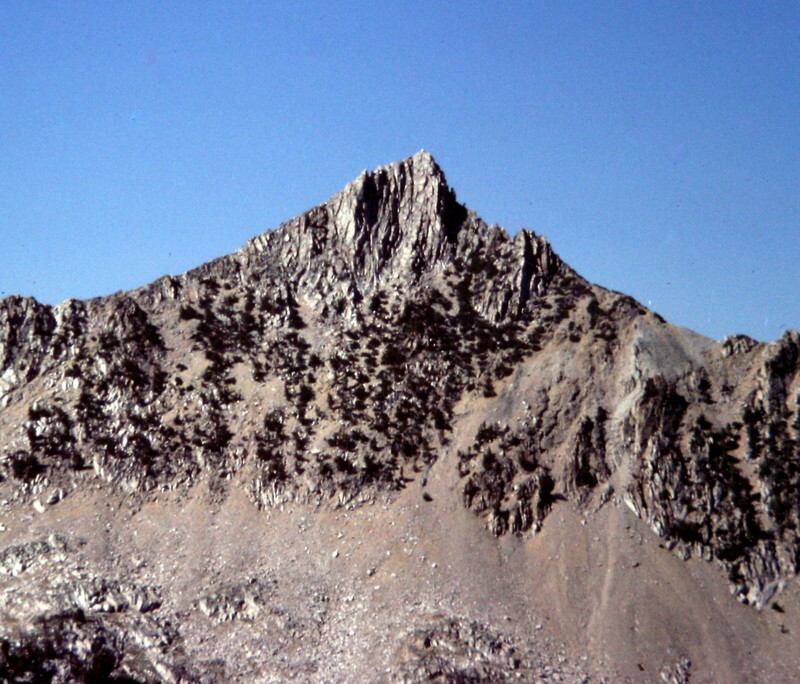 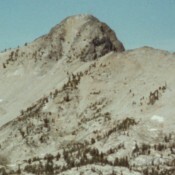 Henry Peak Peale Mountains 8,319 ft This peak is found on page 368. 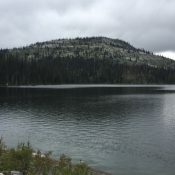 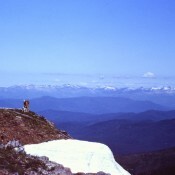 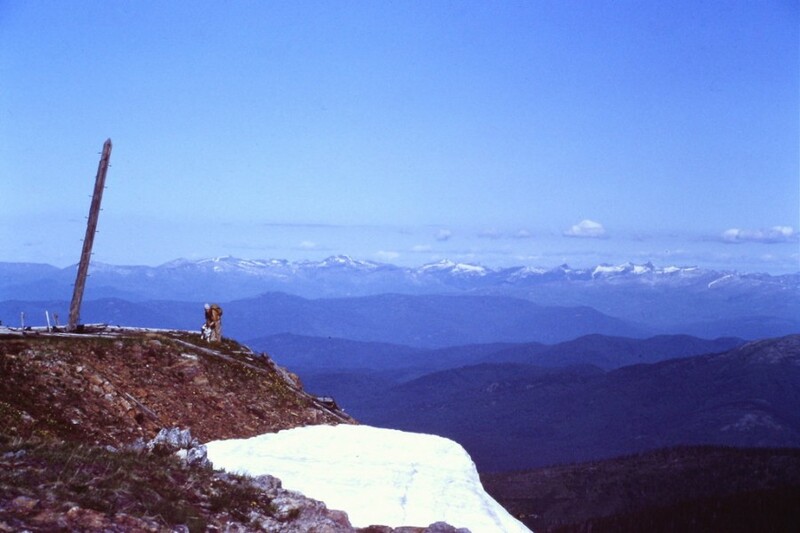 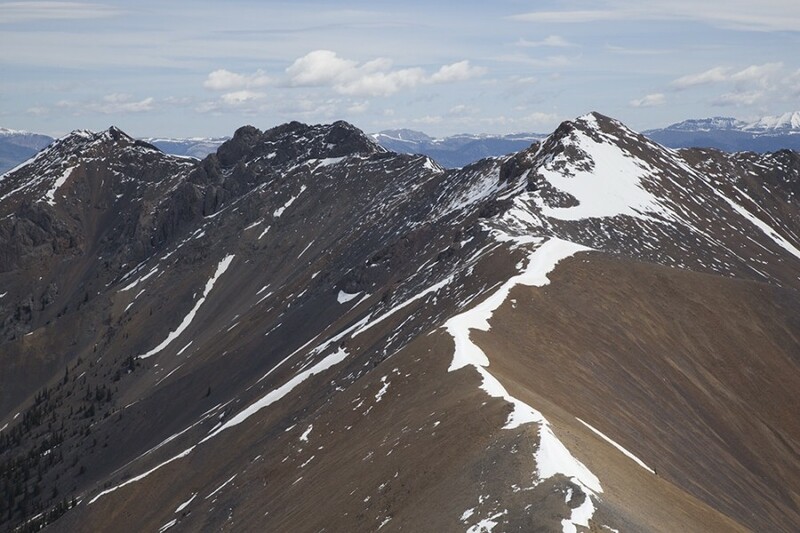 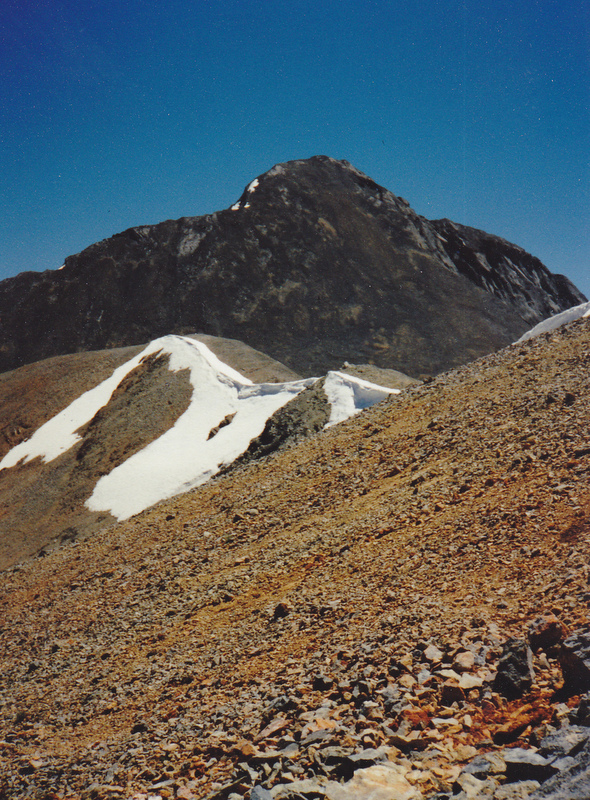 Lakeview Mountain Selkirk Mountains 4,074 ft This peak is not found in the book. 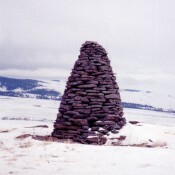 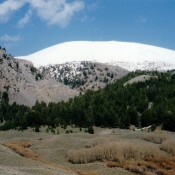 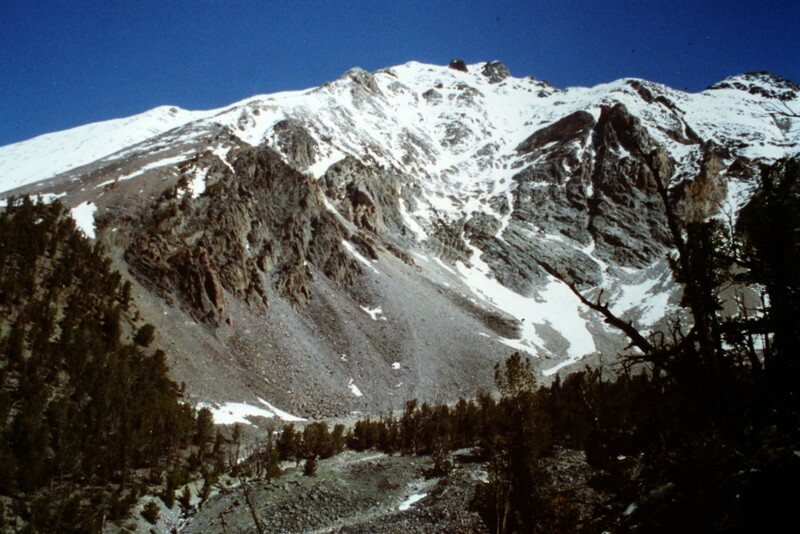 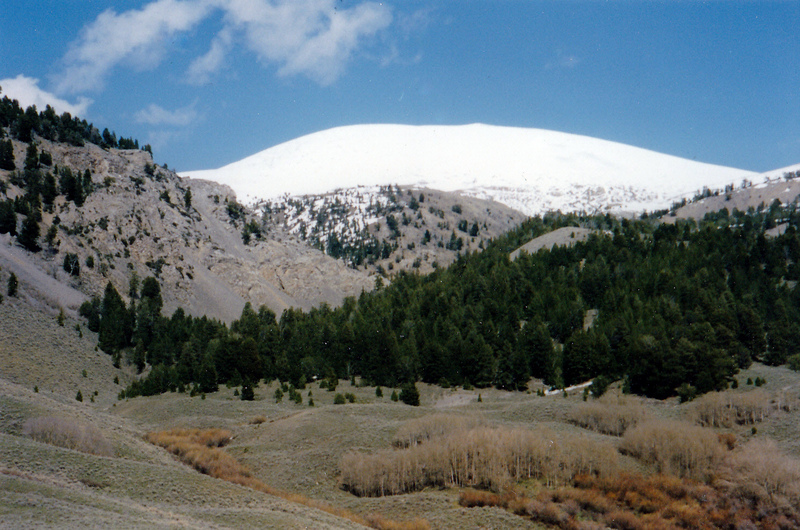 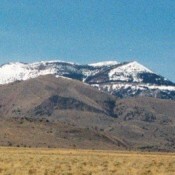 Lava Mountain Boise Mountains 8,703 ft 443 2004 Climbing and access information for this Lava Mountain is found on page 149. 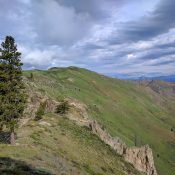 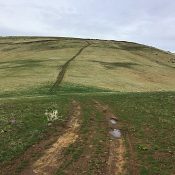 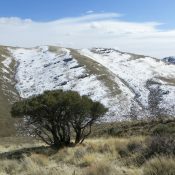 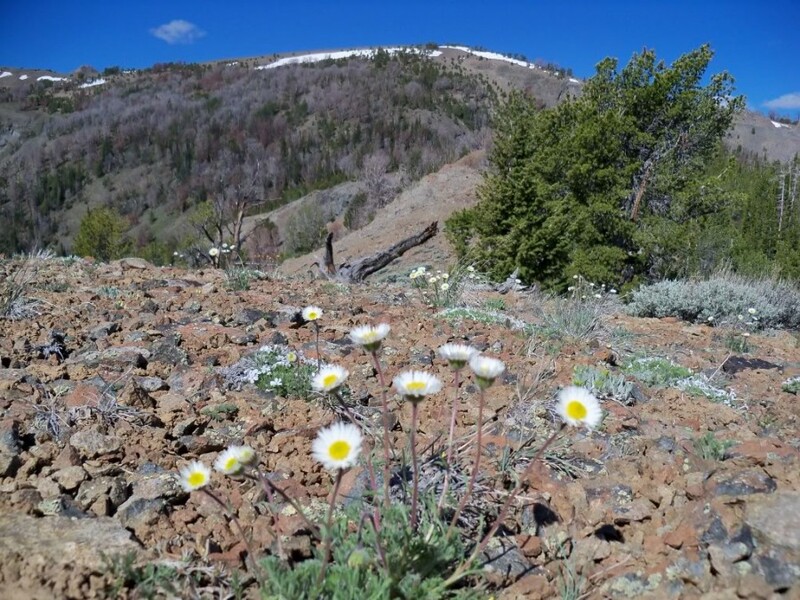 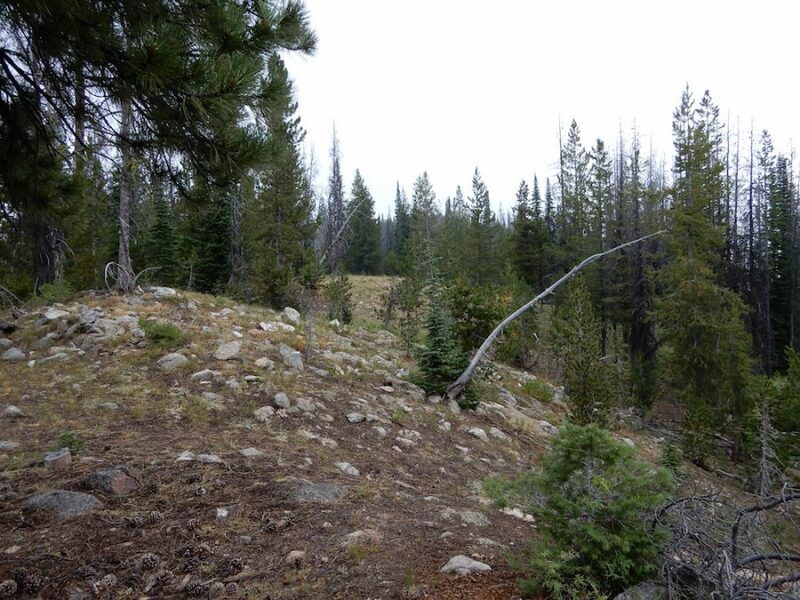 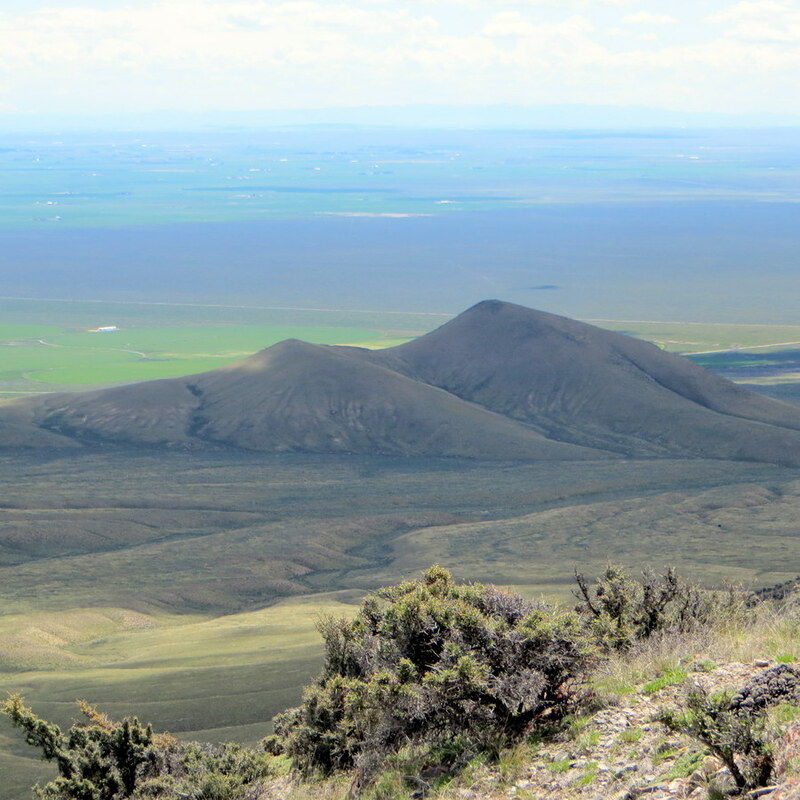 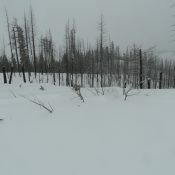 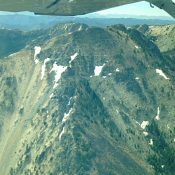 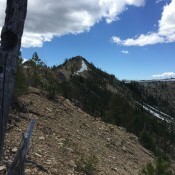 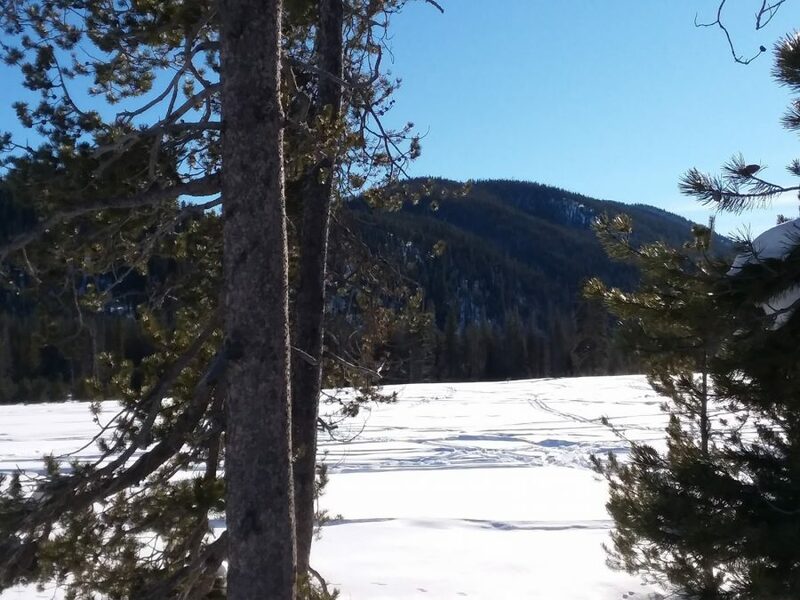 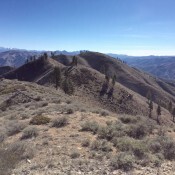 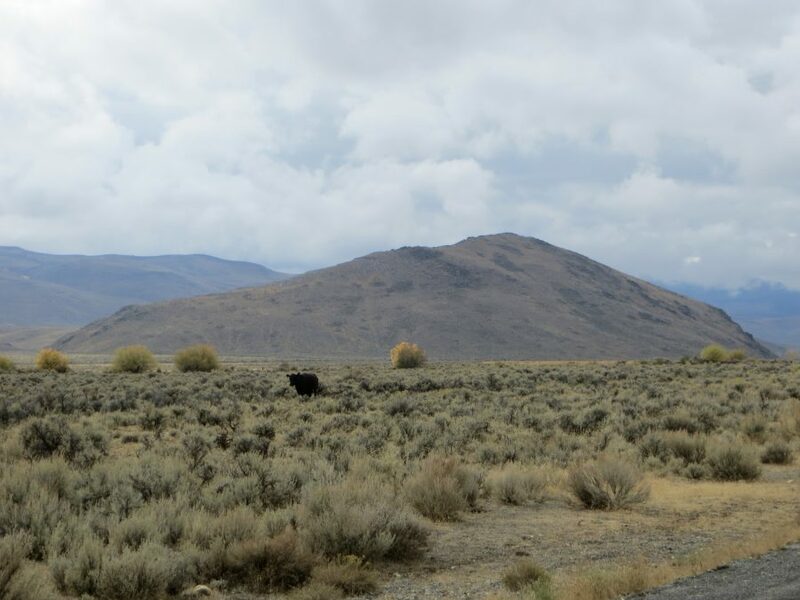 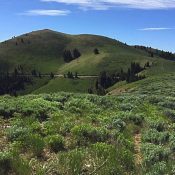 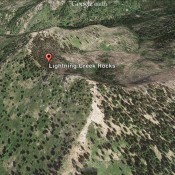 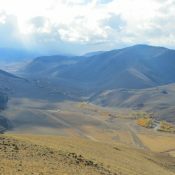 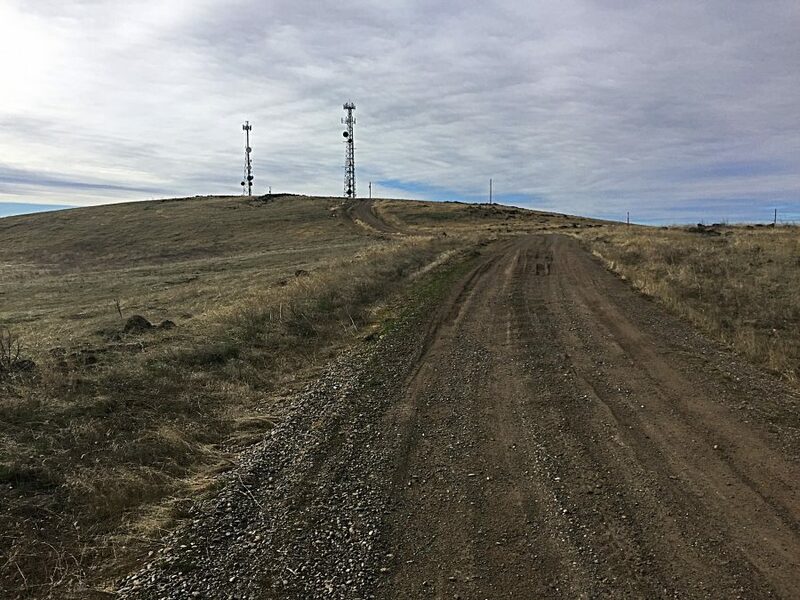 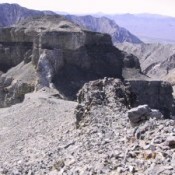 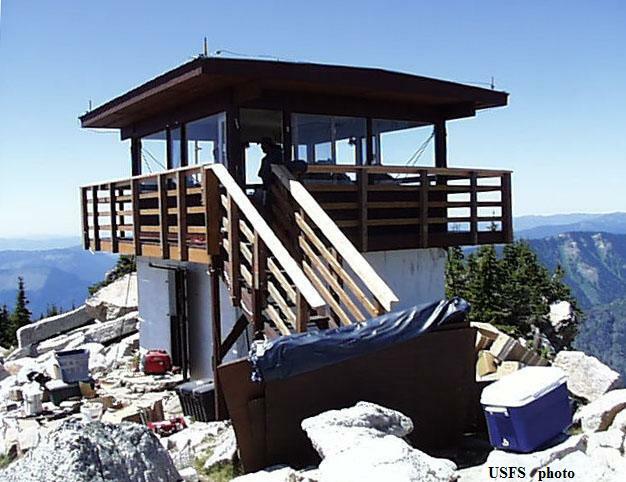 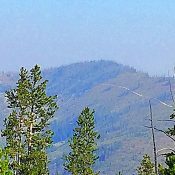 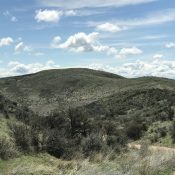 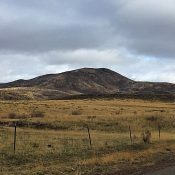 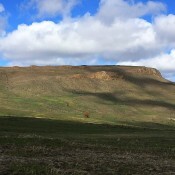 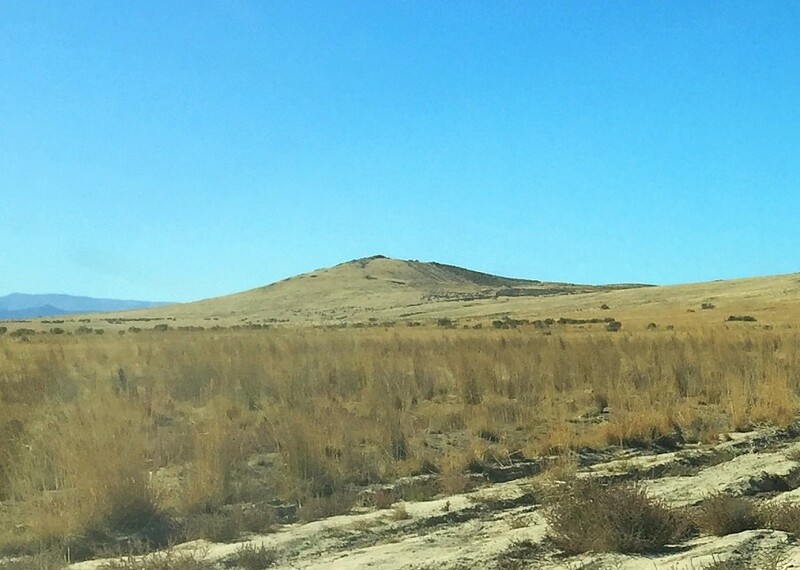 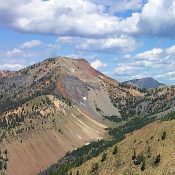 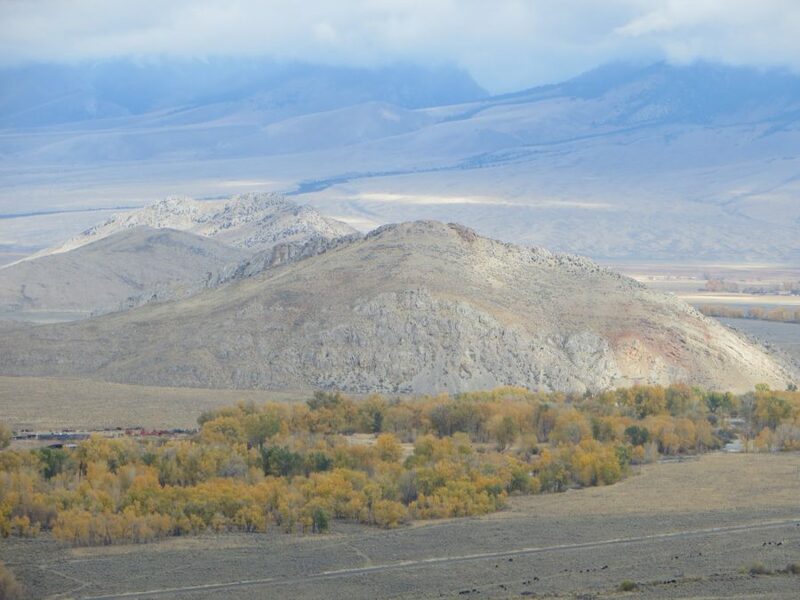 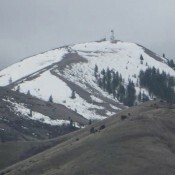 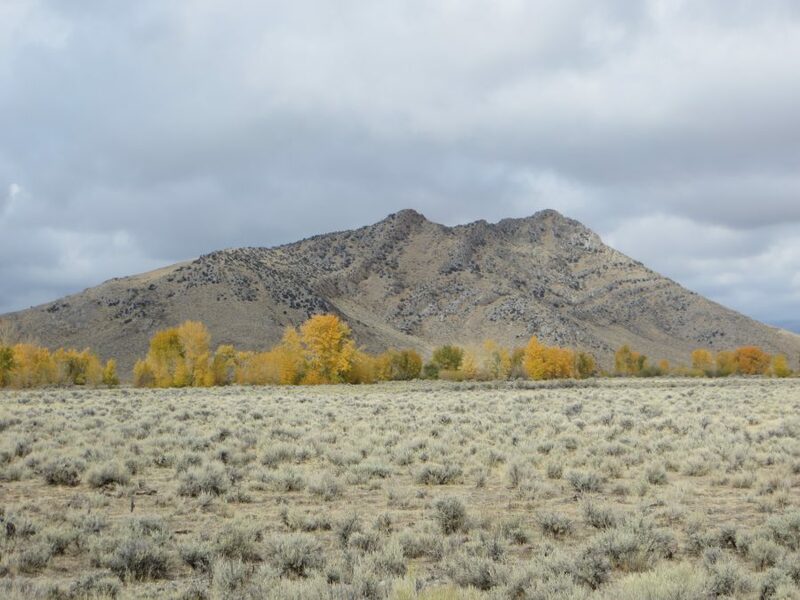 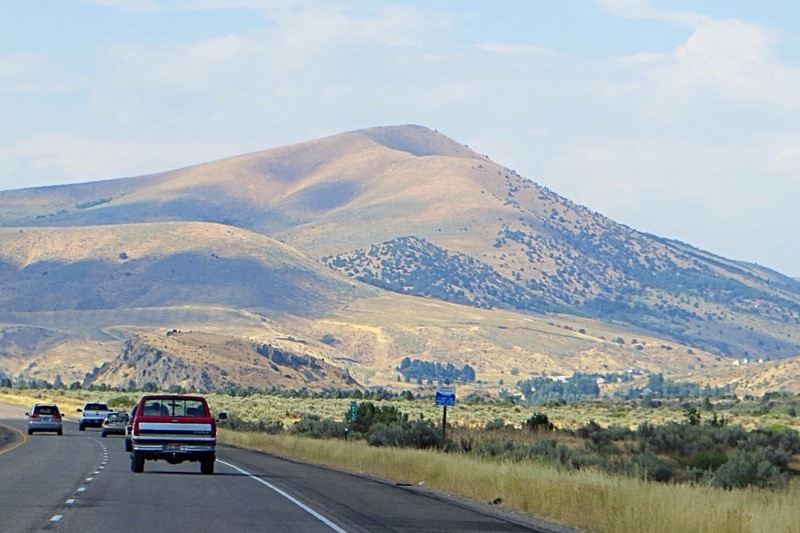 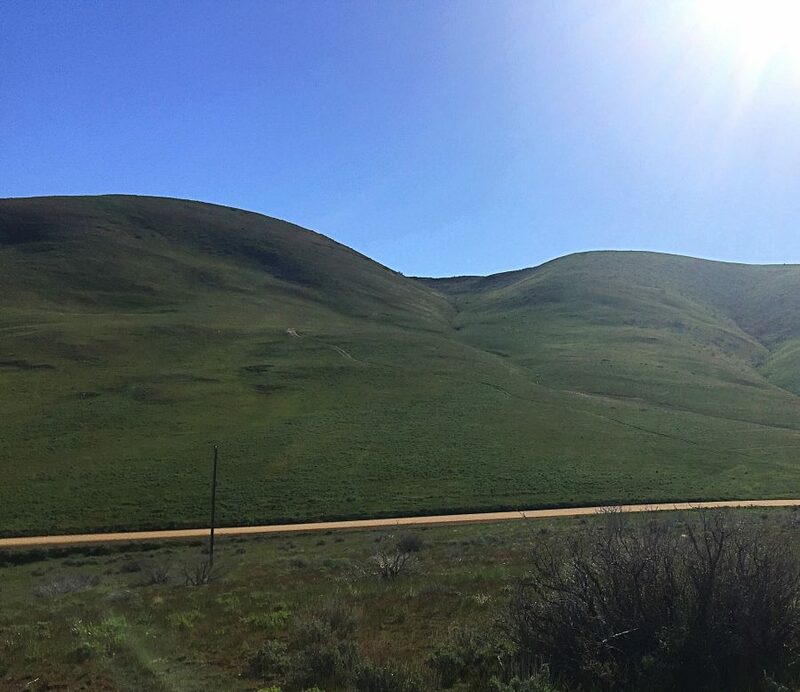 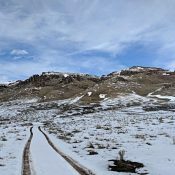 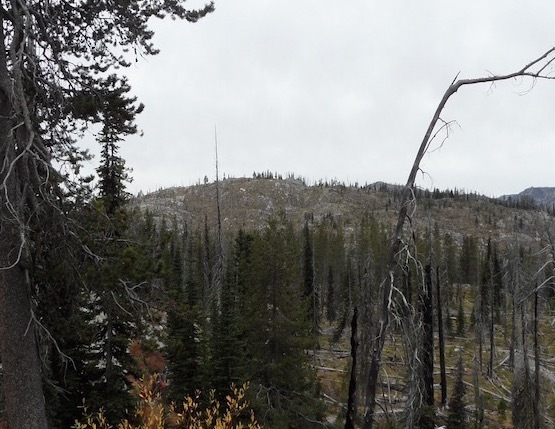 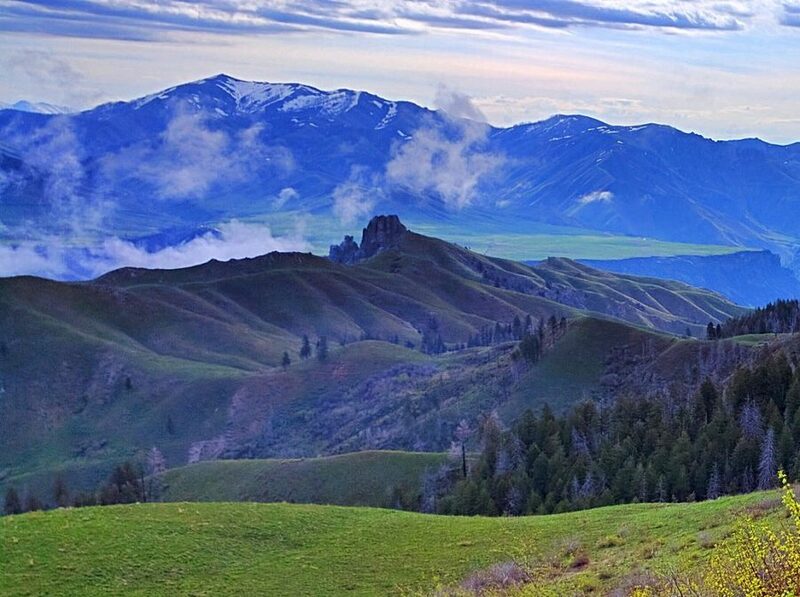 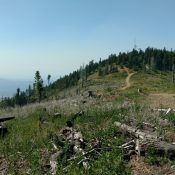 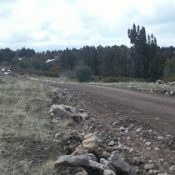 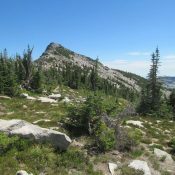 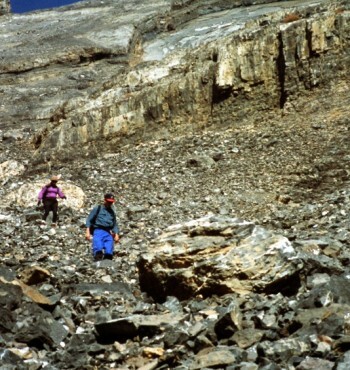 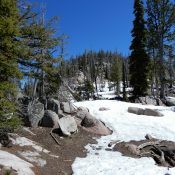 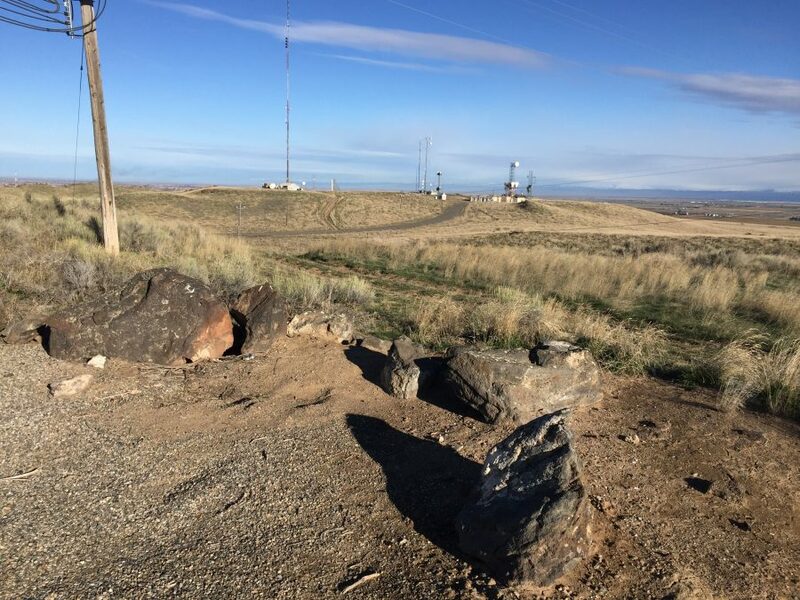 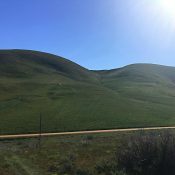 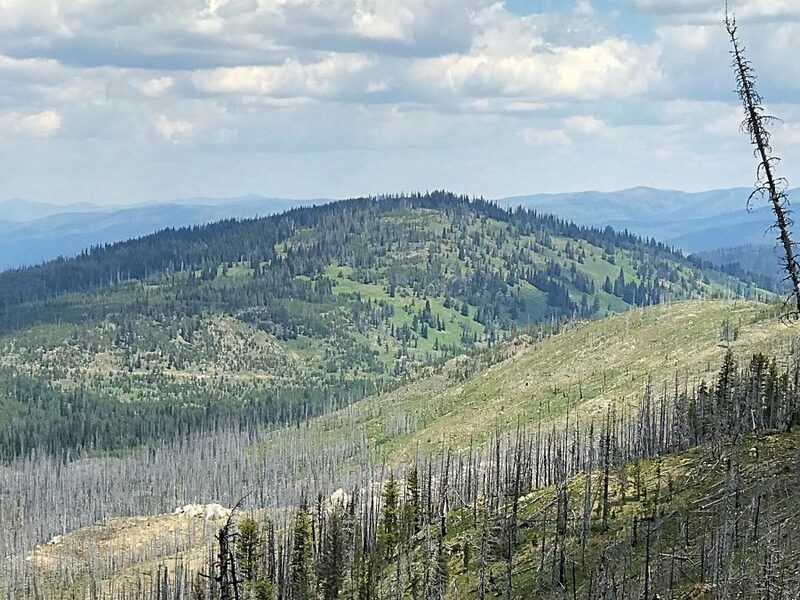 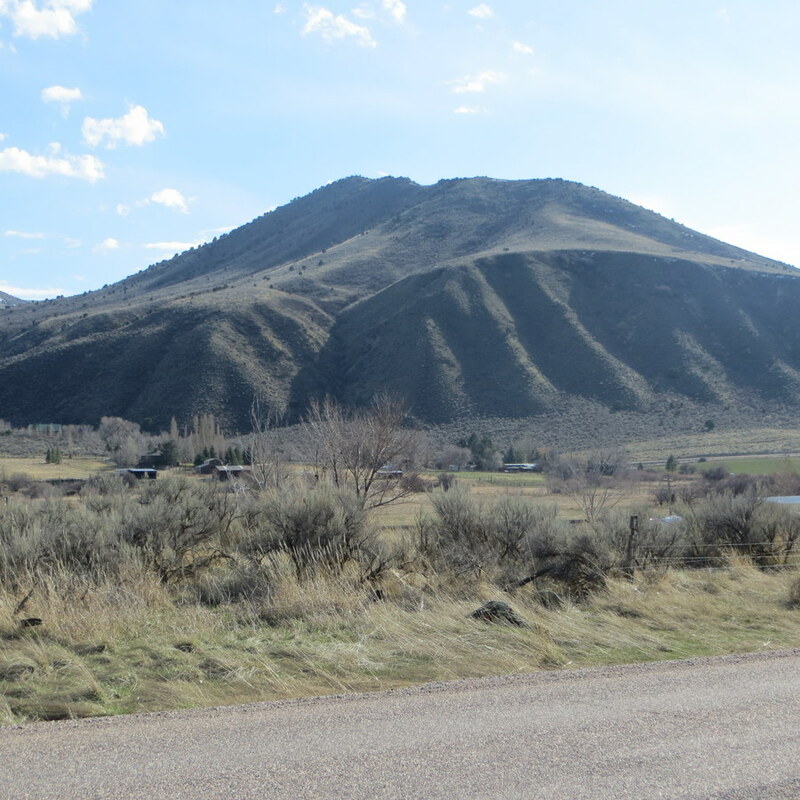 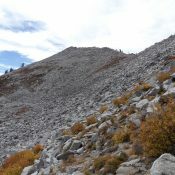 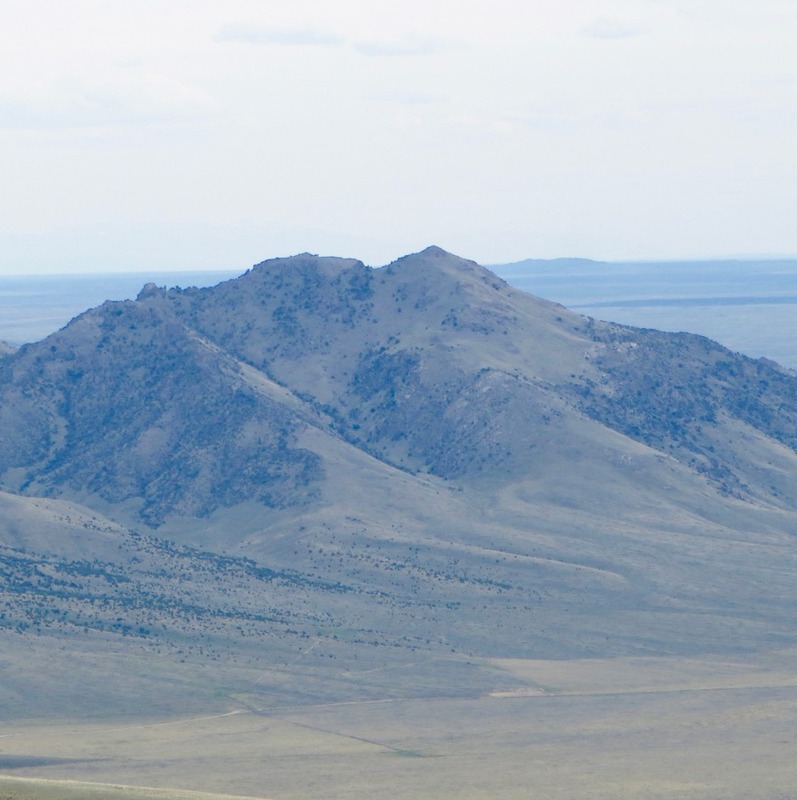 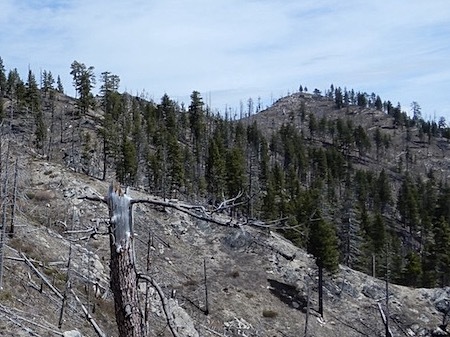 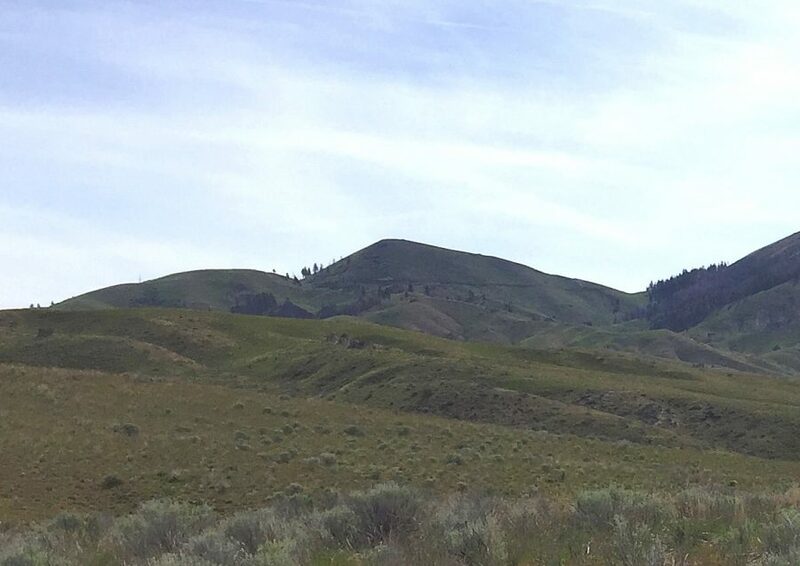 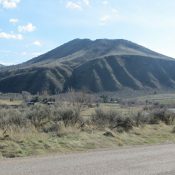 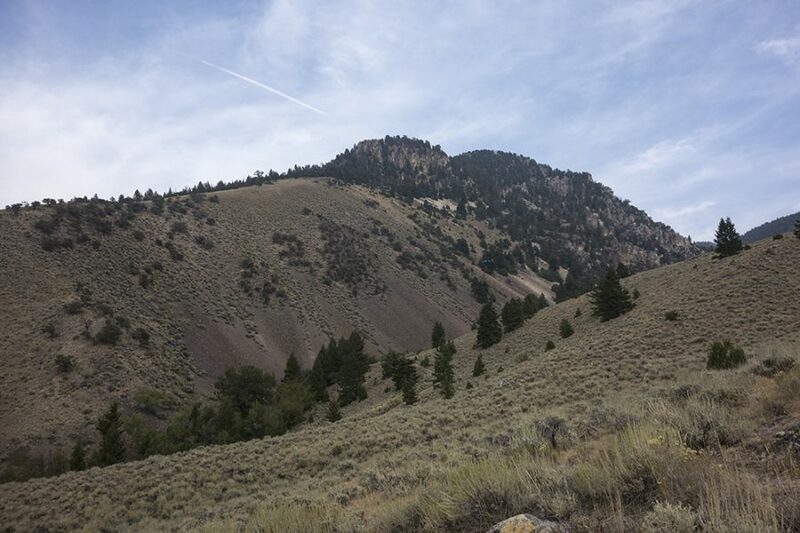 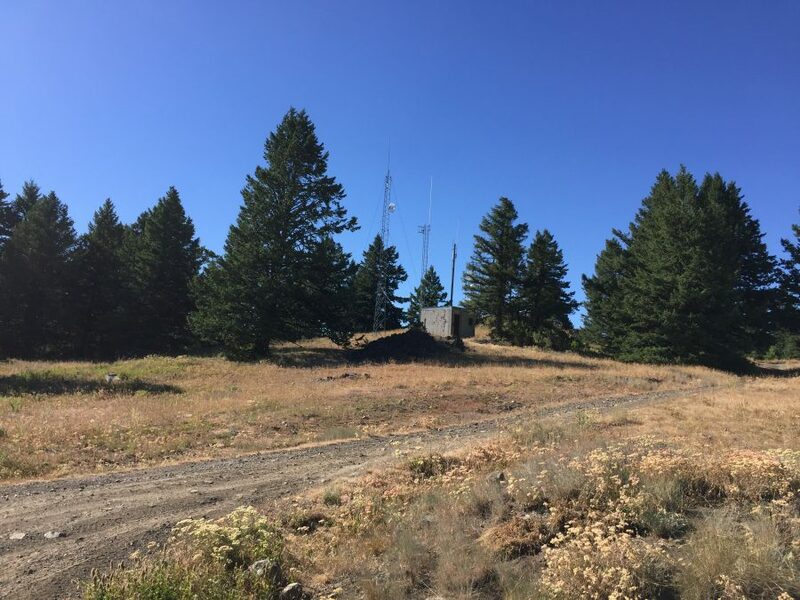 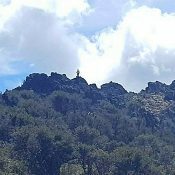 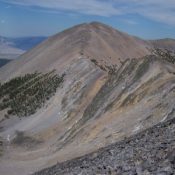 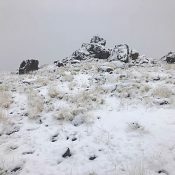 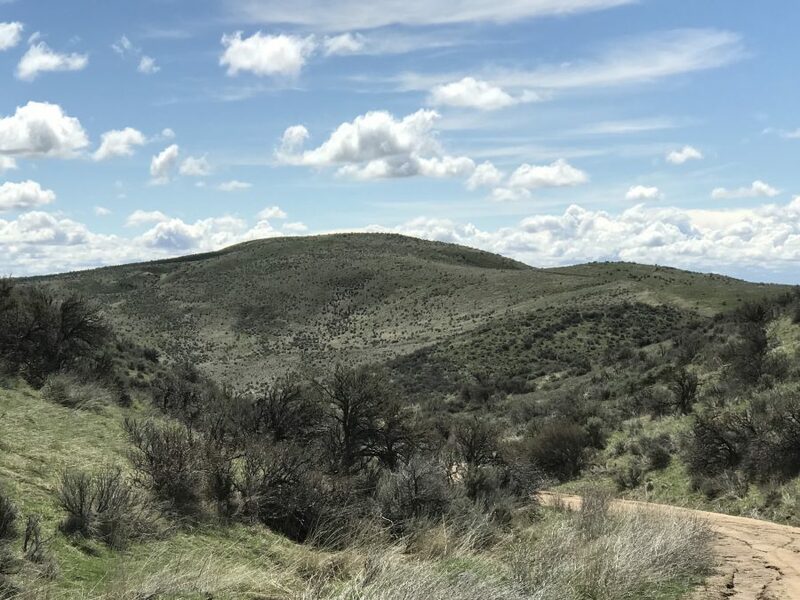 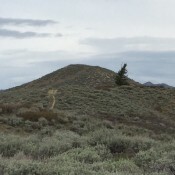 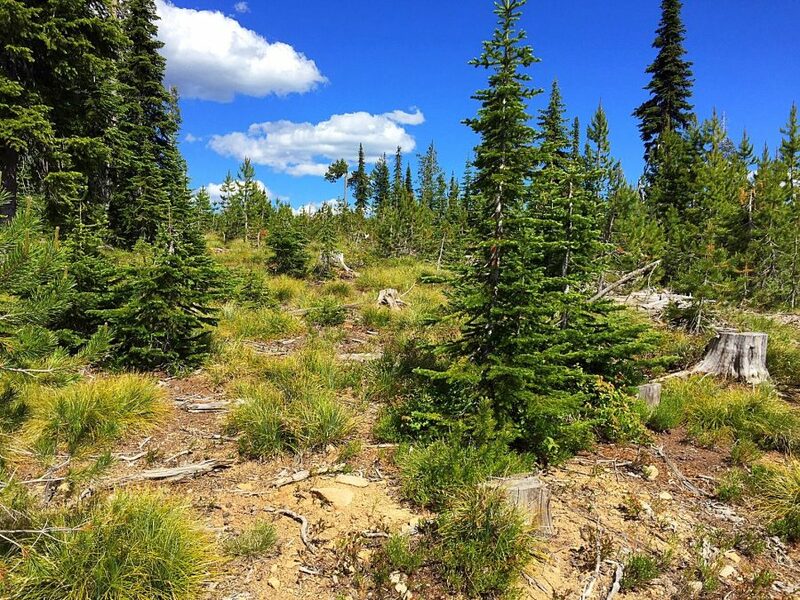 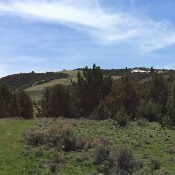 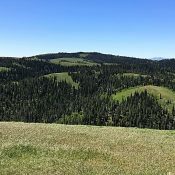 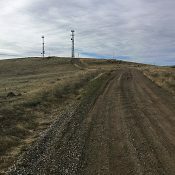 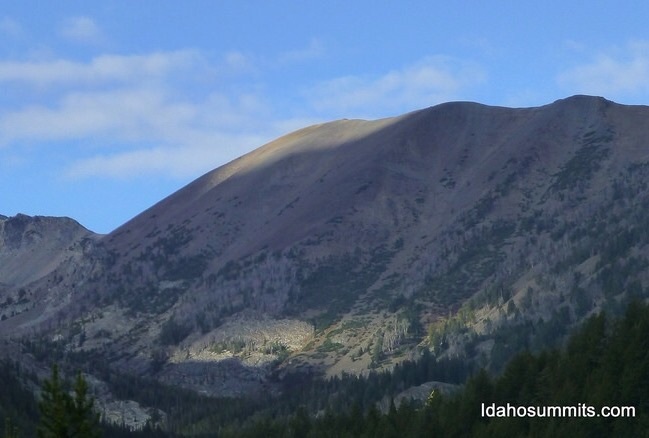 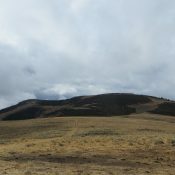 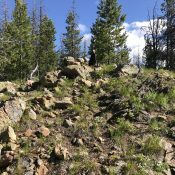 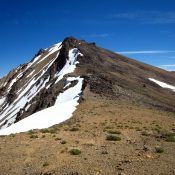 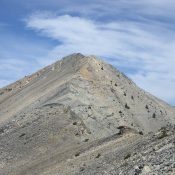 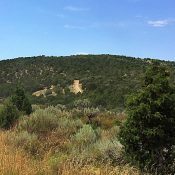 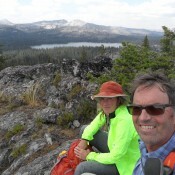 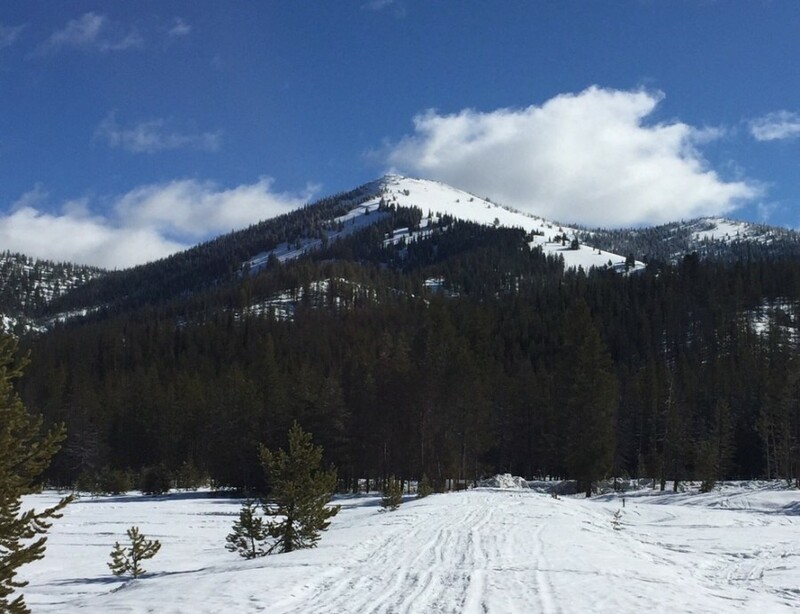 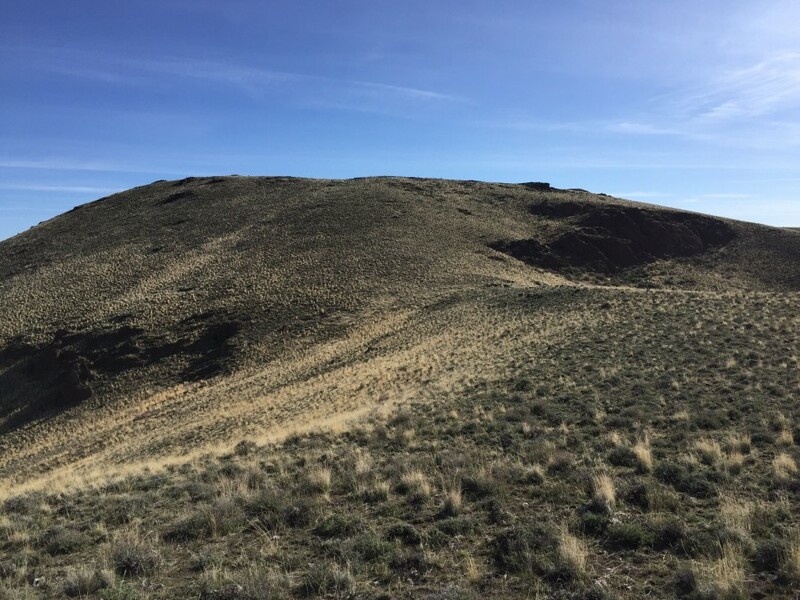 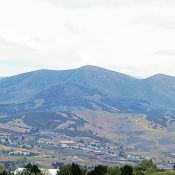 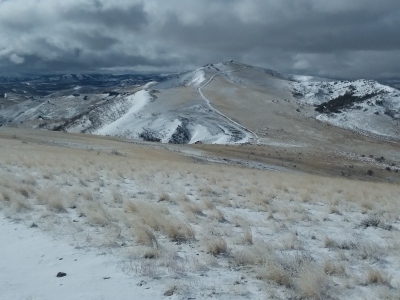 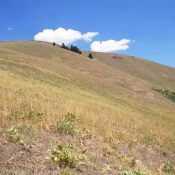 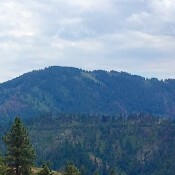 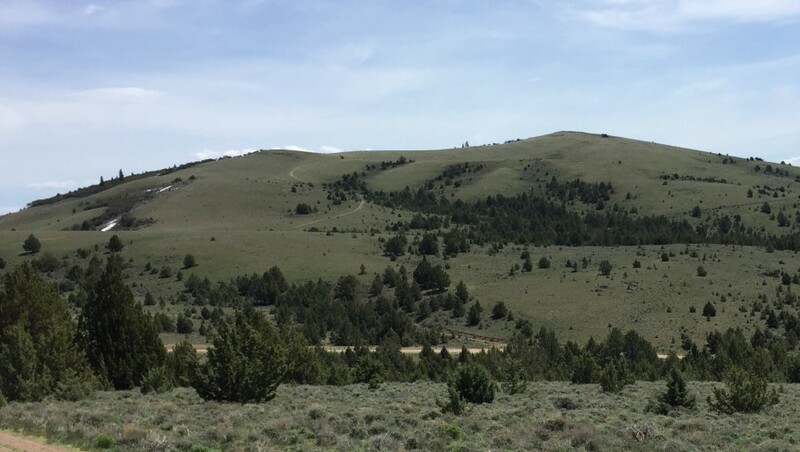 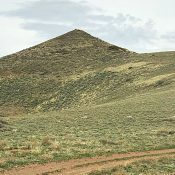 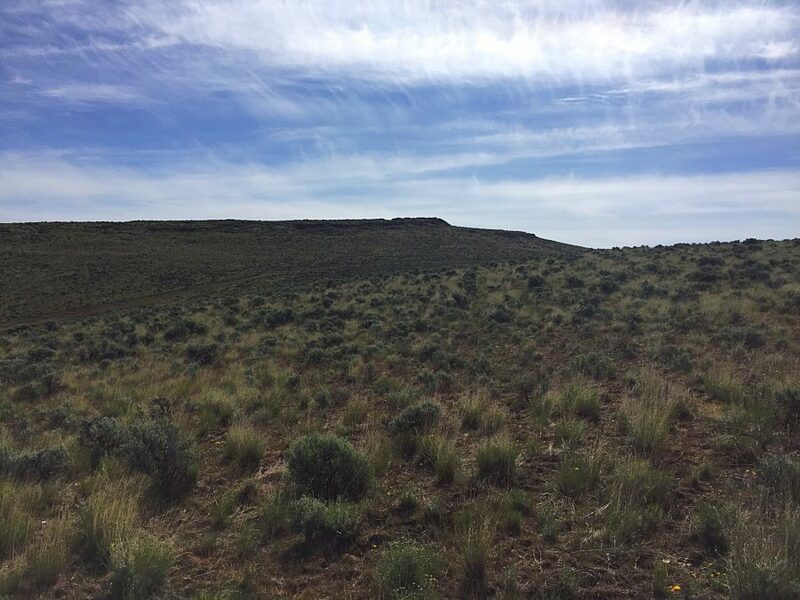 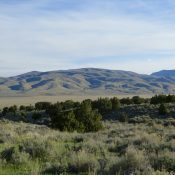 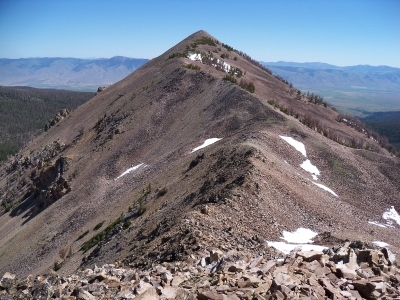 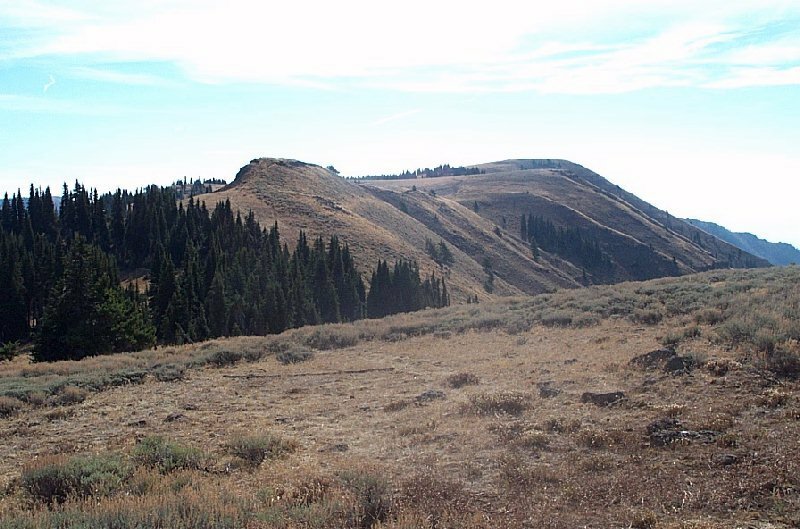 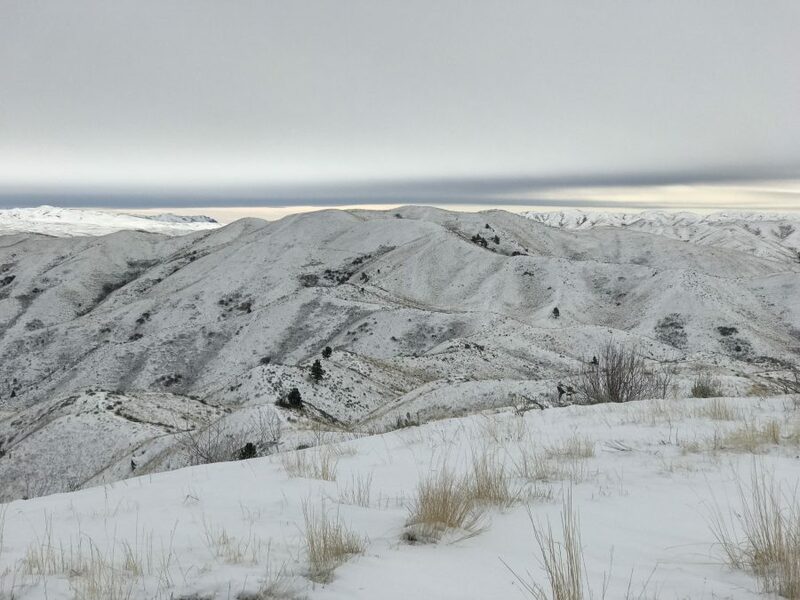 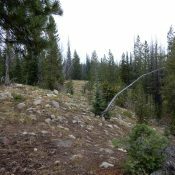 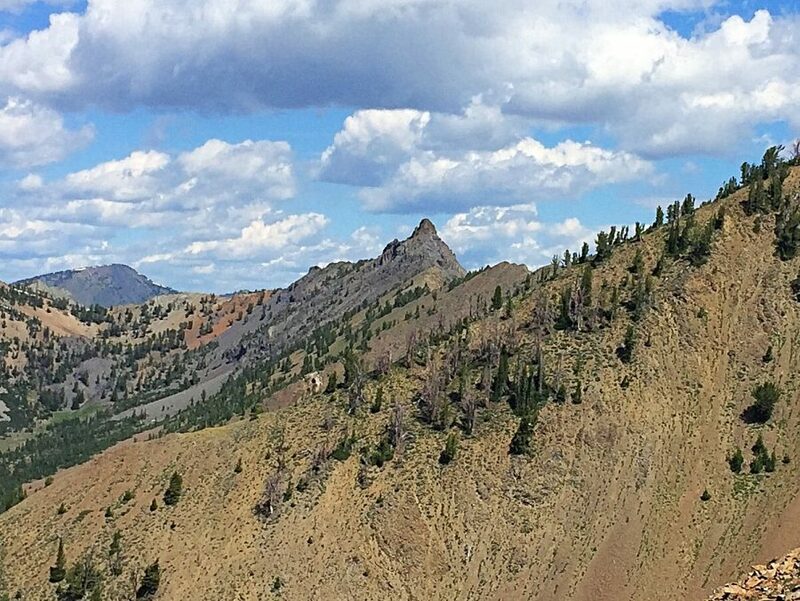 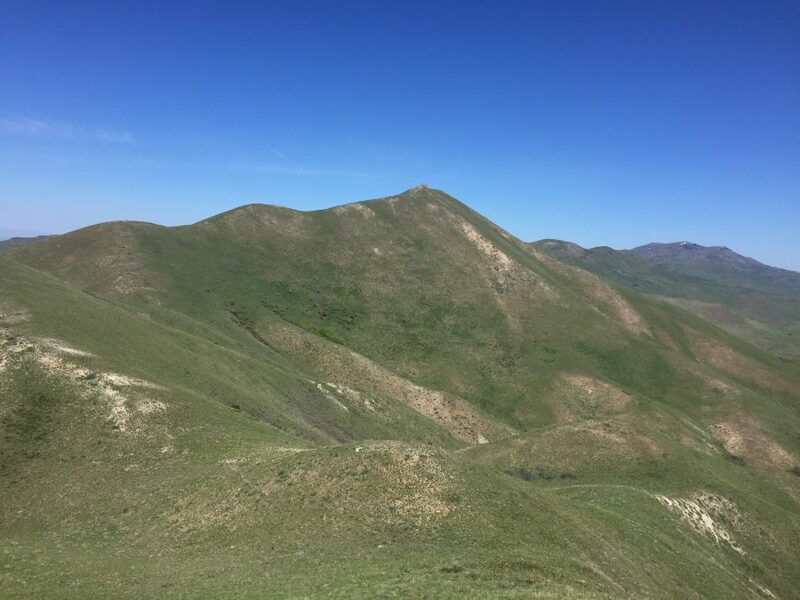 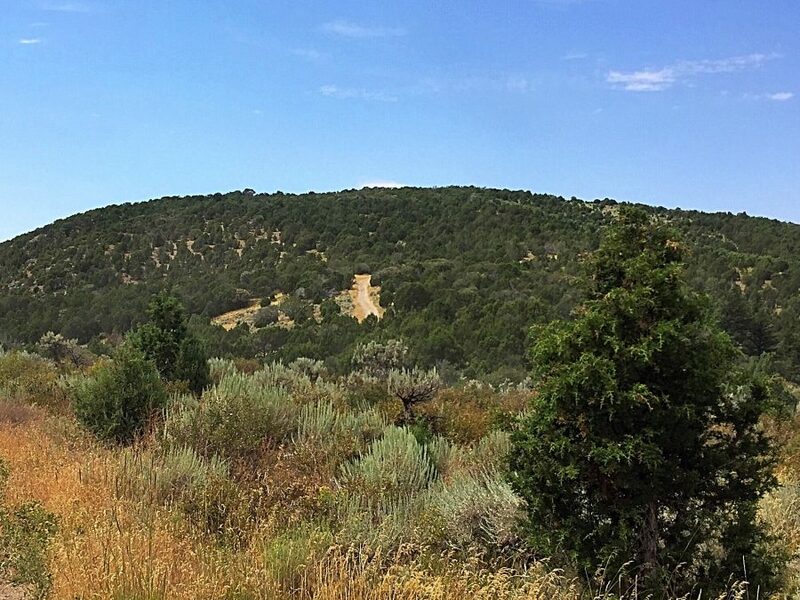 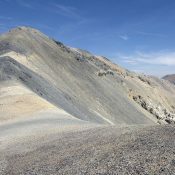 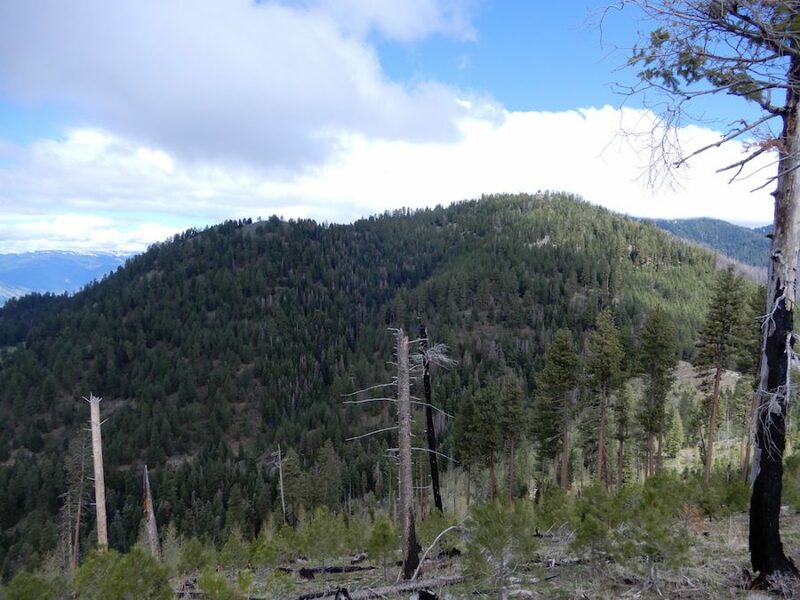 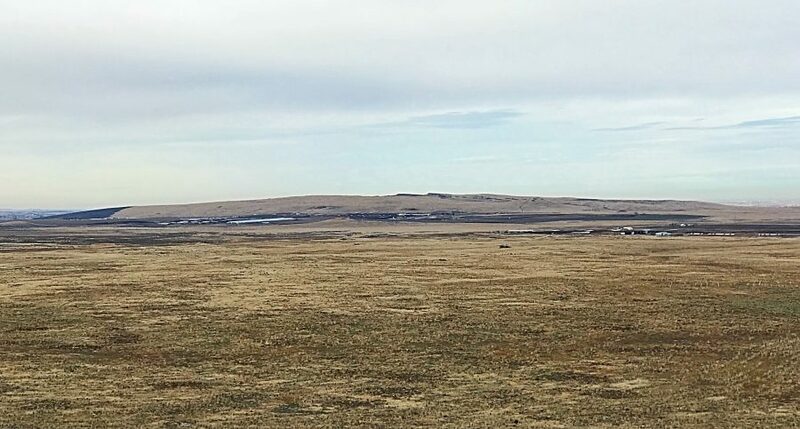 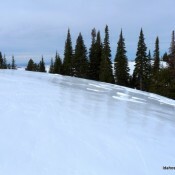 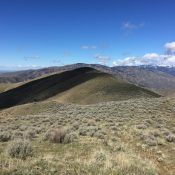 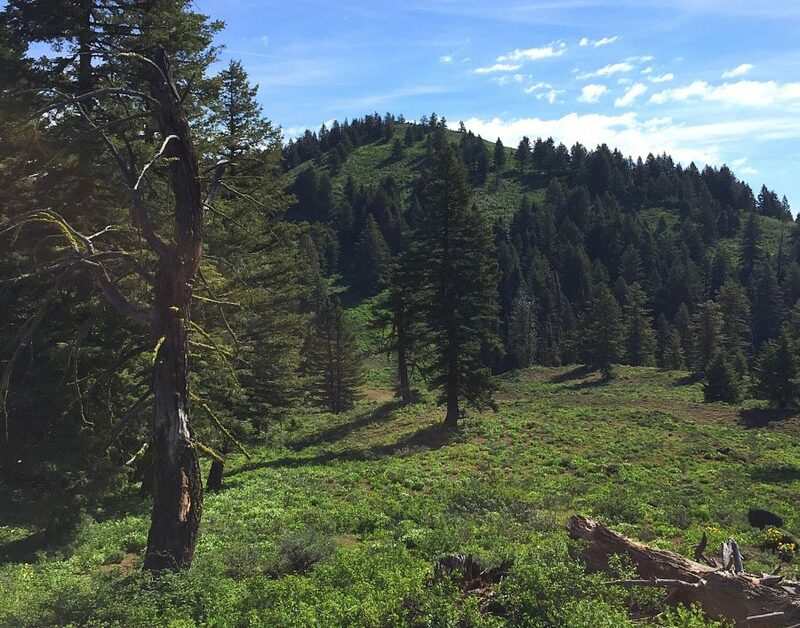 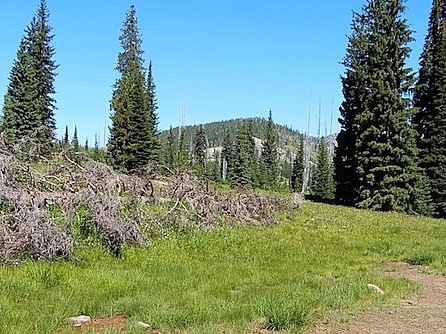 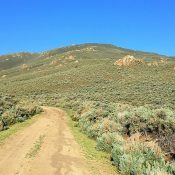 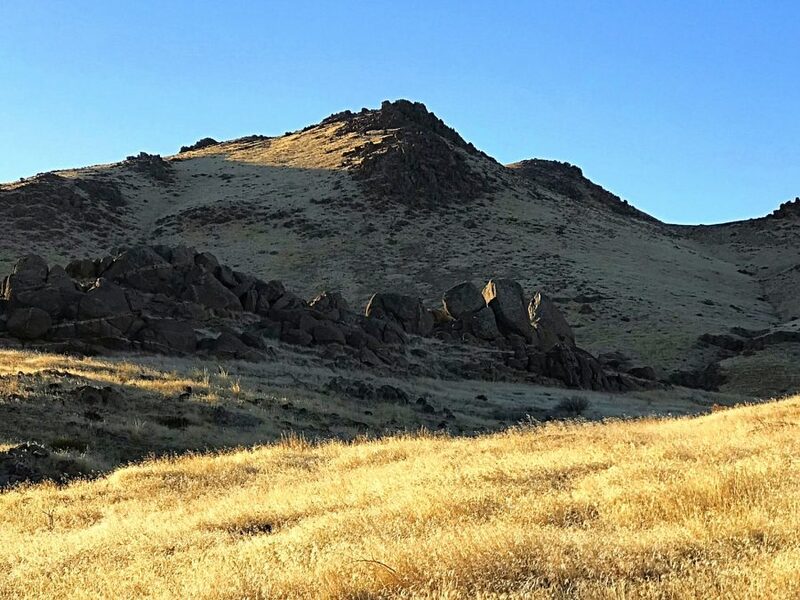 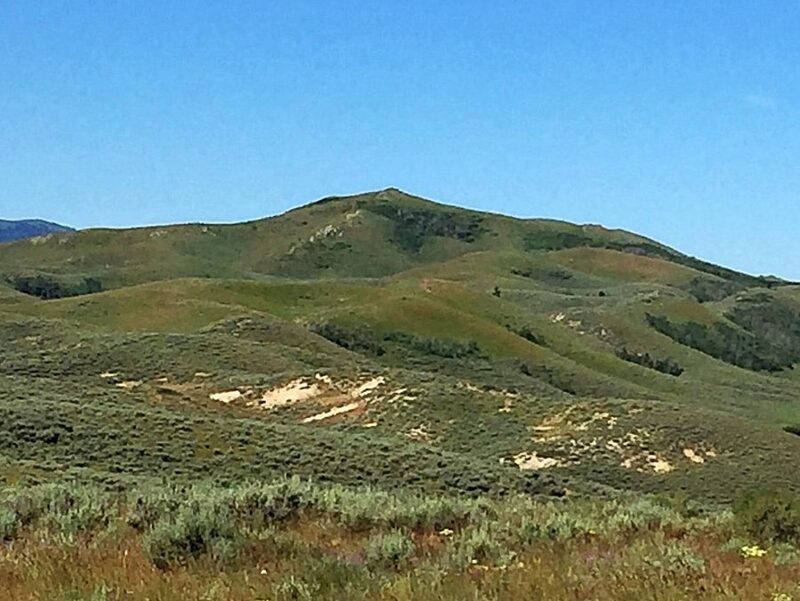 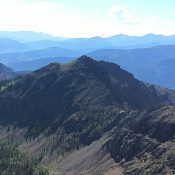 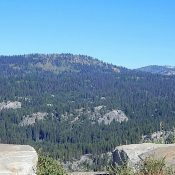 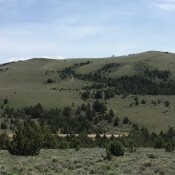 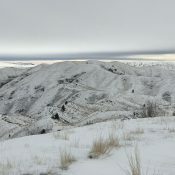 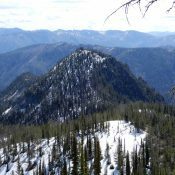 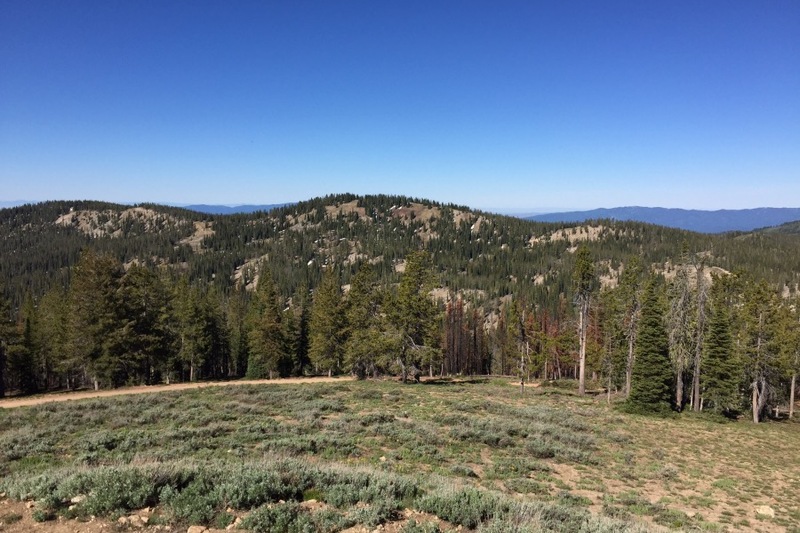 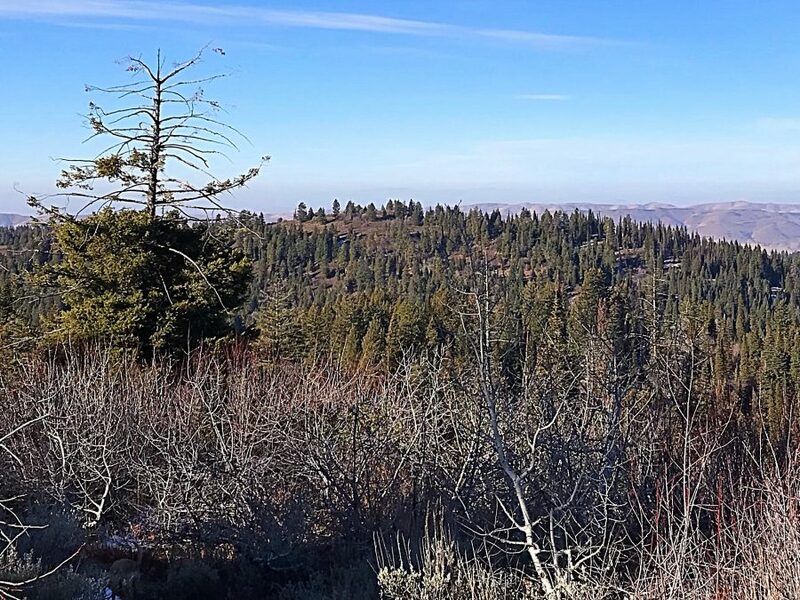 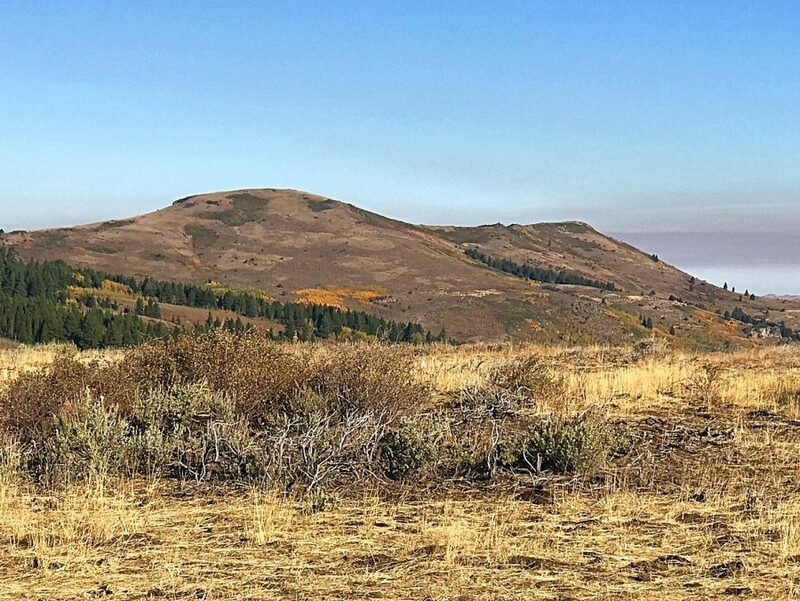 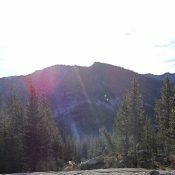 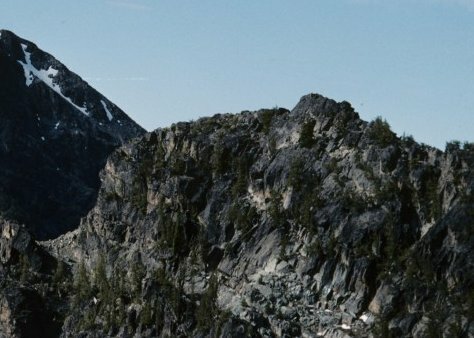 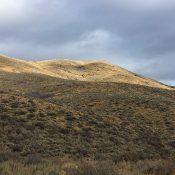 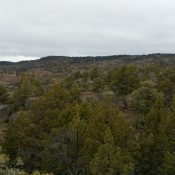 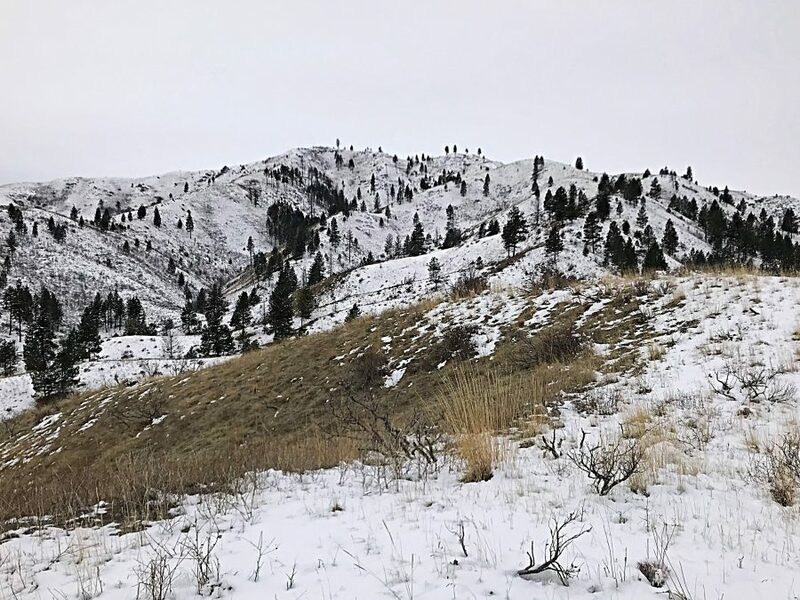 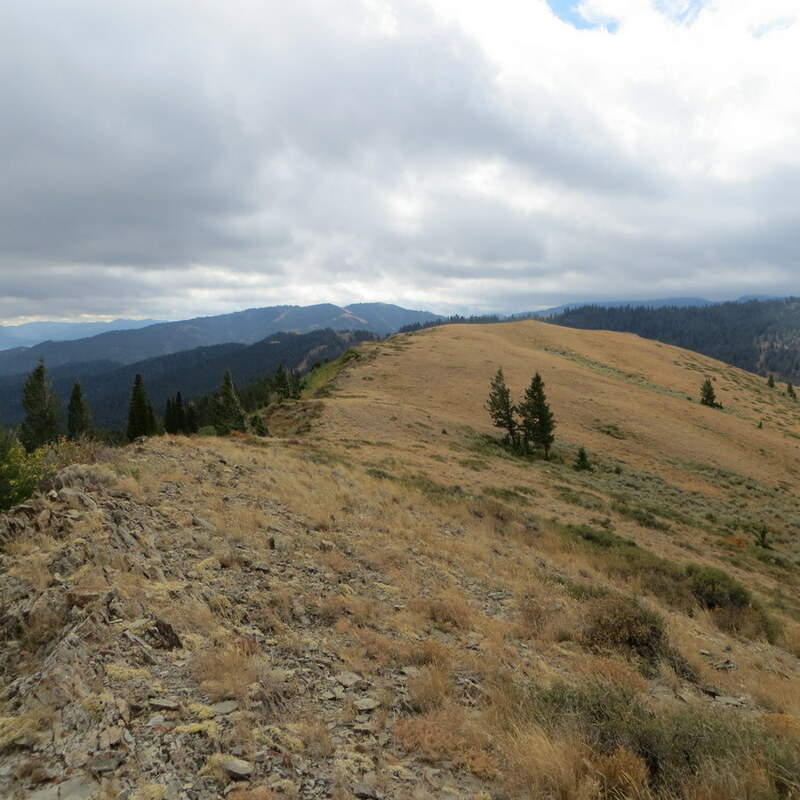 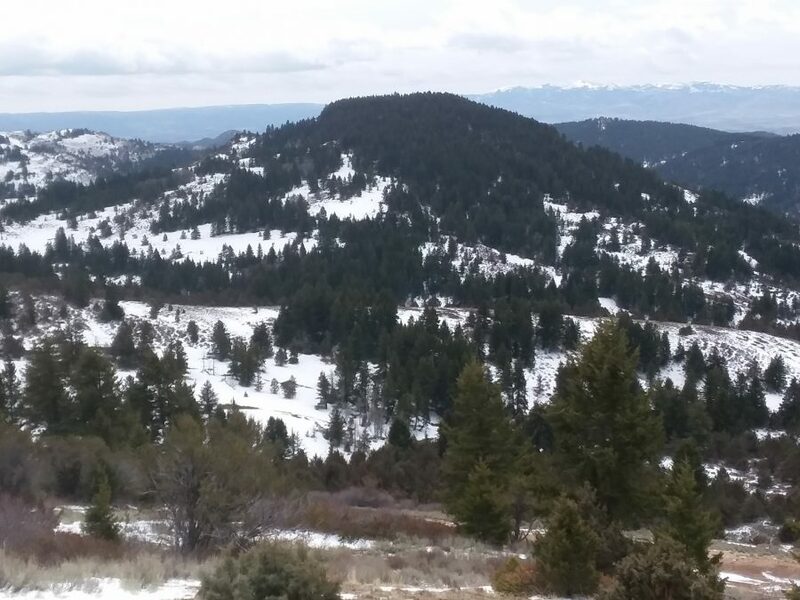 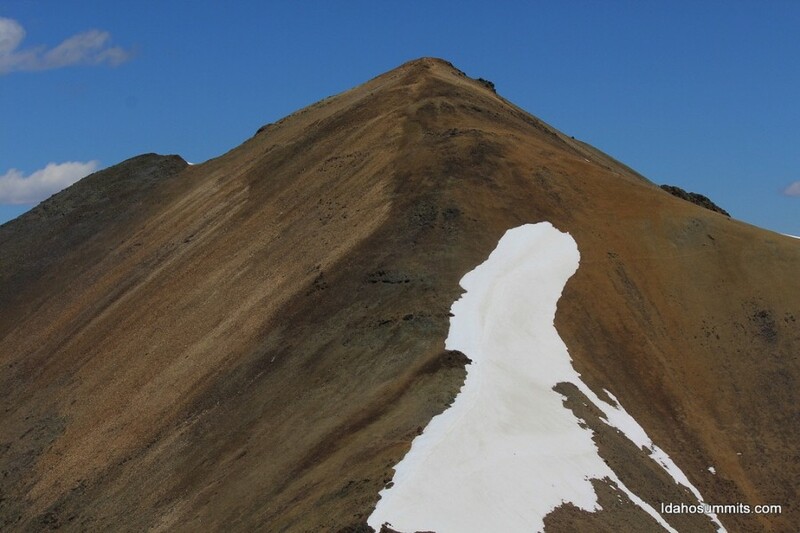 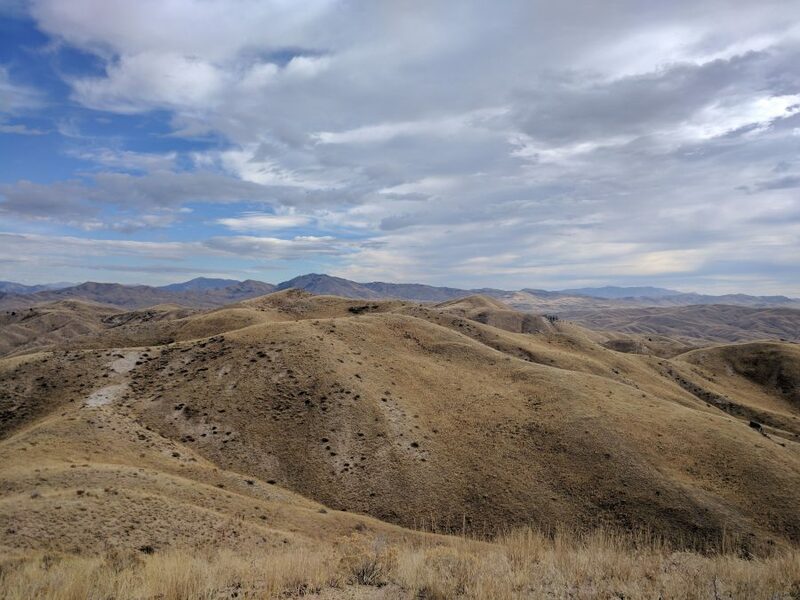 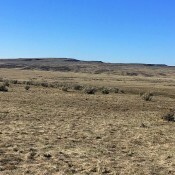 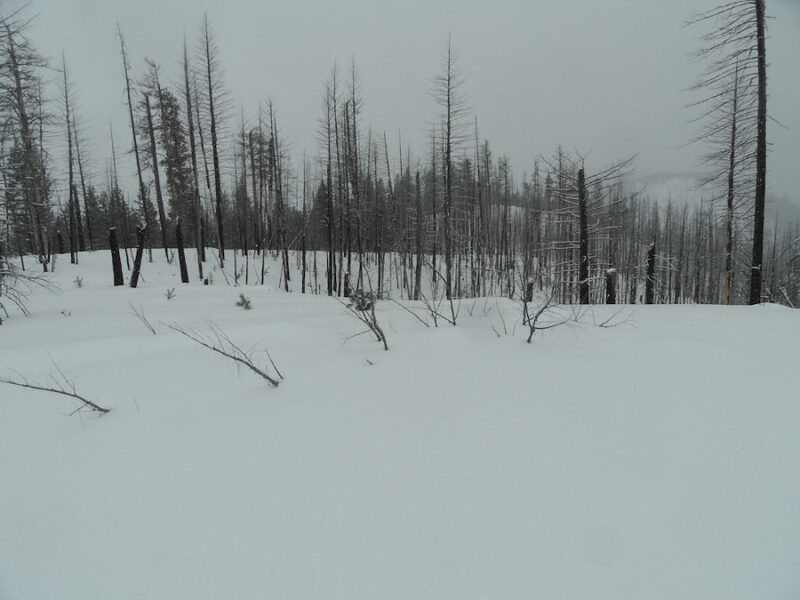 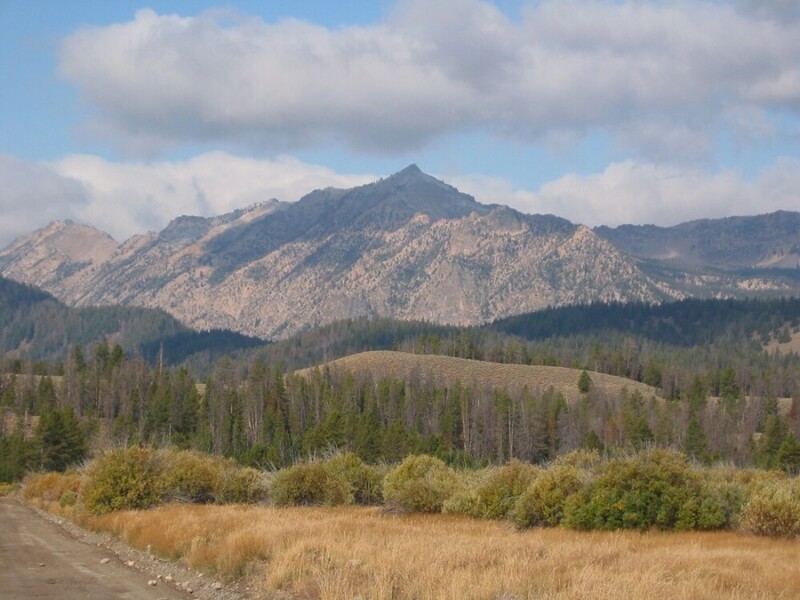 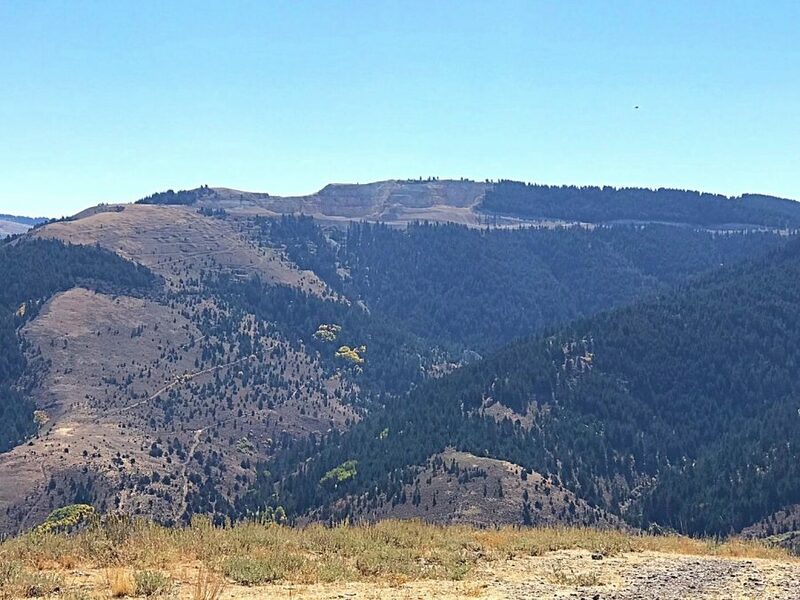 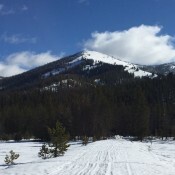 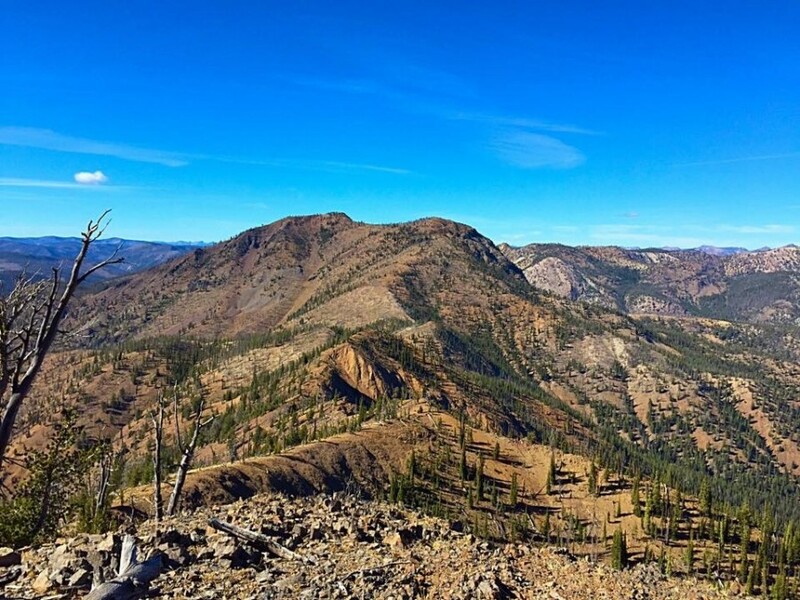 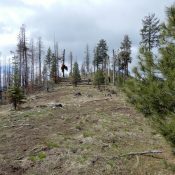 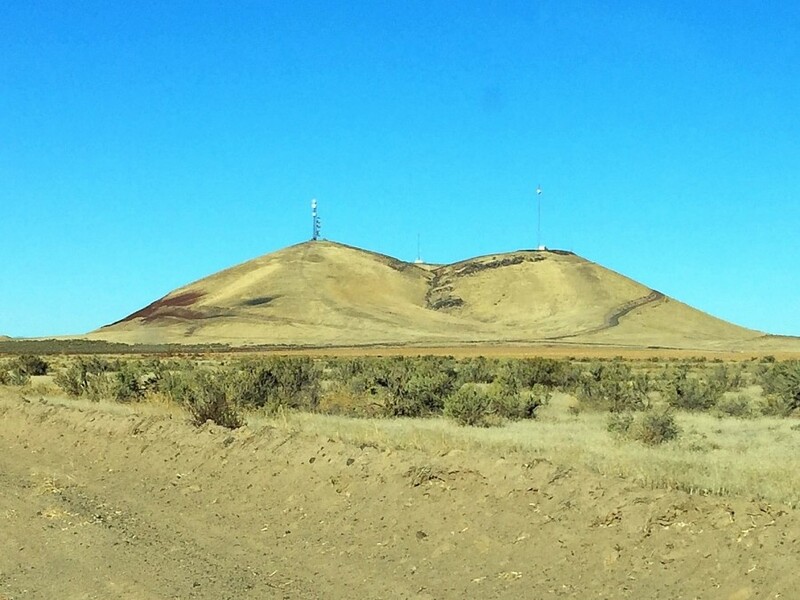 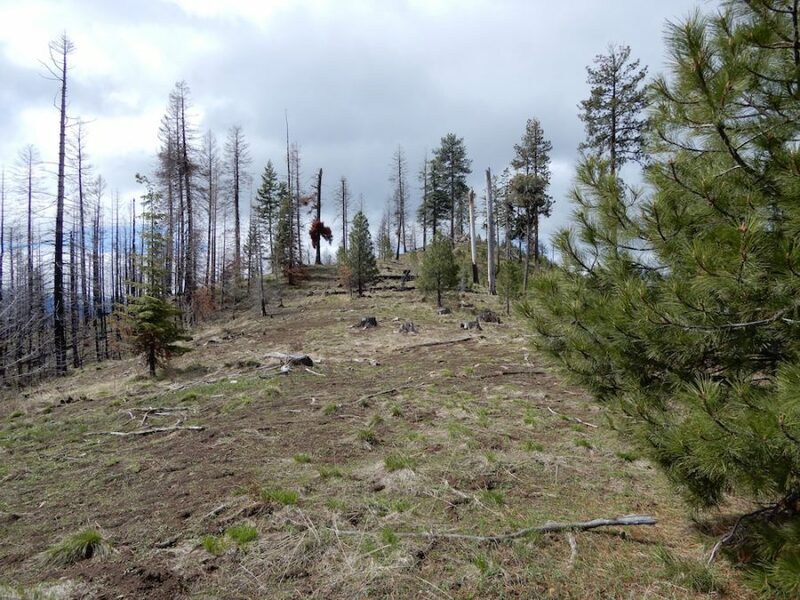 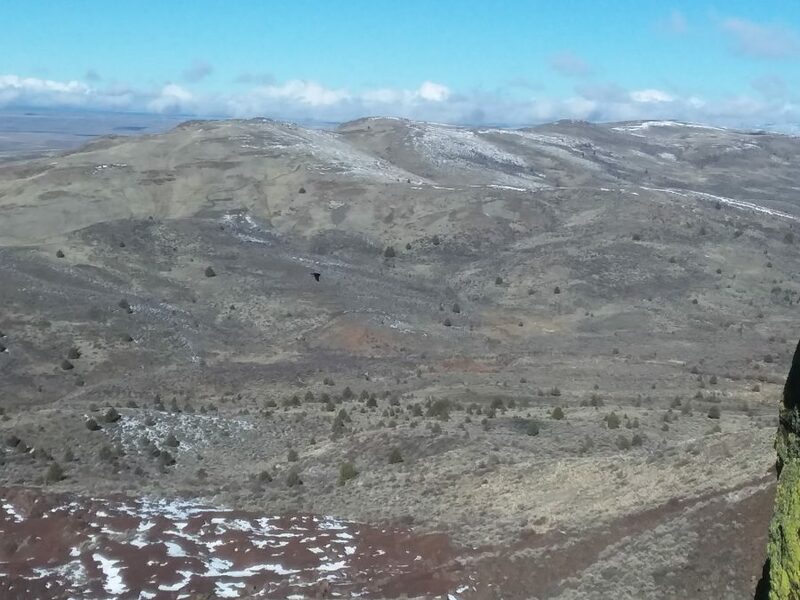 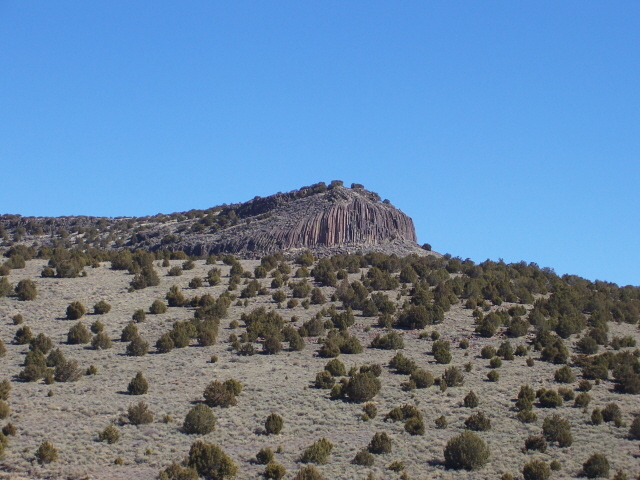 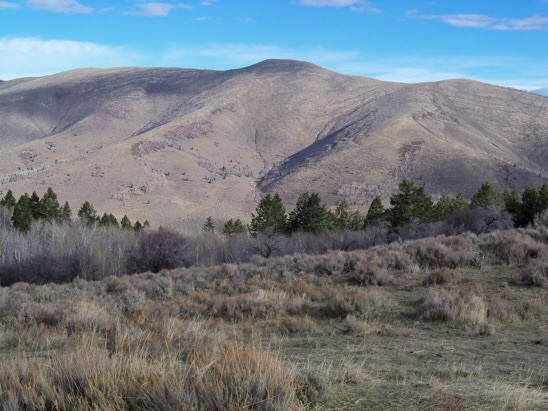 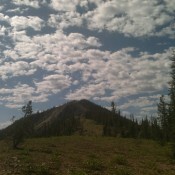 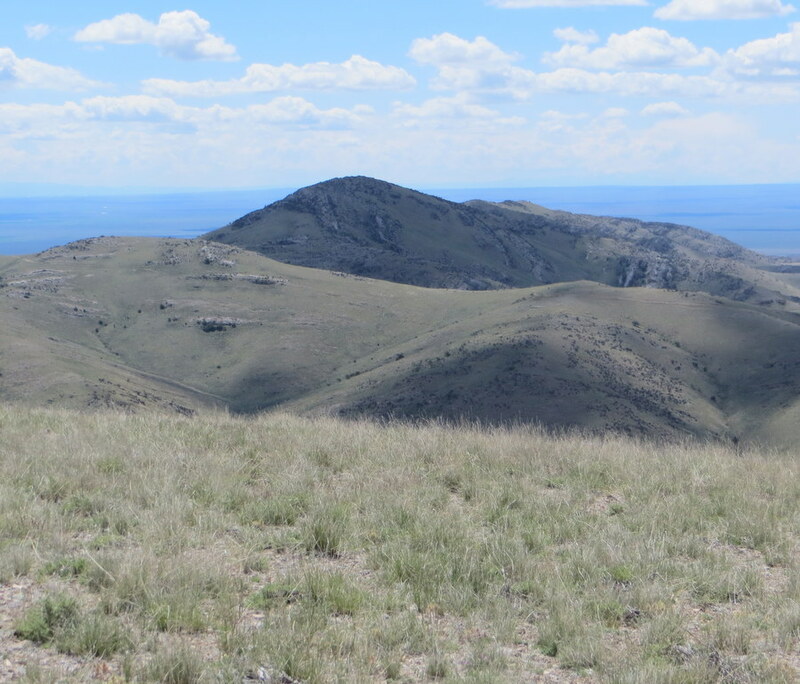 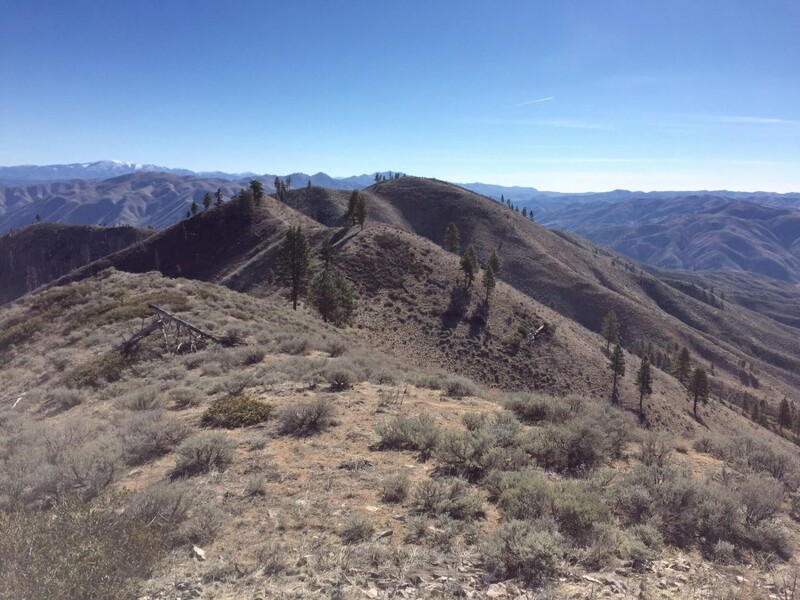 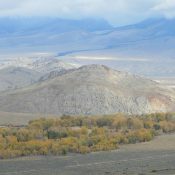 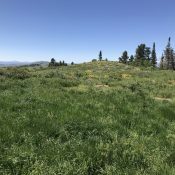 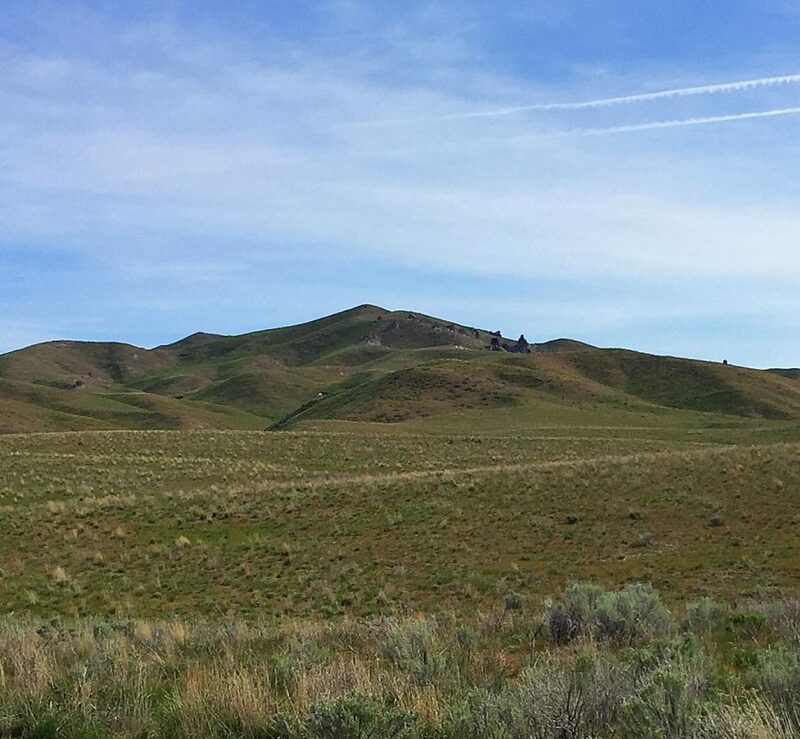 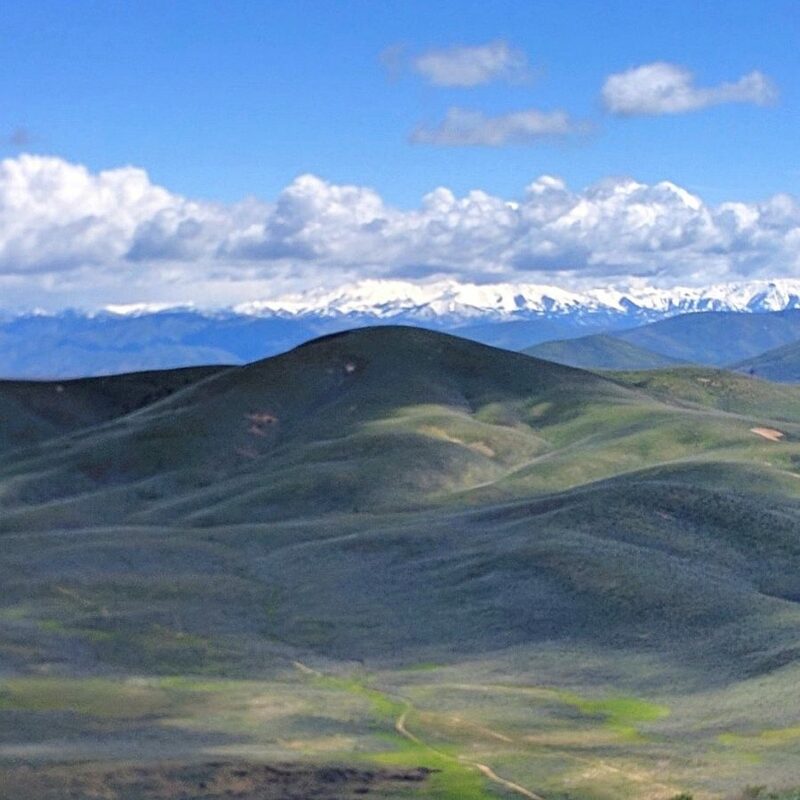 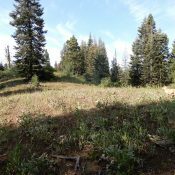 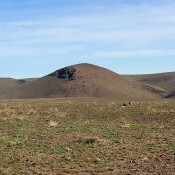 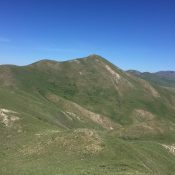 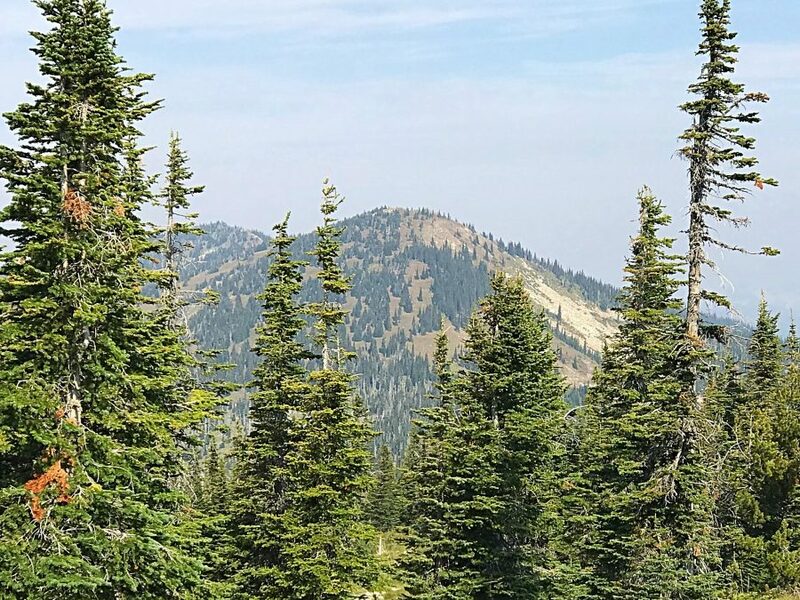 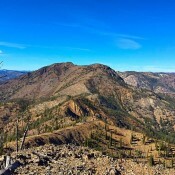 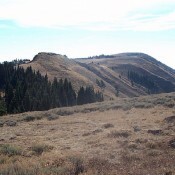 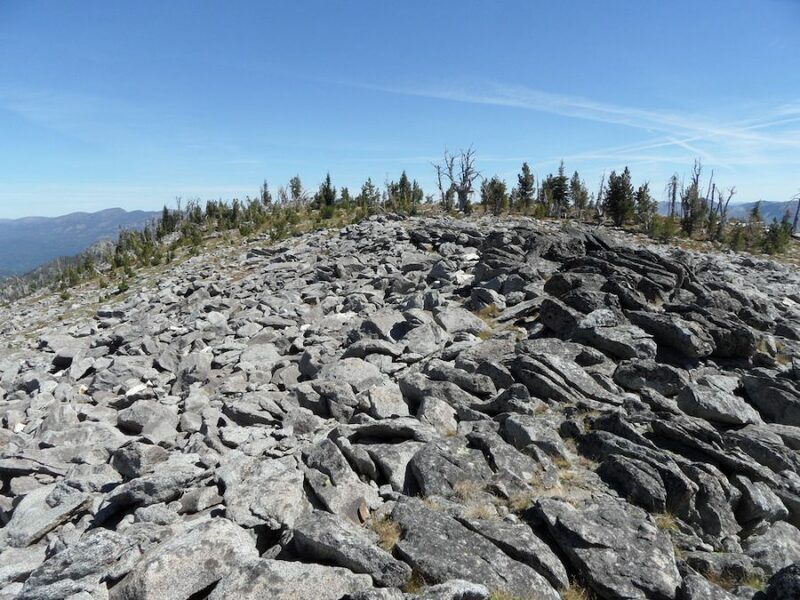 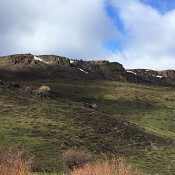 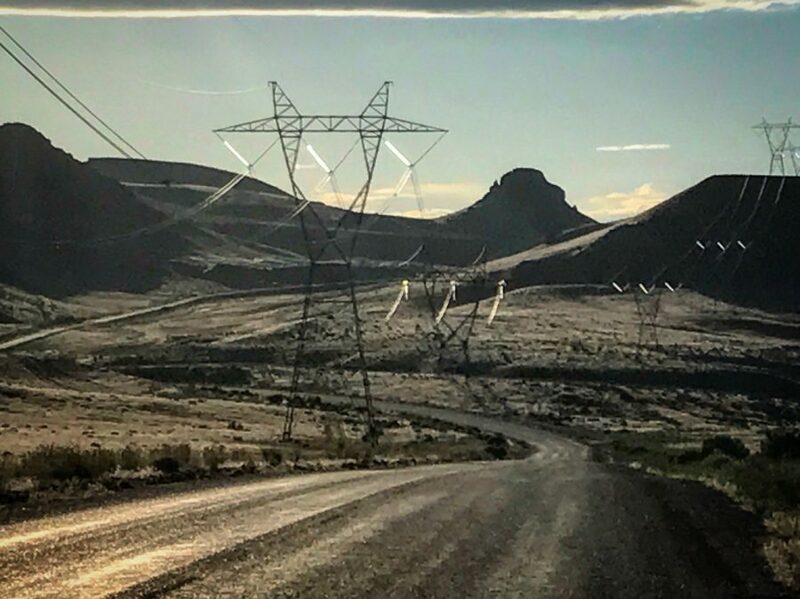 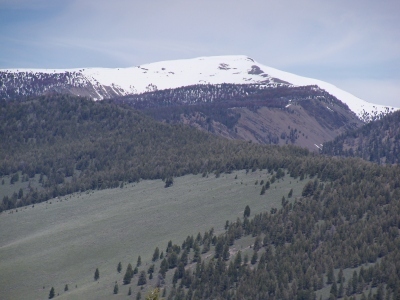 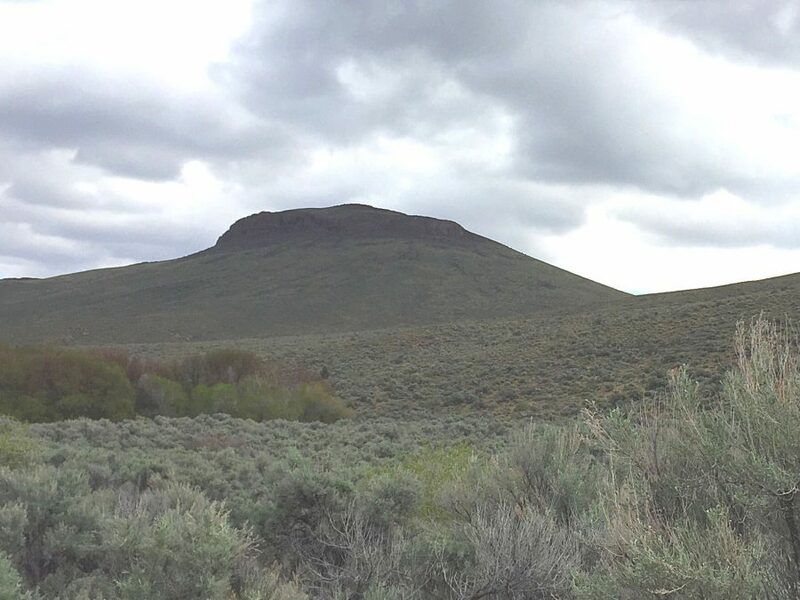 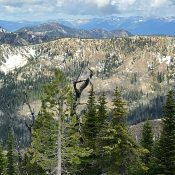 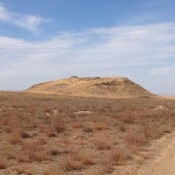 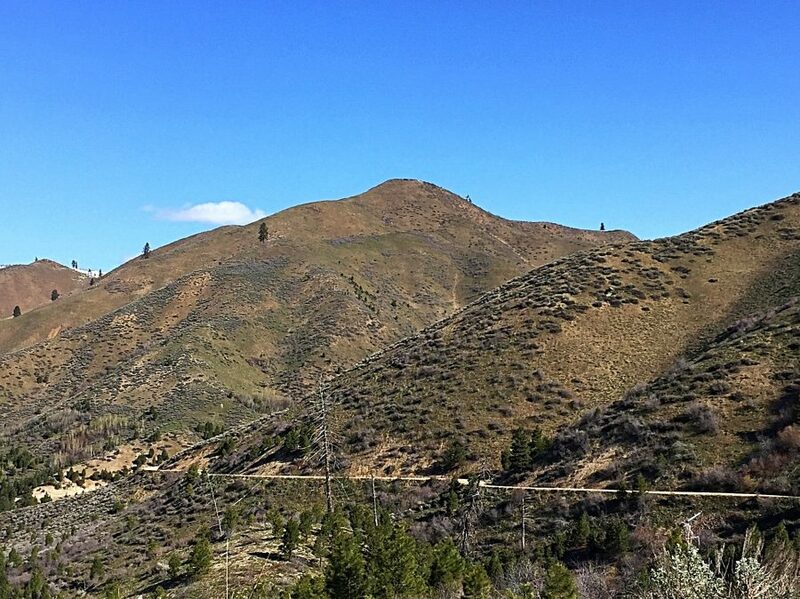 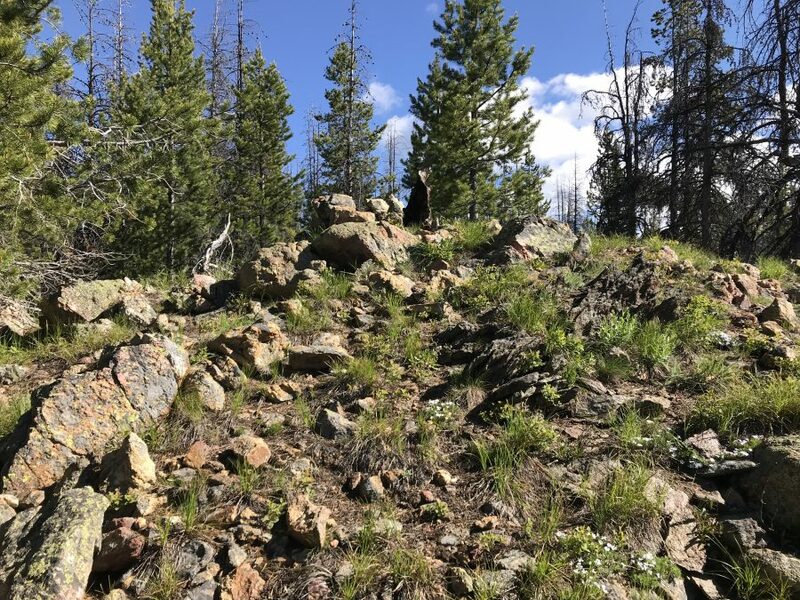 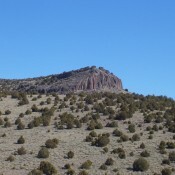 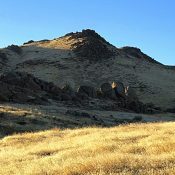 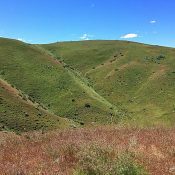 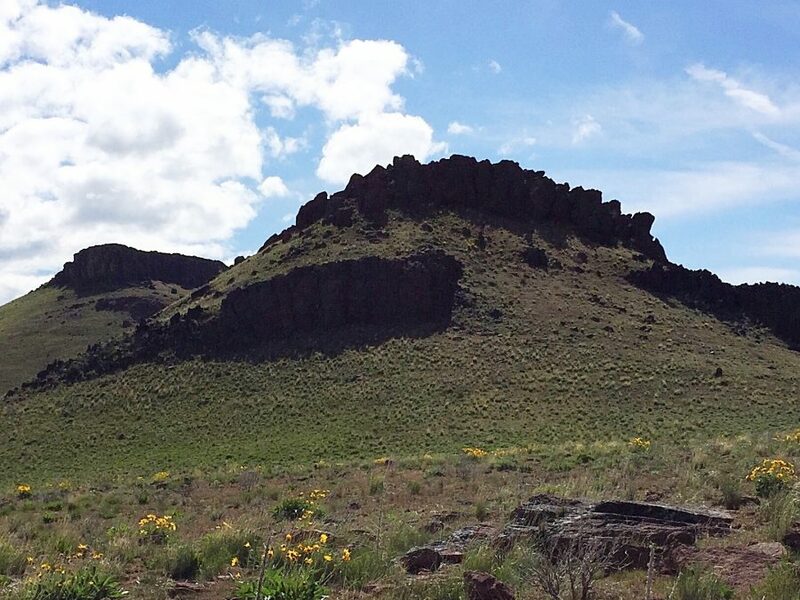 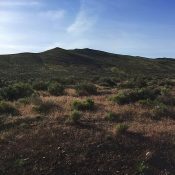 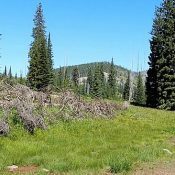 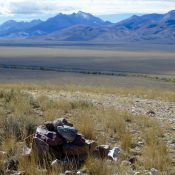 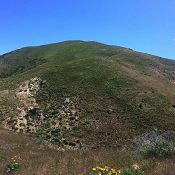 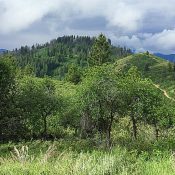 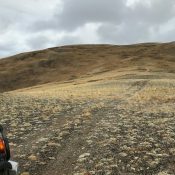 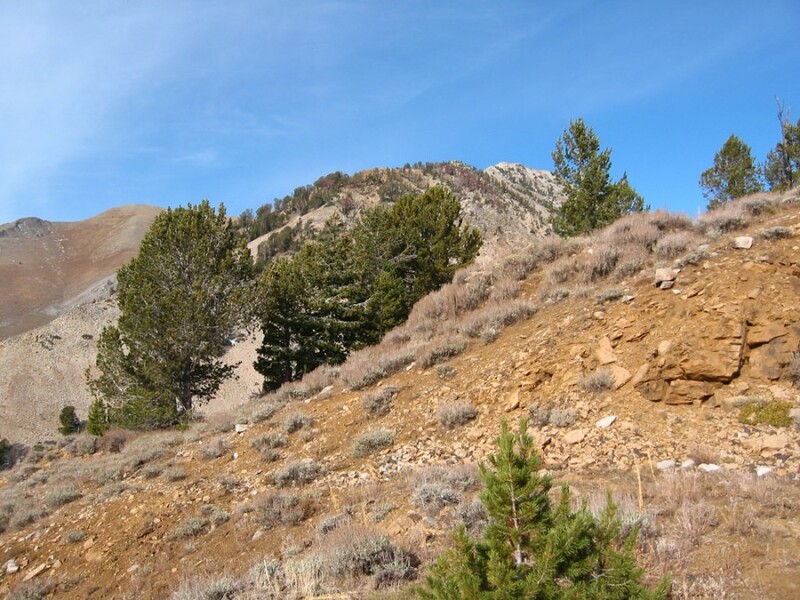 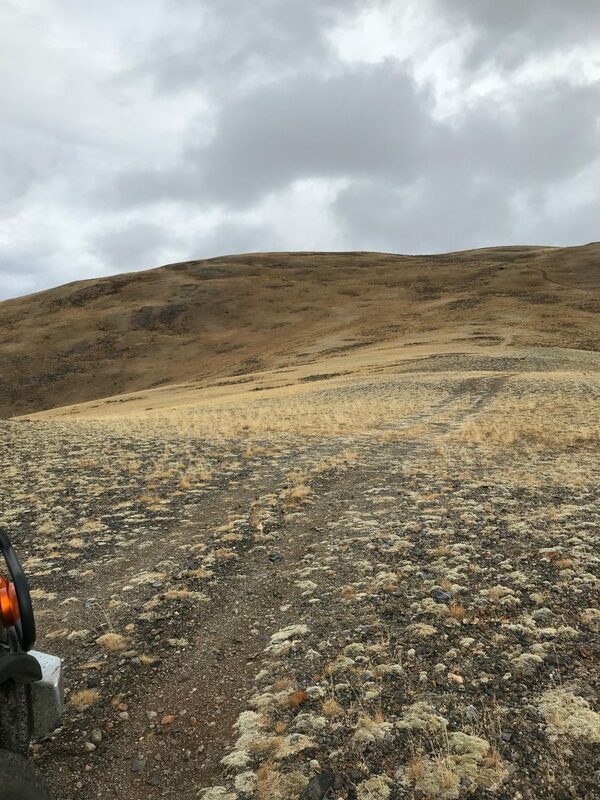 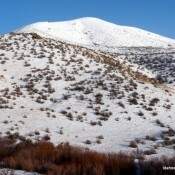 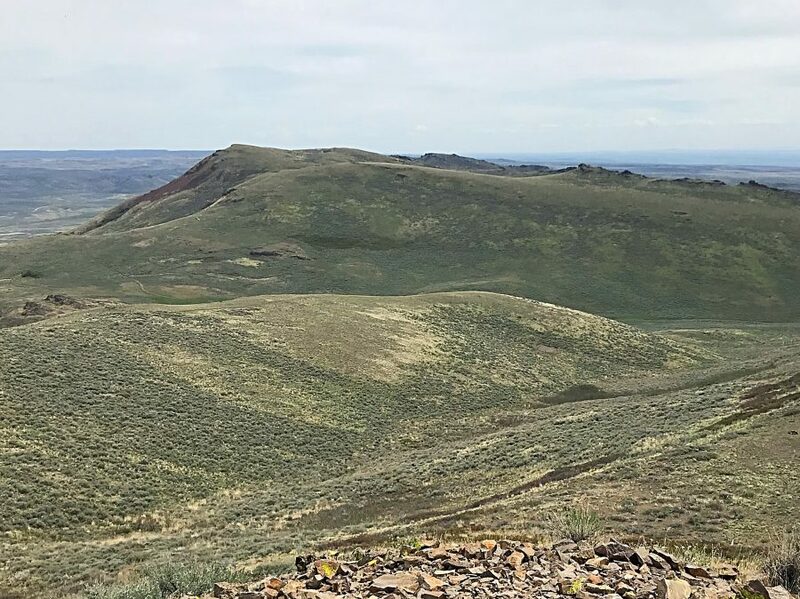 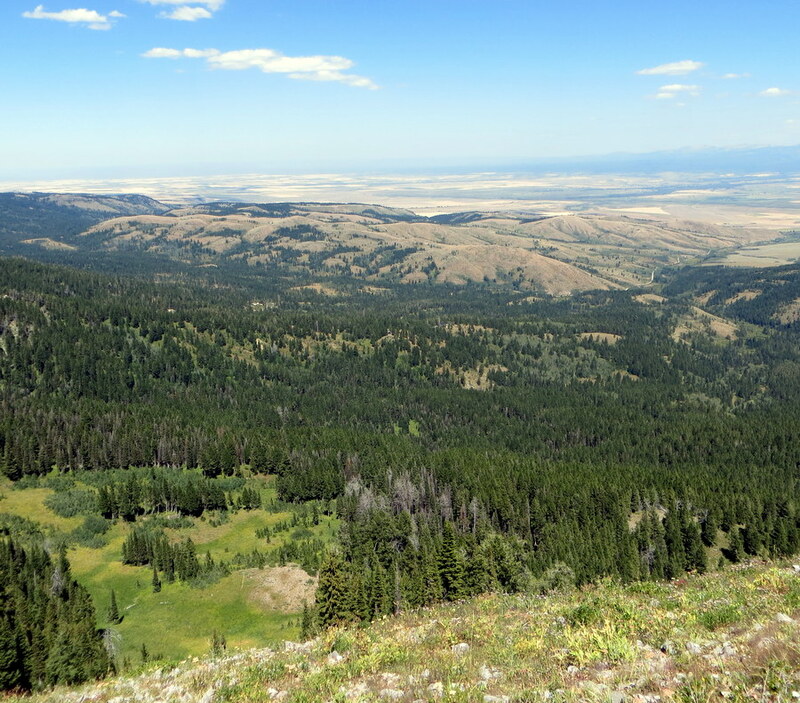 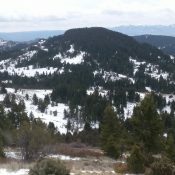 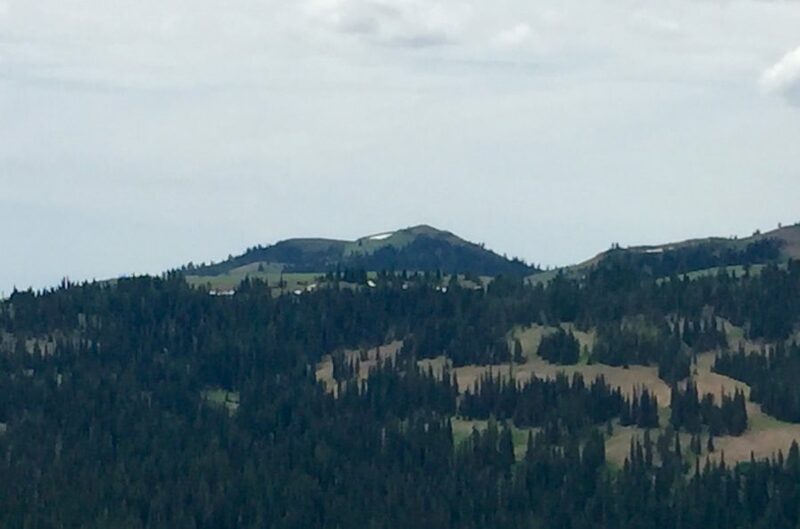 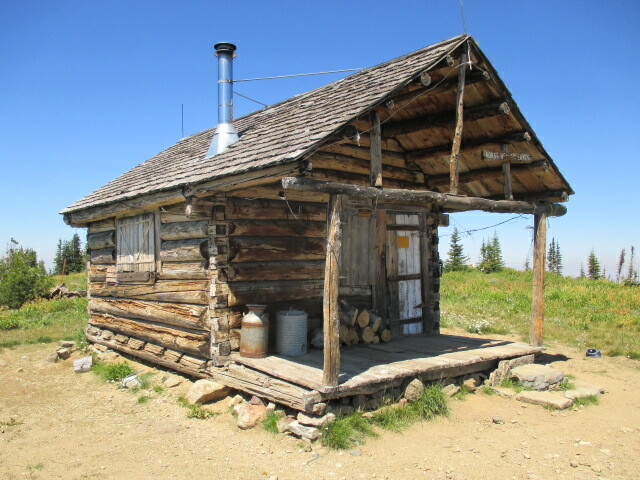 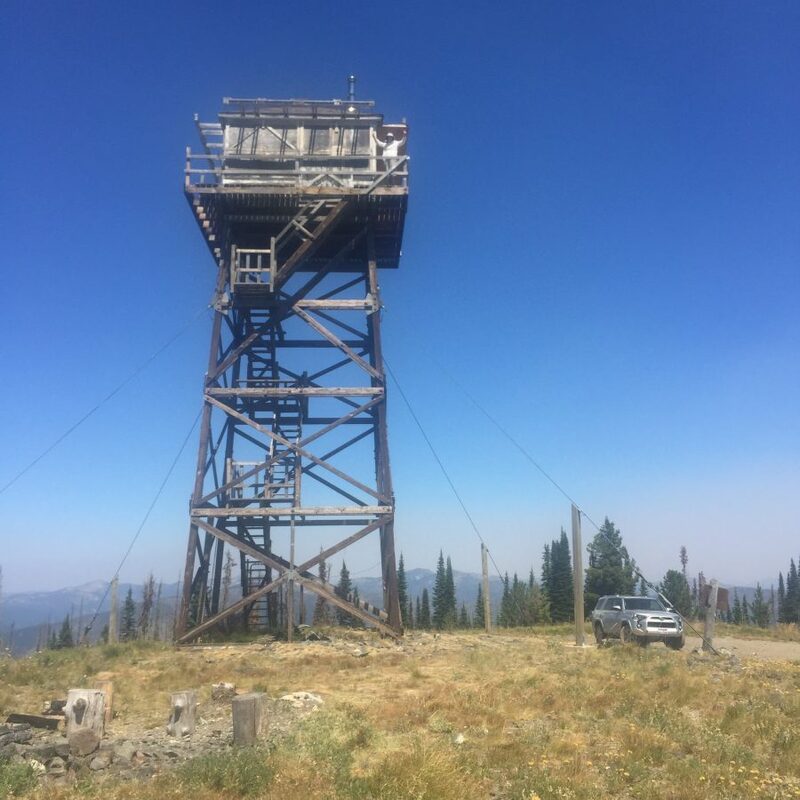 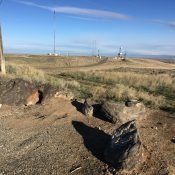 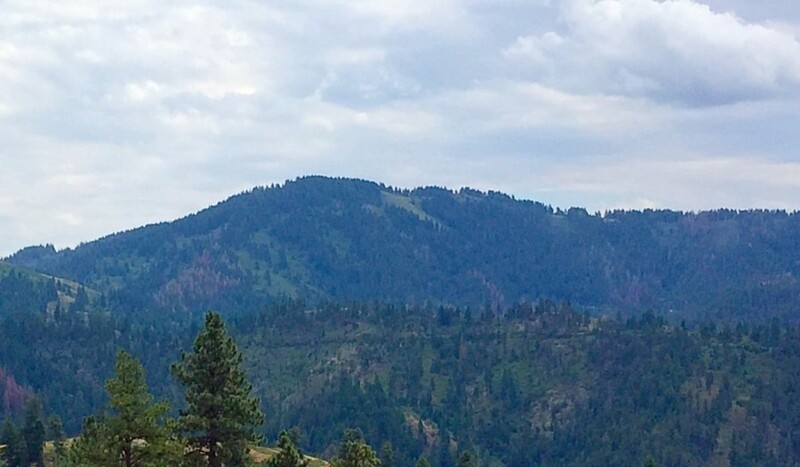 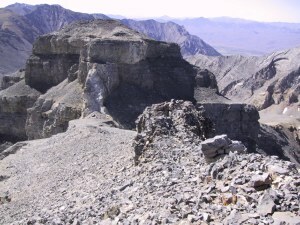 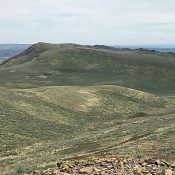 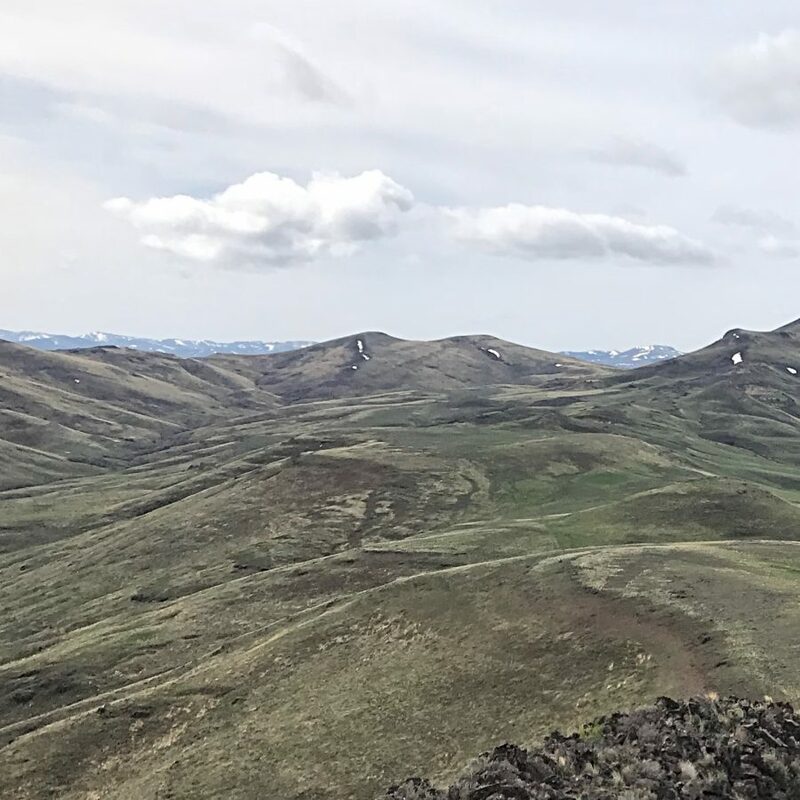 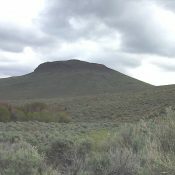 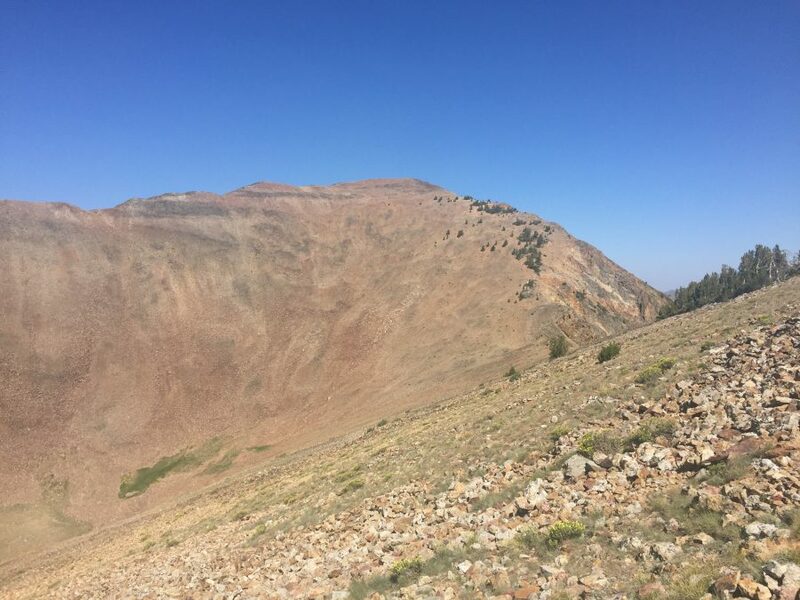 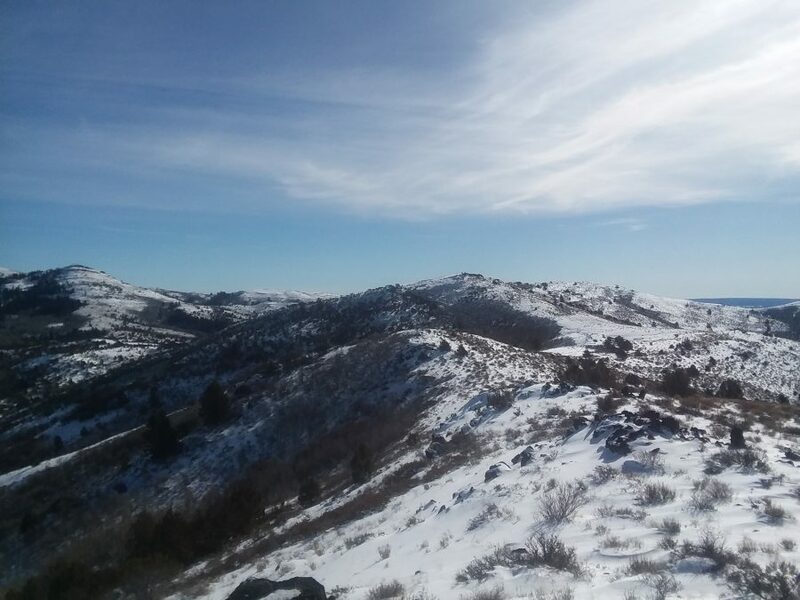 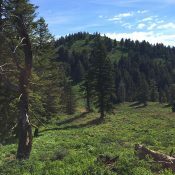 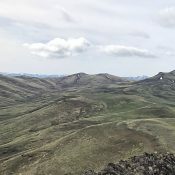 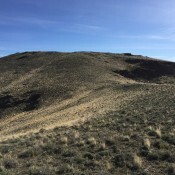 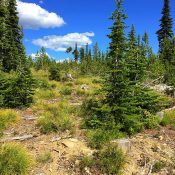 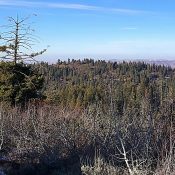 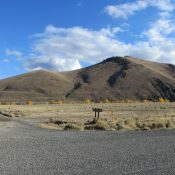 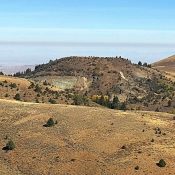 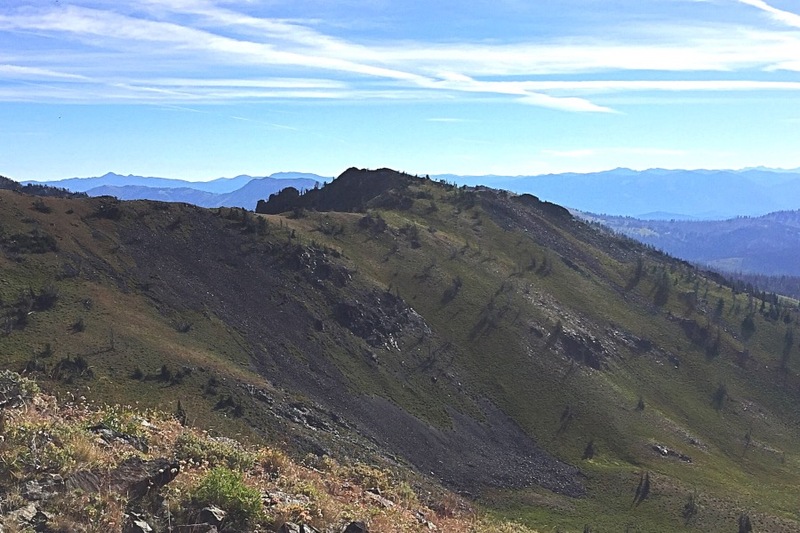 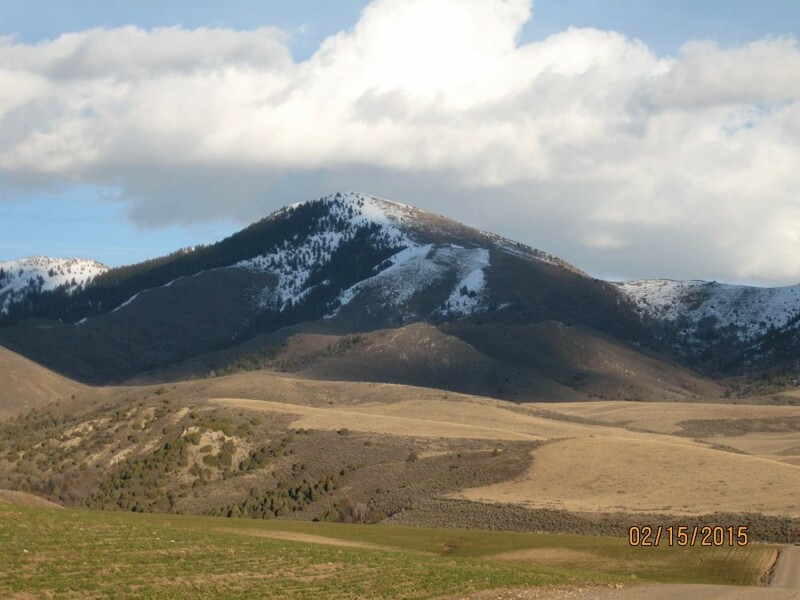 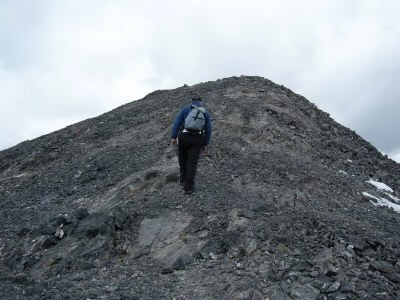 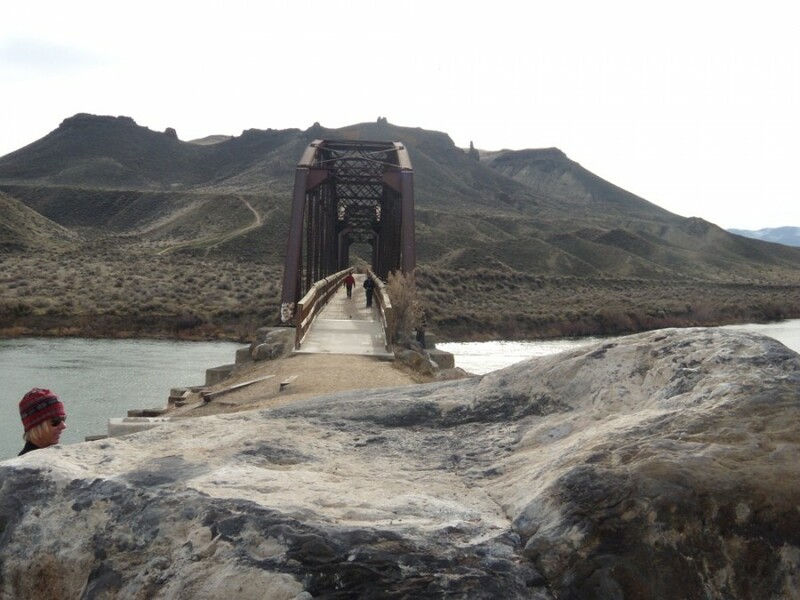 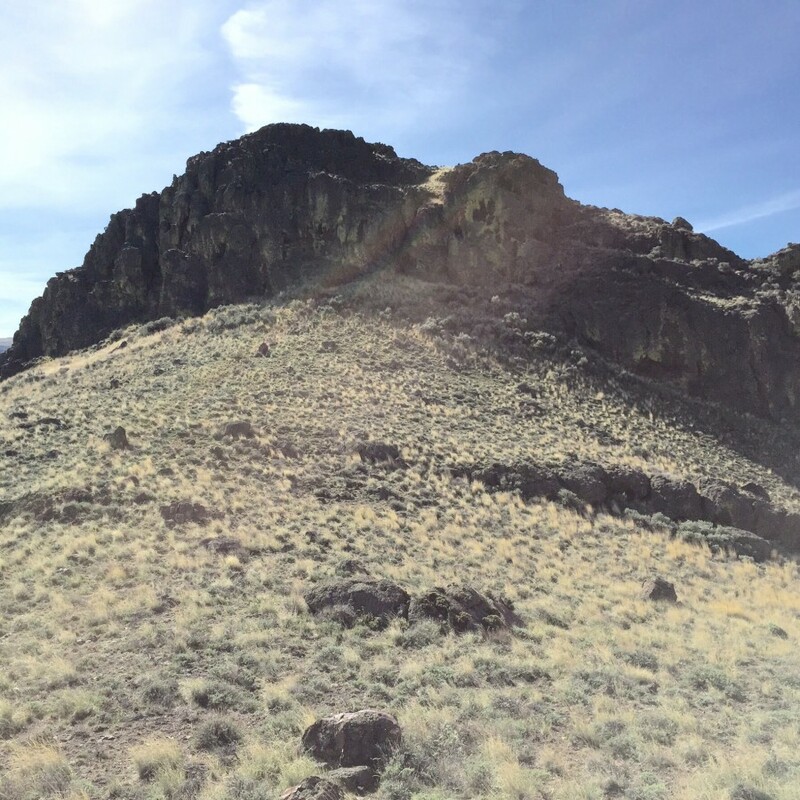 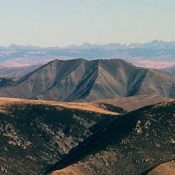 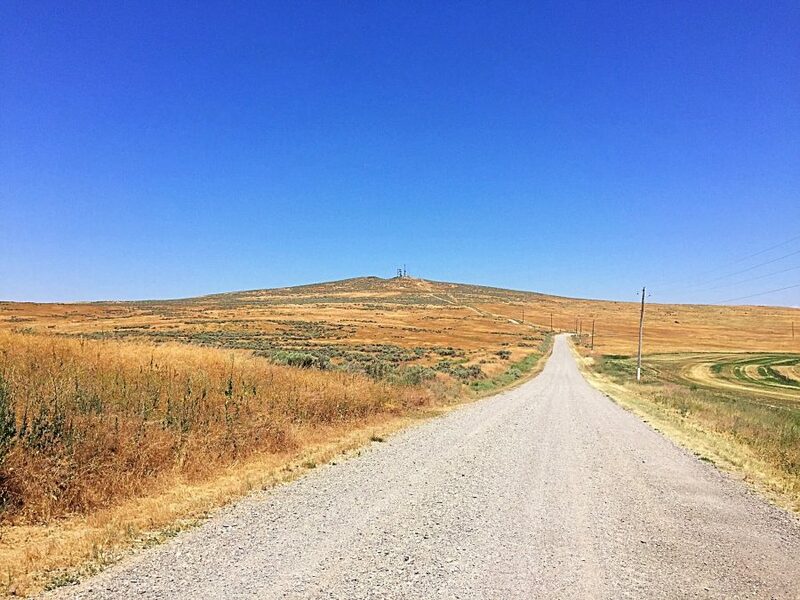 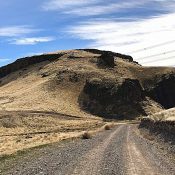 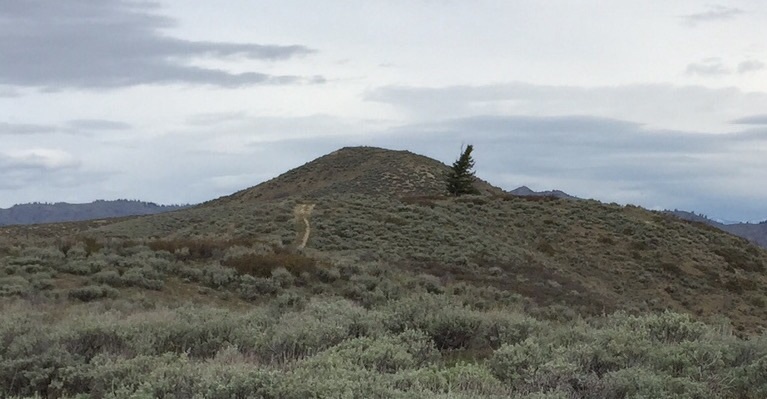 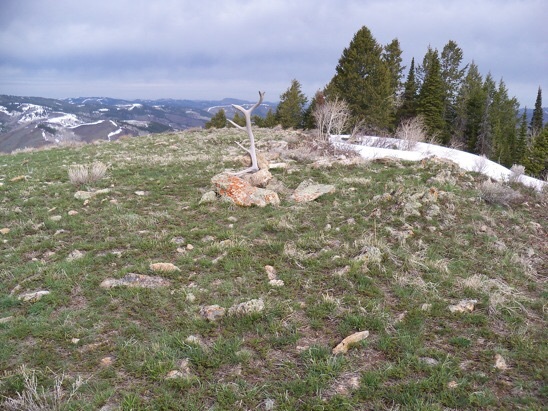 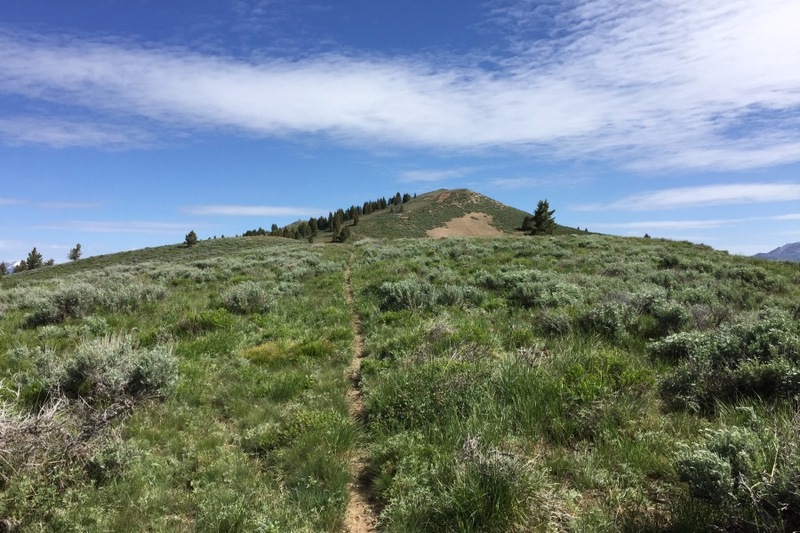 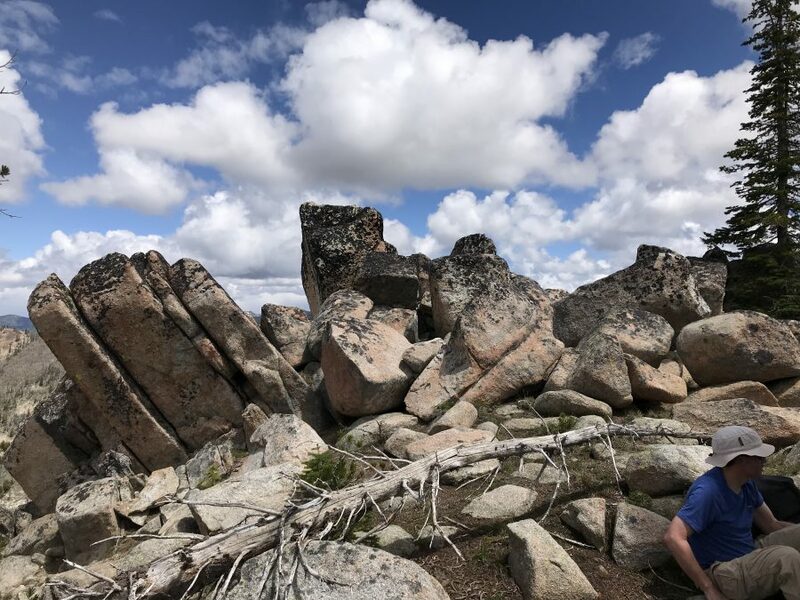 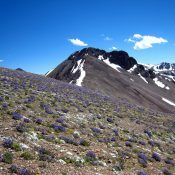 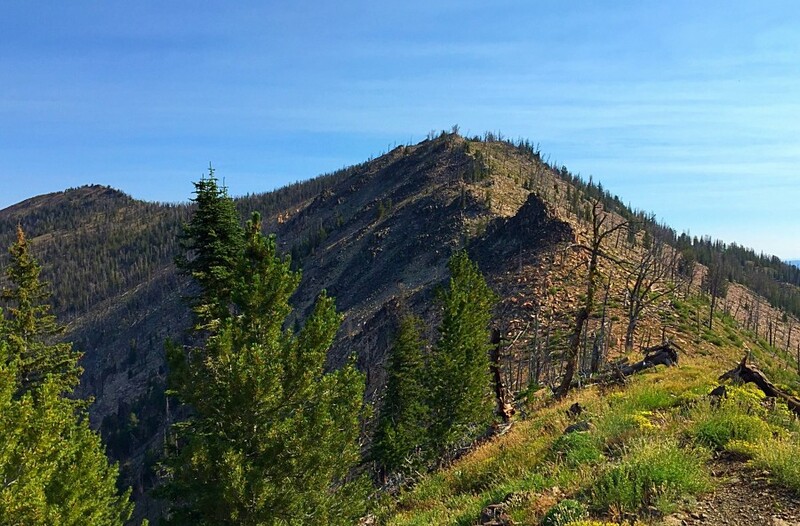 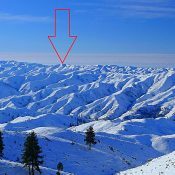 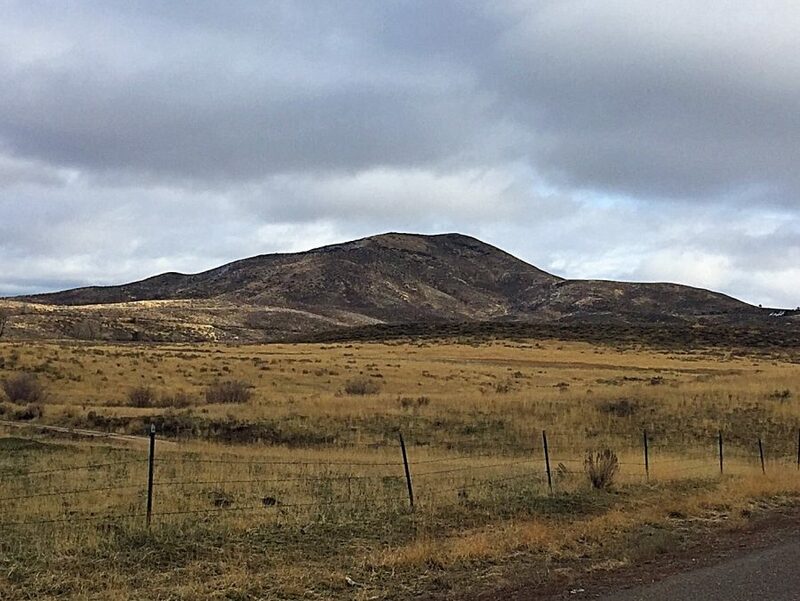 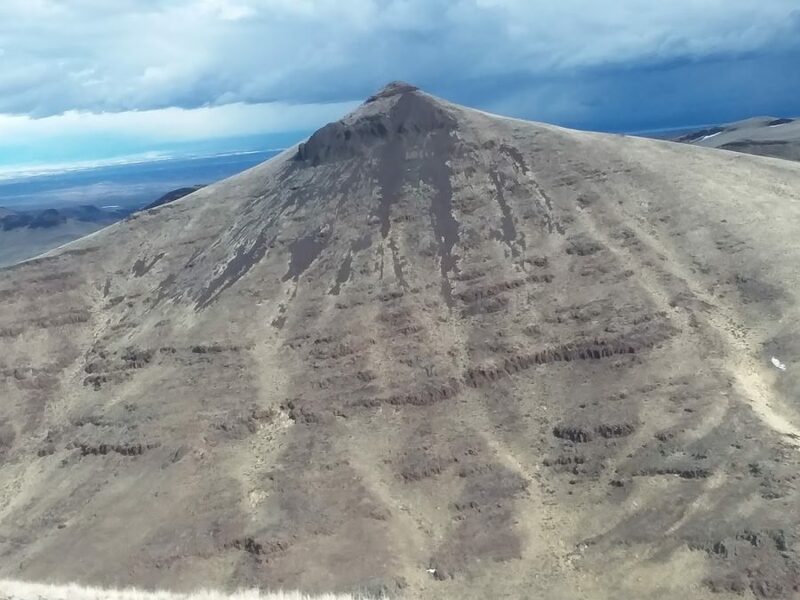 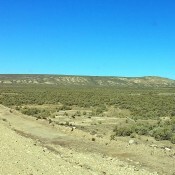 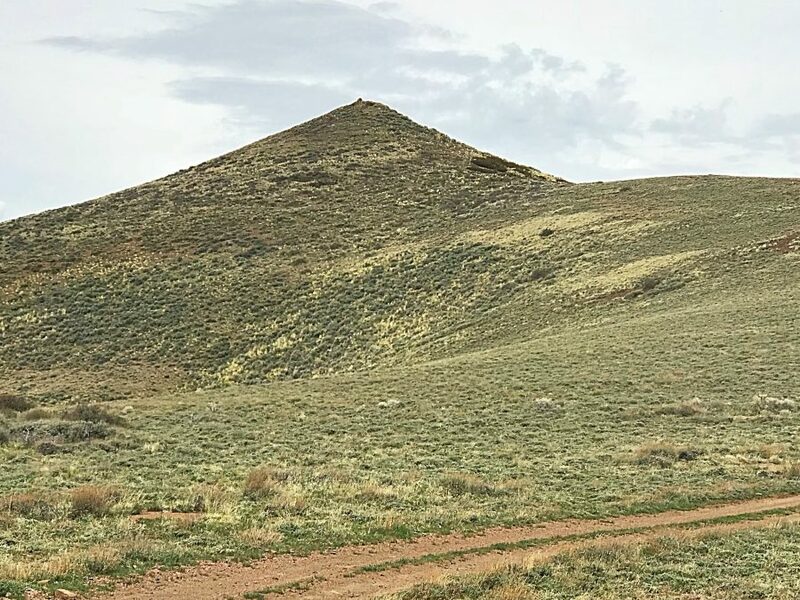 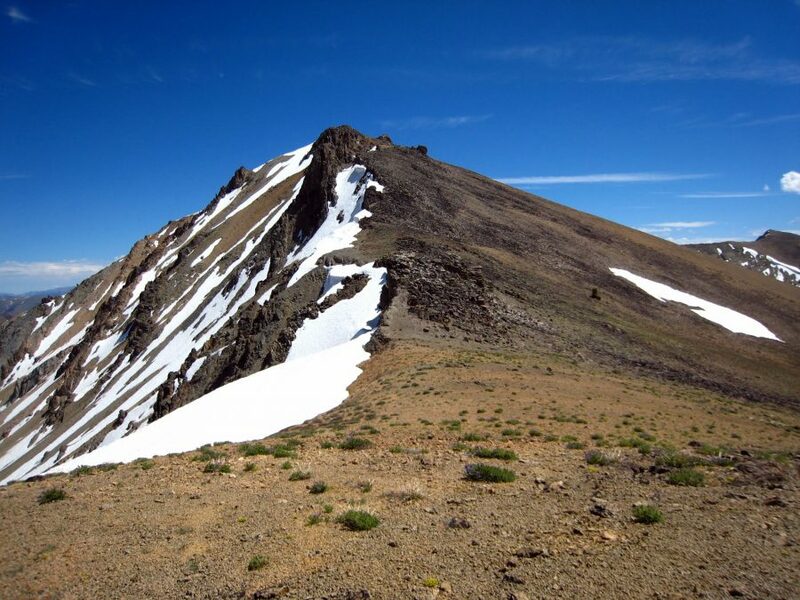 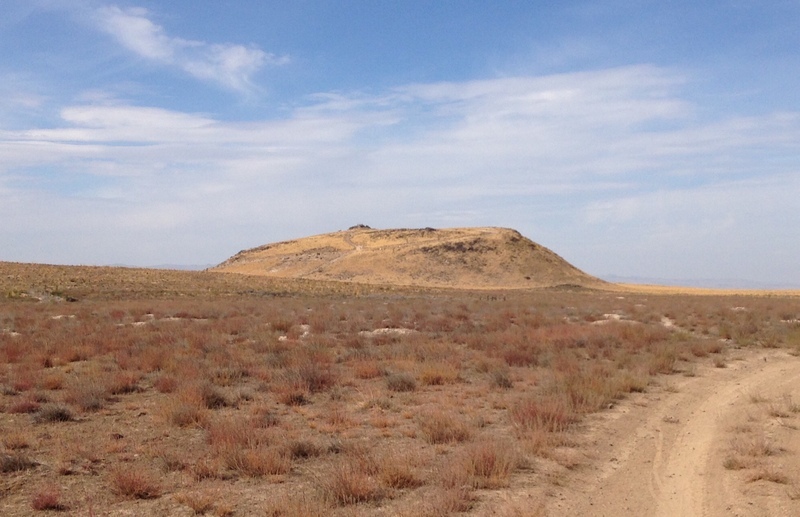 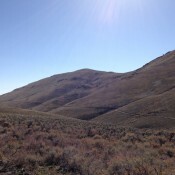 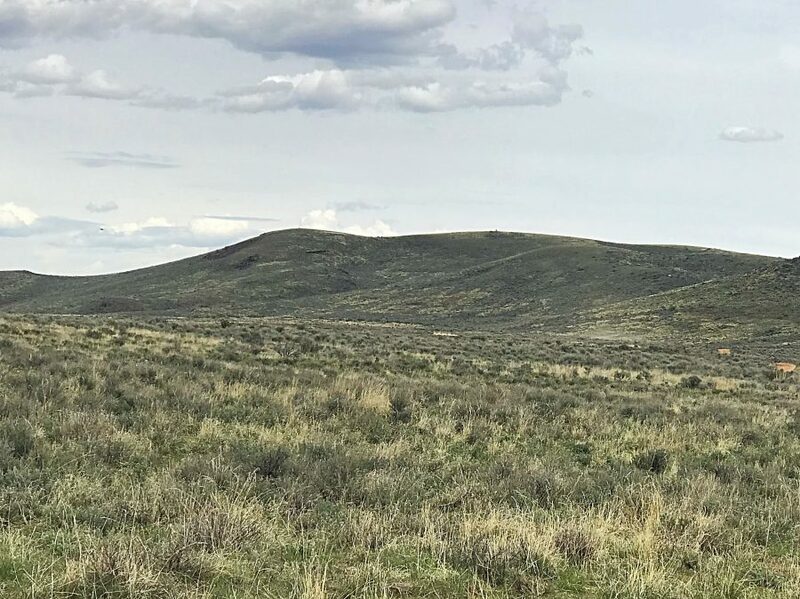 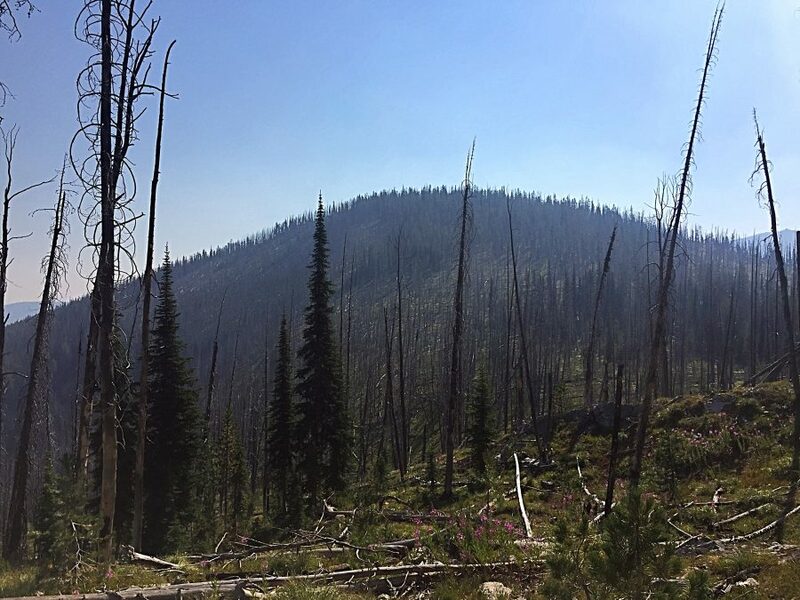 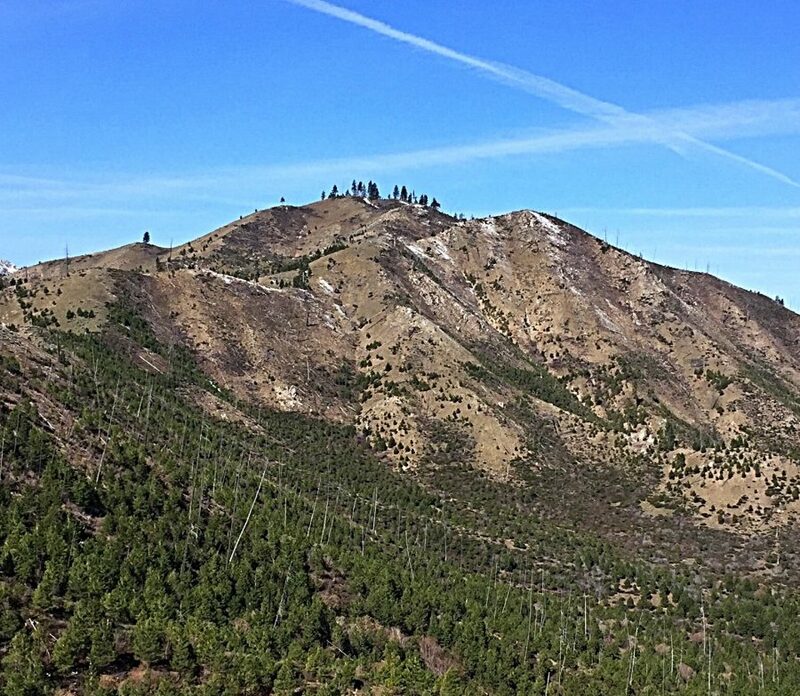 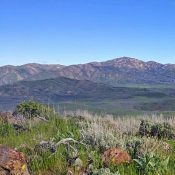 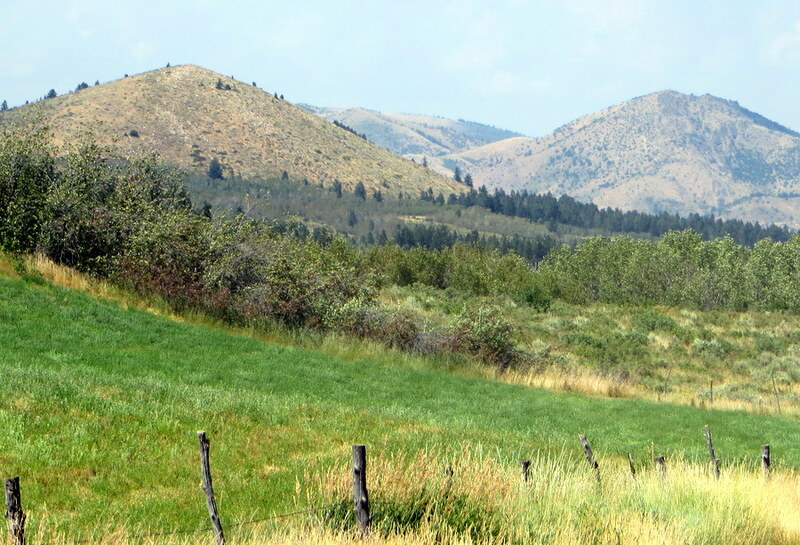 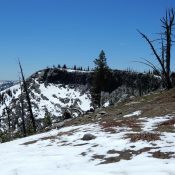 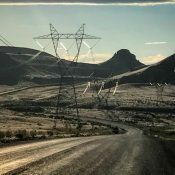 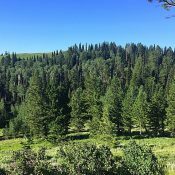 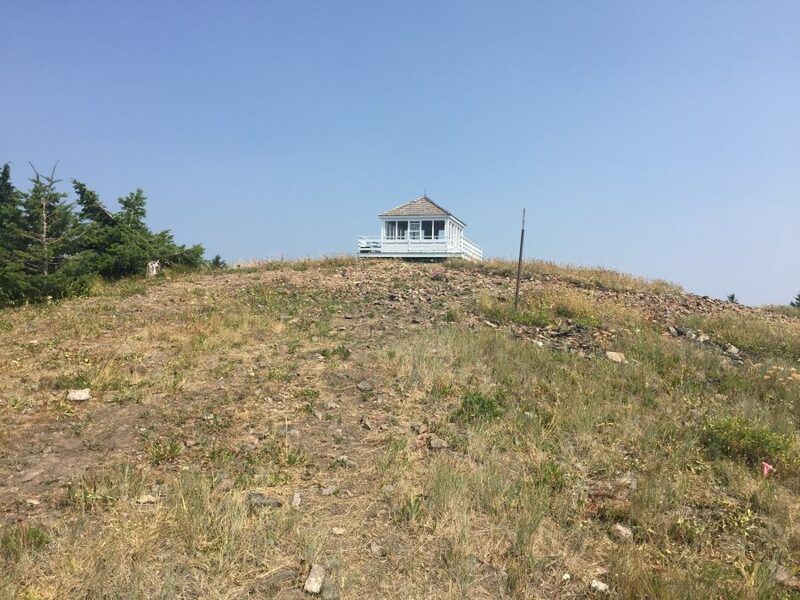 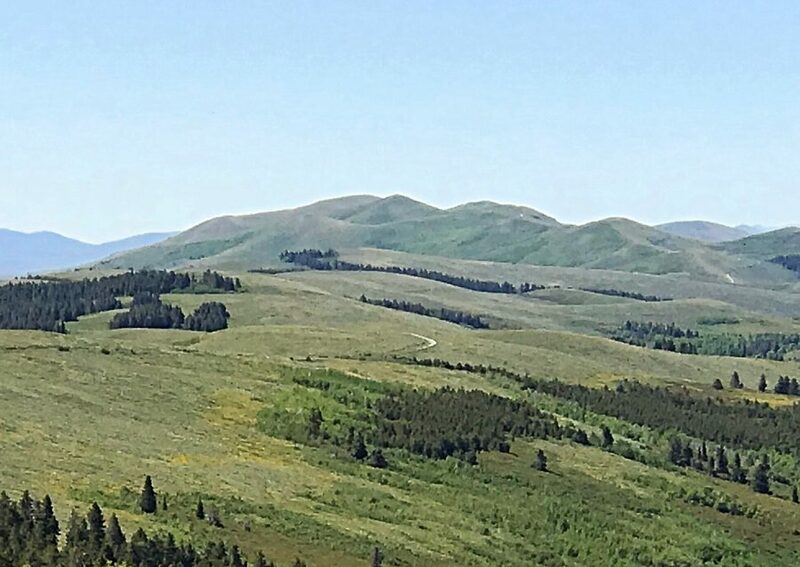 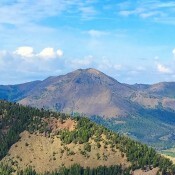 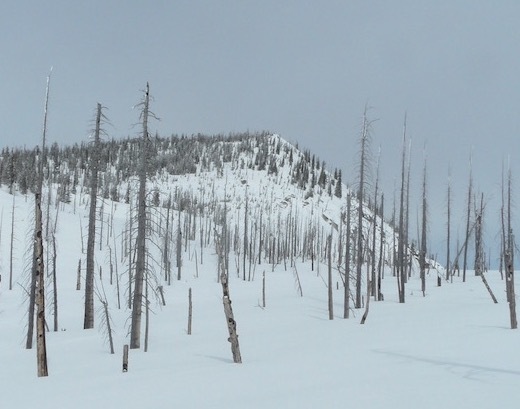 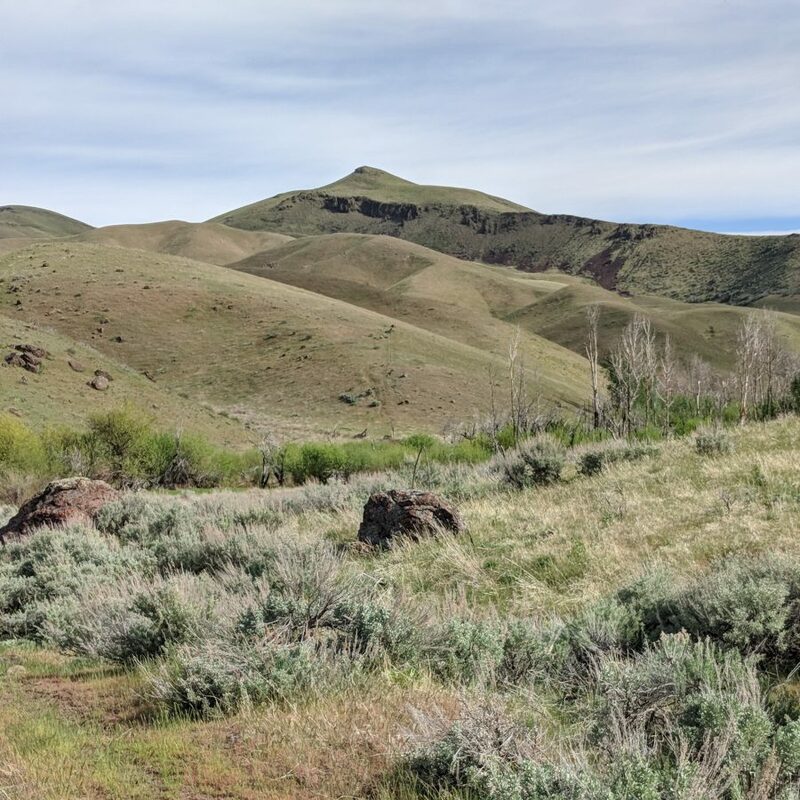 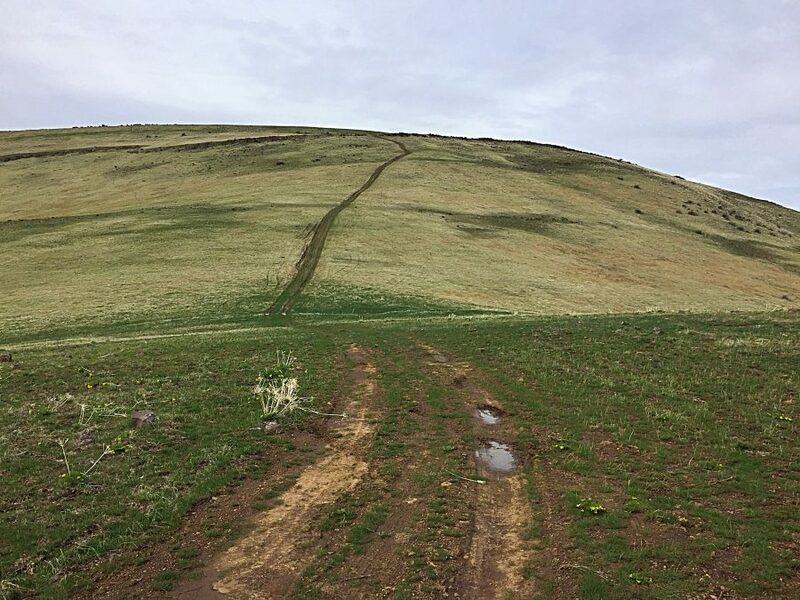 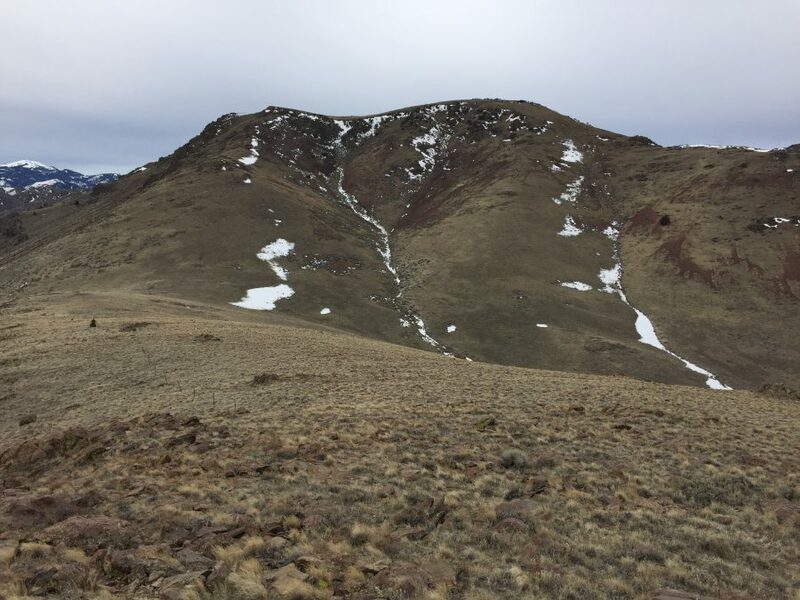 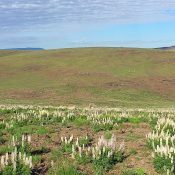 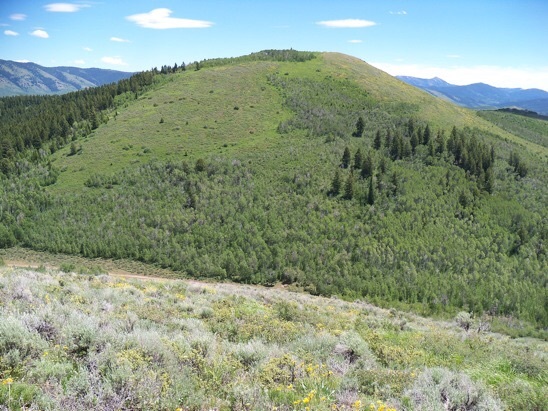 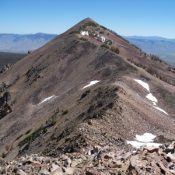 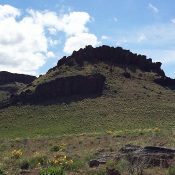 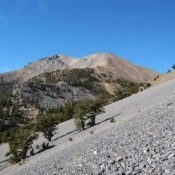 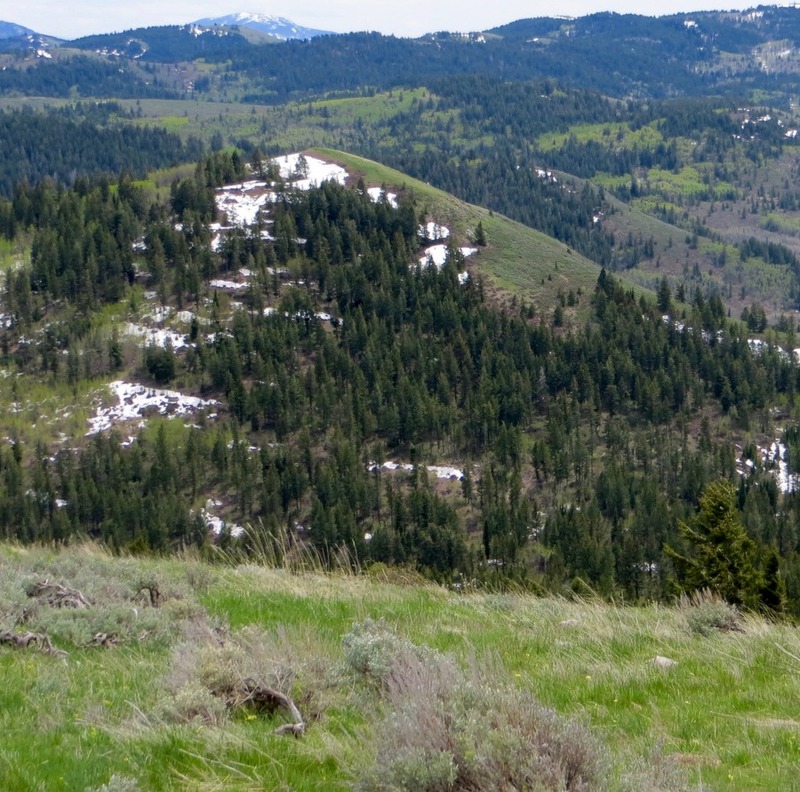 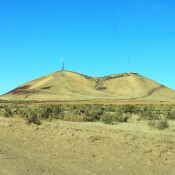 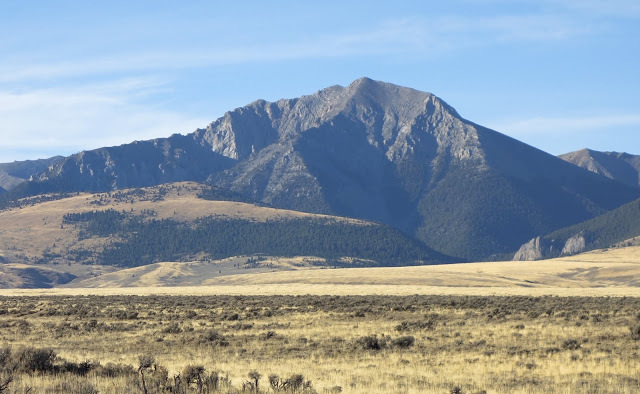 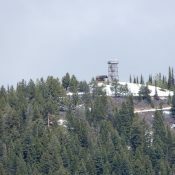 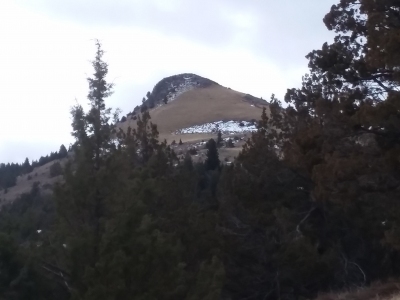 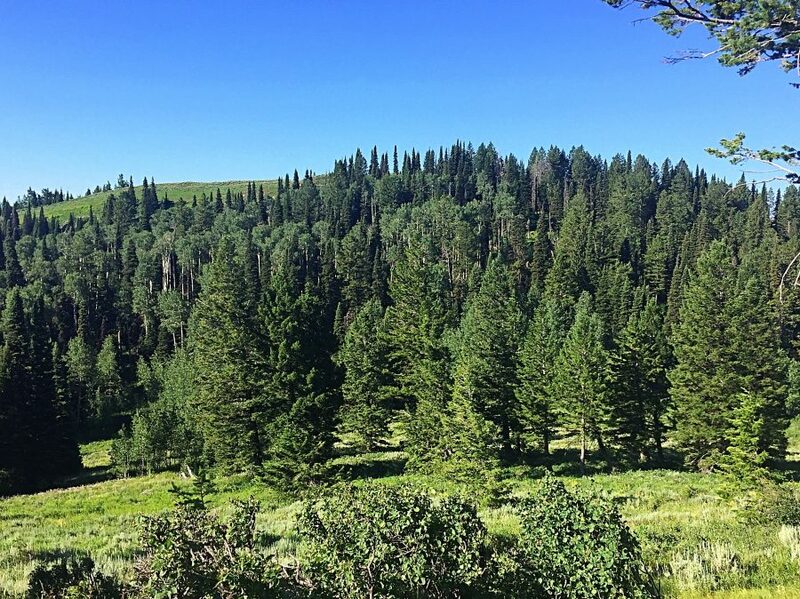 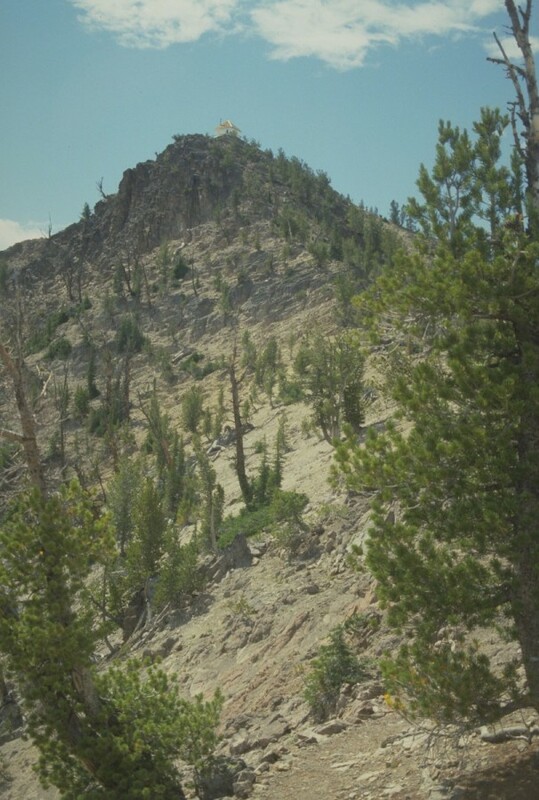 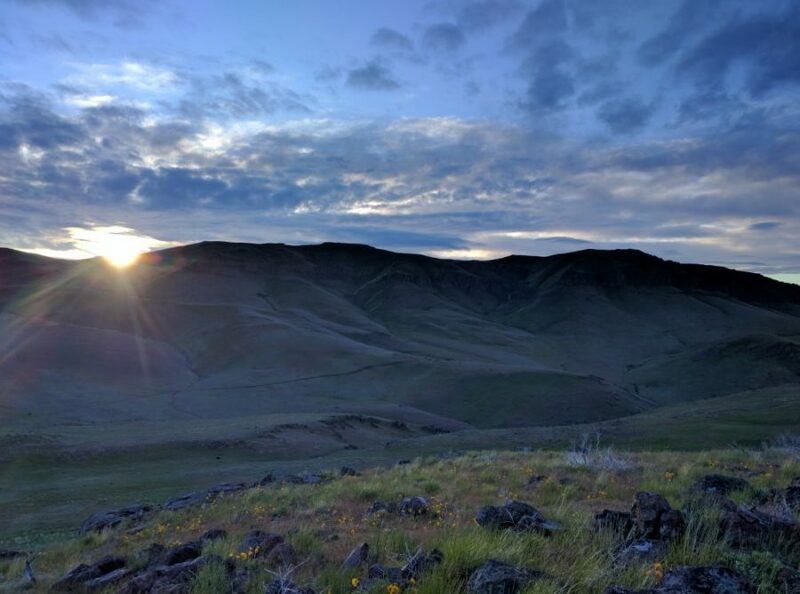 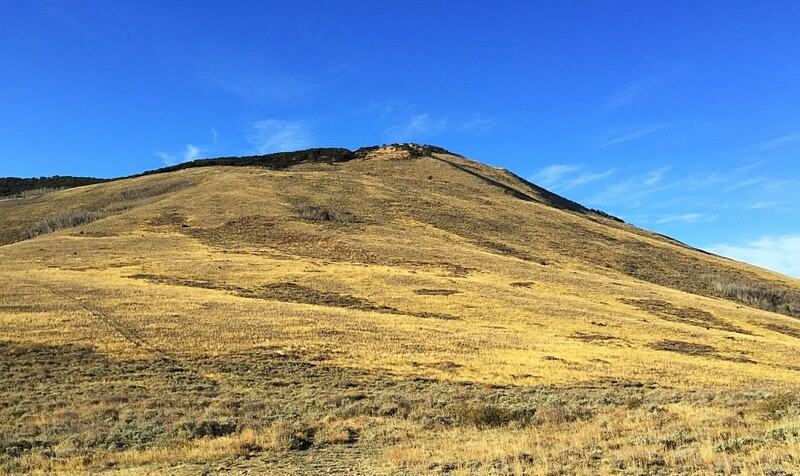 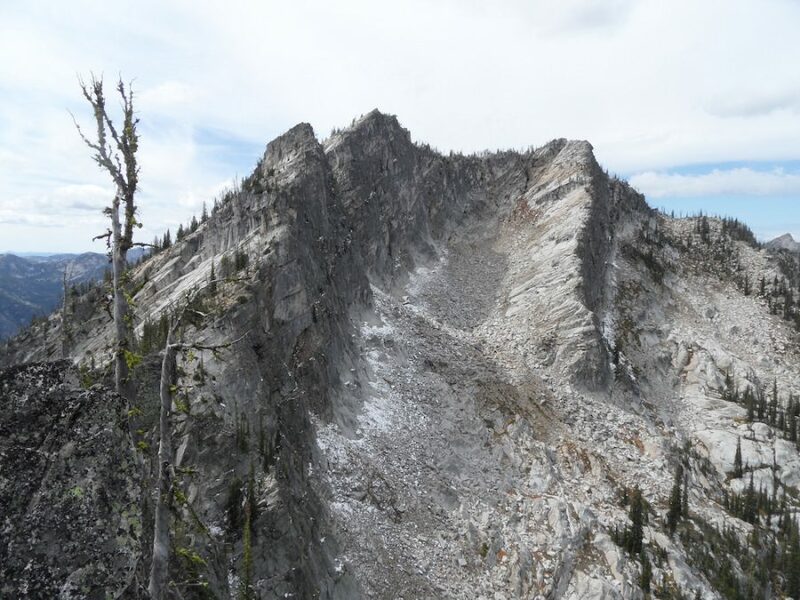 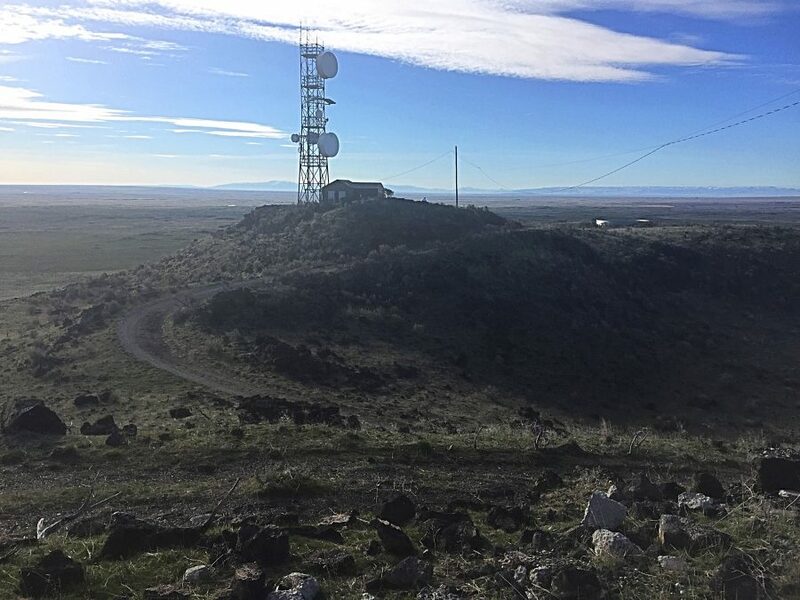 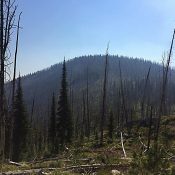 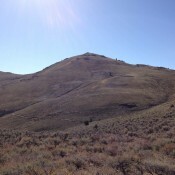 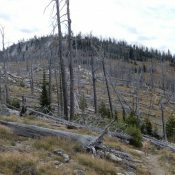 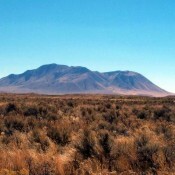 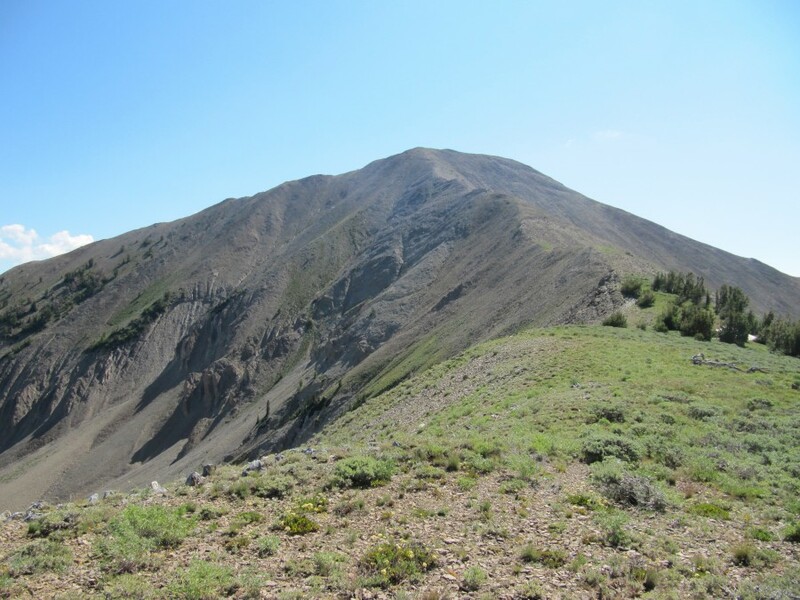 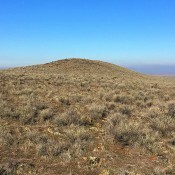 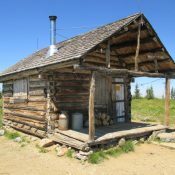 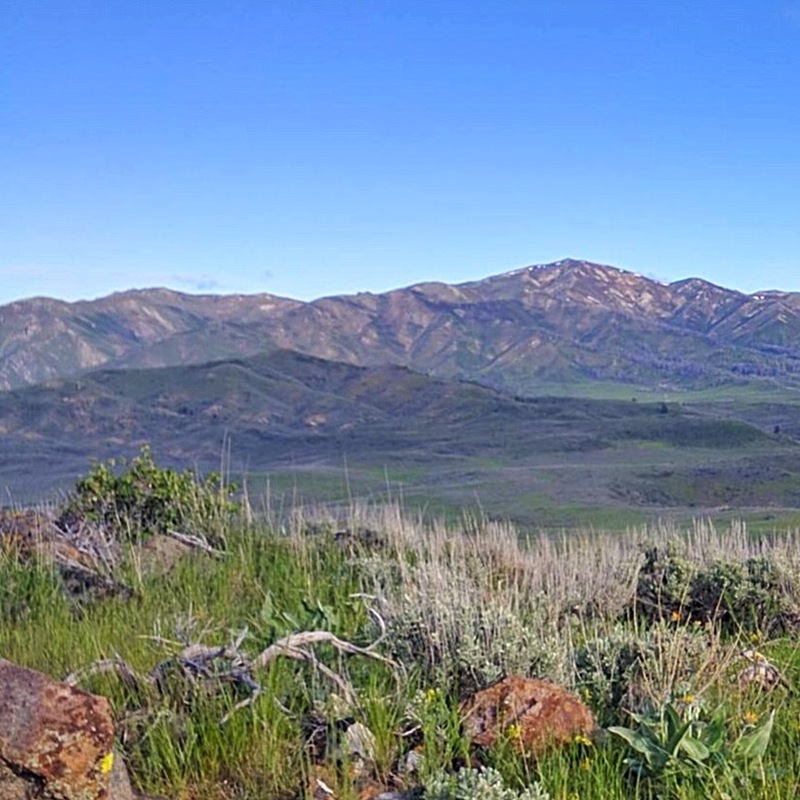 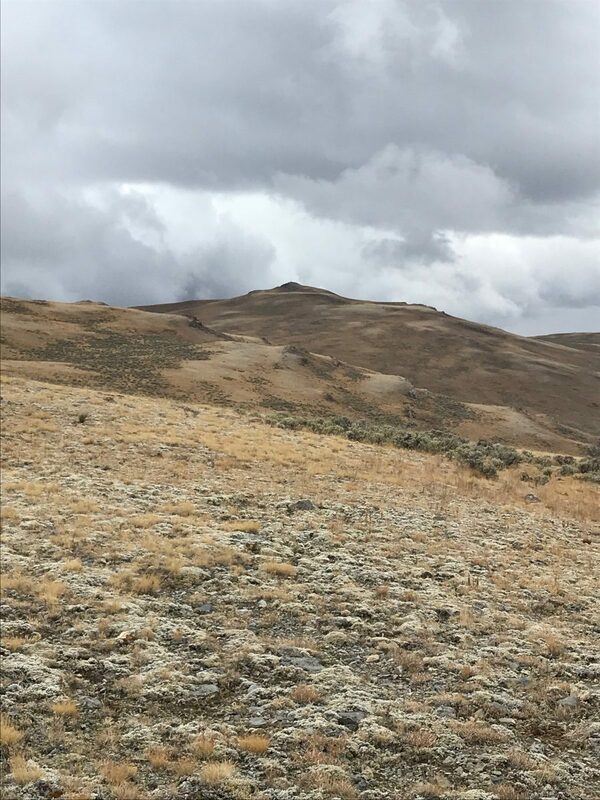 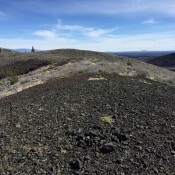 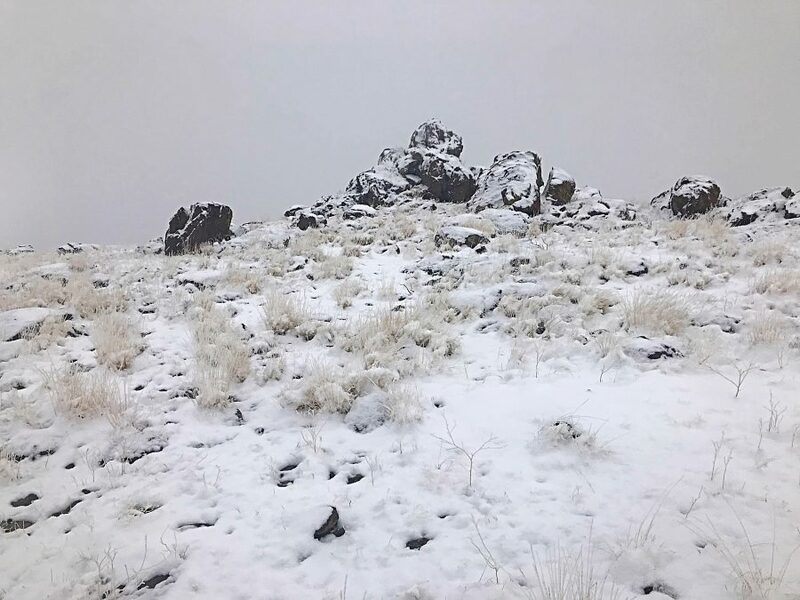 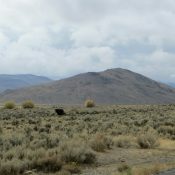 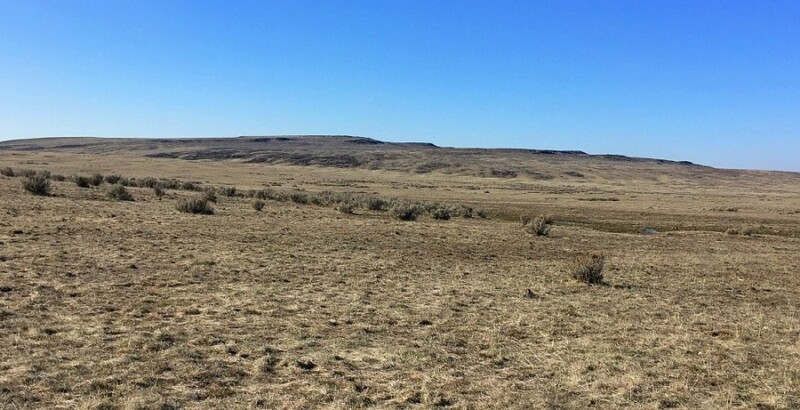 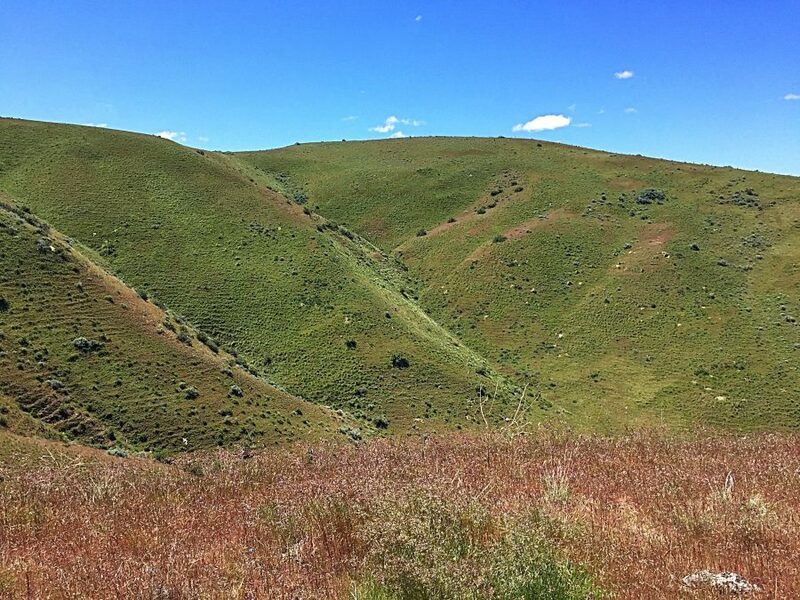 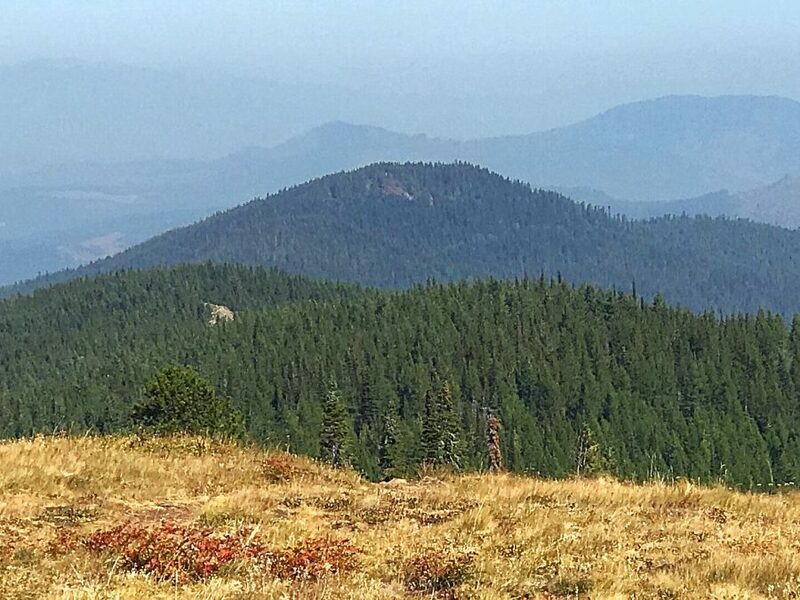 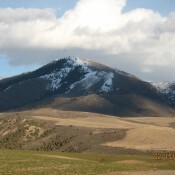 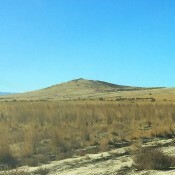 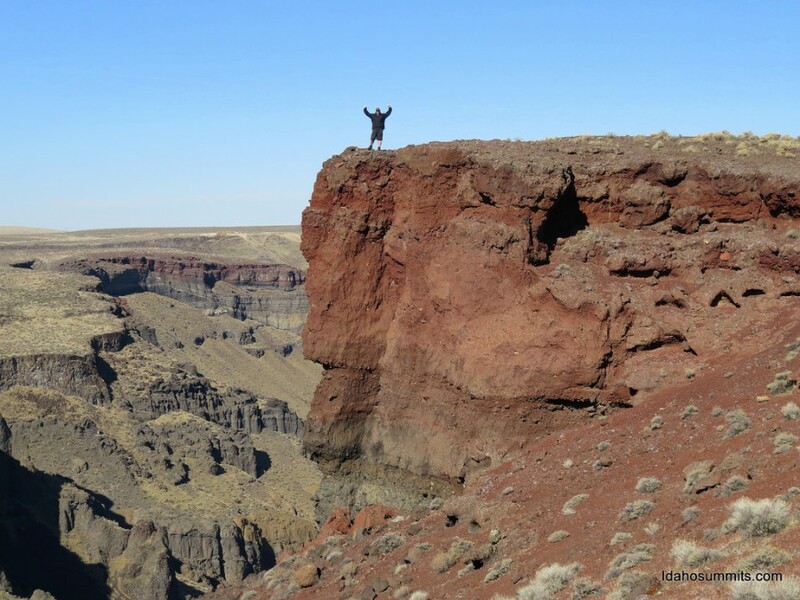 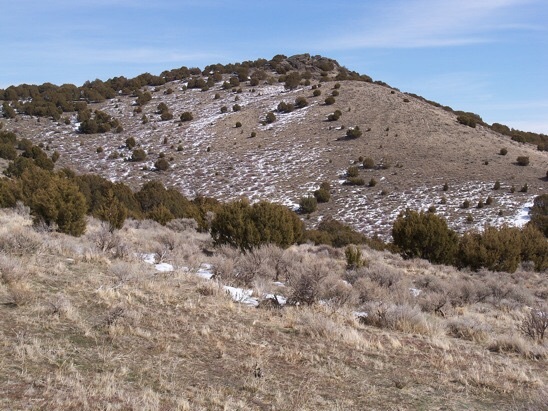 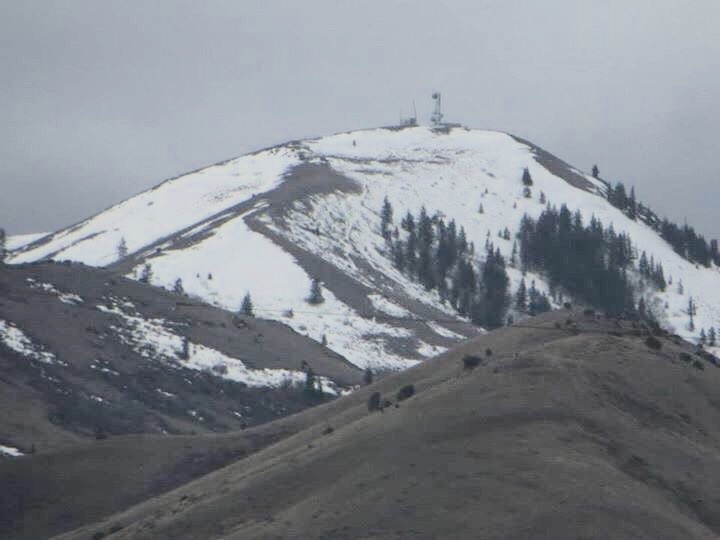 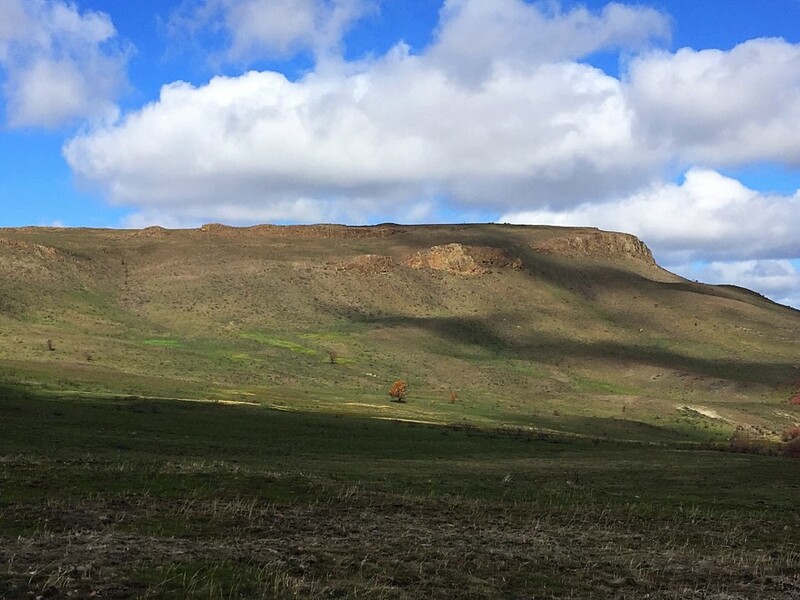 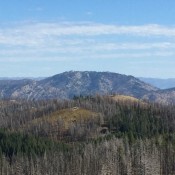 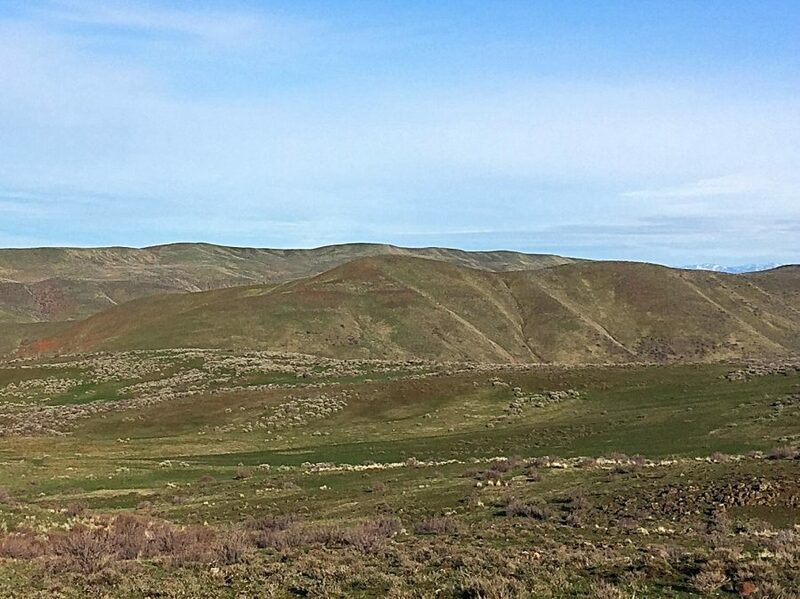 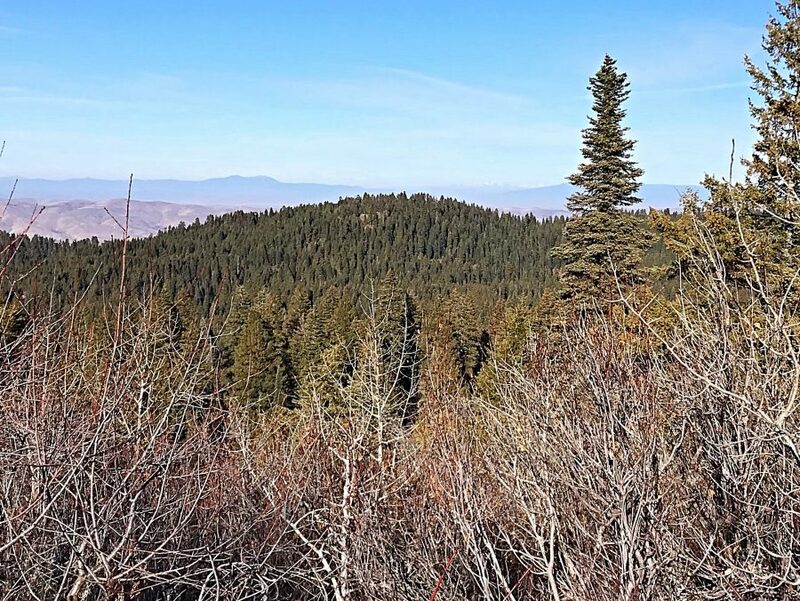 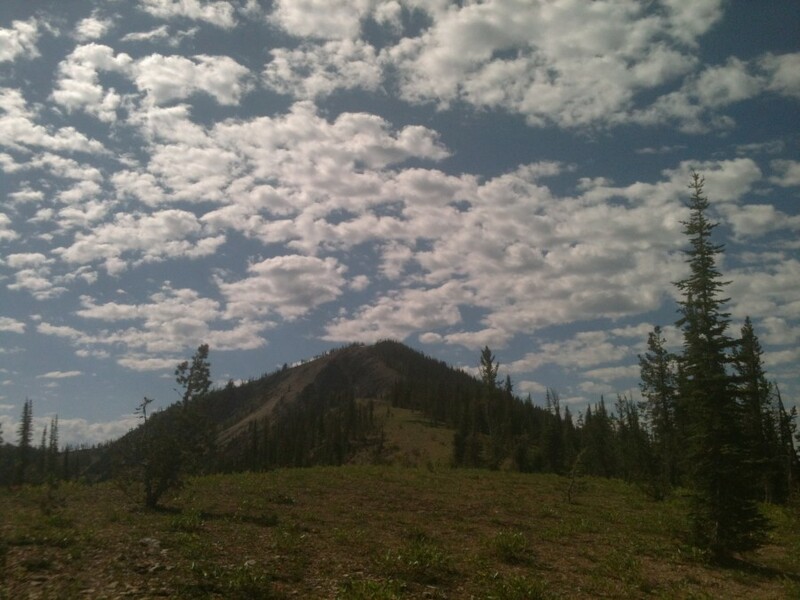 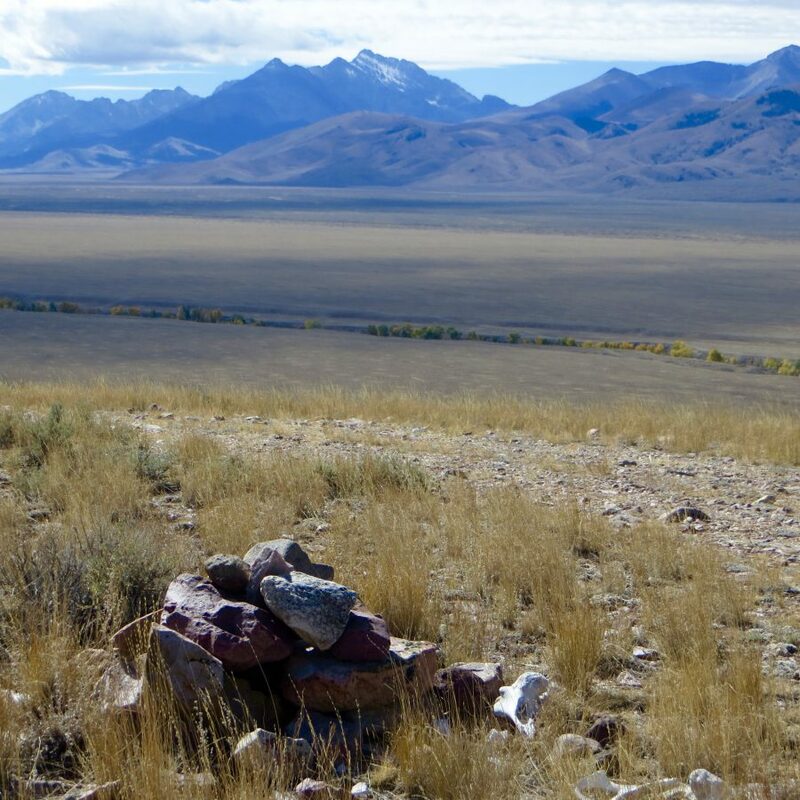 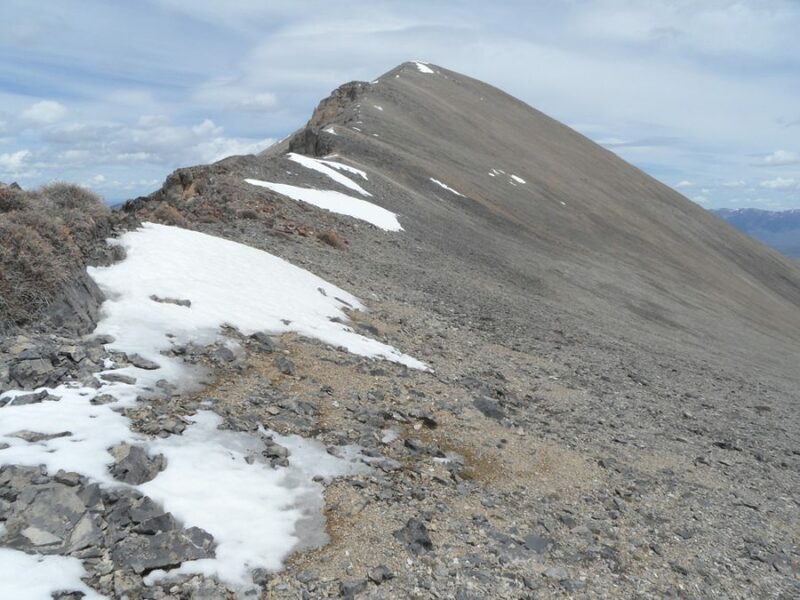 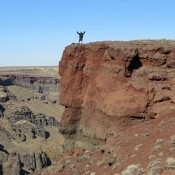 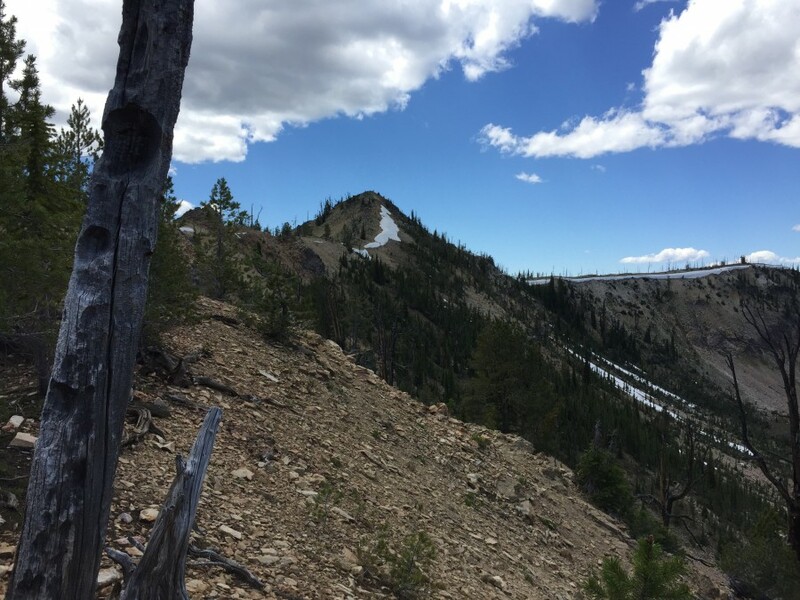 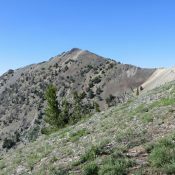 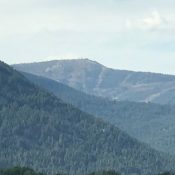 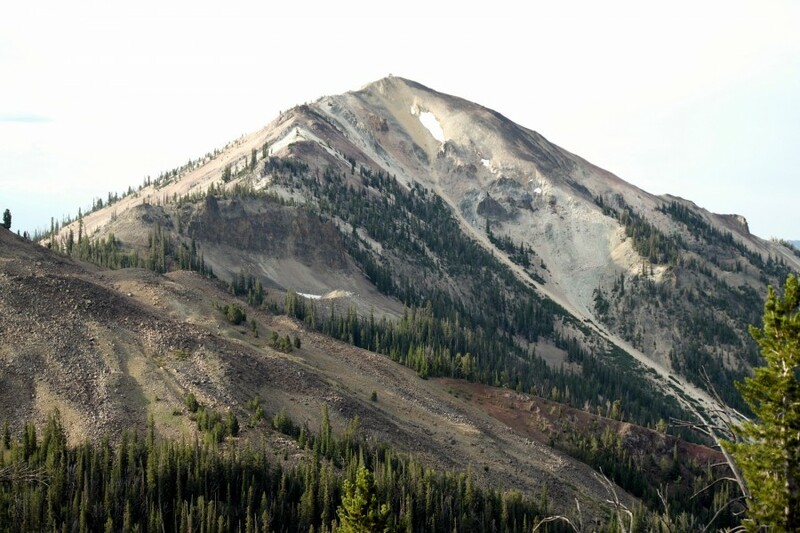 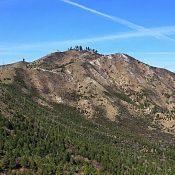 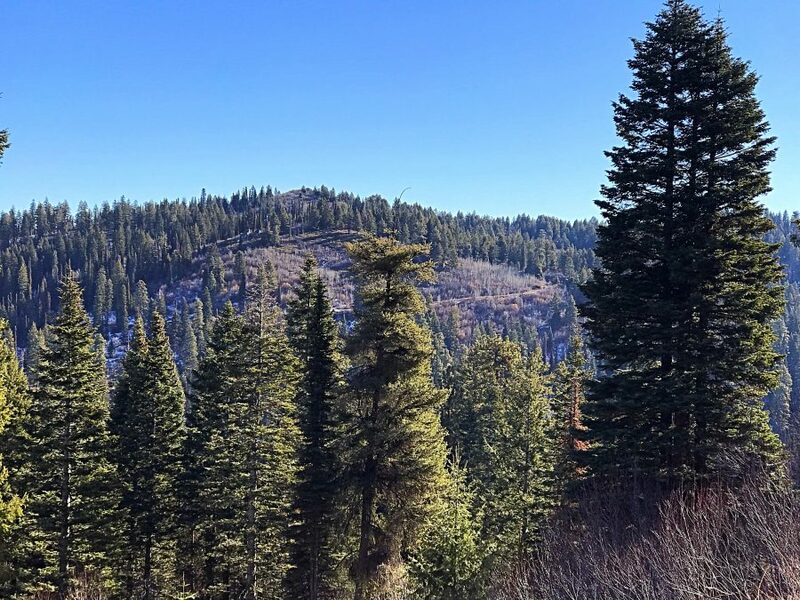 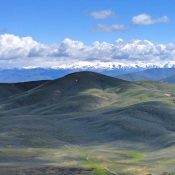 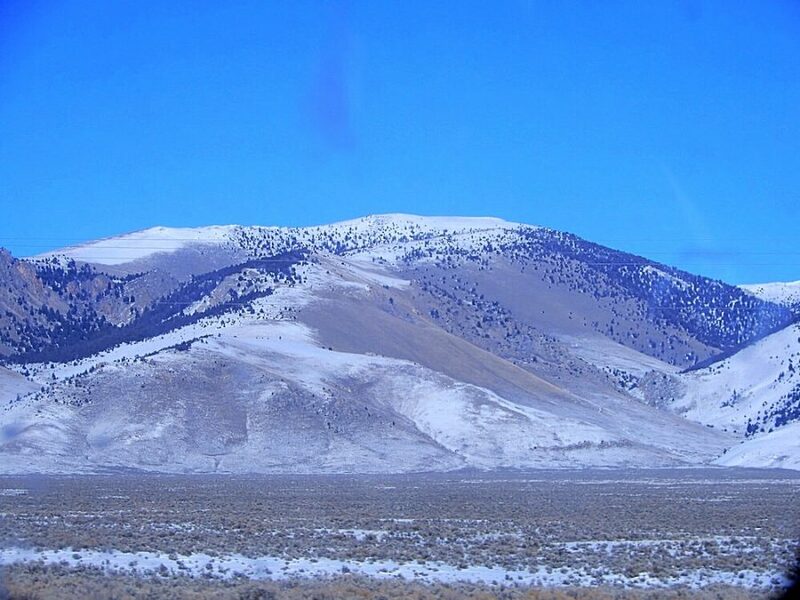 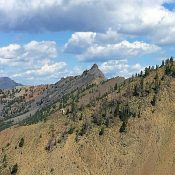 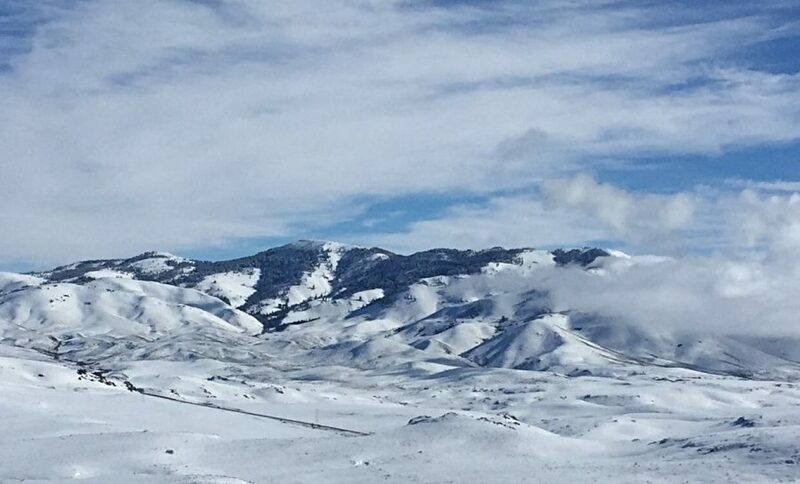 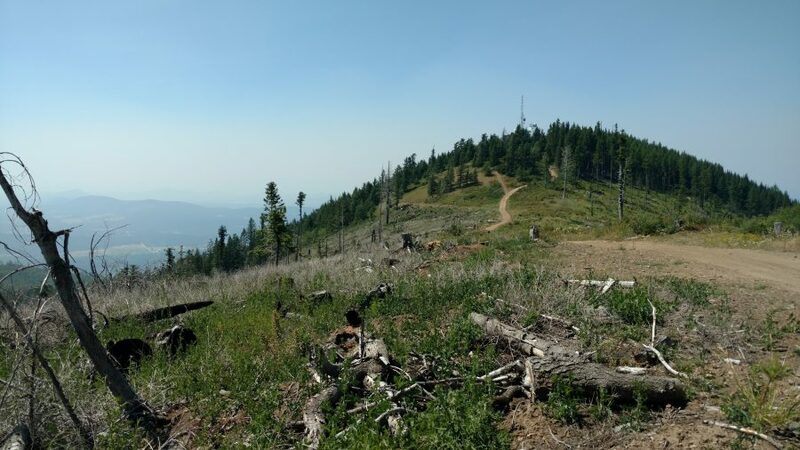 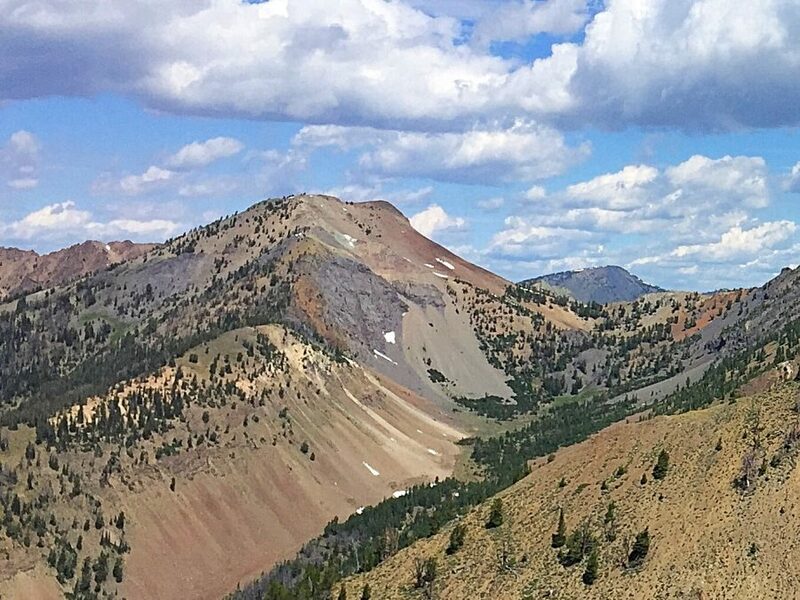 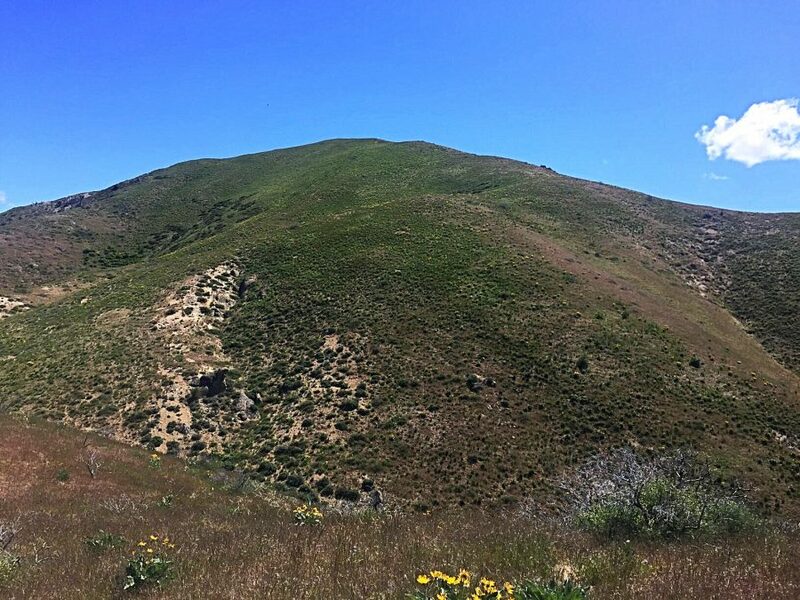 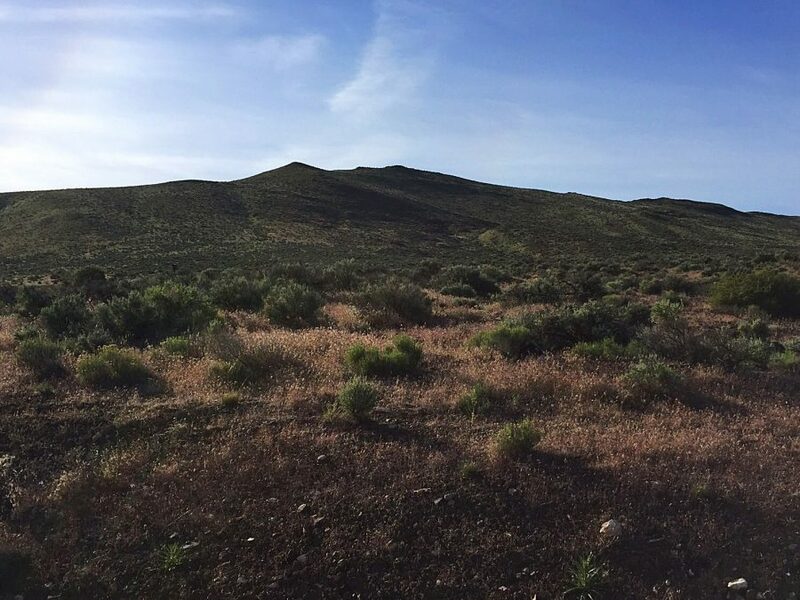 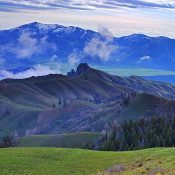 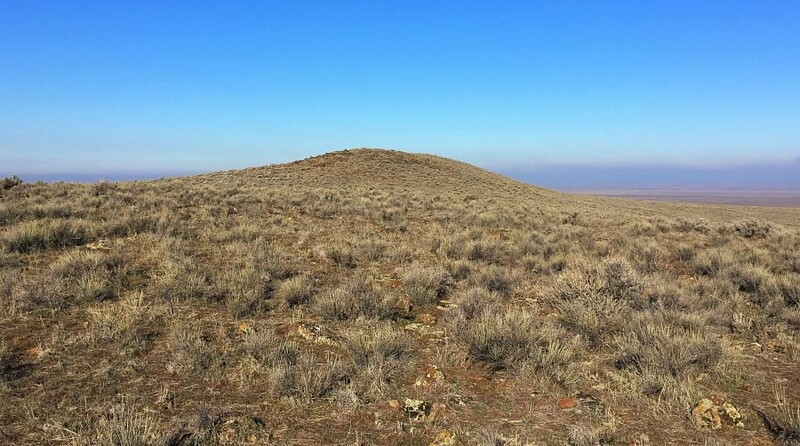 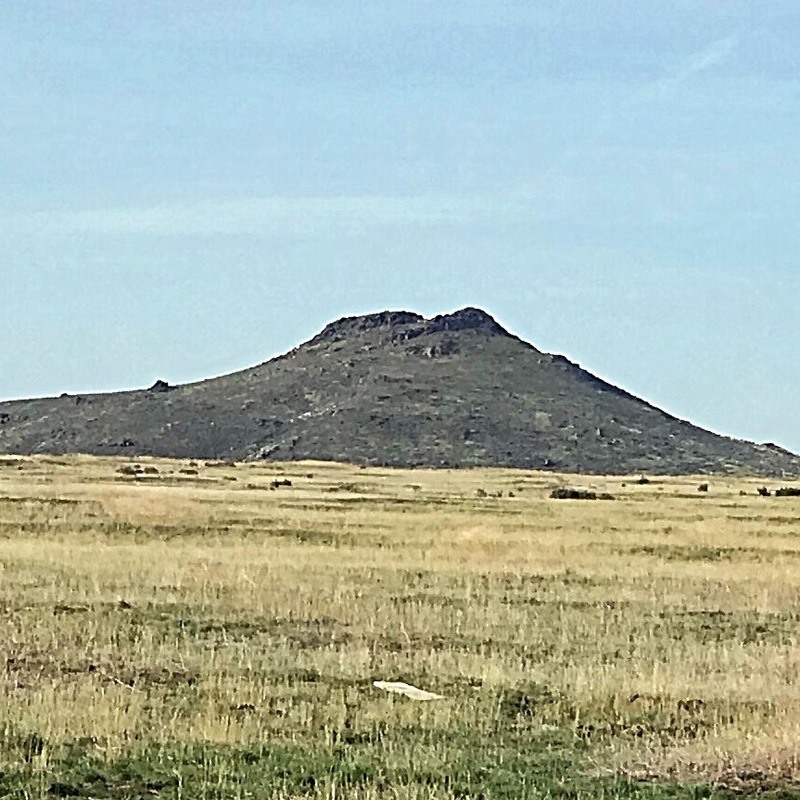 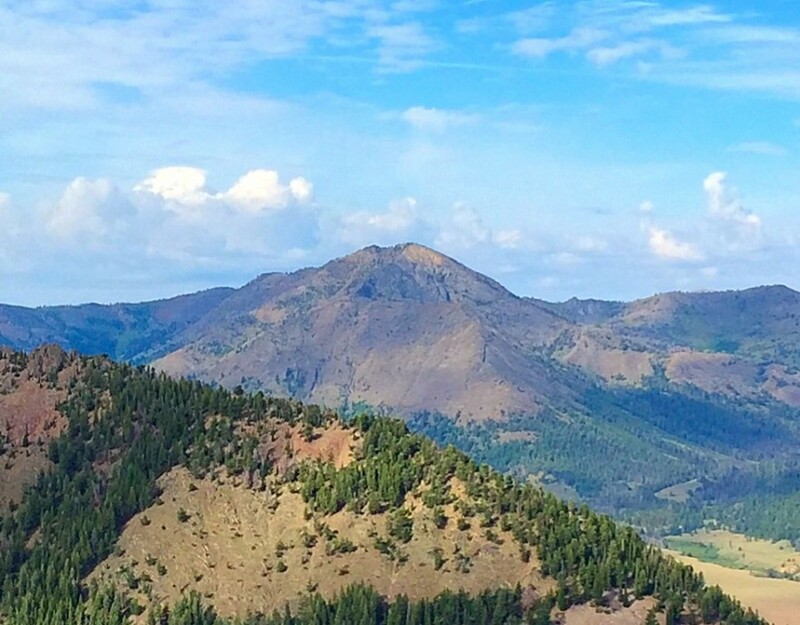 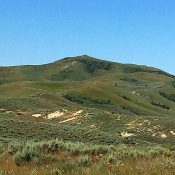 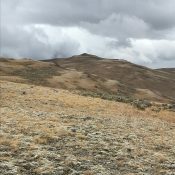 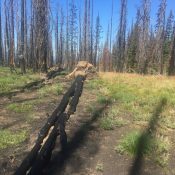 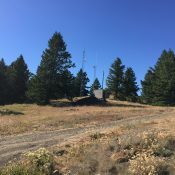 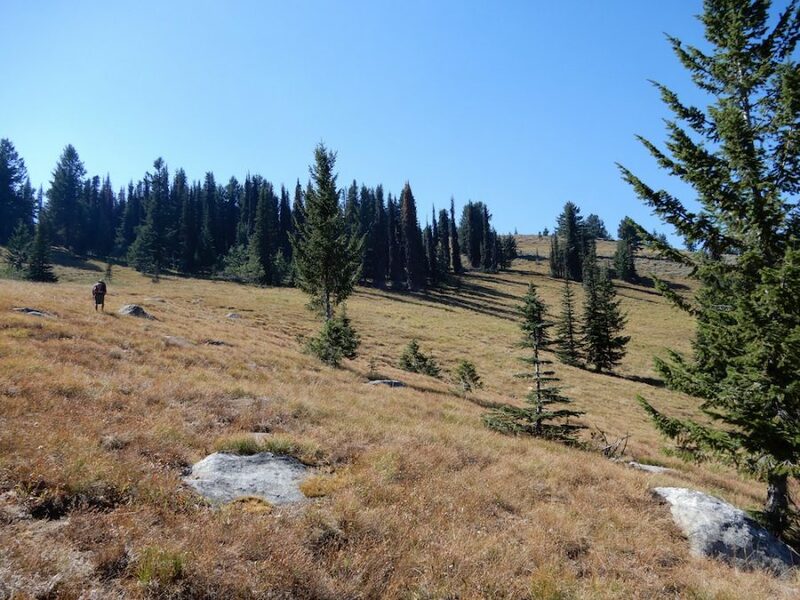 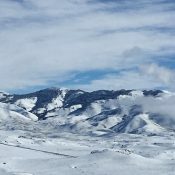 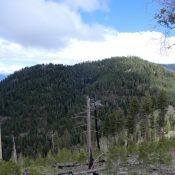 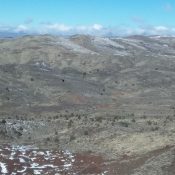 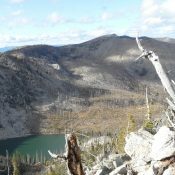 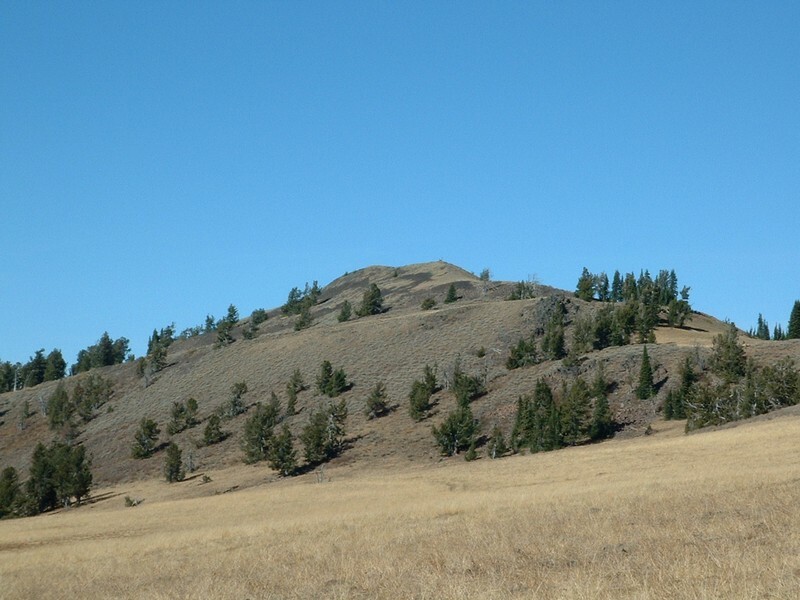 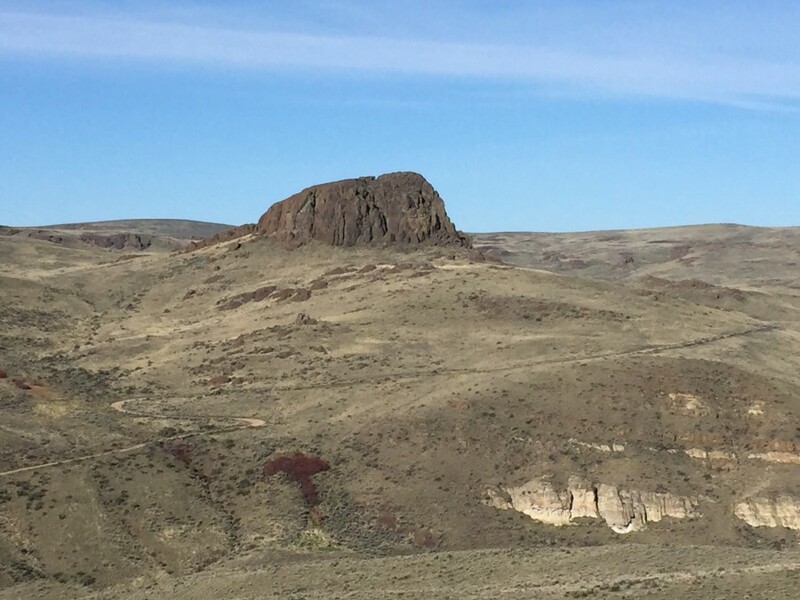 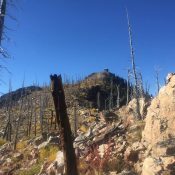 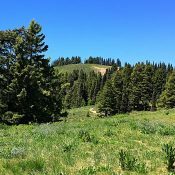 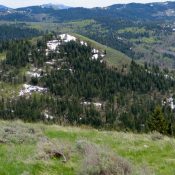 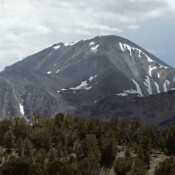 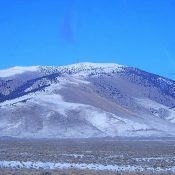 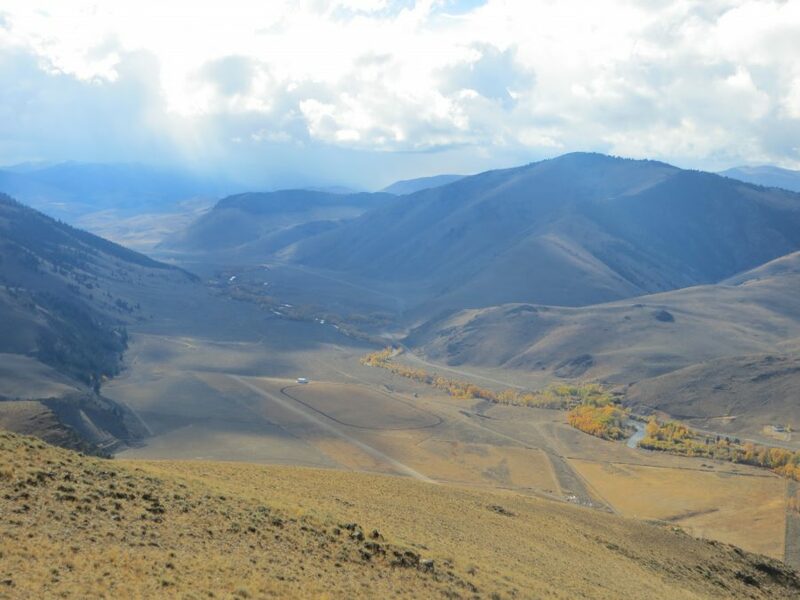 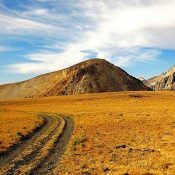 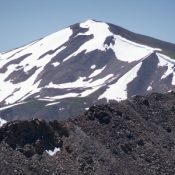 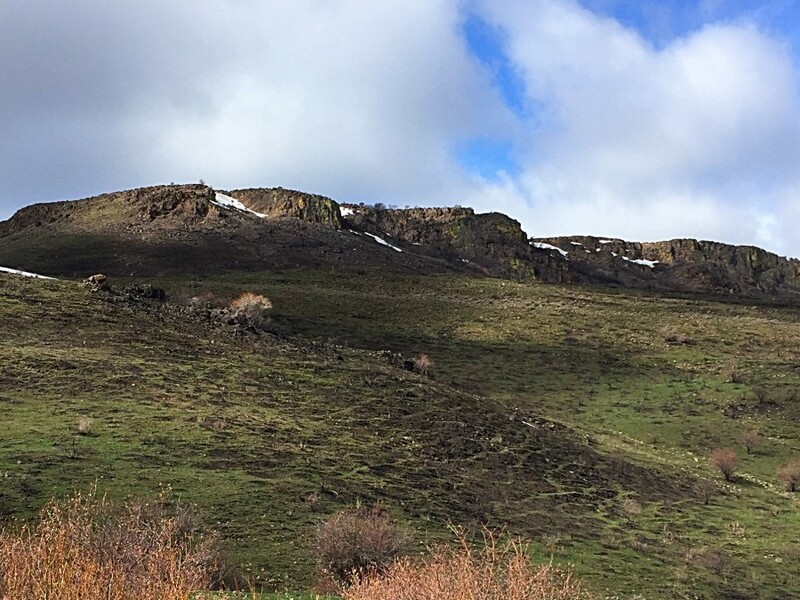 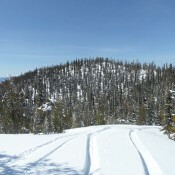 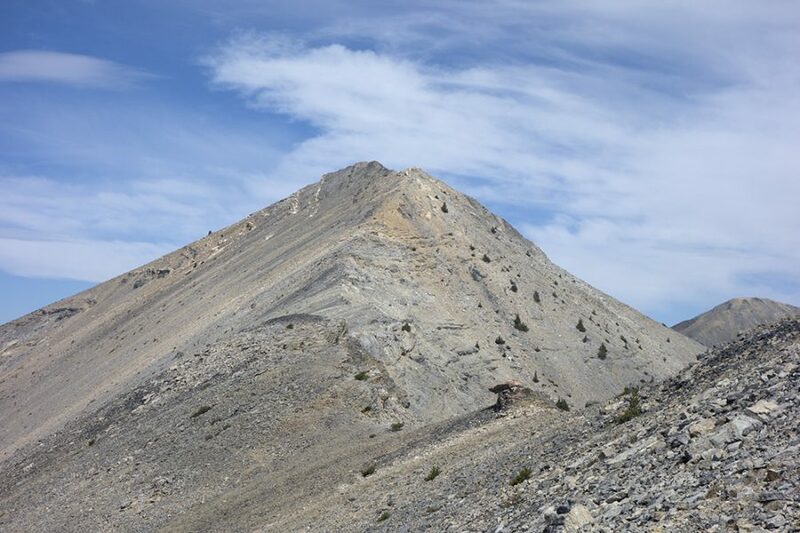 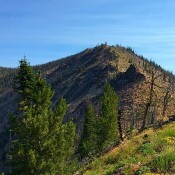 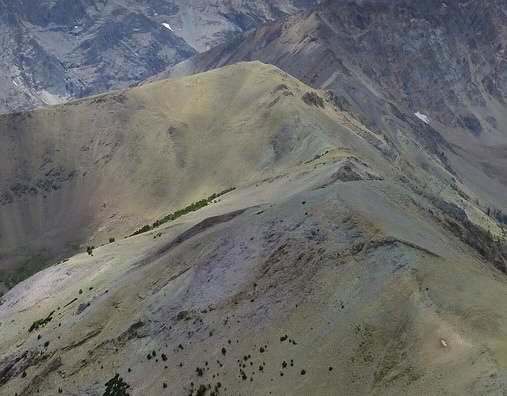 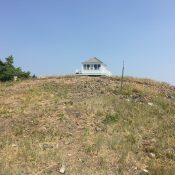 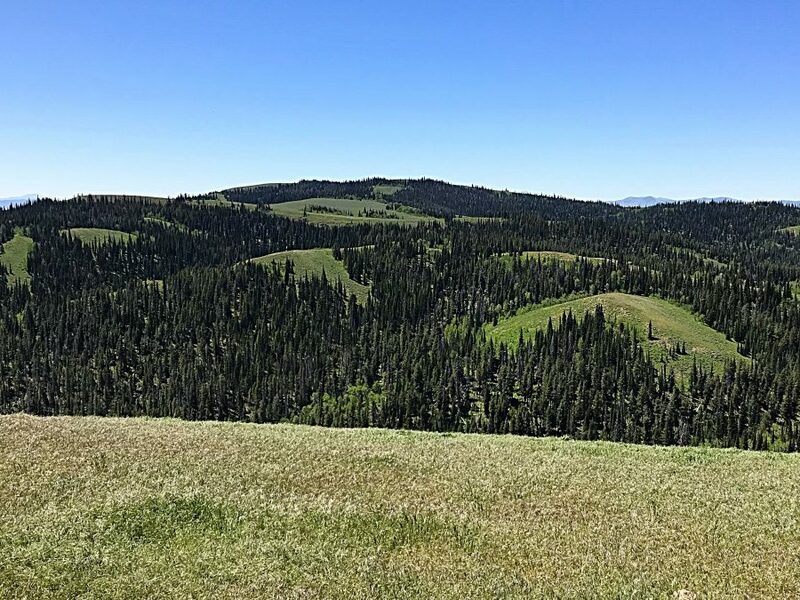 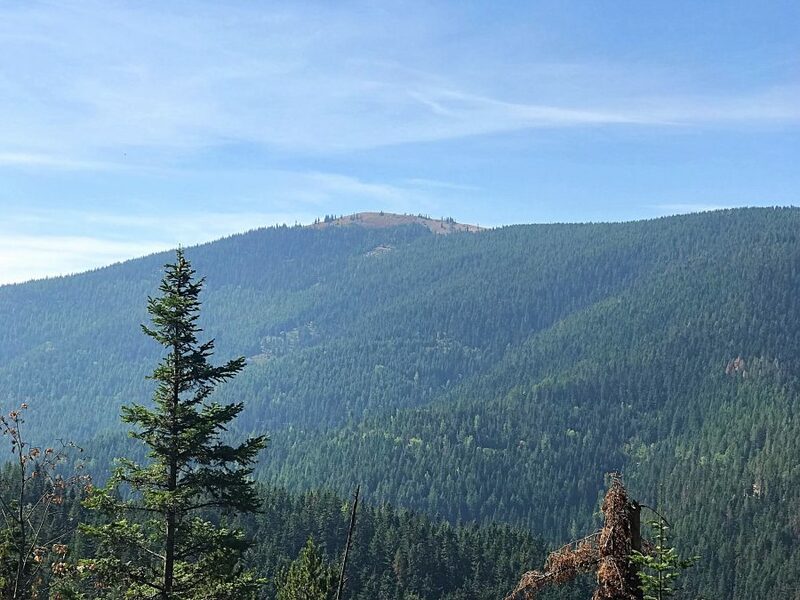 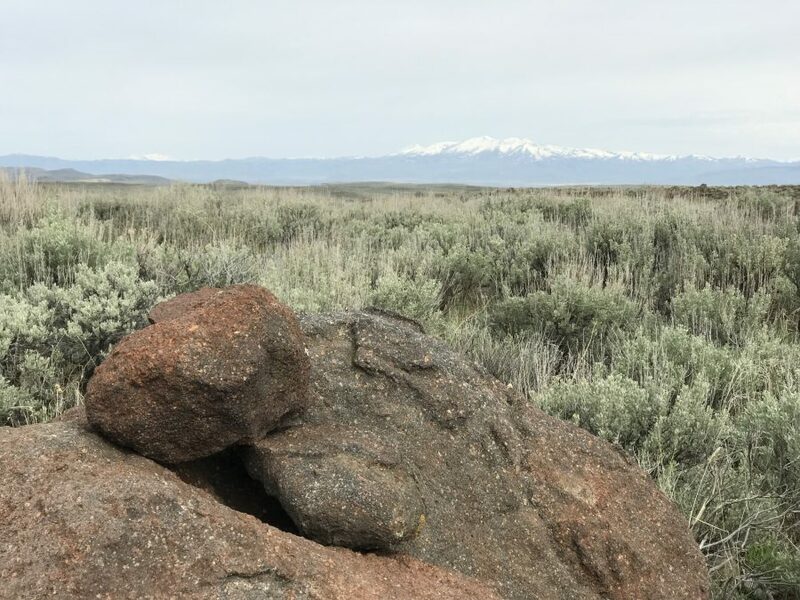 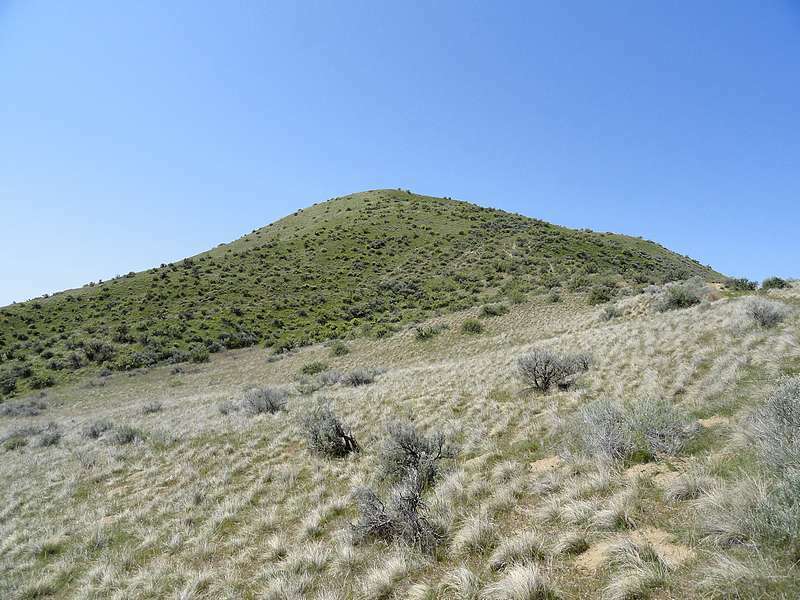 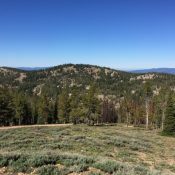 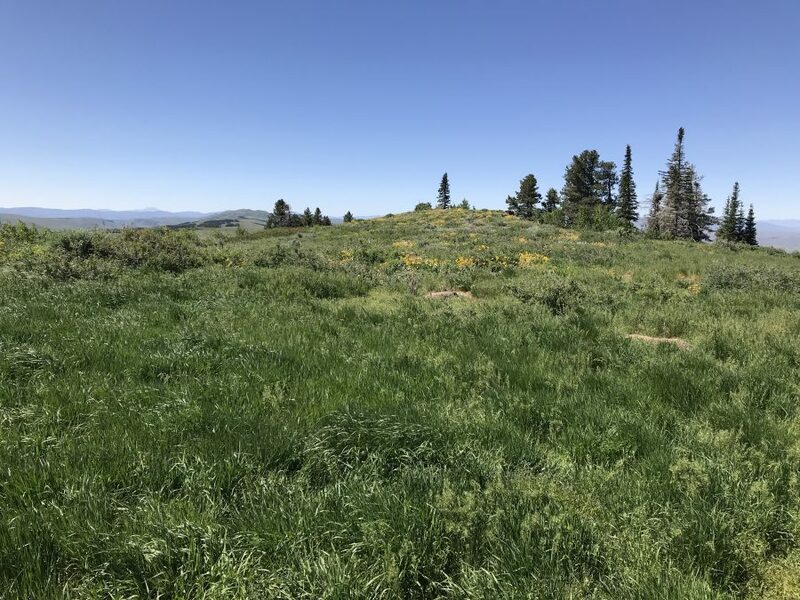 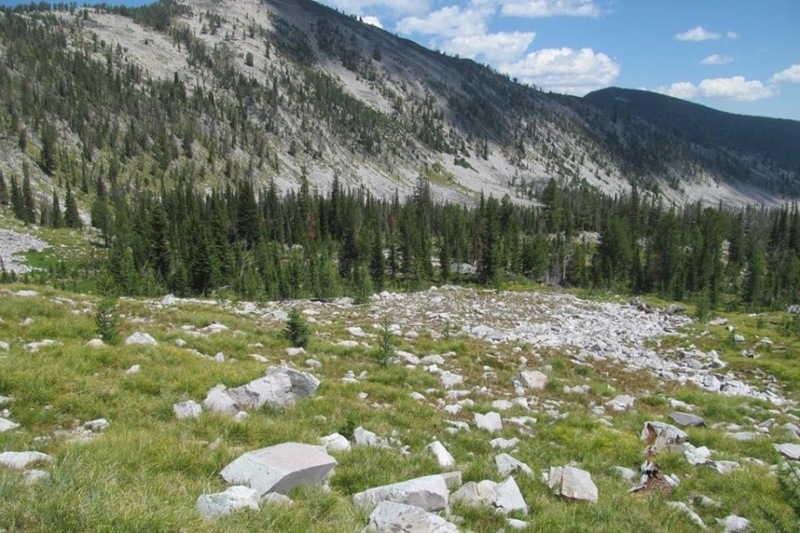 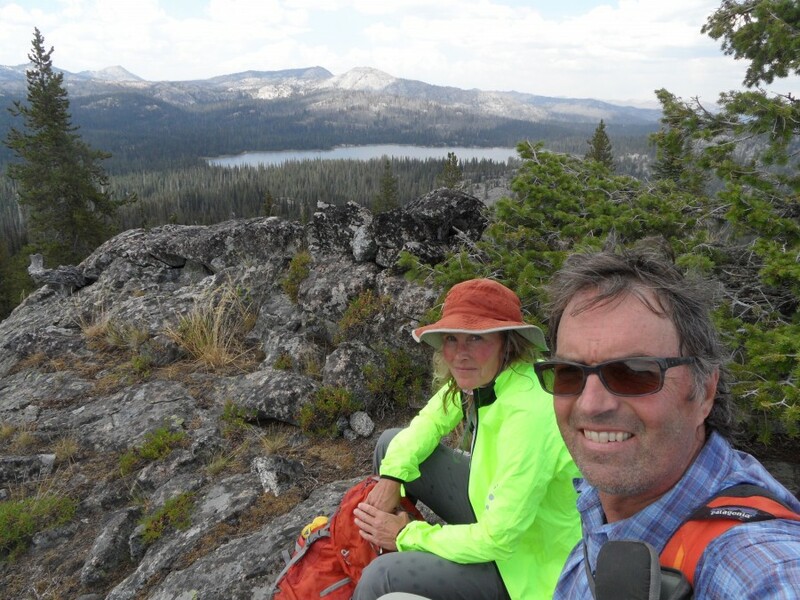 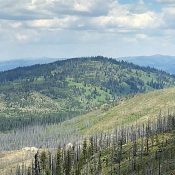 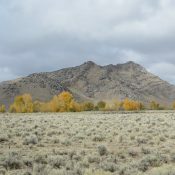 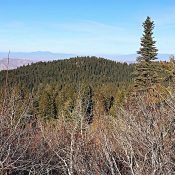 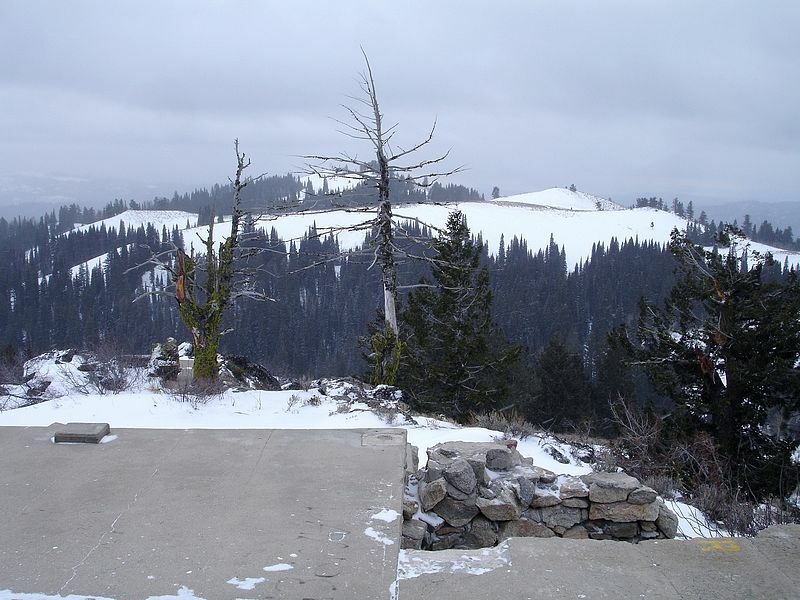 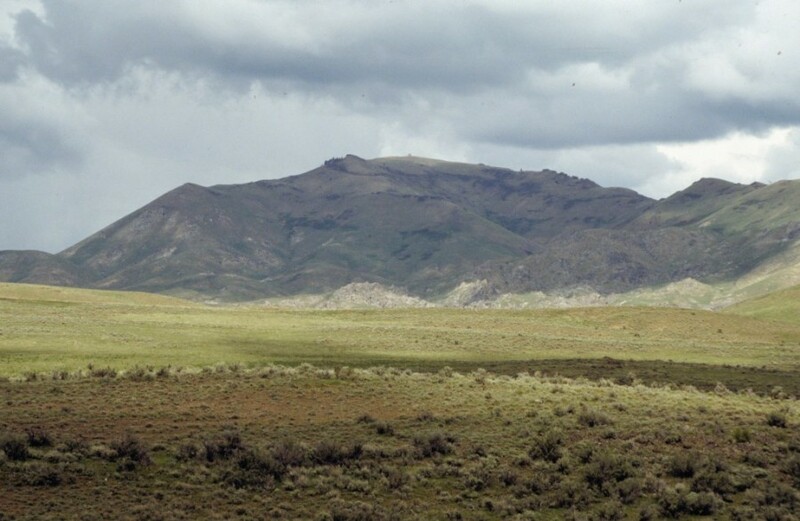 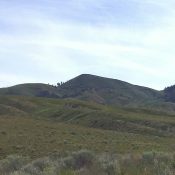 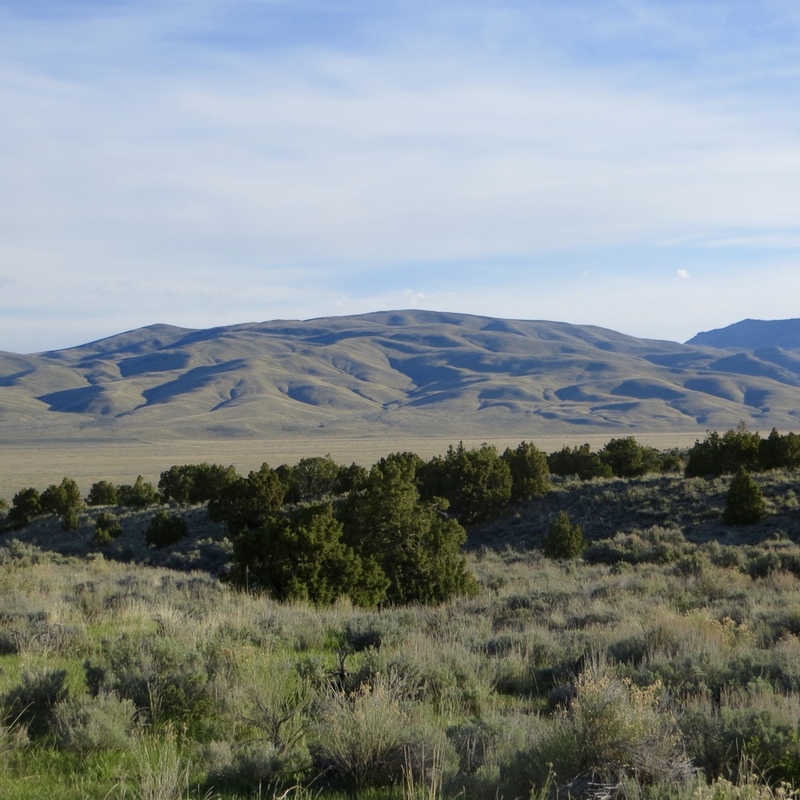 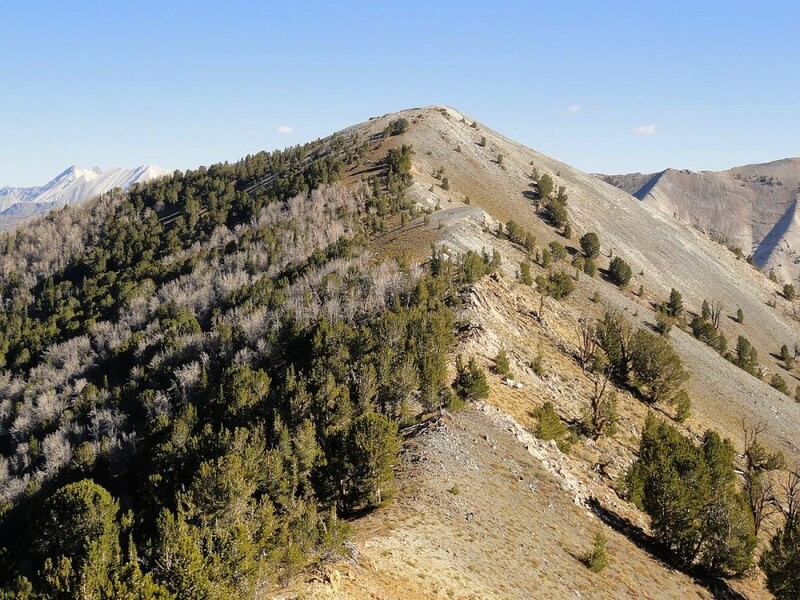 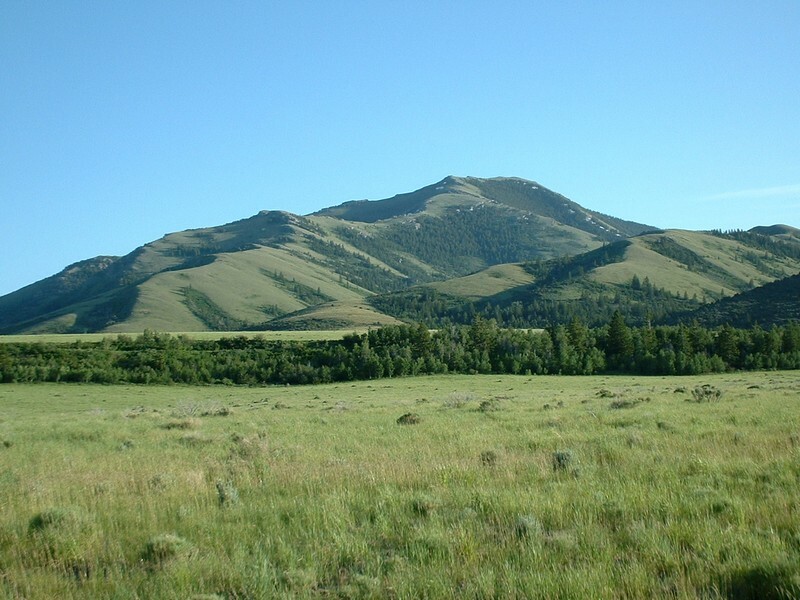 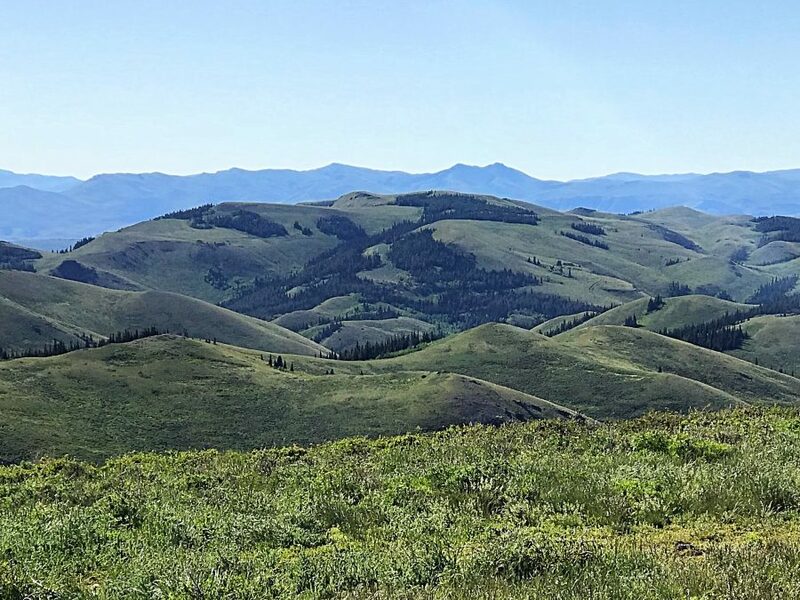 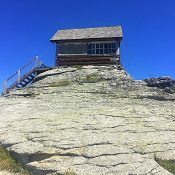 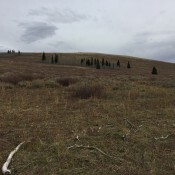 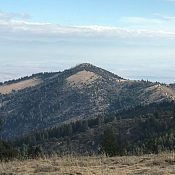 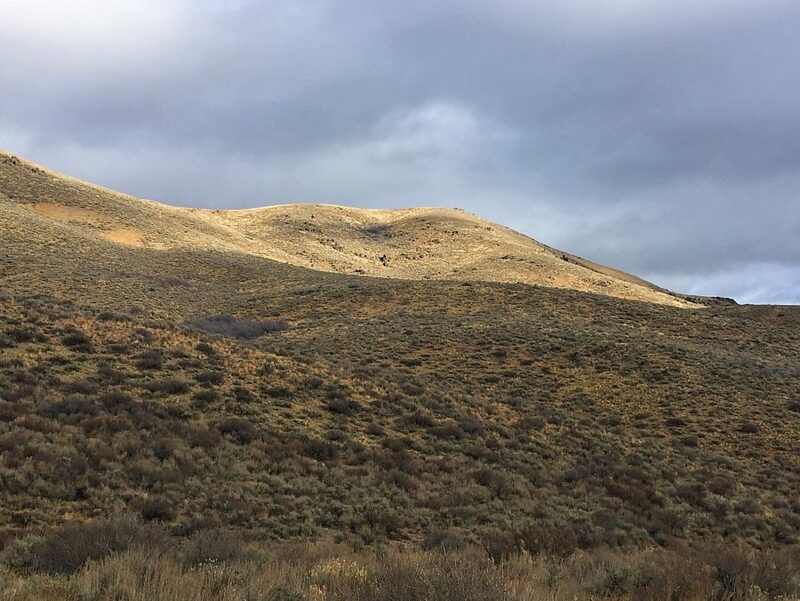 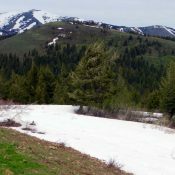 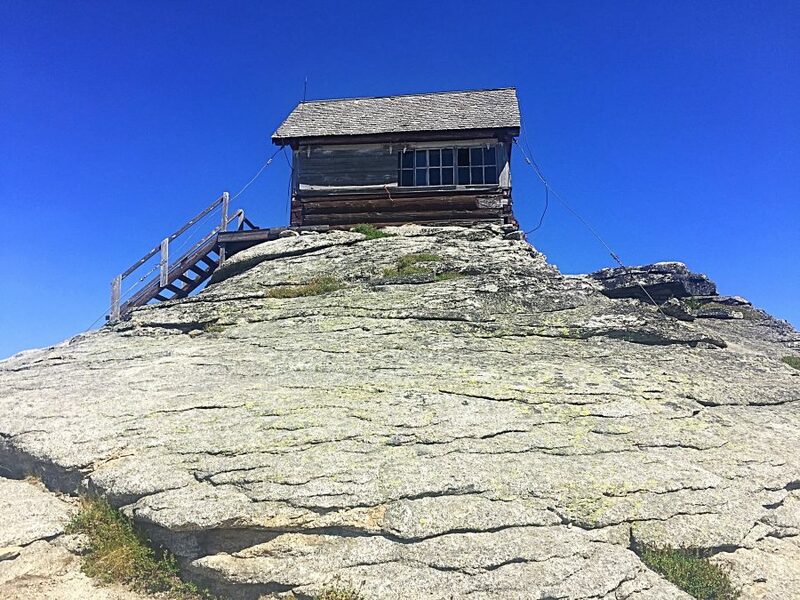 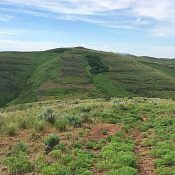 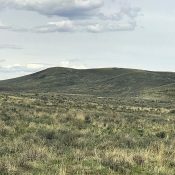 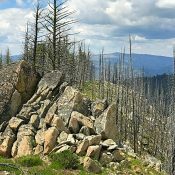 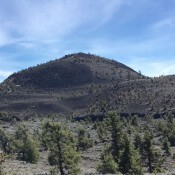 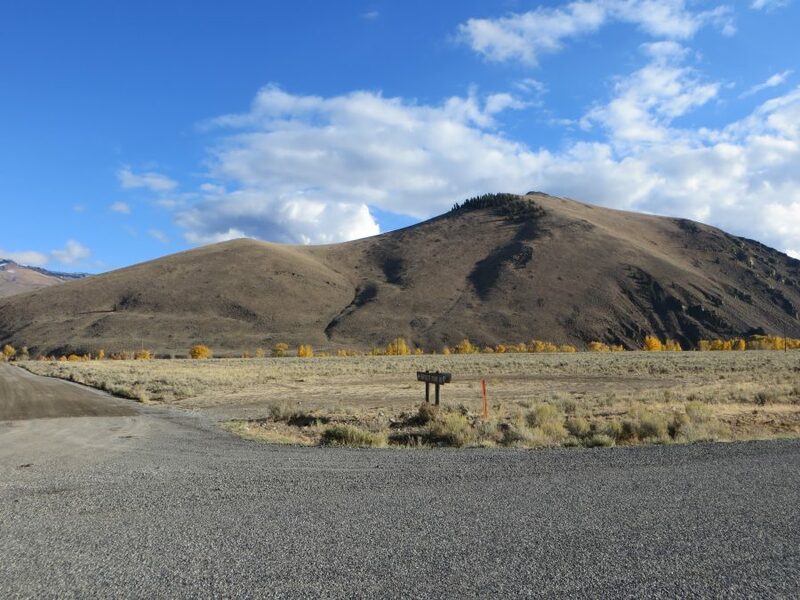 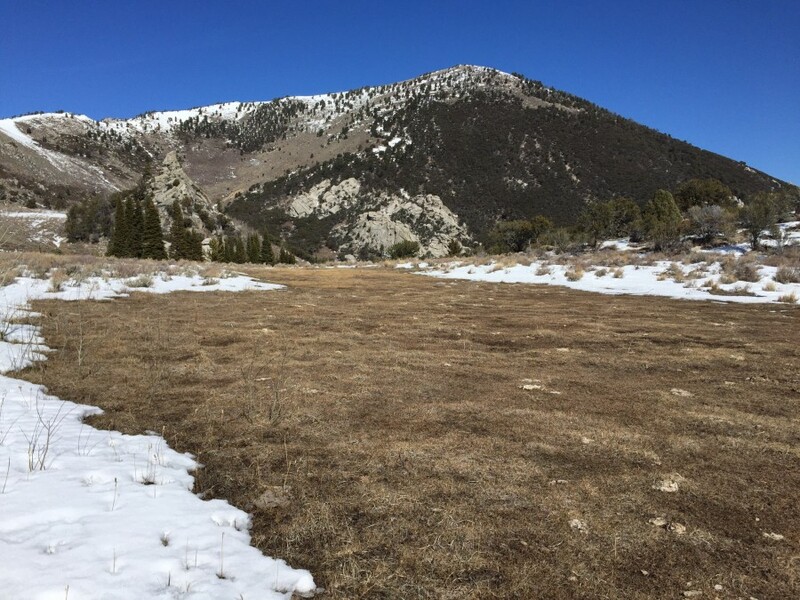 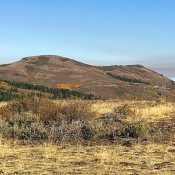 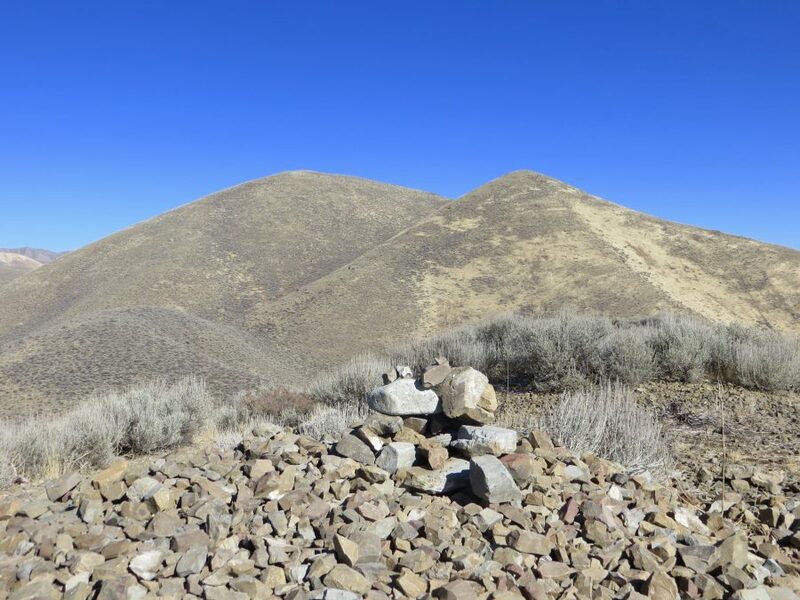 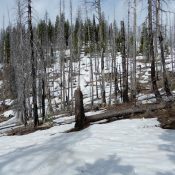 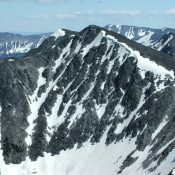 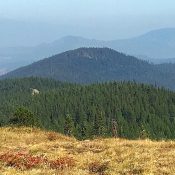 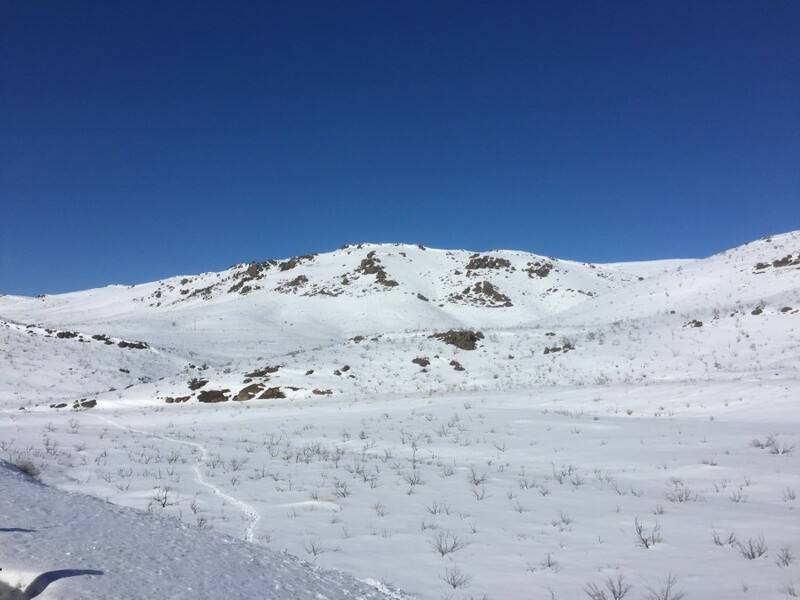 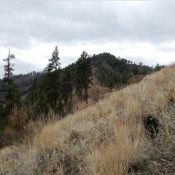 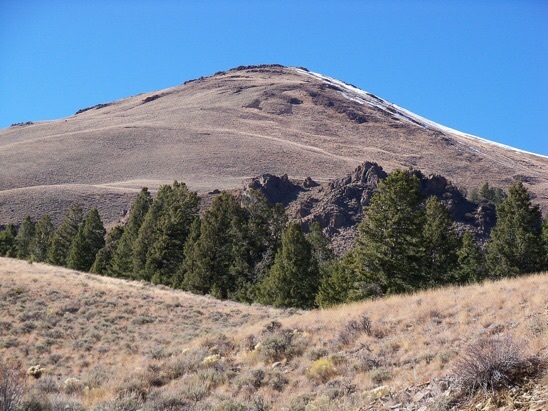 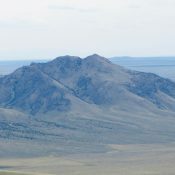 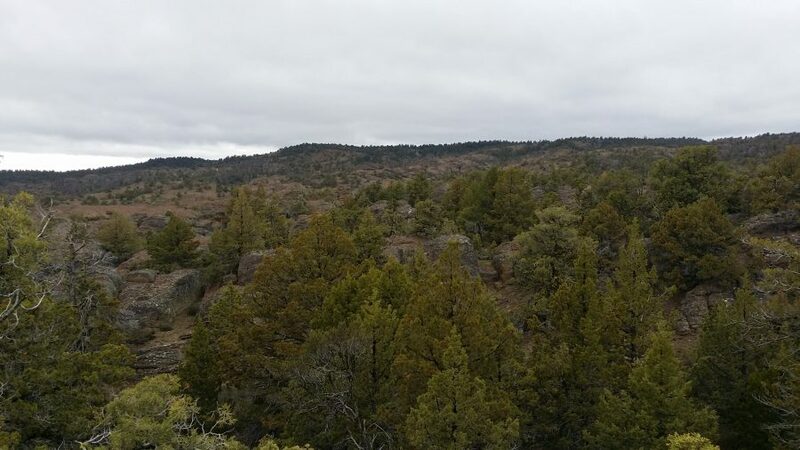 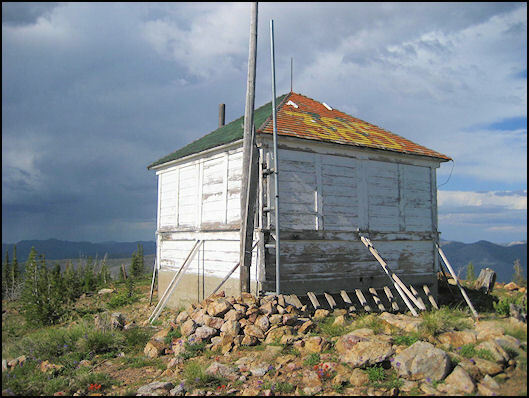 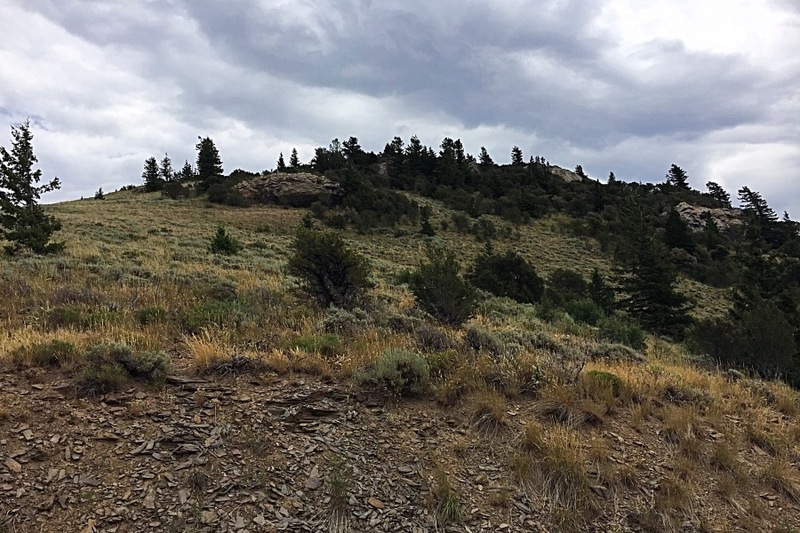 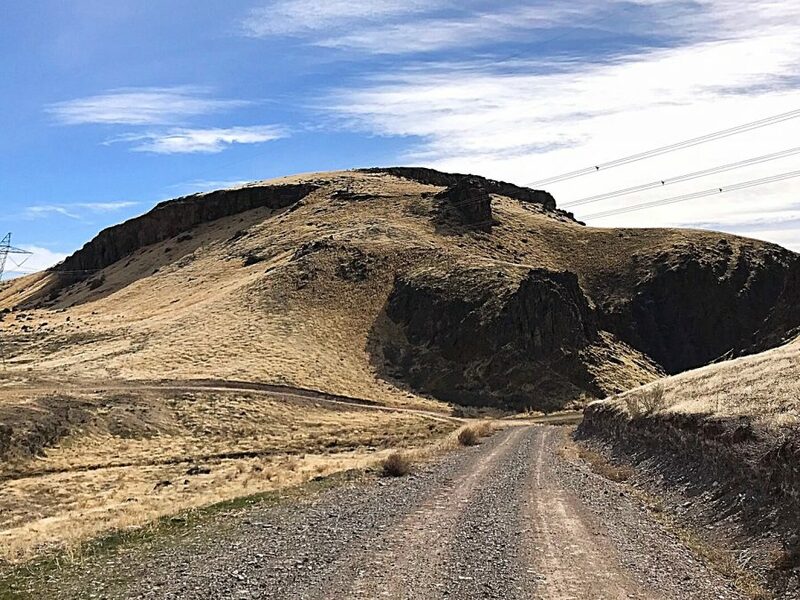 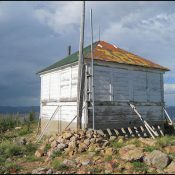 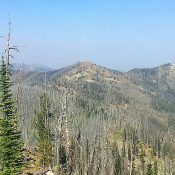 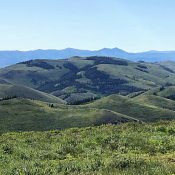 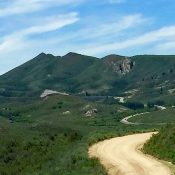 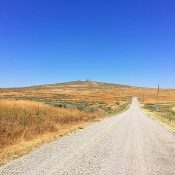 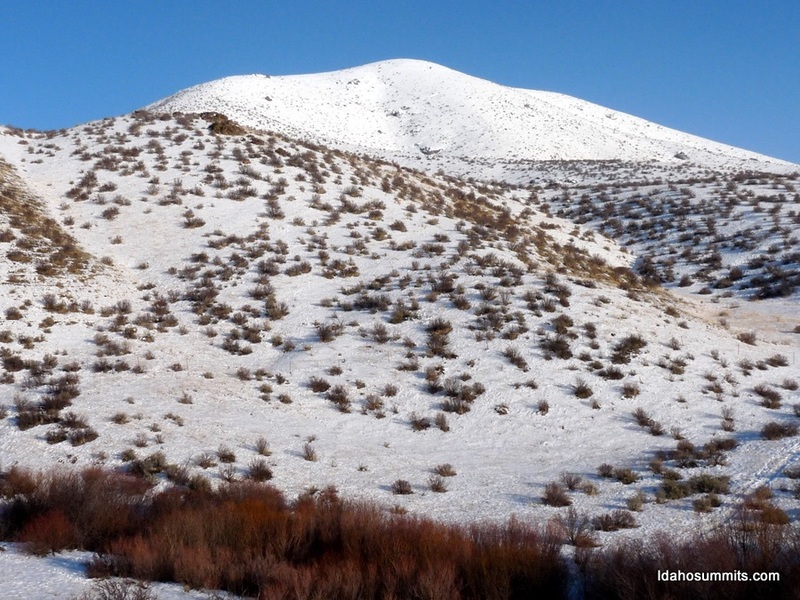 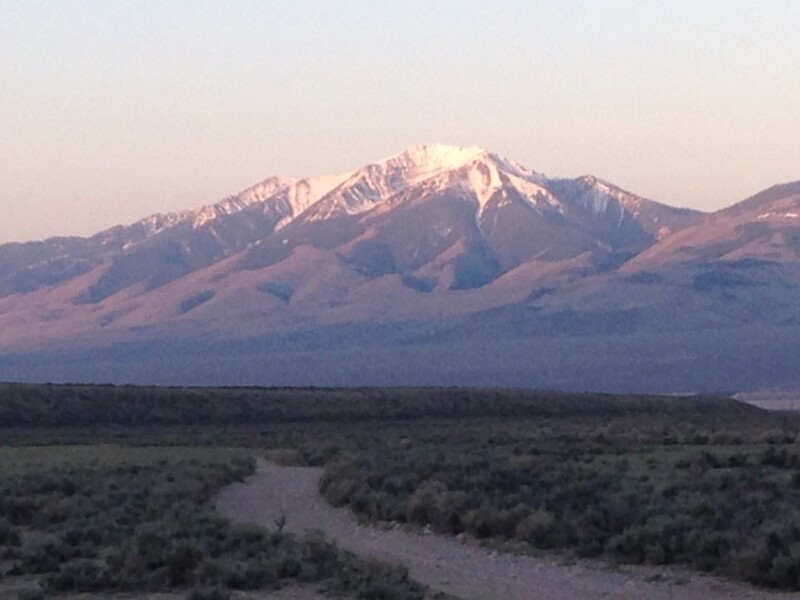 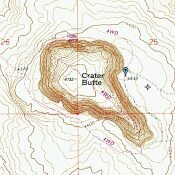 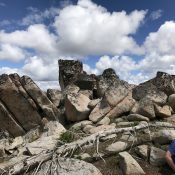 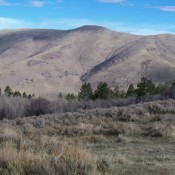 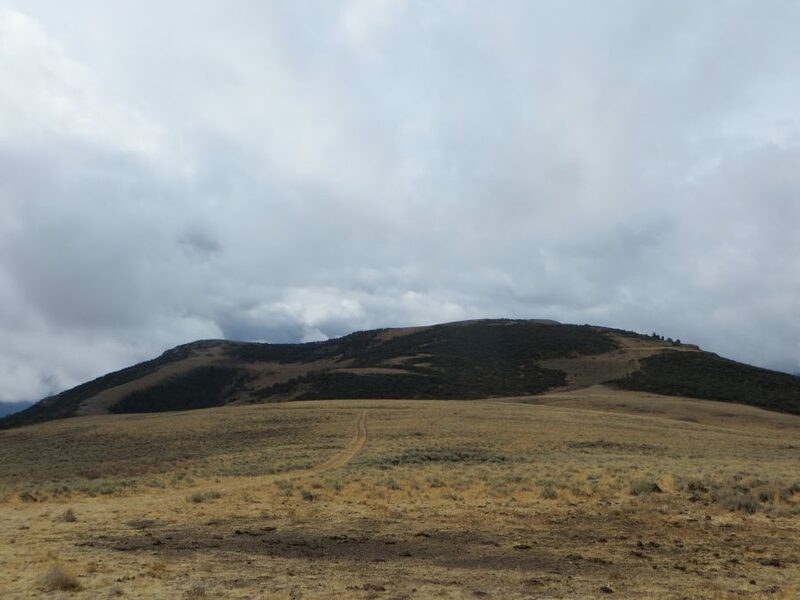 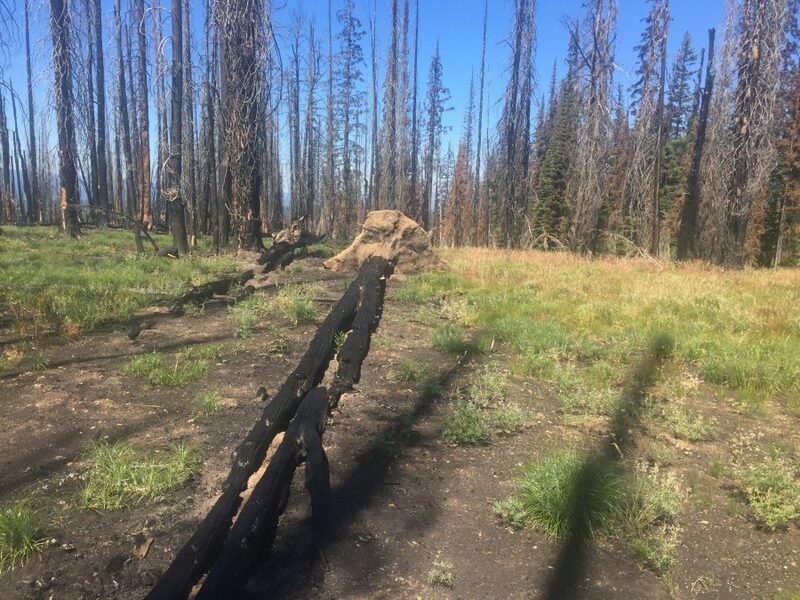 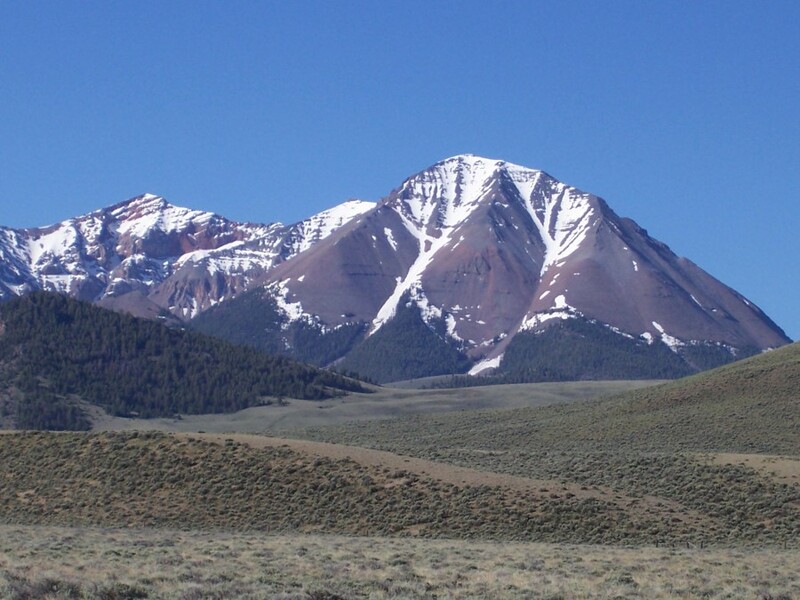 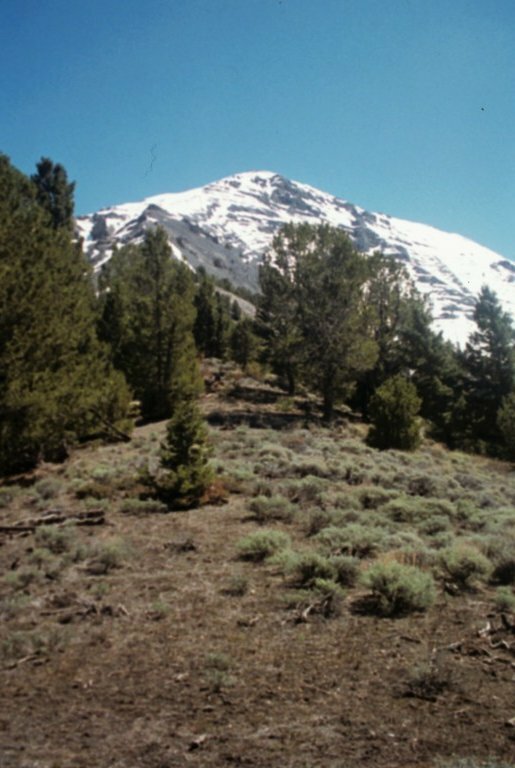 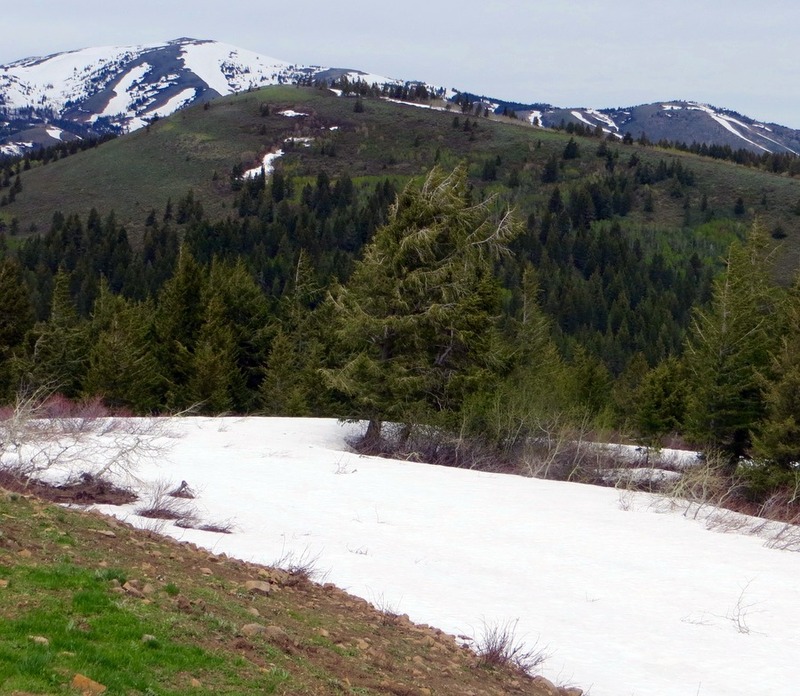 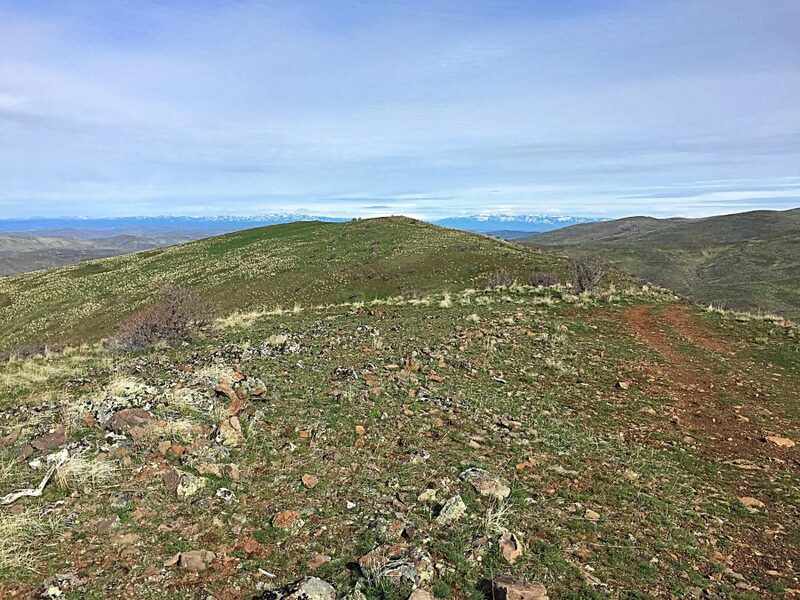 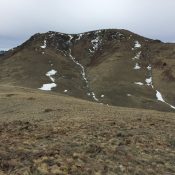 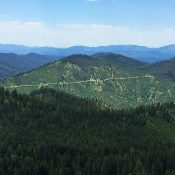 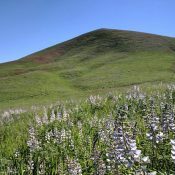 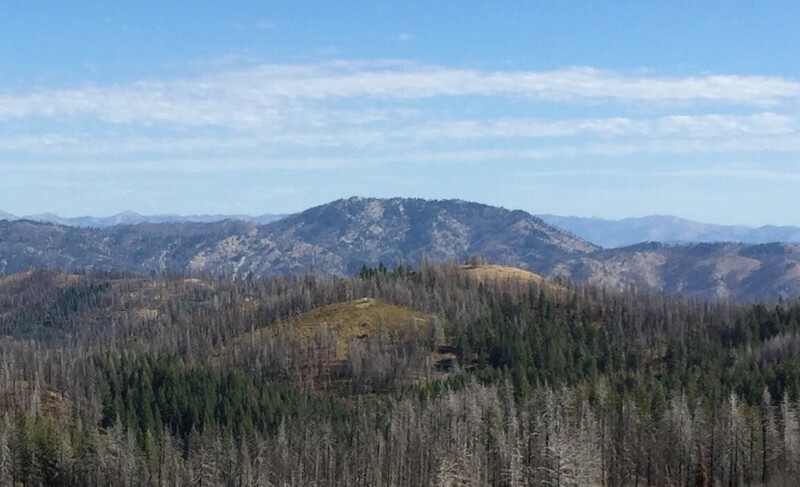 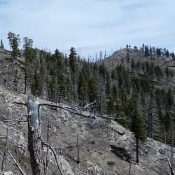 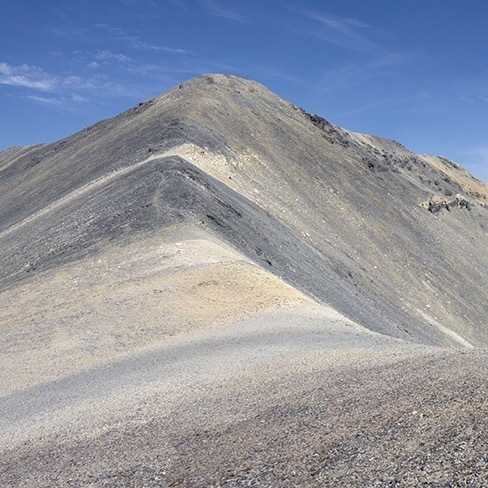 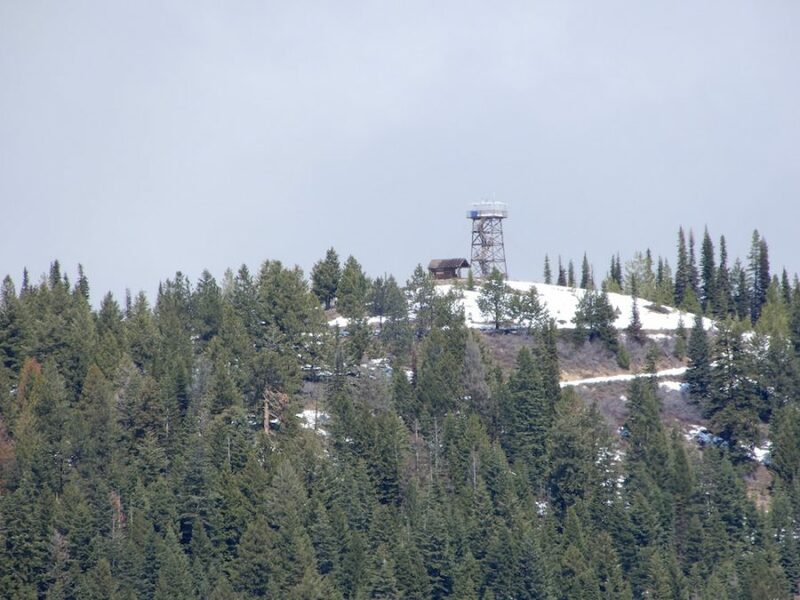 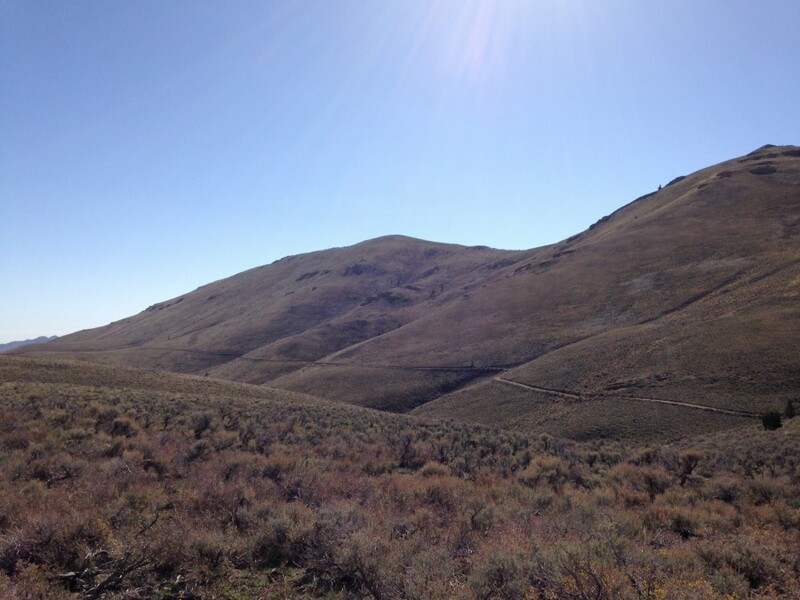 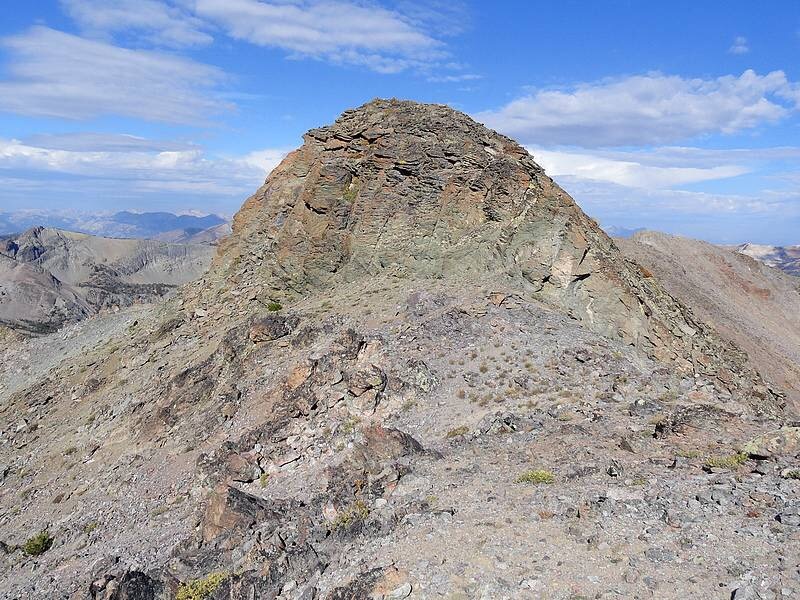 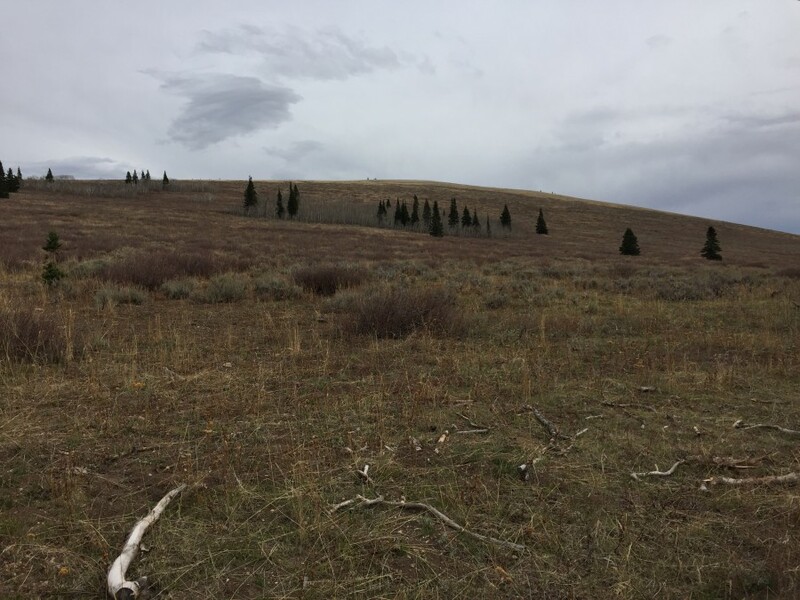 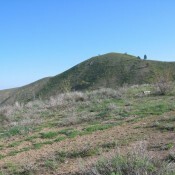 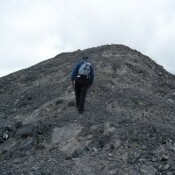 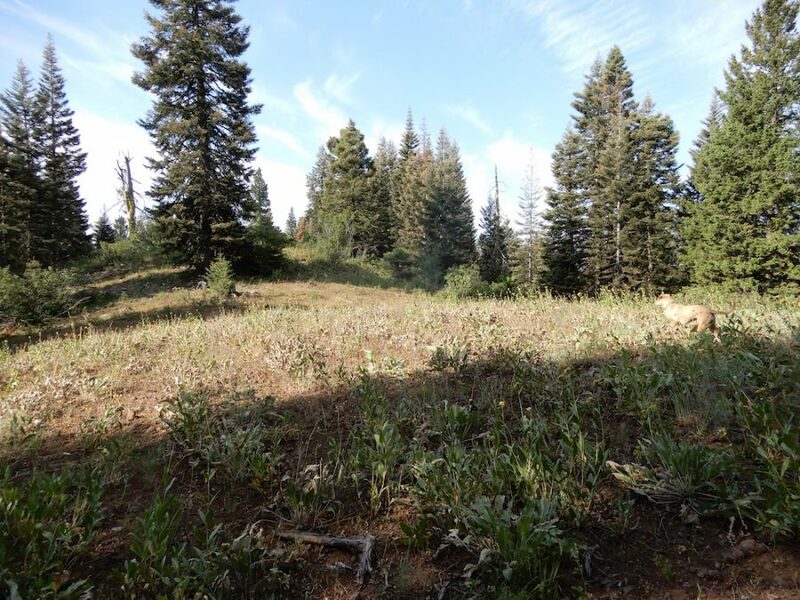 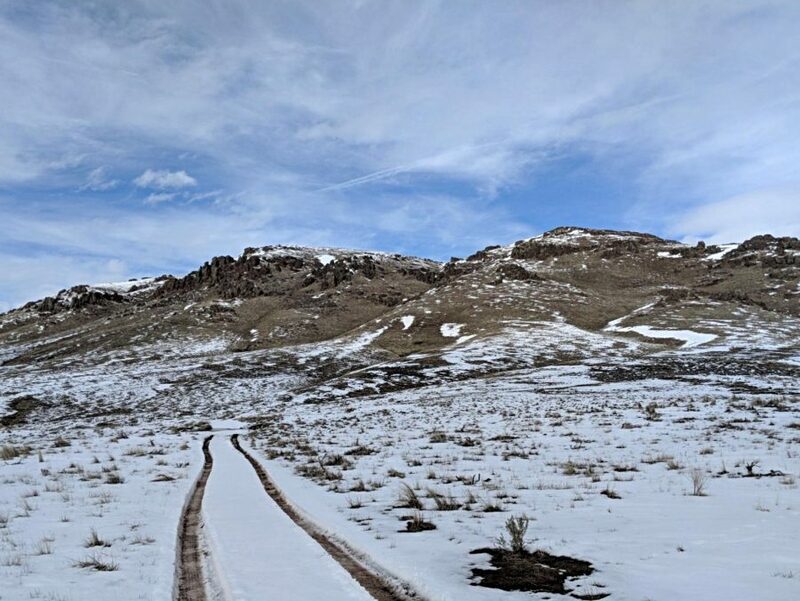 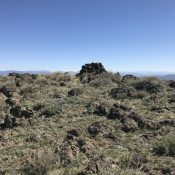 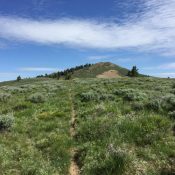 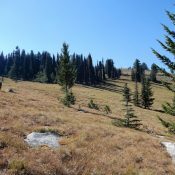 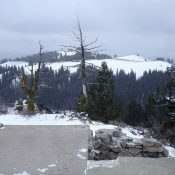 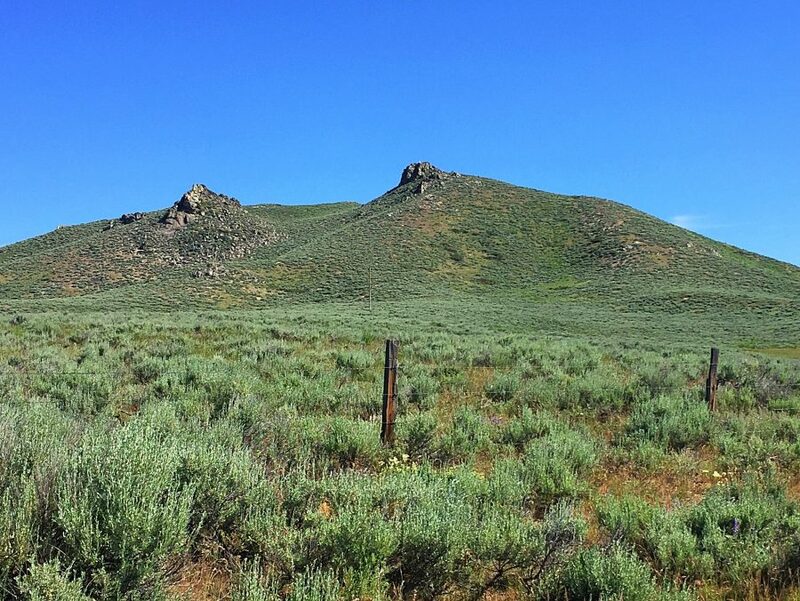 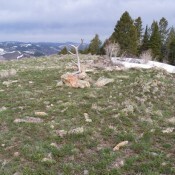 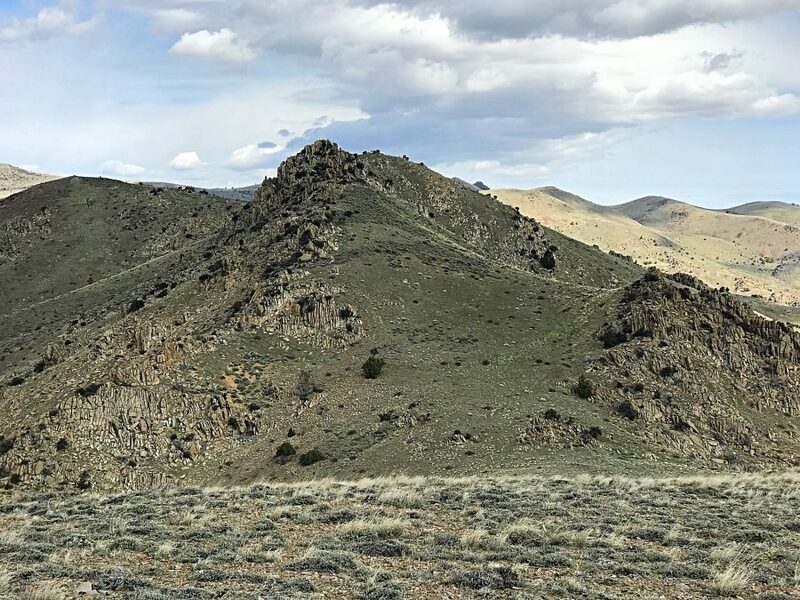 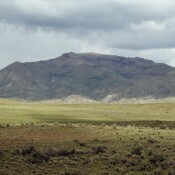 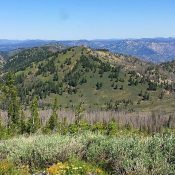 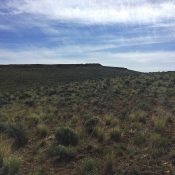 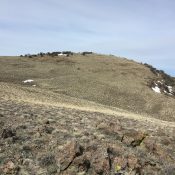 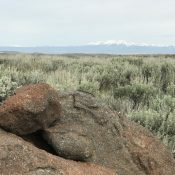 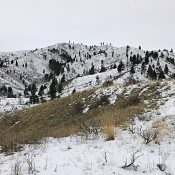 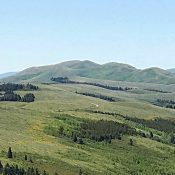 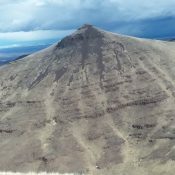 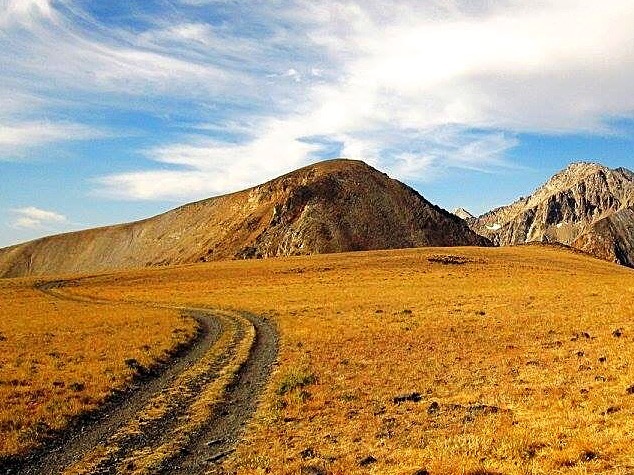 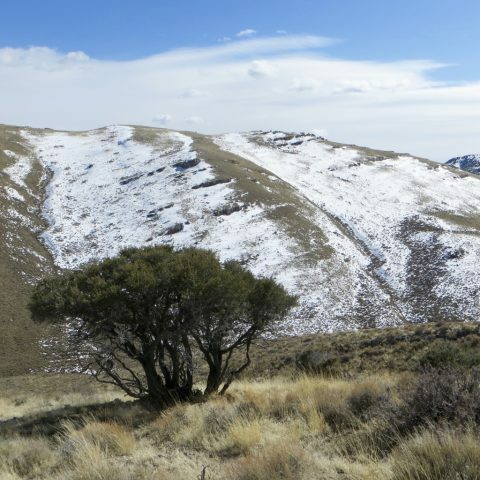 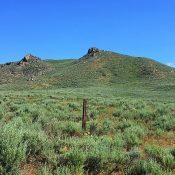 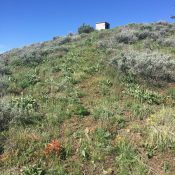 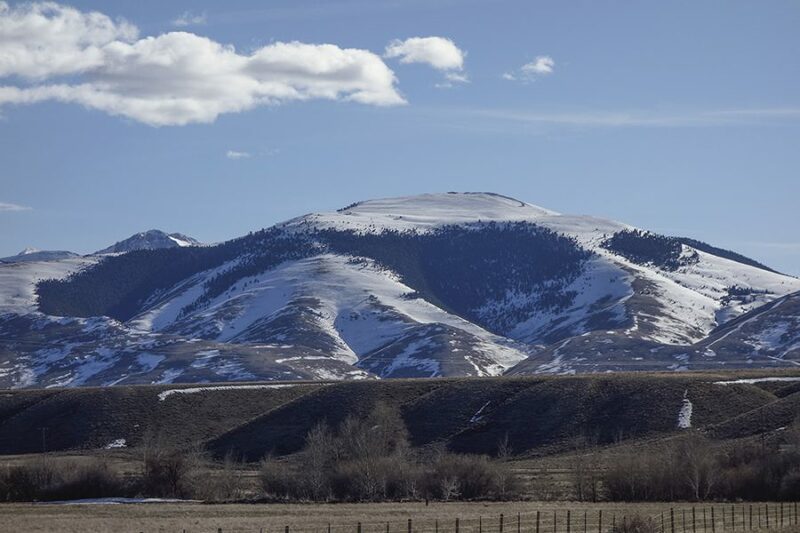 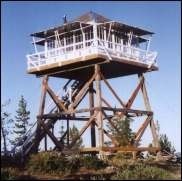 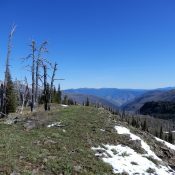 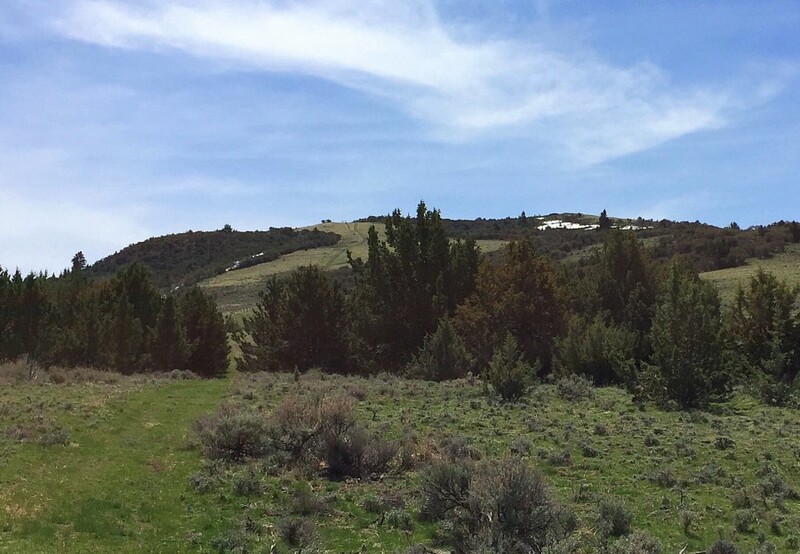 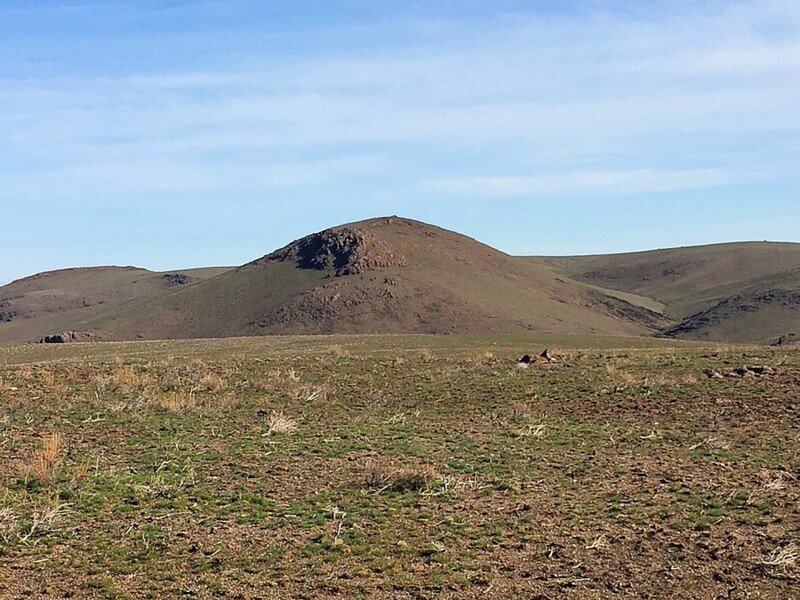 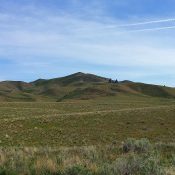 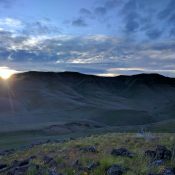 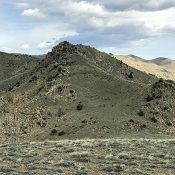 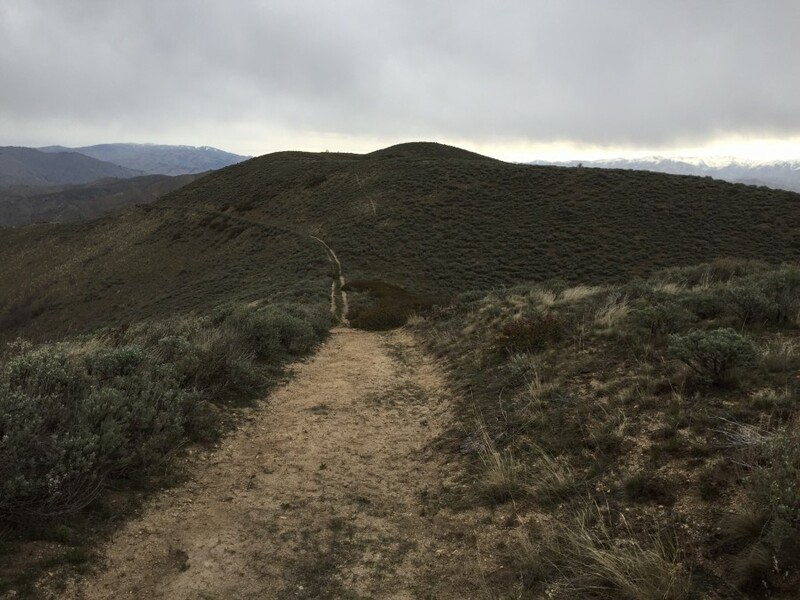 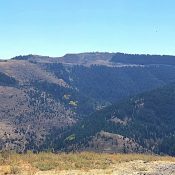 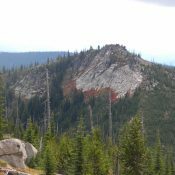 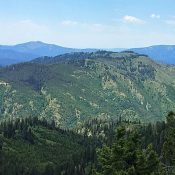 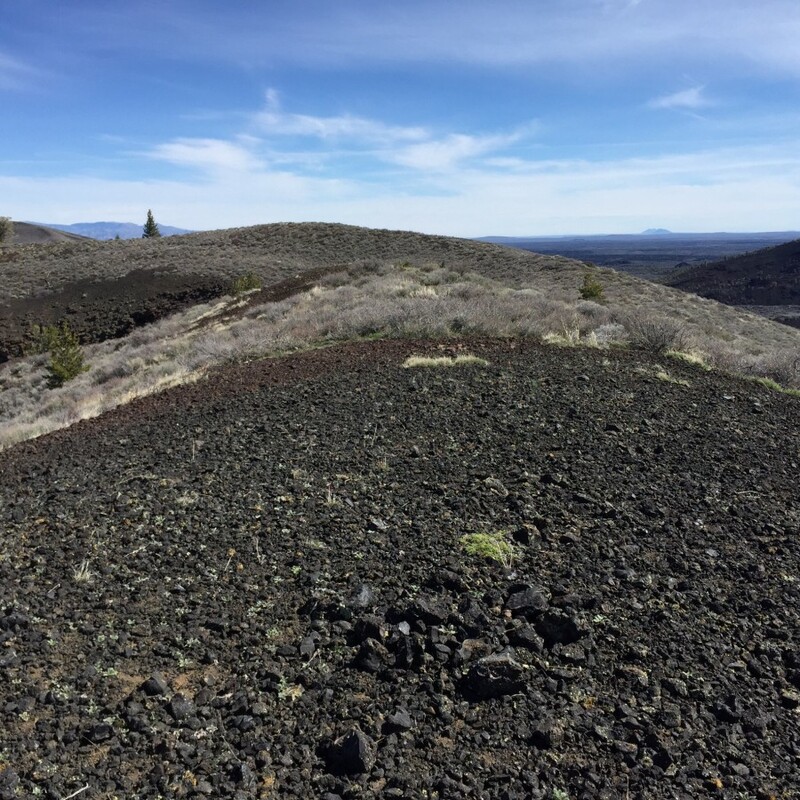 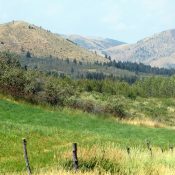 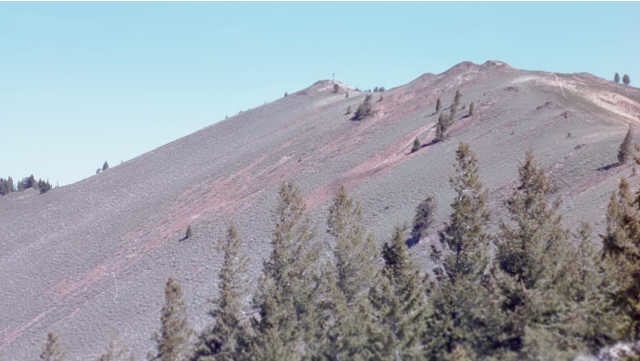 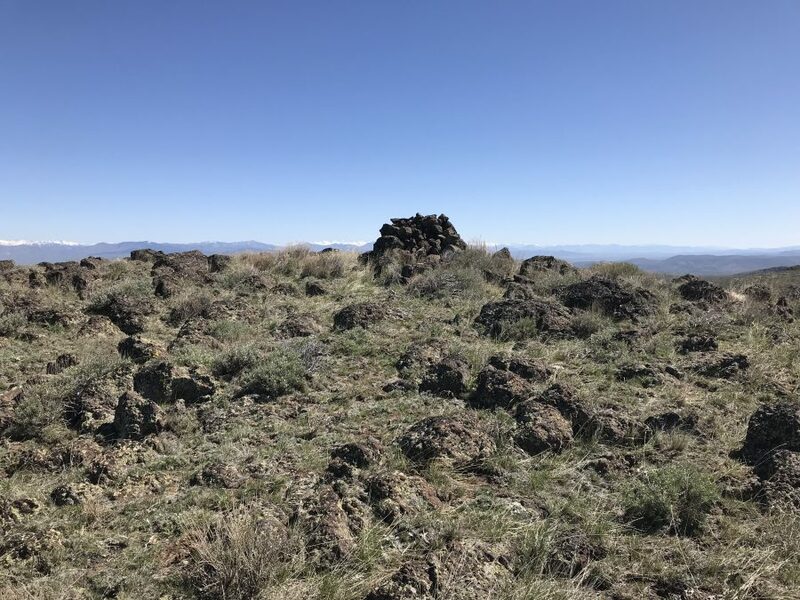 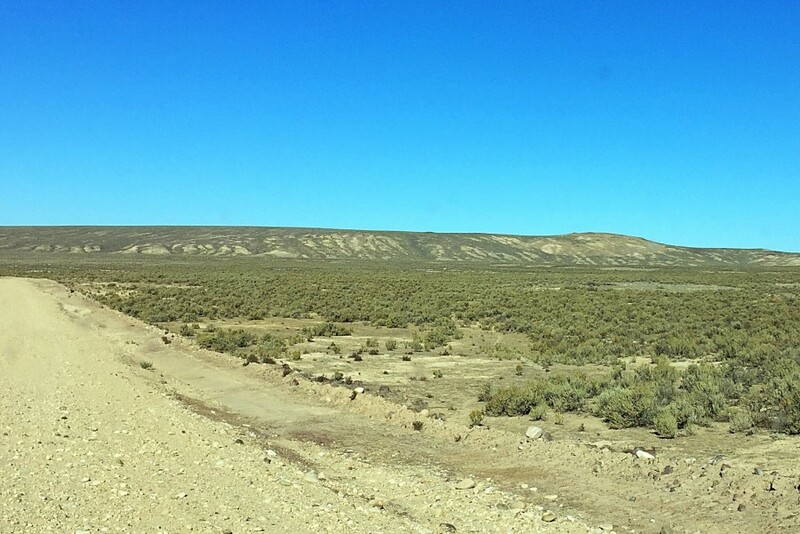 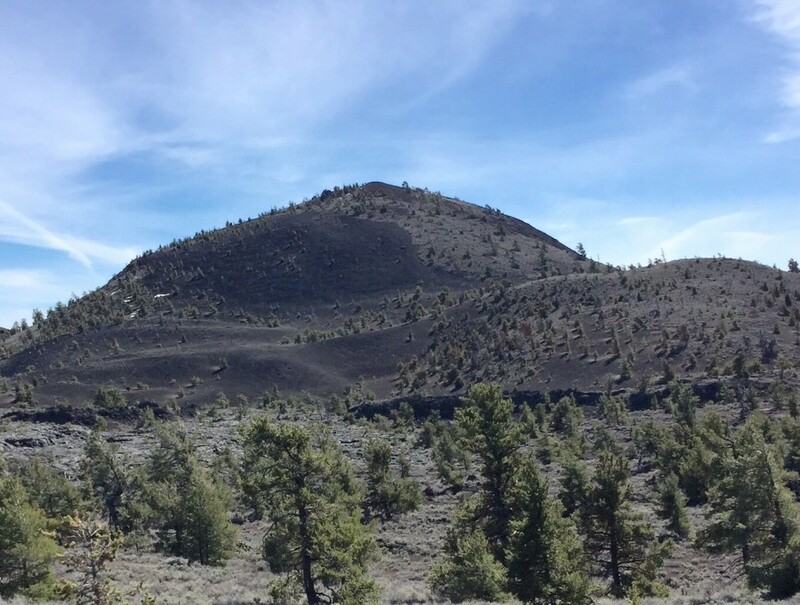 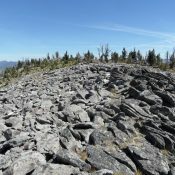 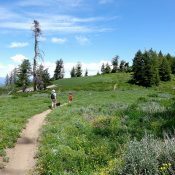 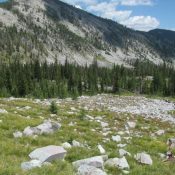 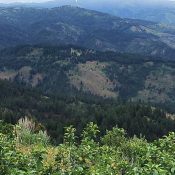 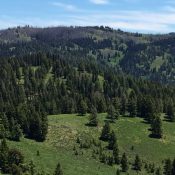 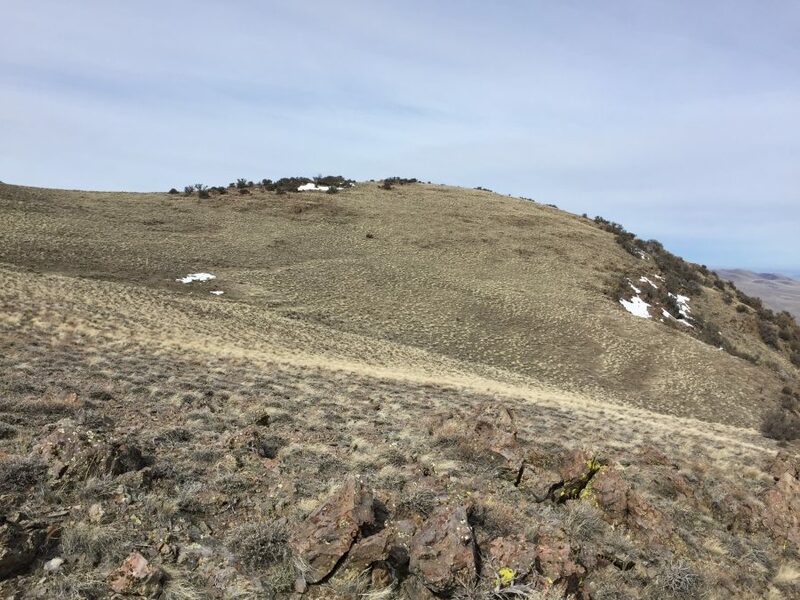 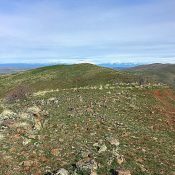 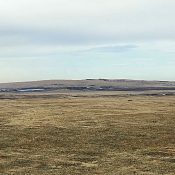 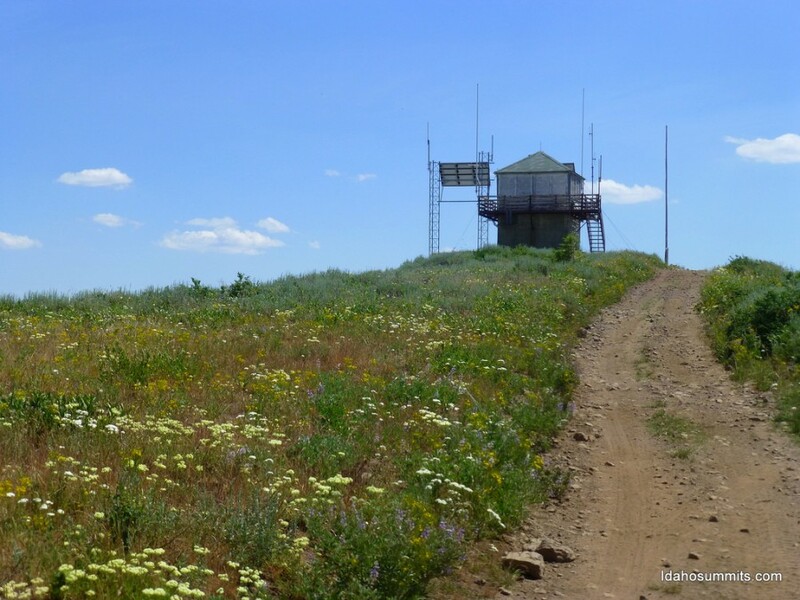 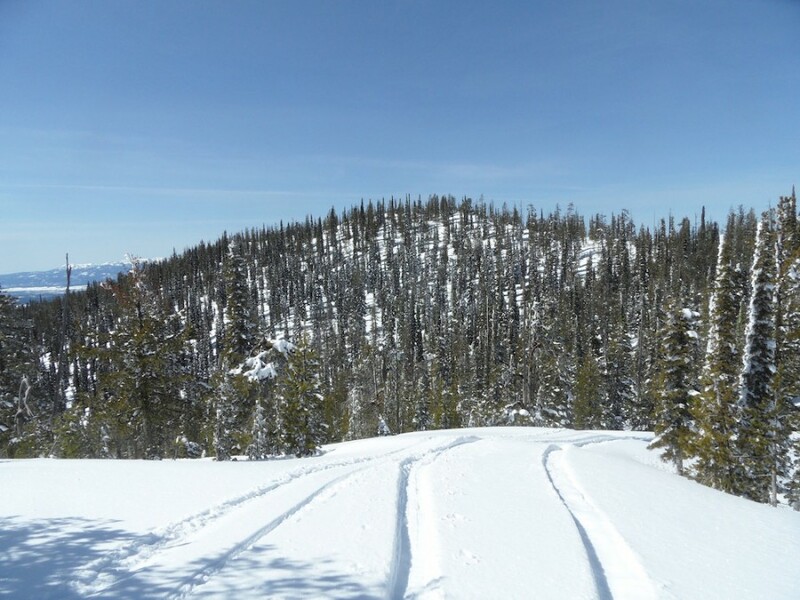 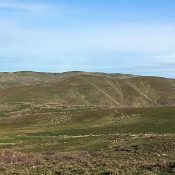 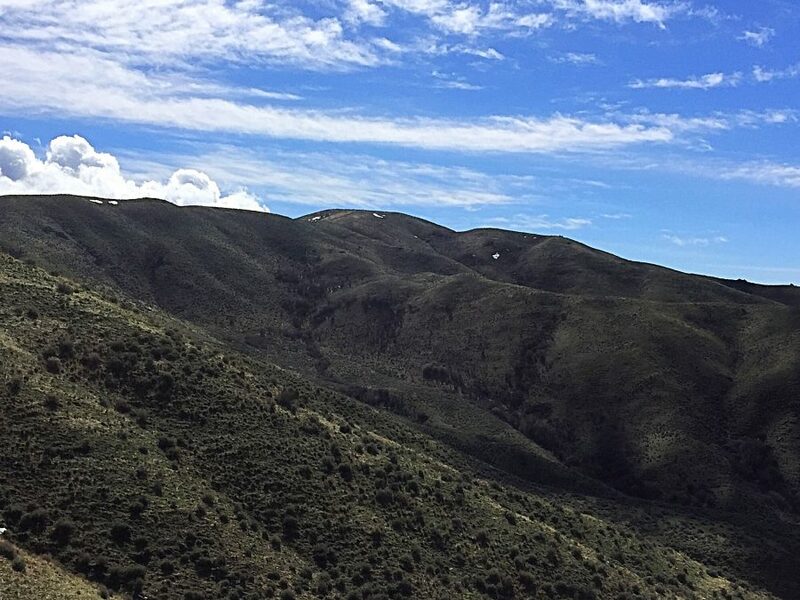 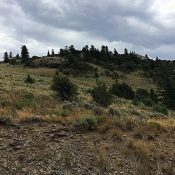 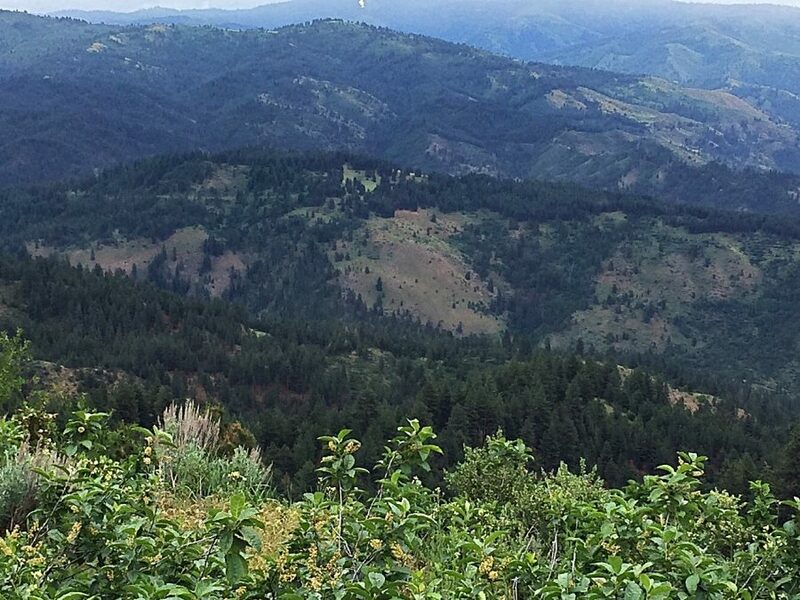 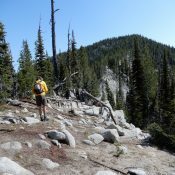 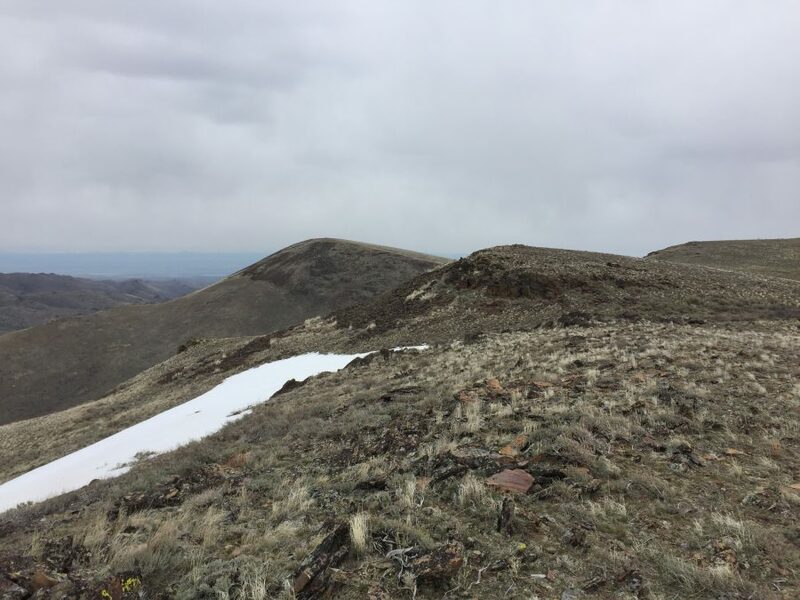 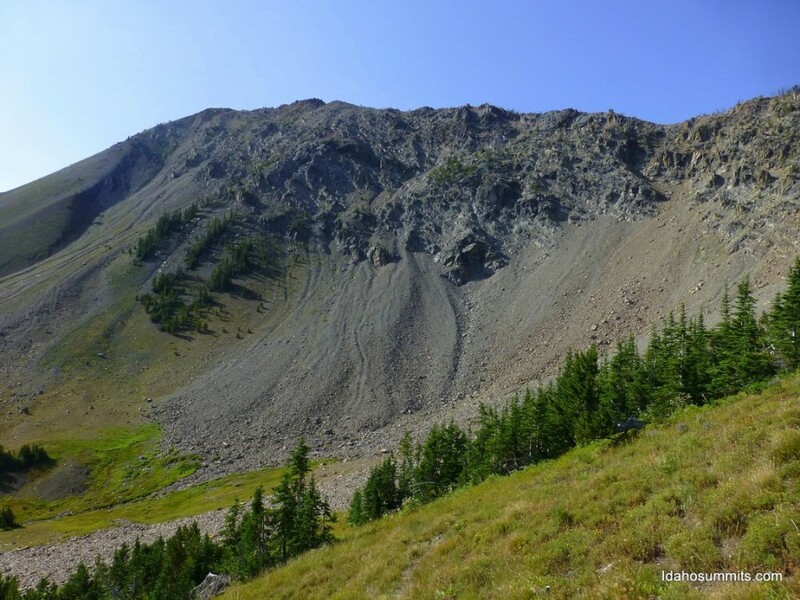 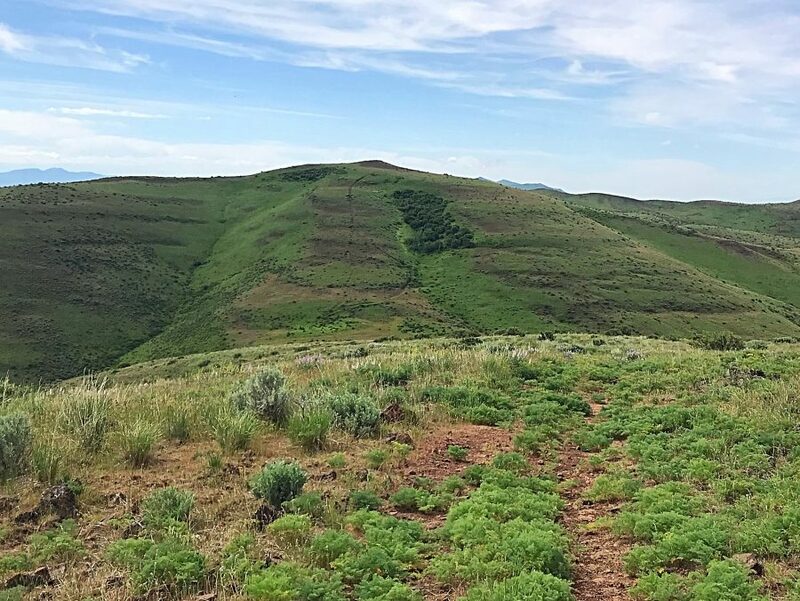 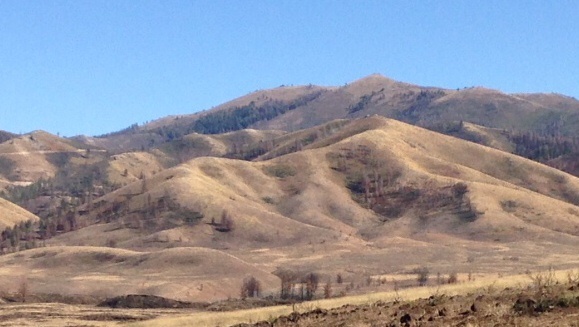 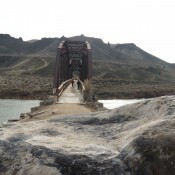 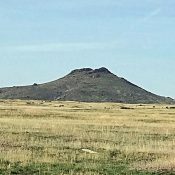 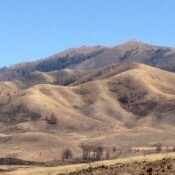 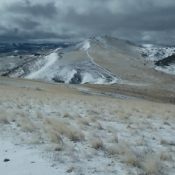 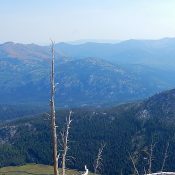 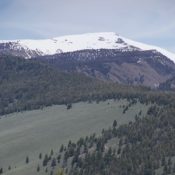 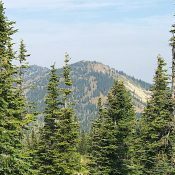 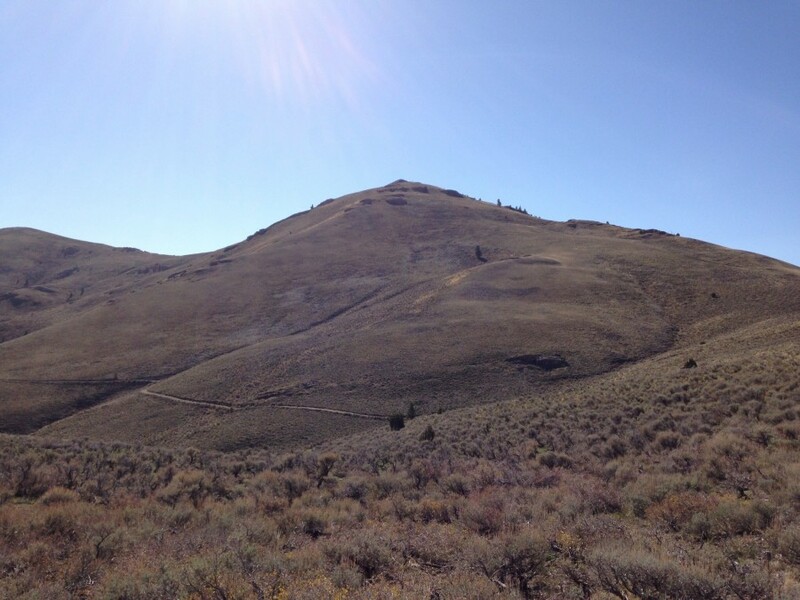 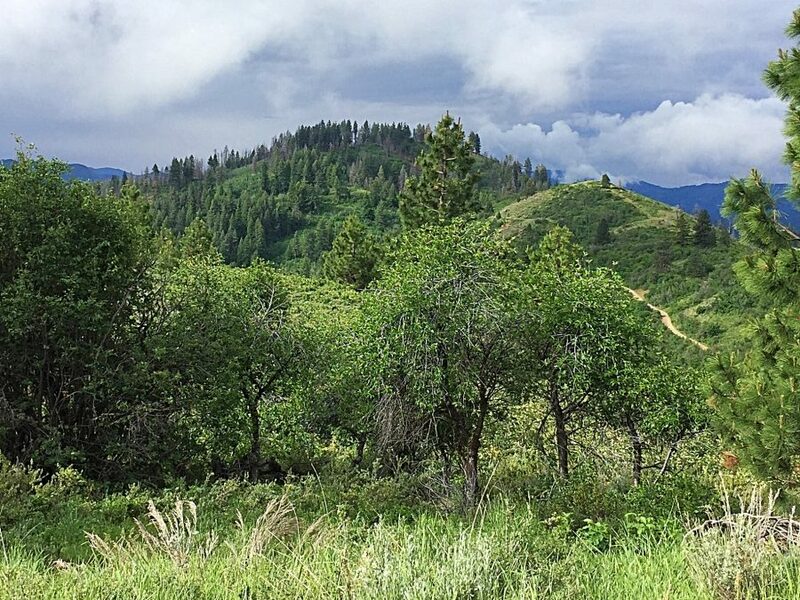 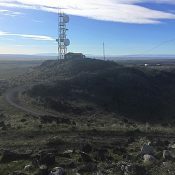 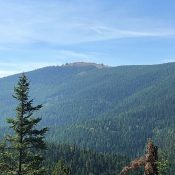 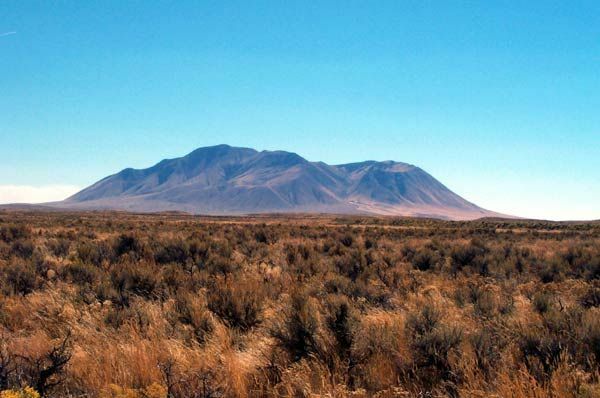 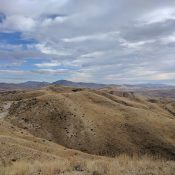 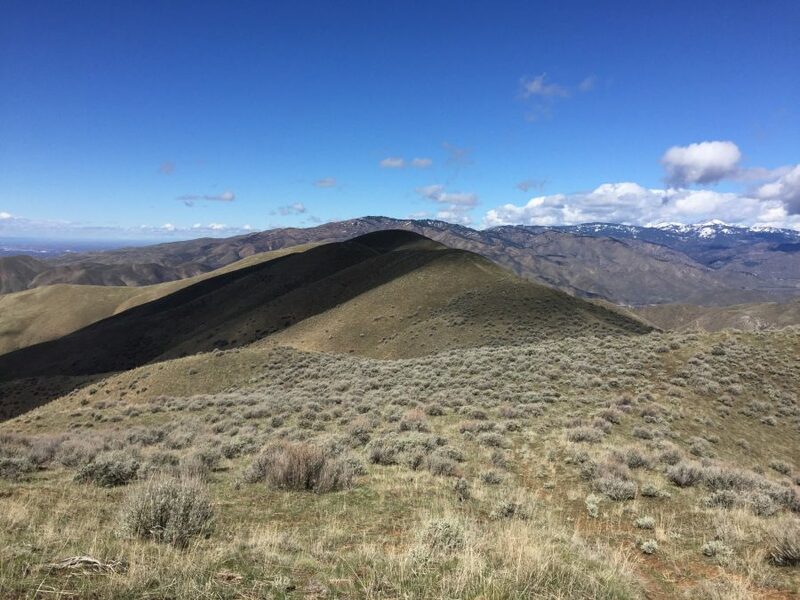 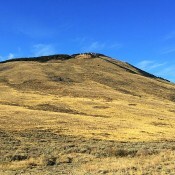 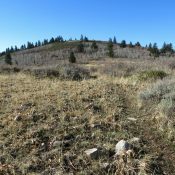 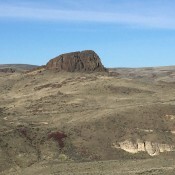 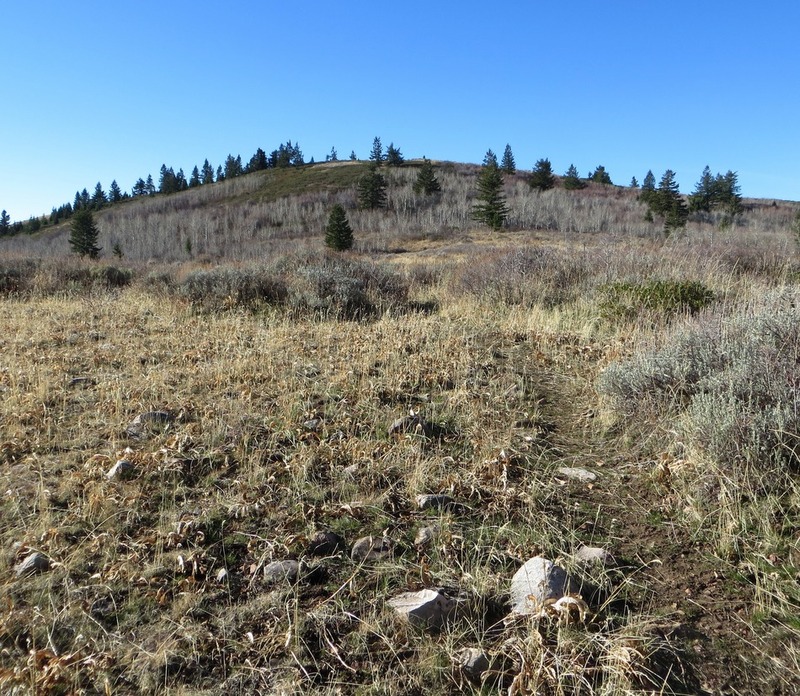 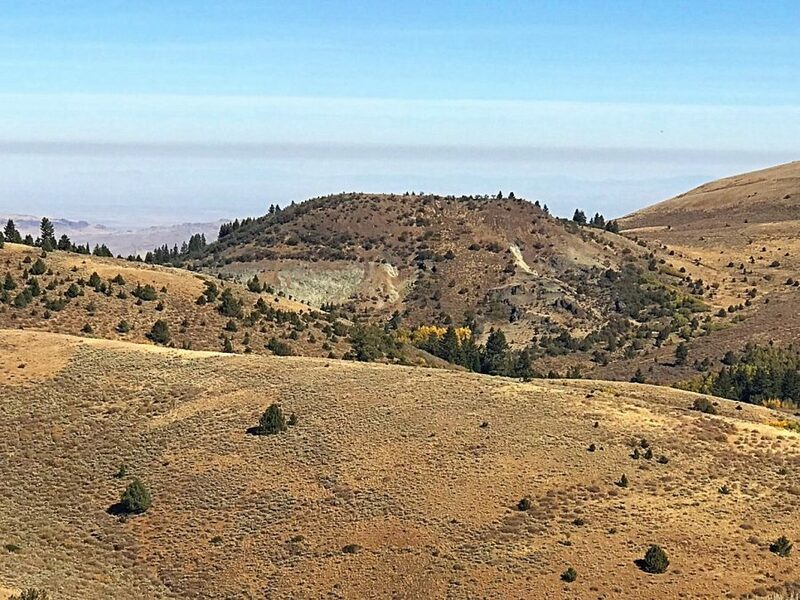 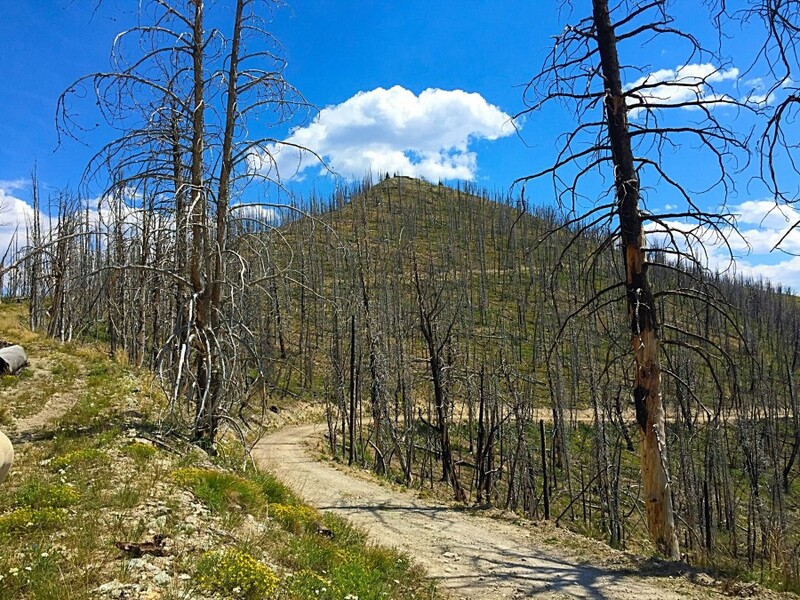 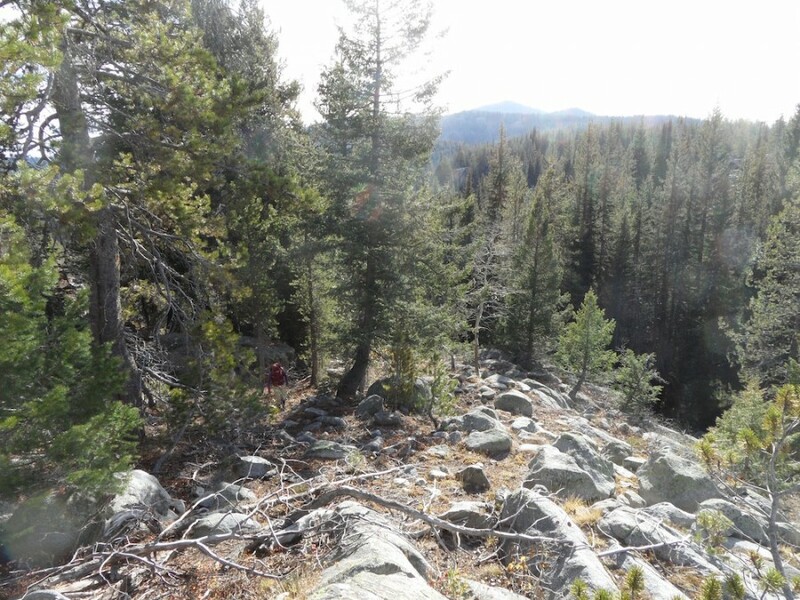 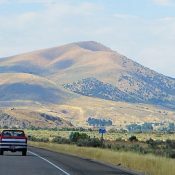 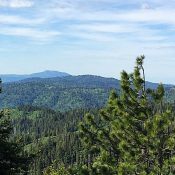 Lockman Butte Snake River Plain 3,790 ft 2016 This Snake River Plain butte is not in the book. 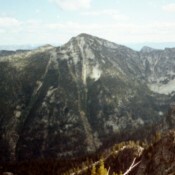 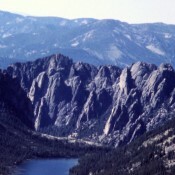 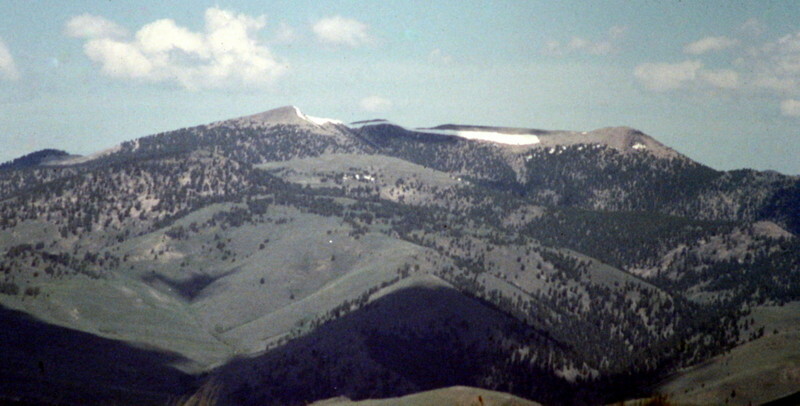 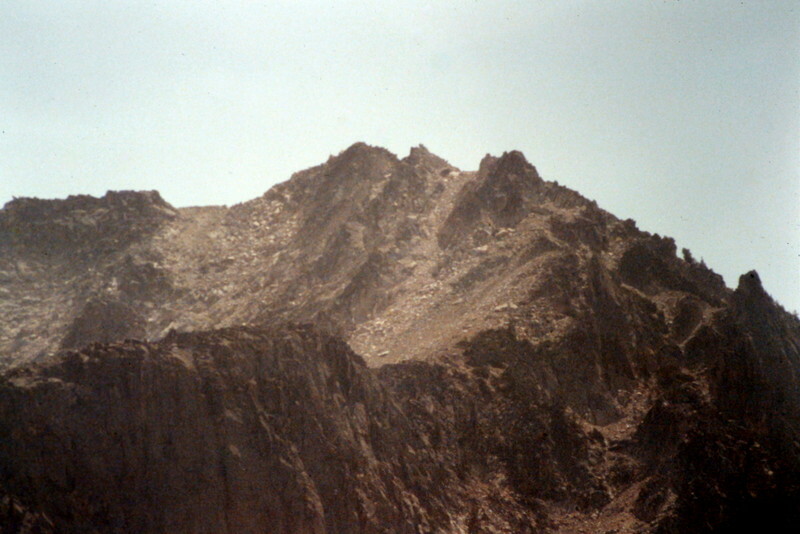 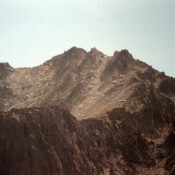 Newman Peak Boise Mountains 9,603 ft 1023 1991 Climbing and access information for this peak is discussed on page 151. 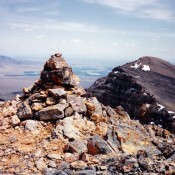 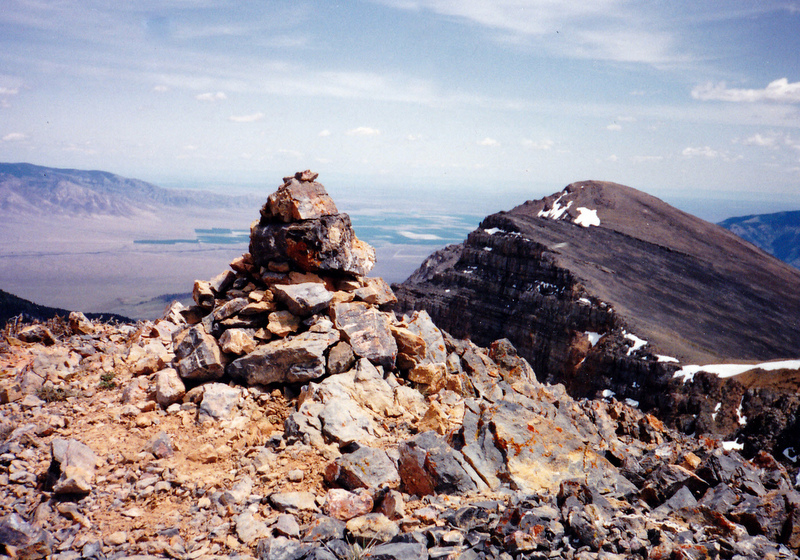 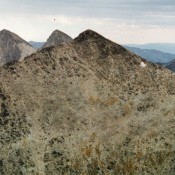 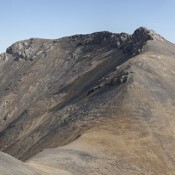 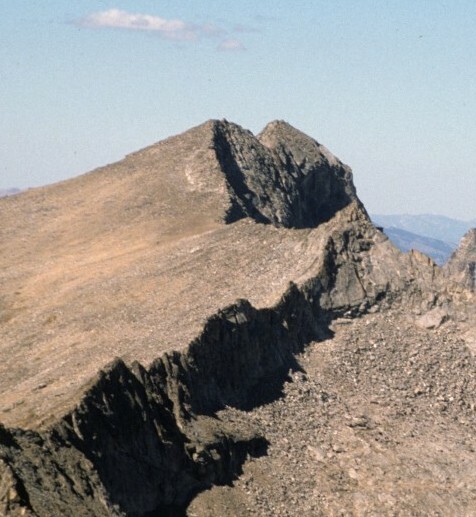 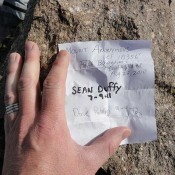 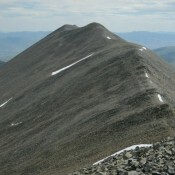 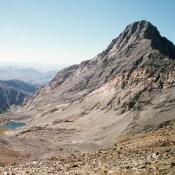 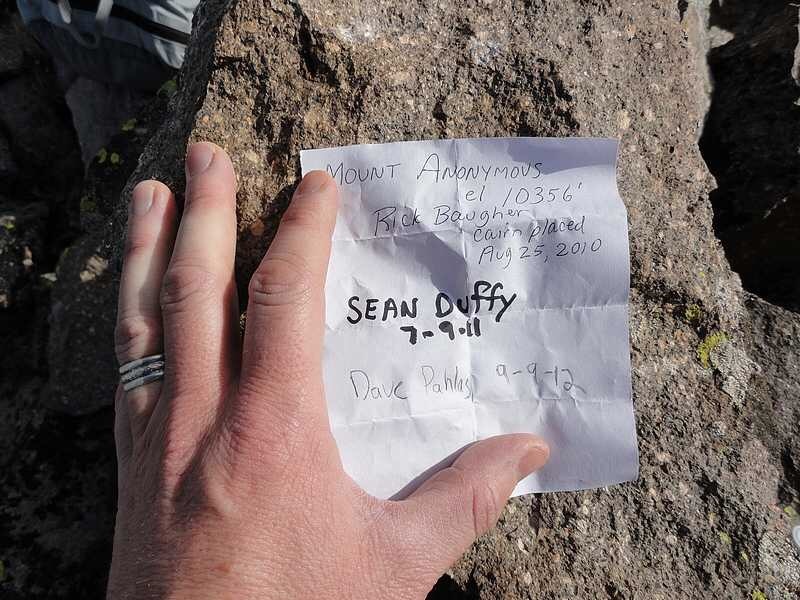 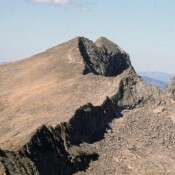 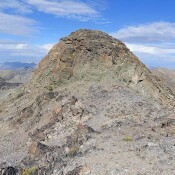 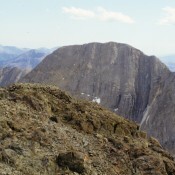 Peak 1 aka First Peak Soldier Mountains 9,147 ft 253 This peak is not in the book. 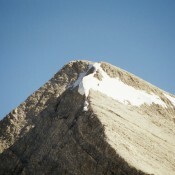 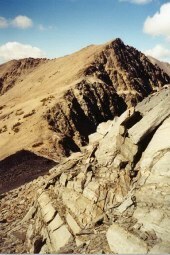 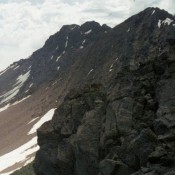 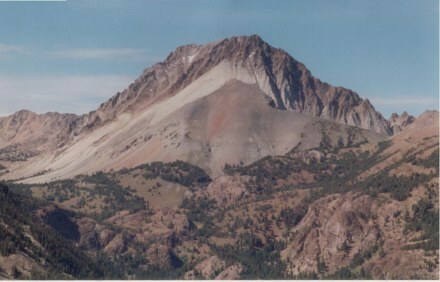 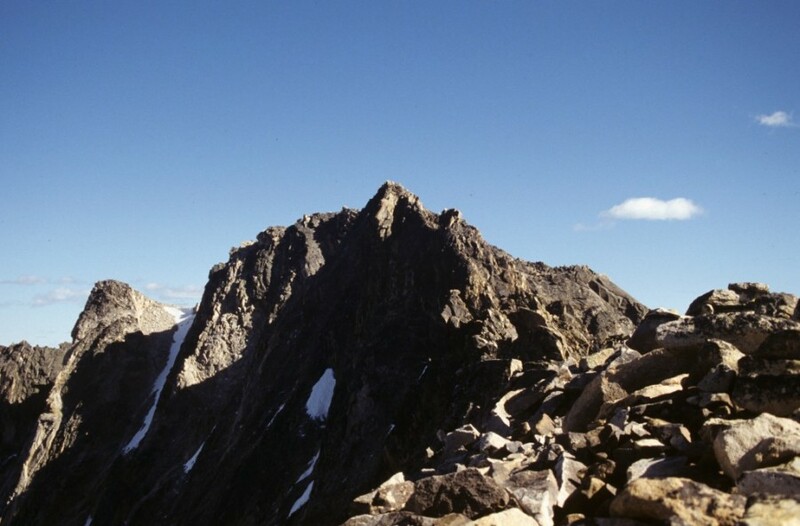 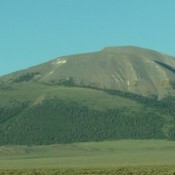 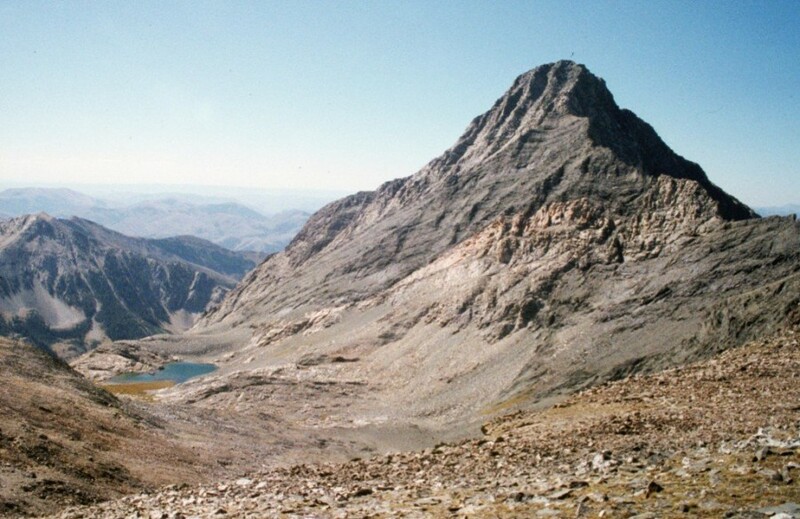 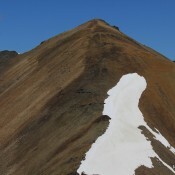 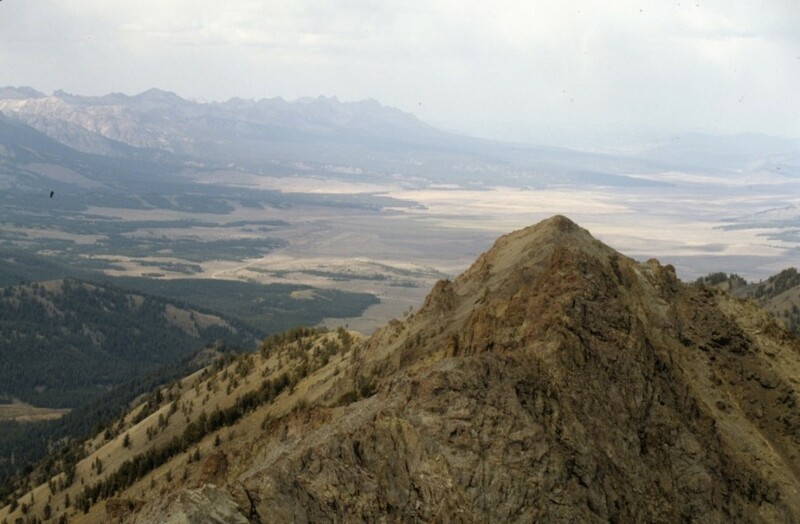 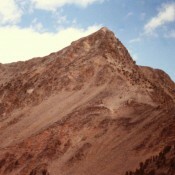 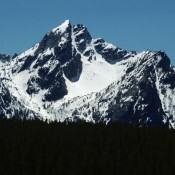 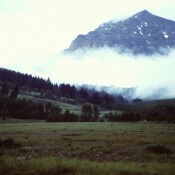 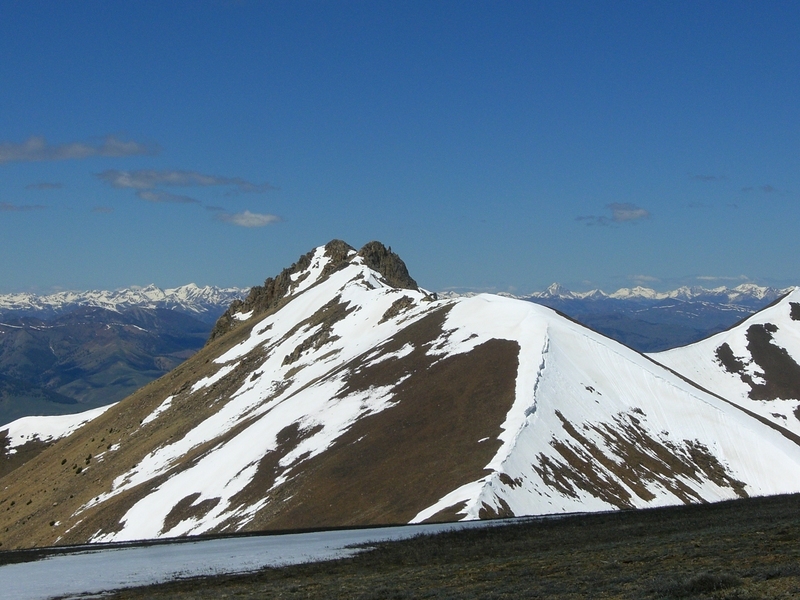 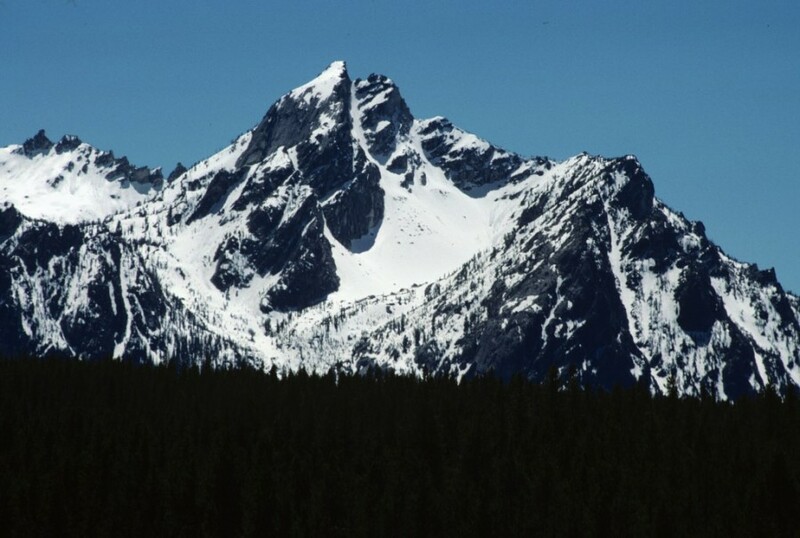 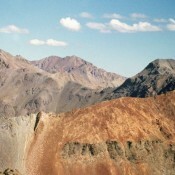 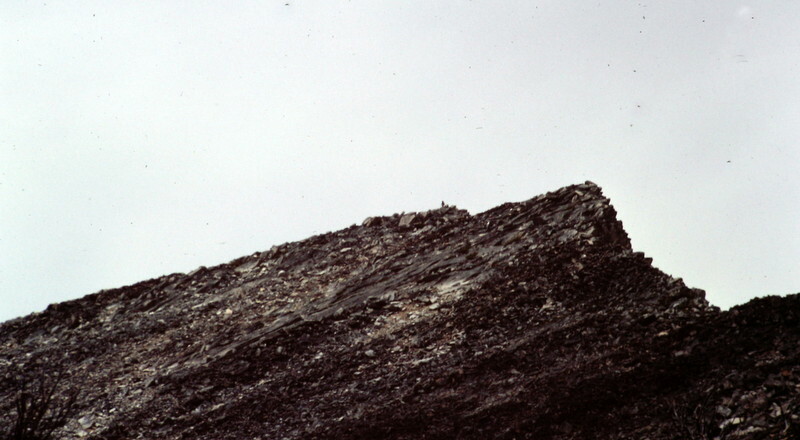 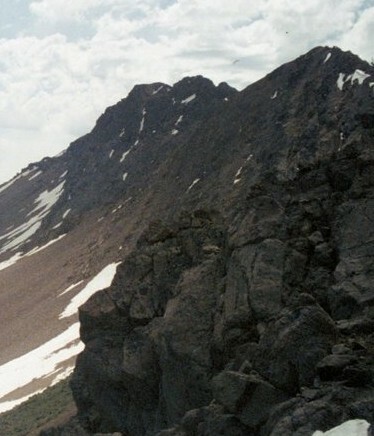 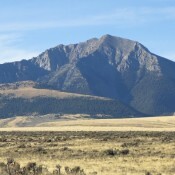 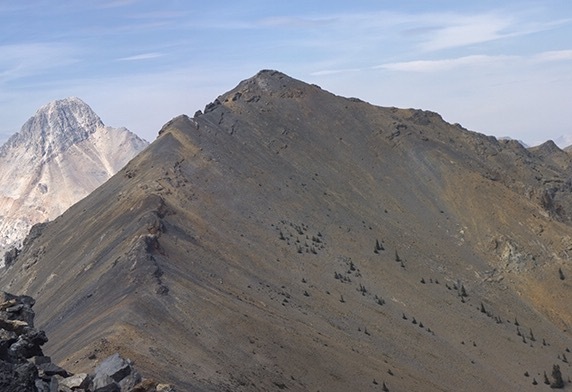 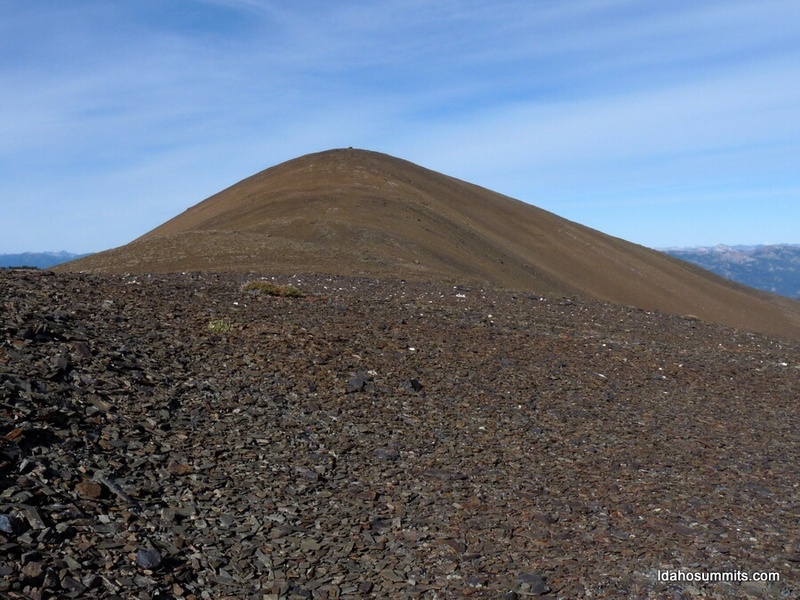 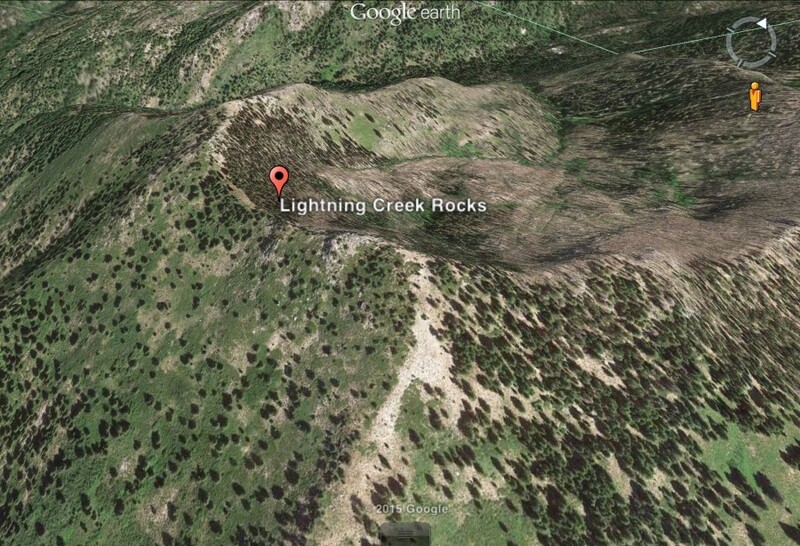 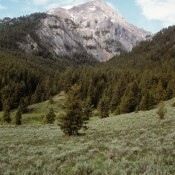 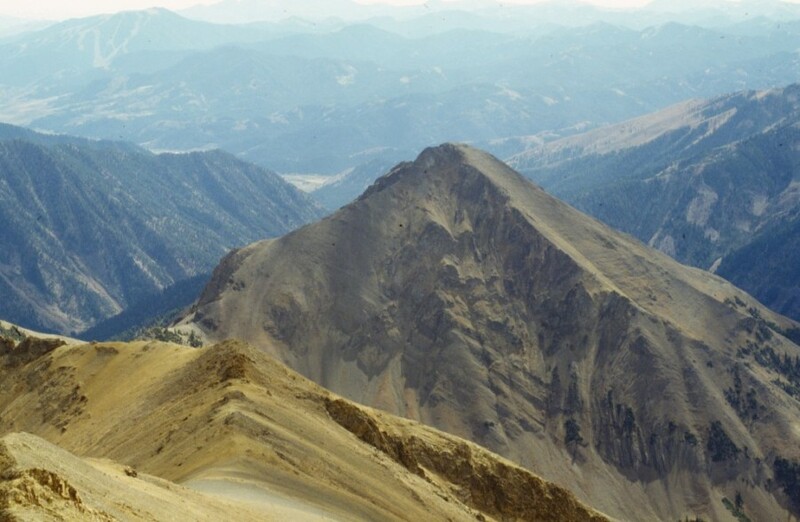 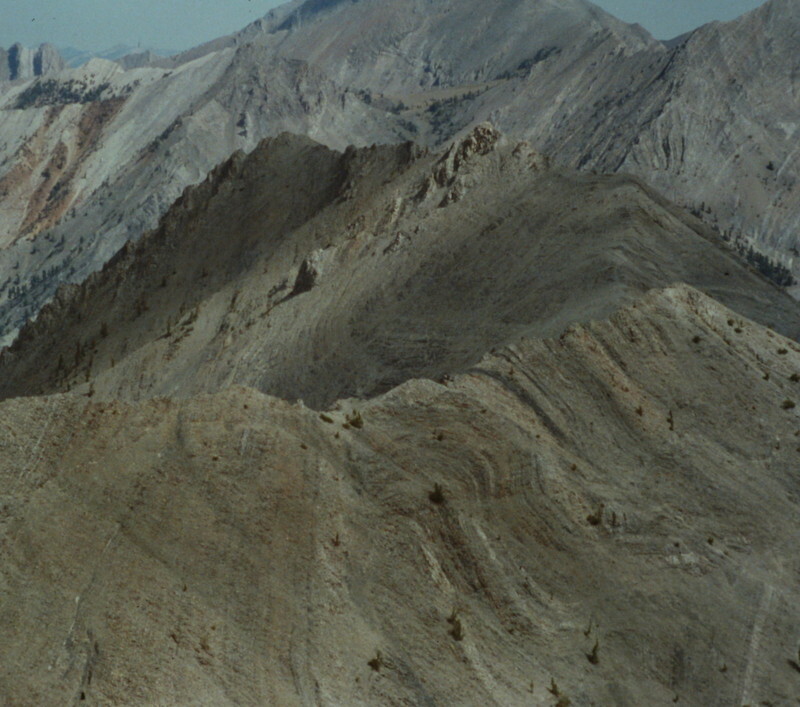 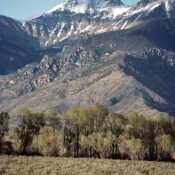 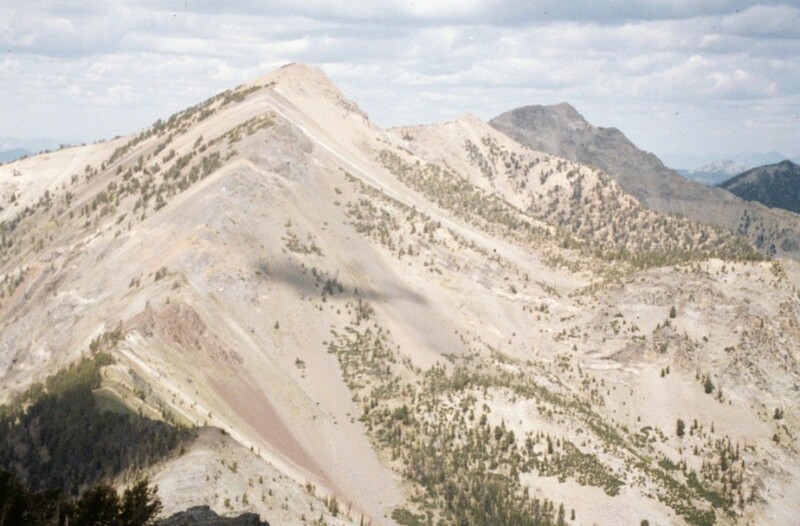 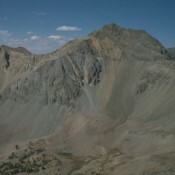 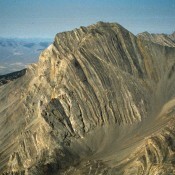 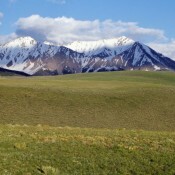 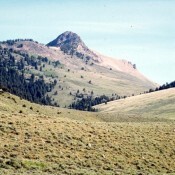 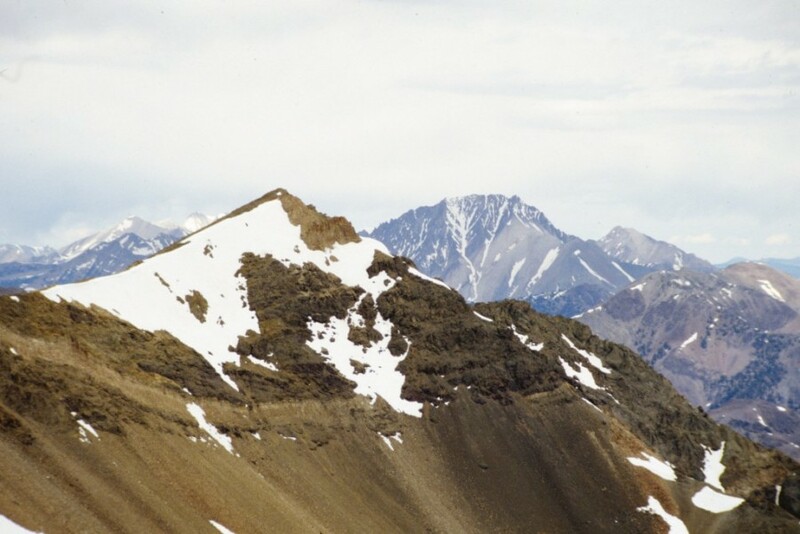 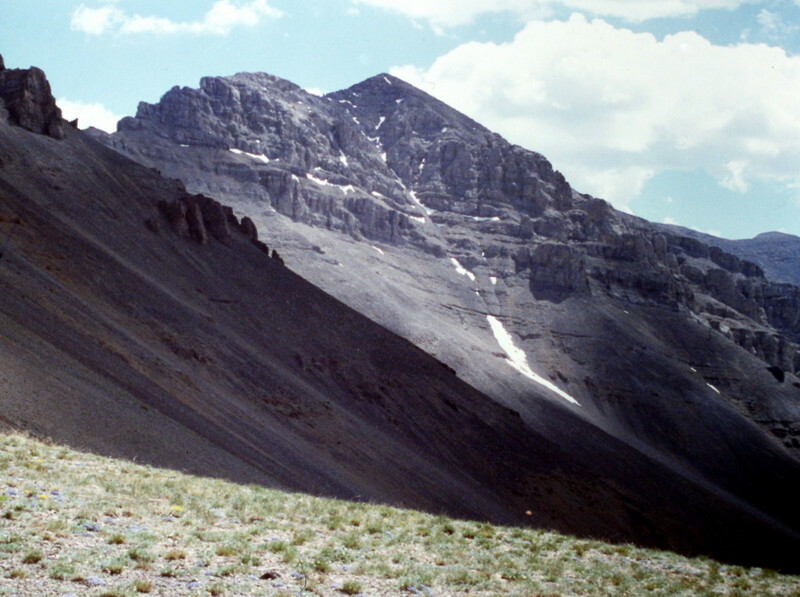 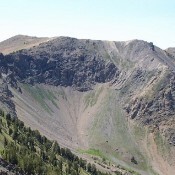 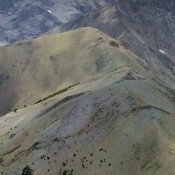 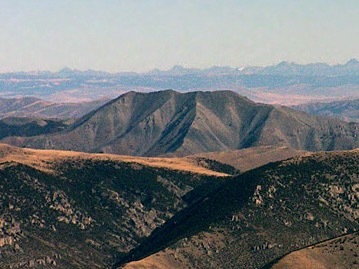 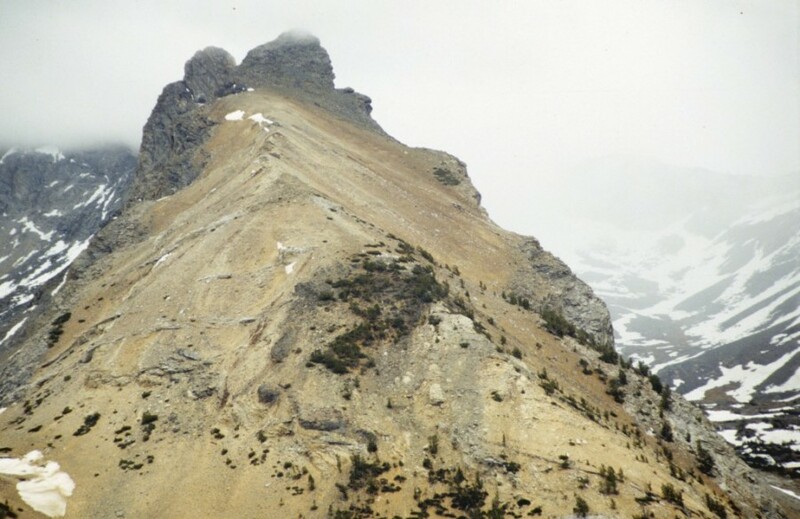 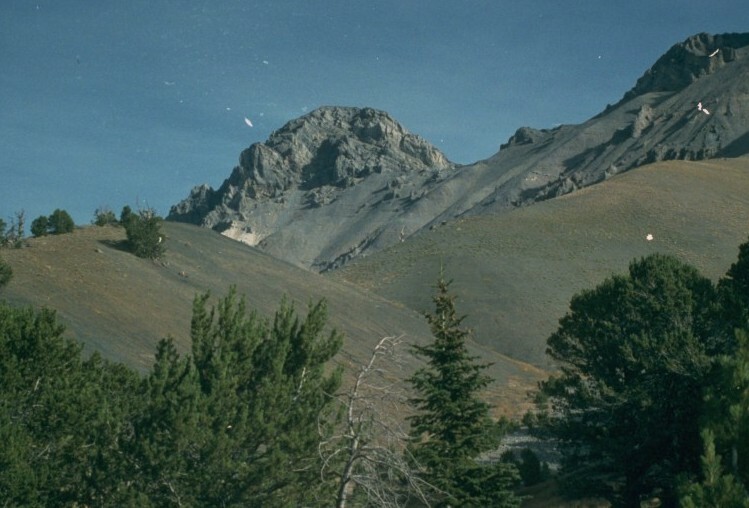 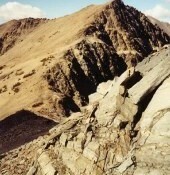 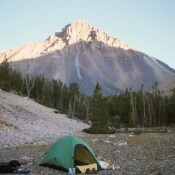 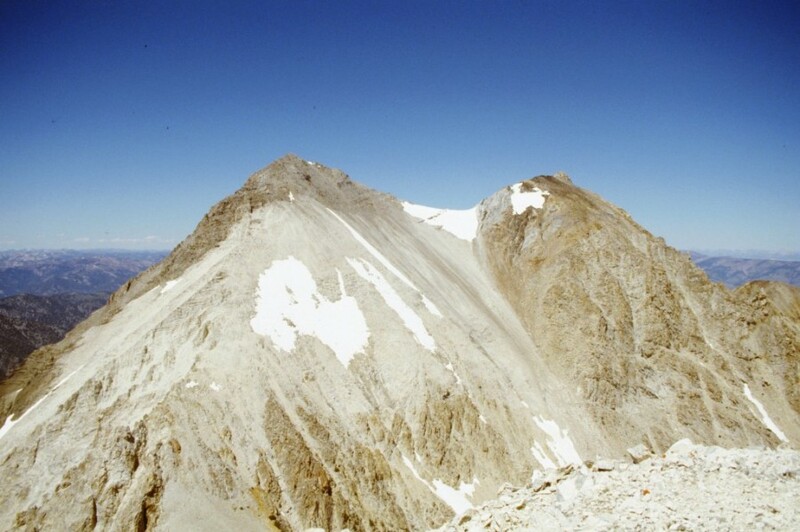 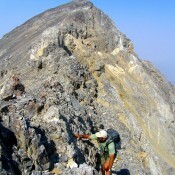 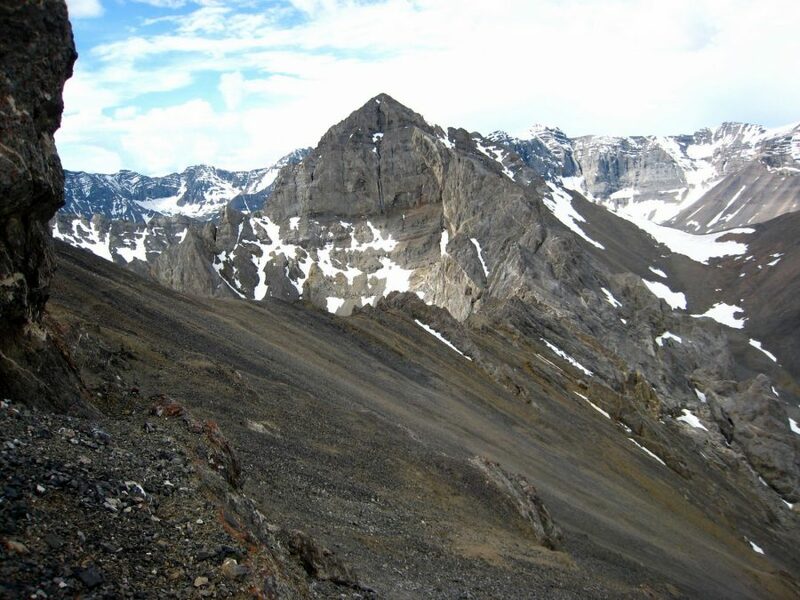 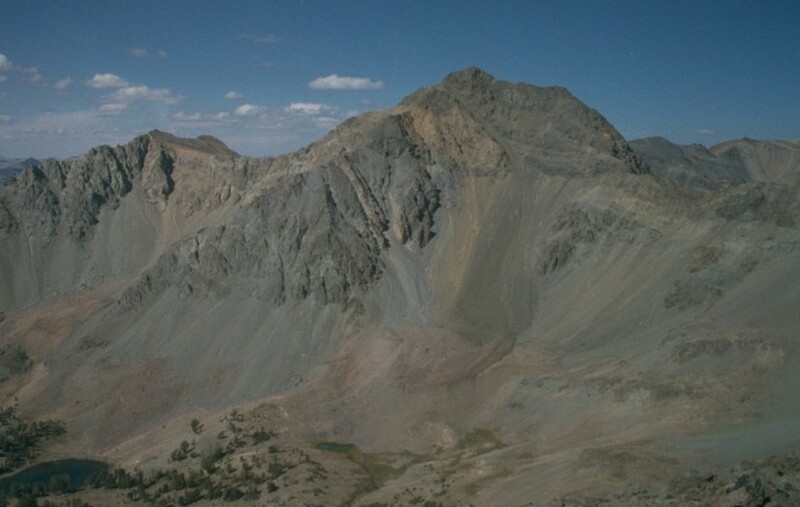 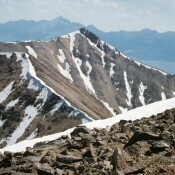 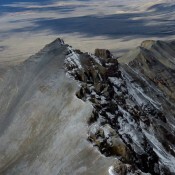 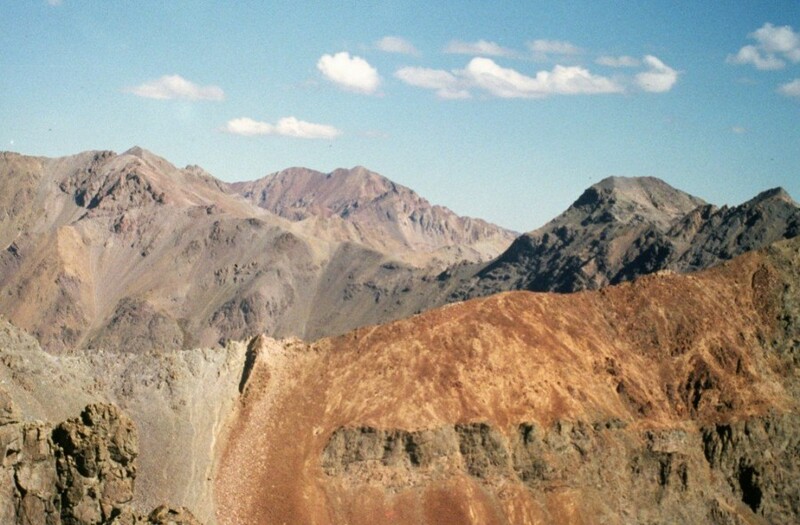 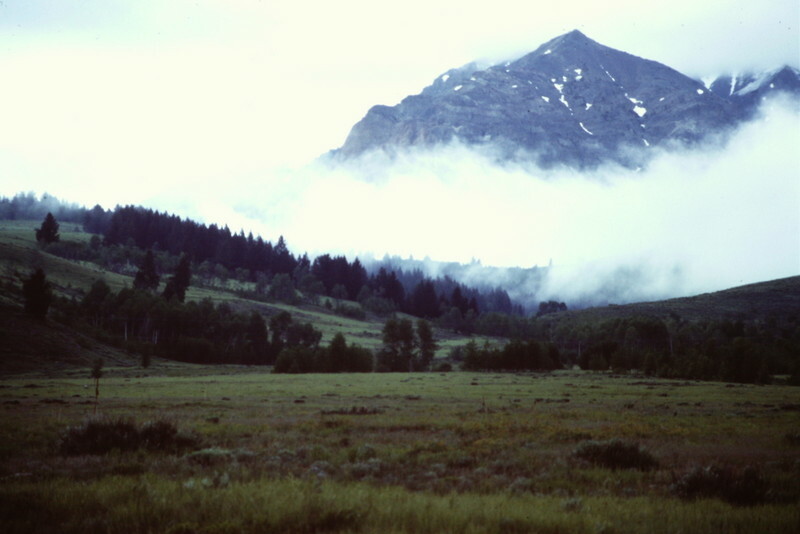 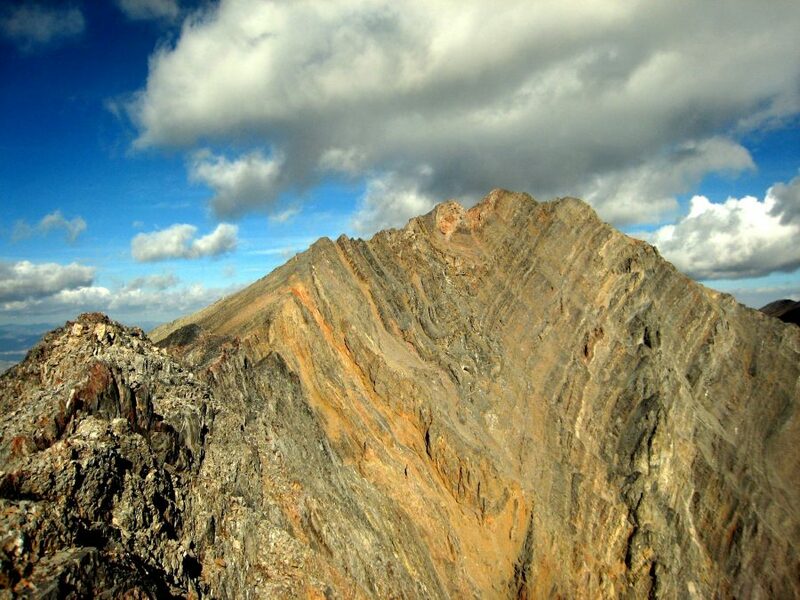 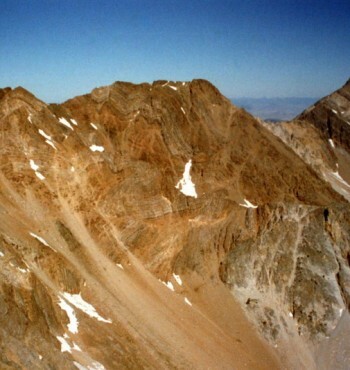 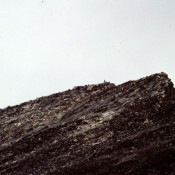 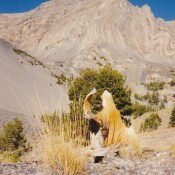 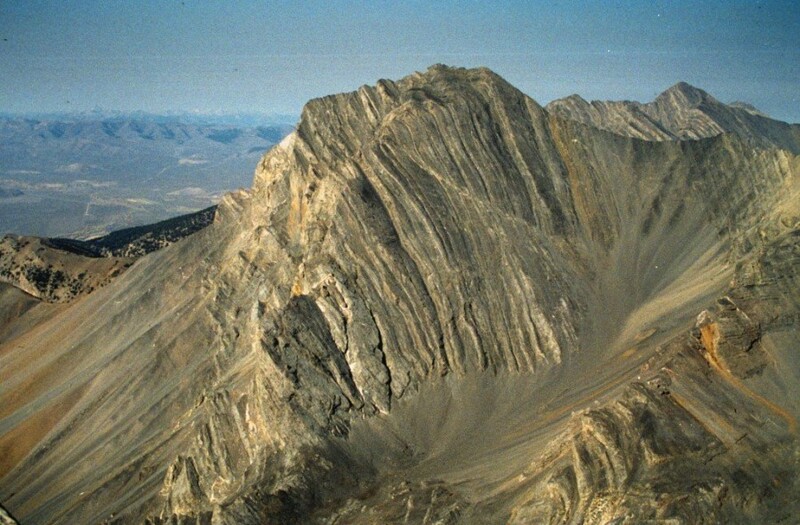 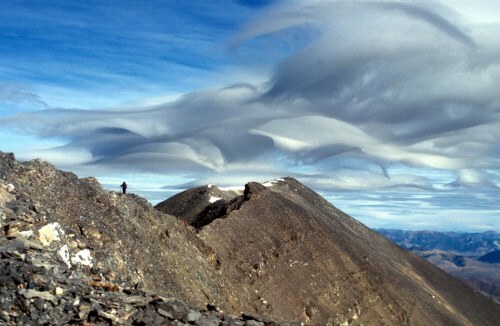 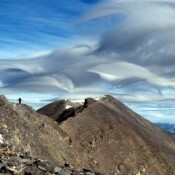 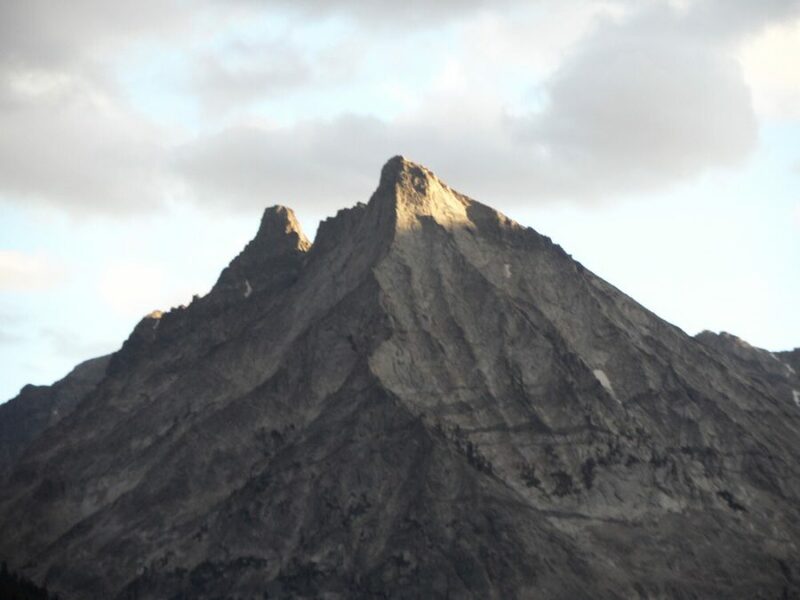 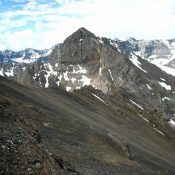 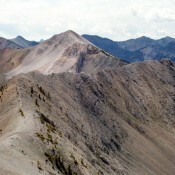 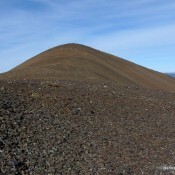 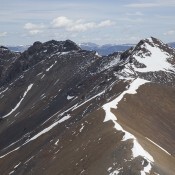 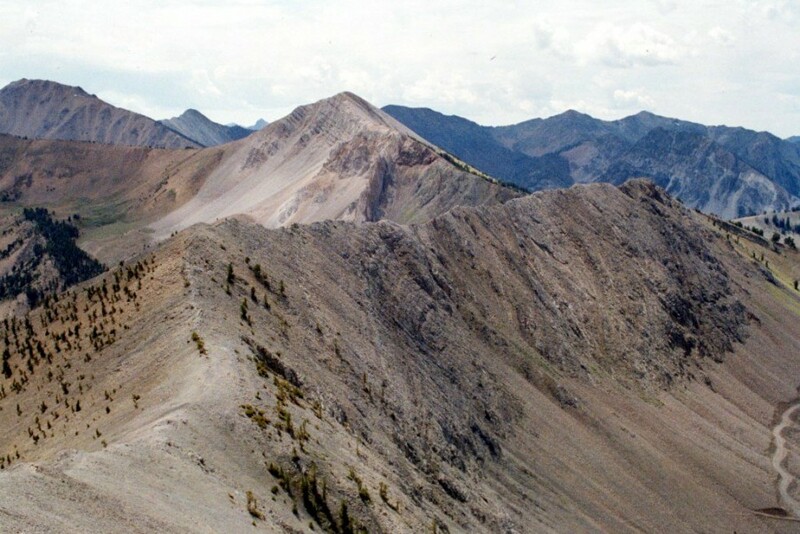 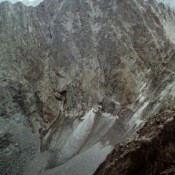 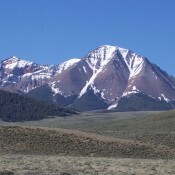 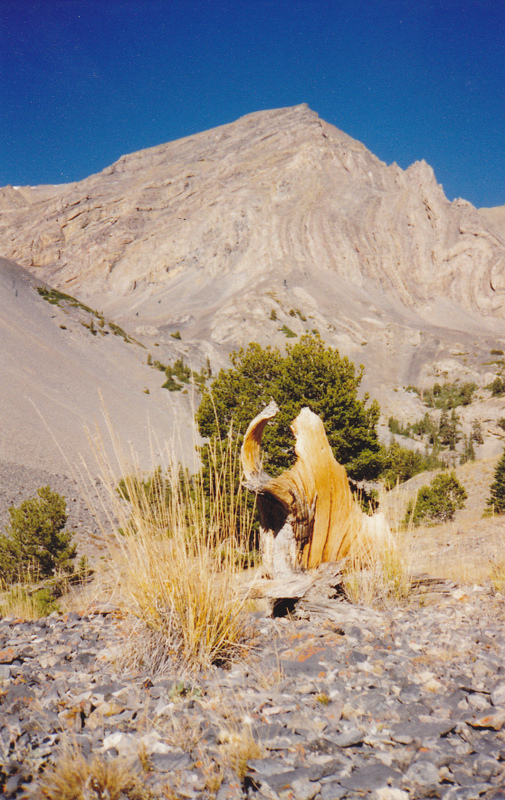 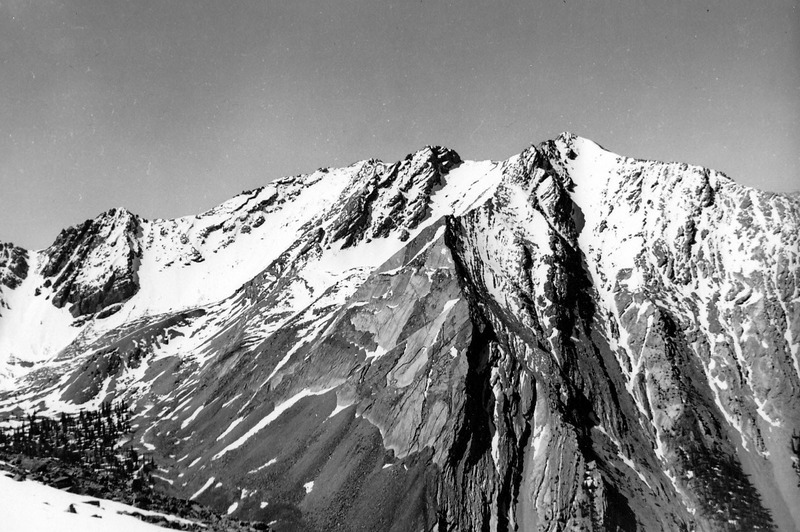 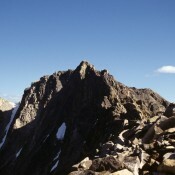 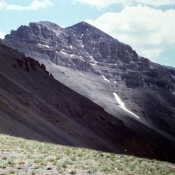 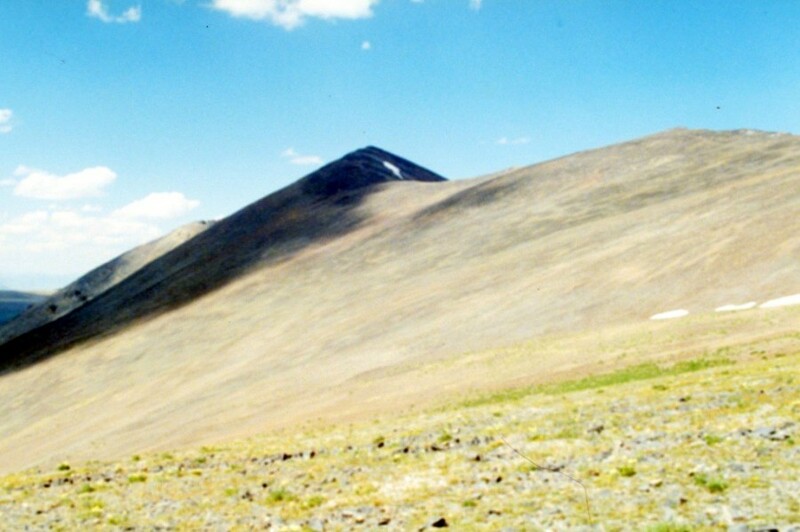 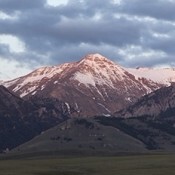 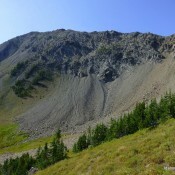 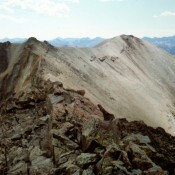 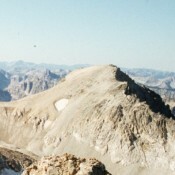 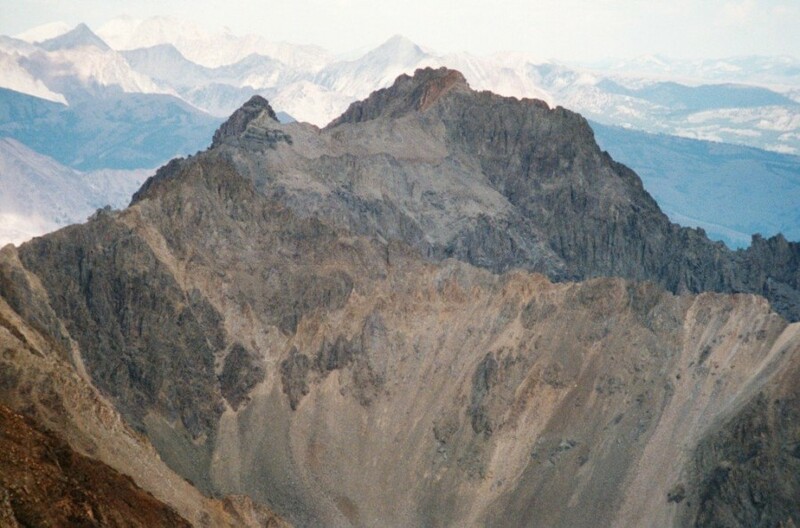 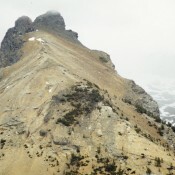 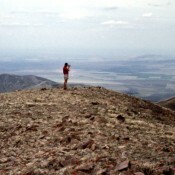 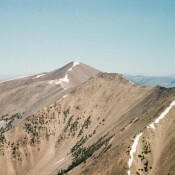 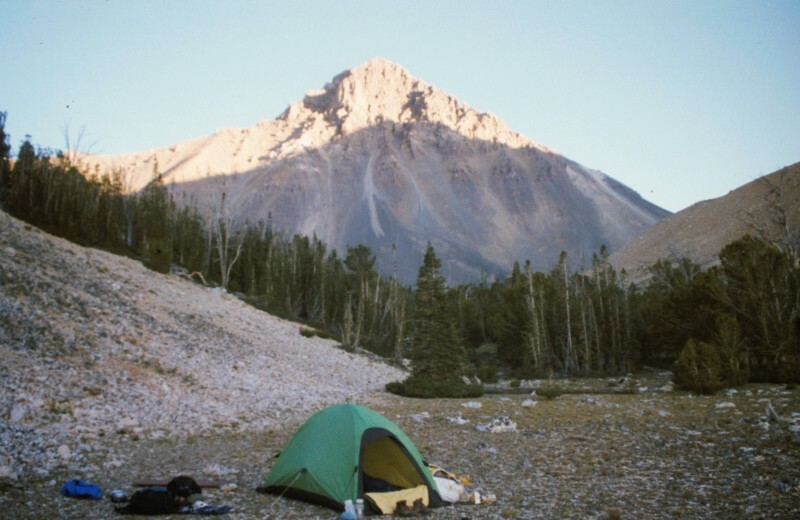 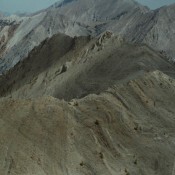 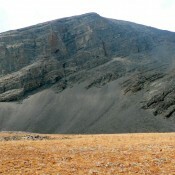 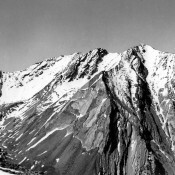 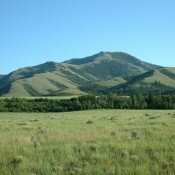 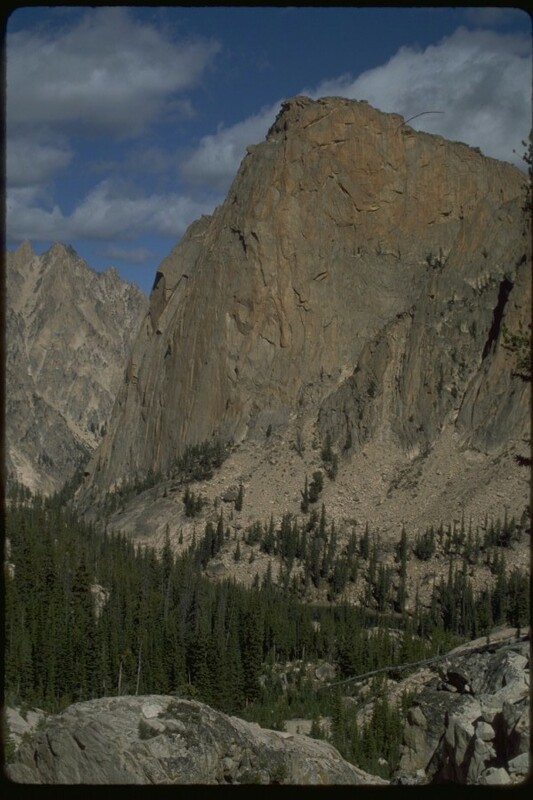 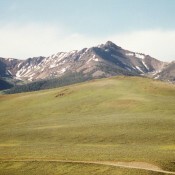 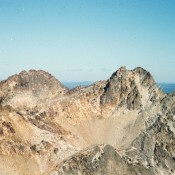 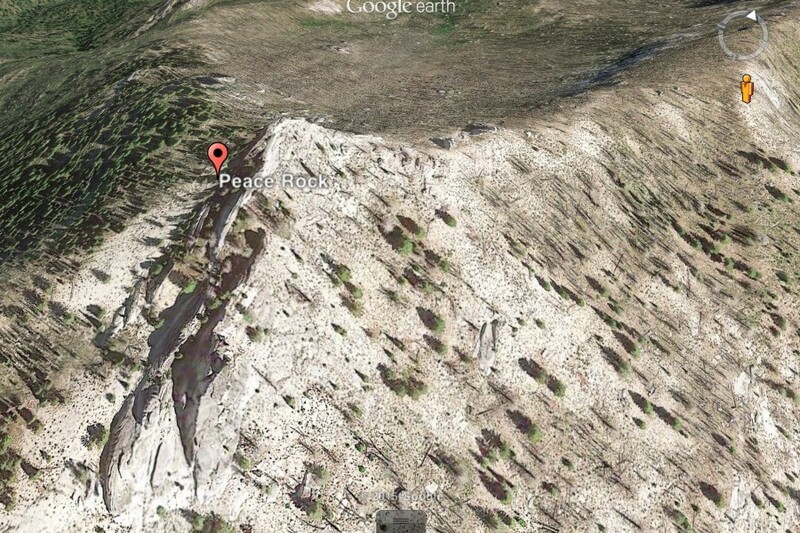 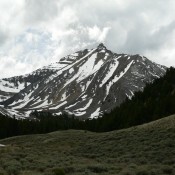 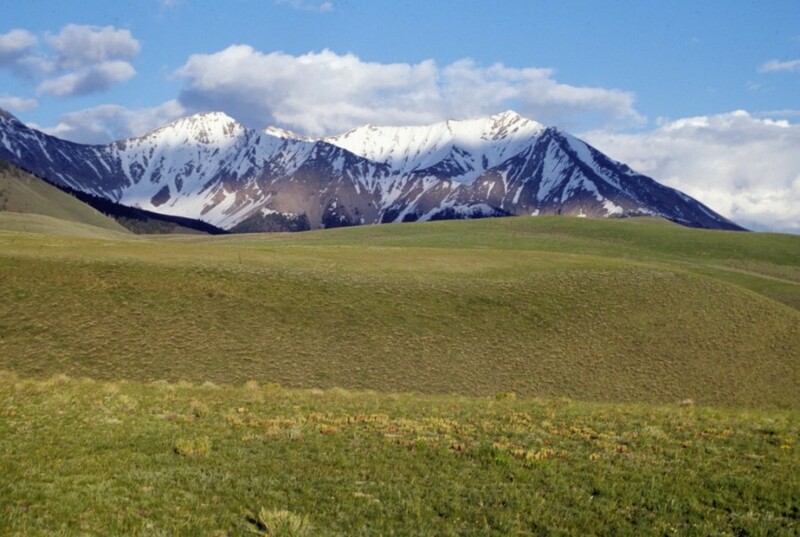 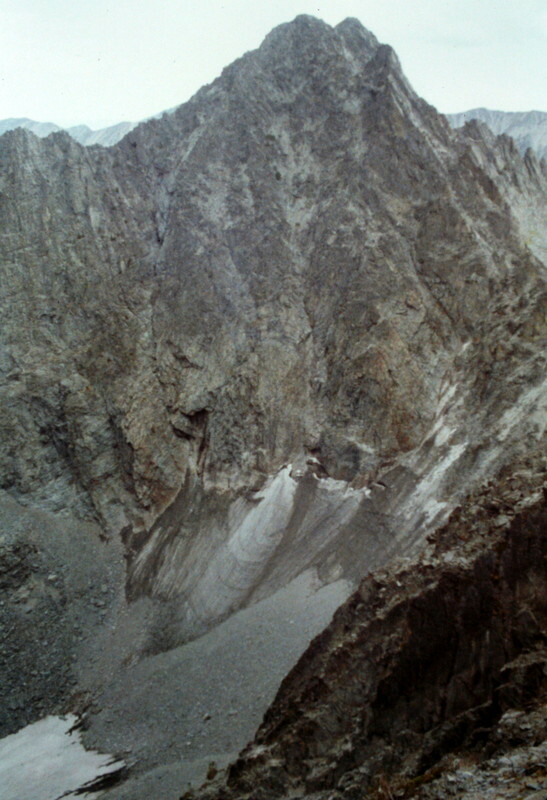 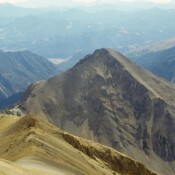 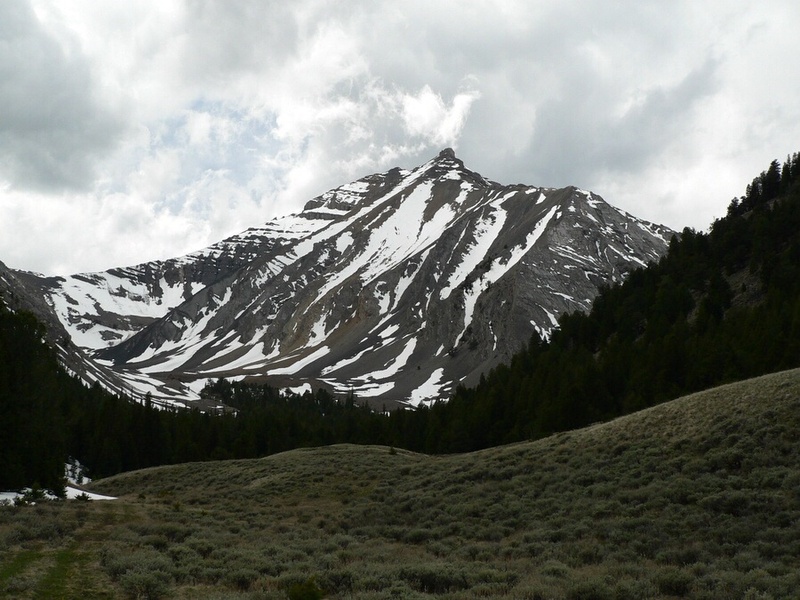 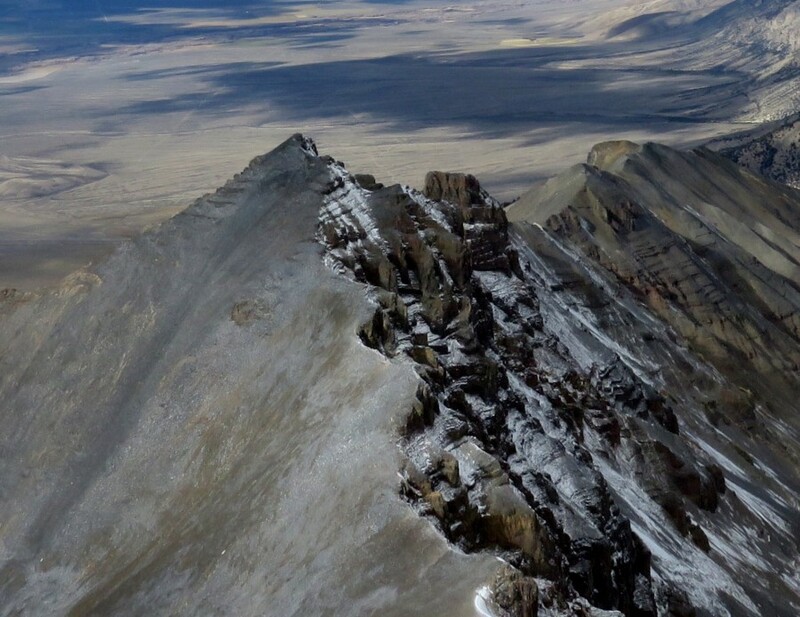 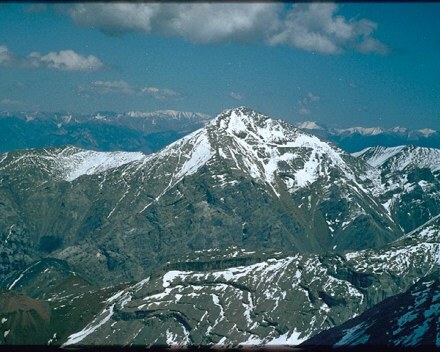 Peak 2887 (Montini Volcano) Snake River Plain 2,887 ft This peak is not in the book. 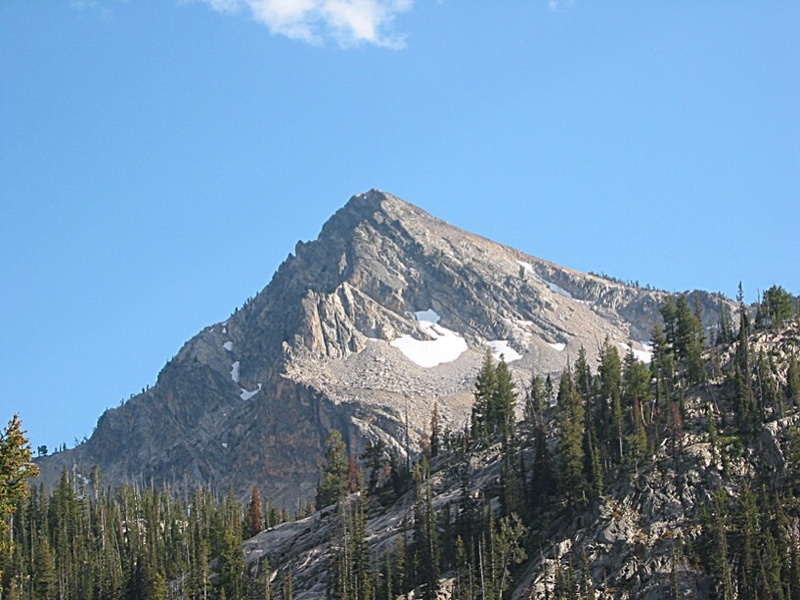 Peak 3793 Boise Mountains 3,793 ft 333 2016 This peak is not in the book. 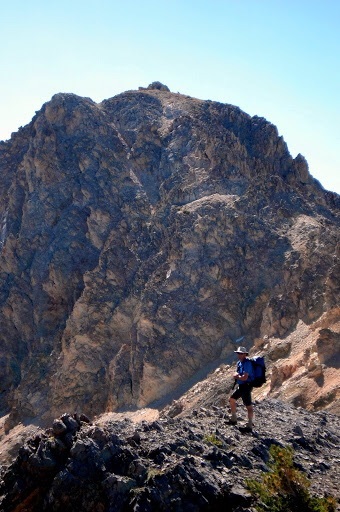 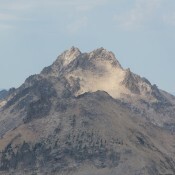 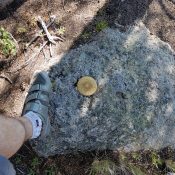 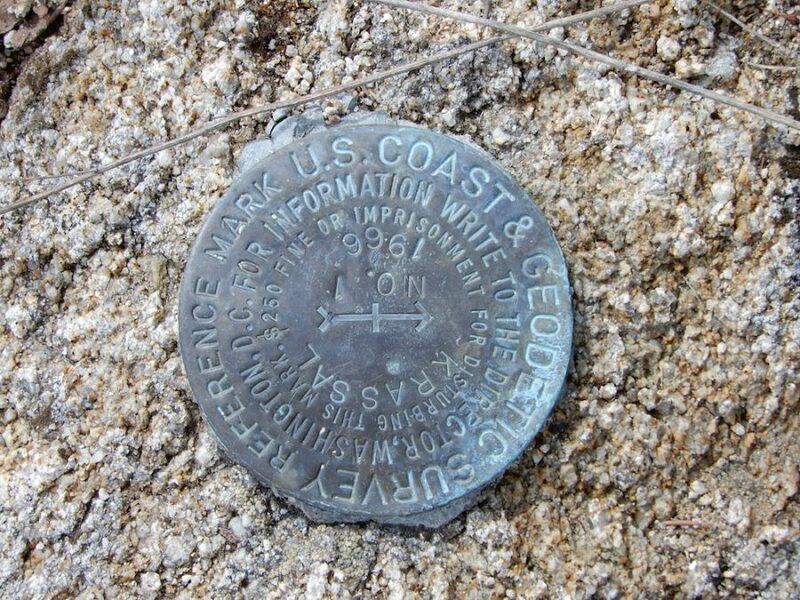 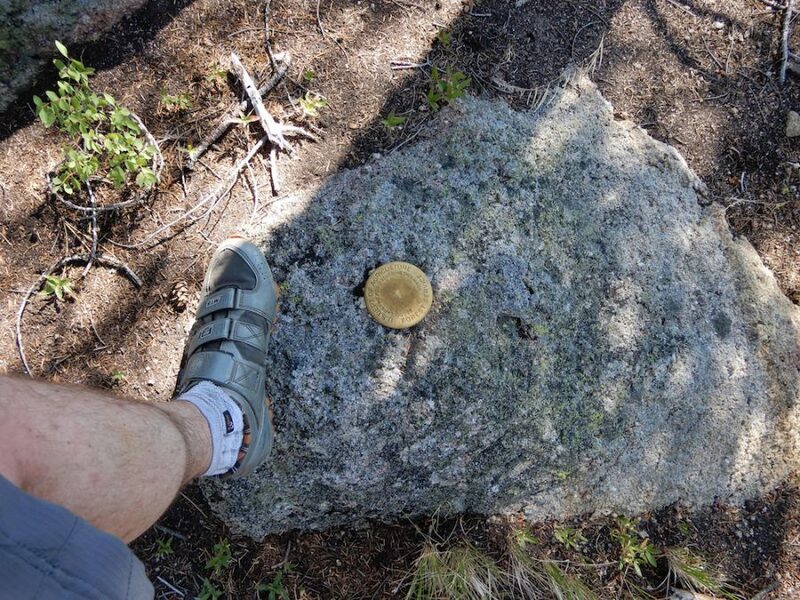 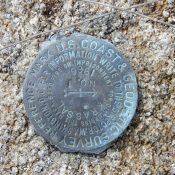 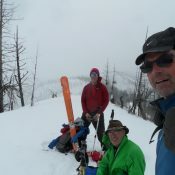 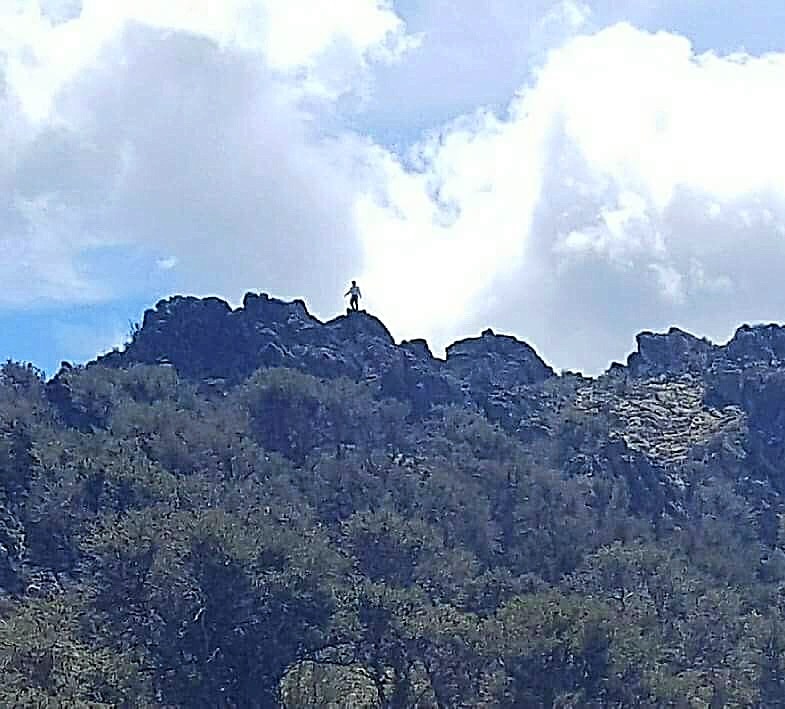 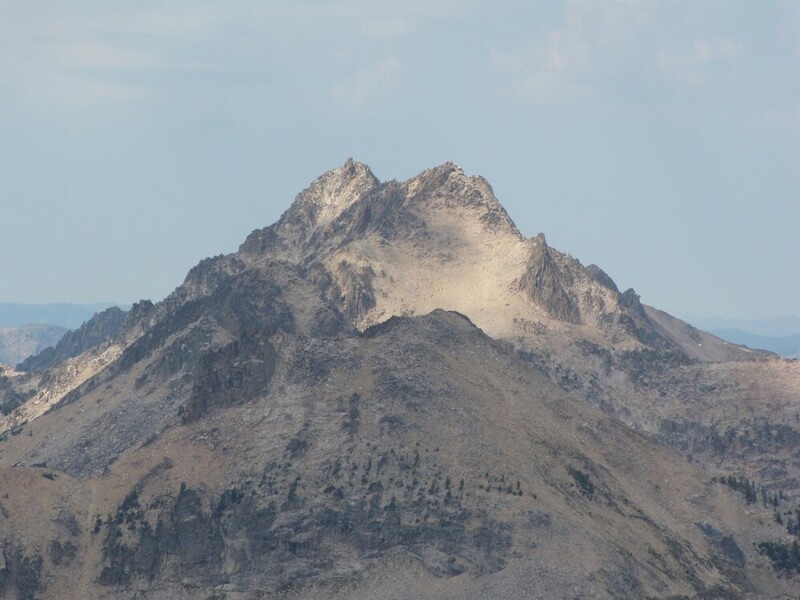 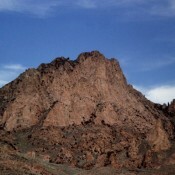 Peak 4008 (Jackson School Butte) Snake River Plain 4,008 ft 2016 This peak is not in the book. 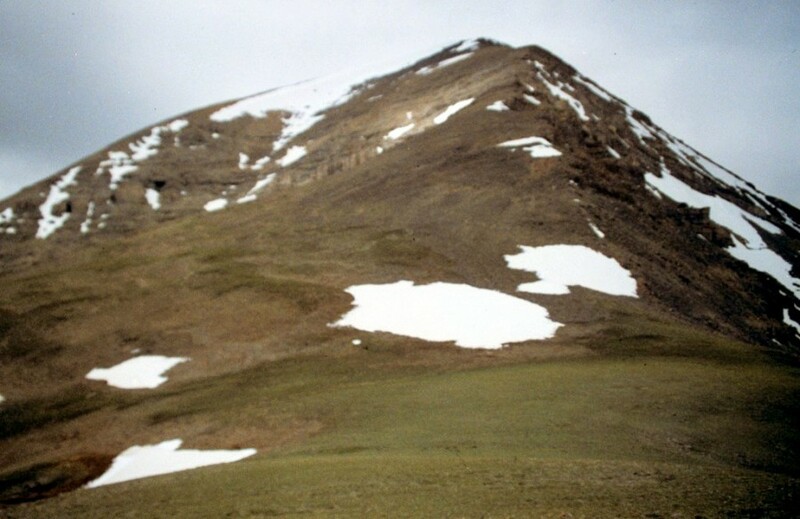 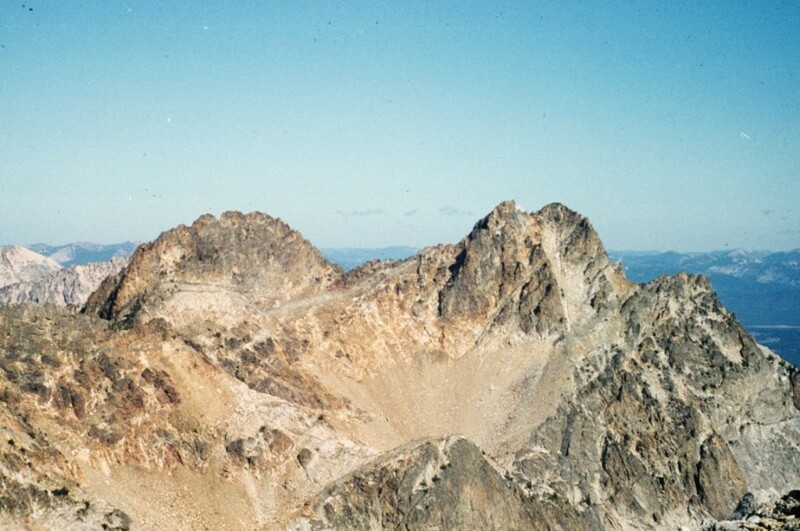 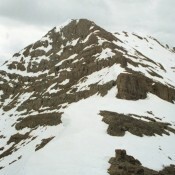 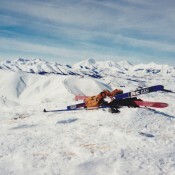 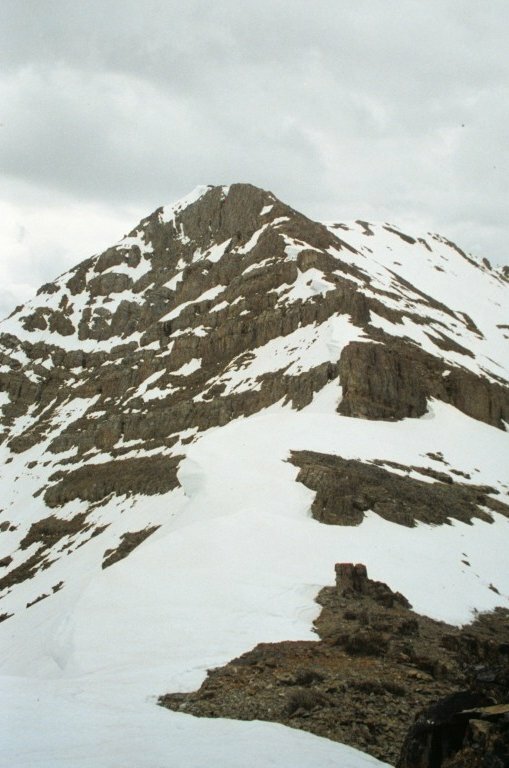 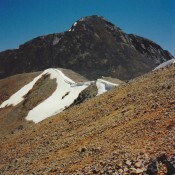 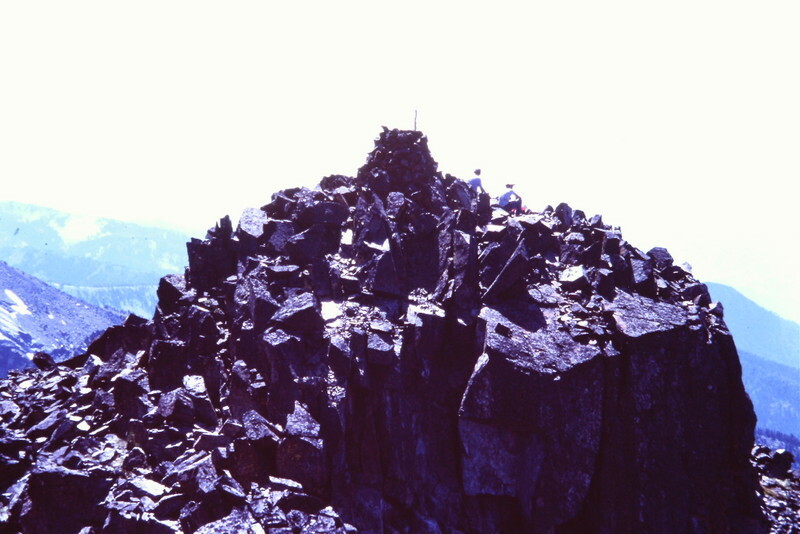 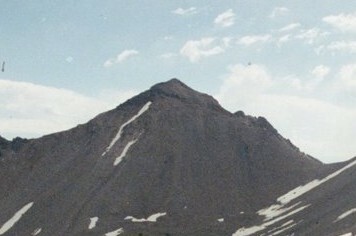 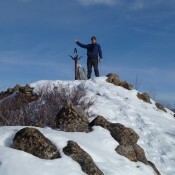 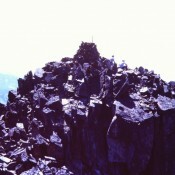 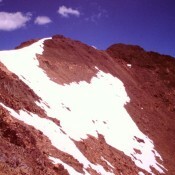 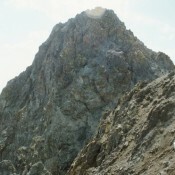 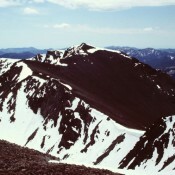 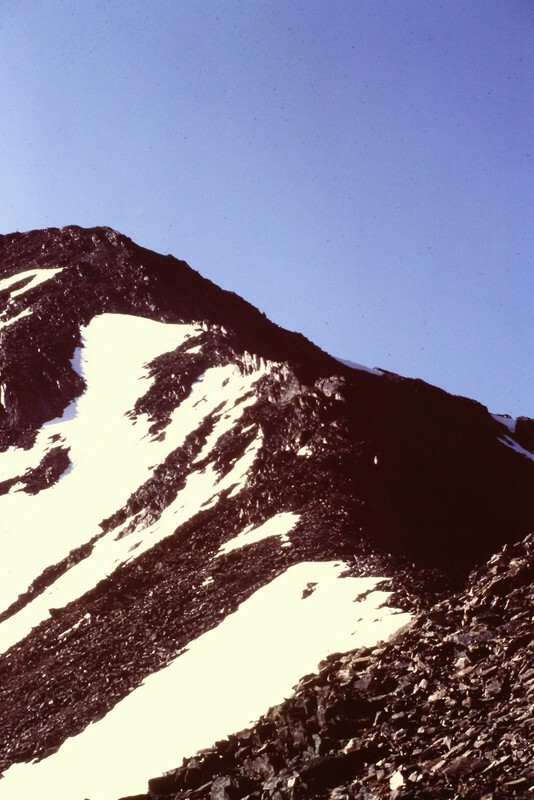 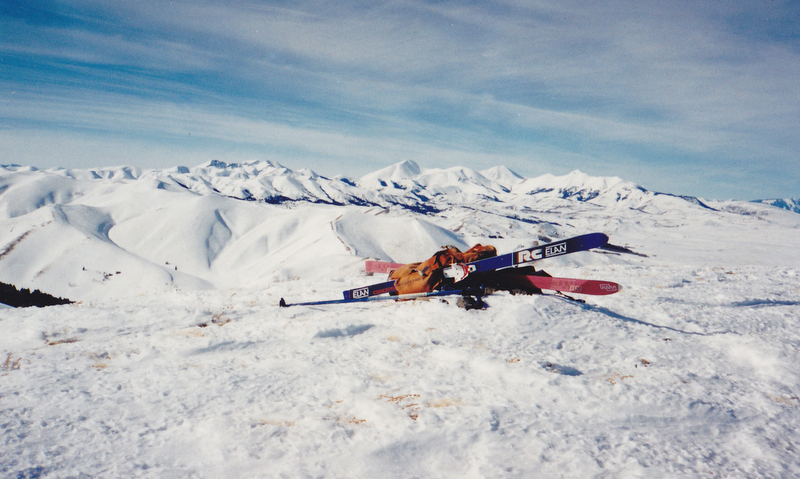 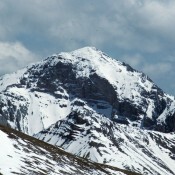 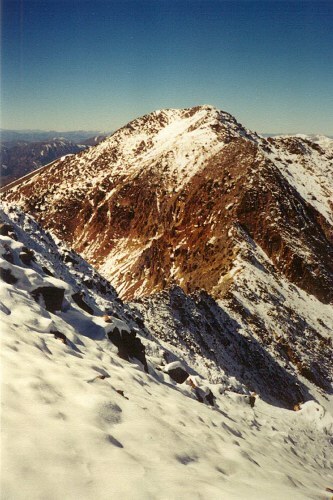 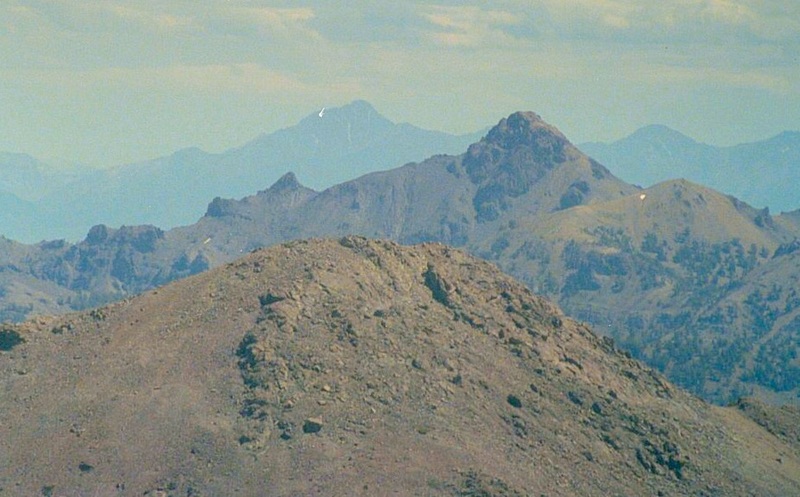 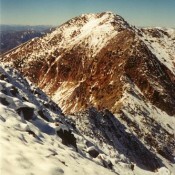 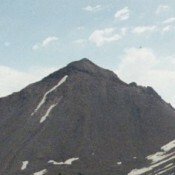 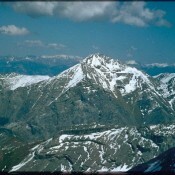 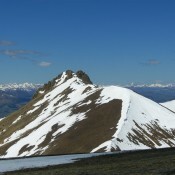 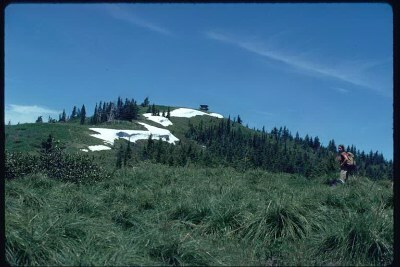 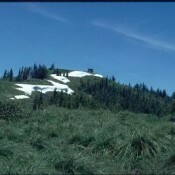 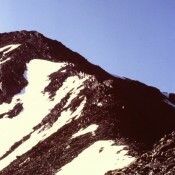 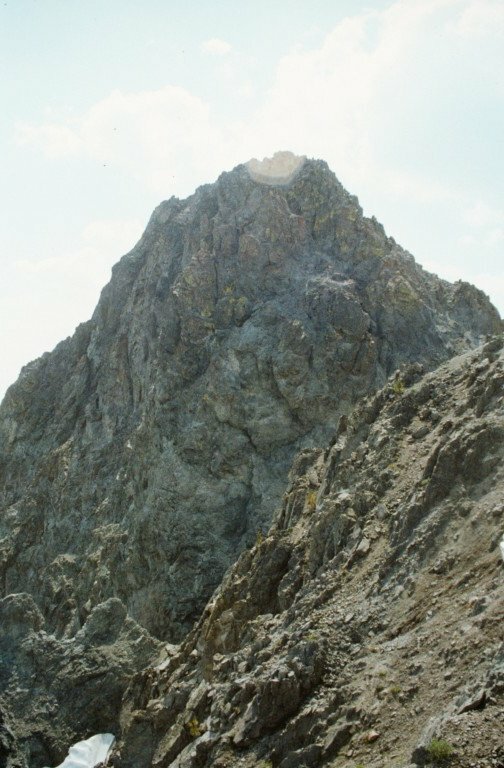 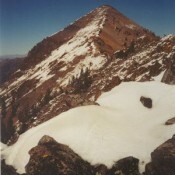 Peak 4375 (Kodiak Peak) Boise Mountains 4,375 ft 606 1998 This Peak is not in the book. 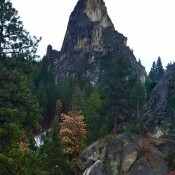 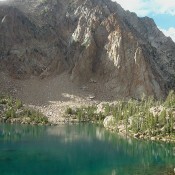 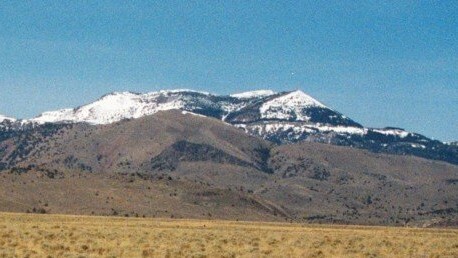 Peak 4700 Boise Mountains 4,700 ft 520 This peak is not in the book. 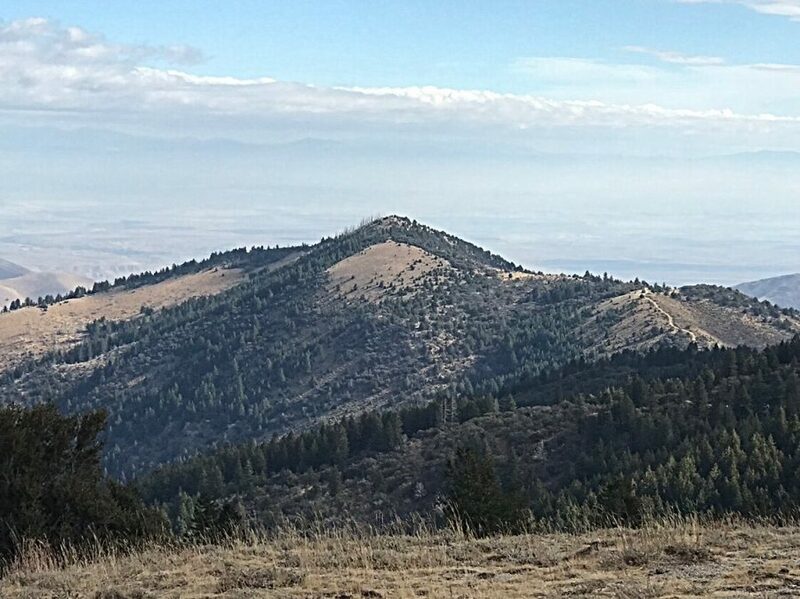 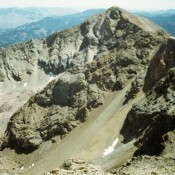 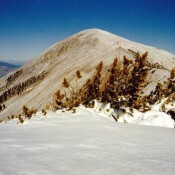 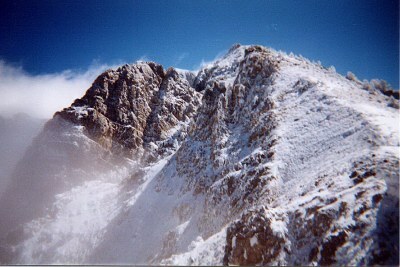 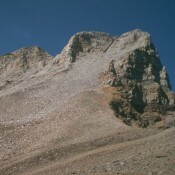 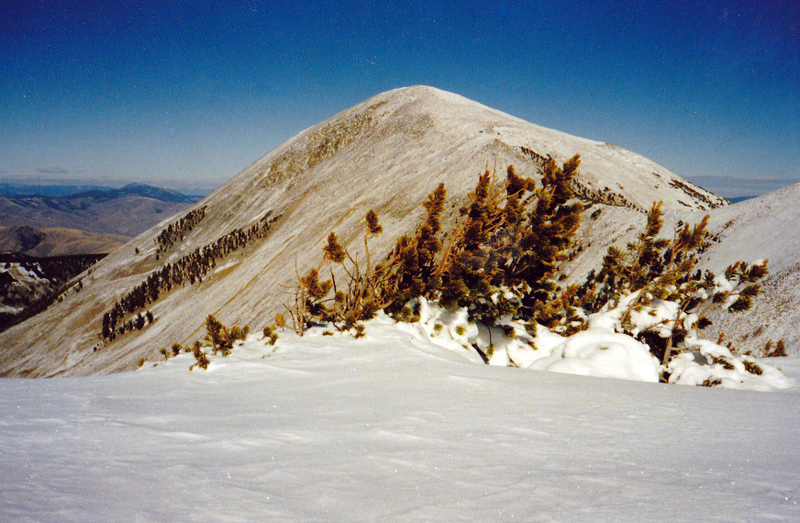 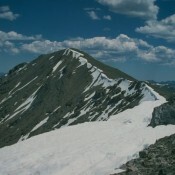 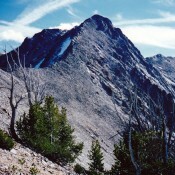 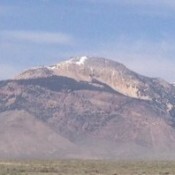 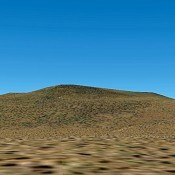 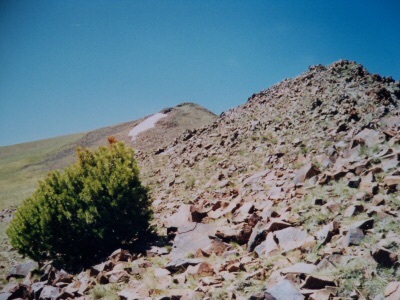 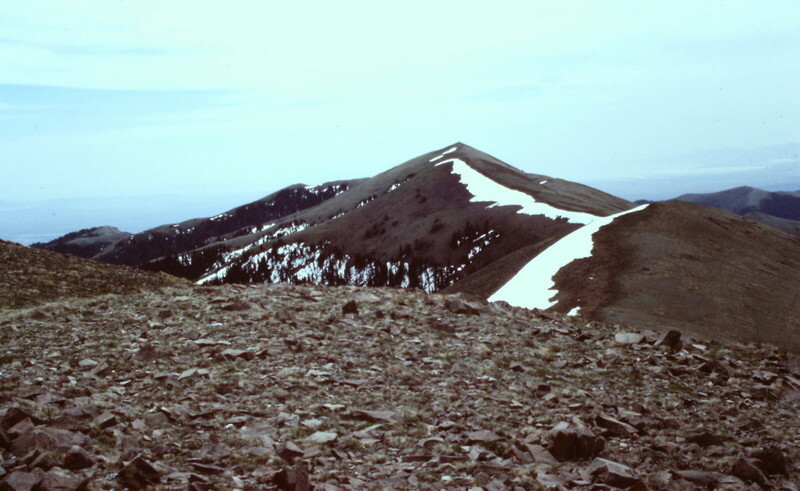 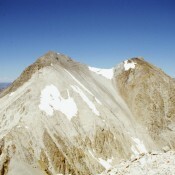 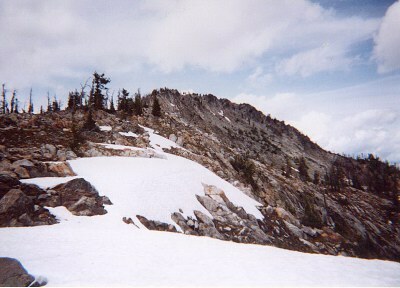 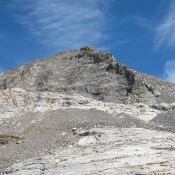 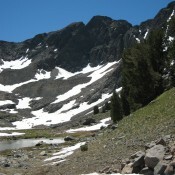 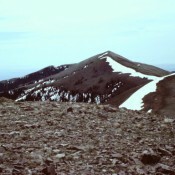 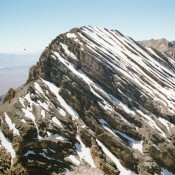 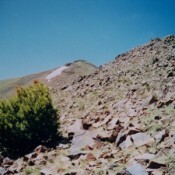 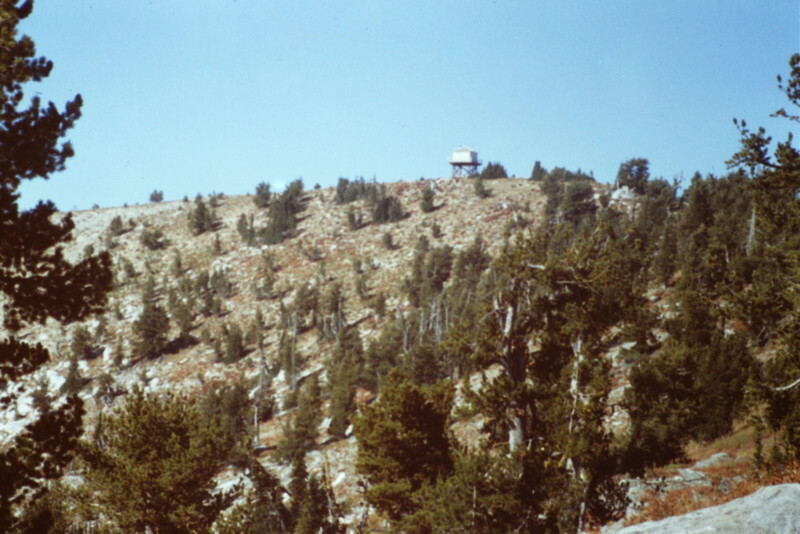 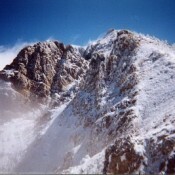 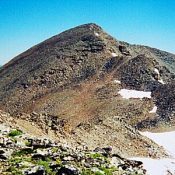 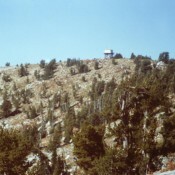 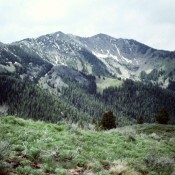 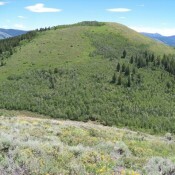 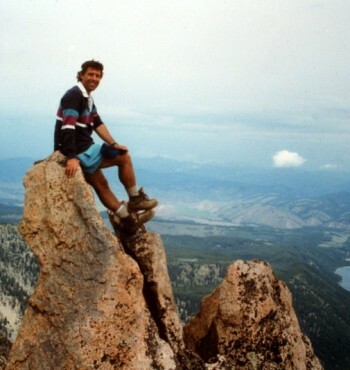 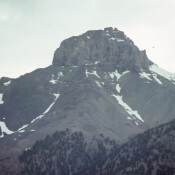 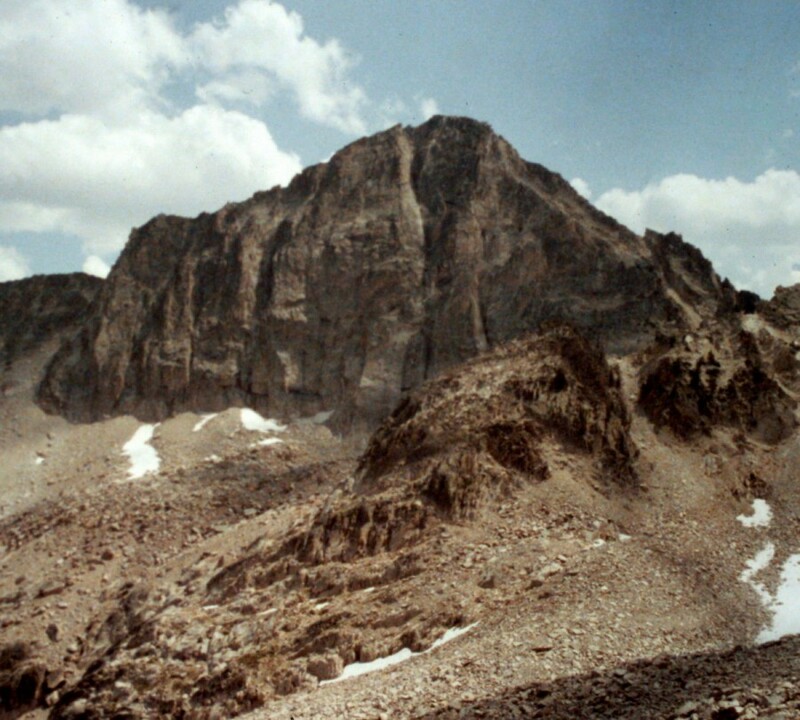 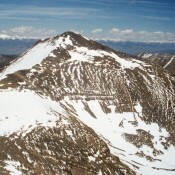 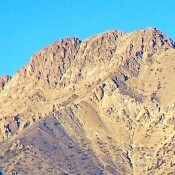 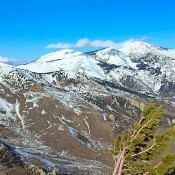 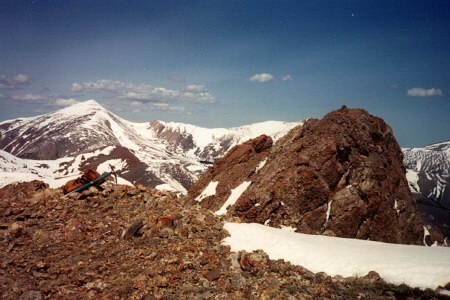 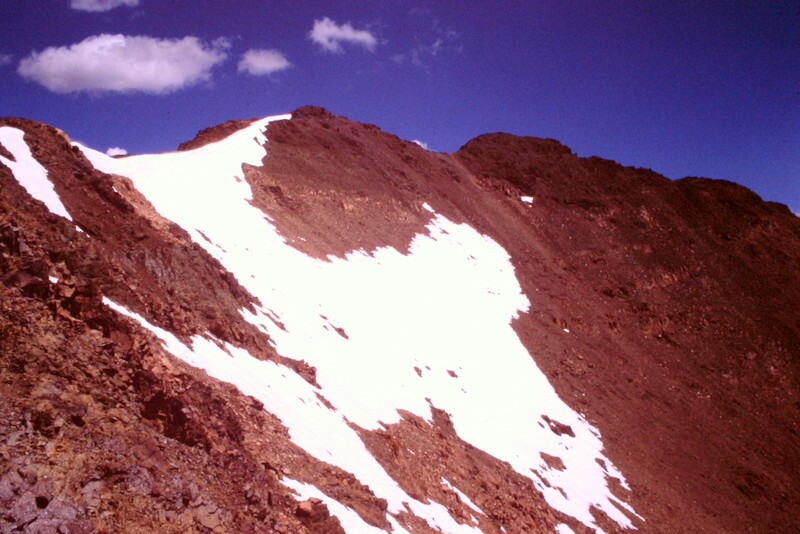 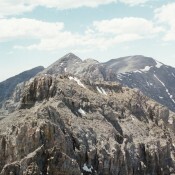 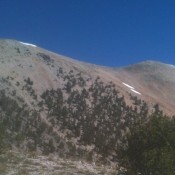 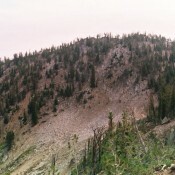 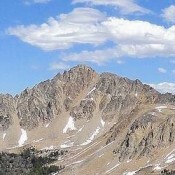 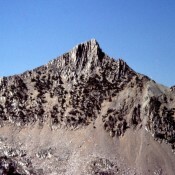 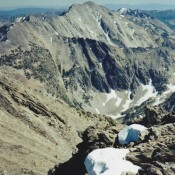 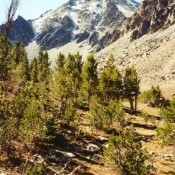 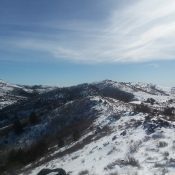 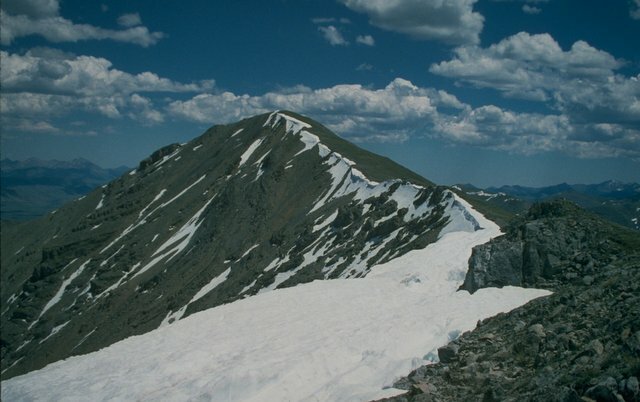 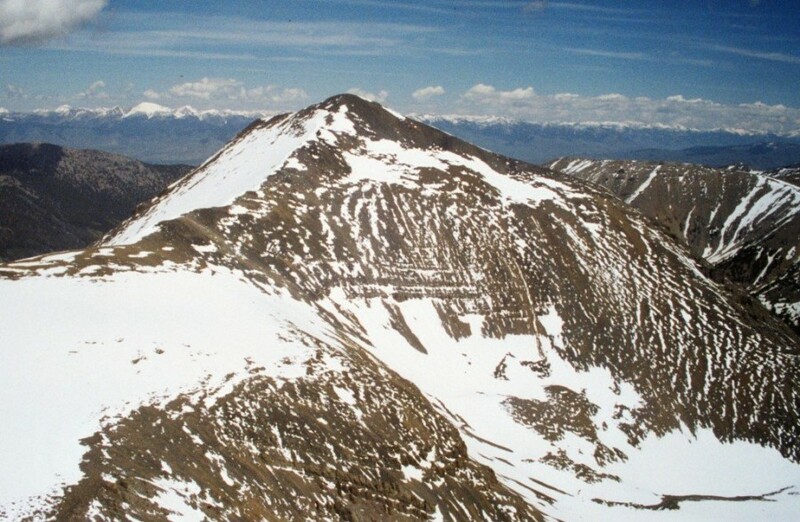 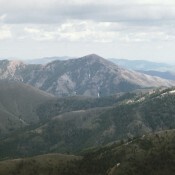 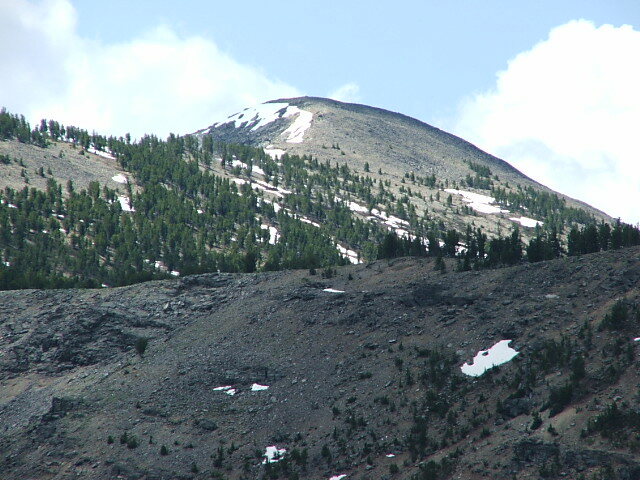 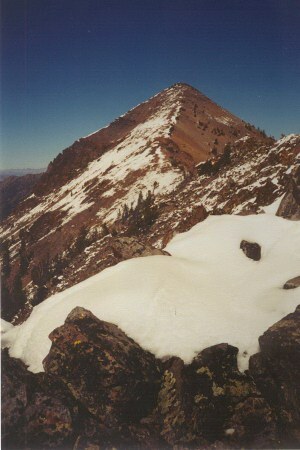 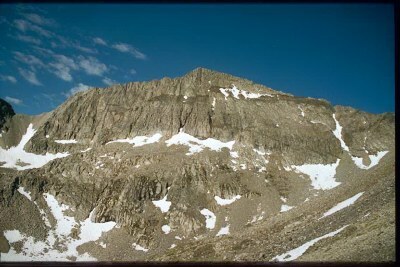 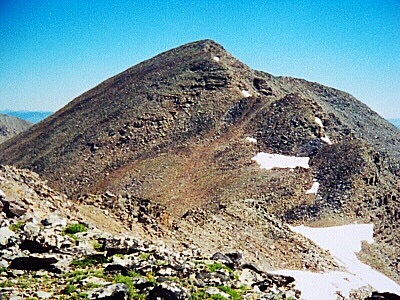 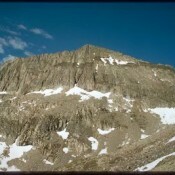 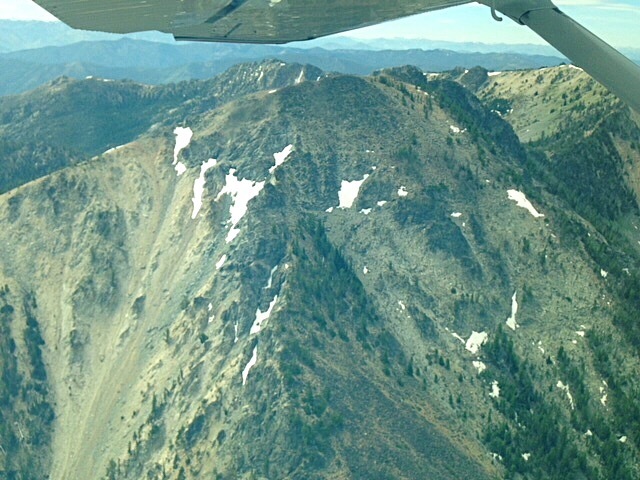 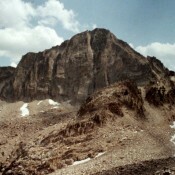 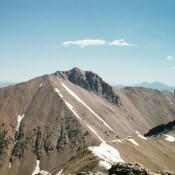 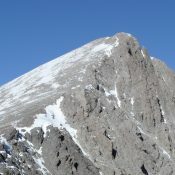 Peak 4960 (Macks Peak) Boise Mountains 4,960 ft 300 2004 This peak is not in the book. 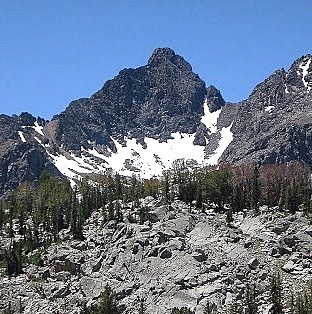 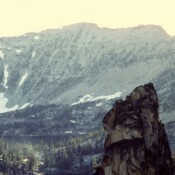 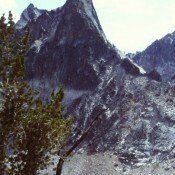 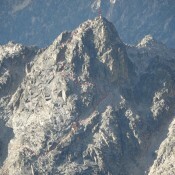 Peak 8091 (Gobblers Knob) Bear River Range 8,091 ft This peak is not in the book. 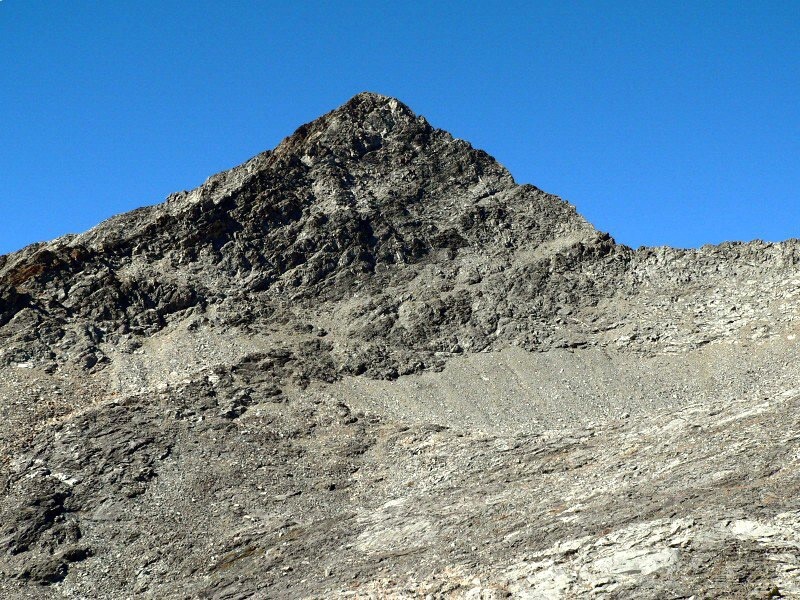 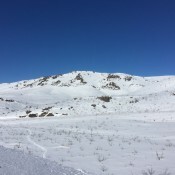 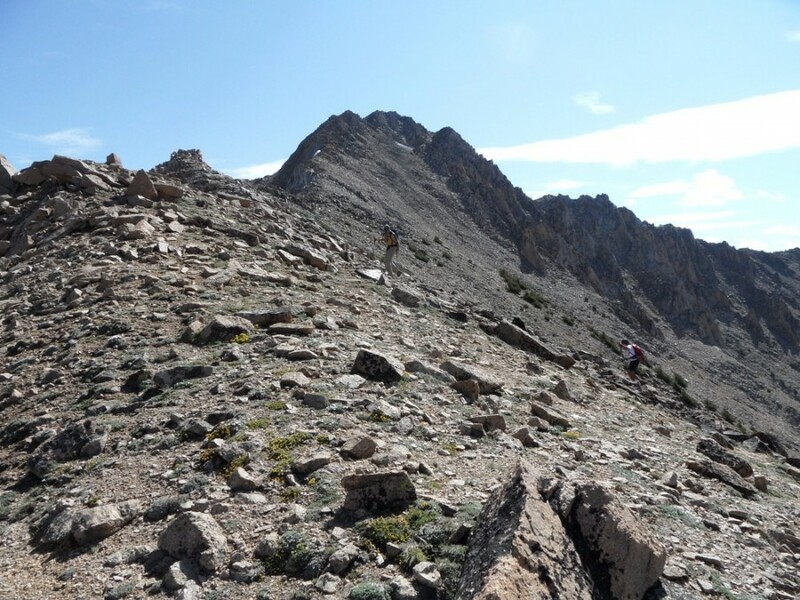 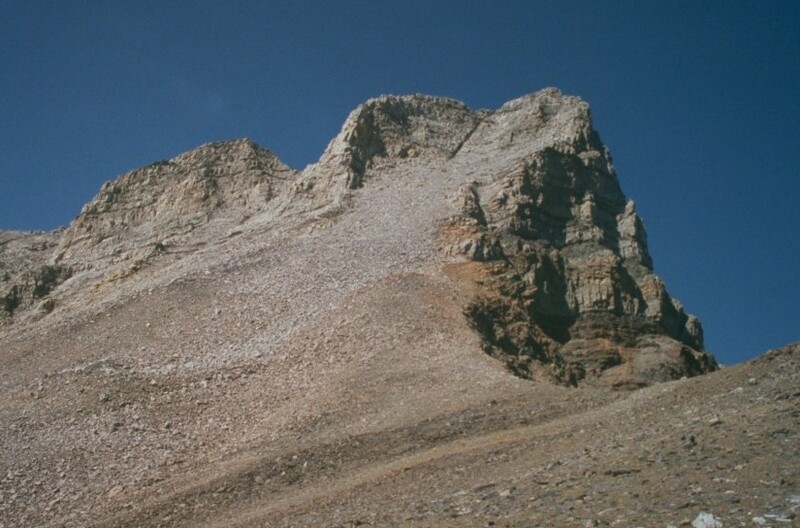 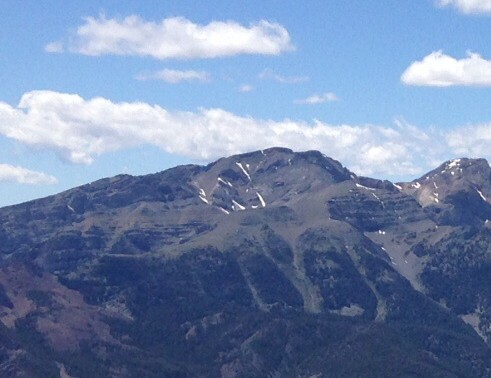 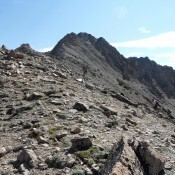 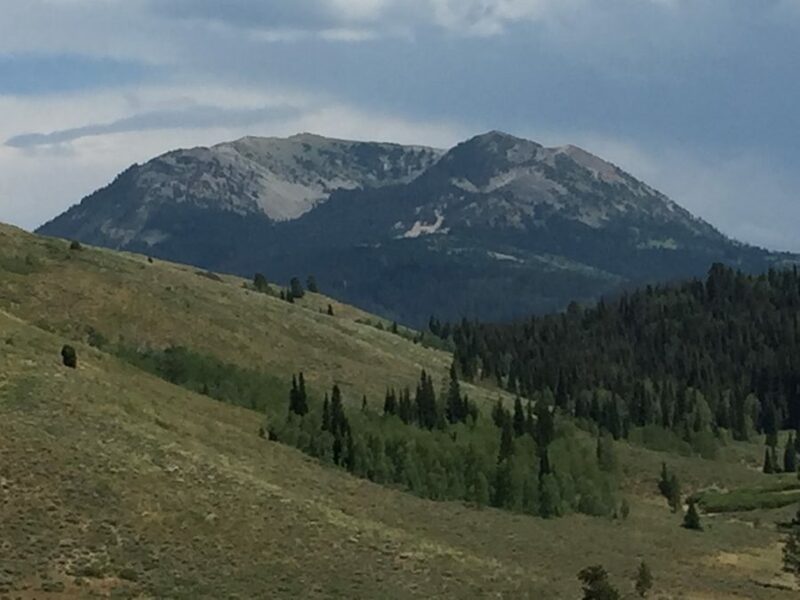 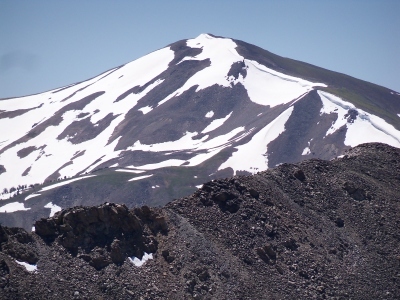 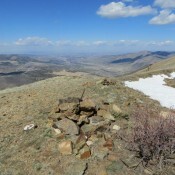 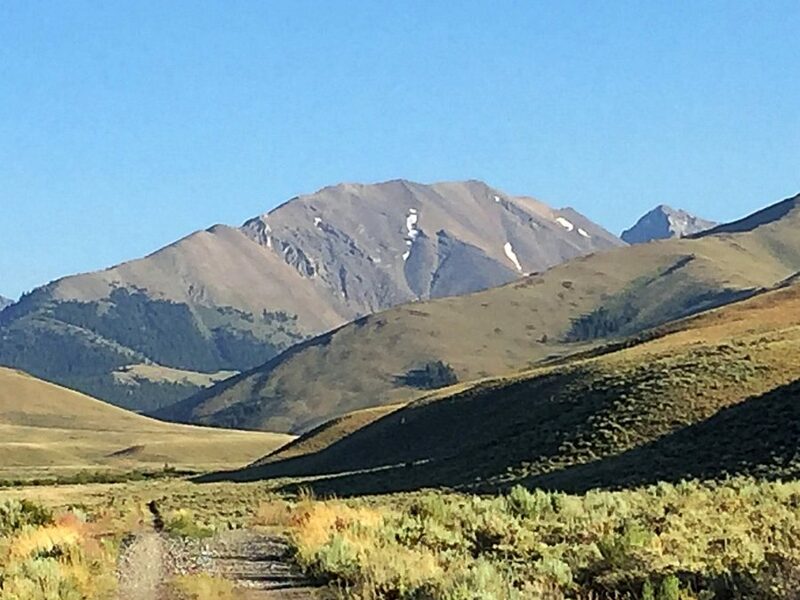 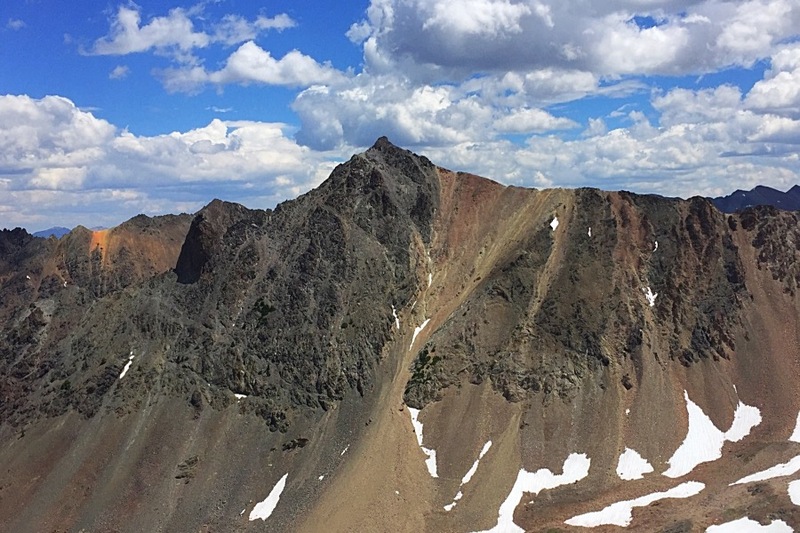 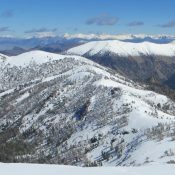 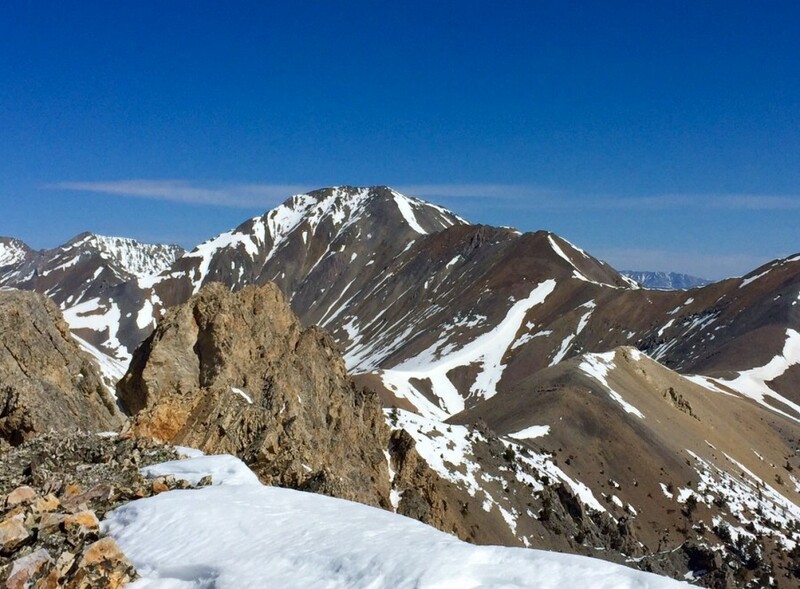 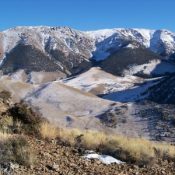 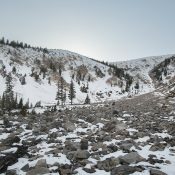 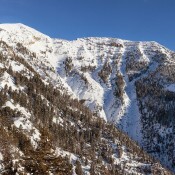 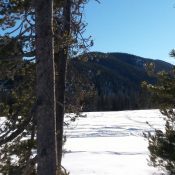 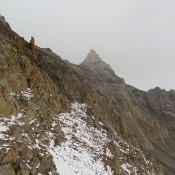 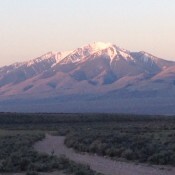 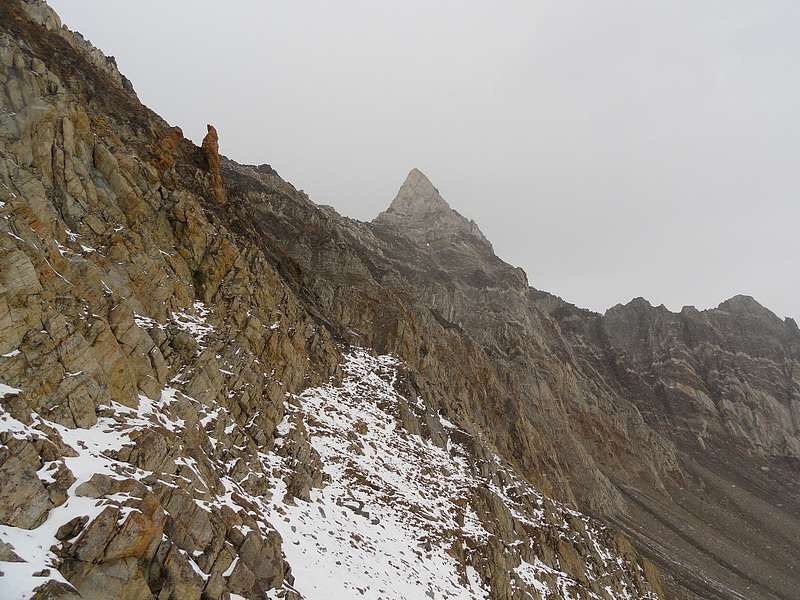 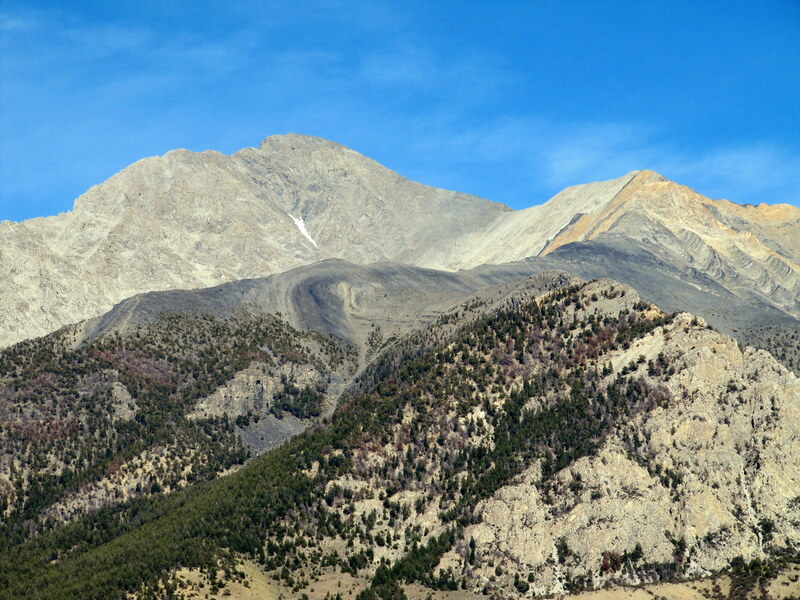 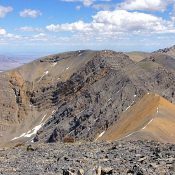 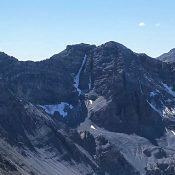 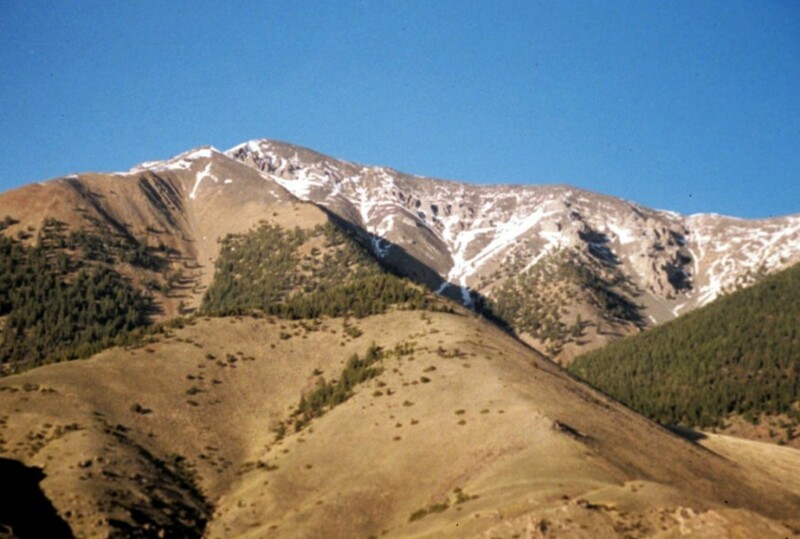 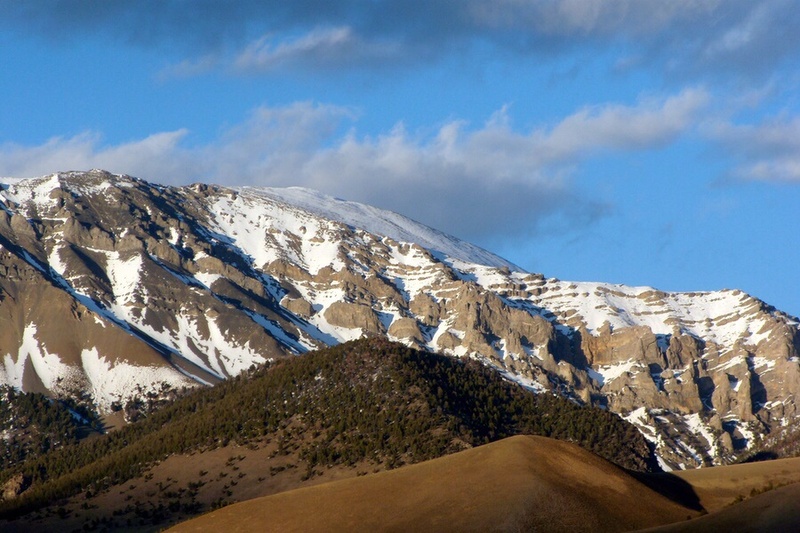 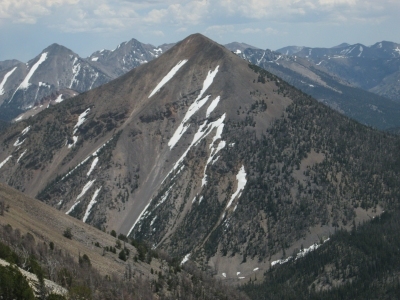 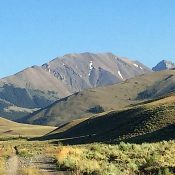 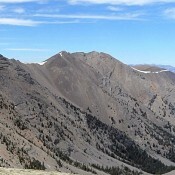 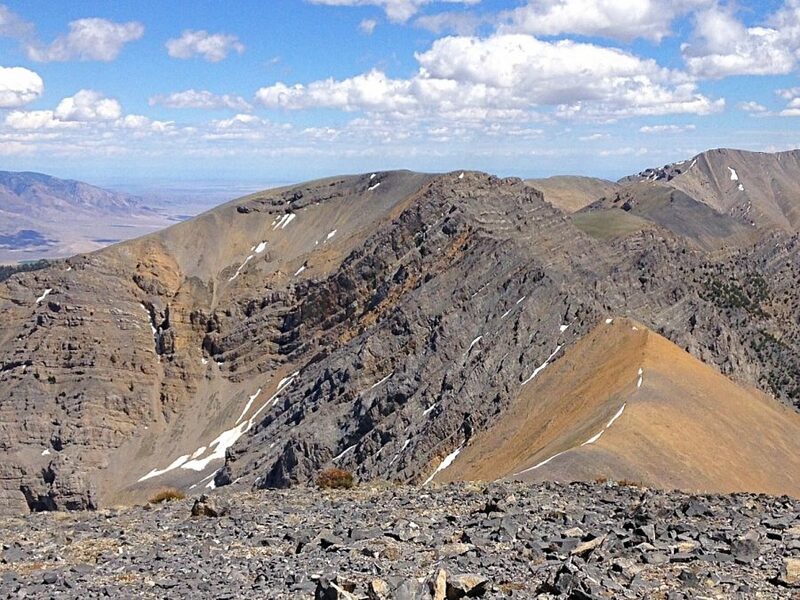 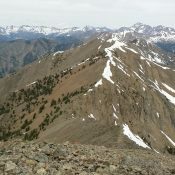 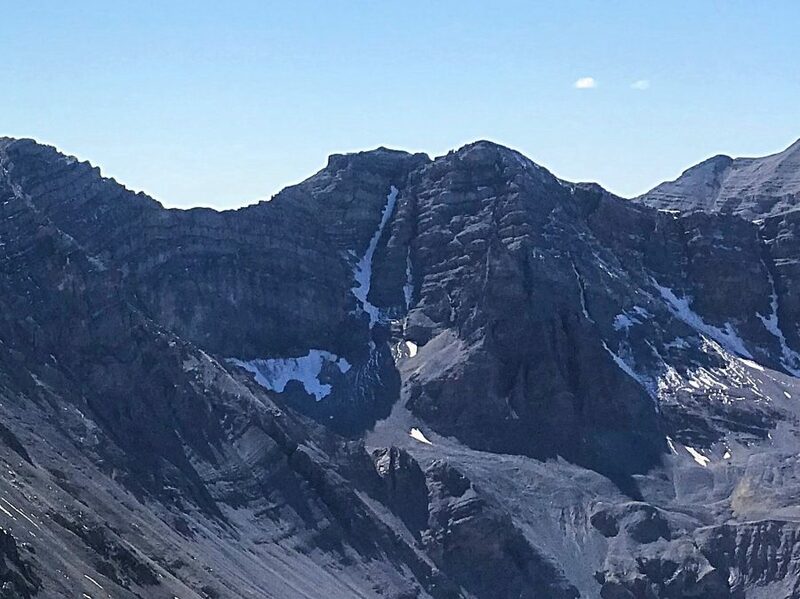 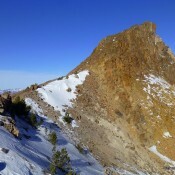 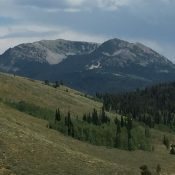 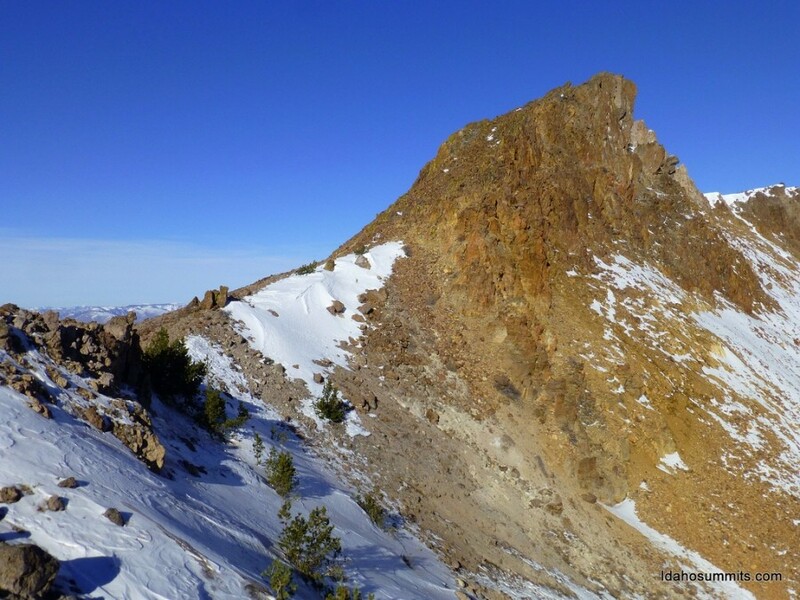 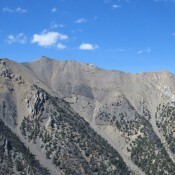 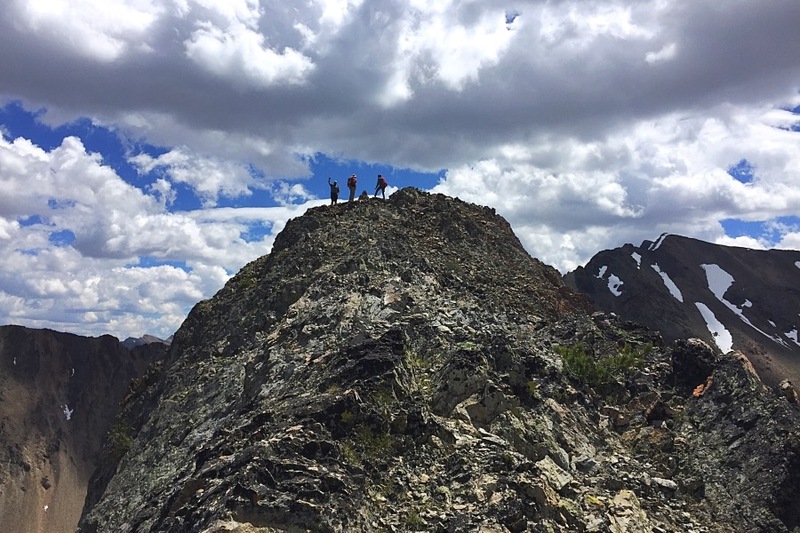 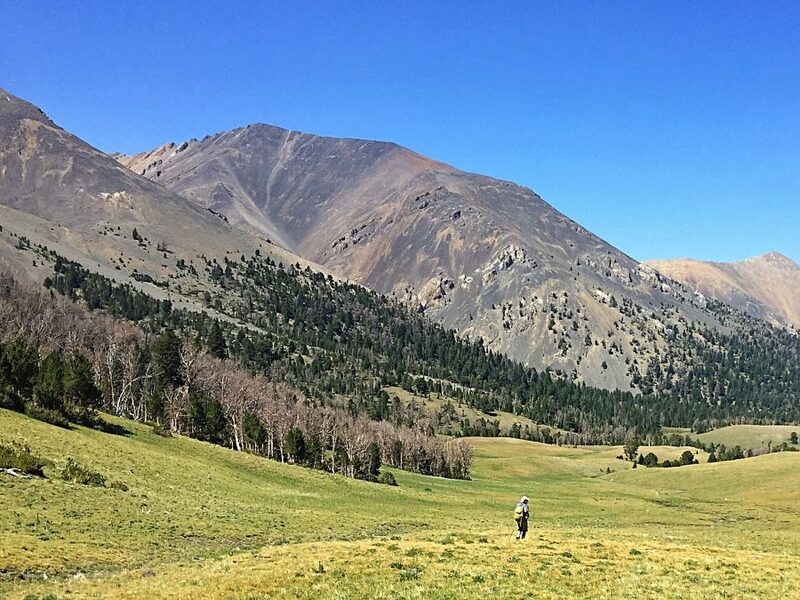 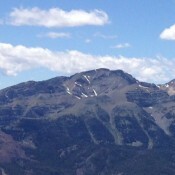 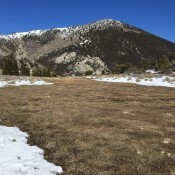 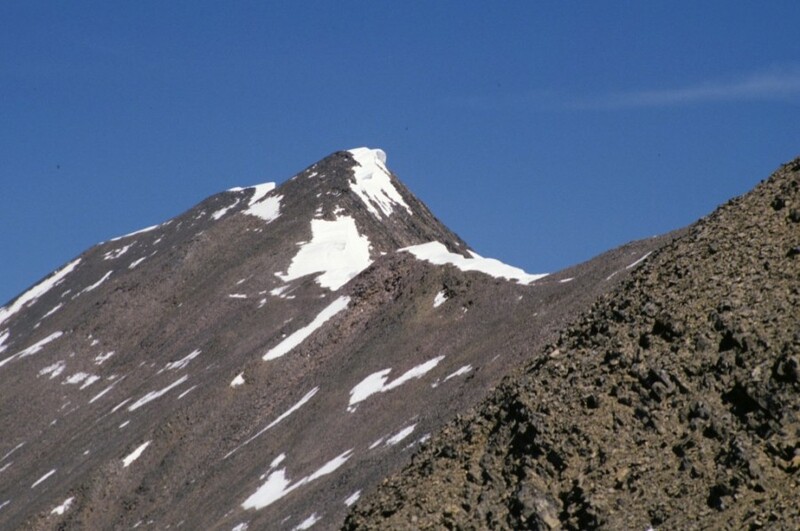 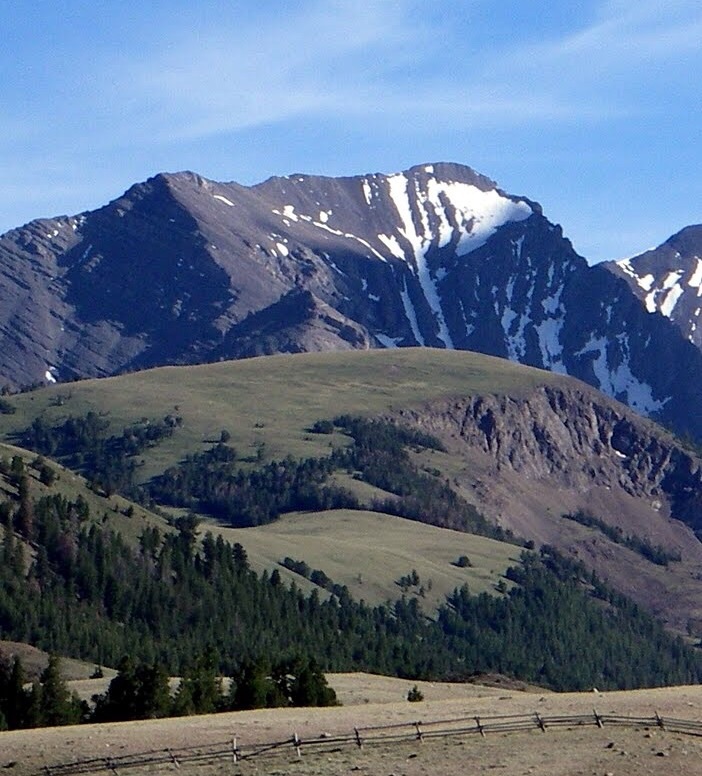 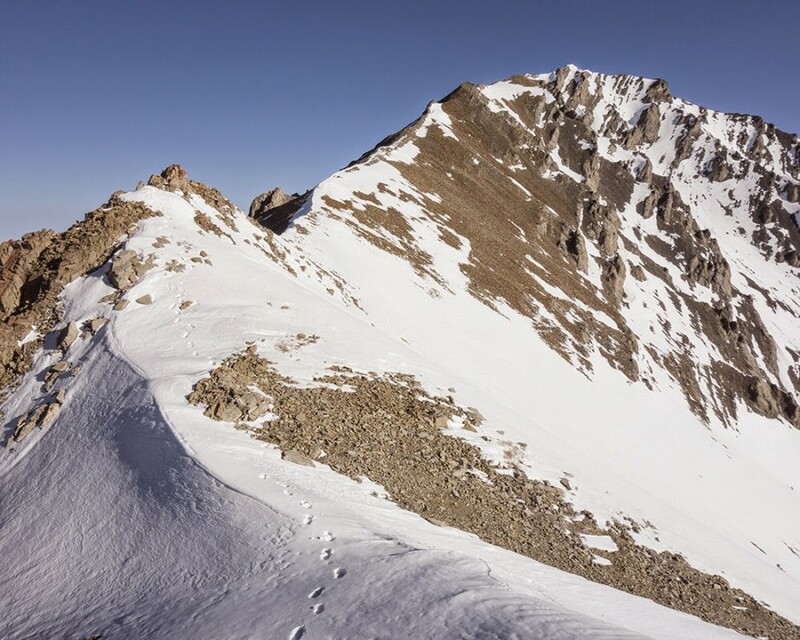 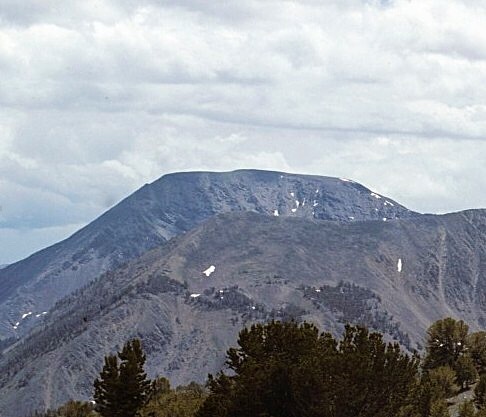 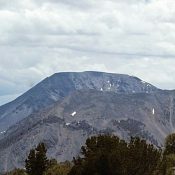 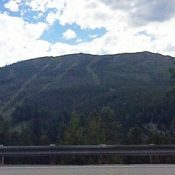 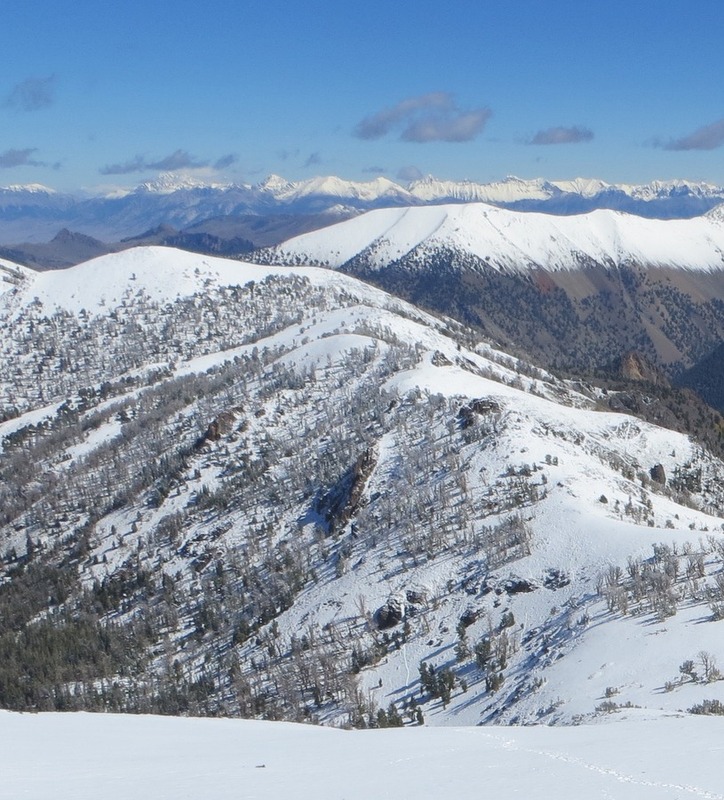 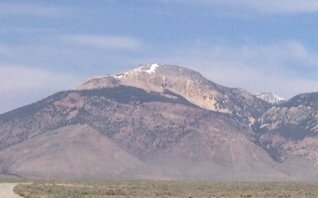 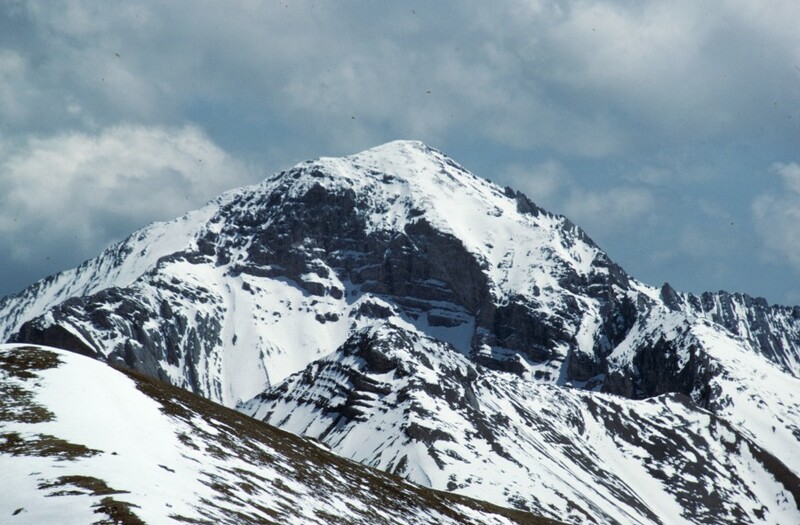 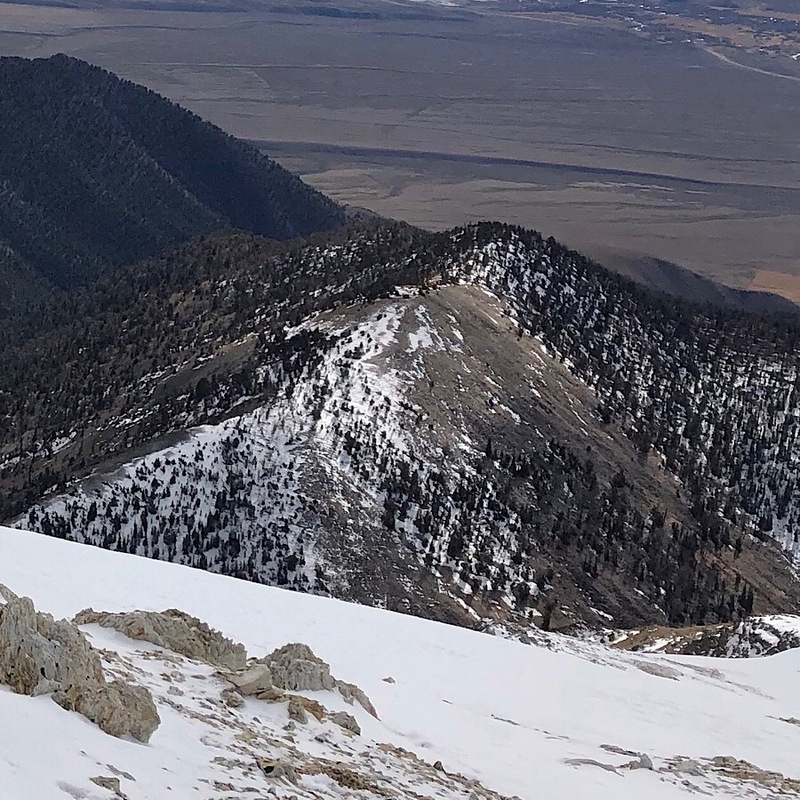 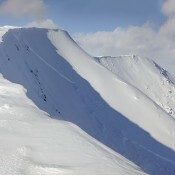 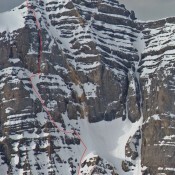 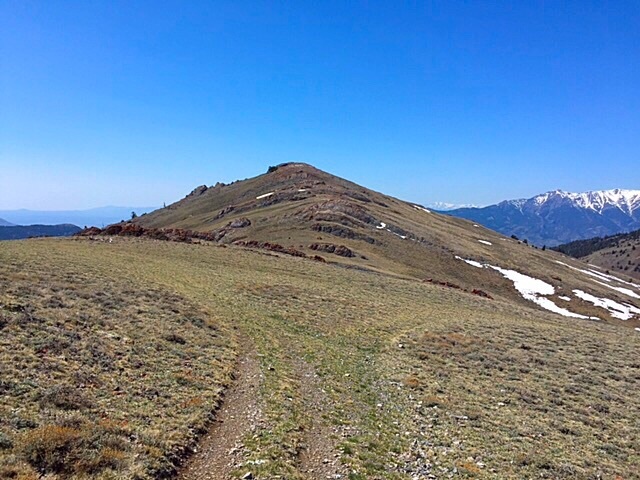 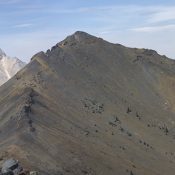 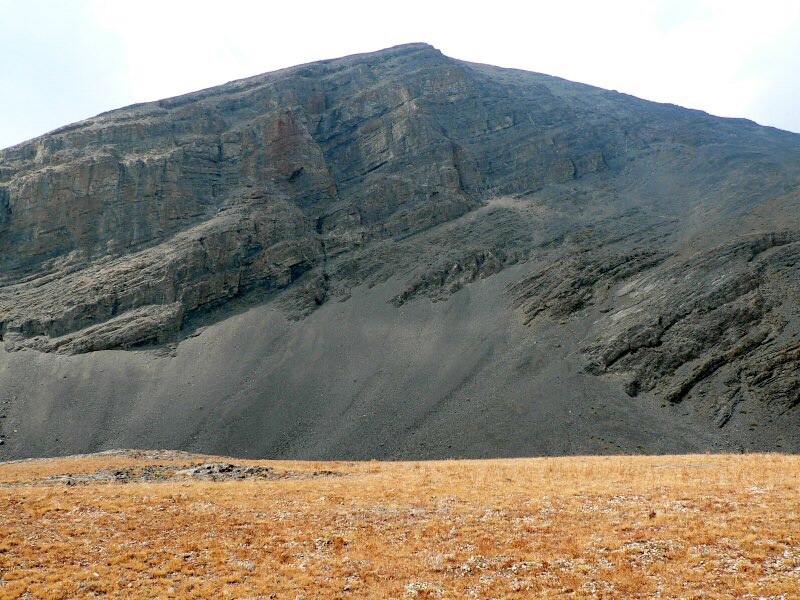 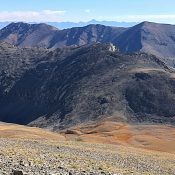 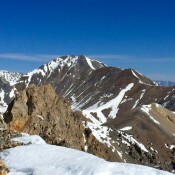 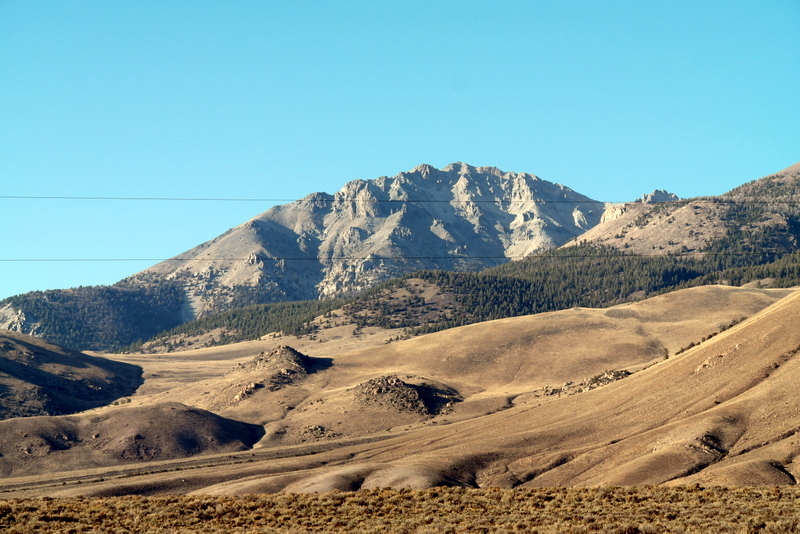 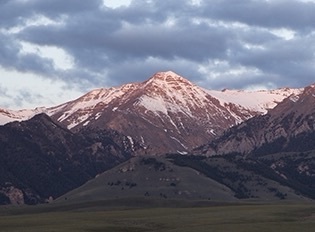 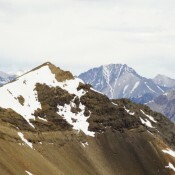 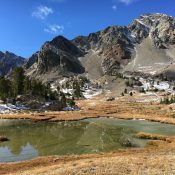 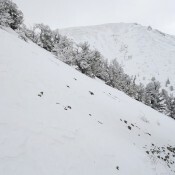 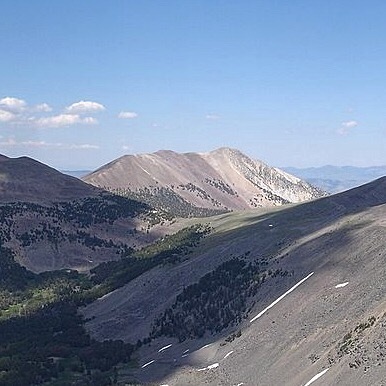 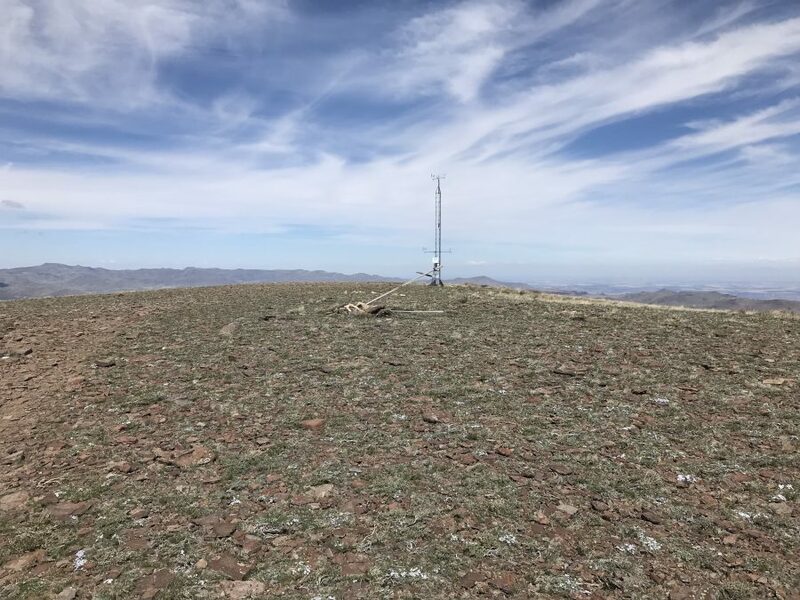 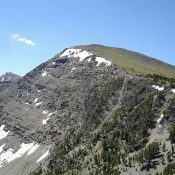 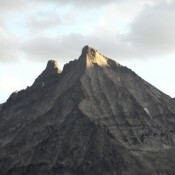 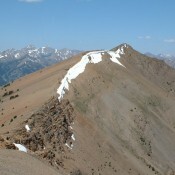 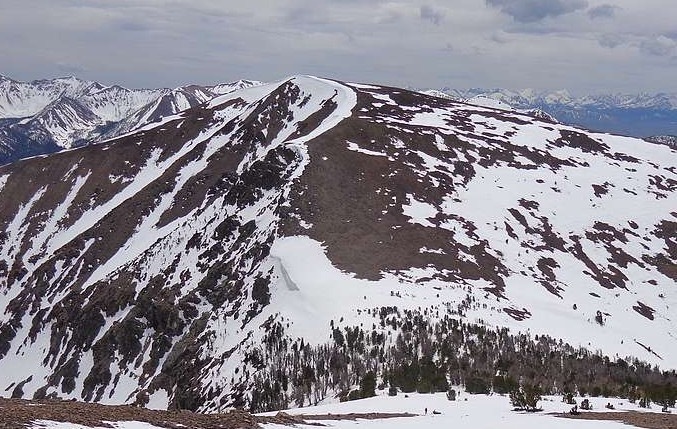 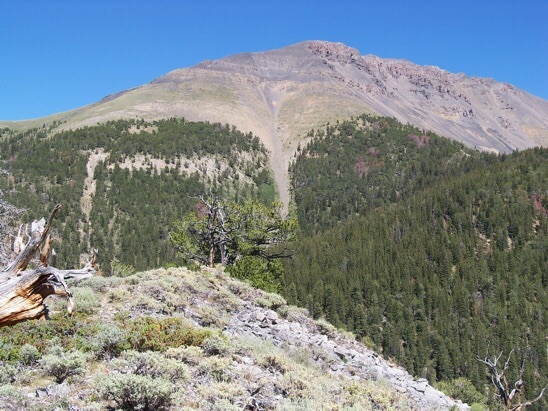 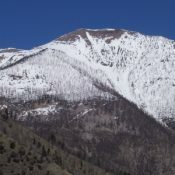 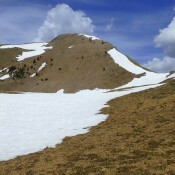 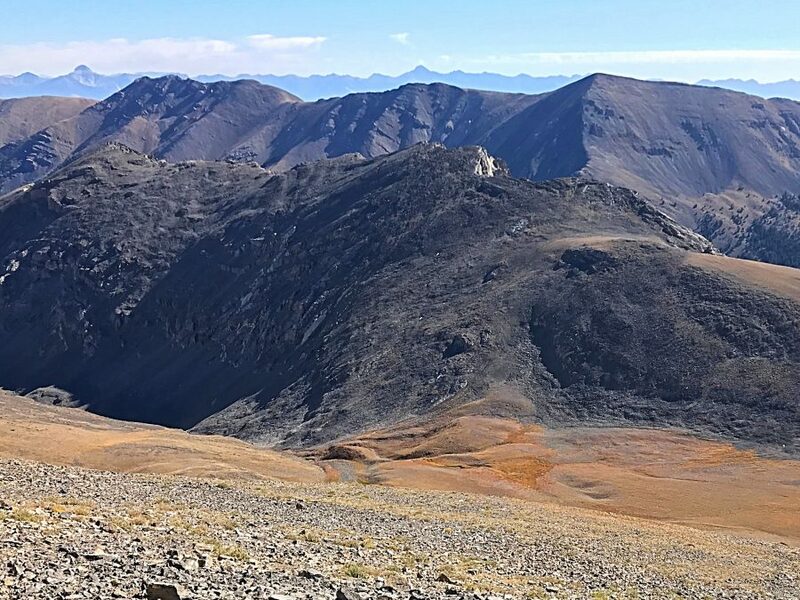 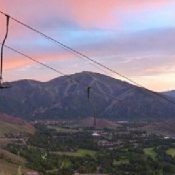 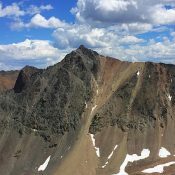 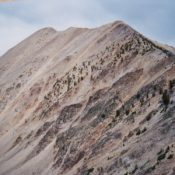 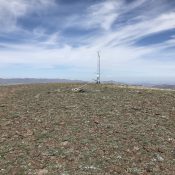 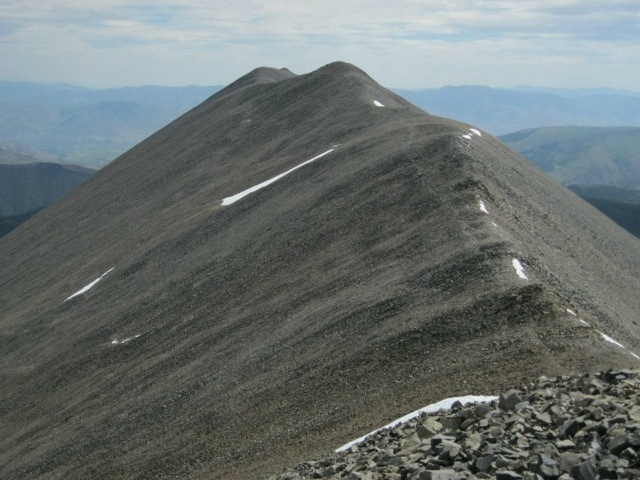 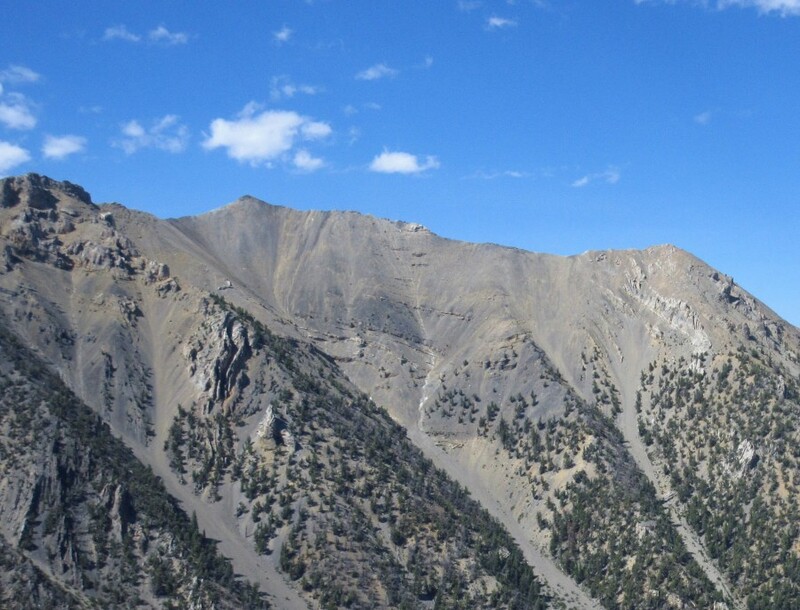 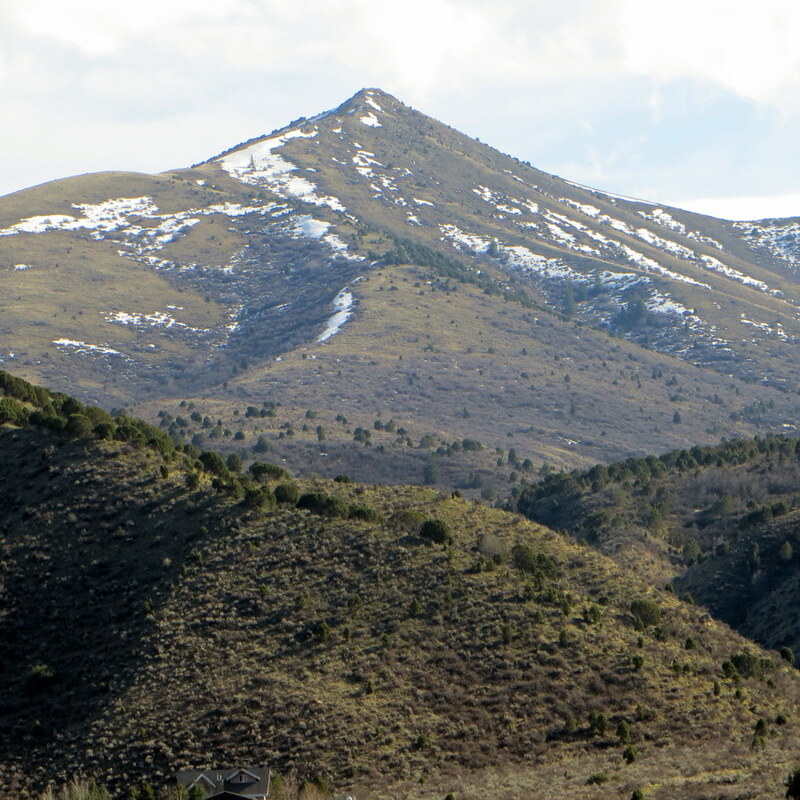 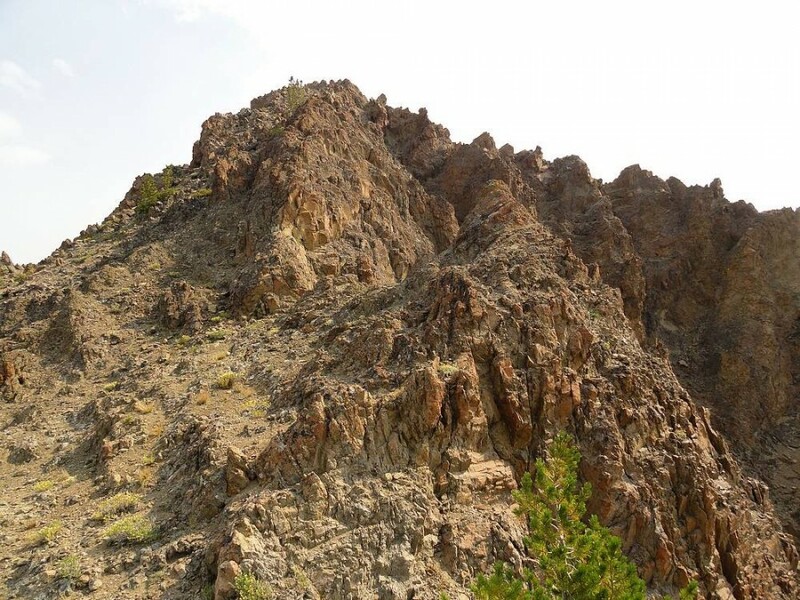 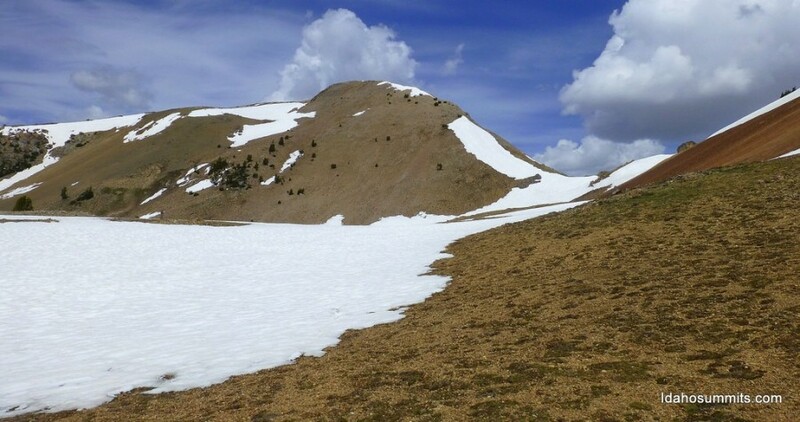 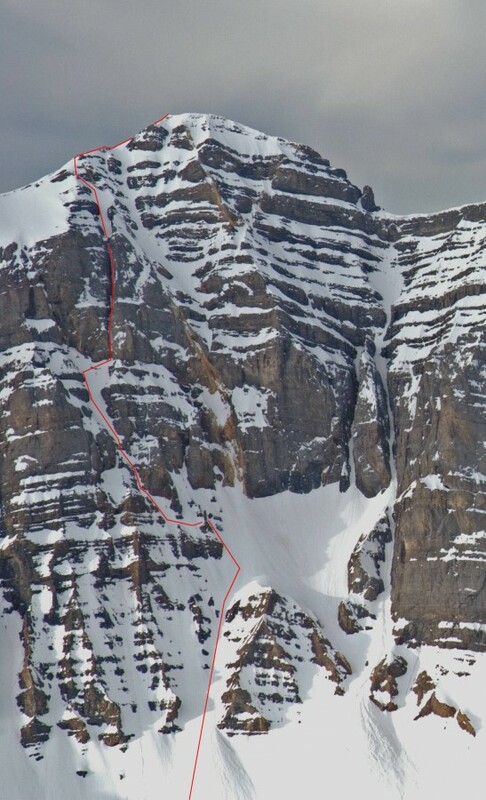 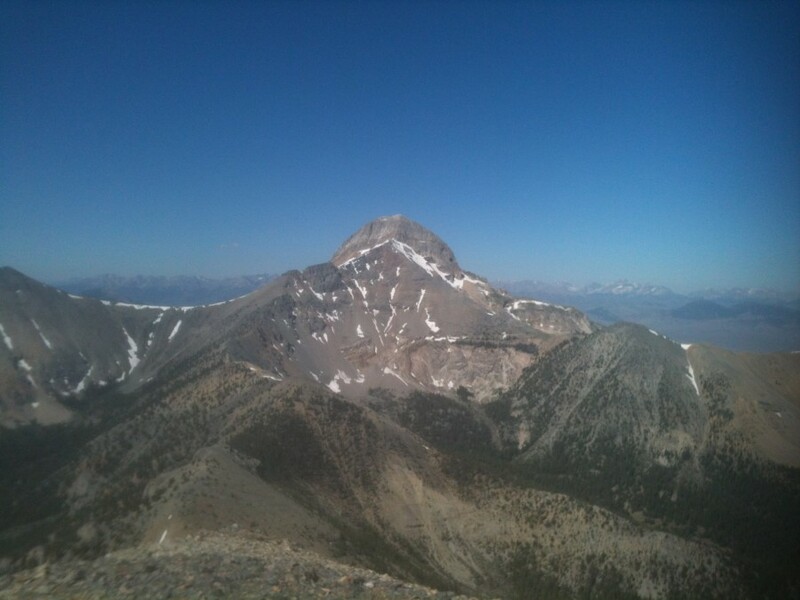 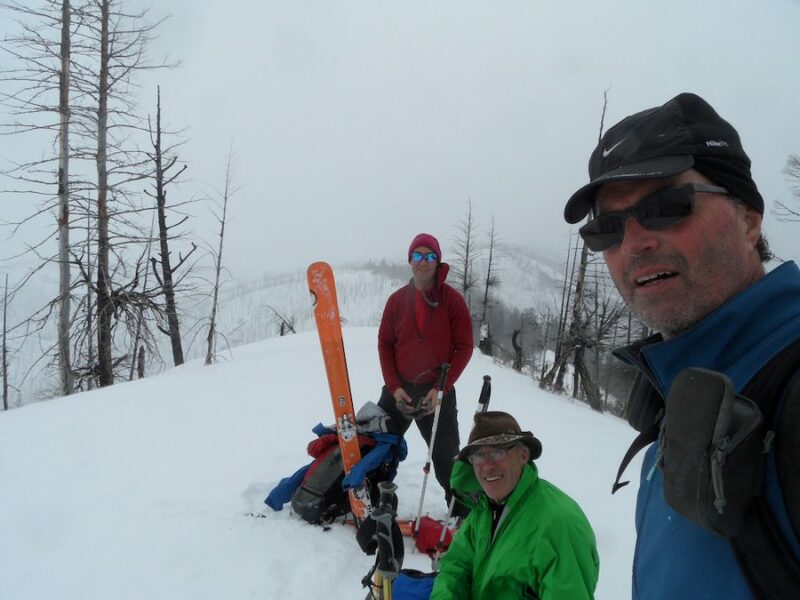 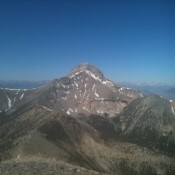 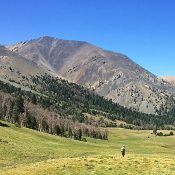 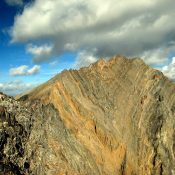 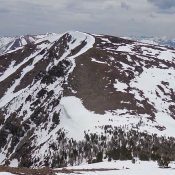 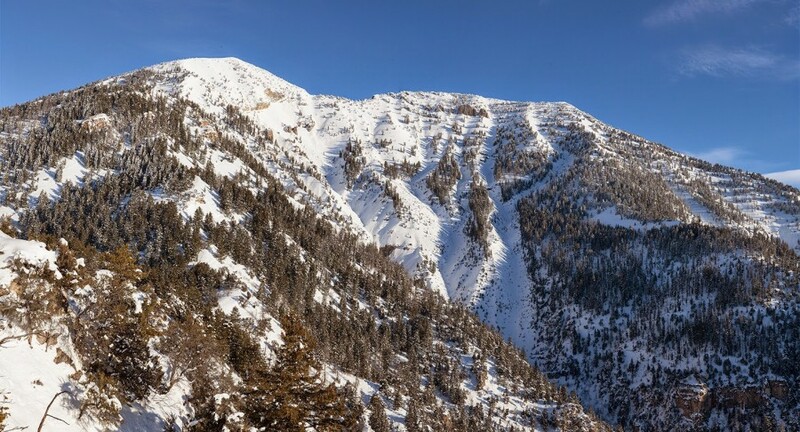 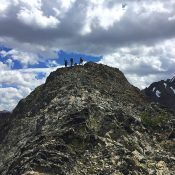 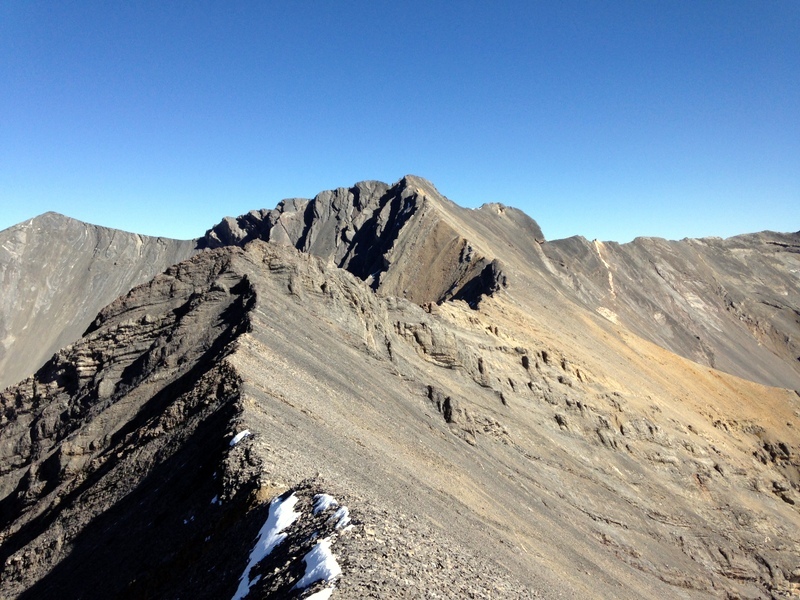 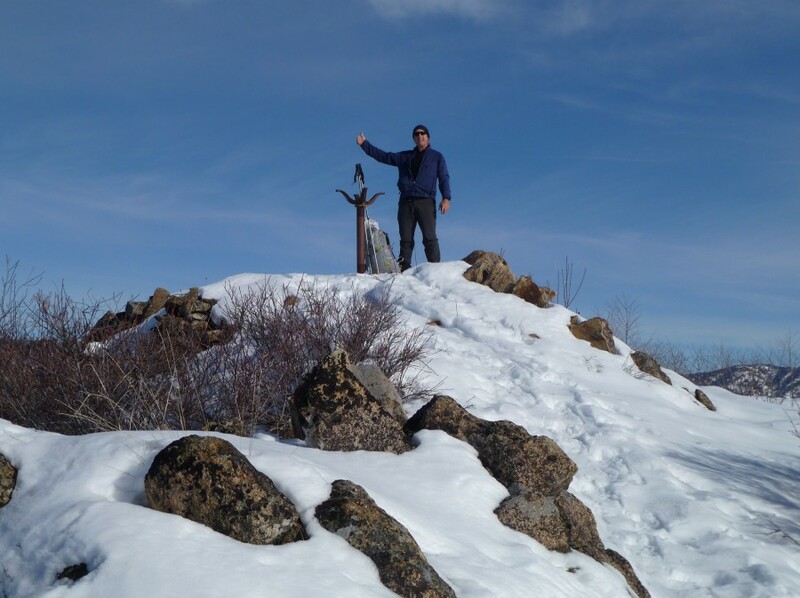 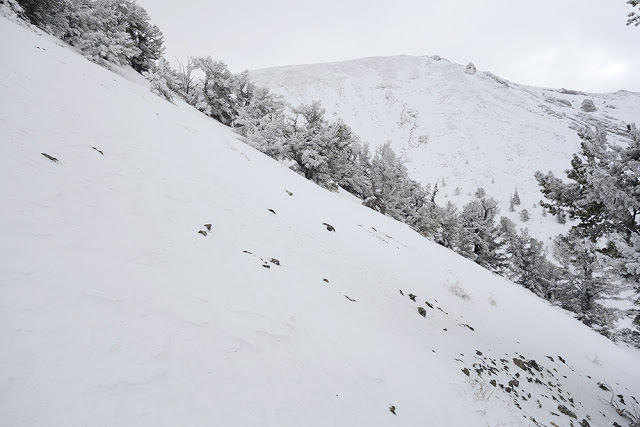 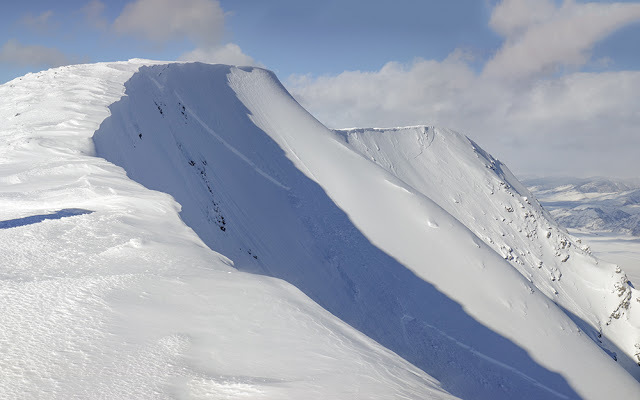 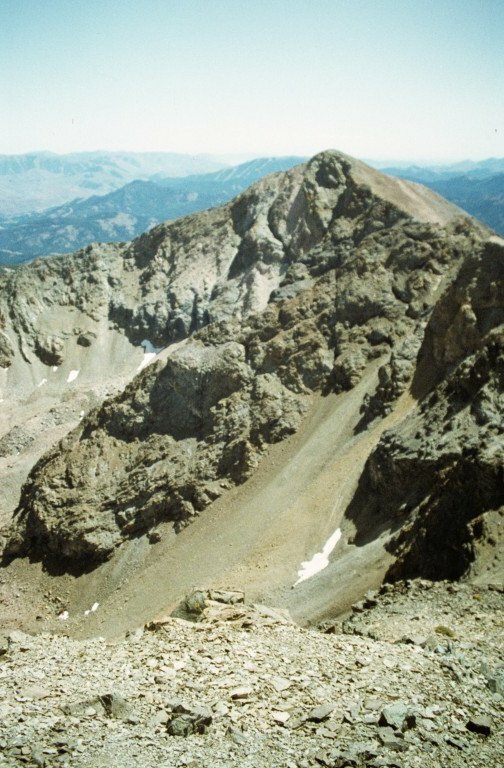 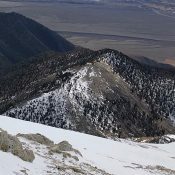 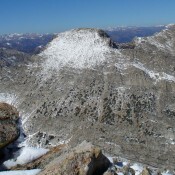 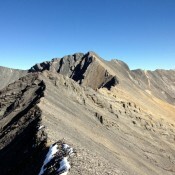 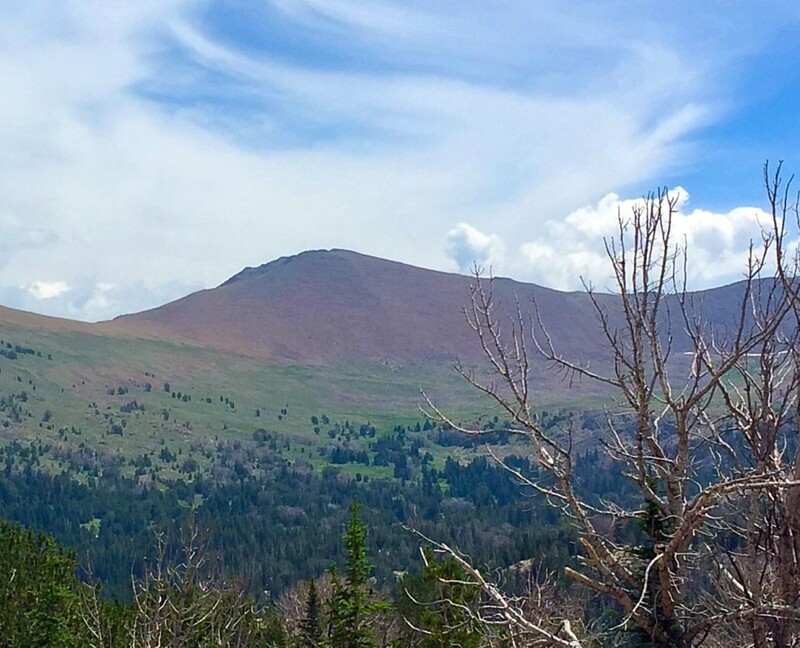 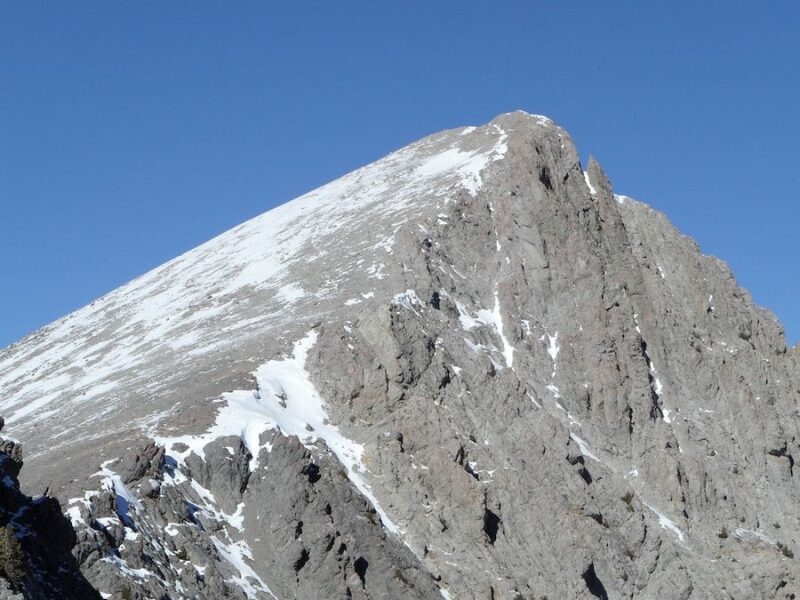 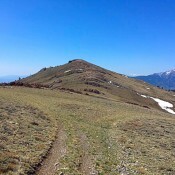 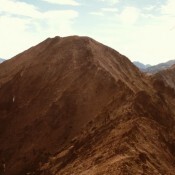 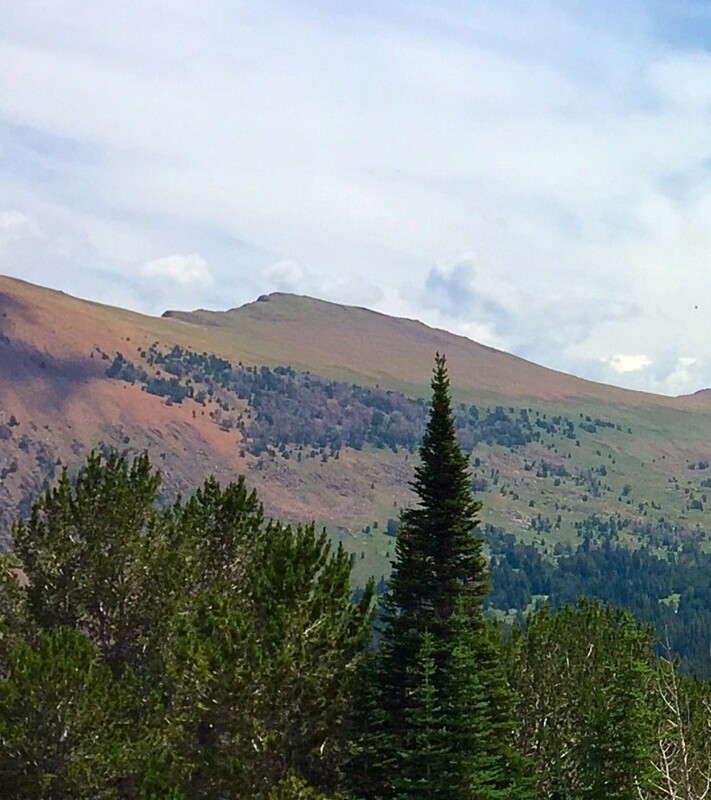 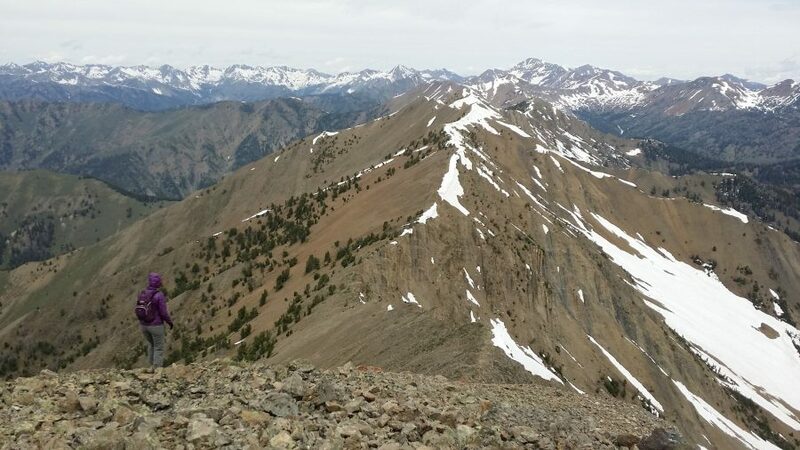 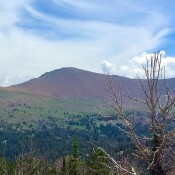 Peak 8180 (Salt Creek Peak) Soldier Mountains 8,180 ft 2016 This Peak is not in the book. 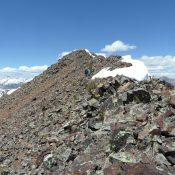 Peak 8238 (Gora Euzkotarak Peak) Soldier Mountains 8,238 ft 2016 This peak is not in the book. 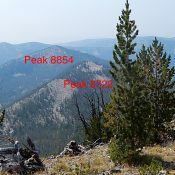 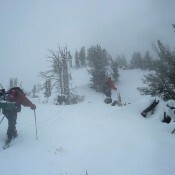 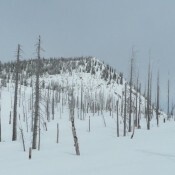 Peak 8340 Boise Mountains 8,340 ft 635 2016 This peak is not in the book. 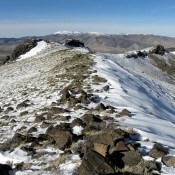 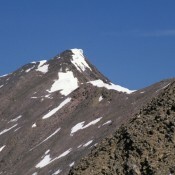 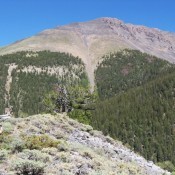 Peak 8382 (Basque Peak) Soldier Mountains 8,382 ft 322 2016 This peak is not in the book. 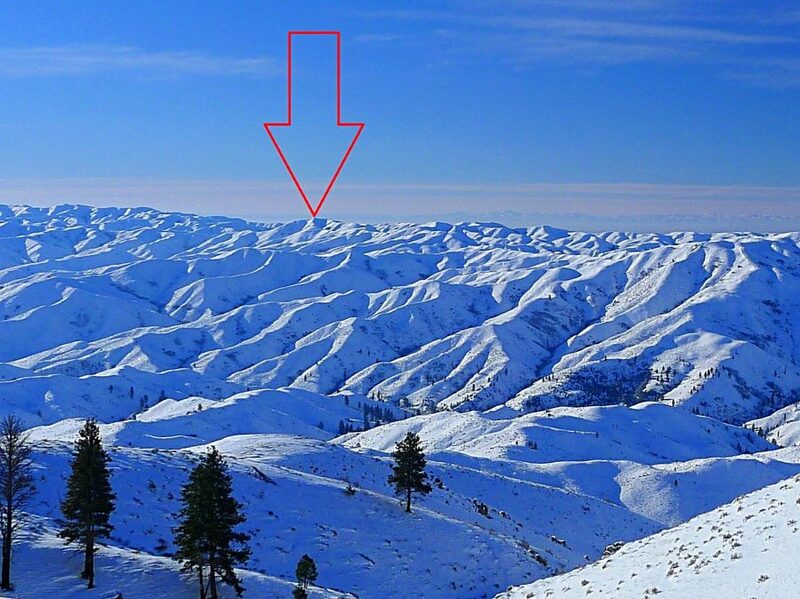 Peak 8498 Boise Mountains 8,498 ft 518 2016 This peak is not in the book. 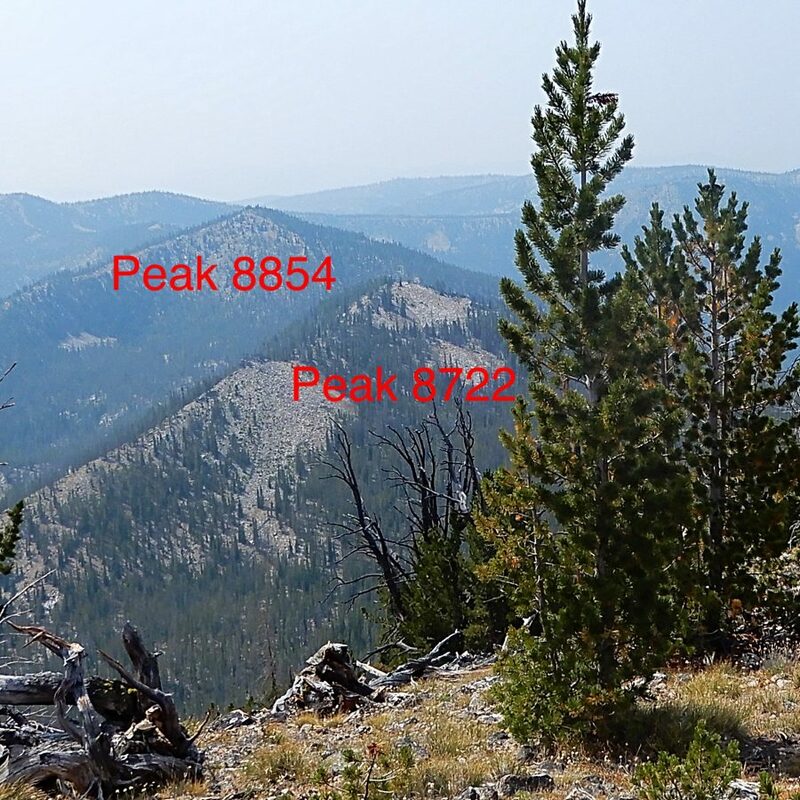 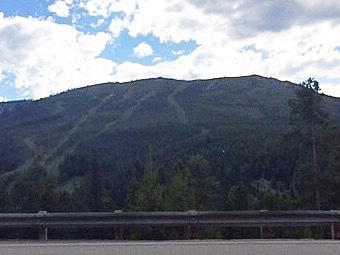 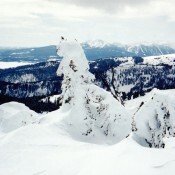 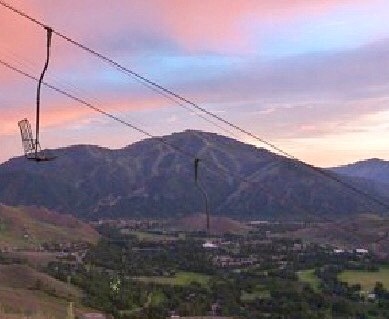 Peak 8554 Boise Mountains 8,554 ft 695 2014 This peak is not in the book.